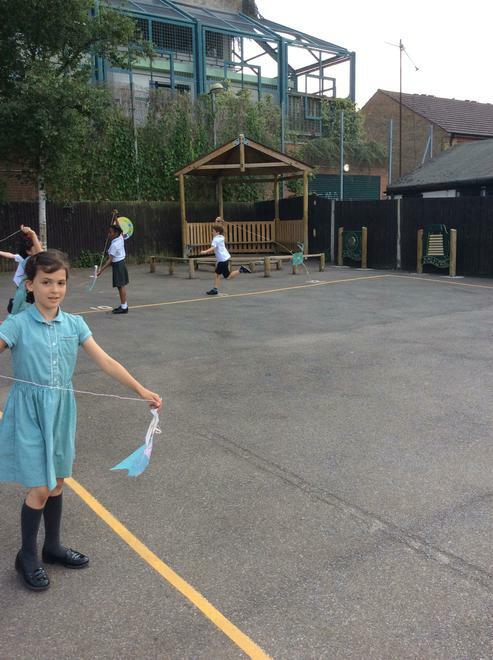 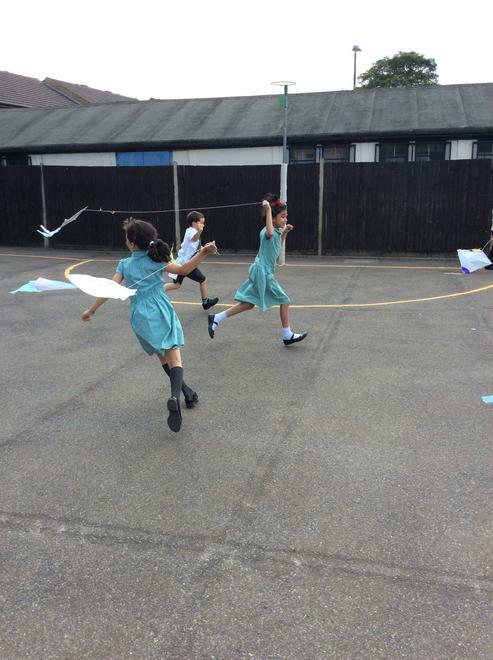 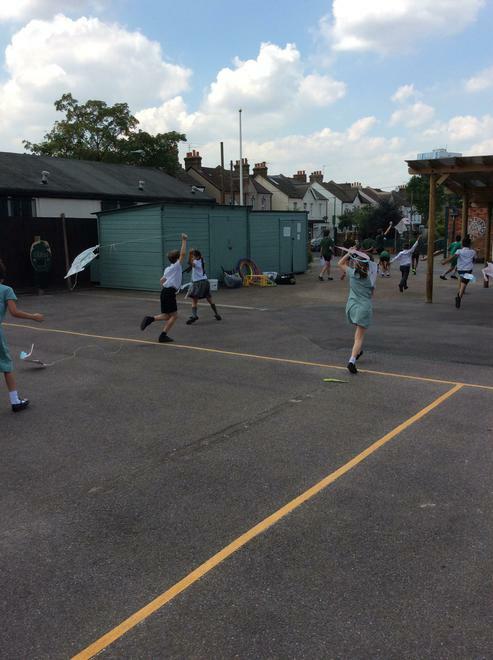 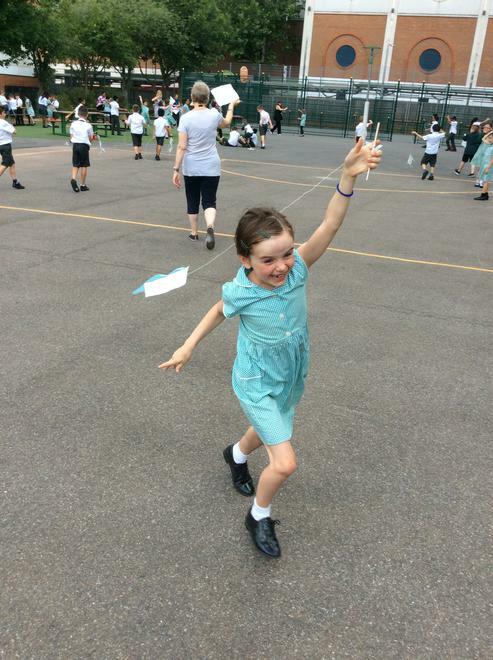 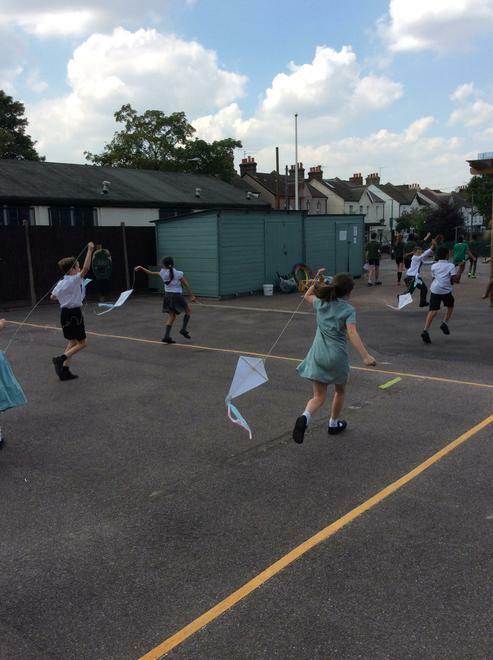 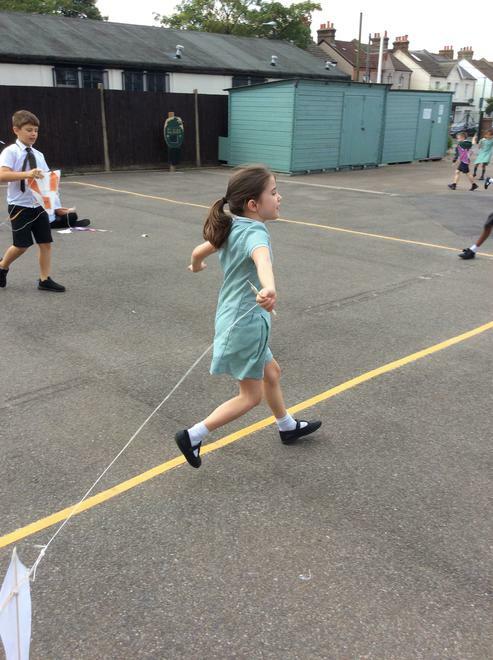 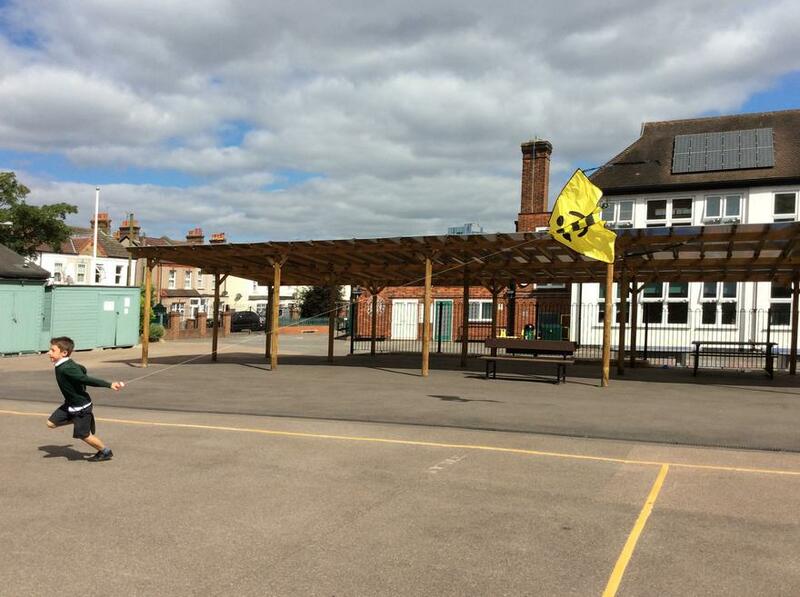 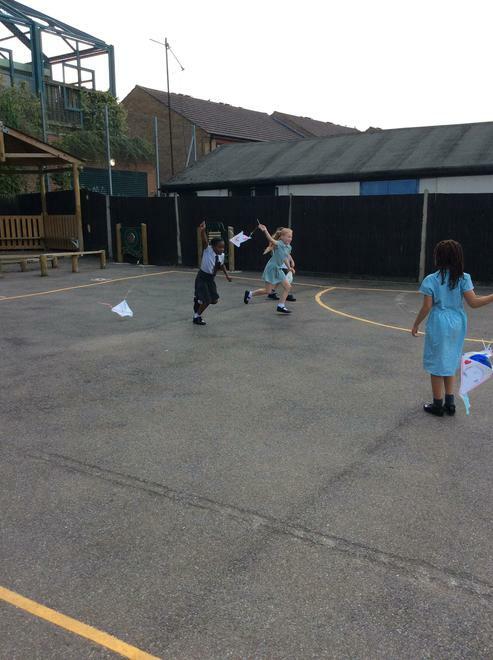 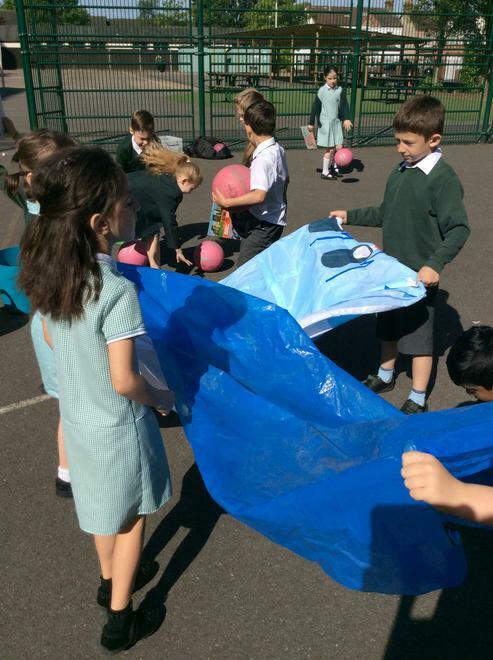 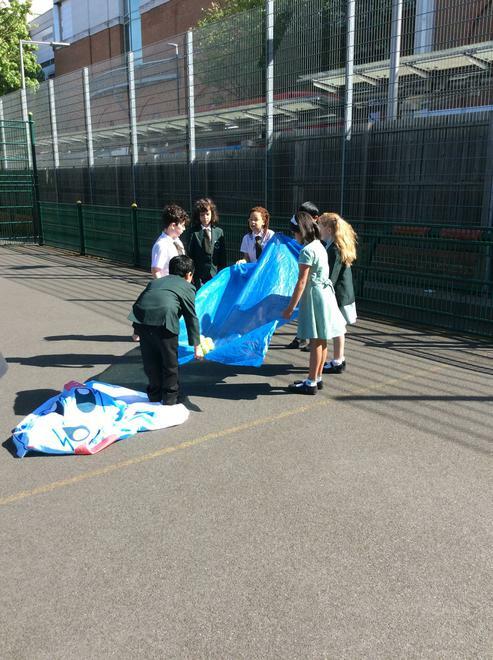 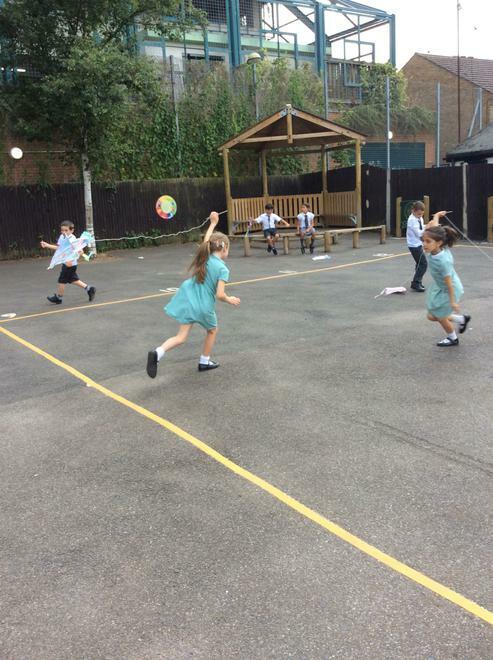 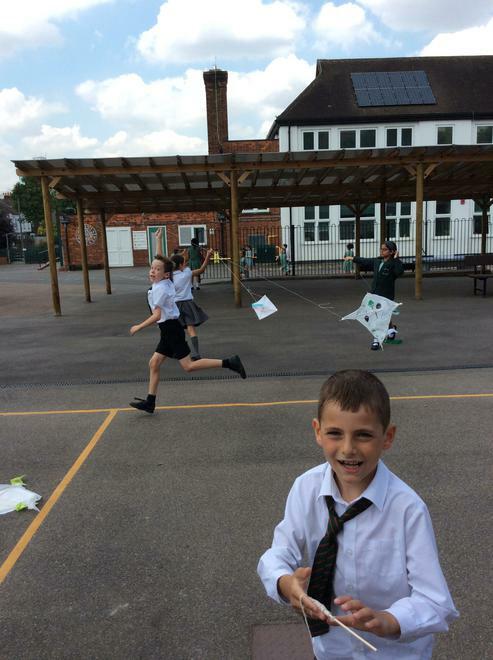 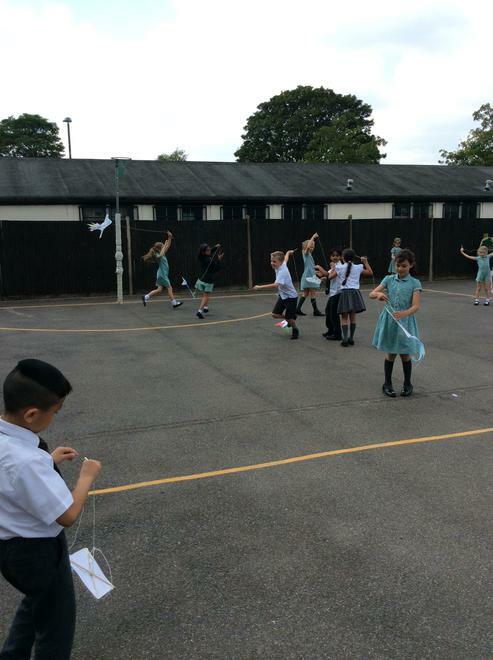 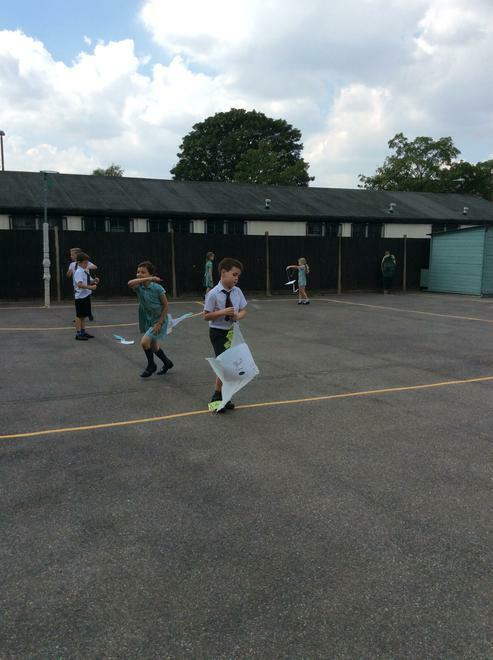 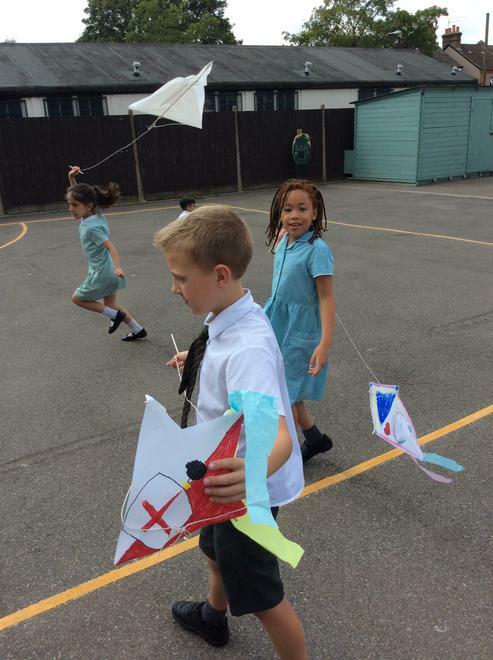 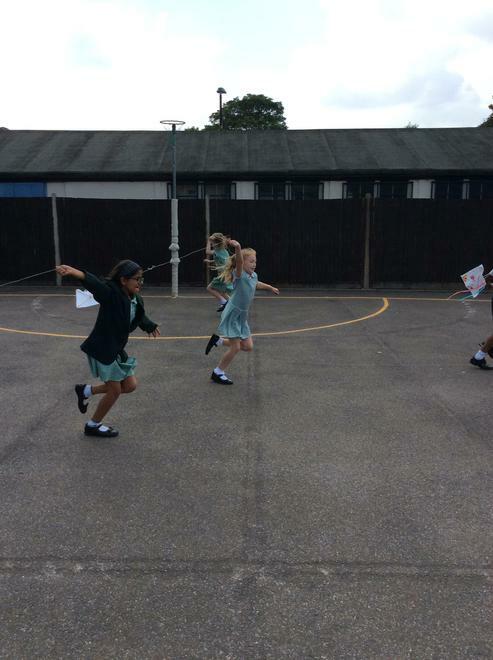 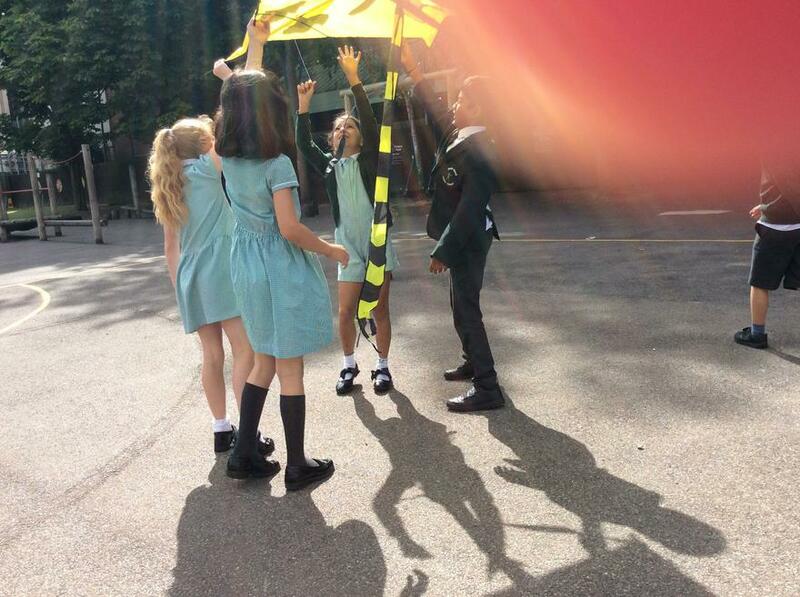 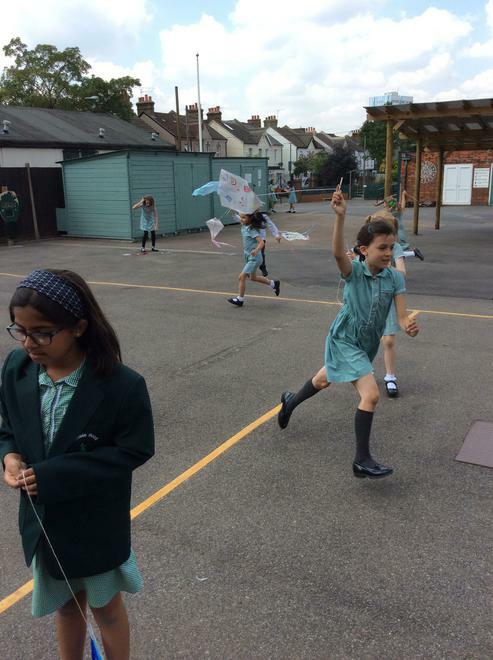 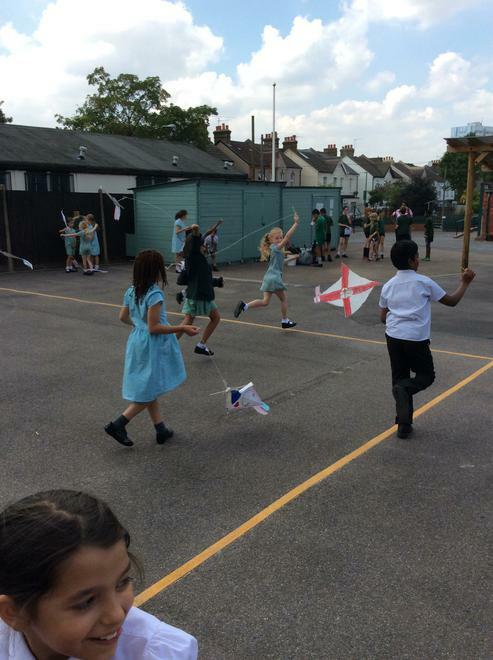 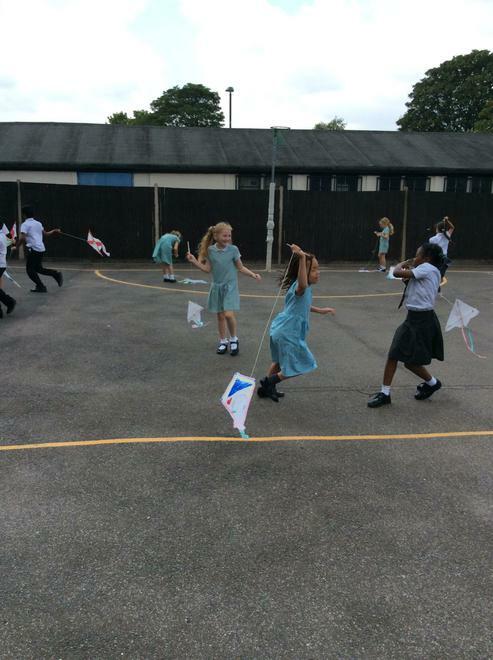 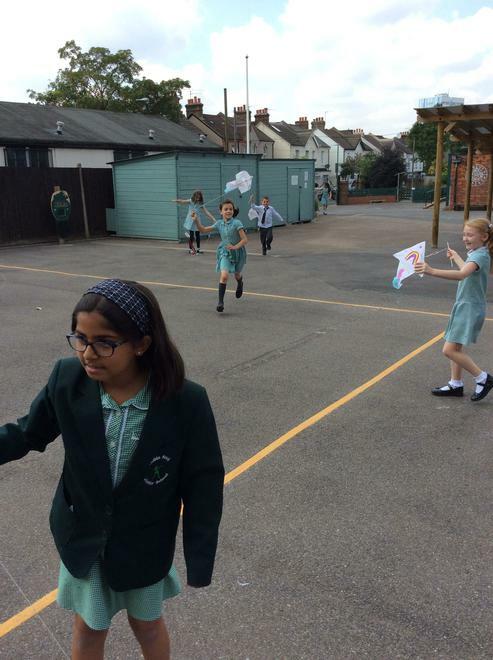 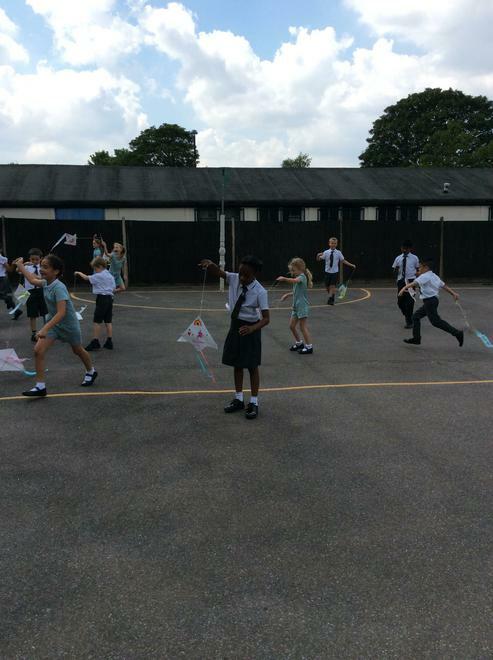 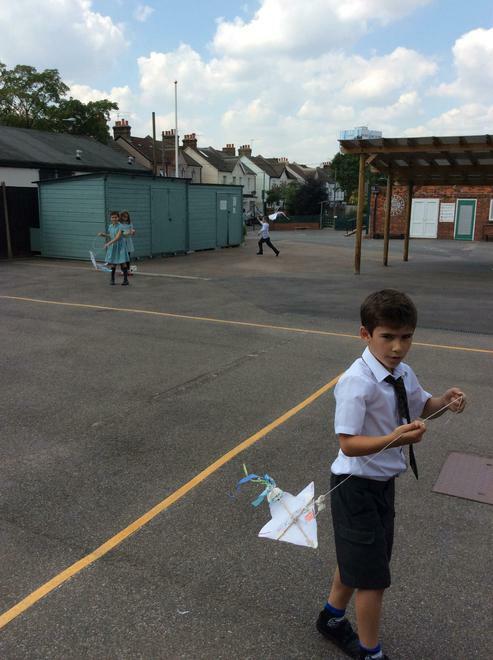 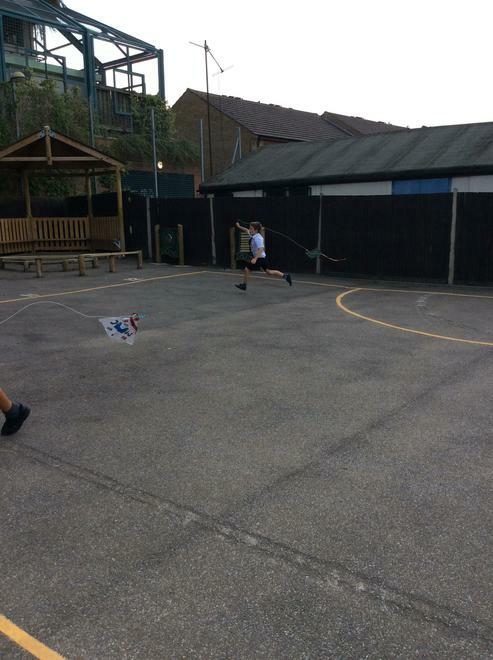 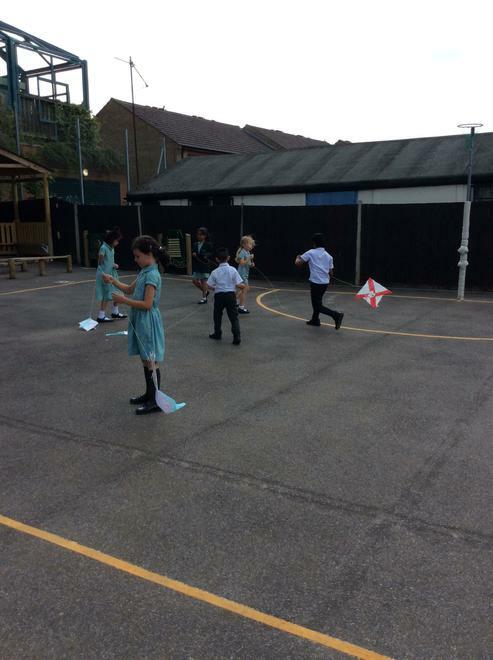 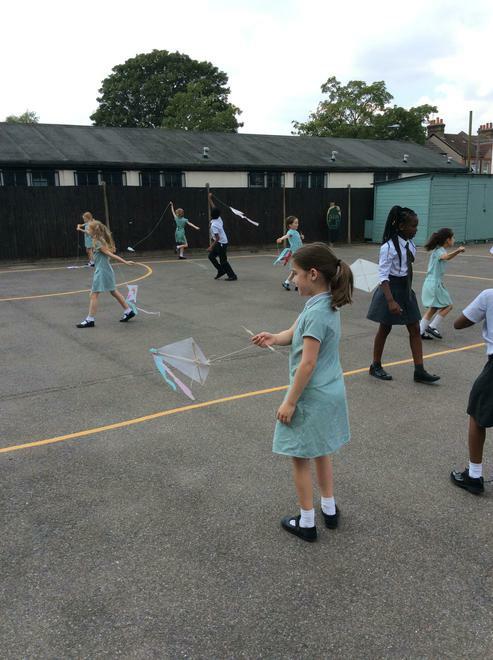 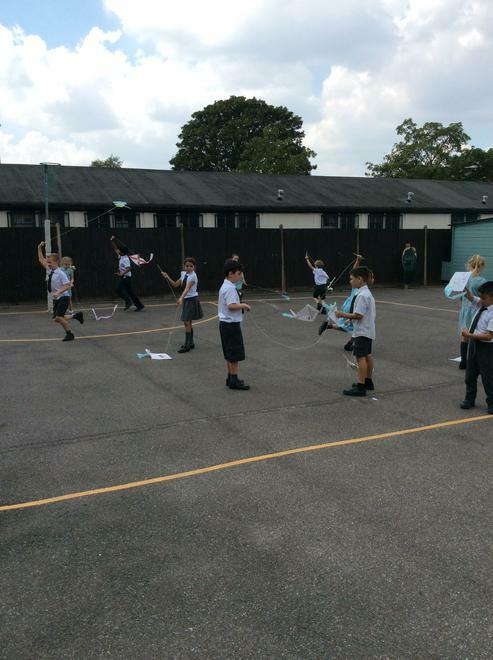 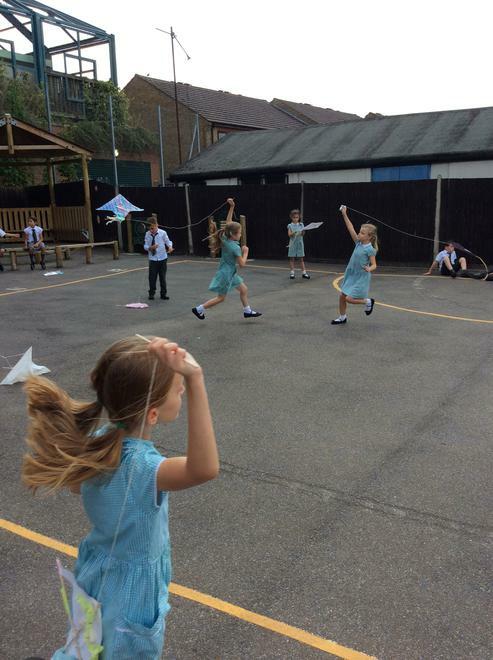 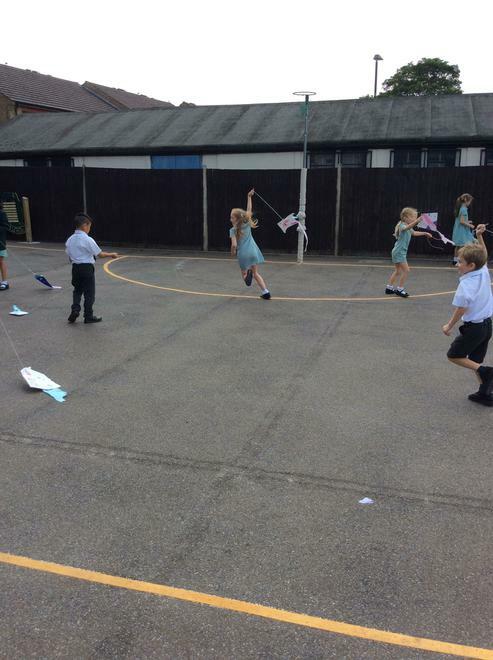 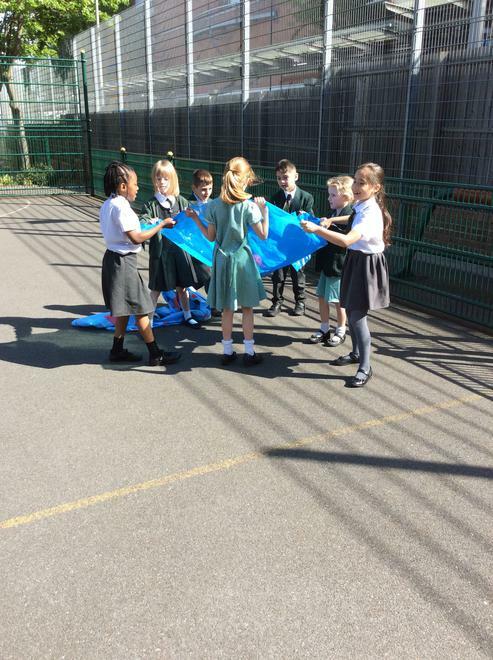 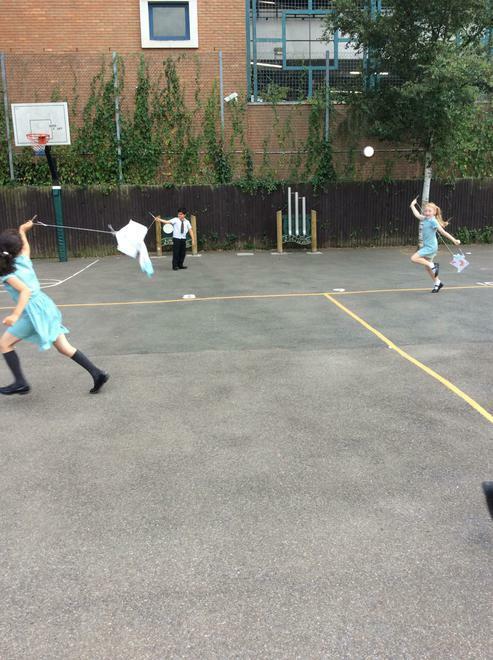 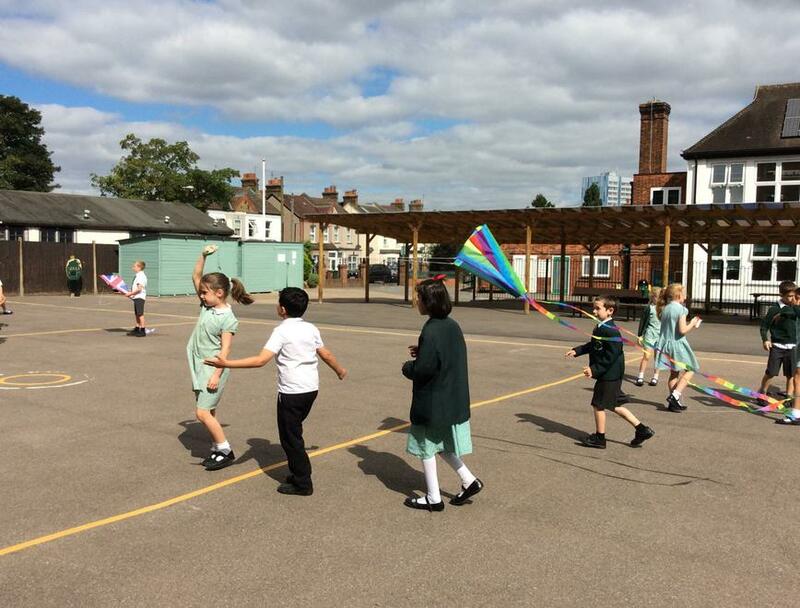 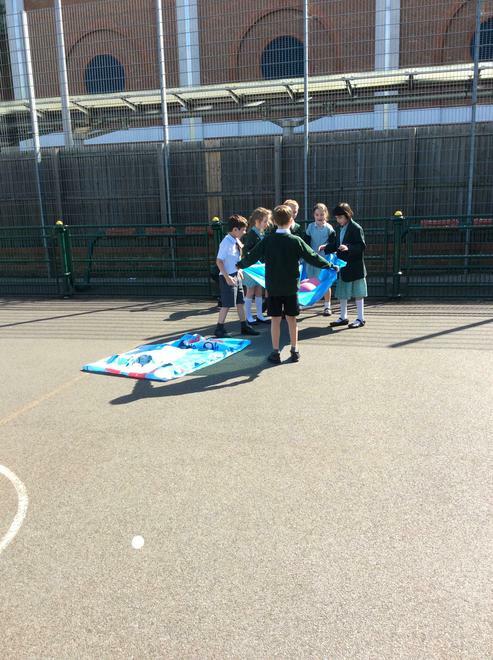 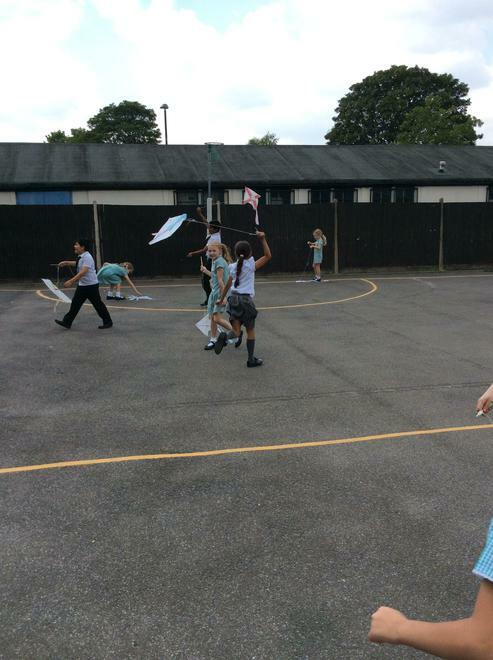 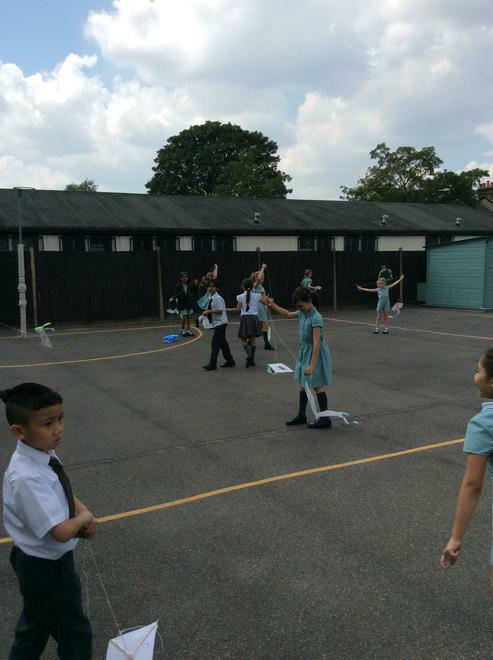 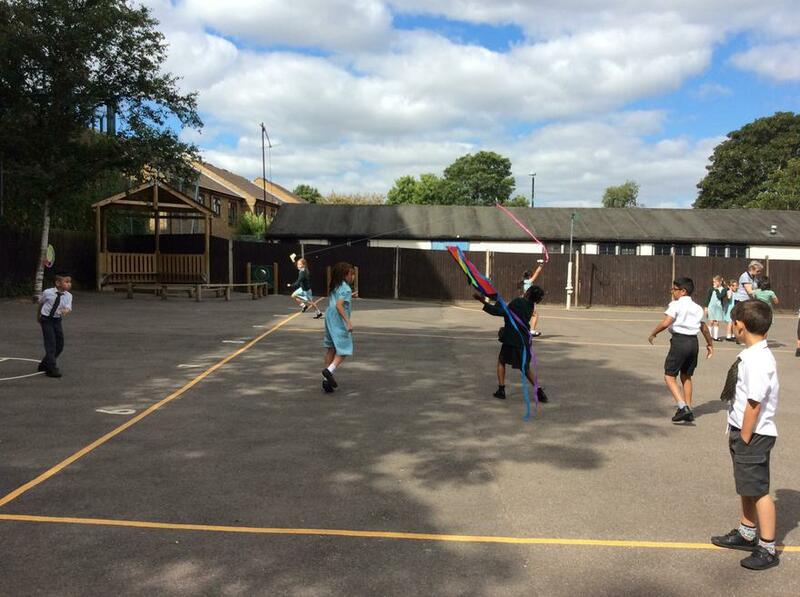 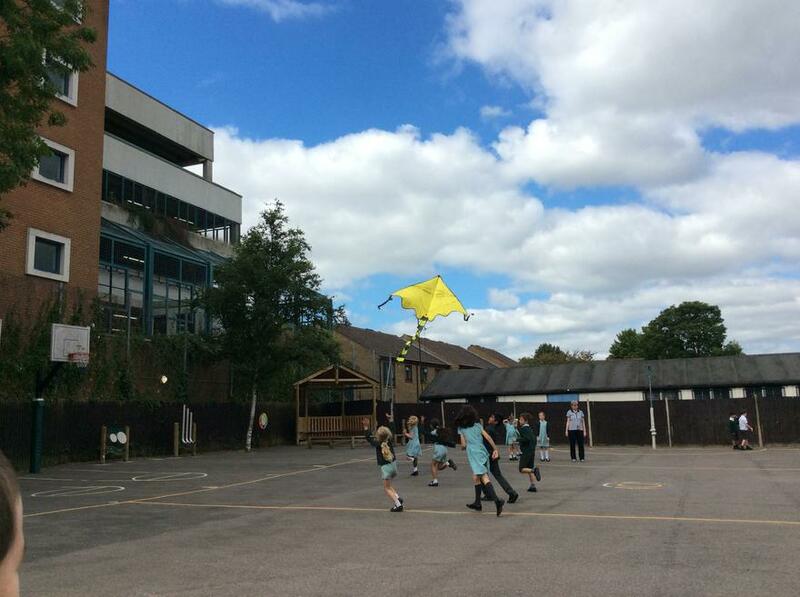 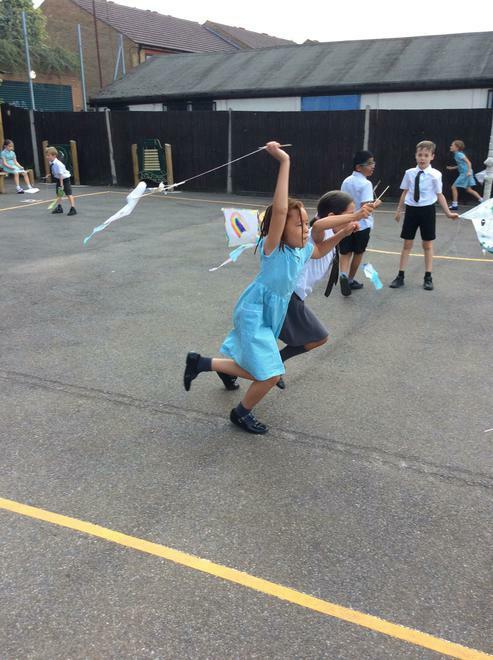 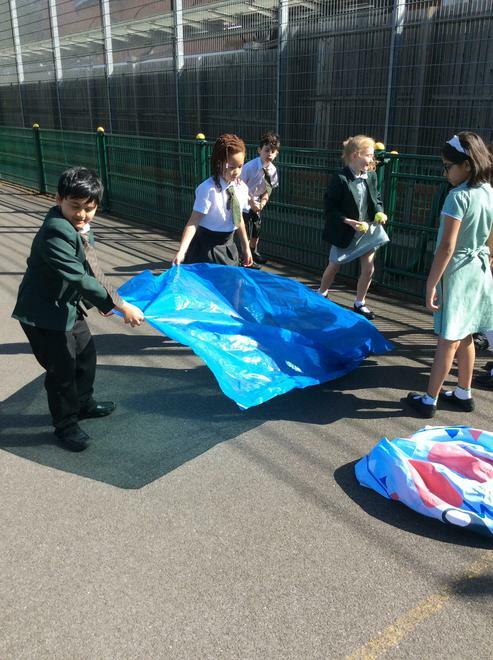 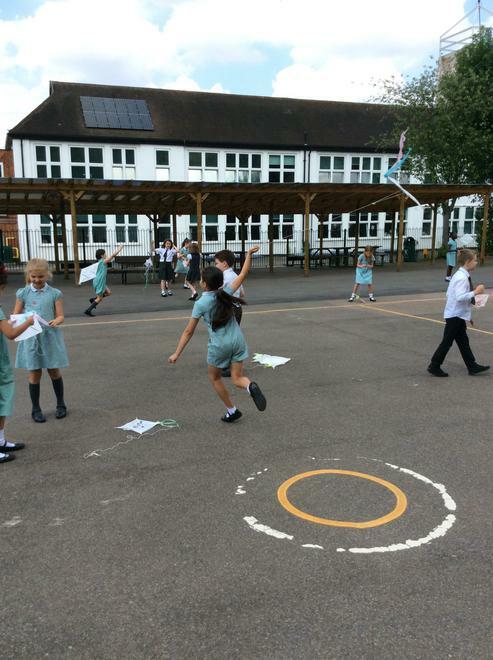 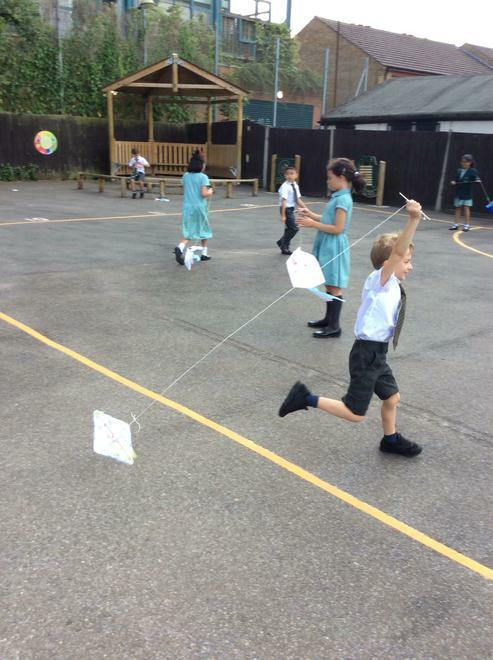 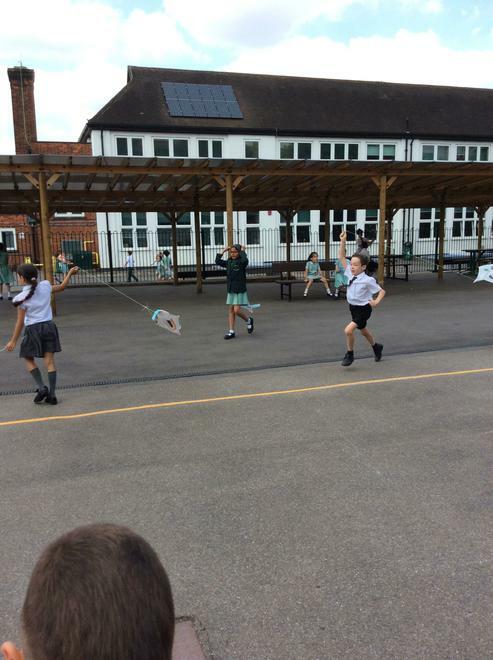 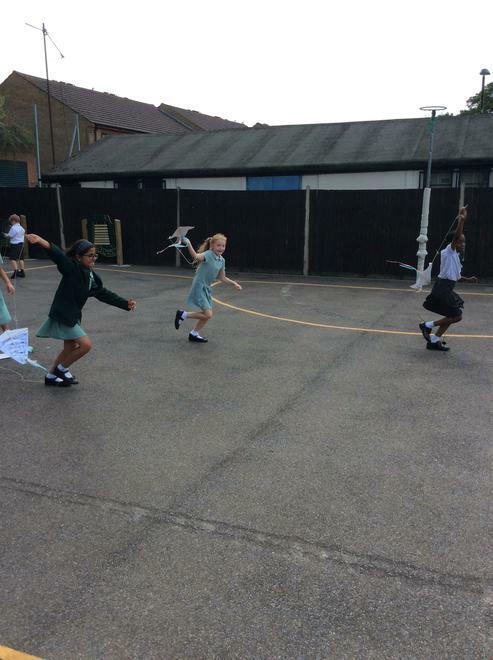 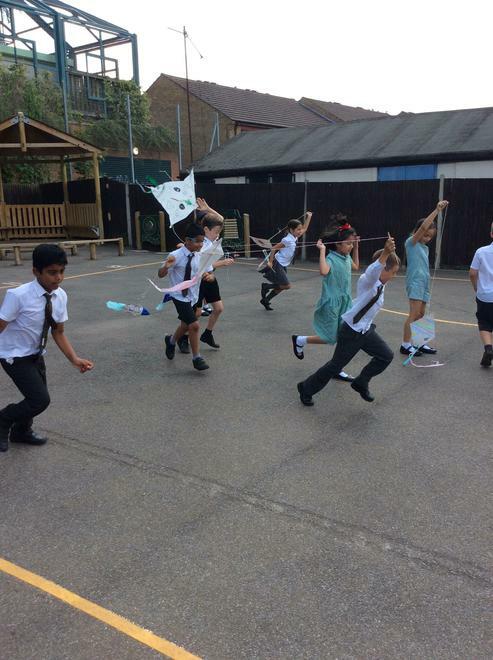 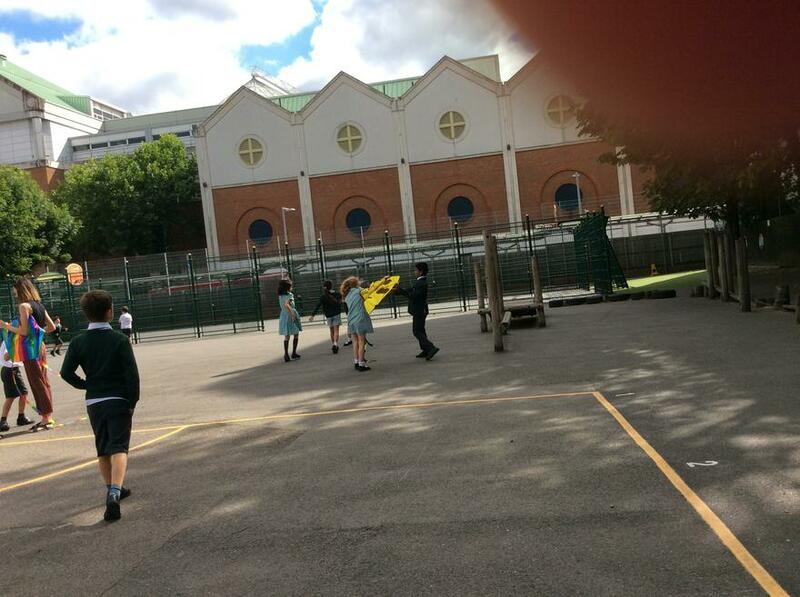 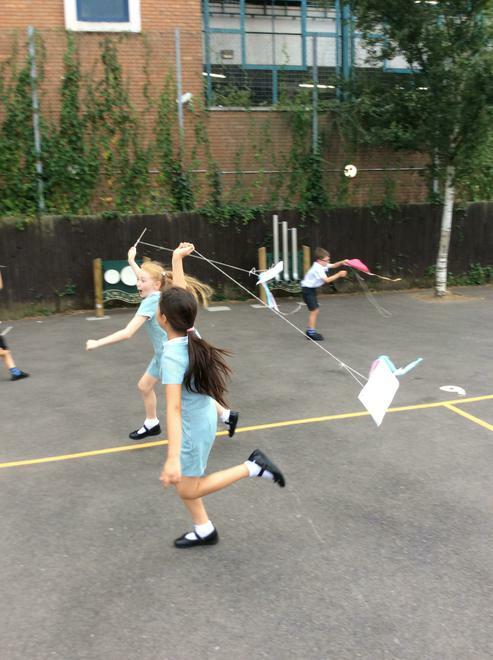 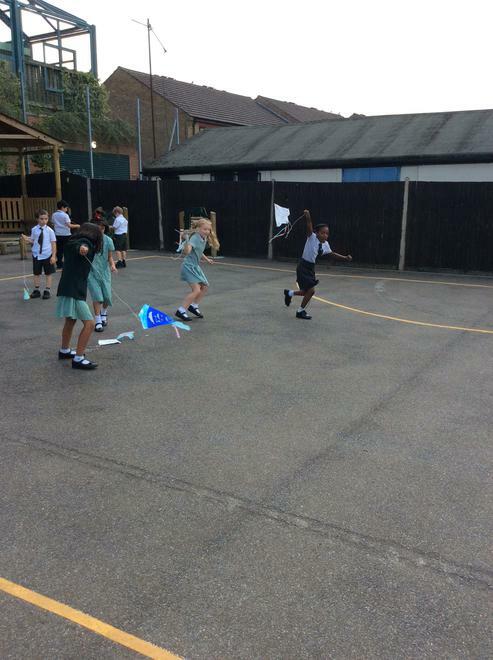 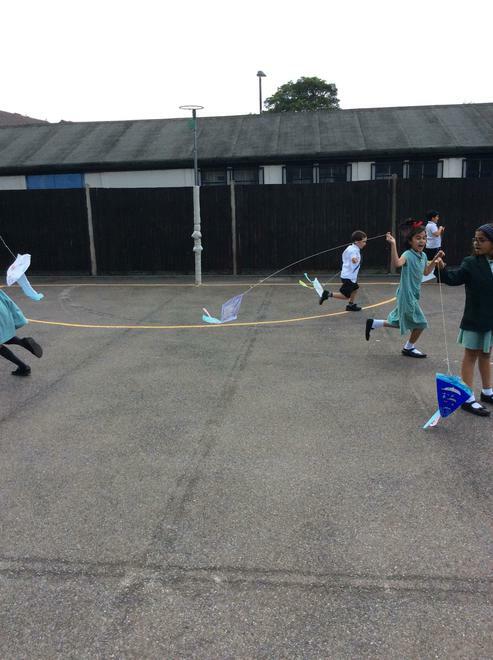 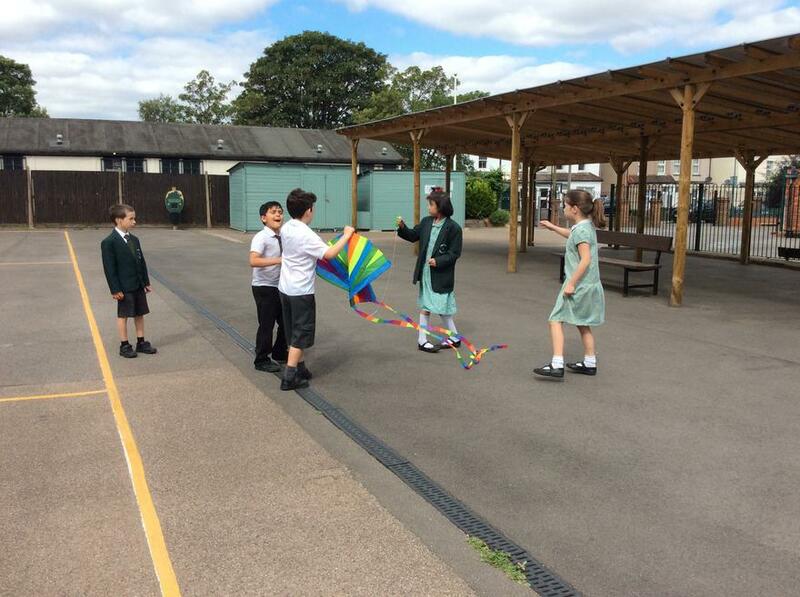 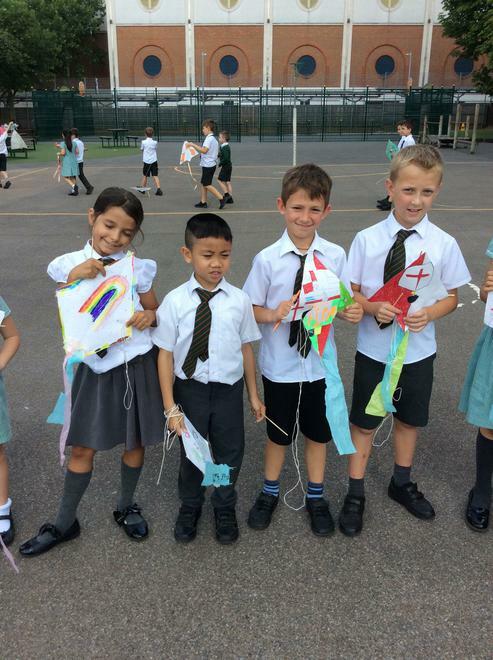 Today we took our beautifully designed kites outside to test whether they would fly in the wind. 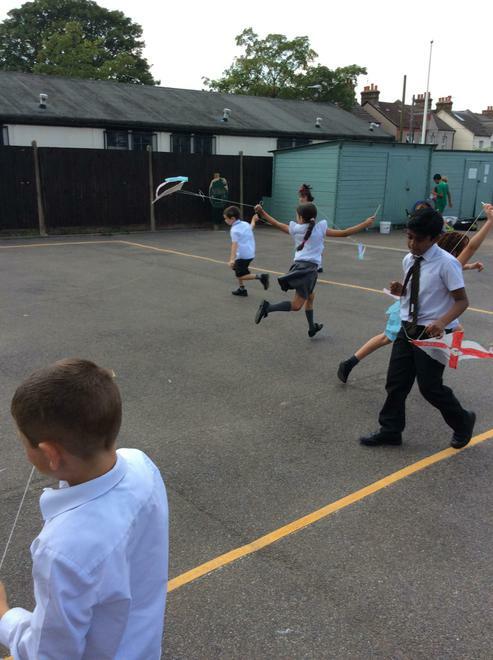 Everyone had a lot of fun running around trying to get their kite high up in the air! 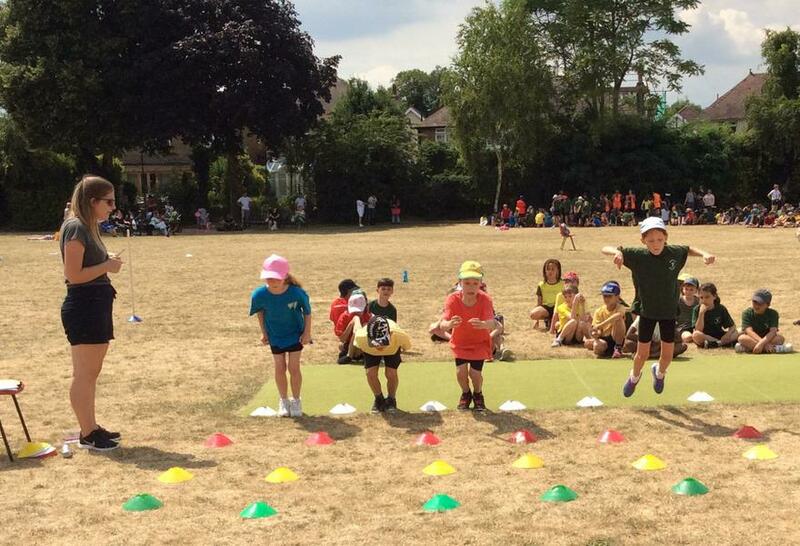 It was so lovely to see everyone’s hard work paying off and the huge smiles on everyone’s faces! 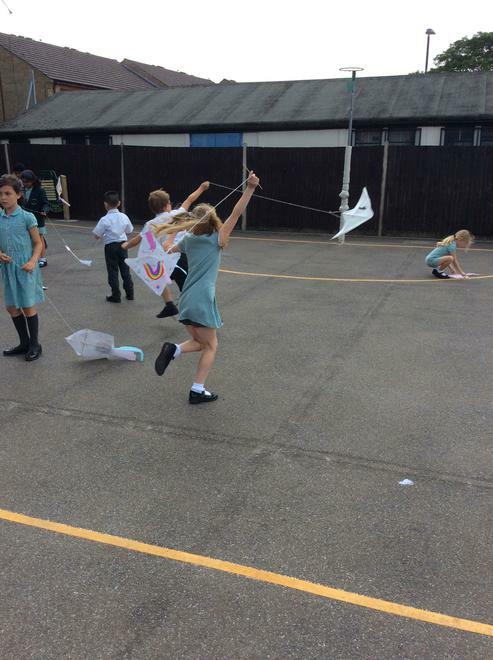 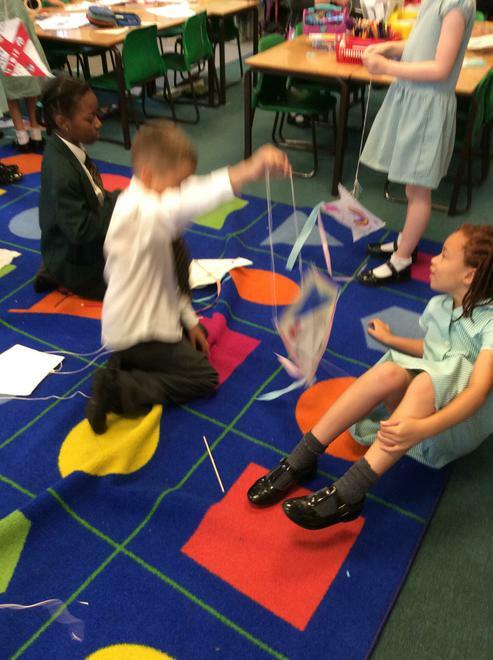 Today we used our prototypes to help us make our own kite! 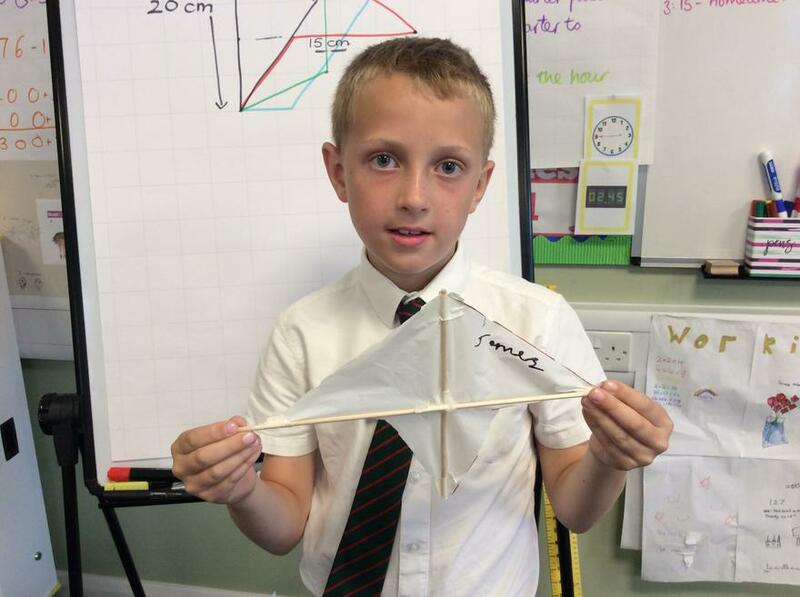 We made bigger versions of the prototypes in the hope of them flying better in the wind. 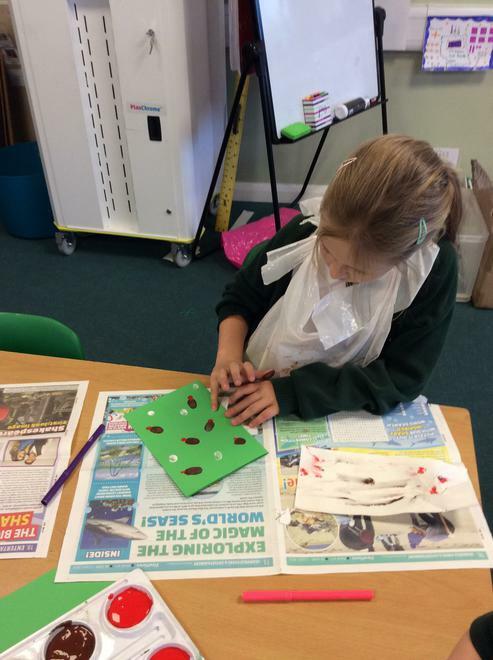 It was a very creative lesson and we even had a hand saw and glue gun station! 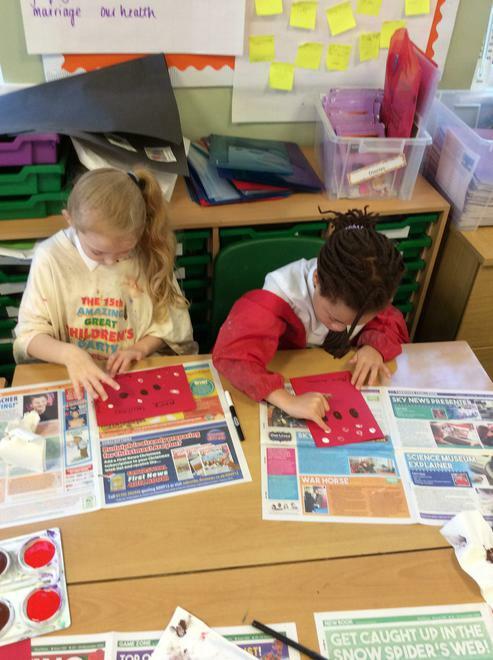 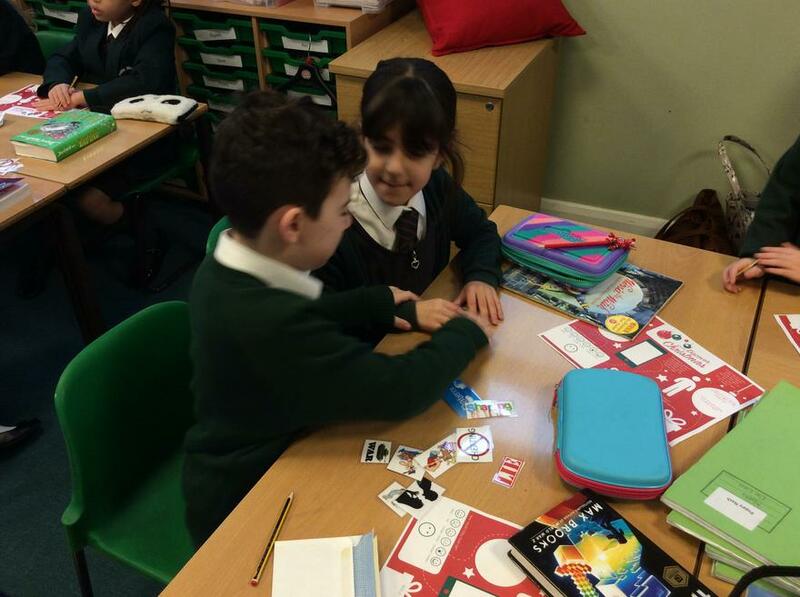 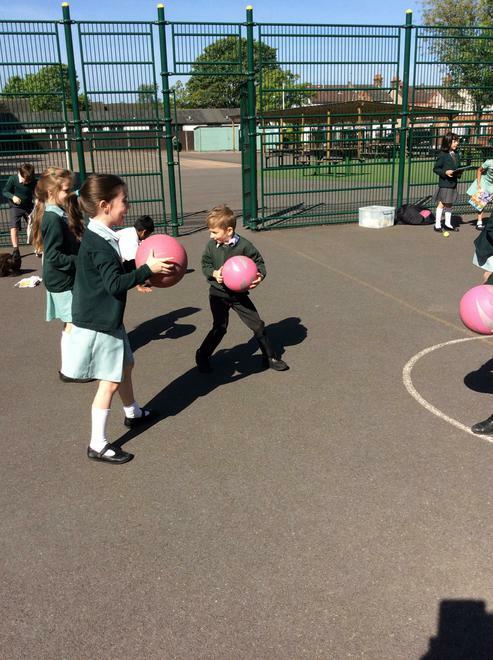 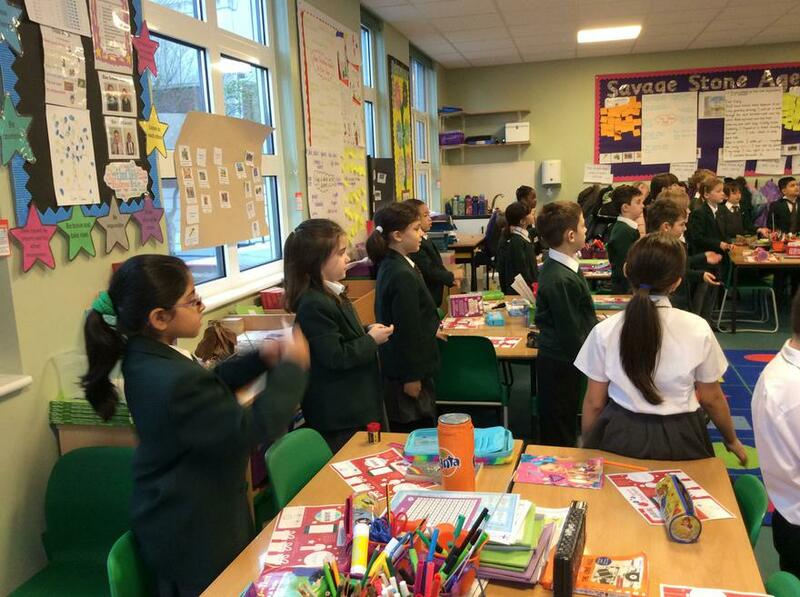 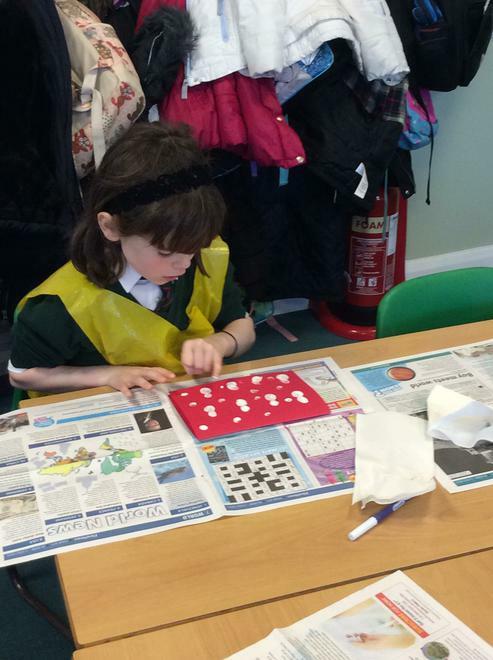 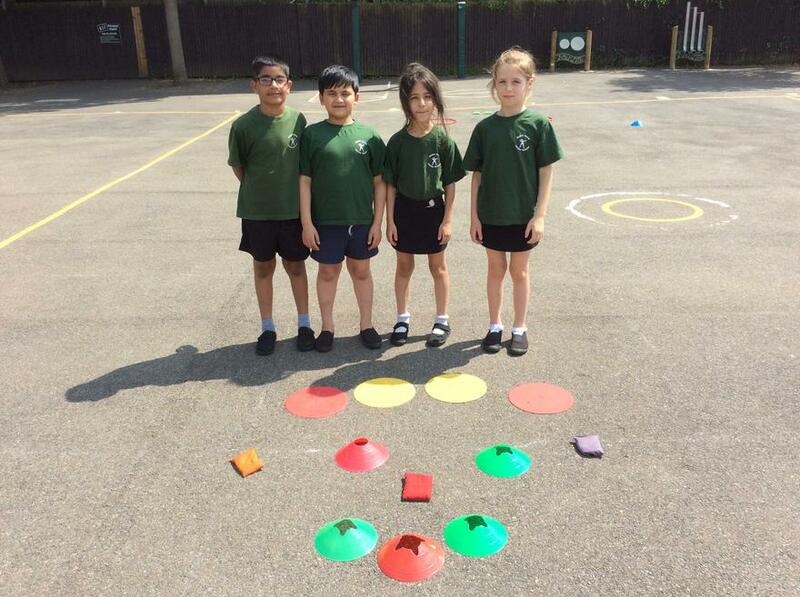 Everyone worked really well together and showed great teamwork and resilience during the lesson. 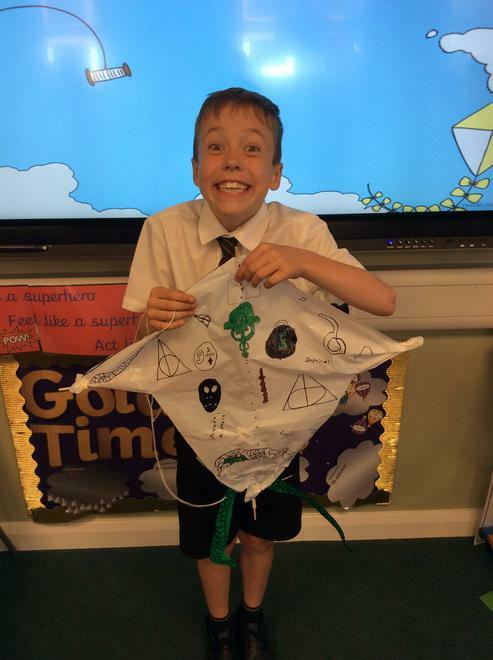 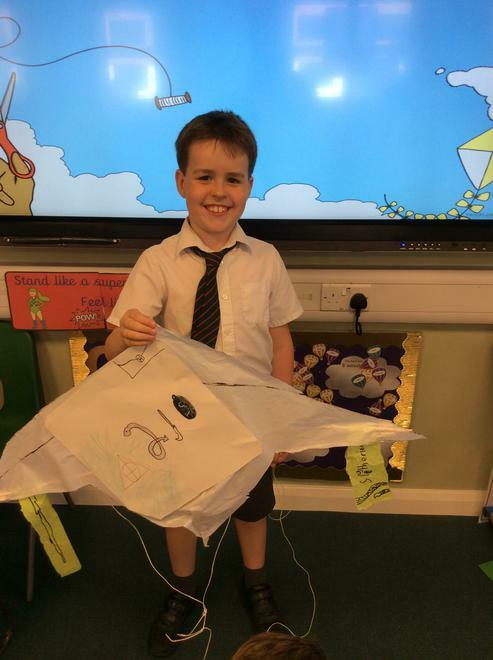 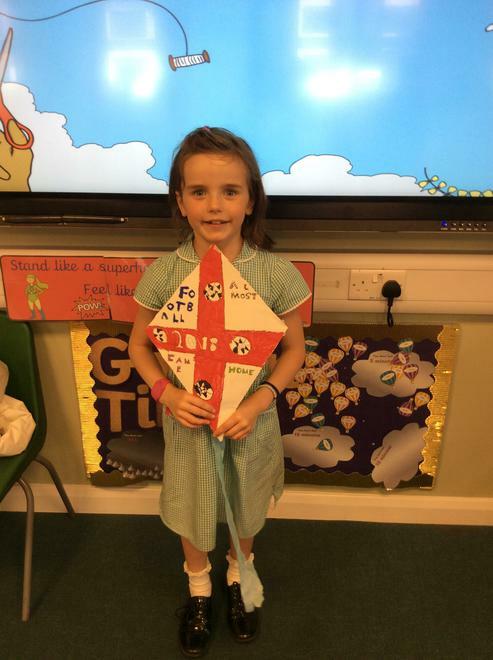 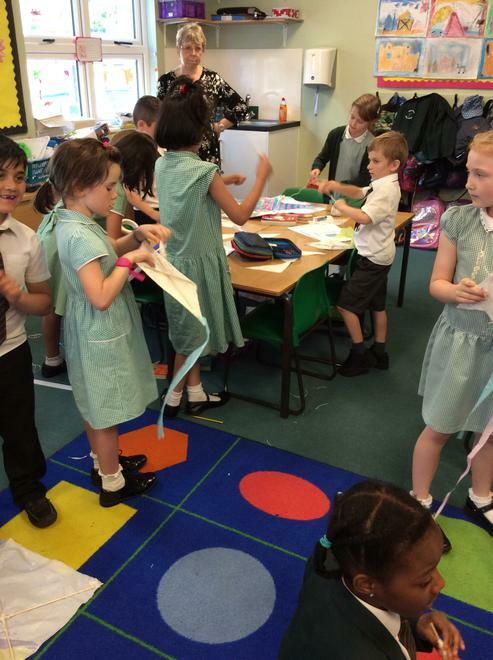 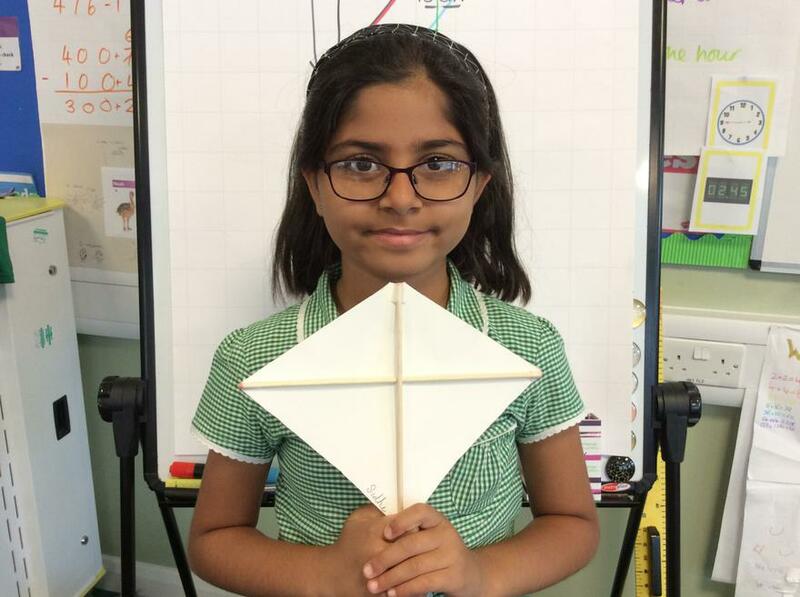 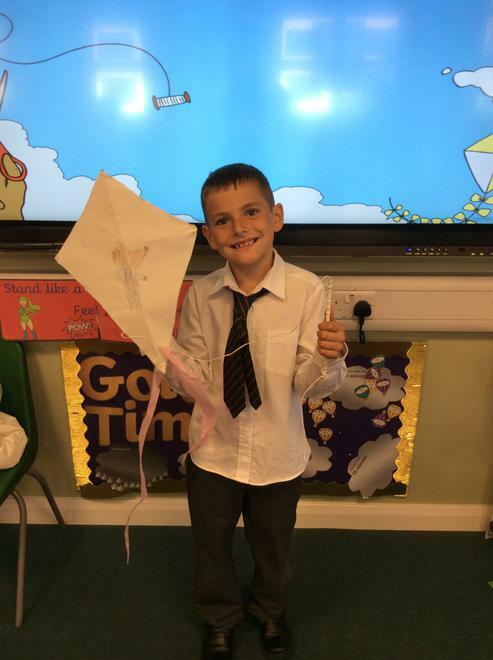 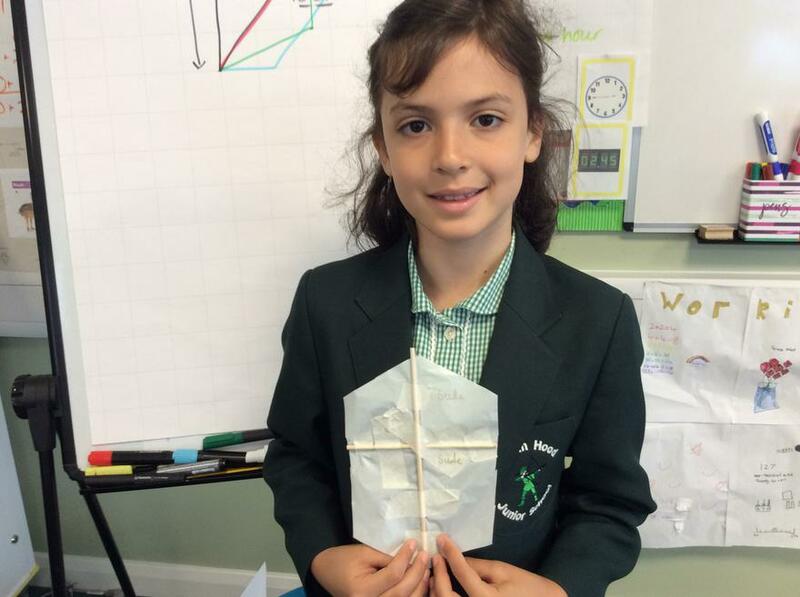 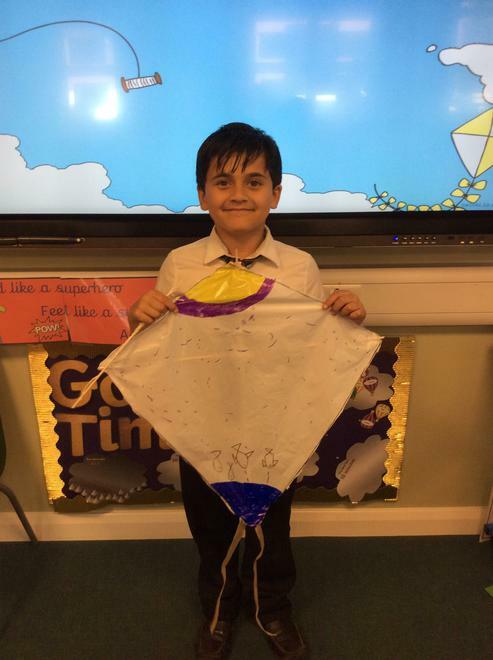 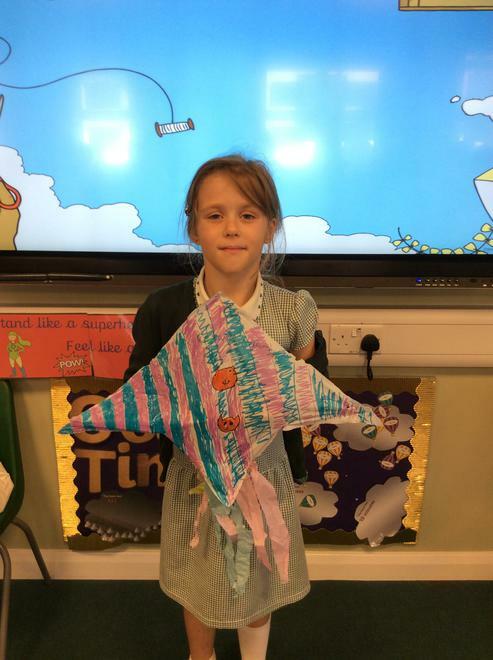 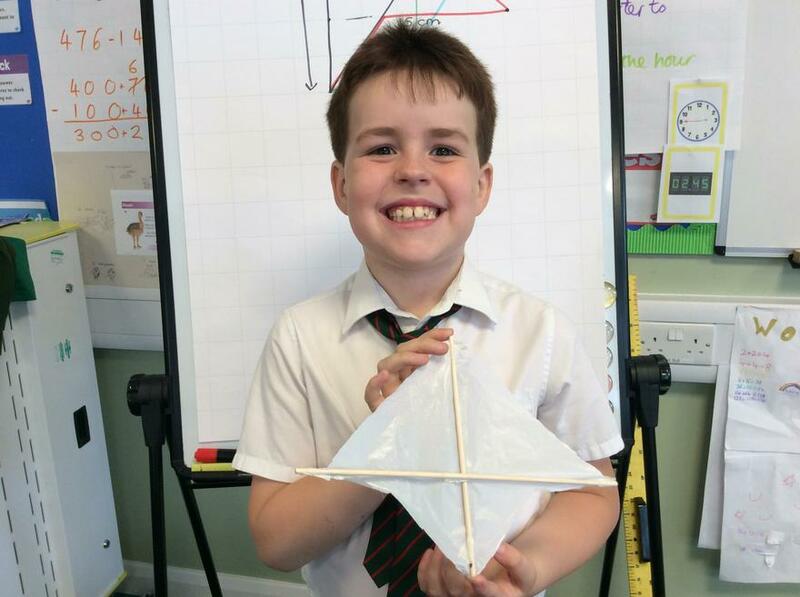 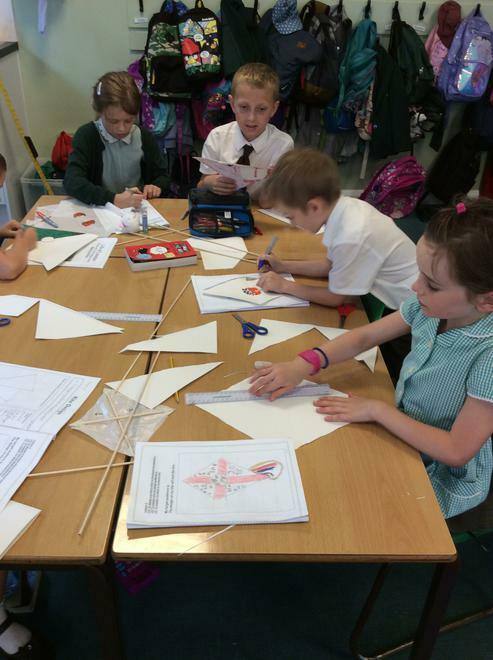 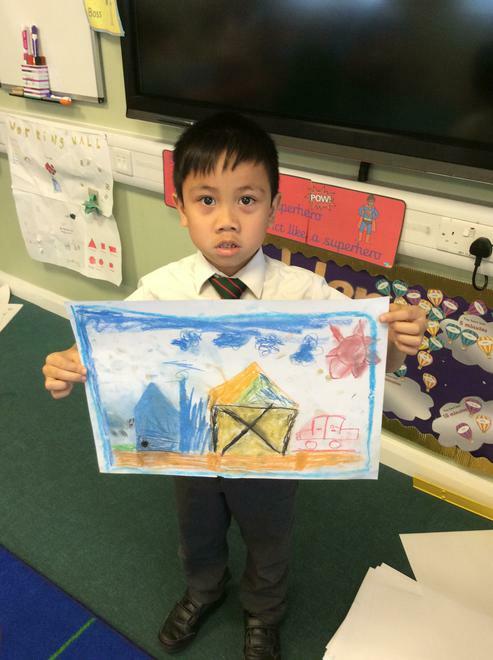 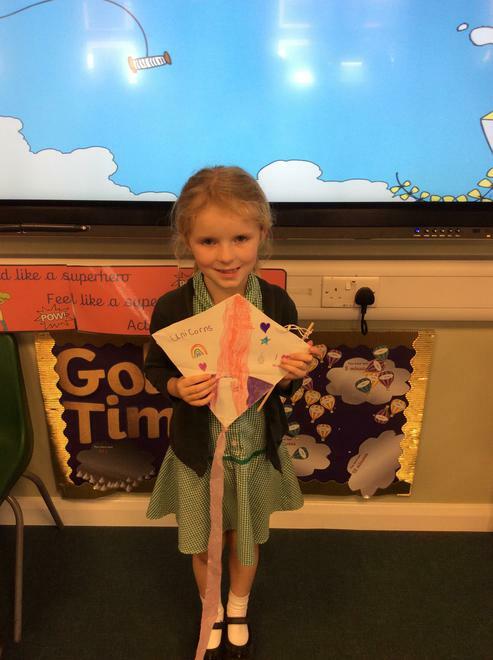 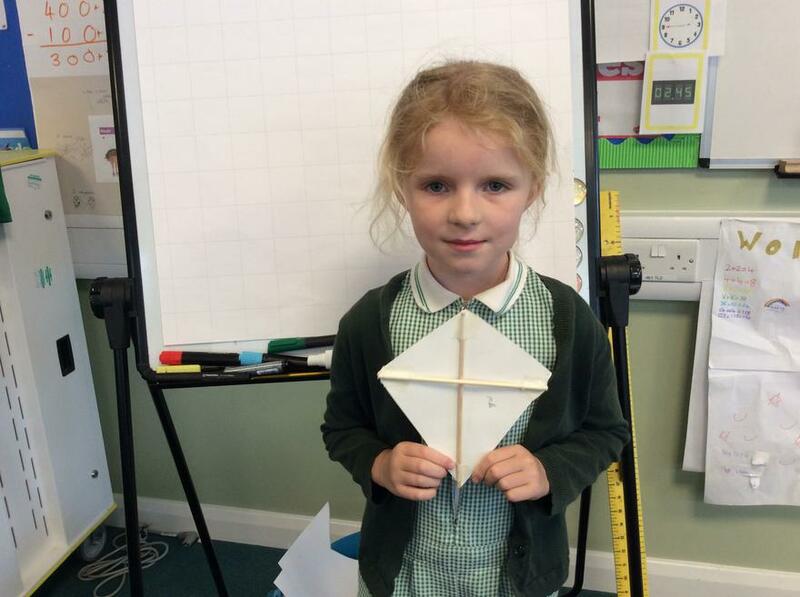 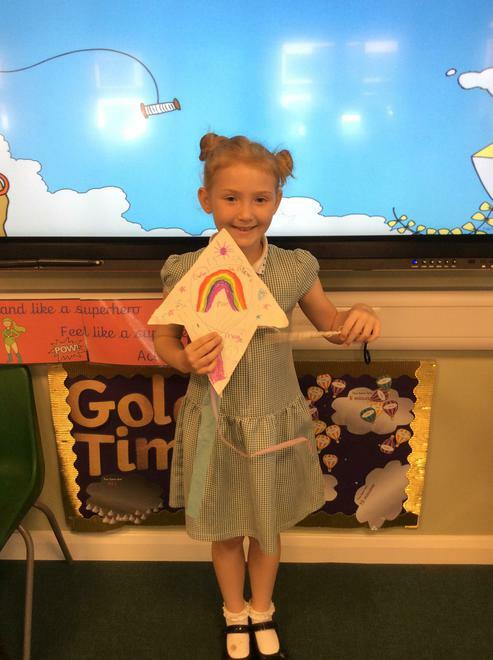 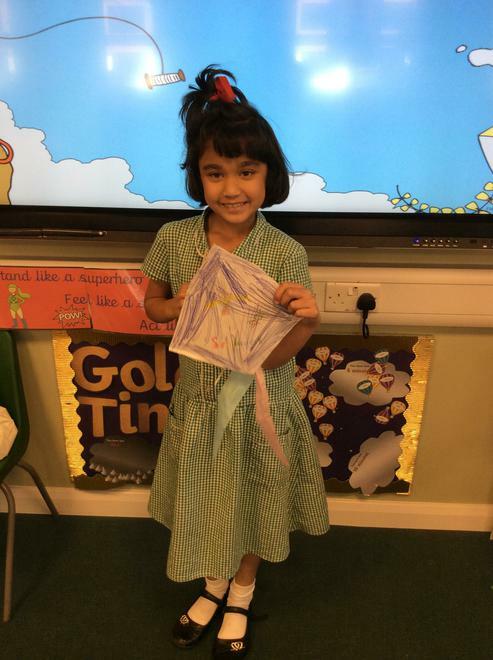 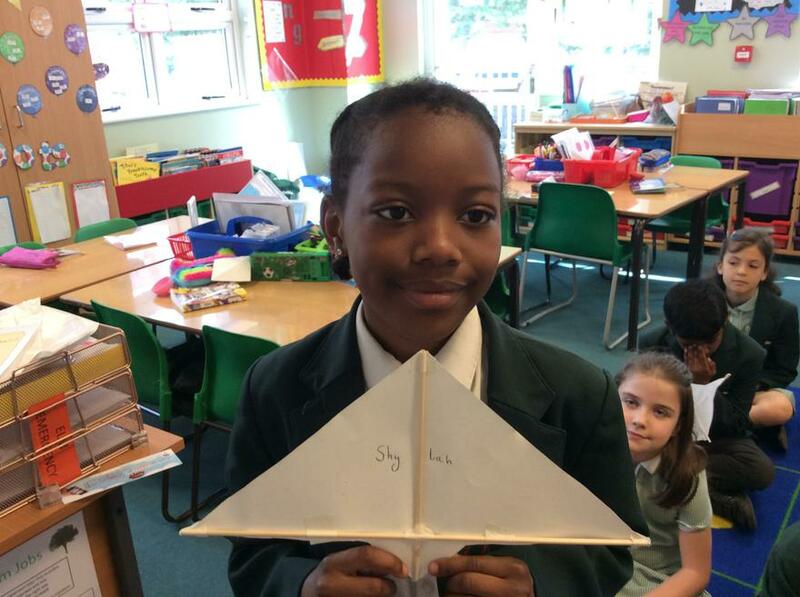 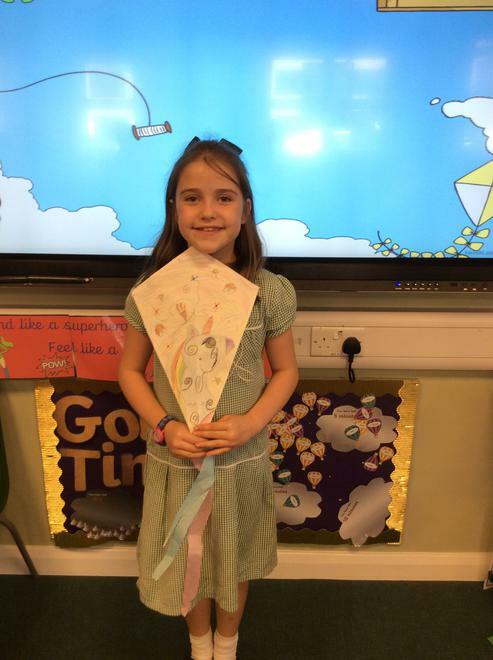 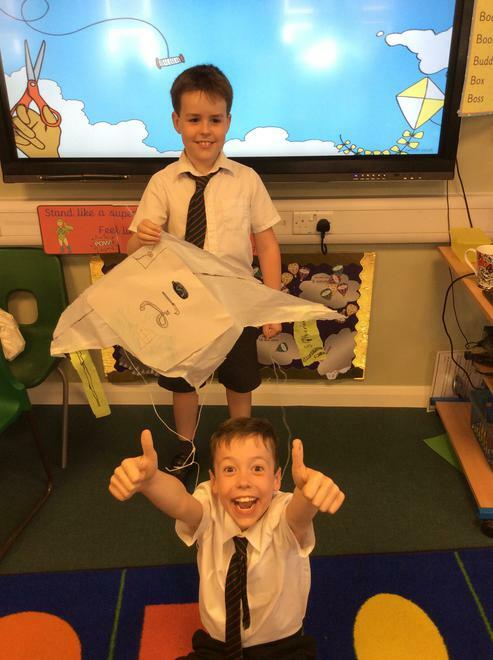 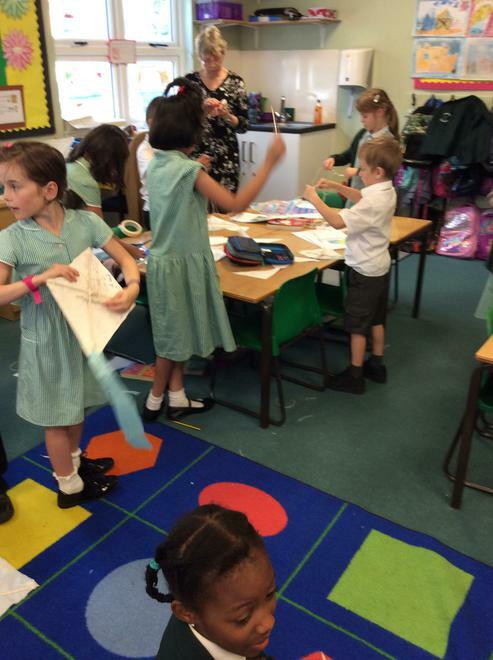 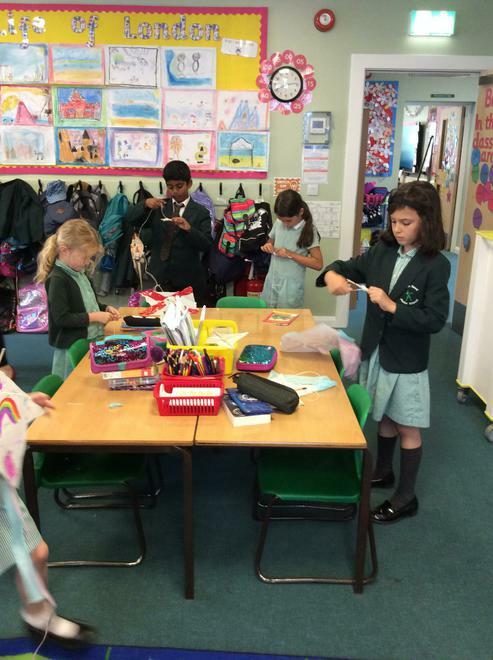 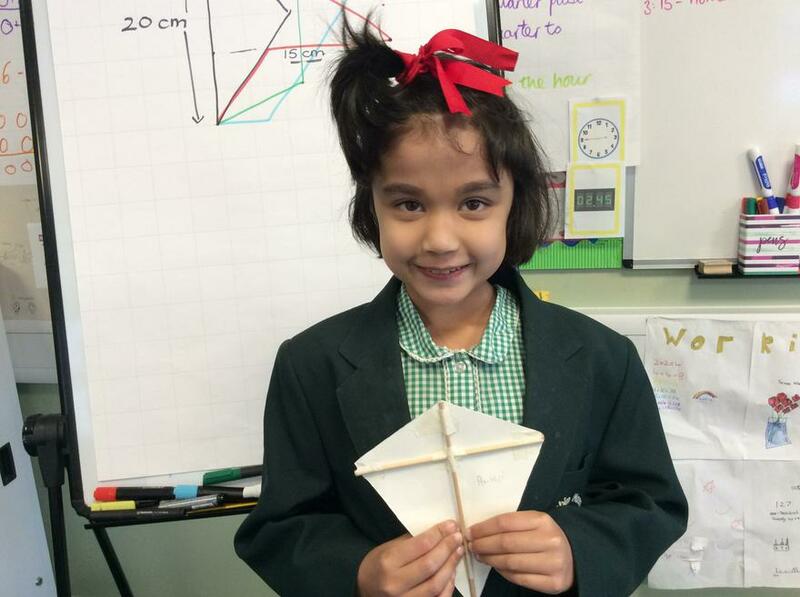 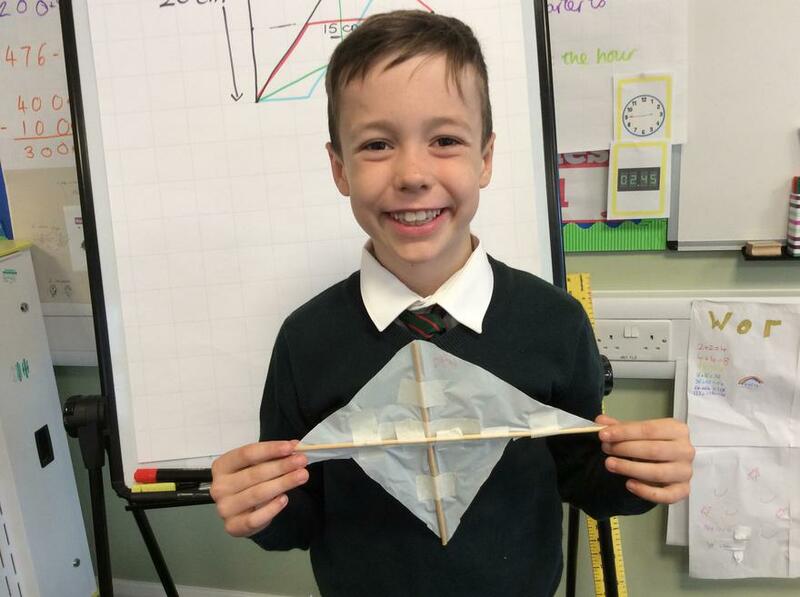 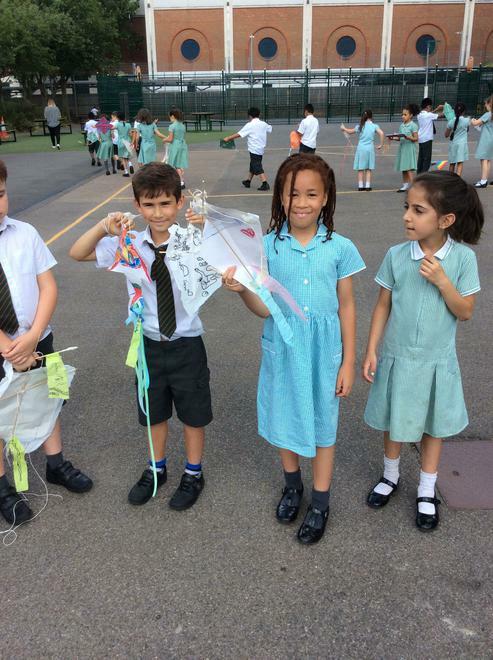 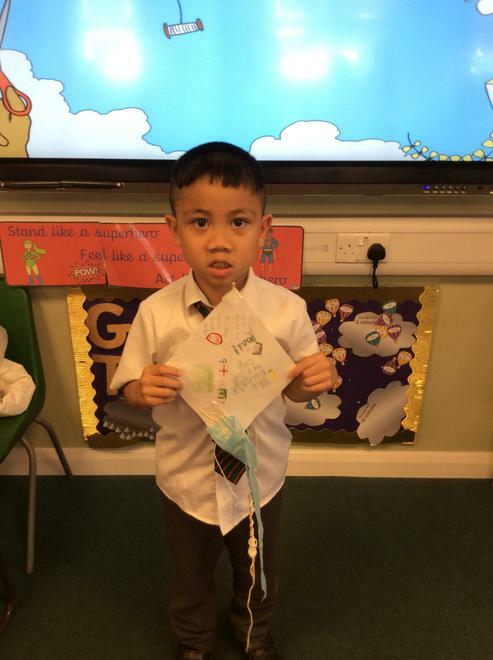 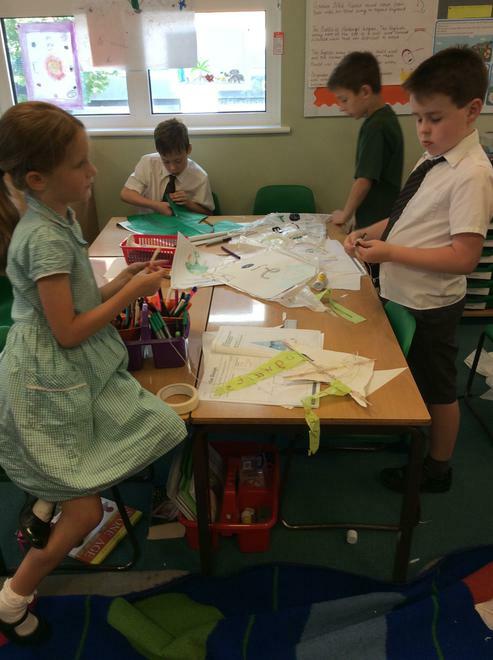 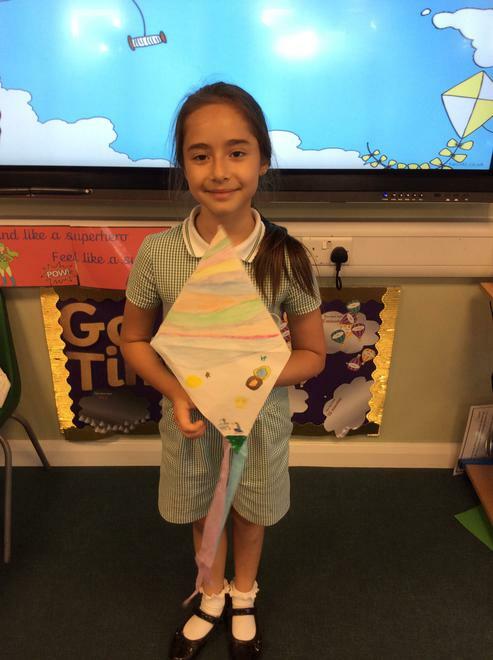 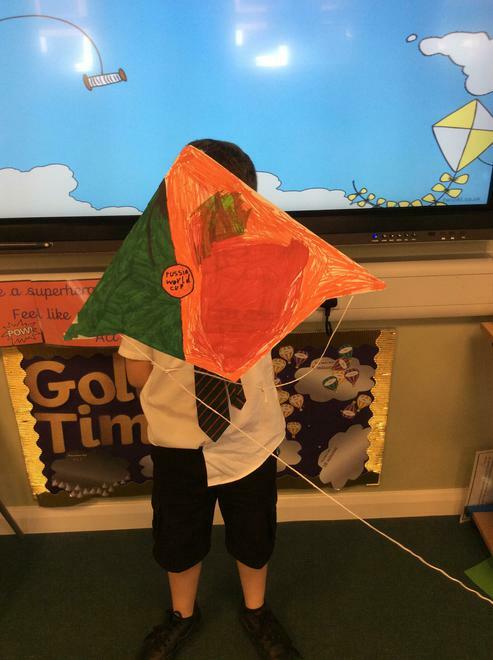 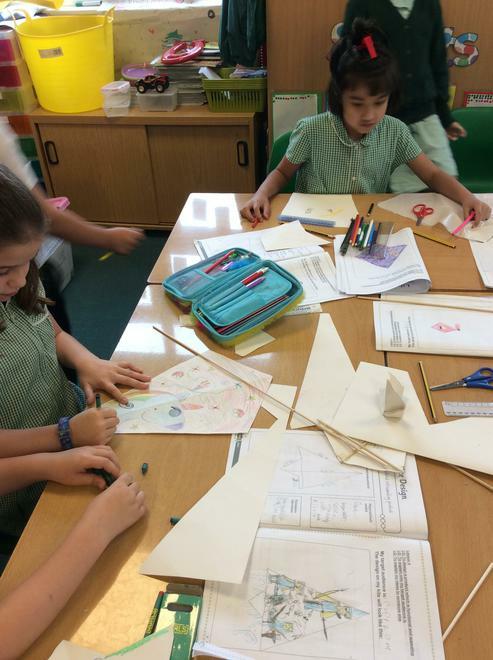 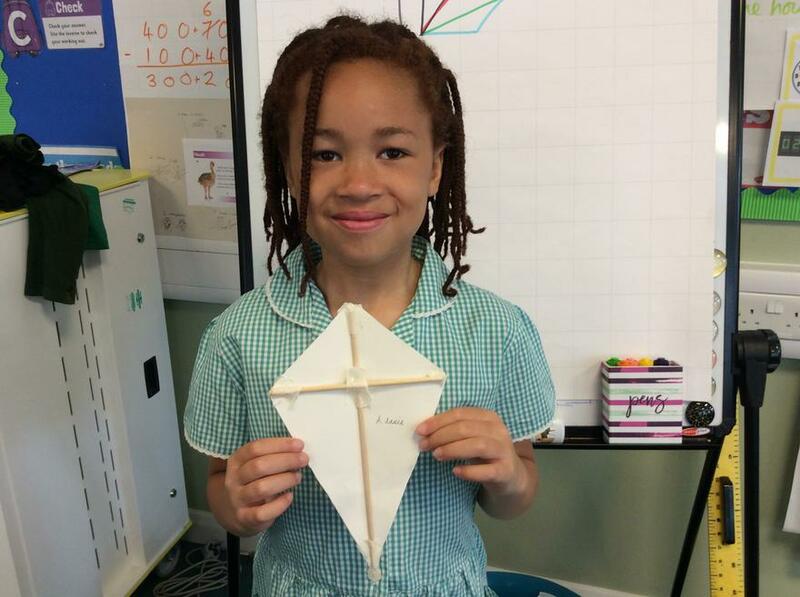 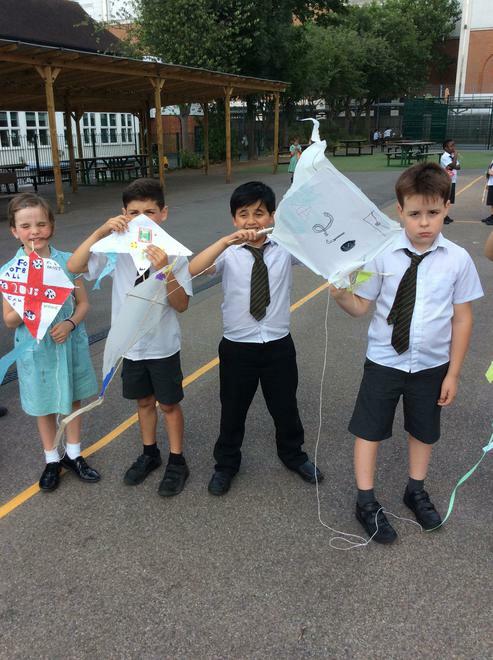 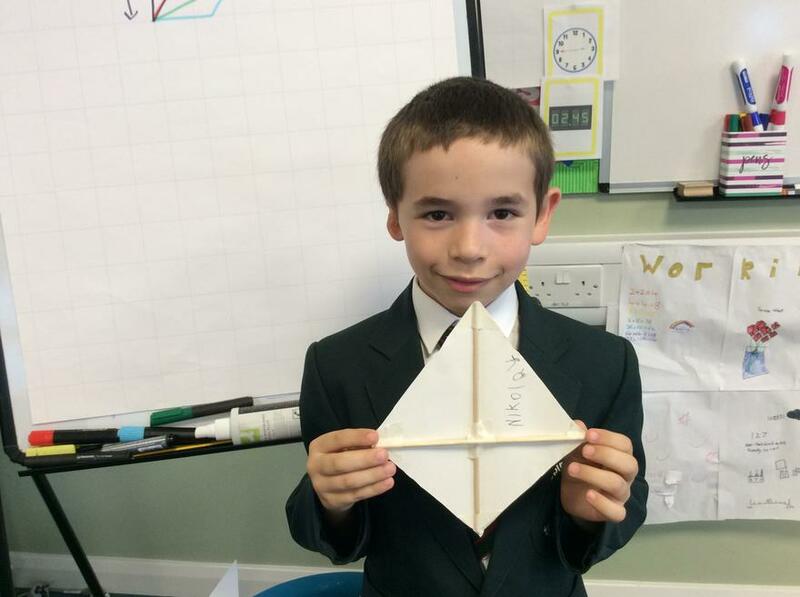 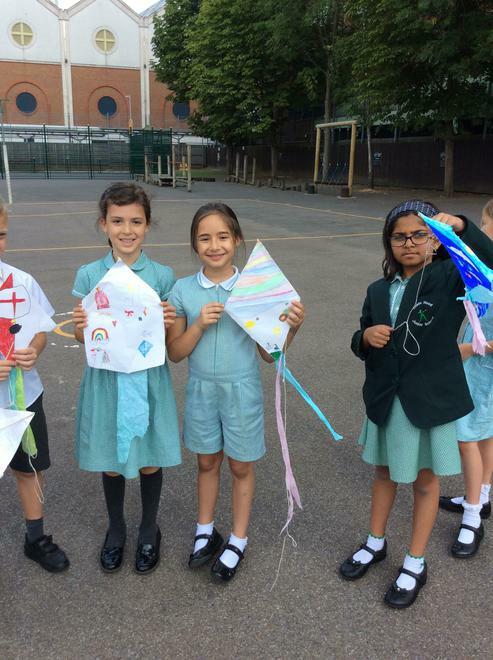 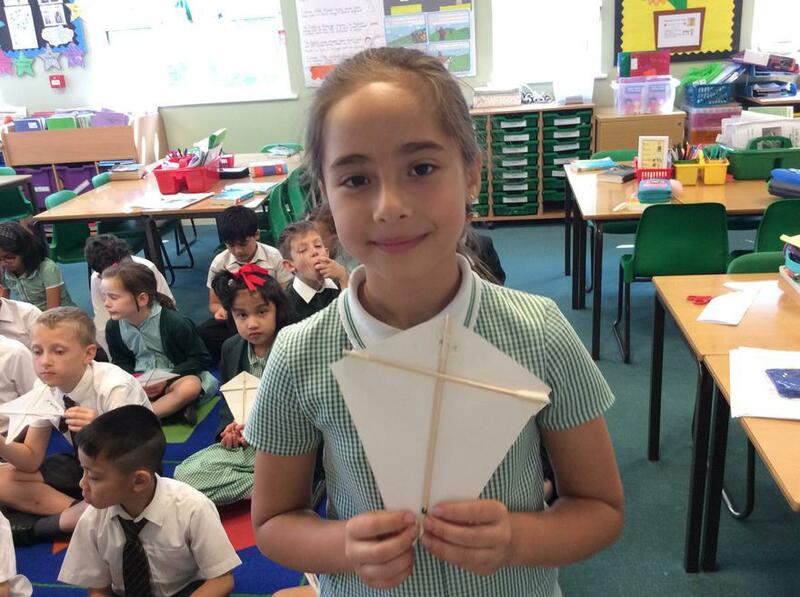 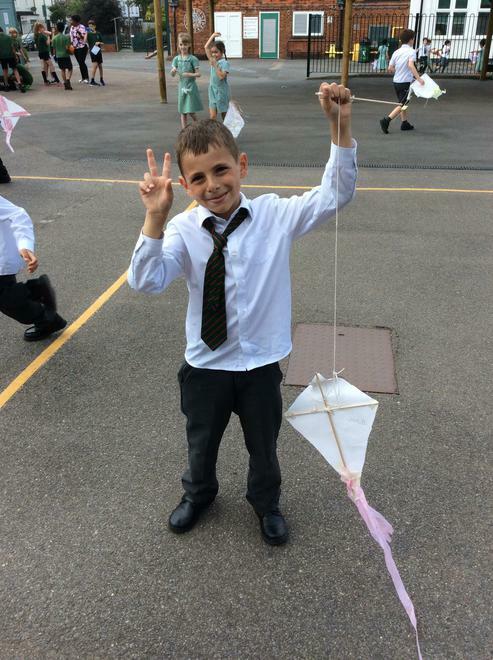 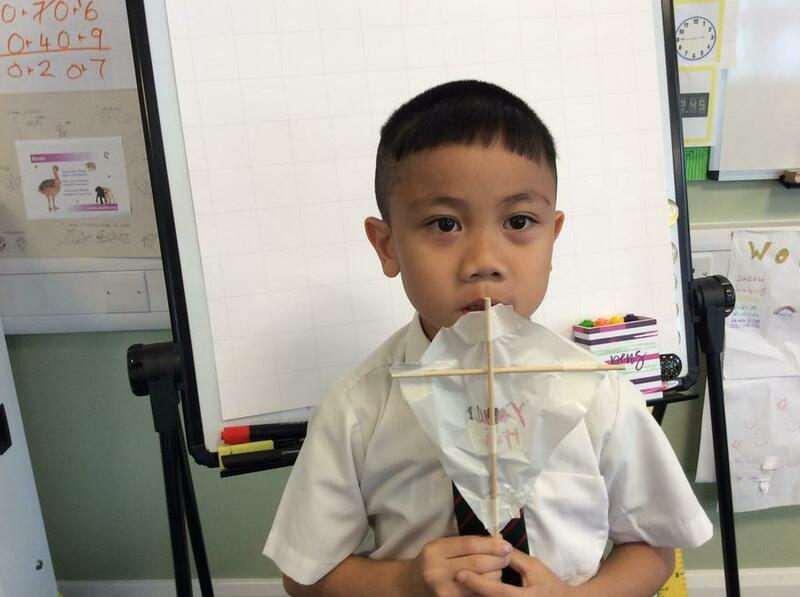 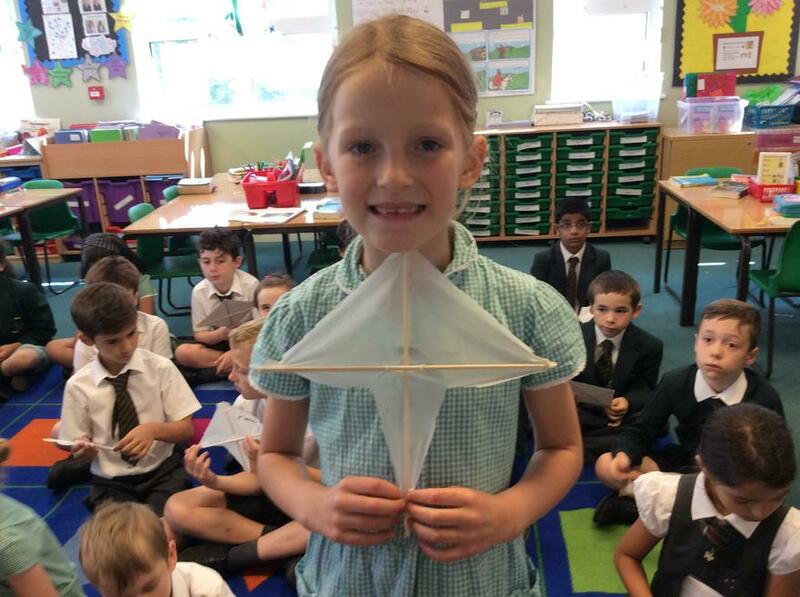 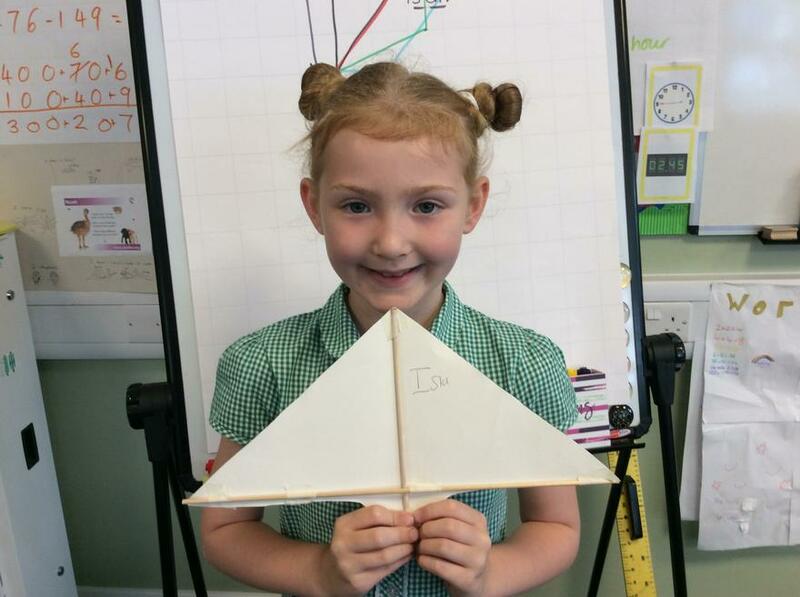 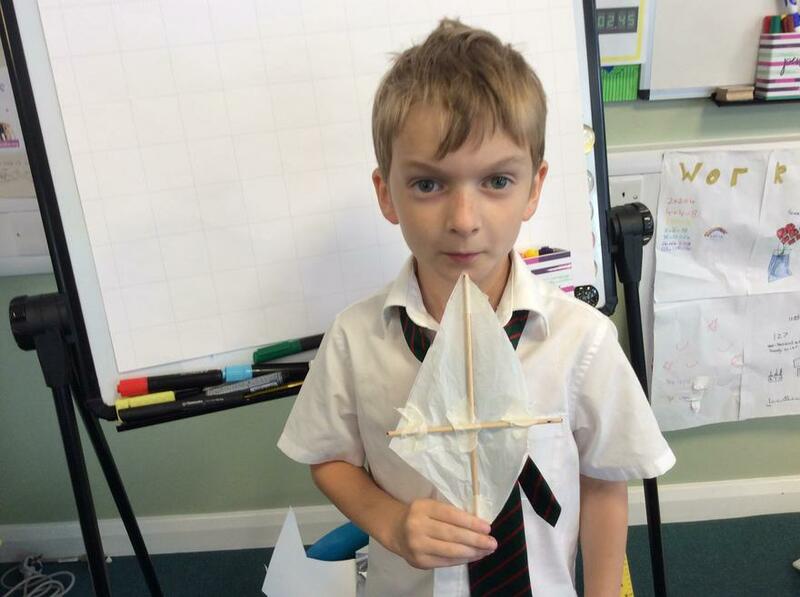 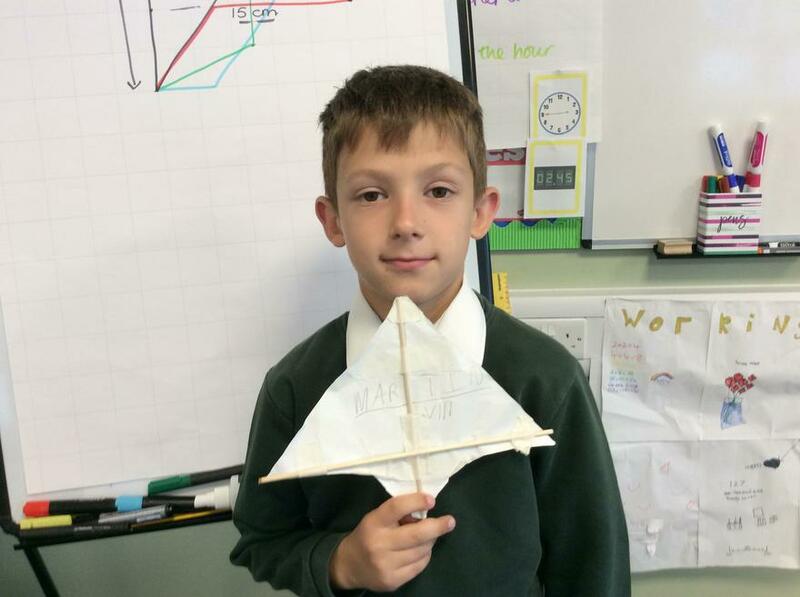 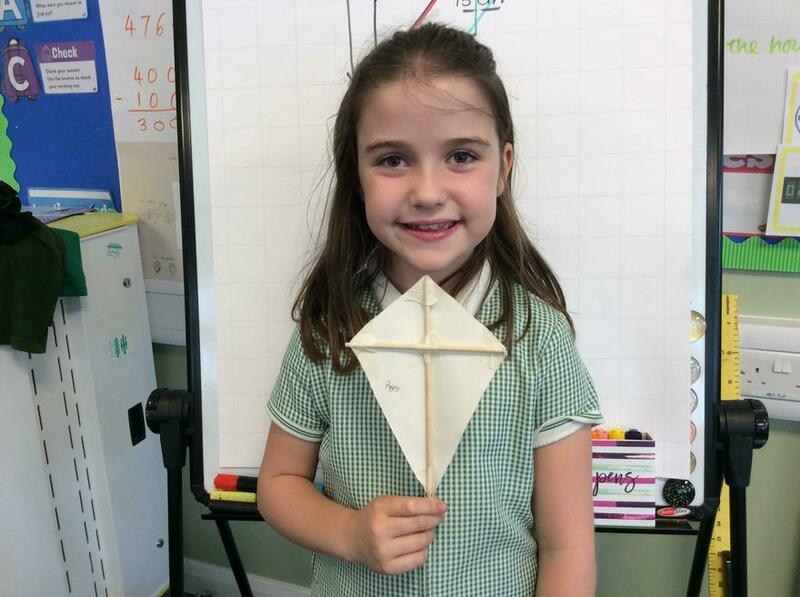 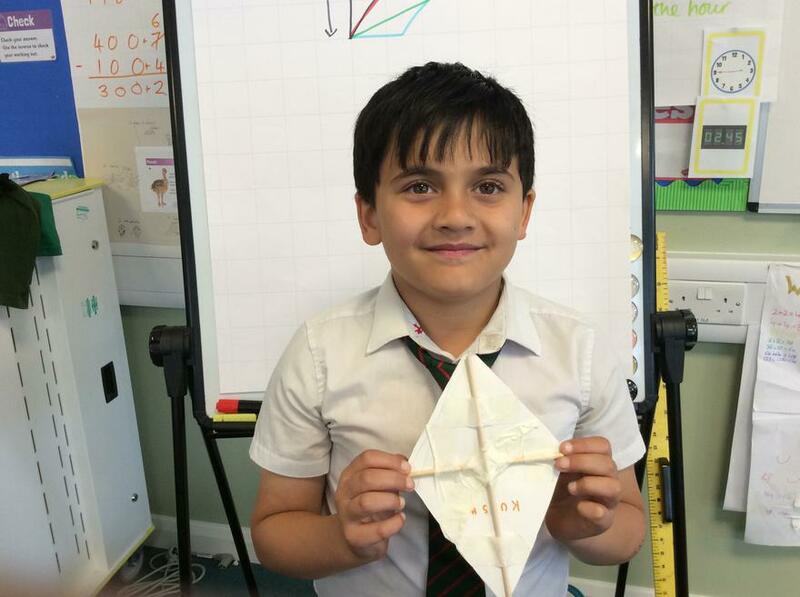 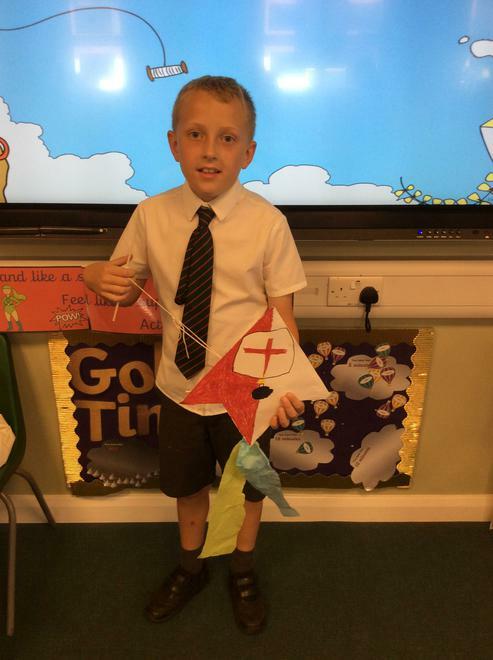 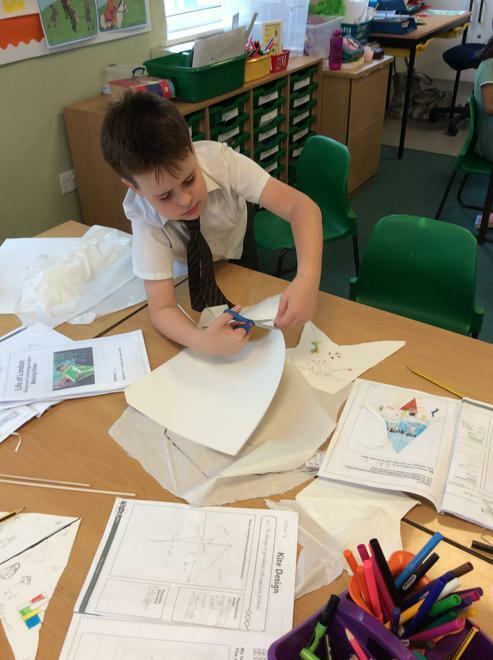 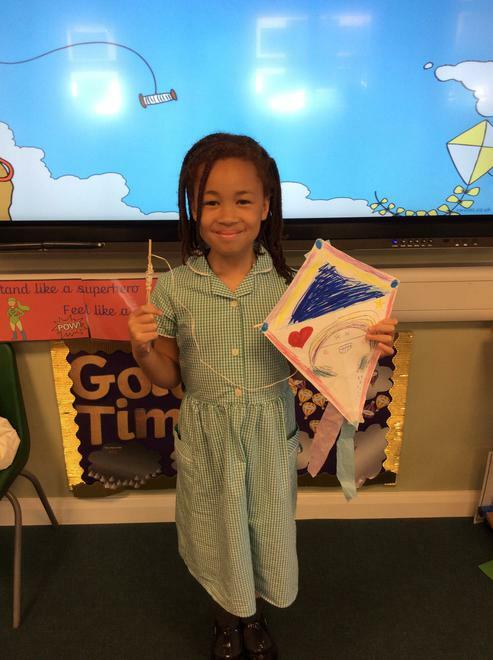 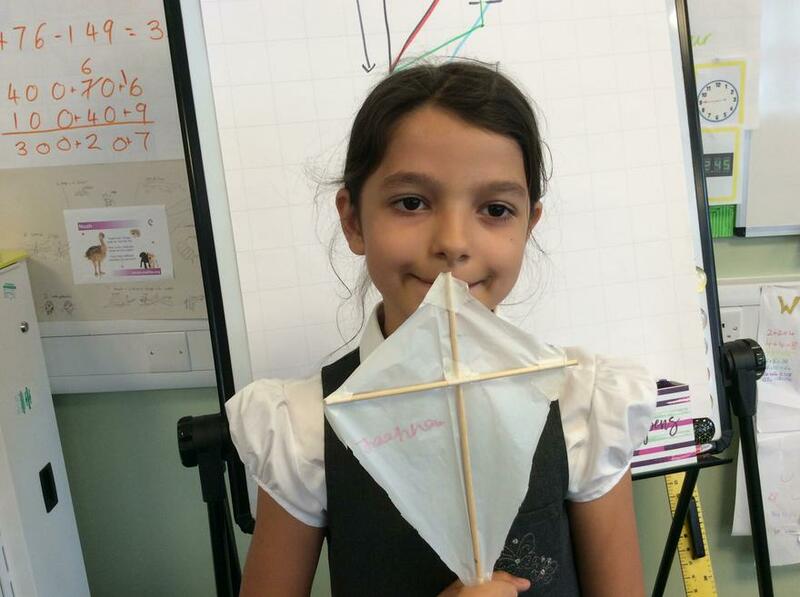 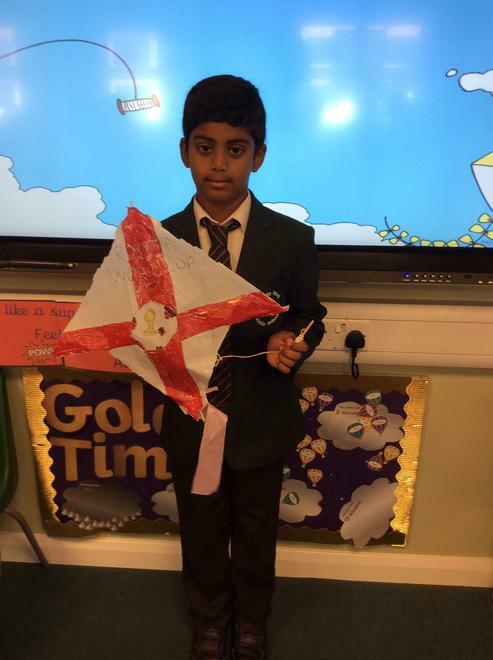 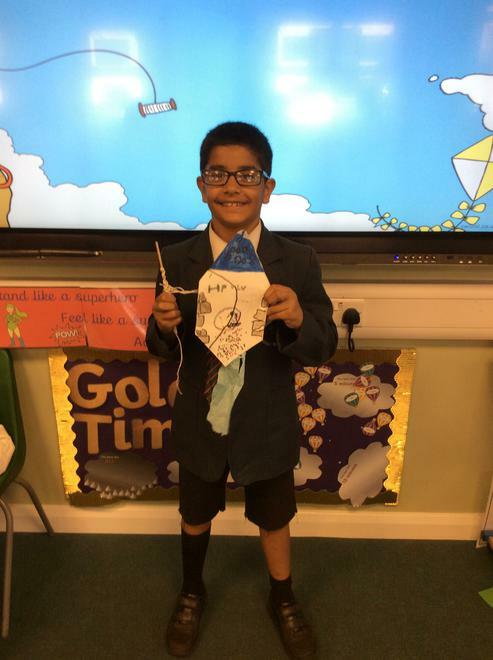 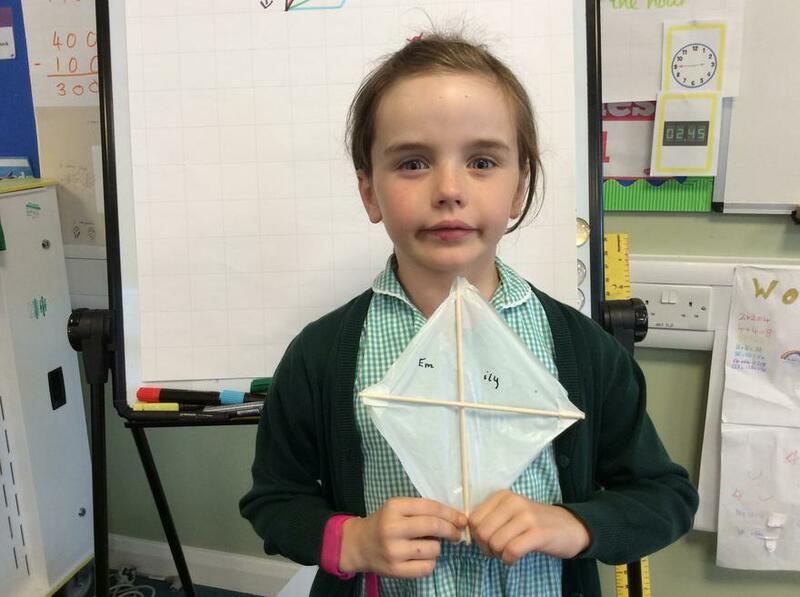 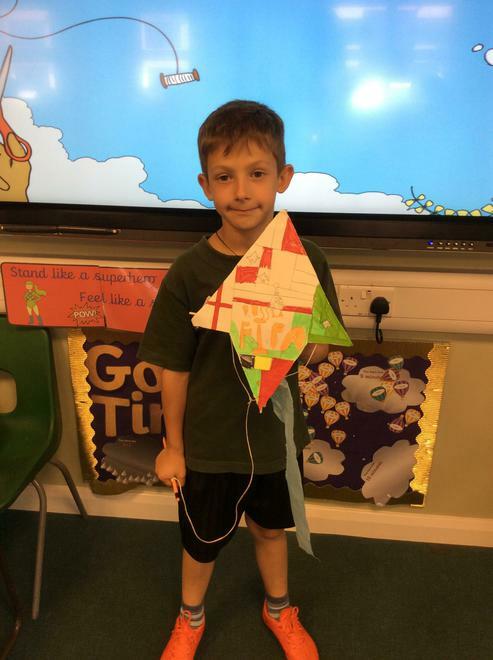 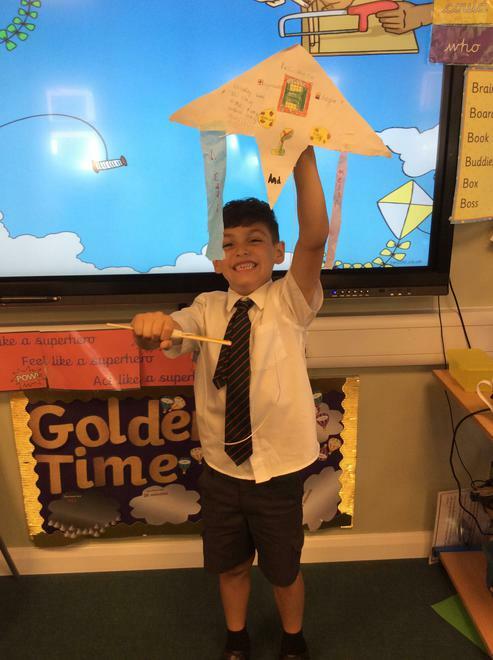 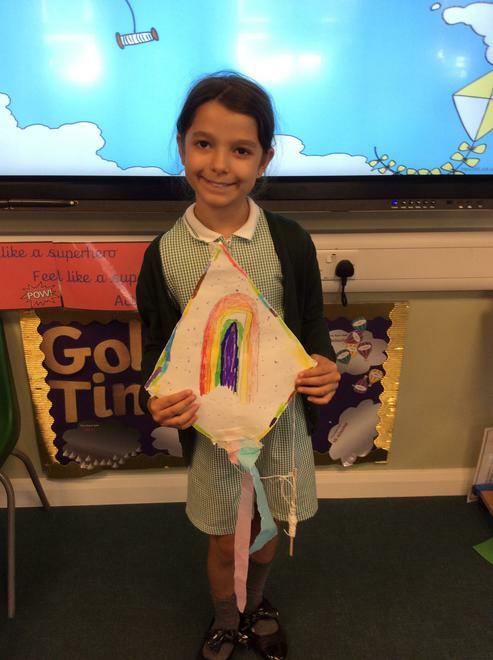 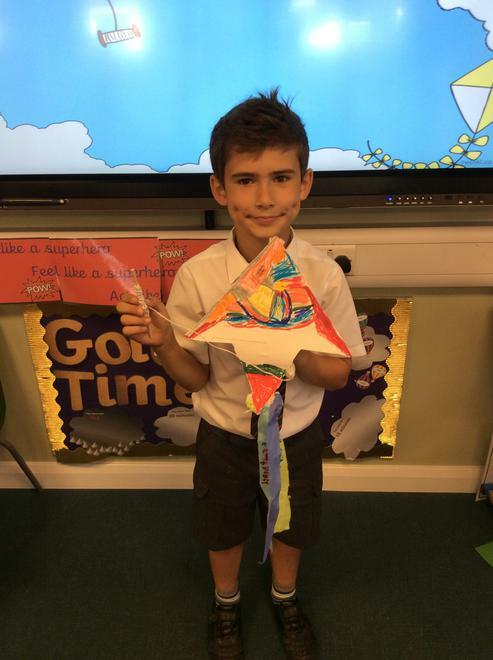 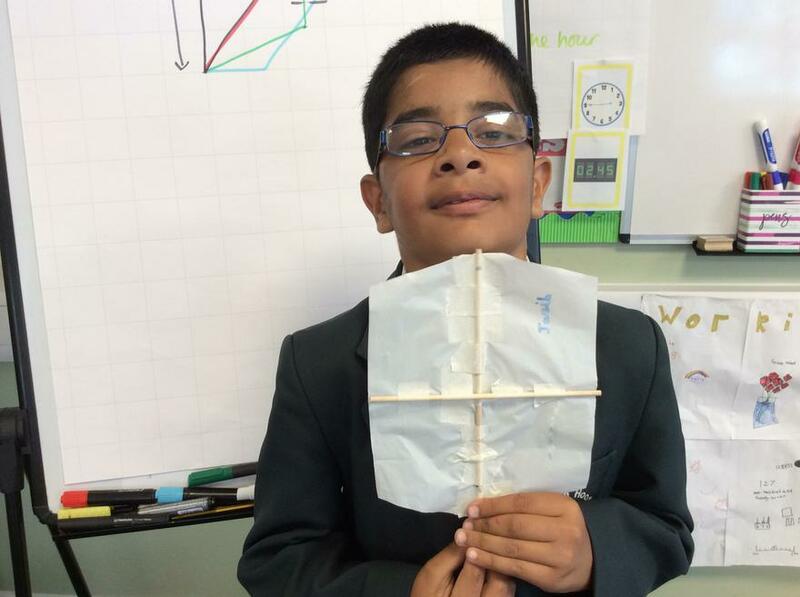 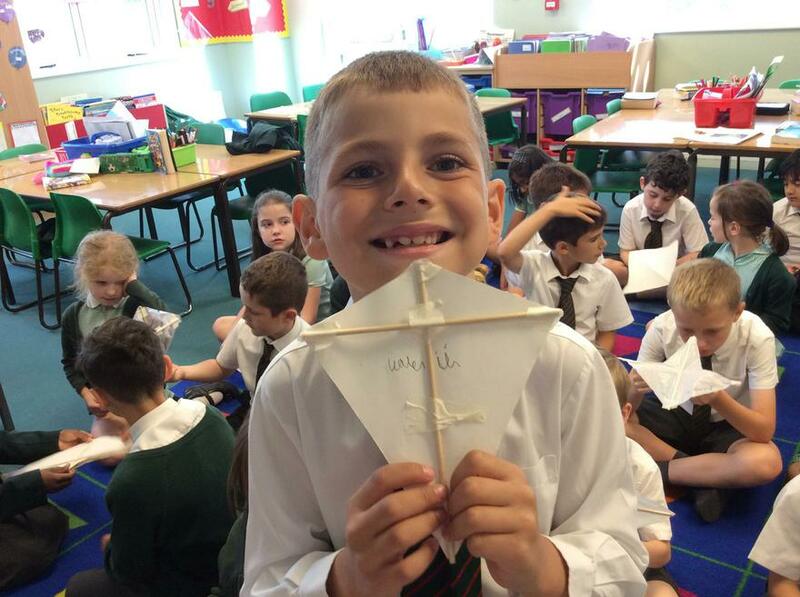 As part of our DT project, we have looked at the different features of kites and how they help them to fly. 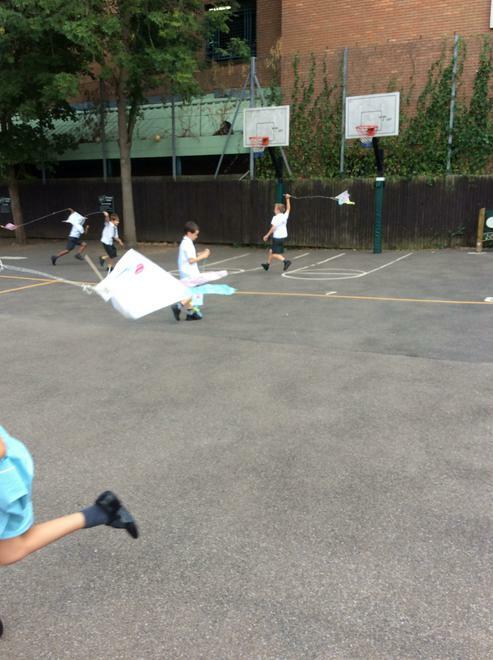 Today we tried to include these features and created our own prototype of the type of kite we wanted to make. 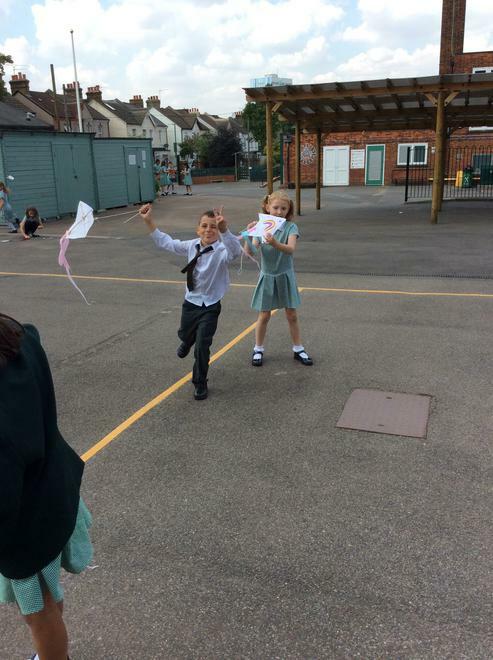 This week we finished off watching Mary Poppins. 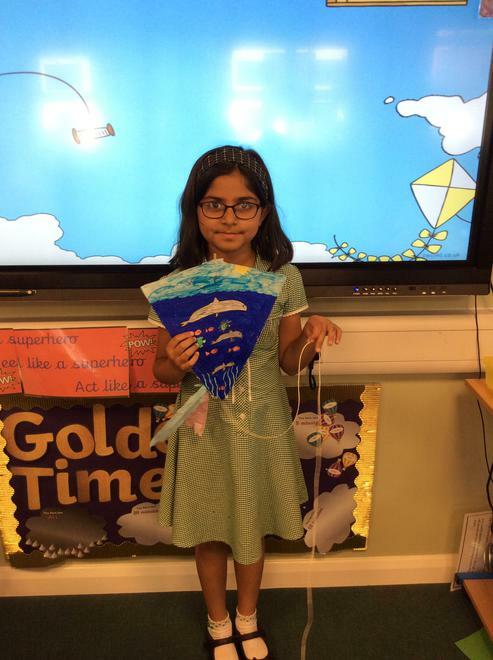 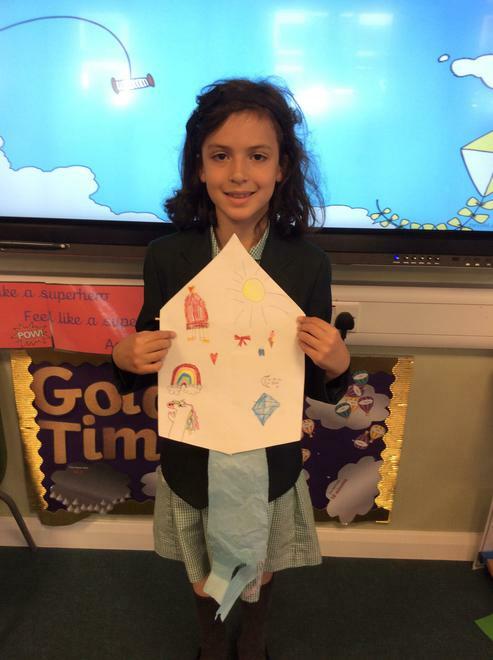 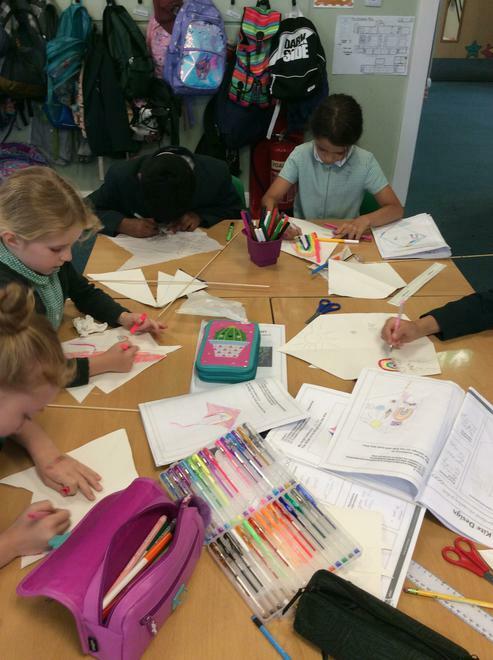 For our DT project this half term we will be looking at kites and eventually making our own! 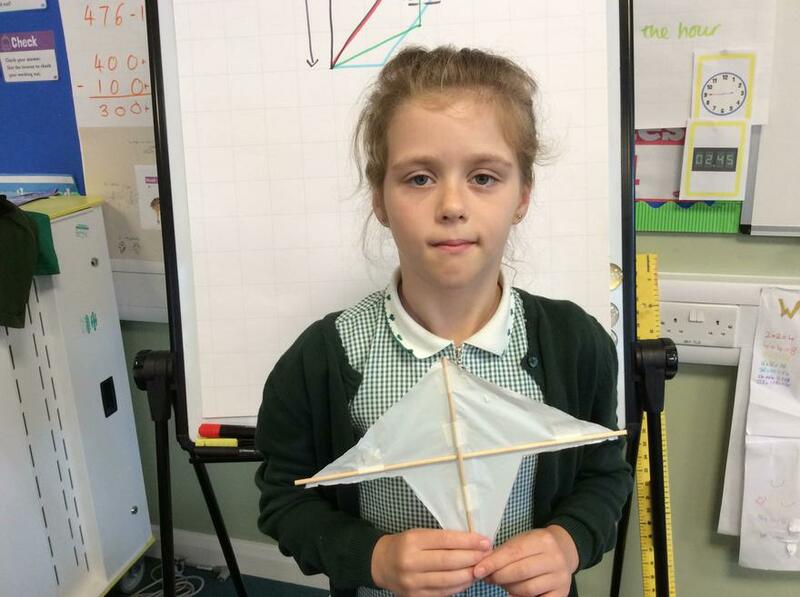 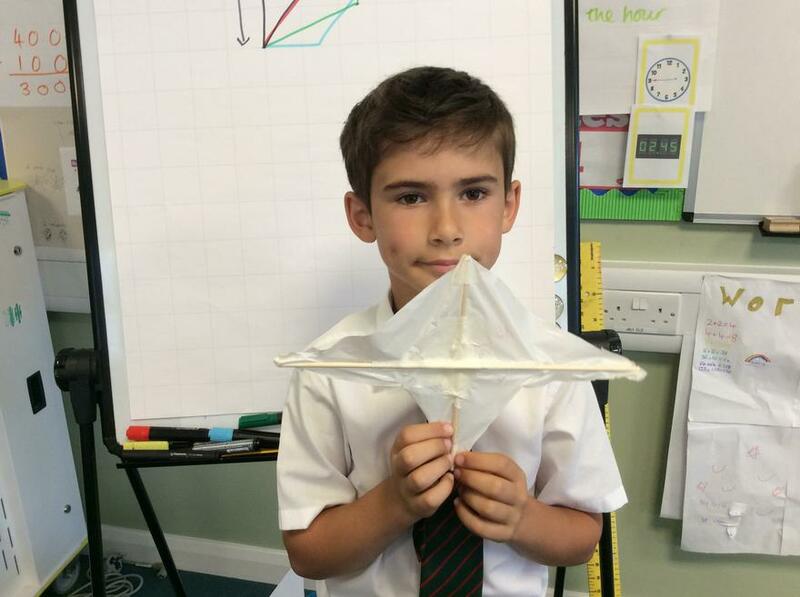 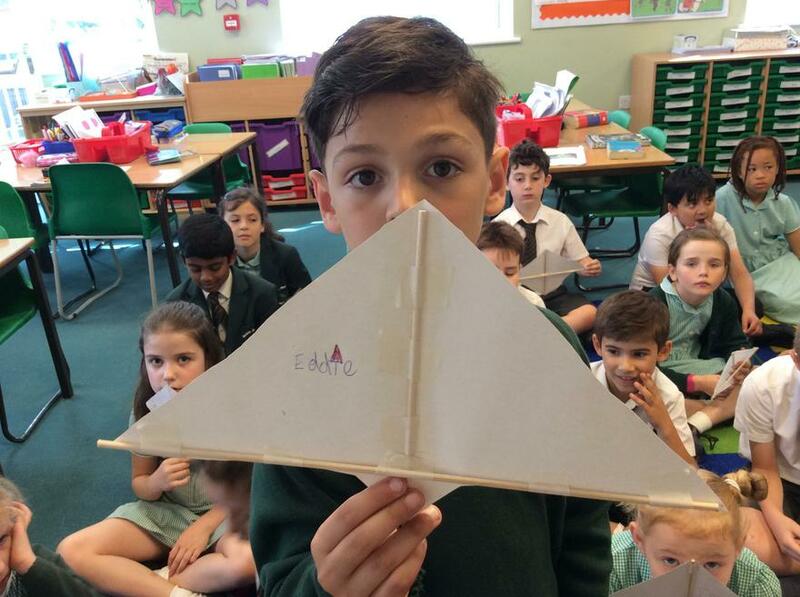 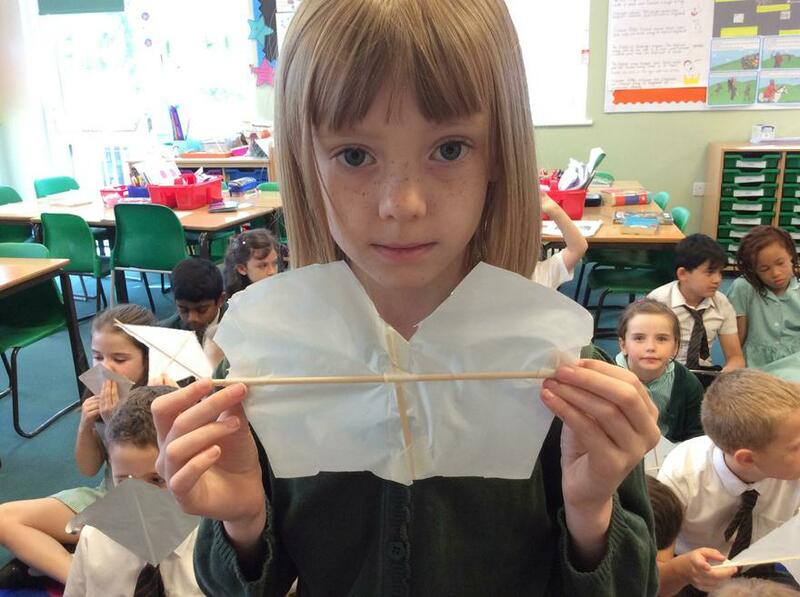 Today we introduced the project by looking at existing kites and finding out how they work! 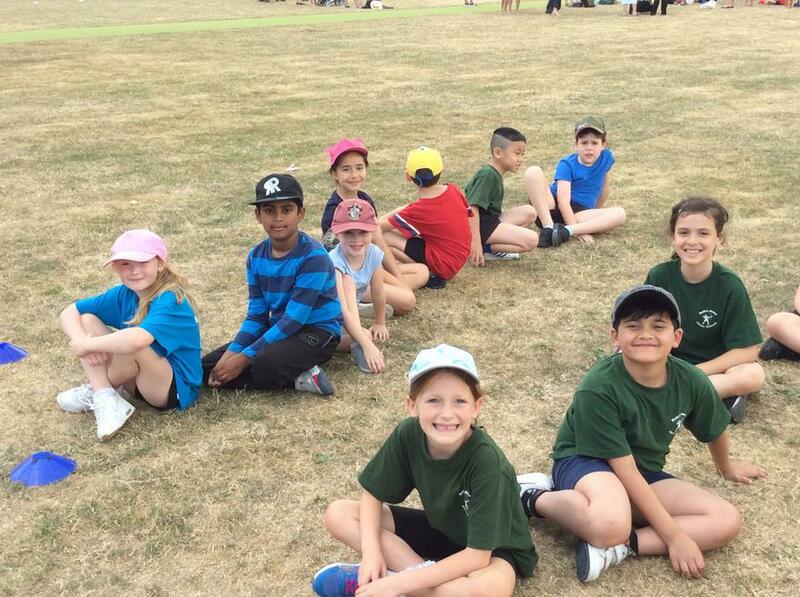 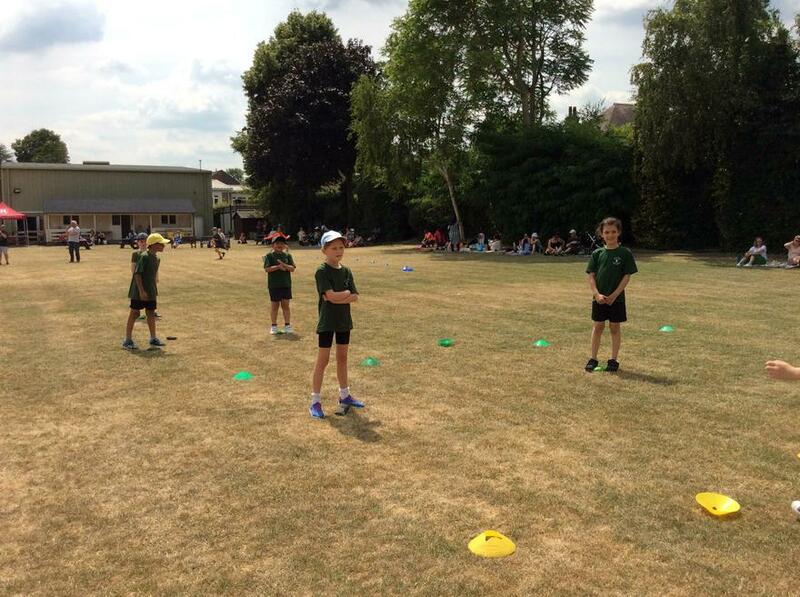 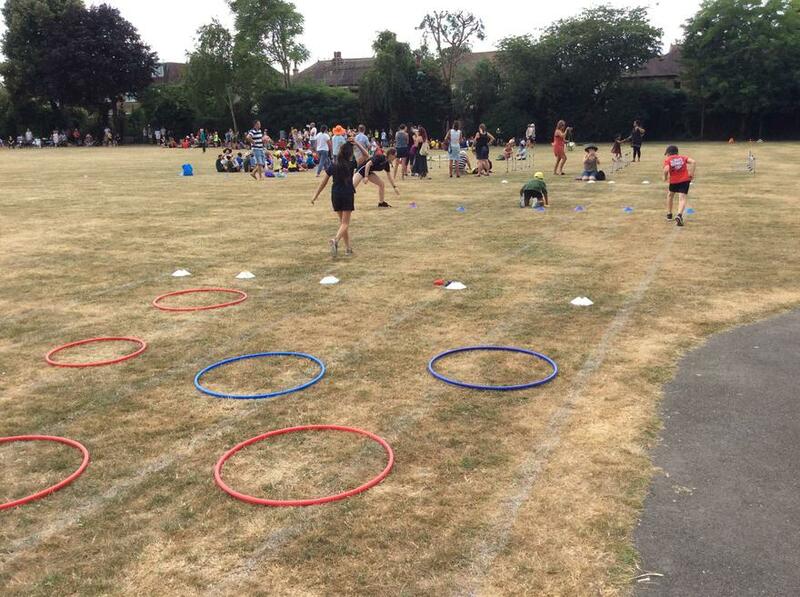 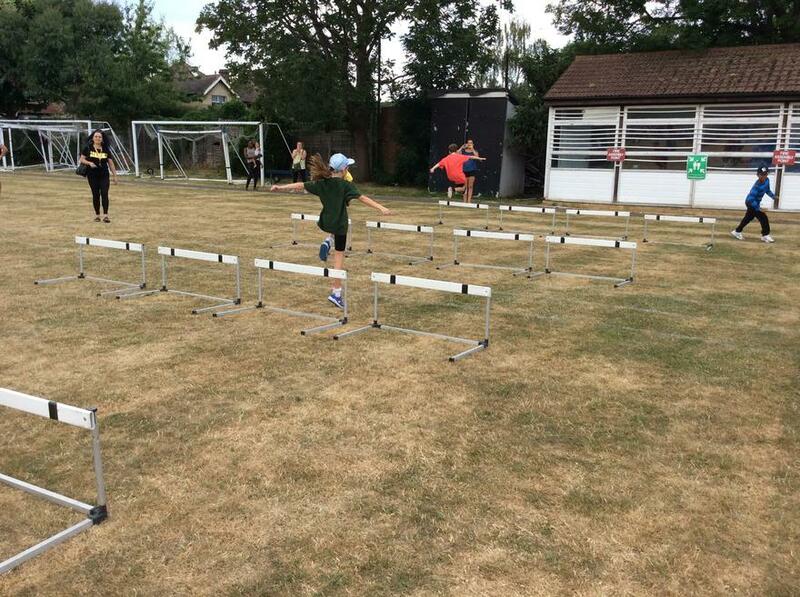 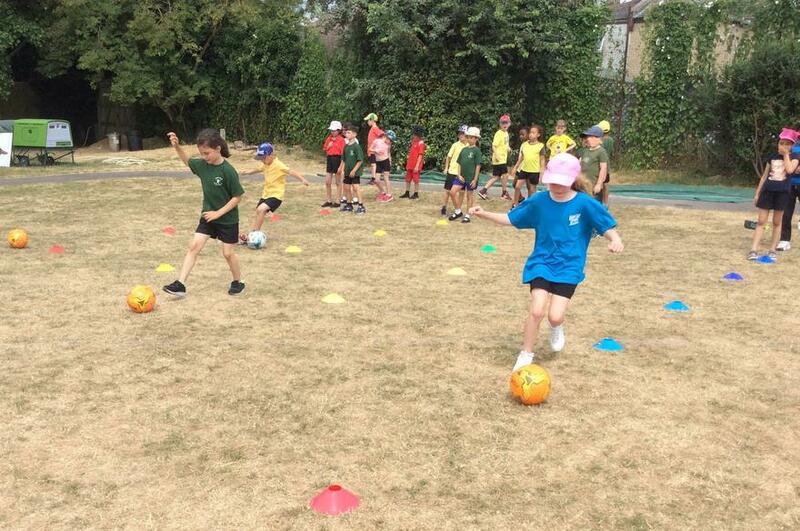 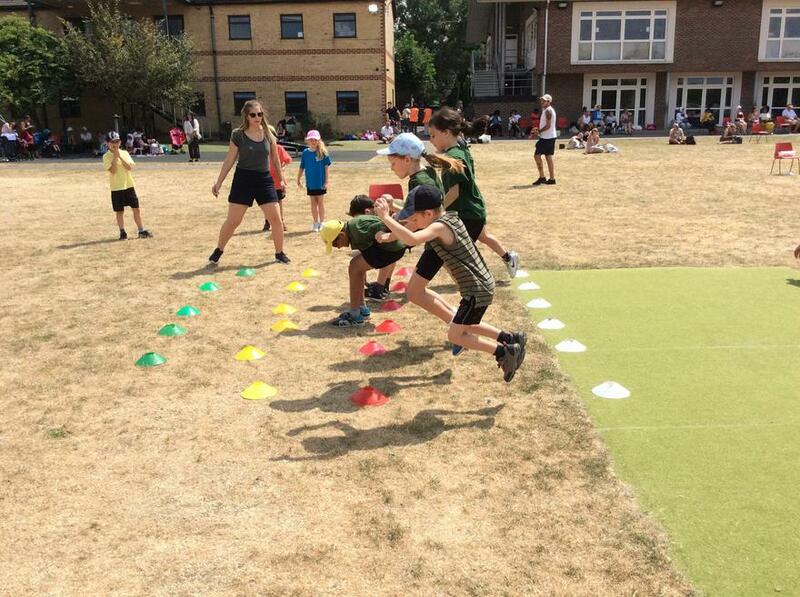 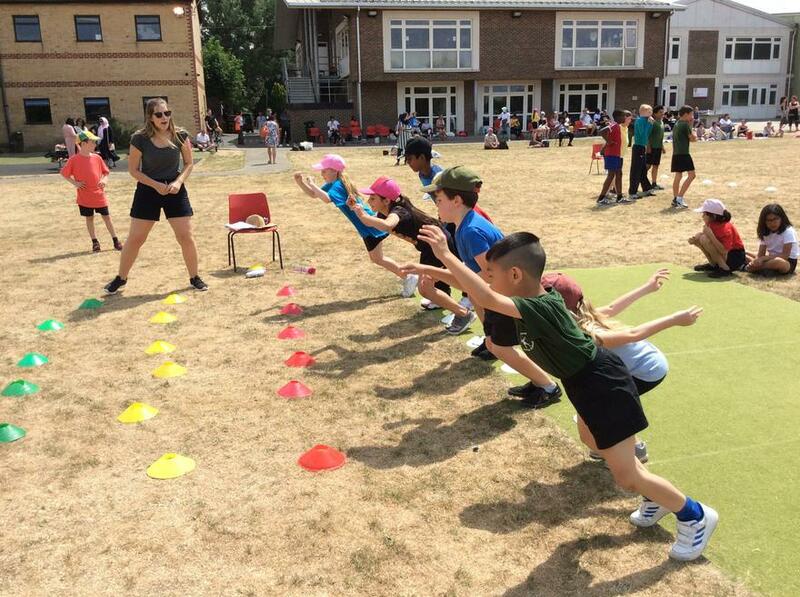 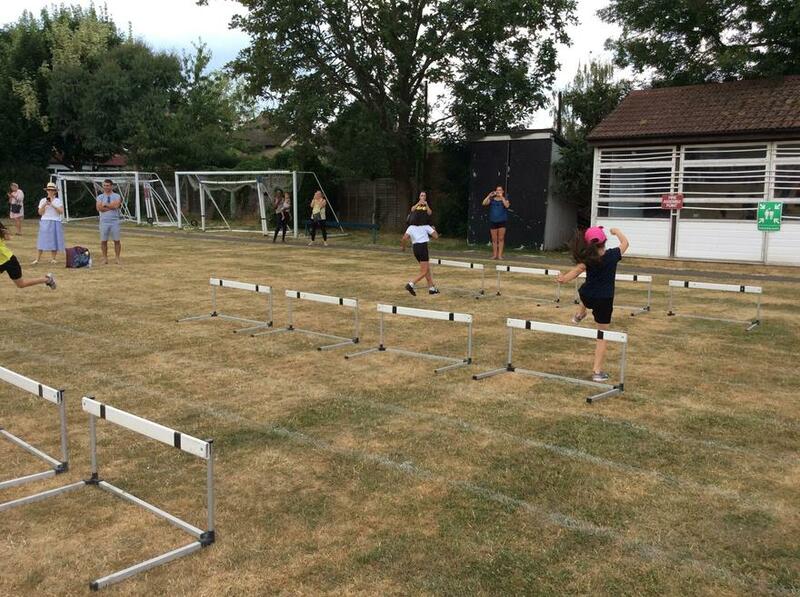 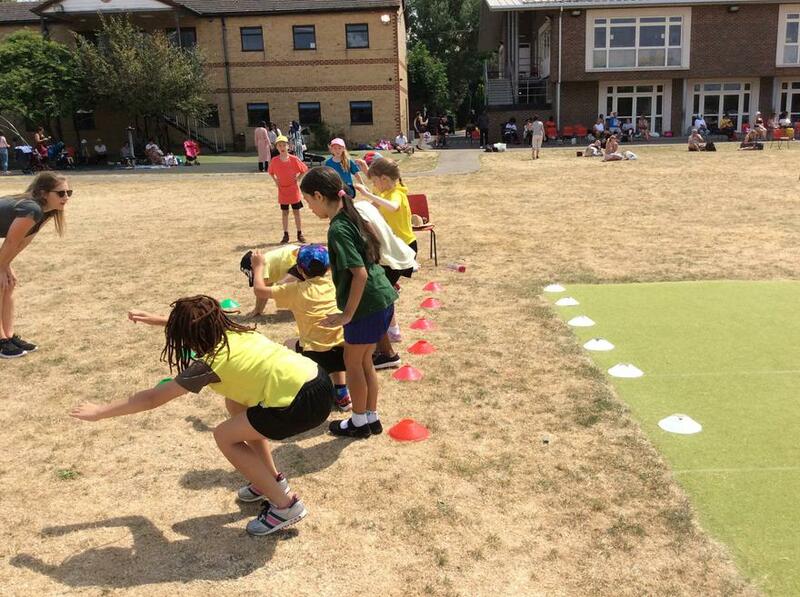 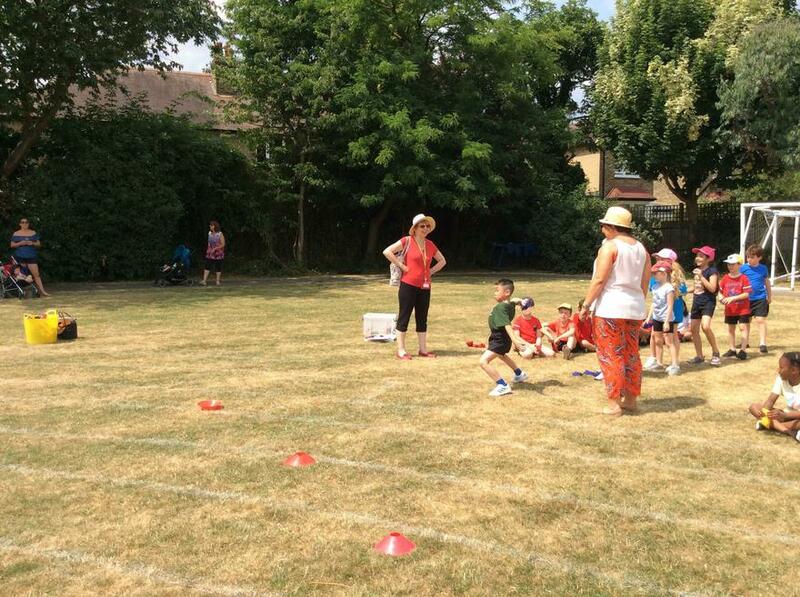 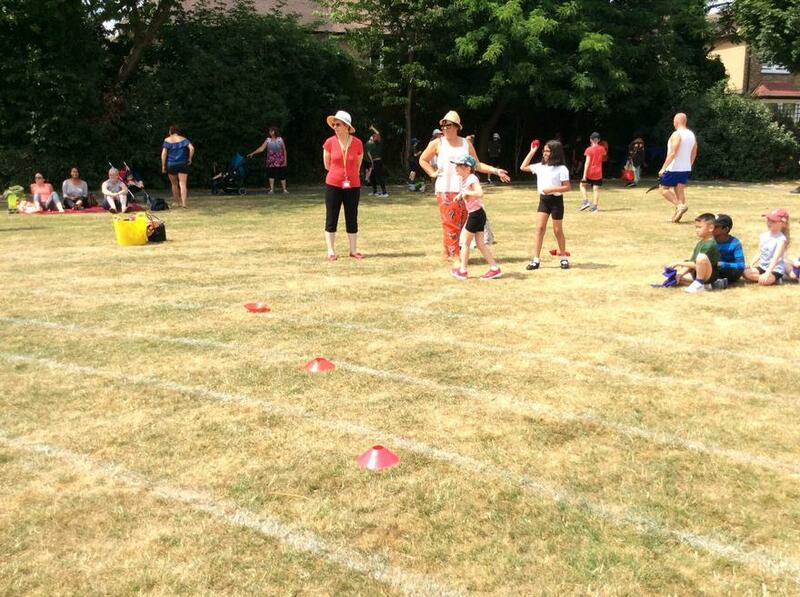 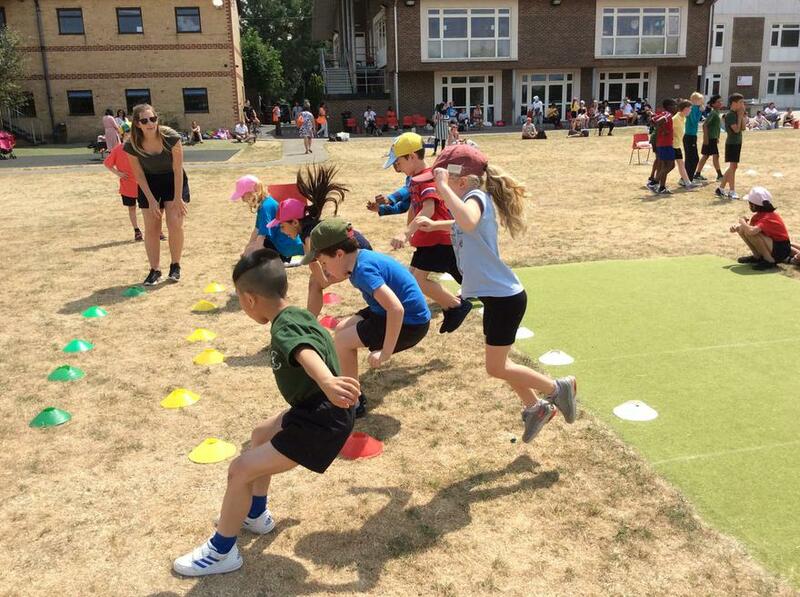 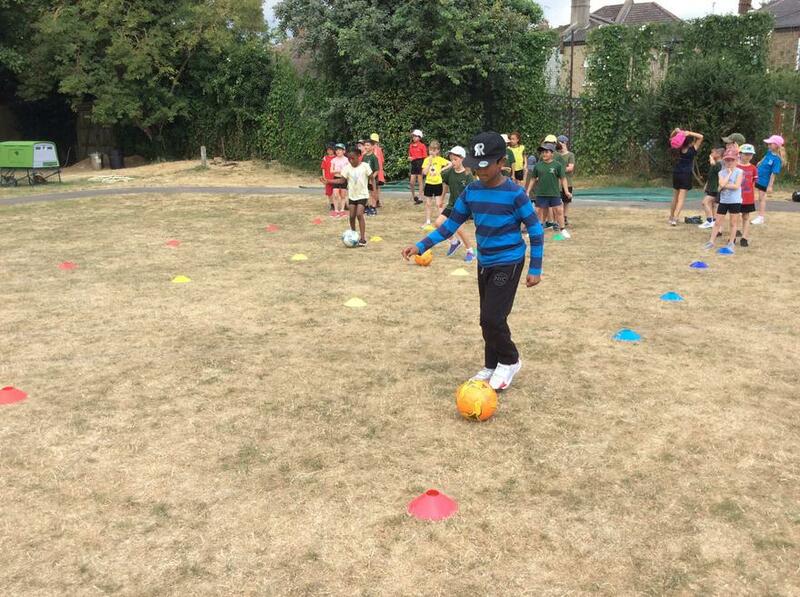 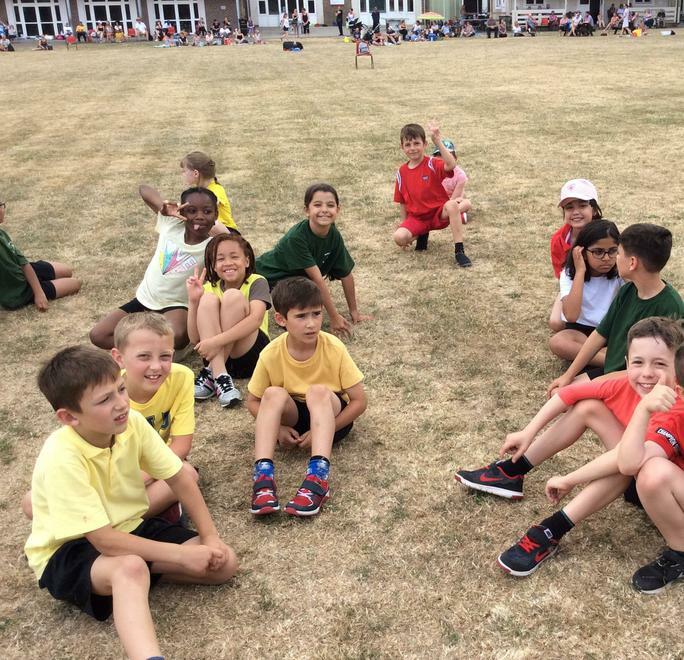 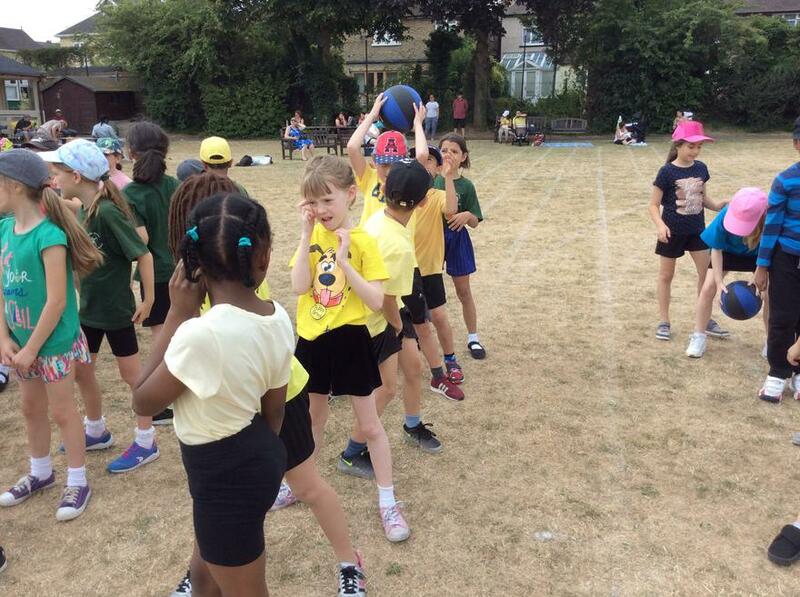 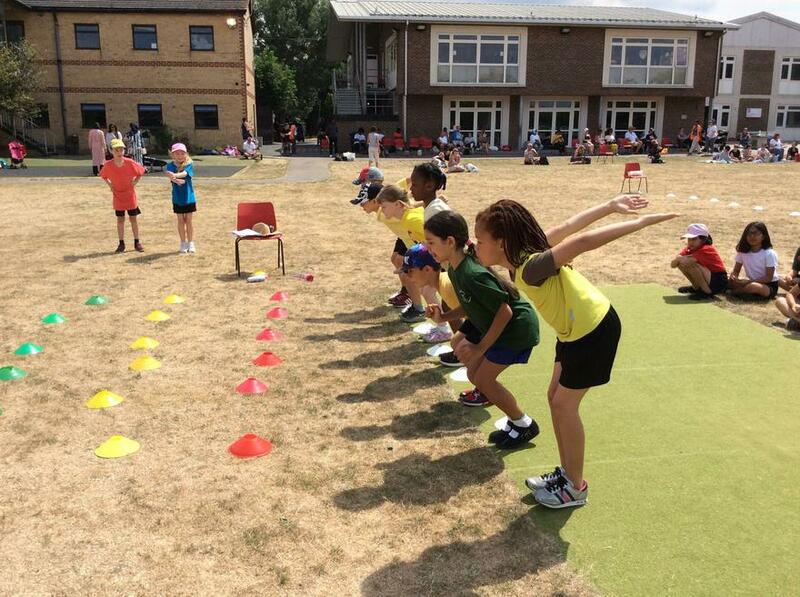 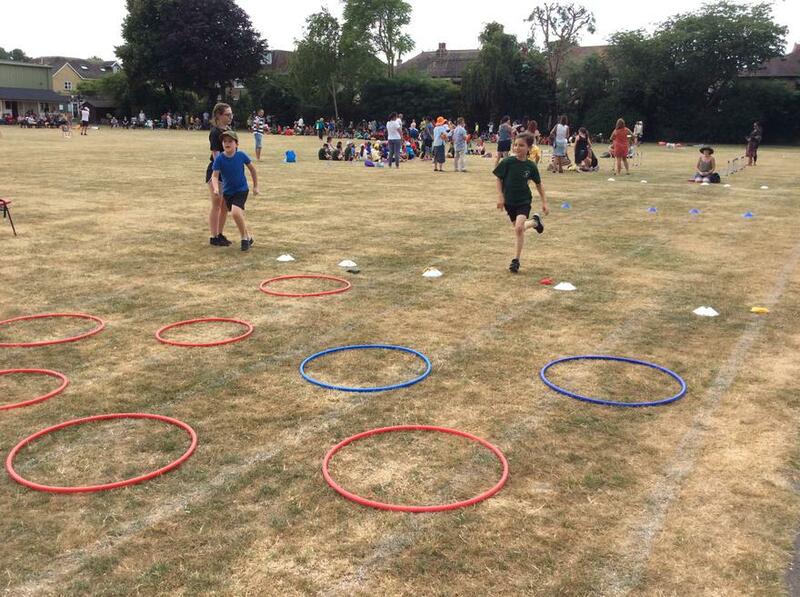 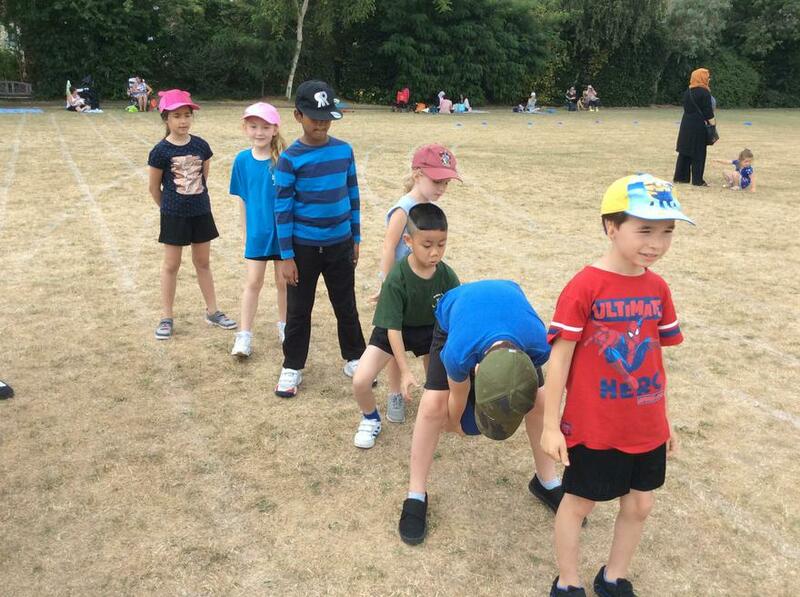 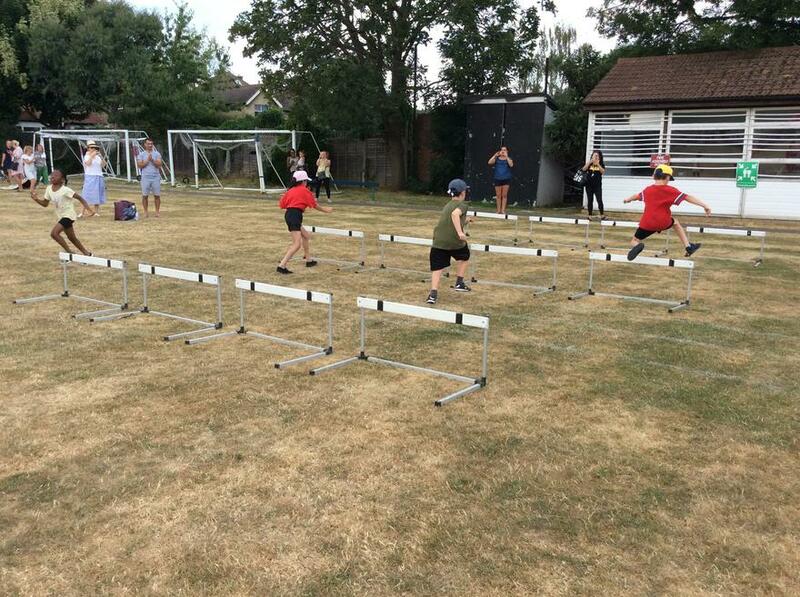 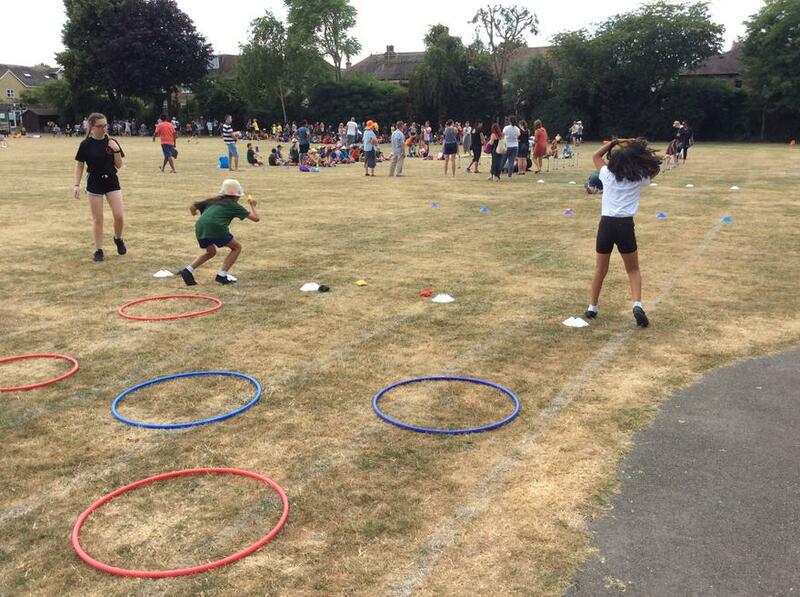 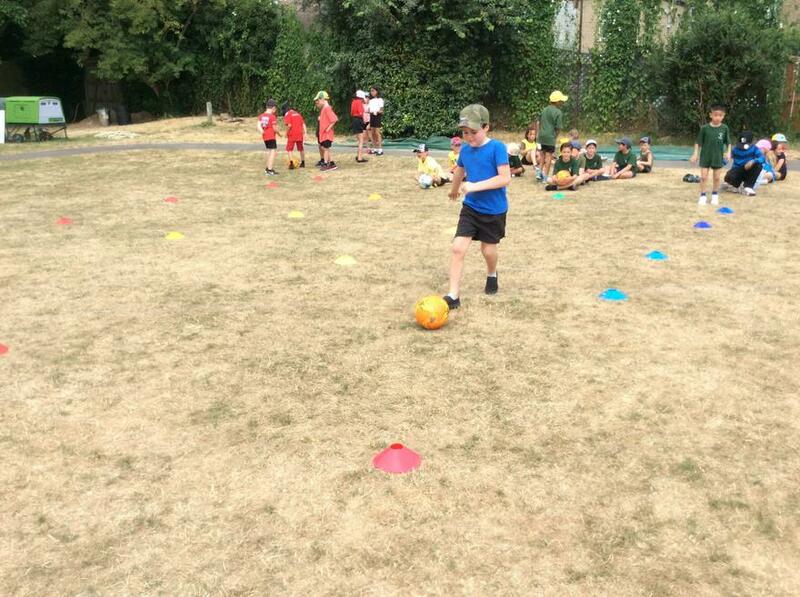 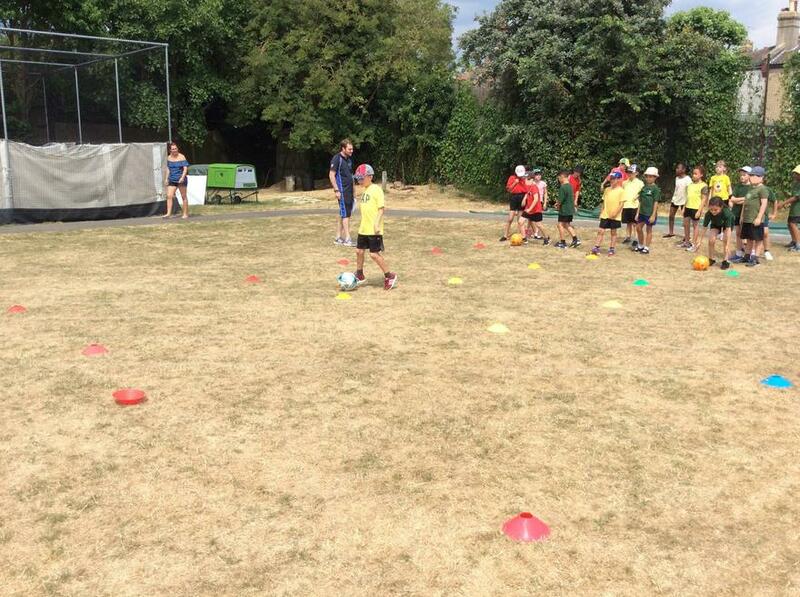 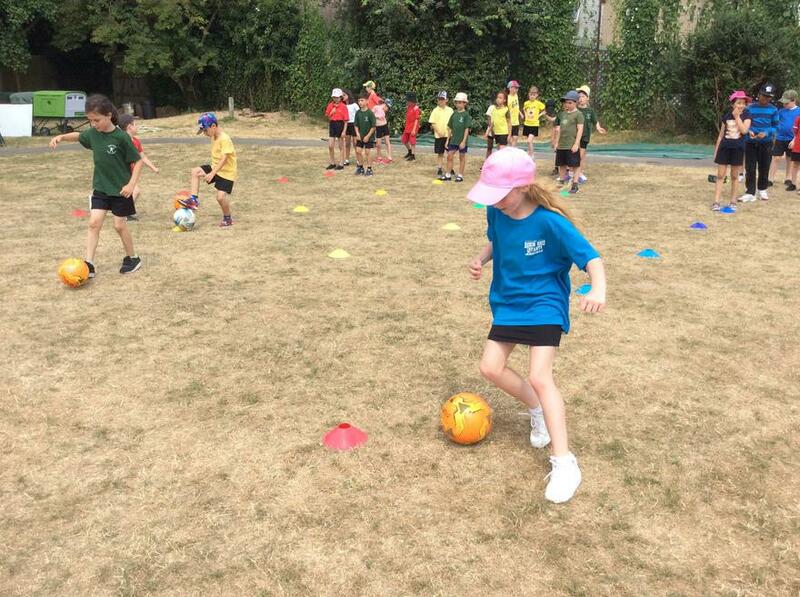 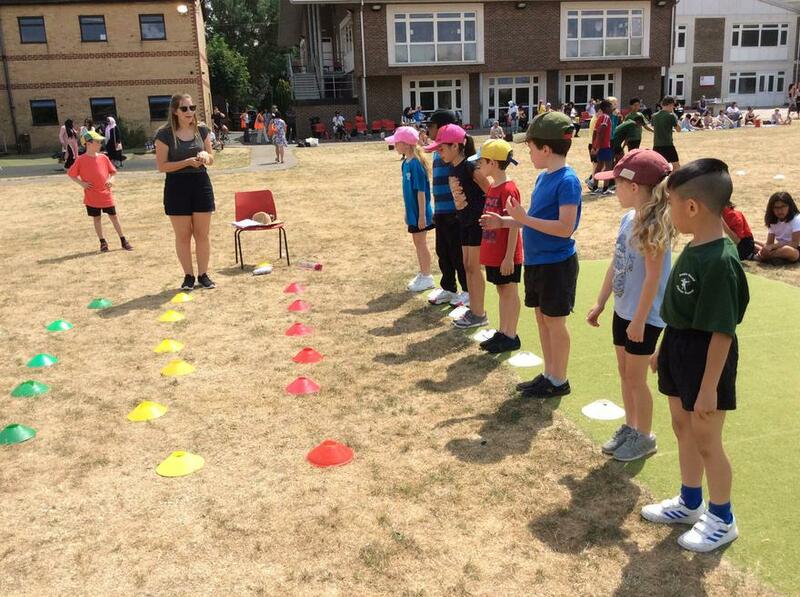 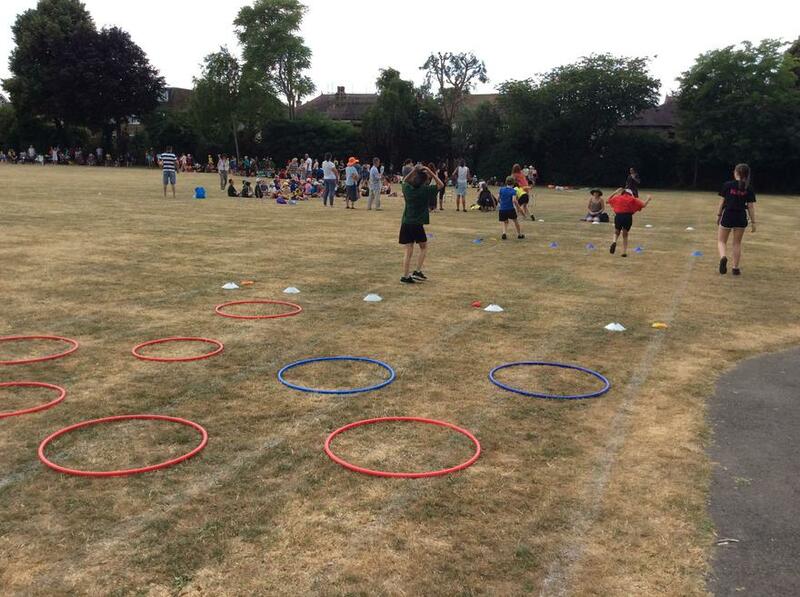 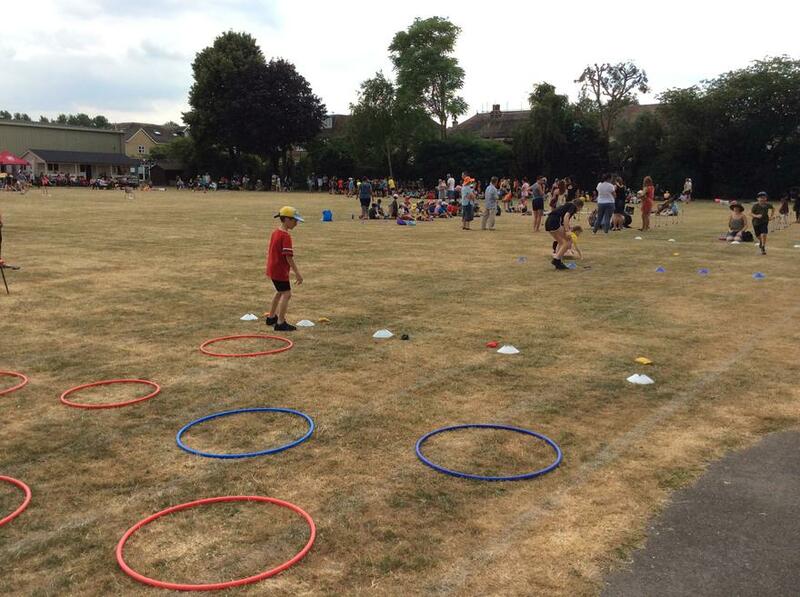 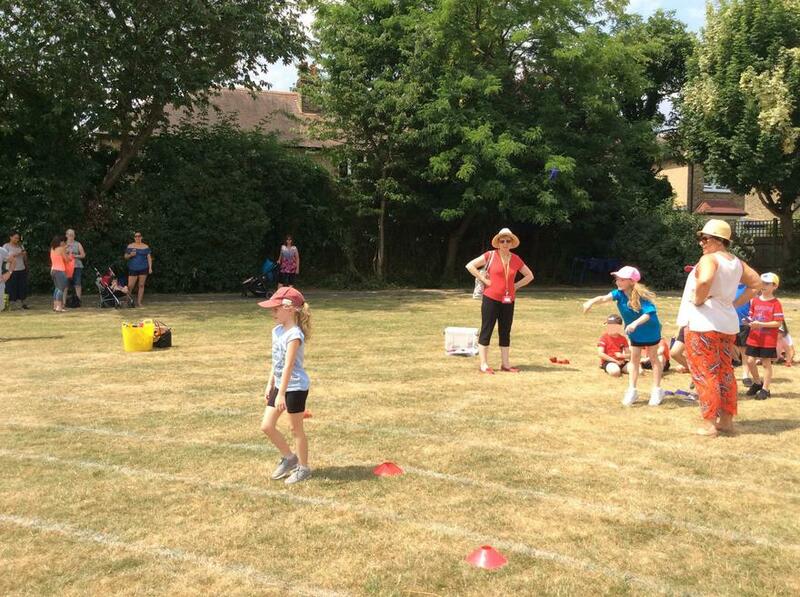 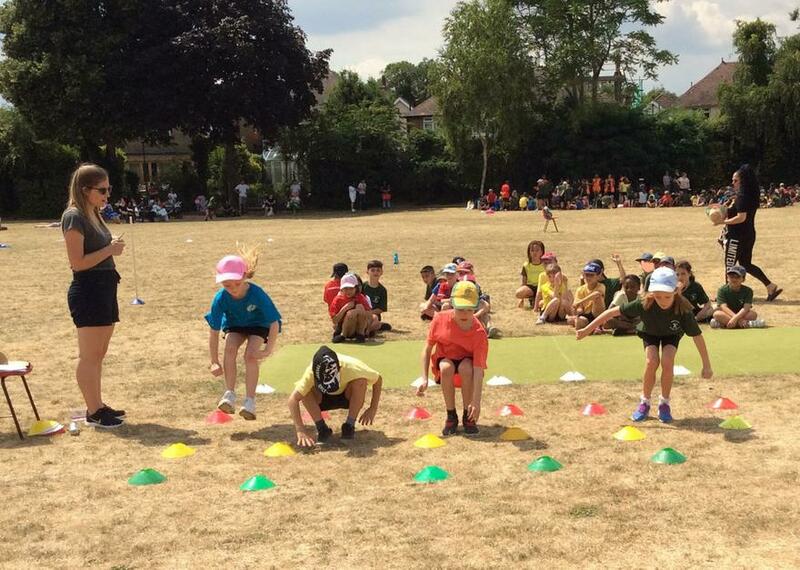 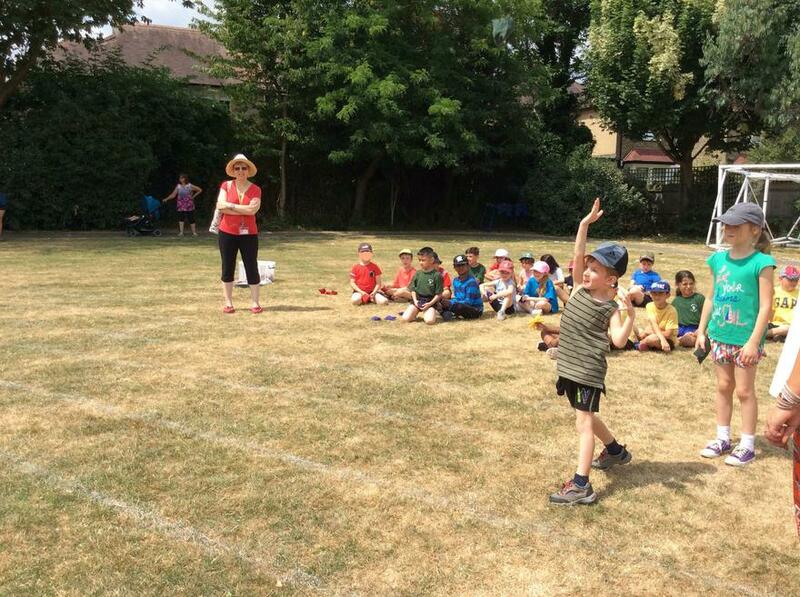 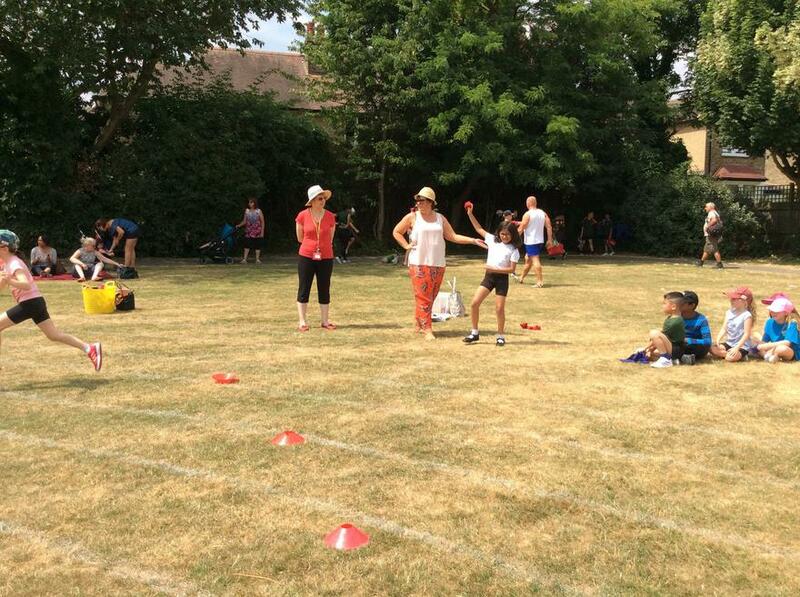 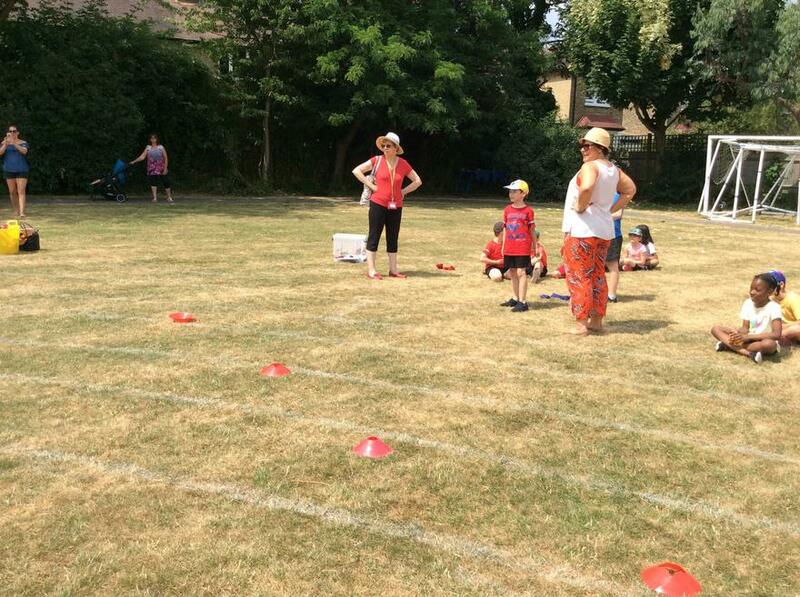 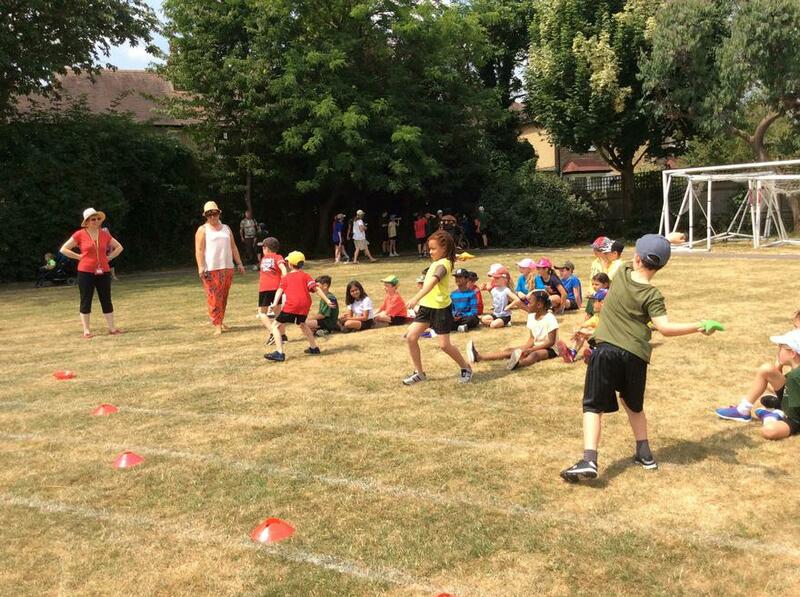 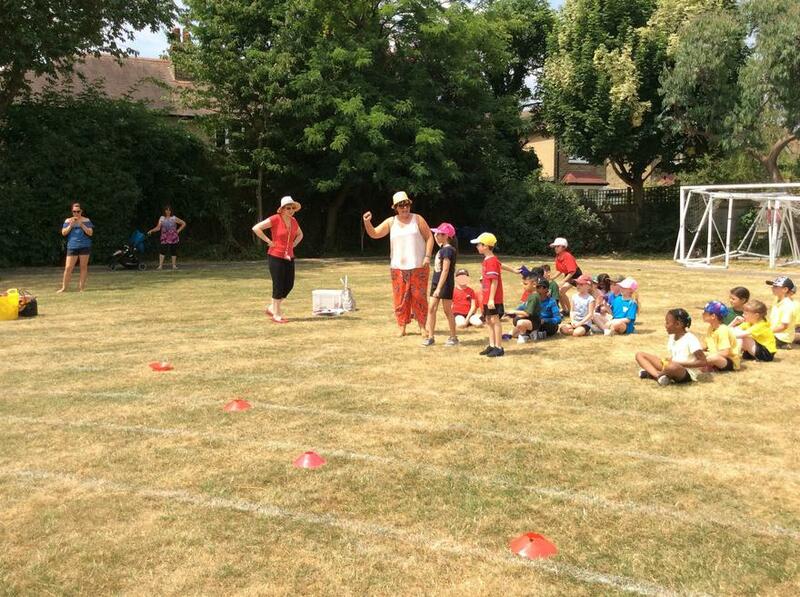 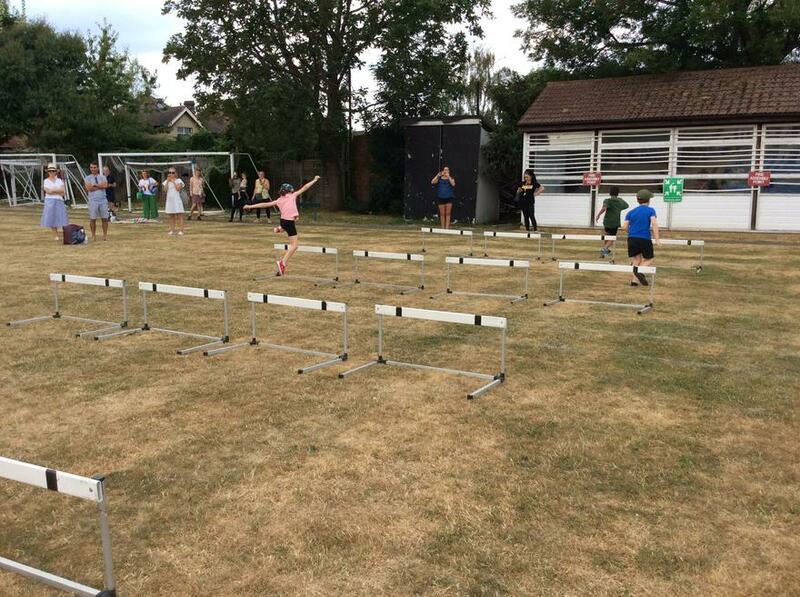 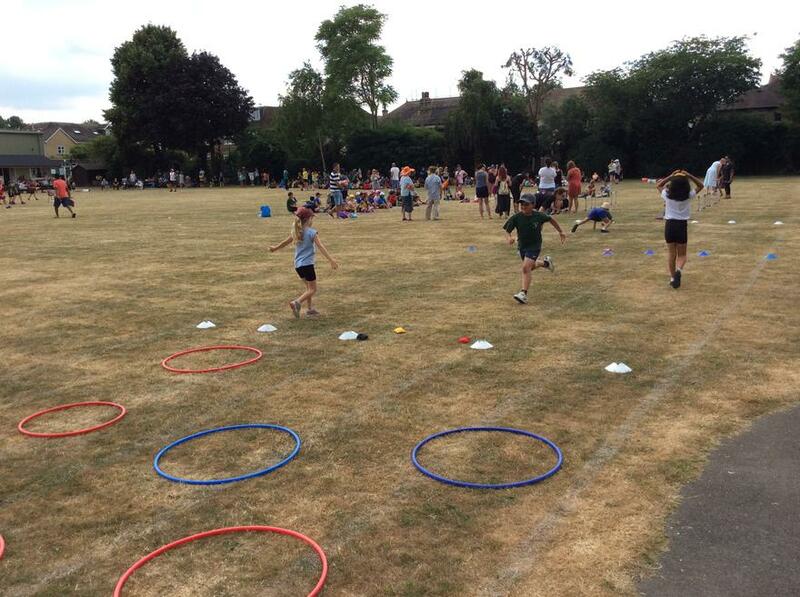 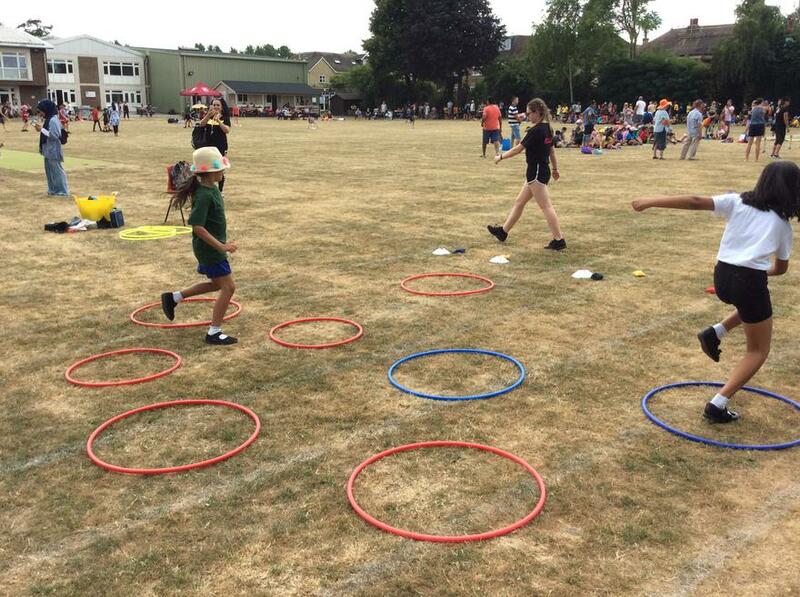 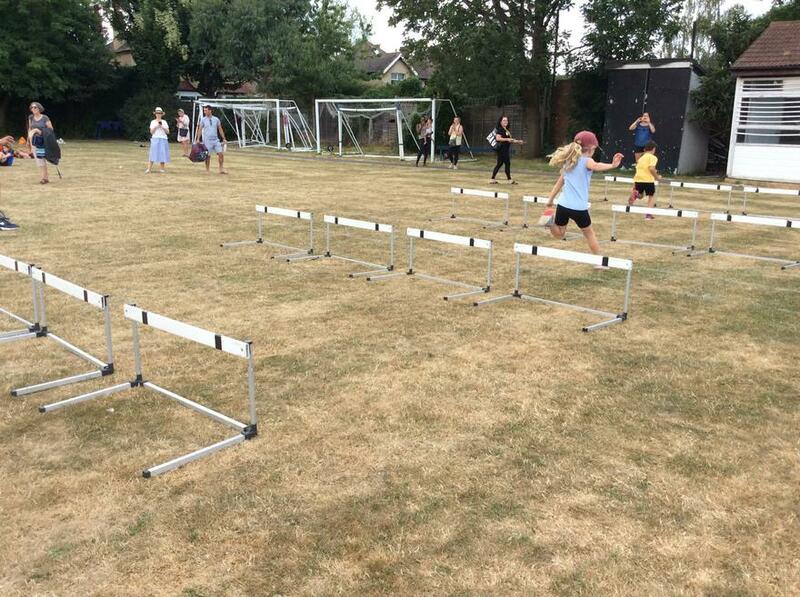 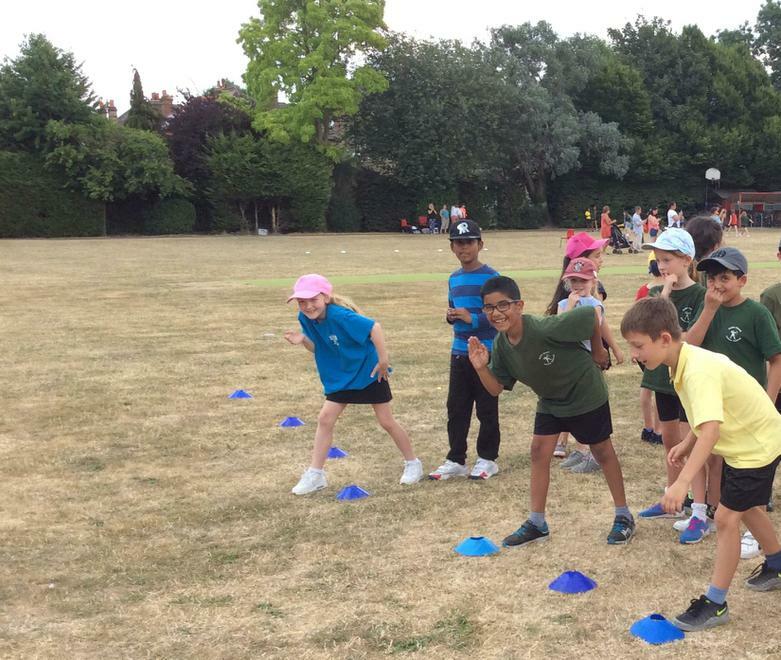 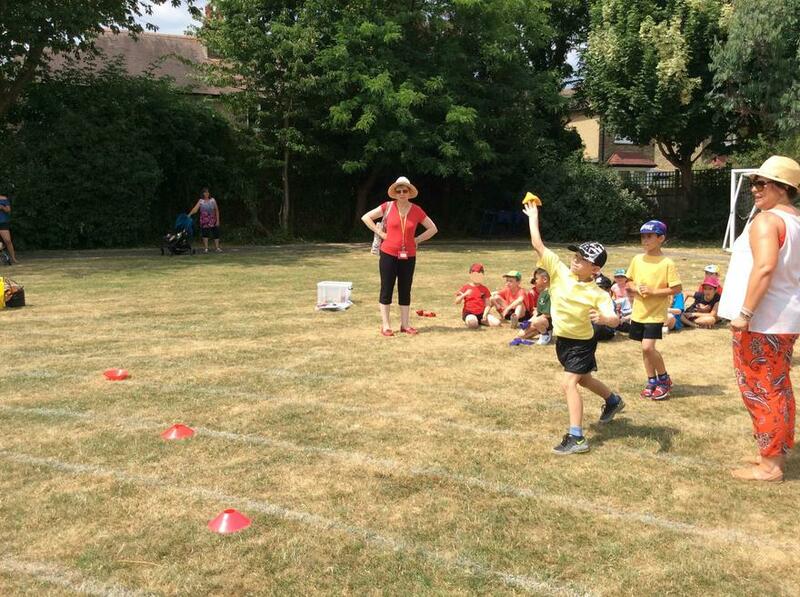 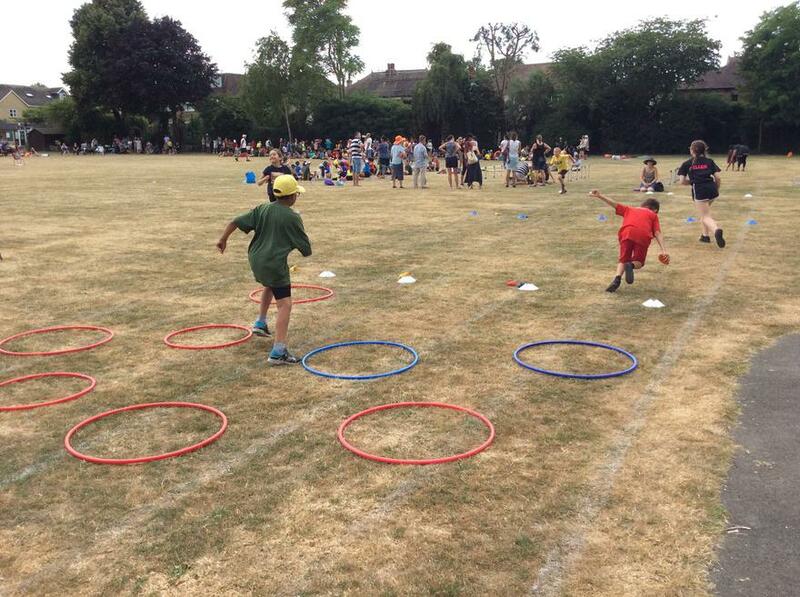 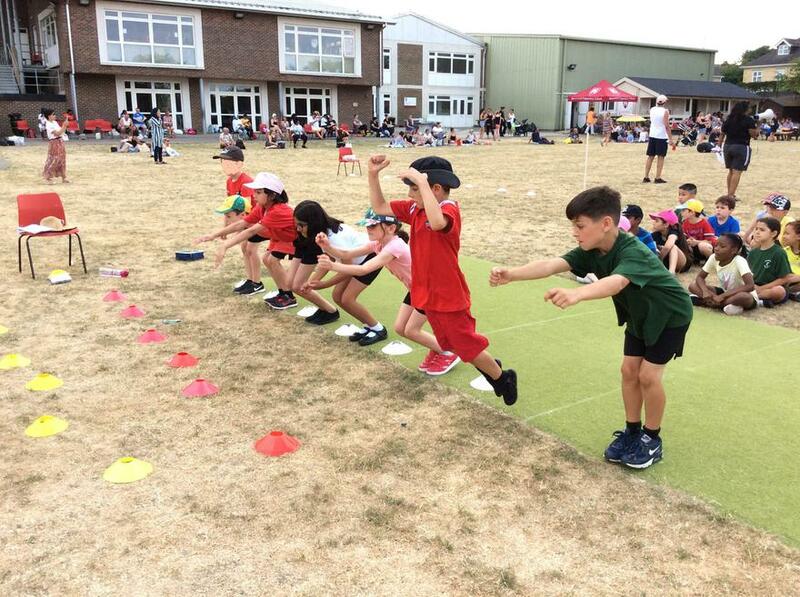 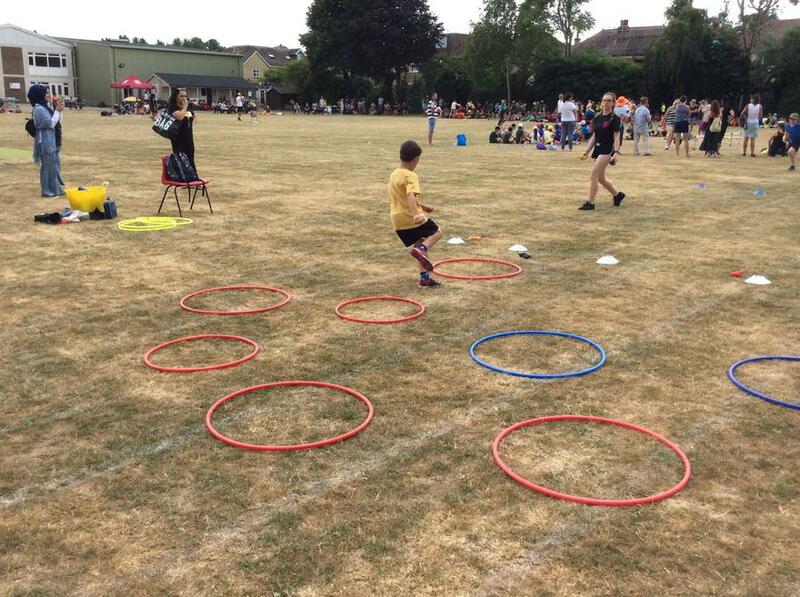 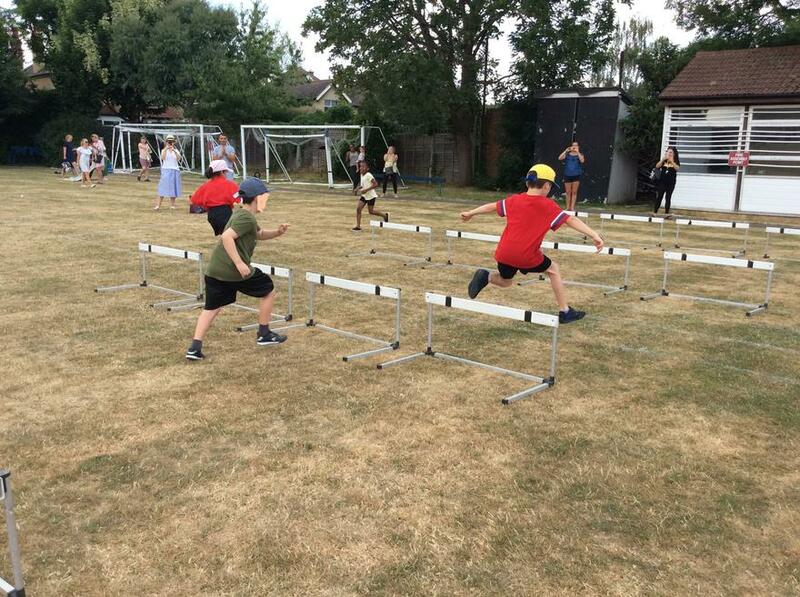 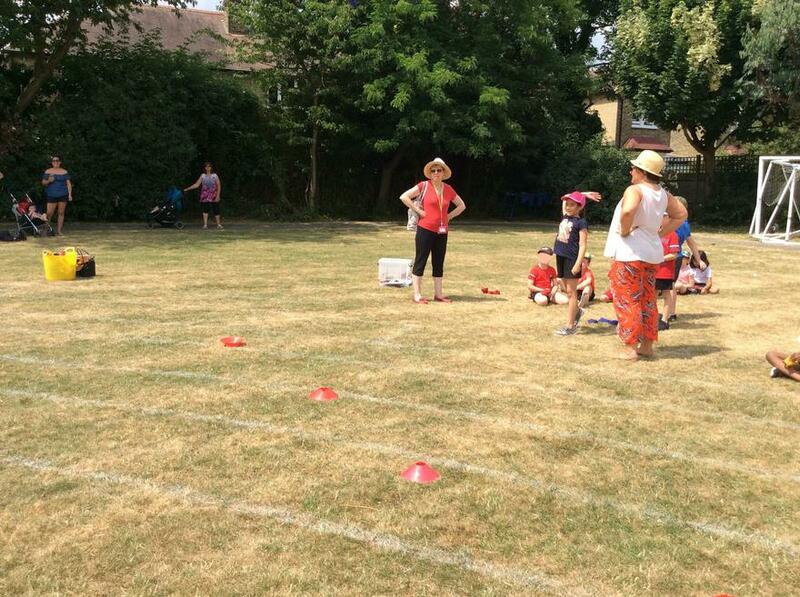 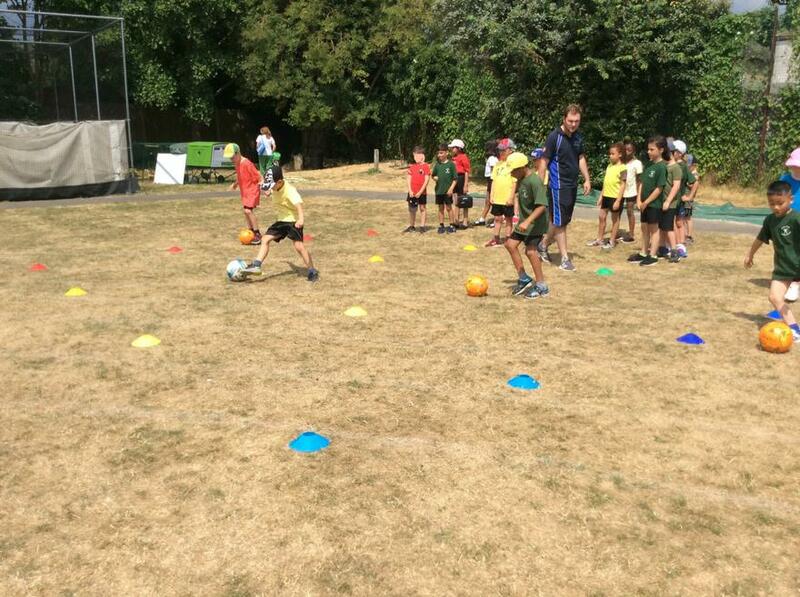 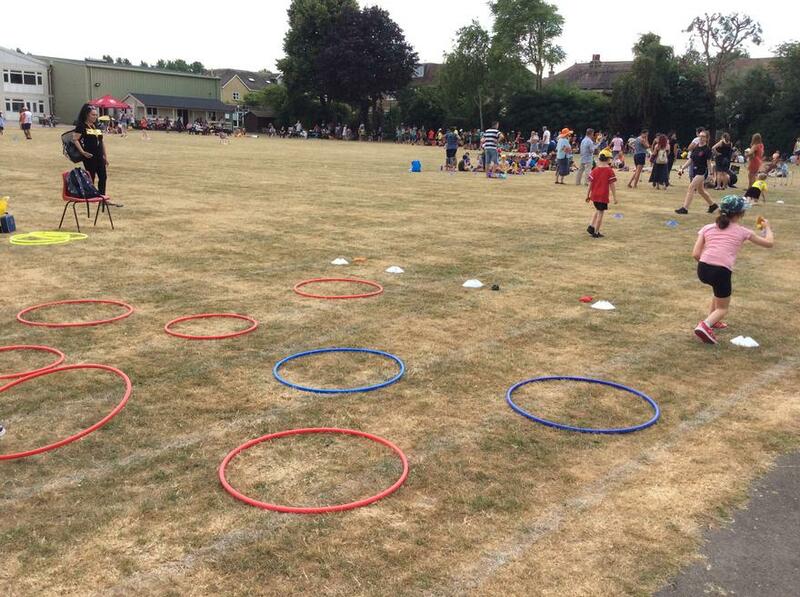 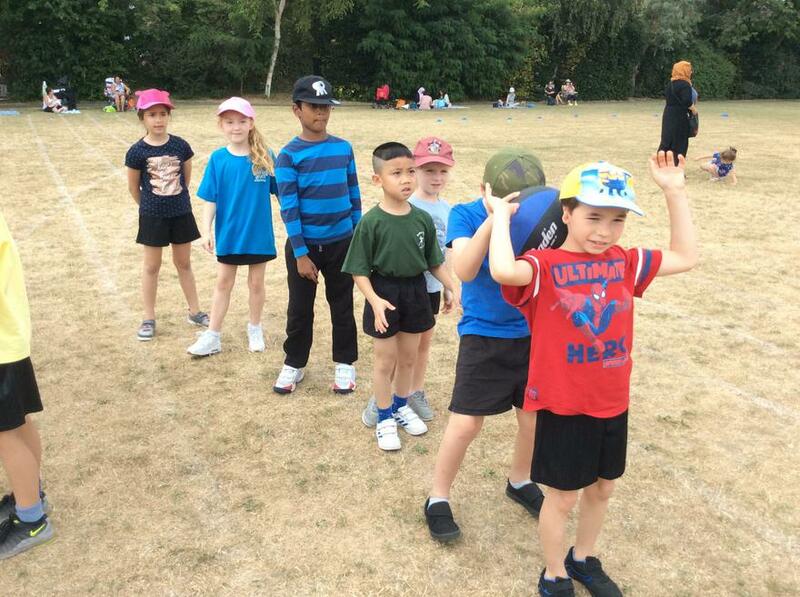 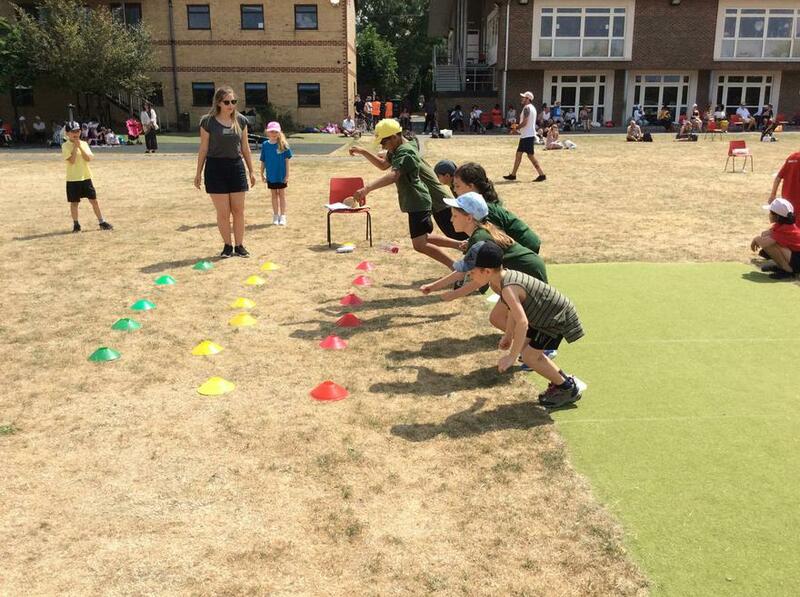 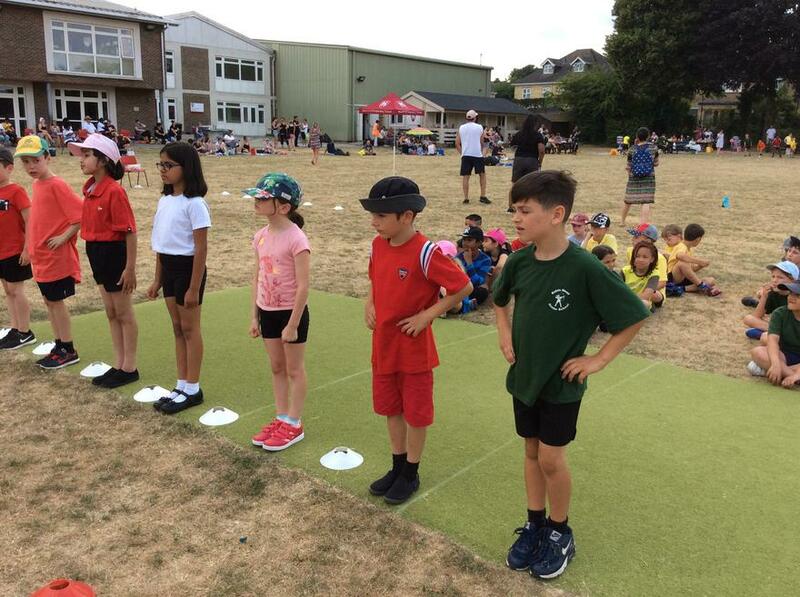 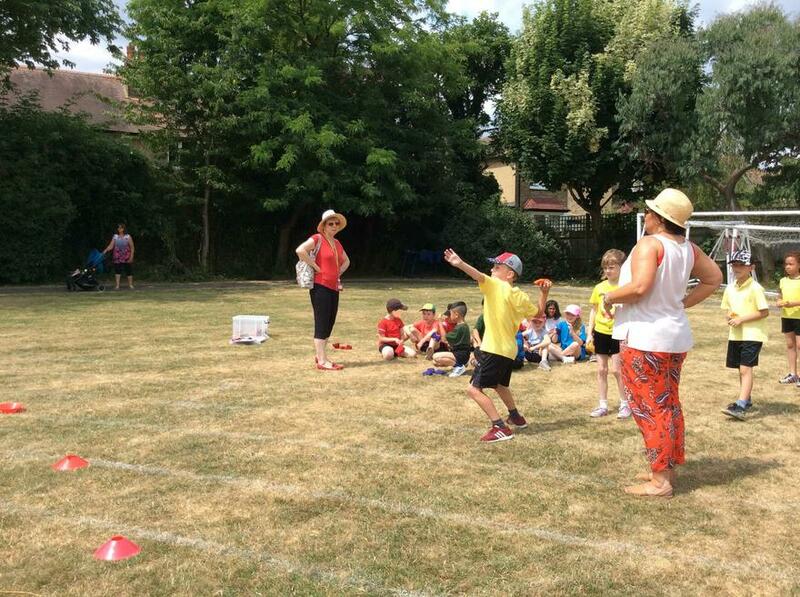 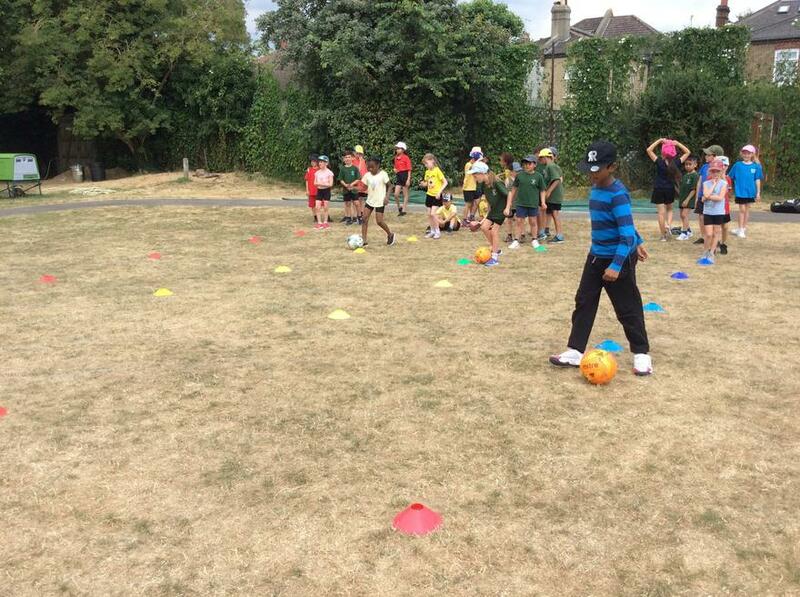 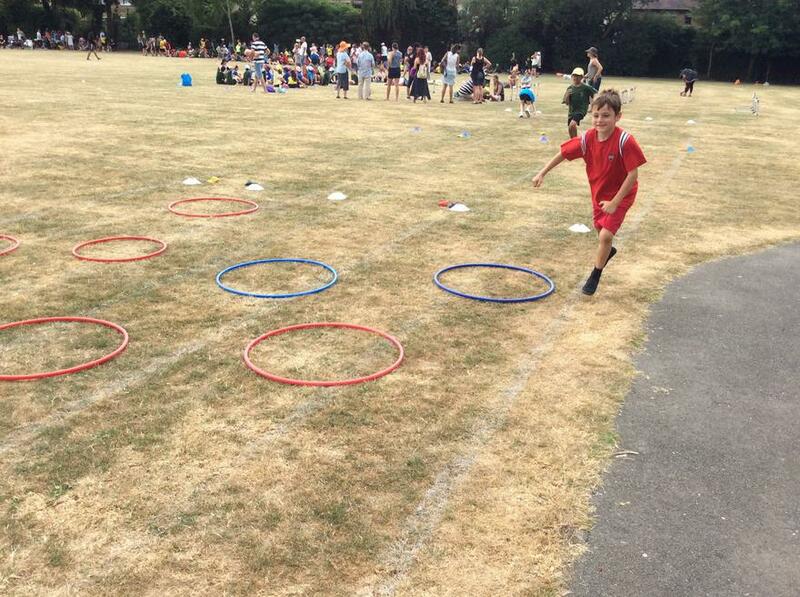 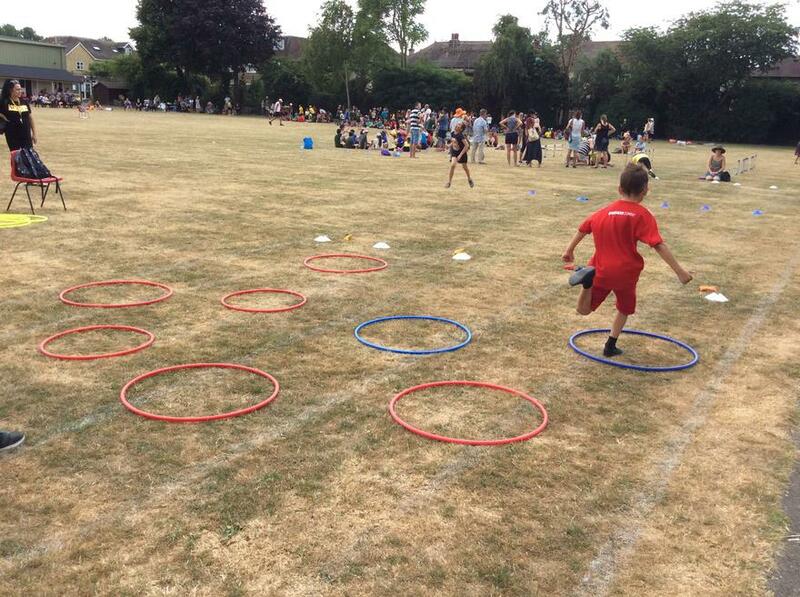 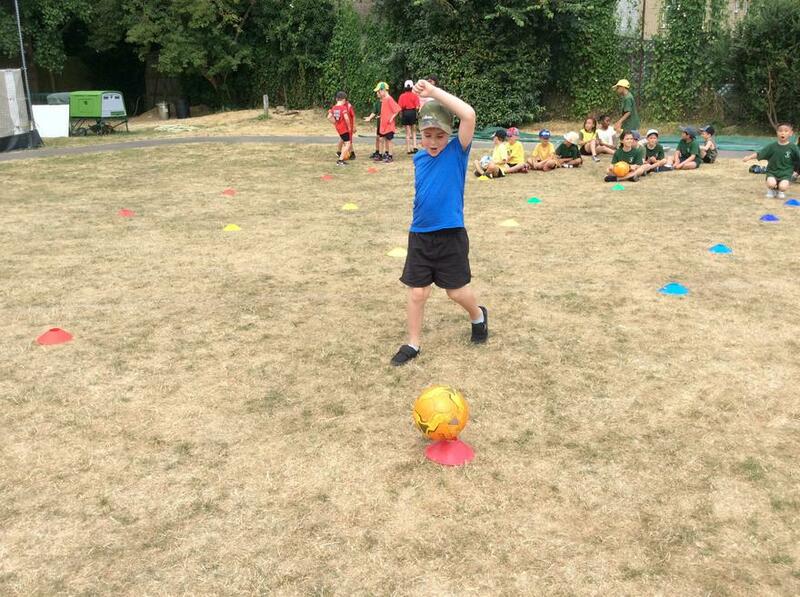 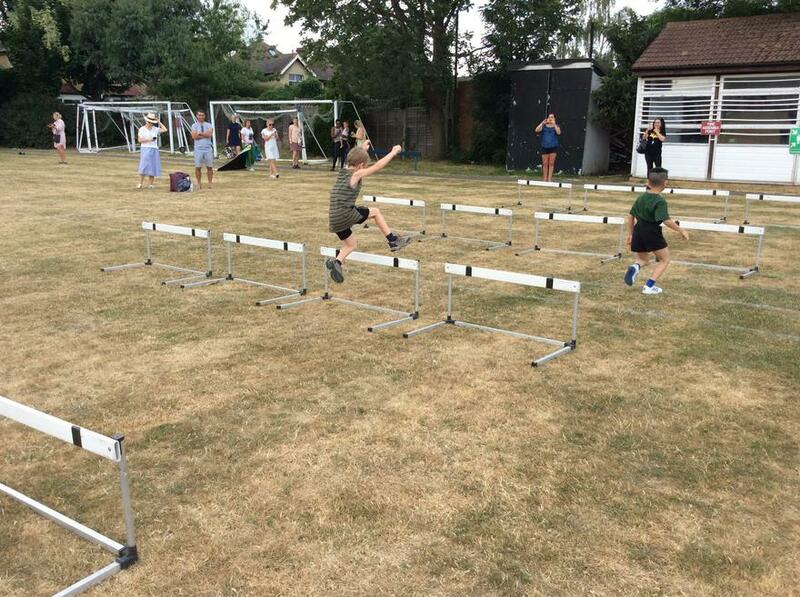 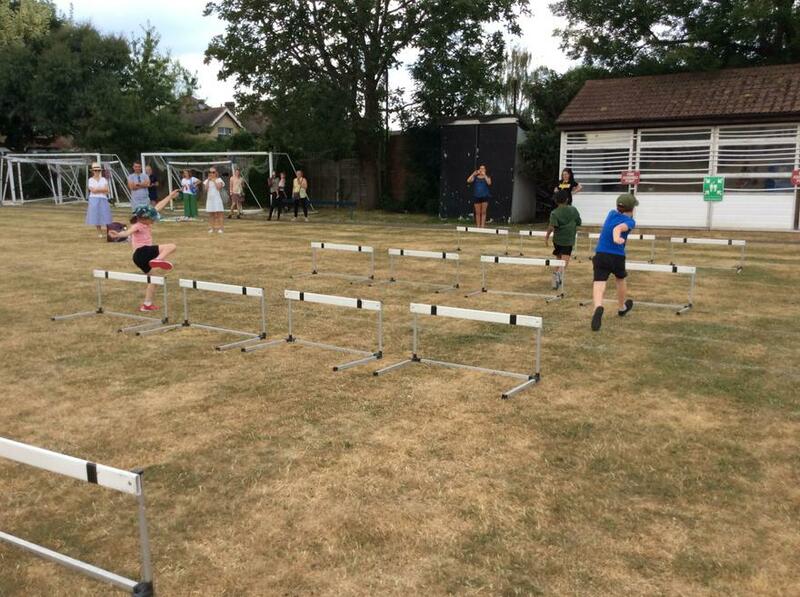 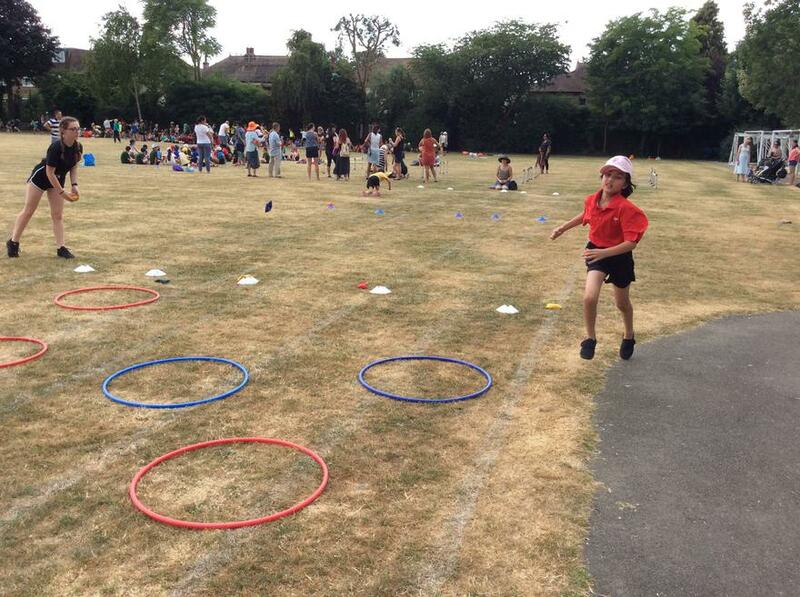 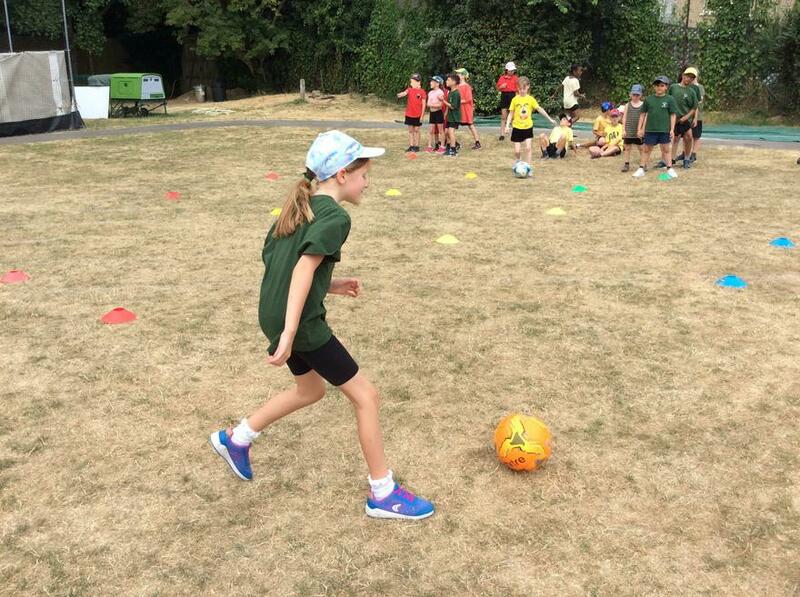 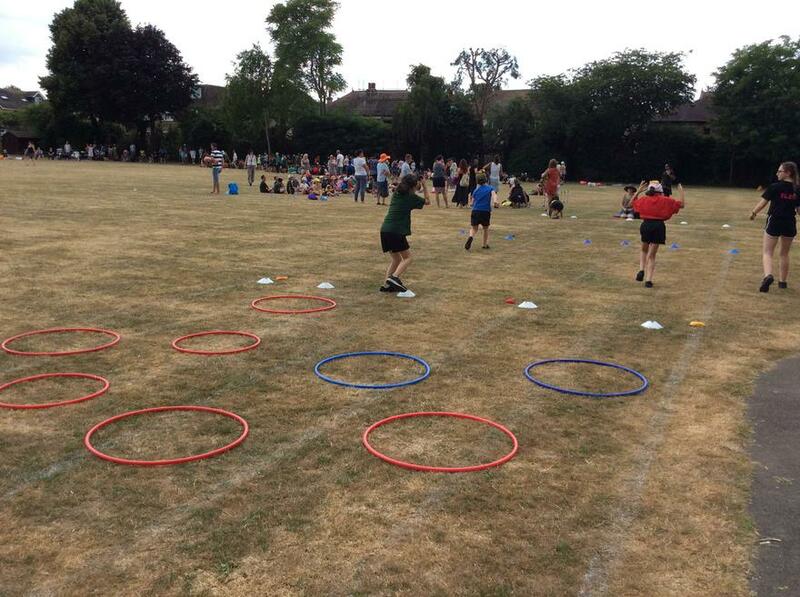 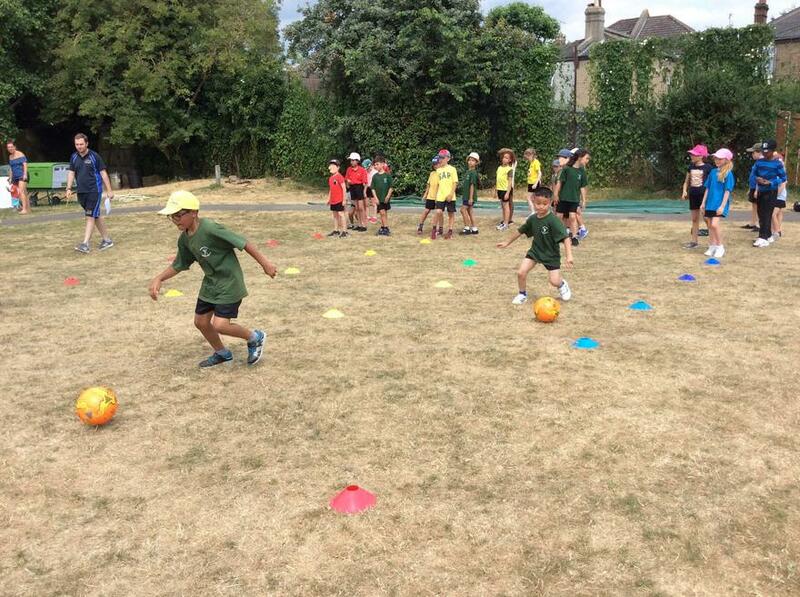 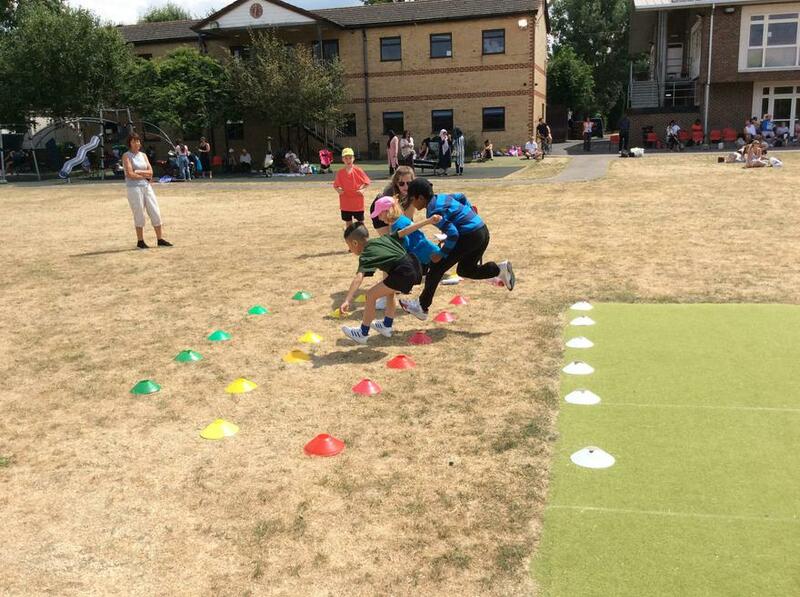 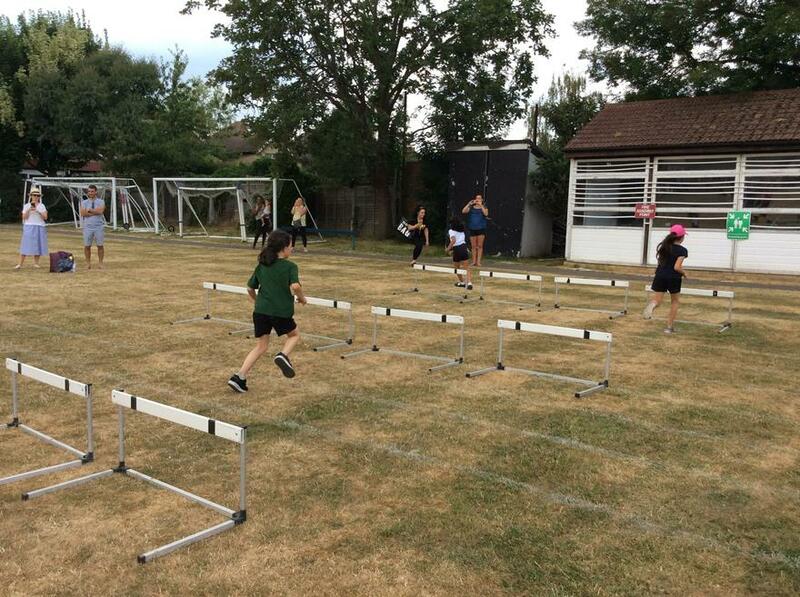 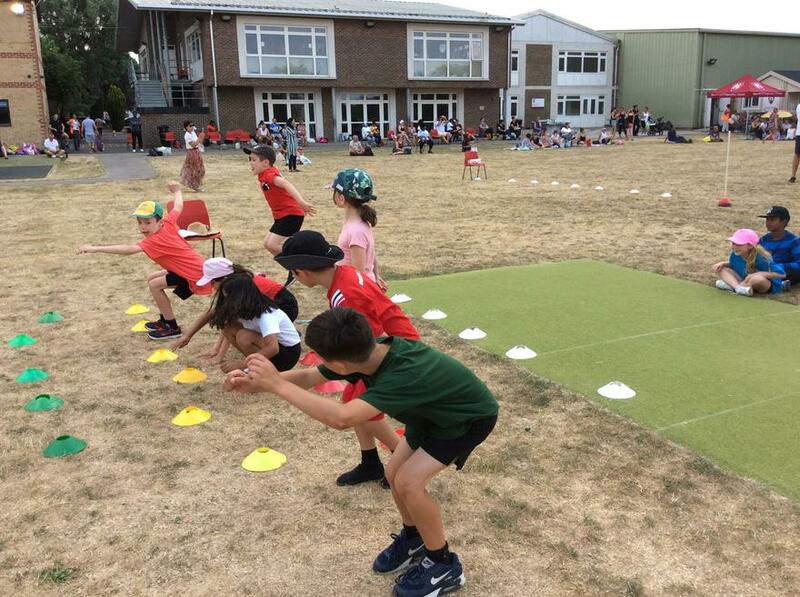 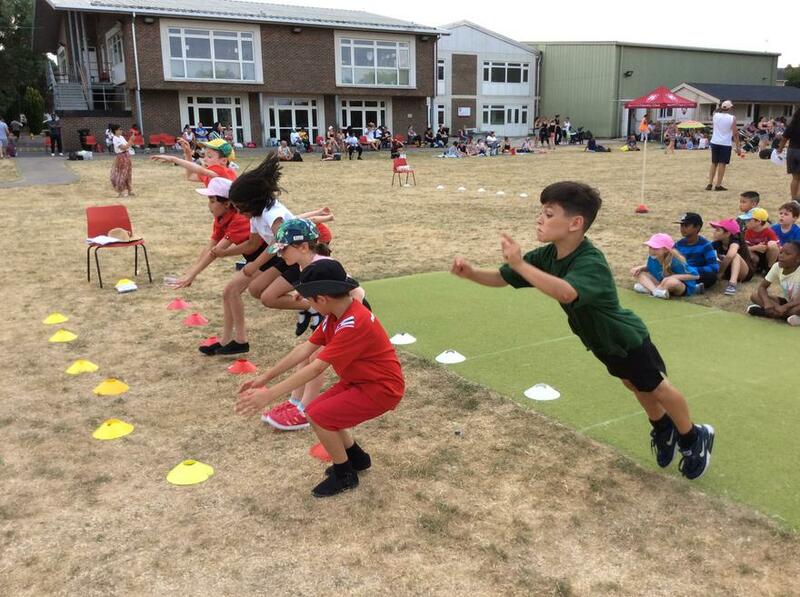 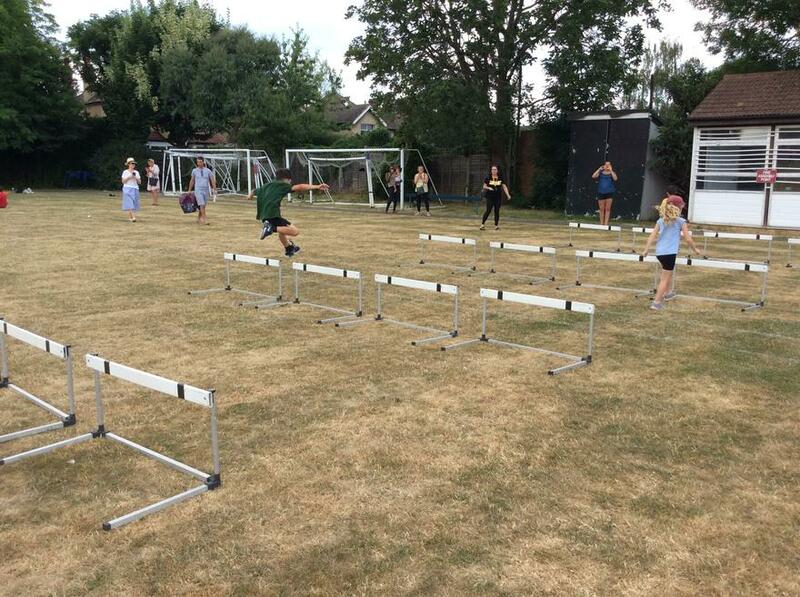 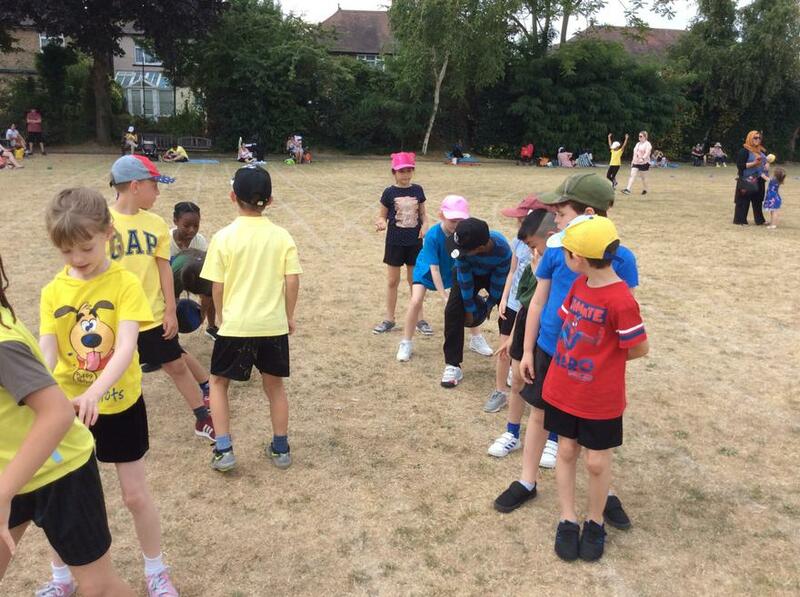 This week the whole school had our Sports Day! 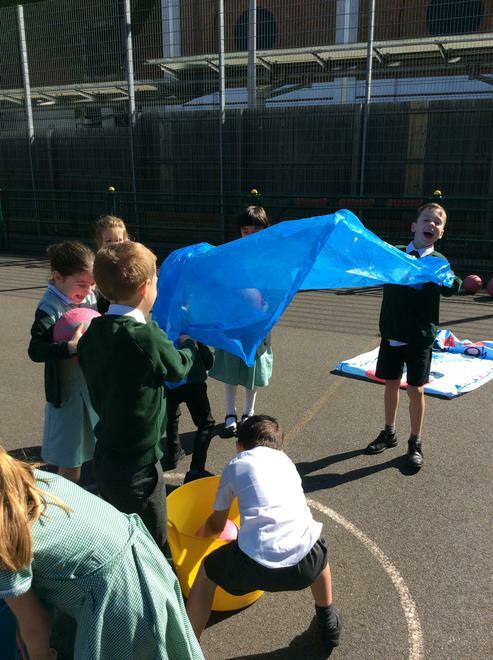 Year 3 were lucky enough to go swimming in the morning and then we joined the rest of the school for more sports activities after! 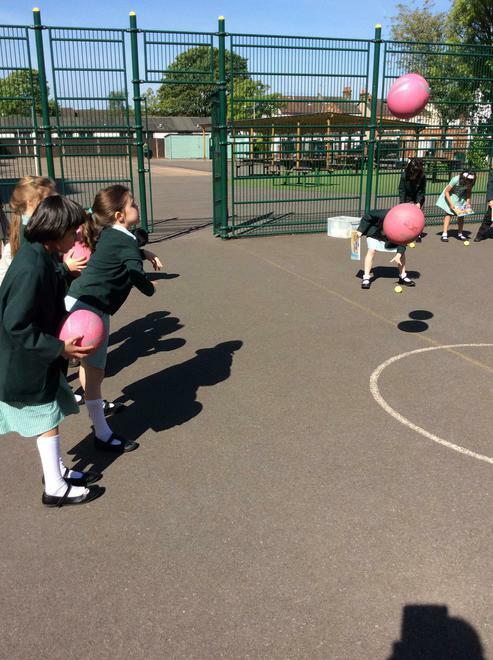 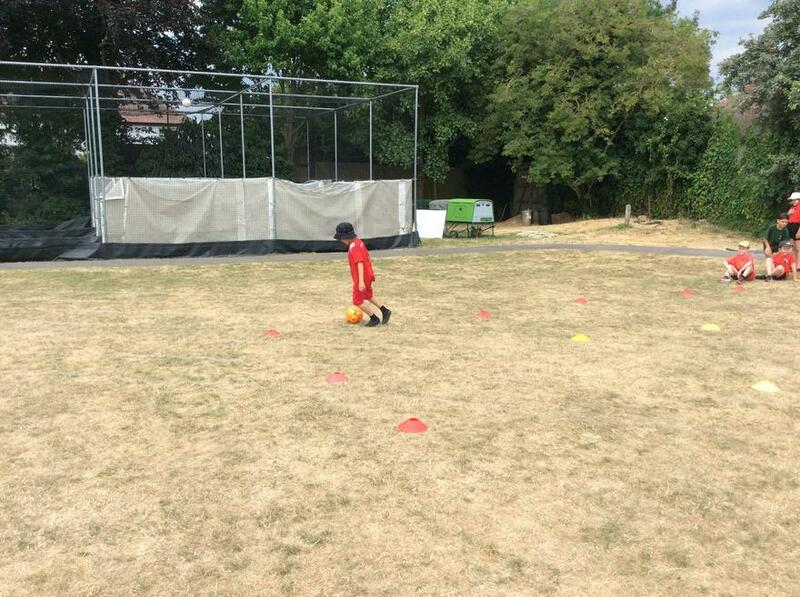 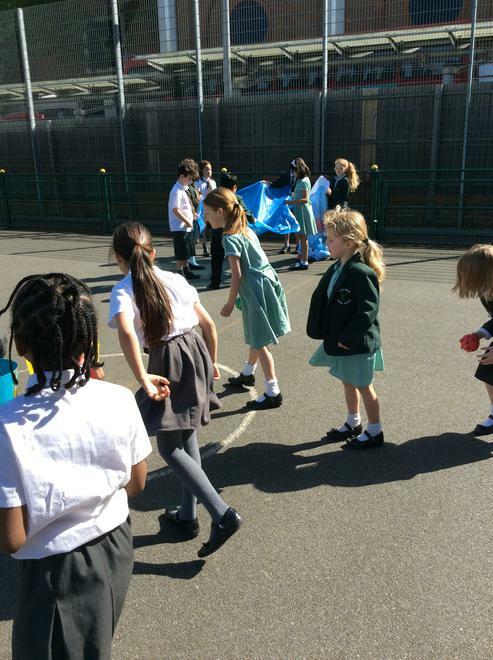 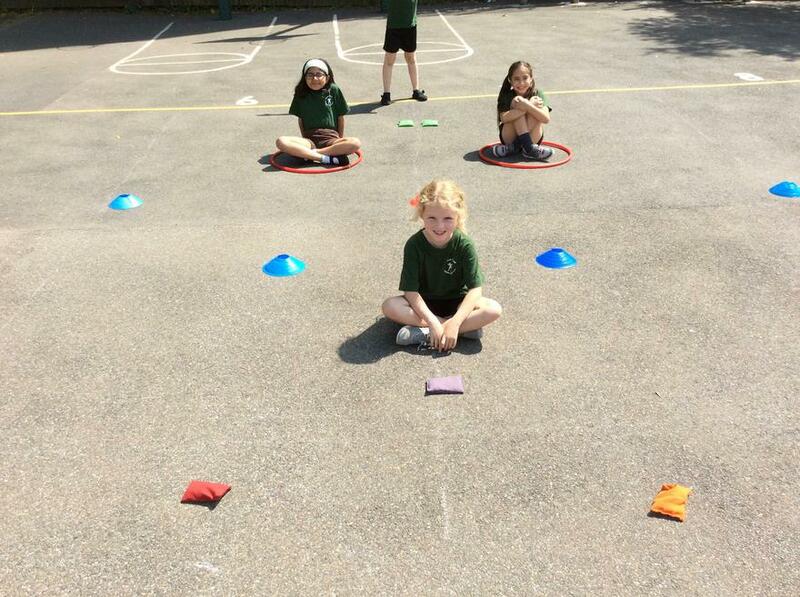 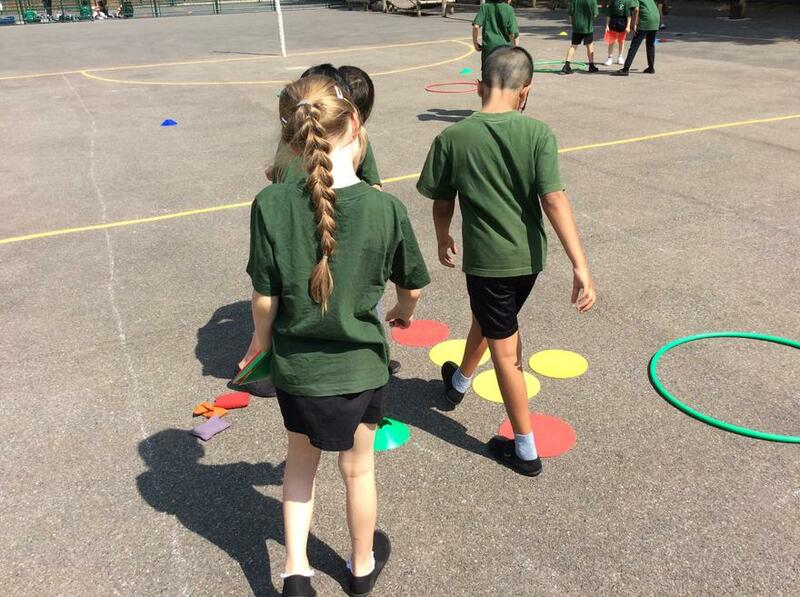 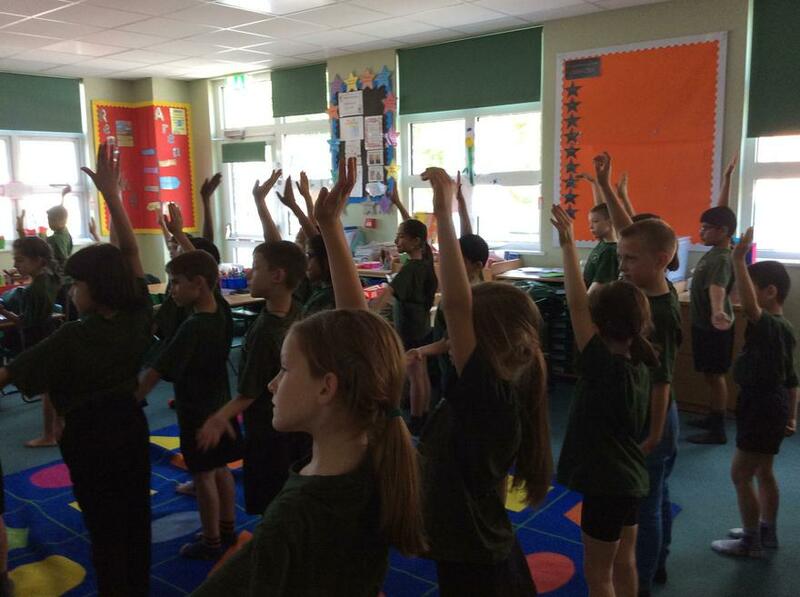 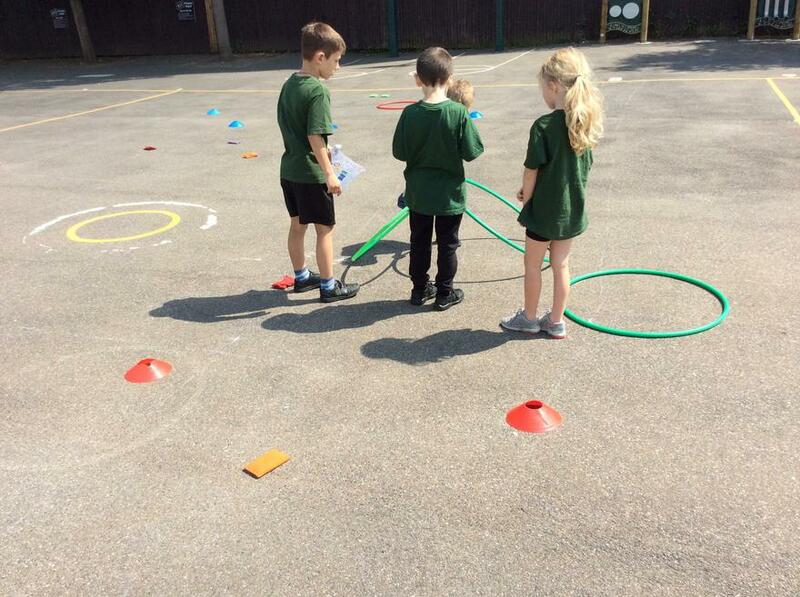 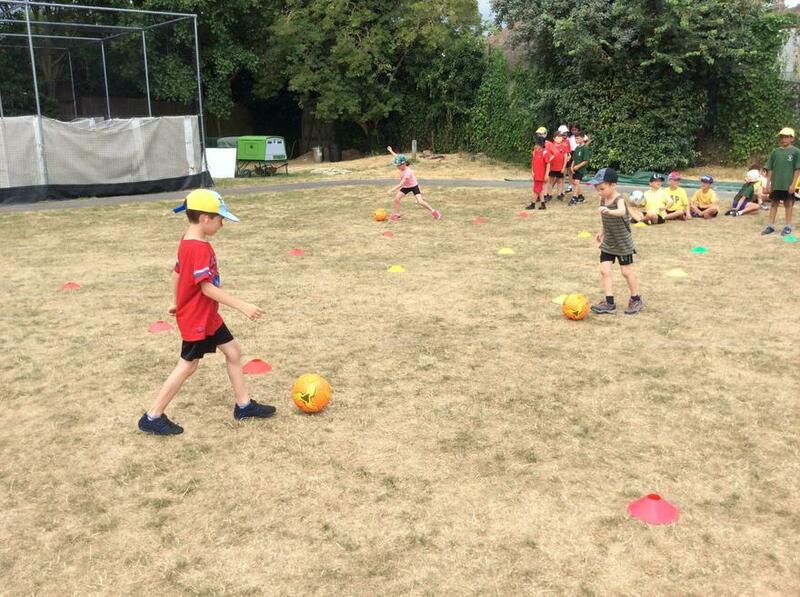 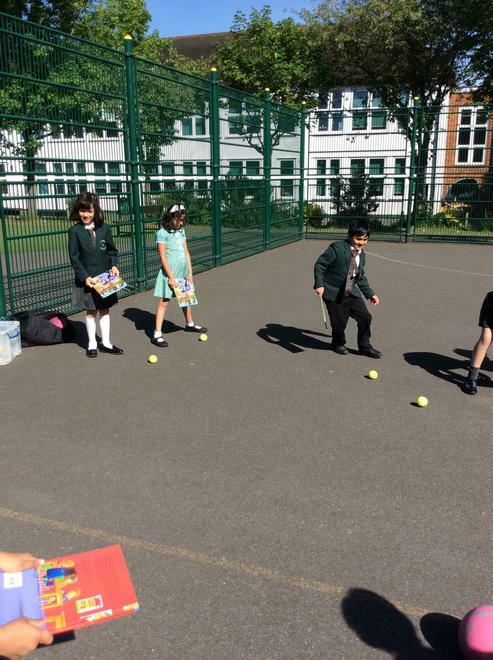 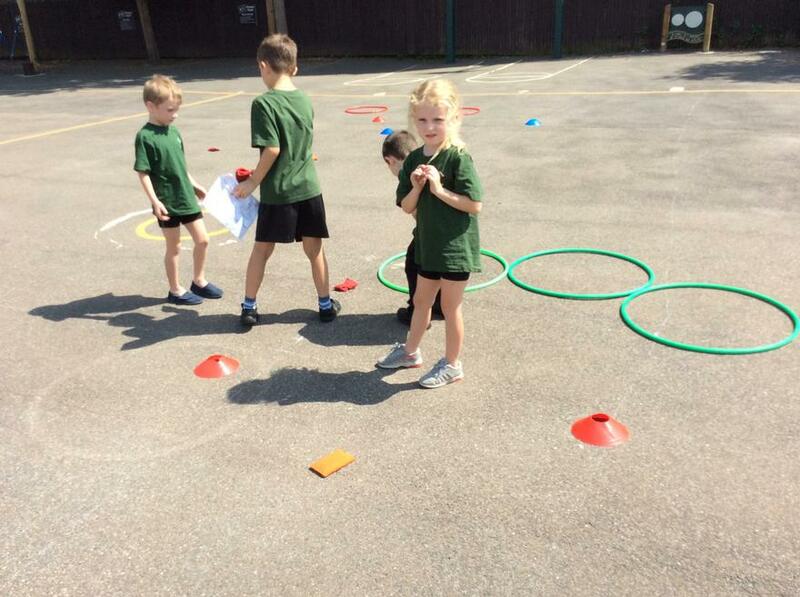 We had a great time participating in all the different activities as a class, even with the hot weather! 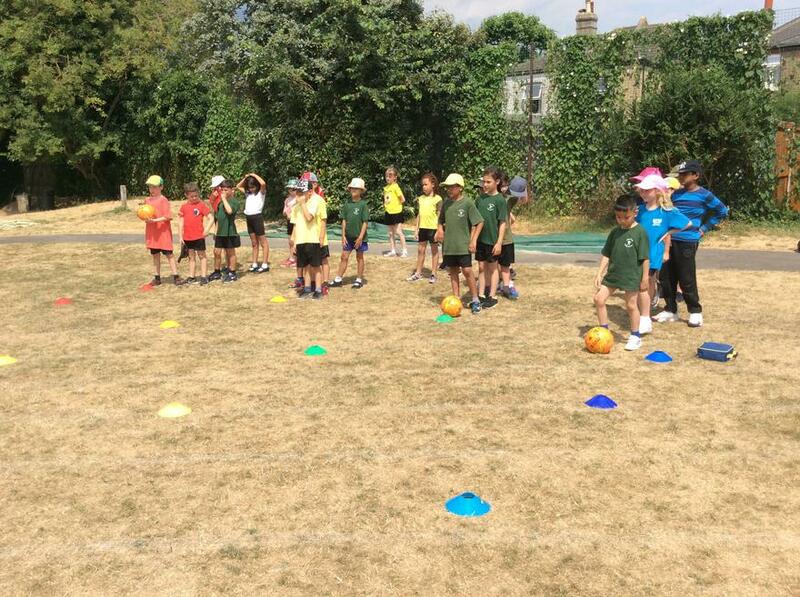 All the teams showed great resilience and sportsmanship throughout the whole day. 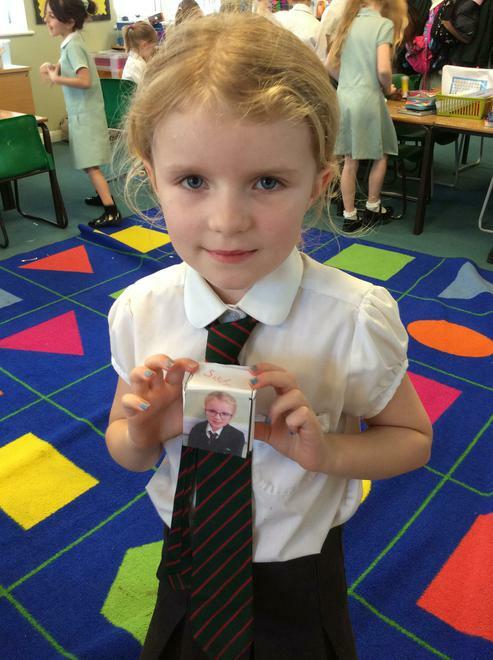 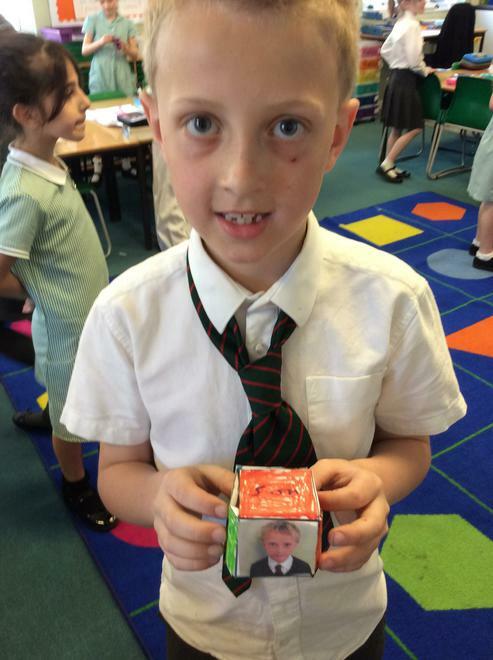 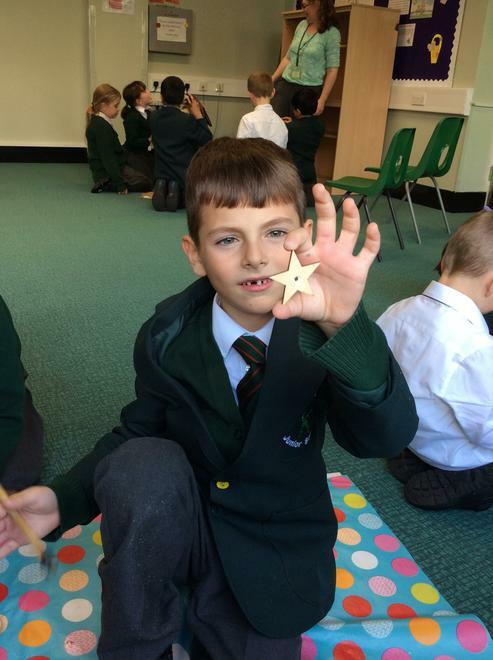 Well done Elm Class! 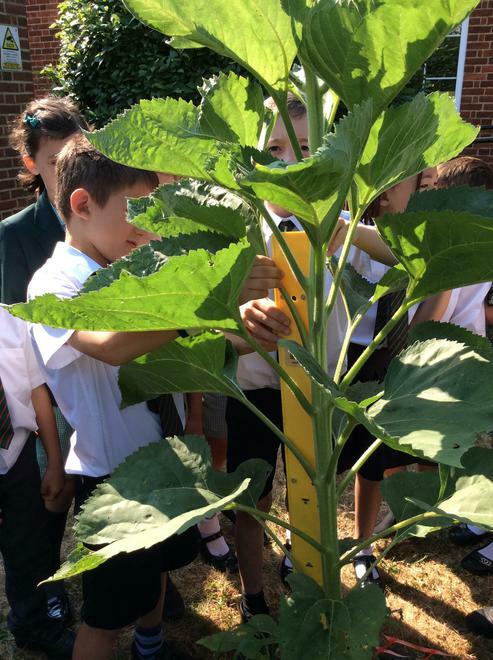 Today we went back outside to see how much our sunflowers had grown. 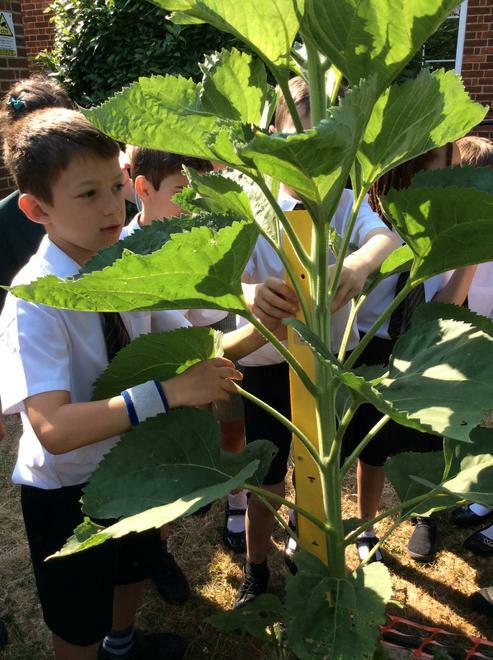 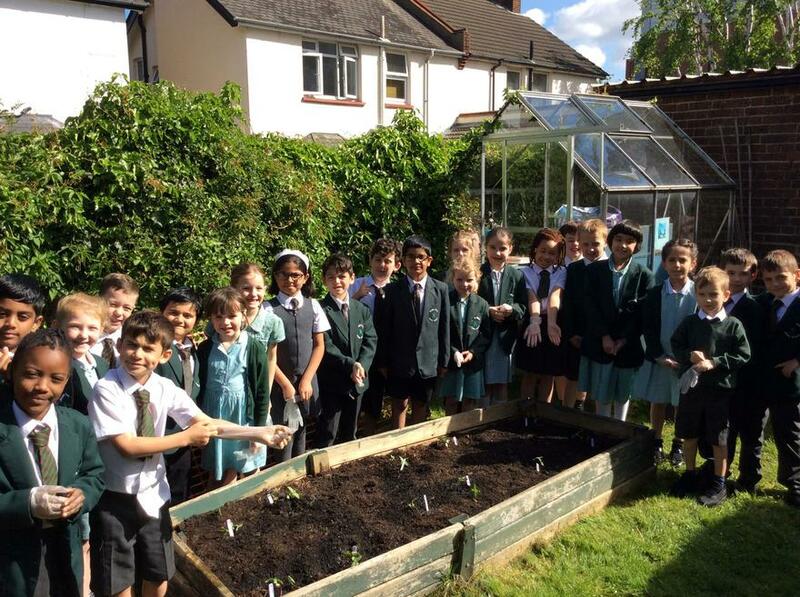 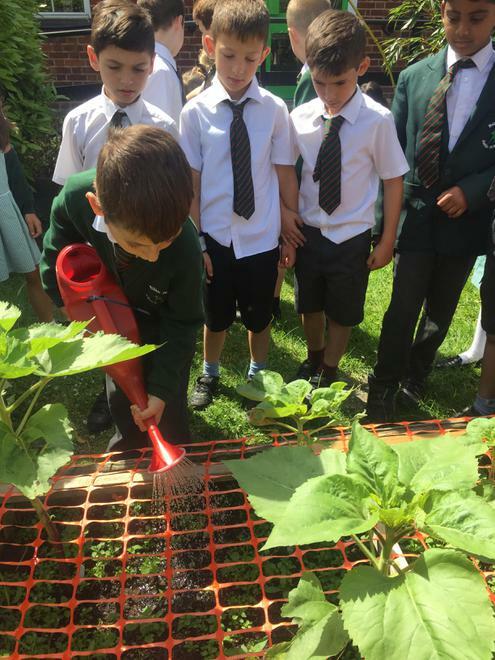 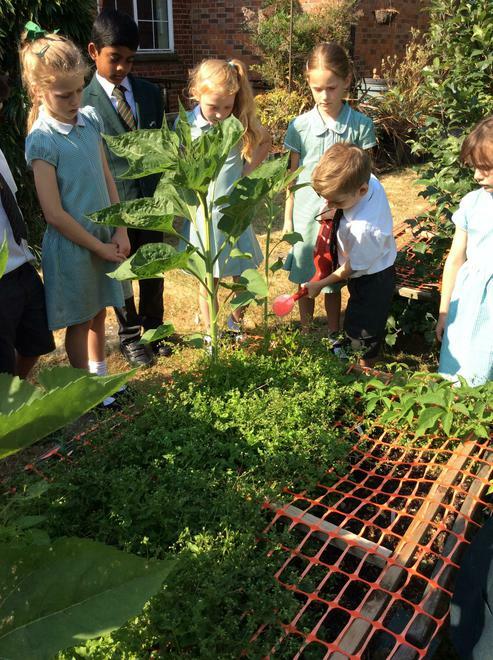 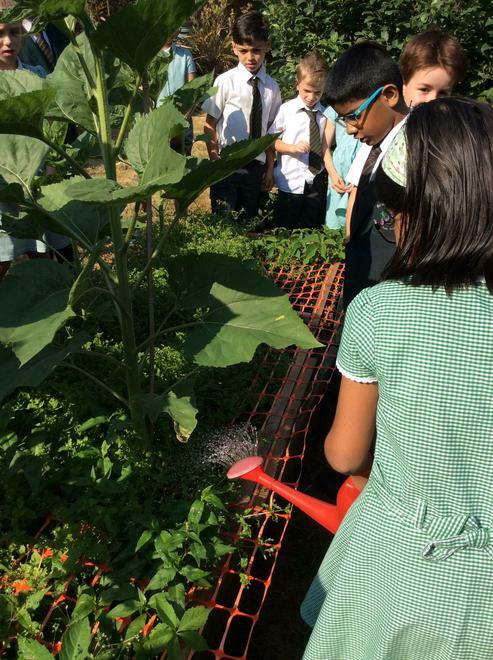 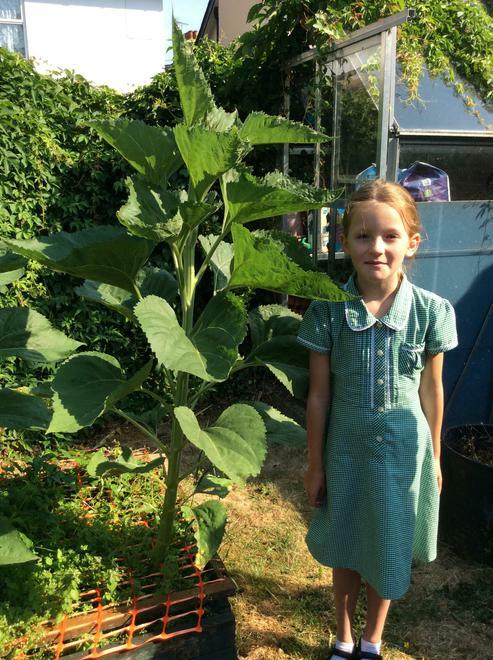 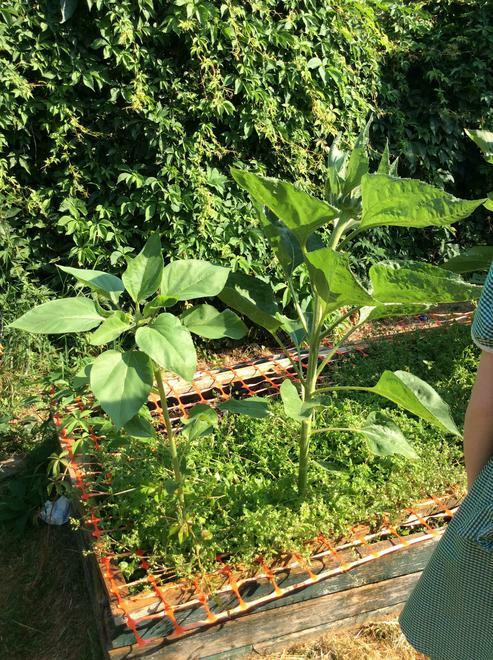 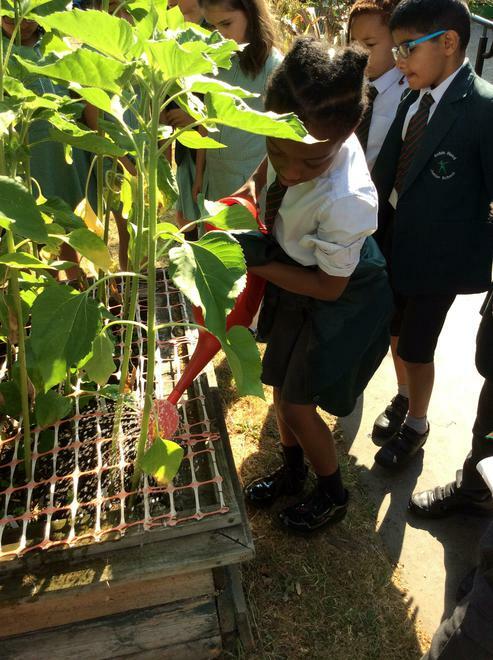 As you can see, some of the sunflowers are now taller than the children! 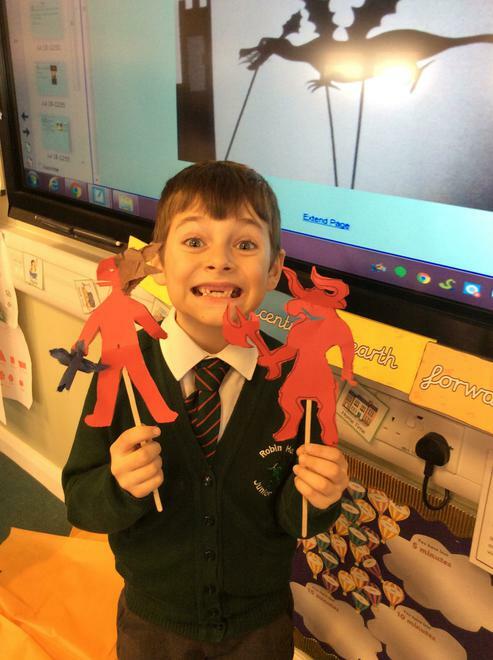 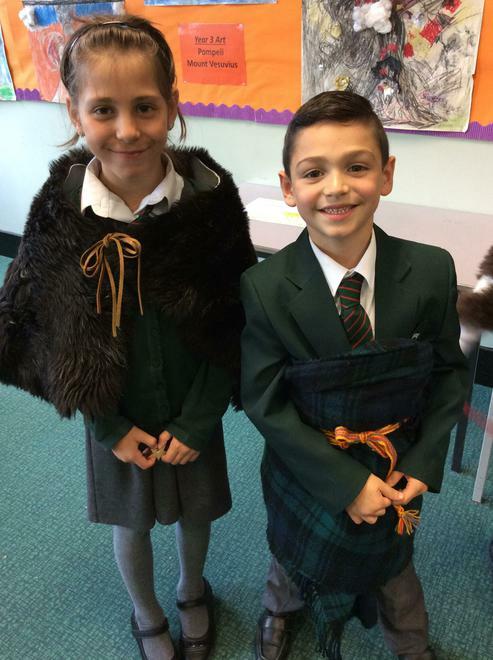 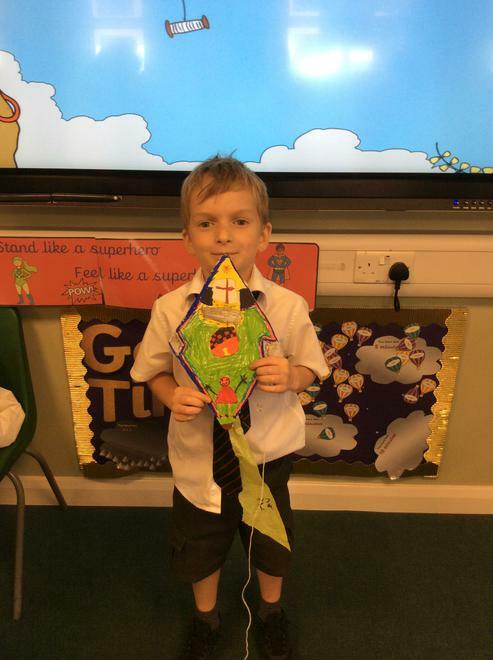 This week in Topic we have been learning all about the Battle of Hastings. 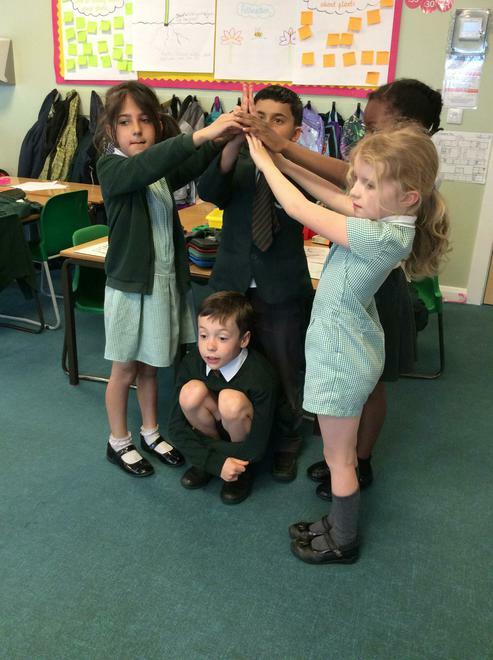 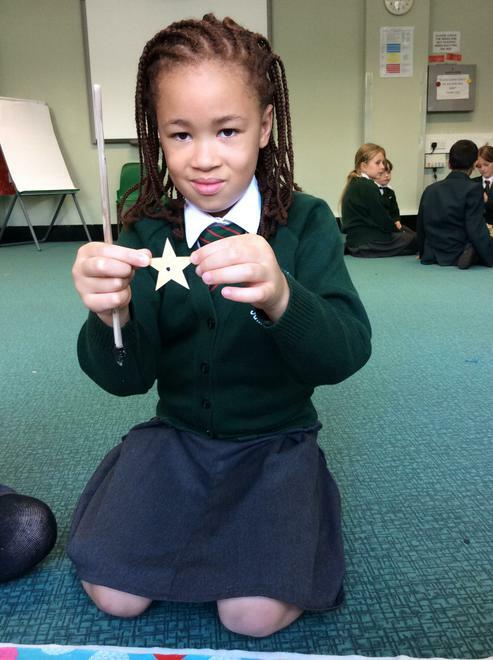 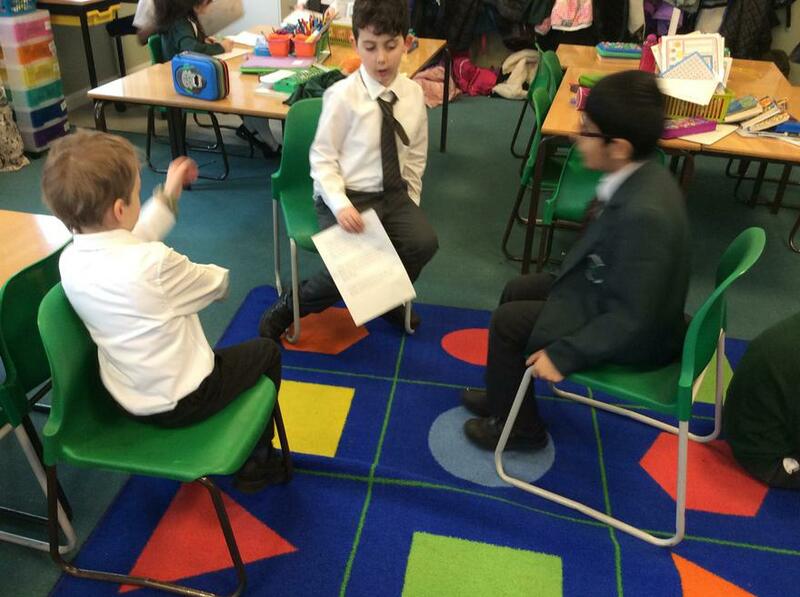 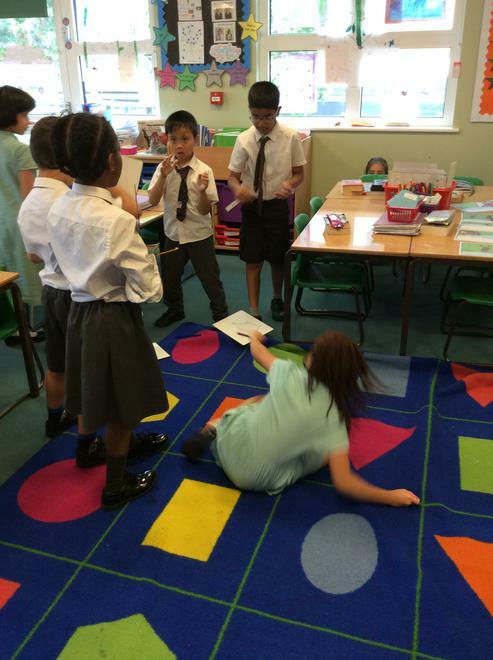 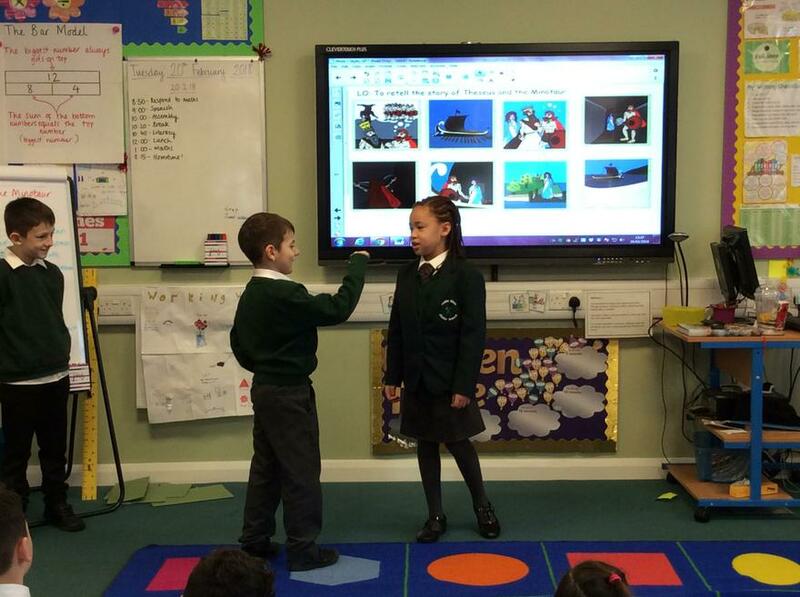 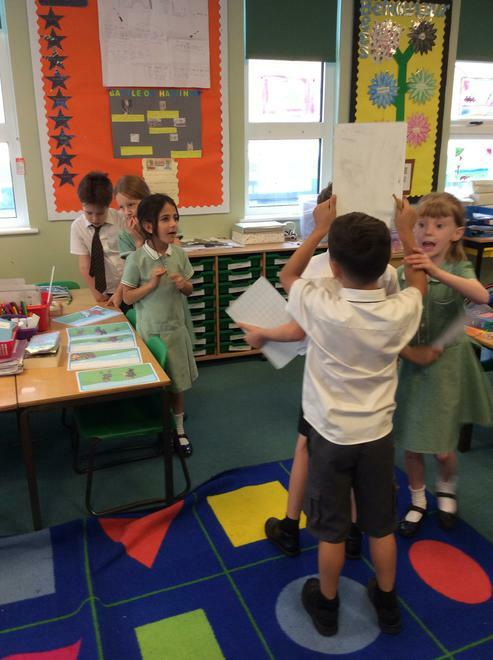 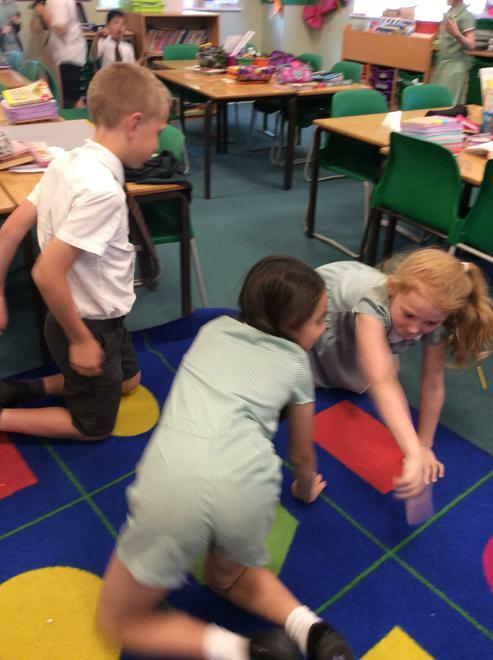 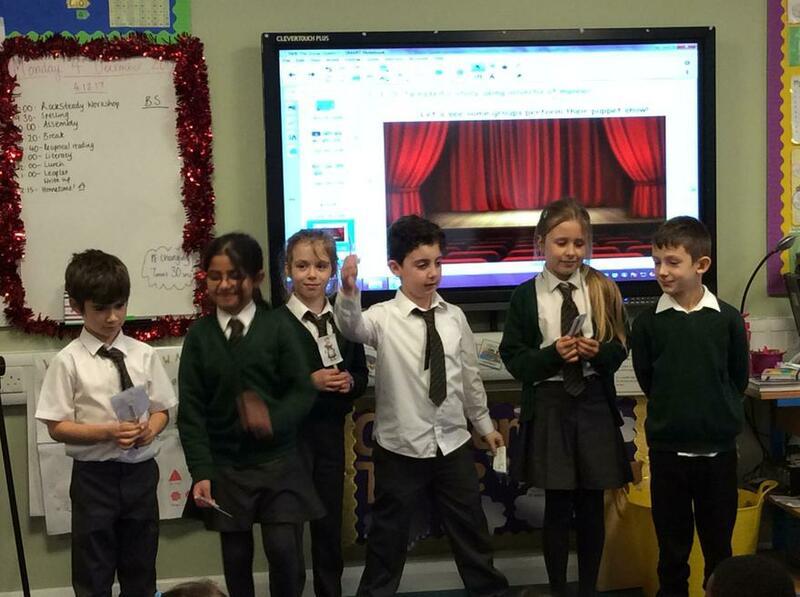 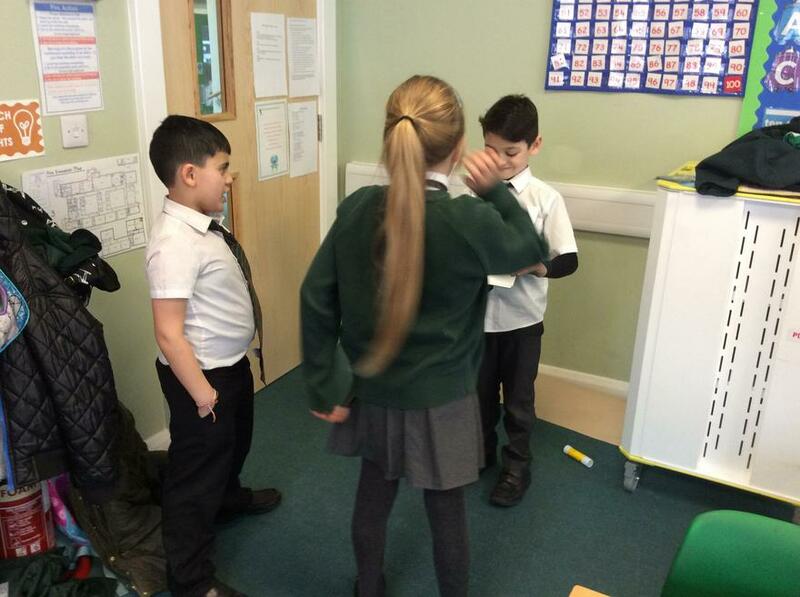 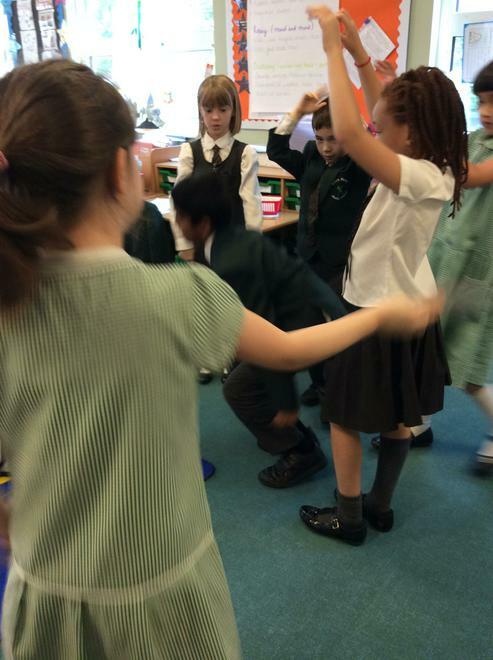 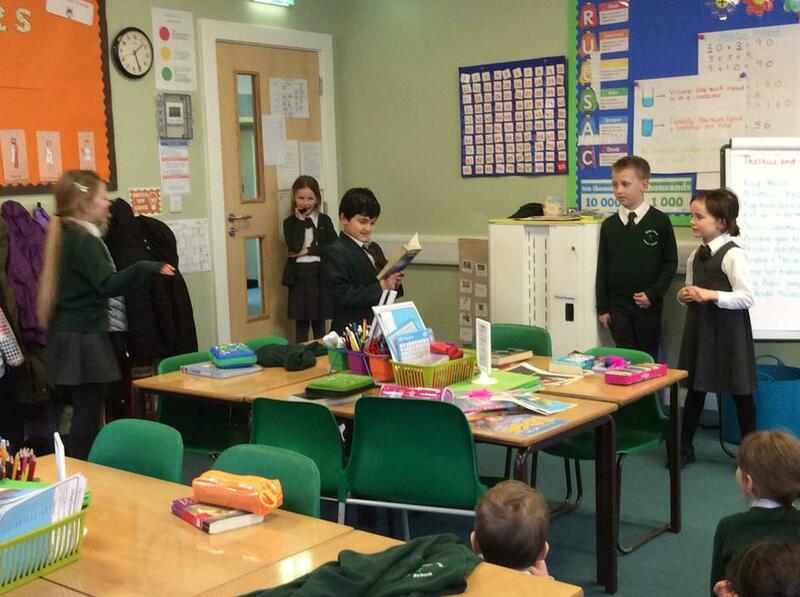 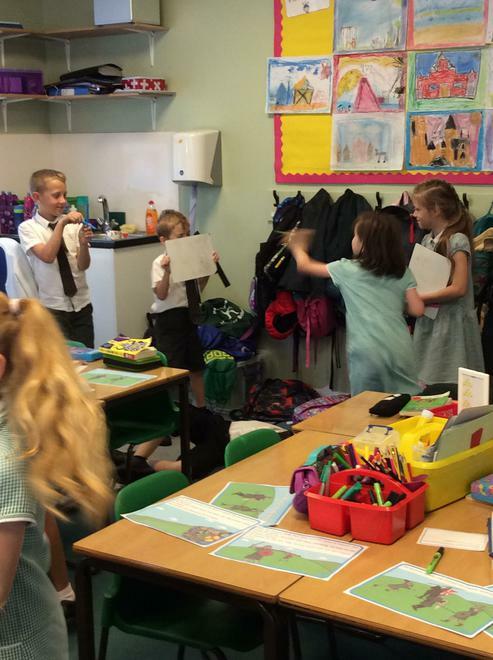 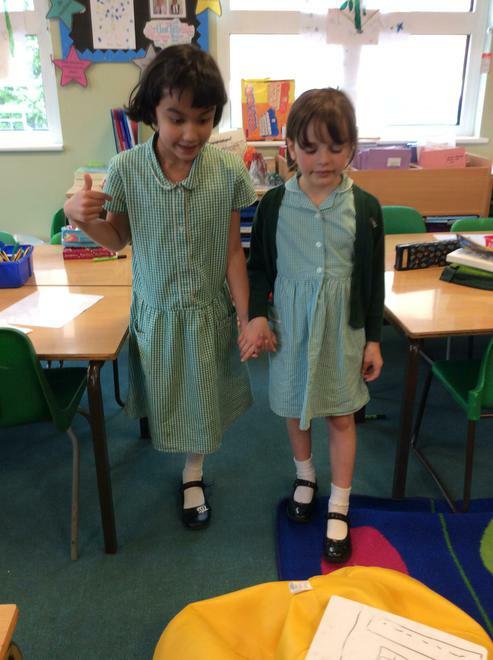 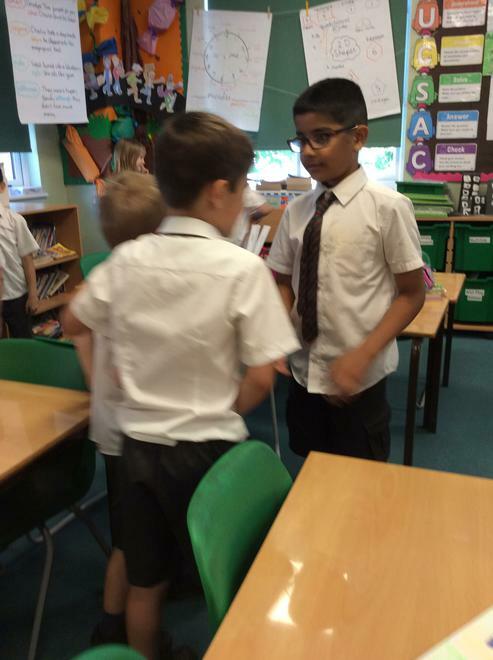 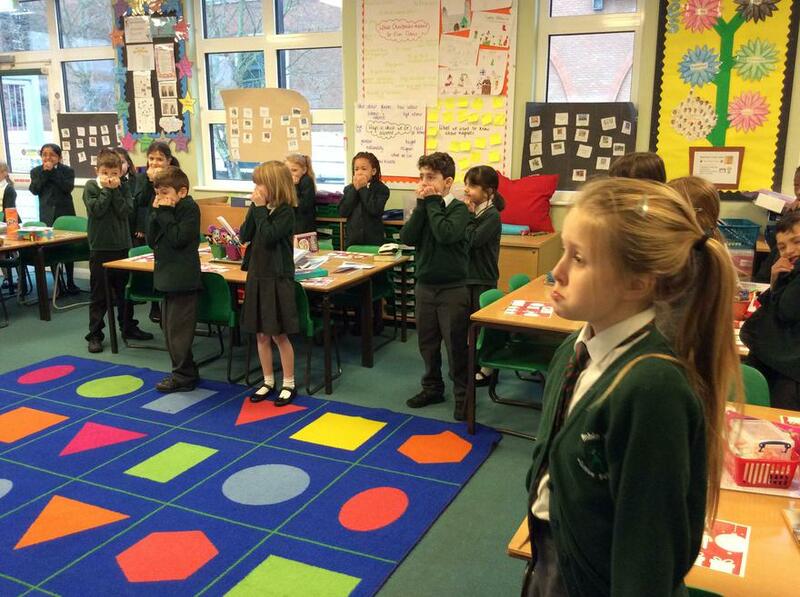 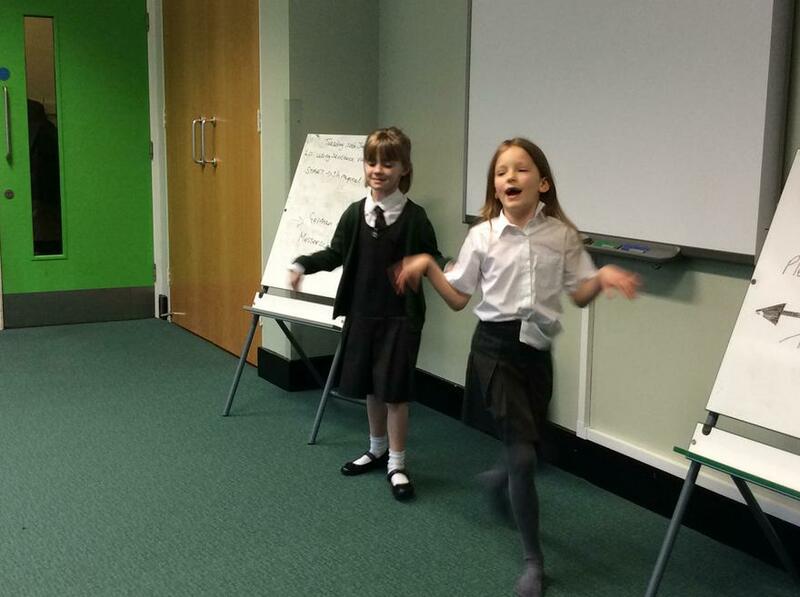 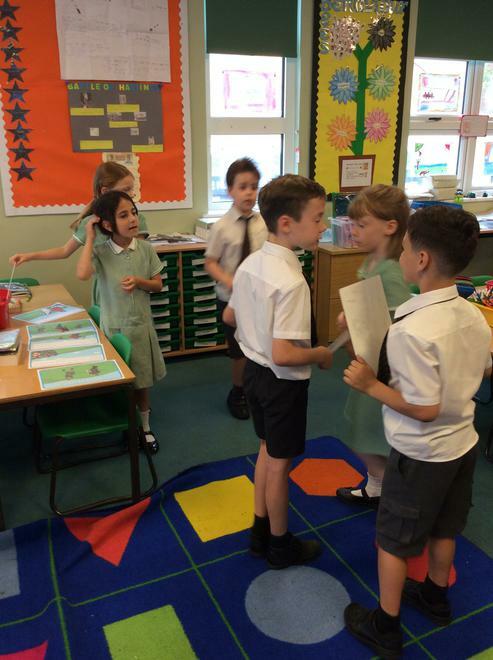 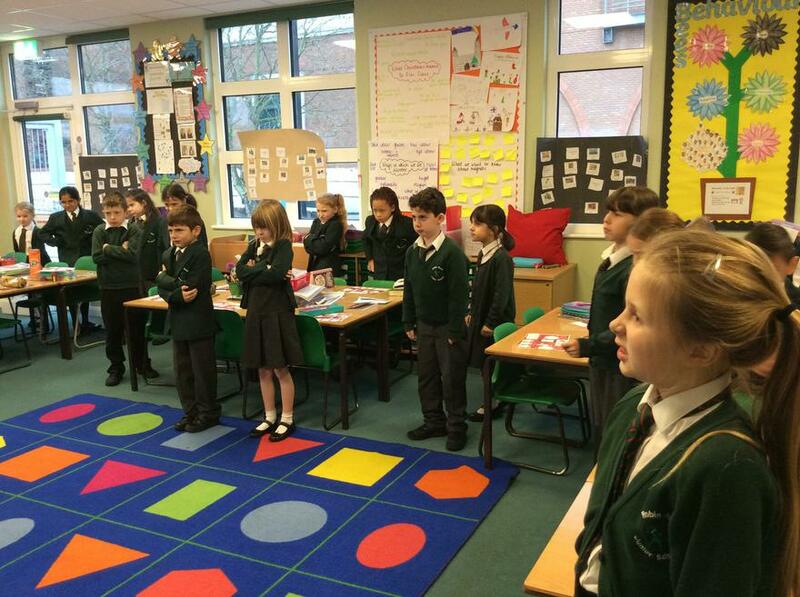 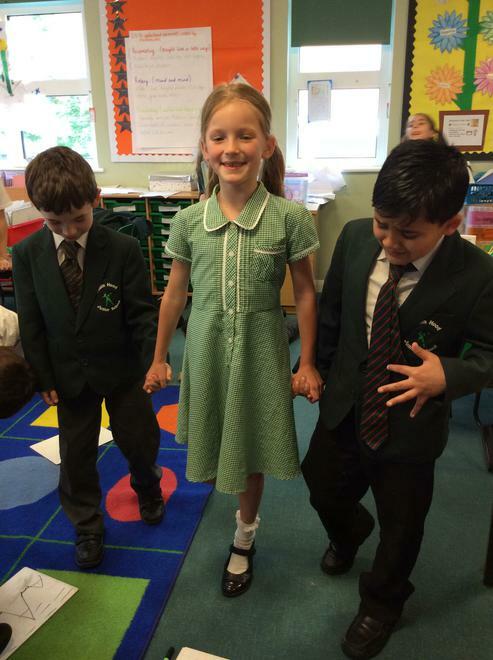 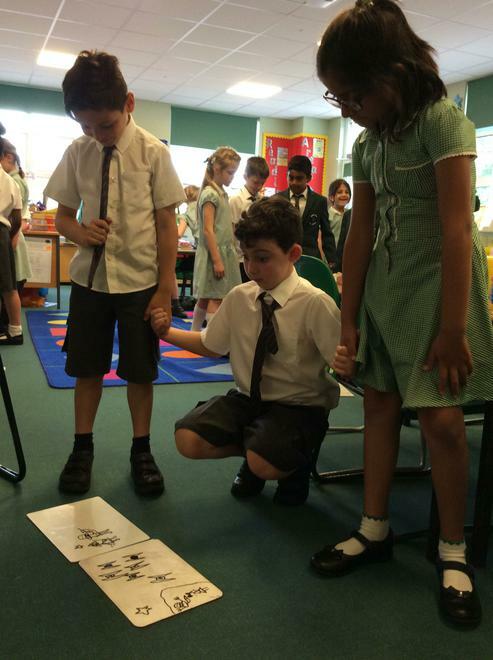 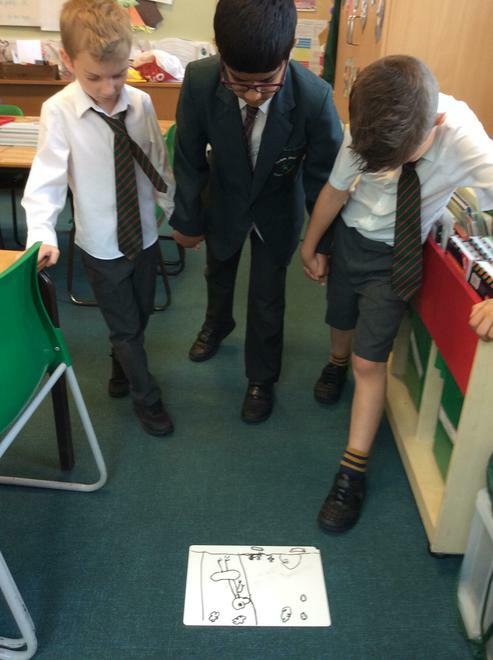 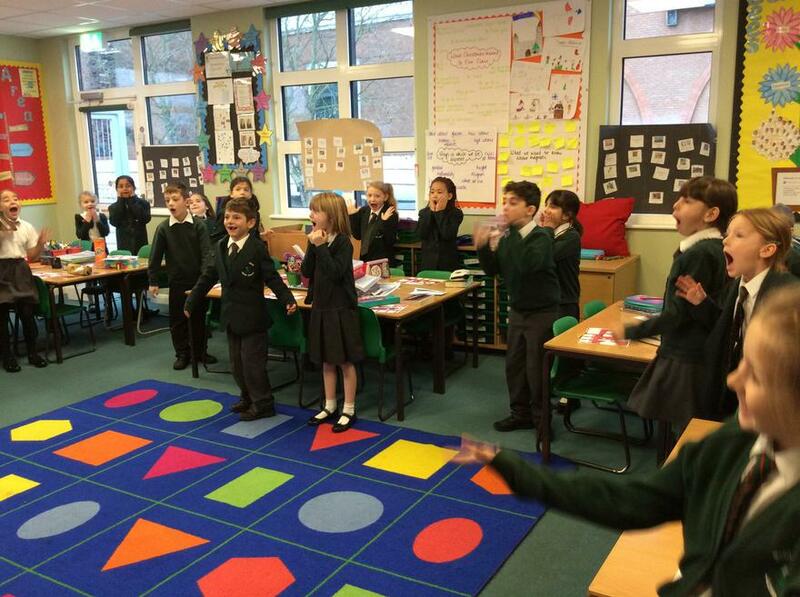 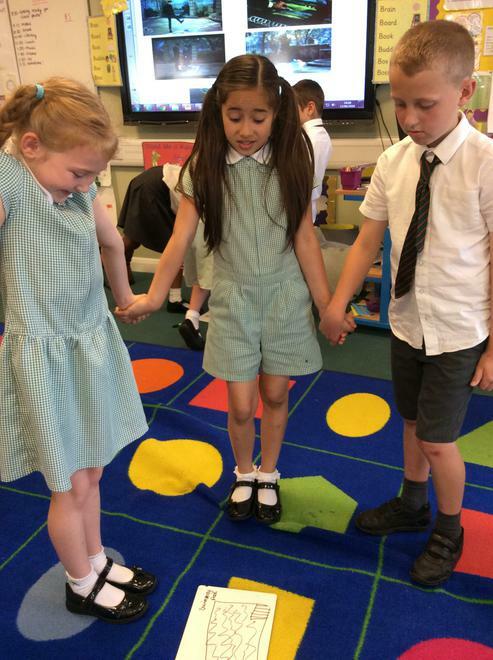 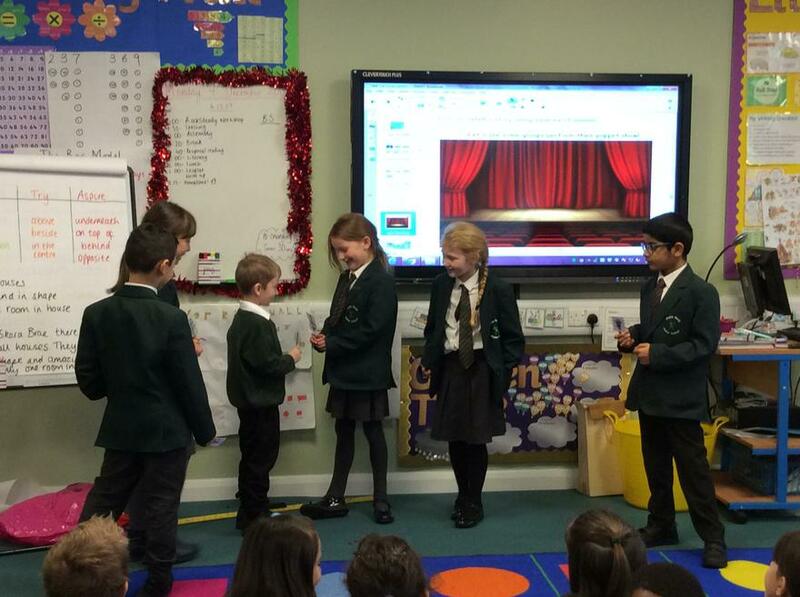 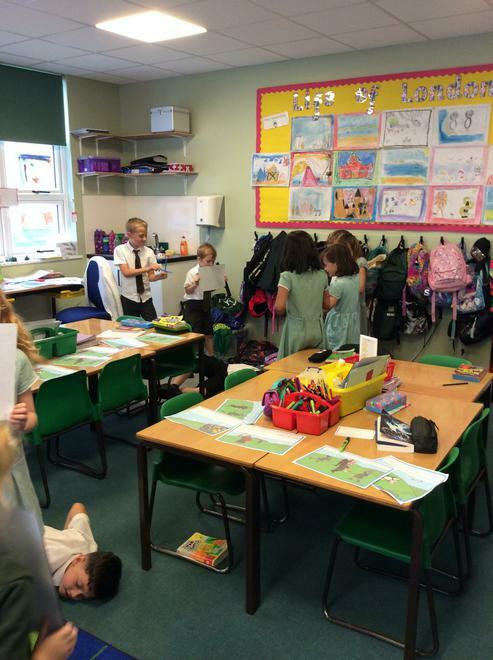 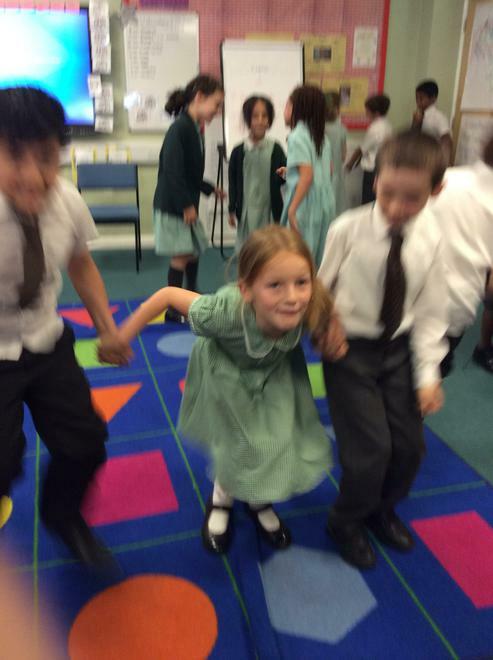 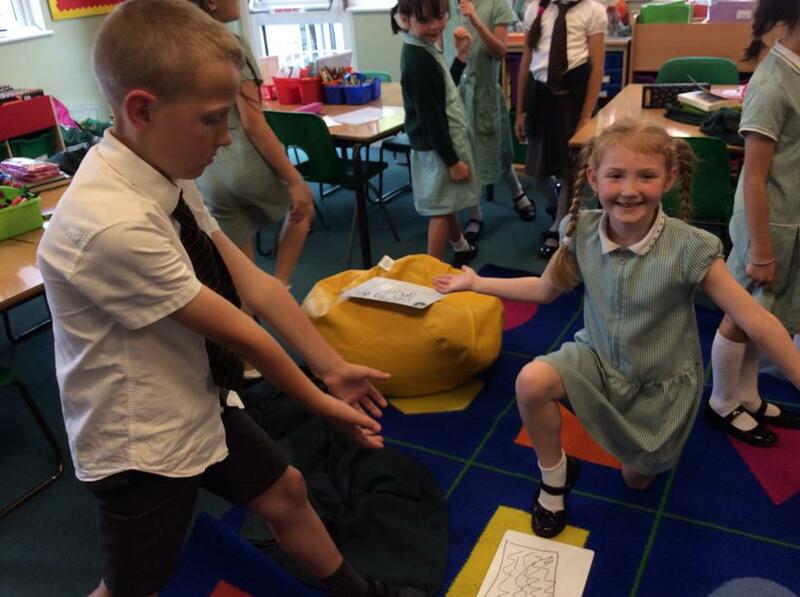 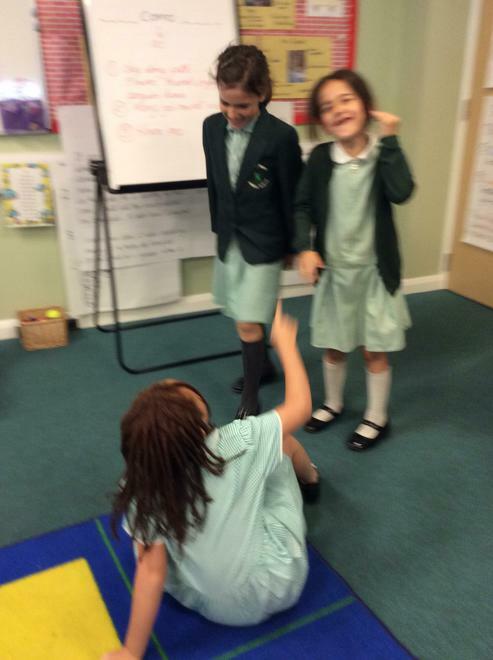 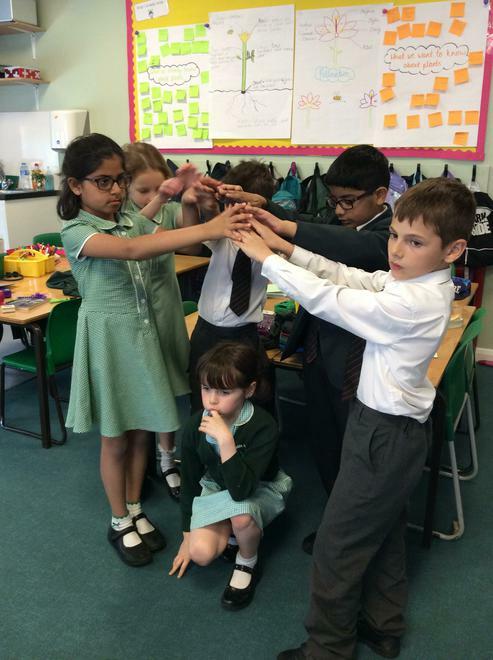 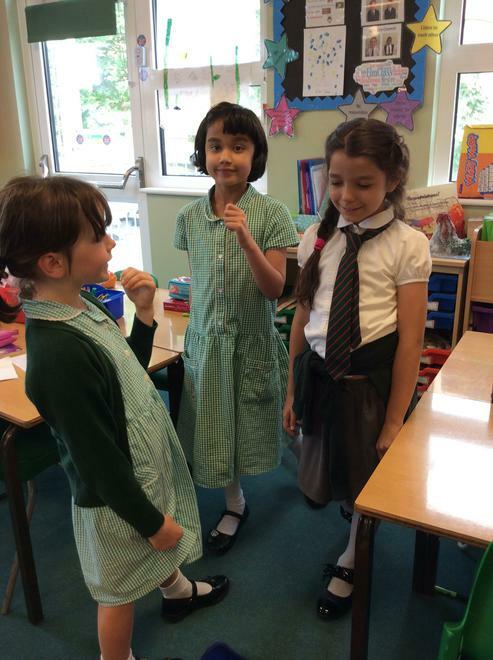 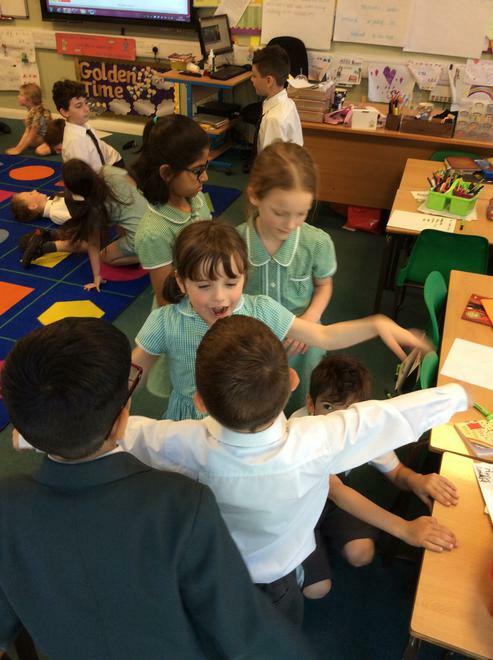 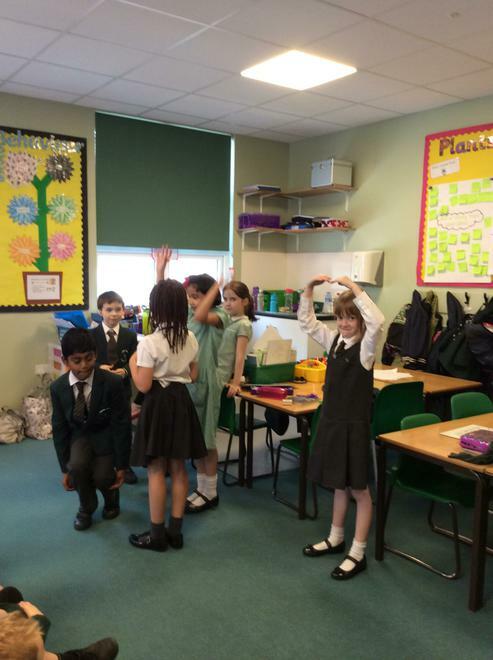 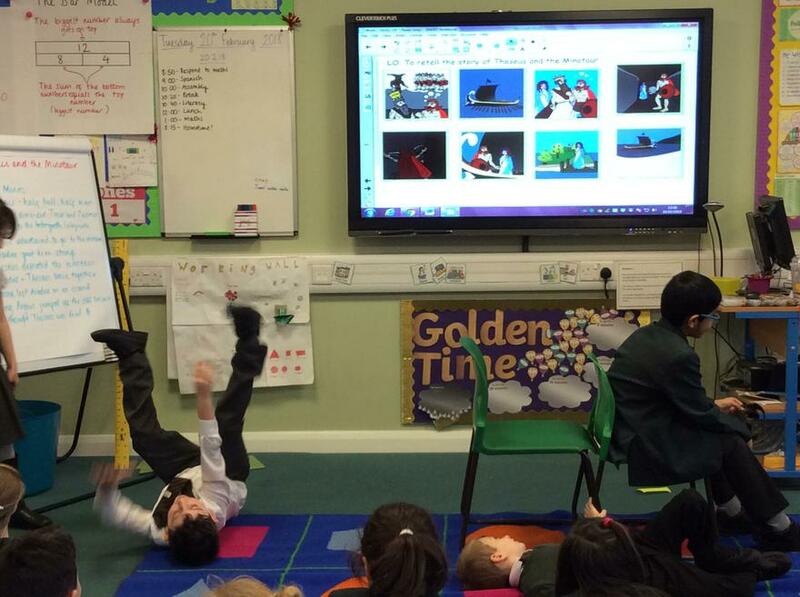 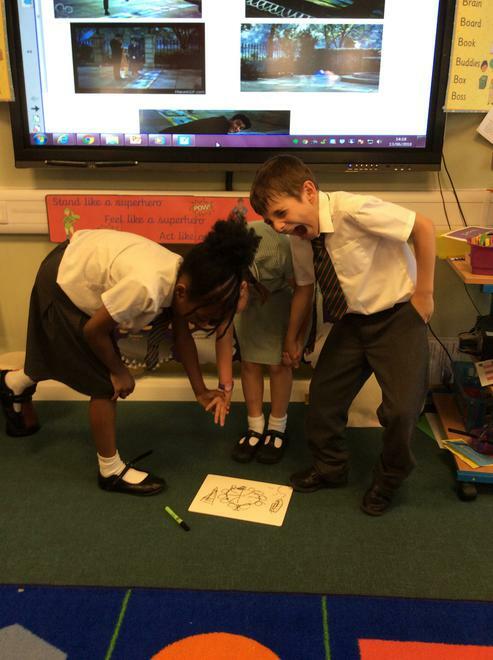 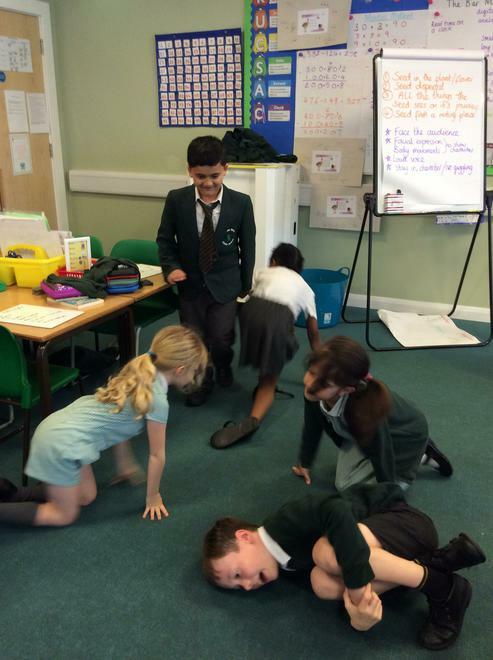 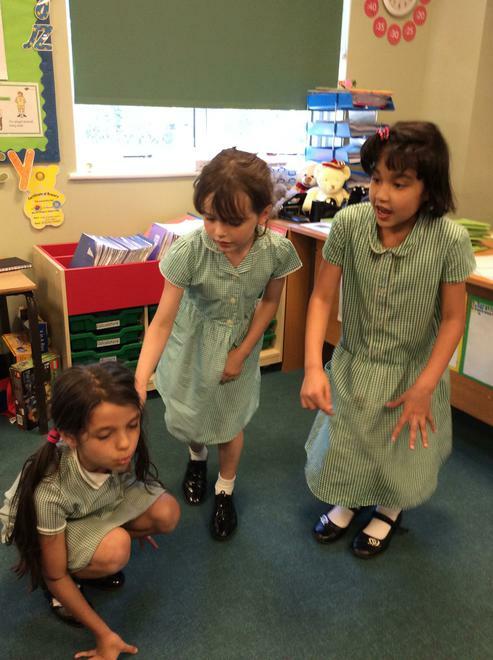 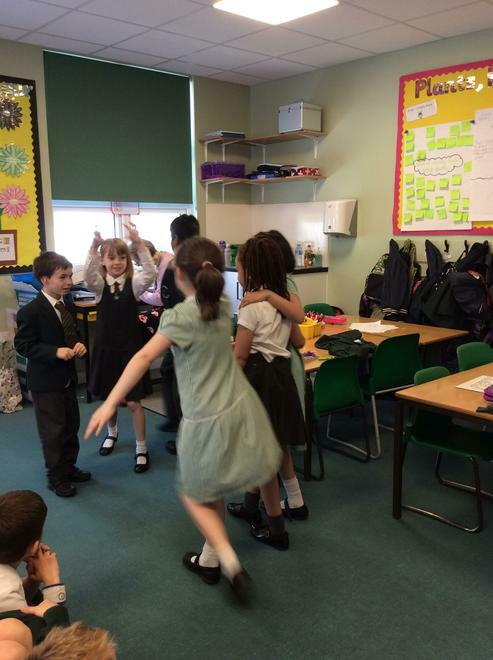 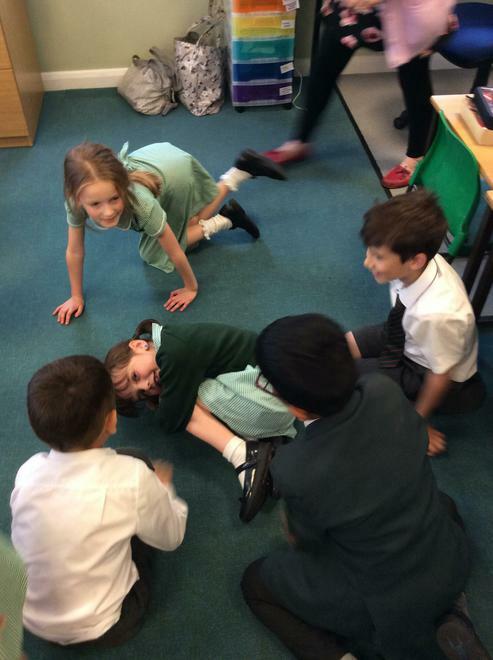 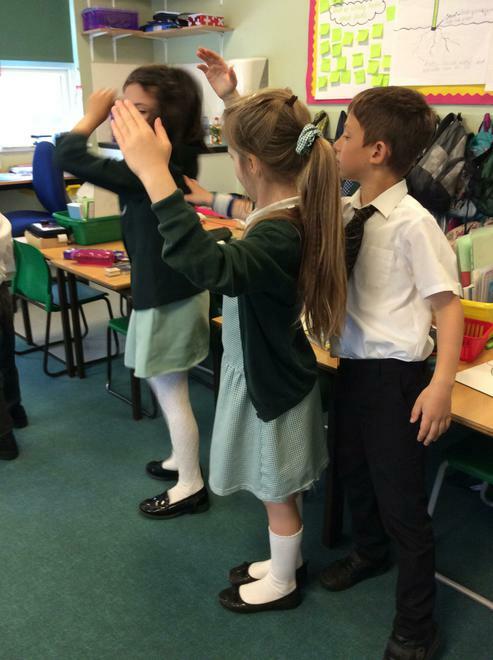 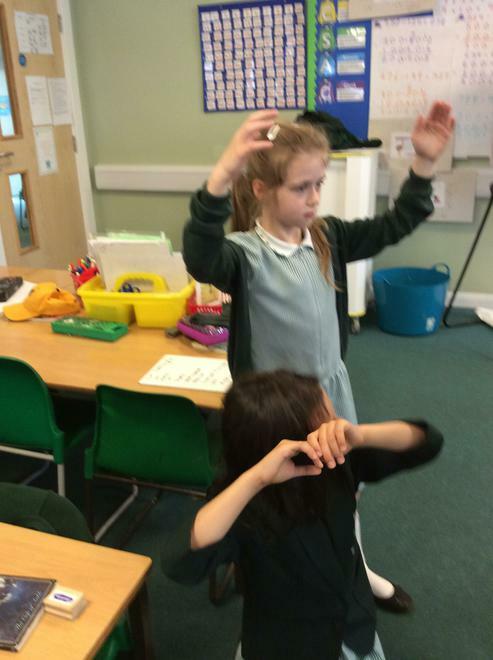 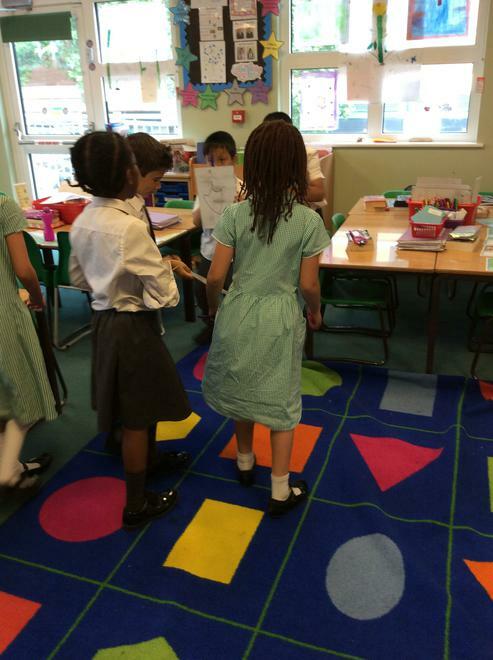 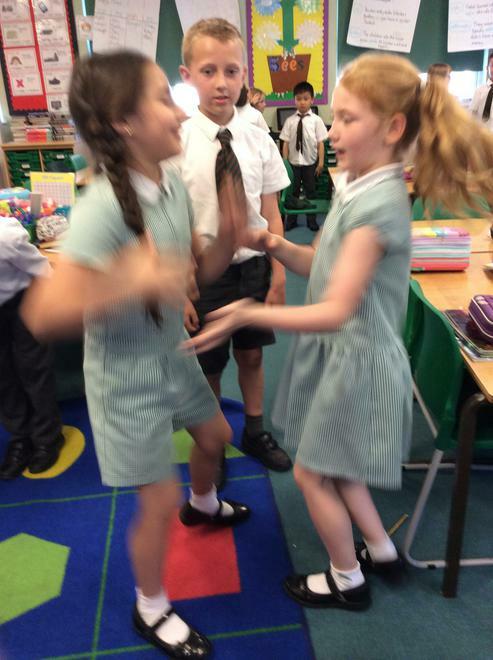 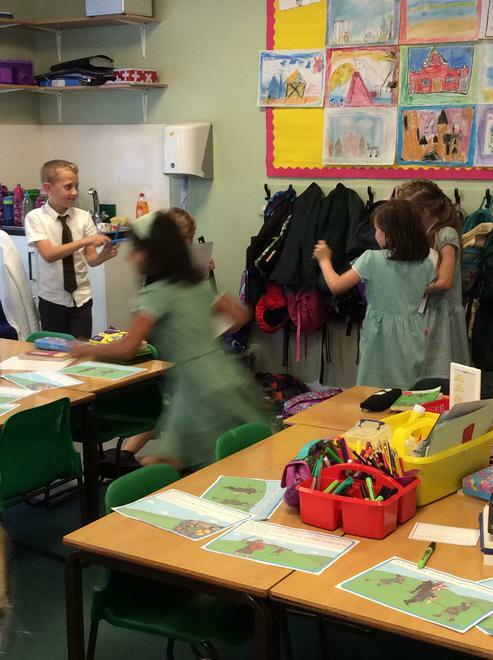 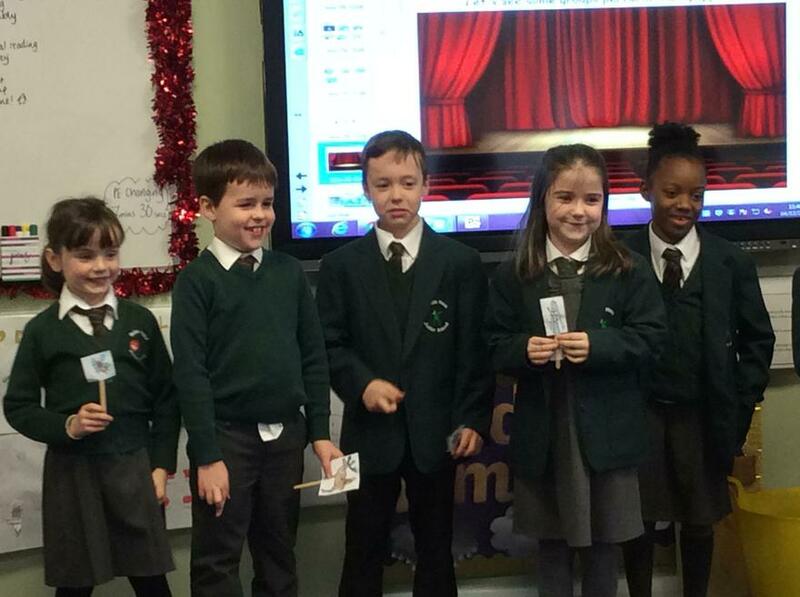 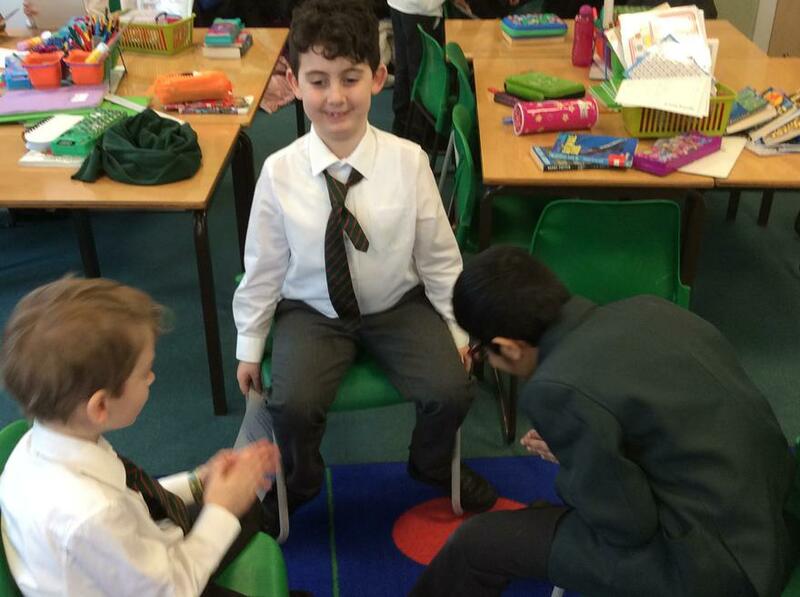 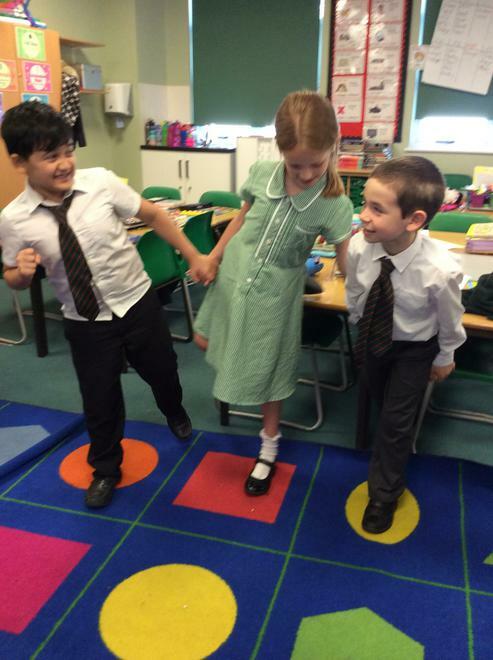 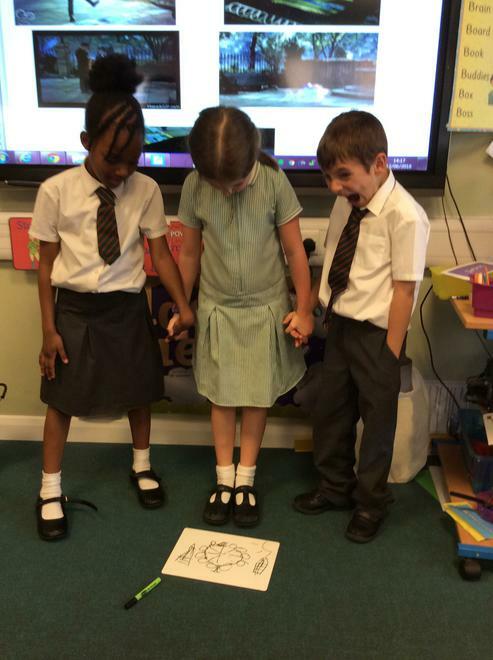 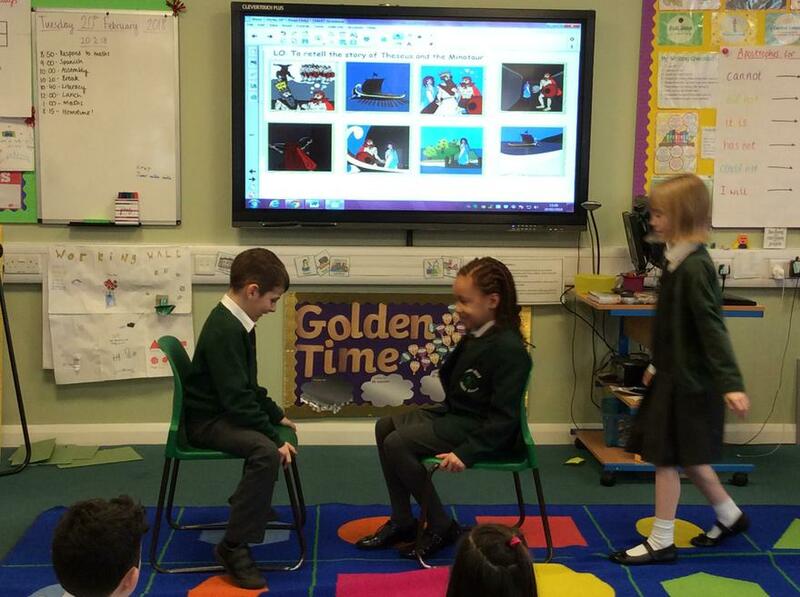 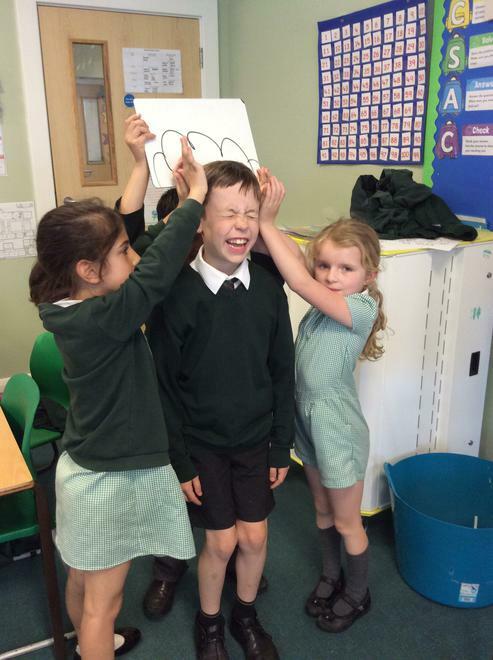 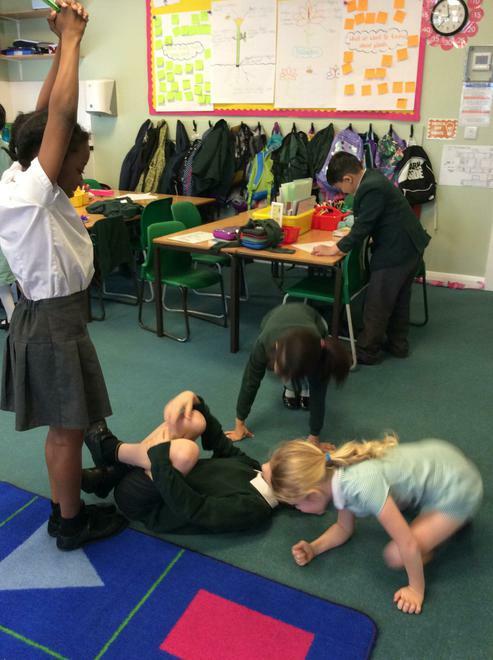 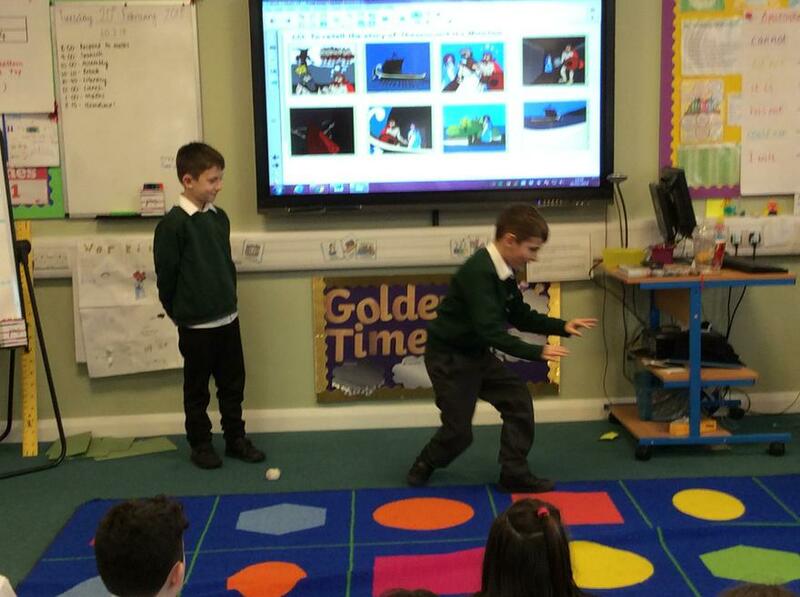 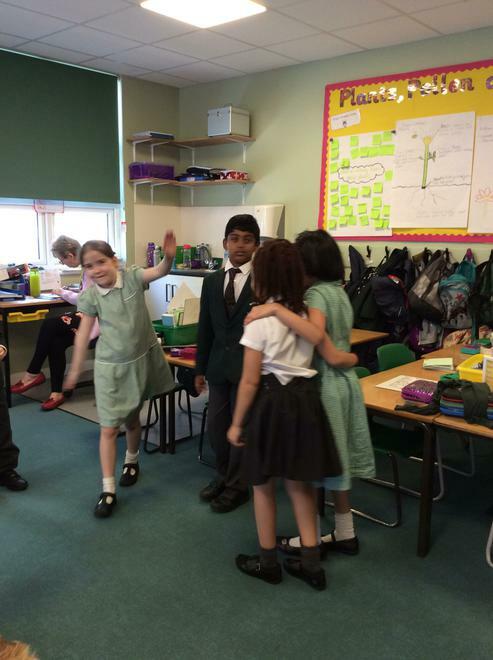 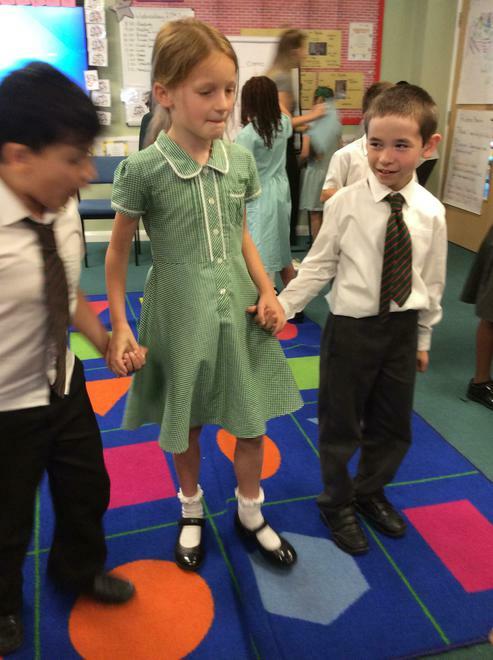 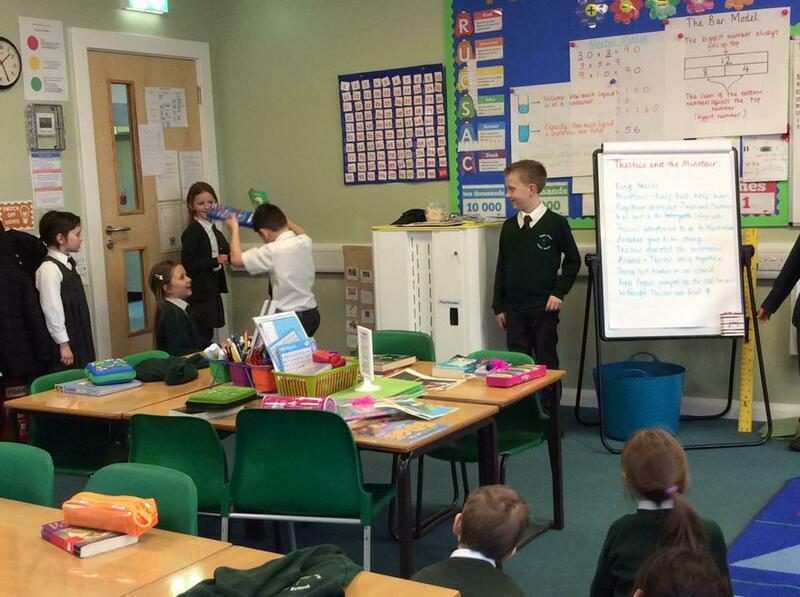 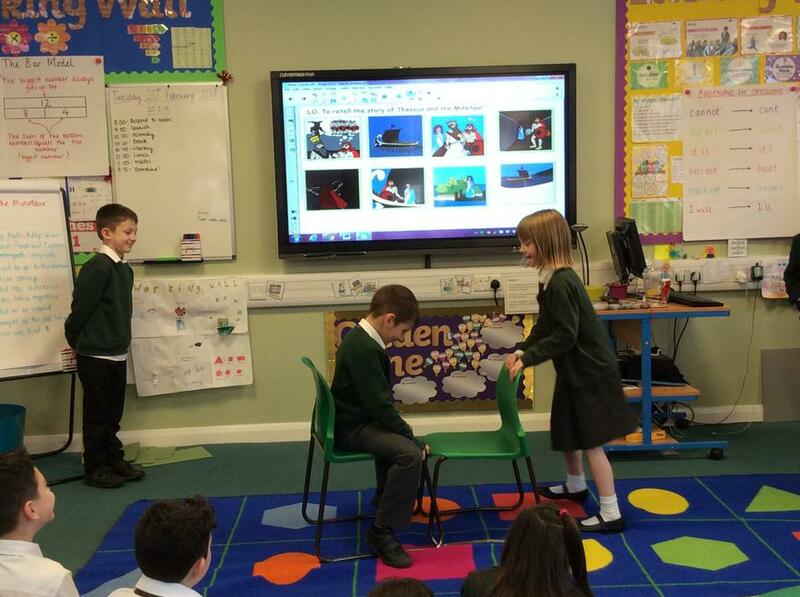 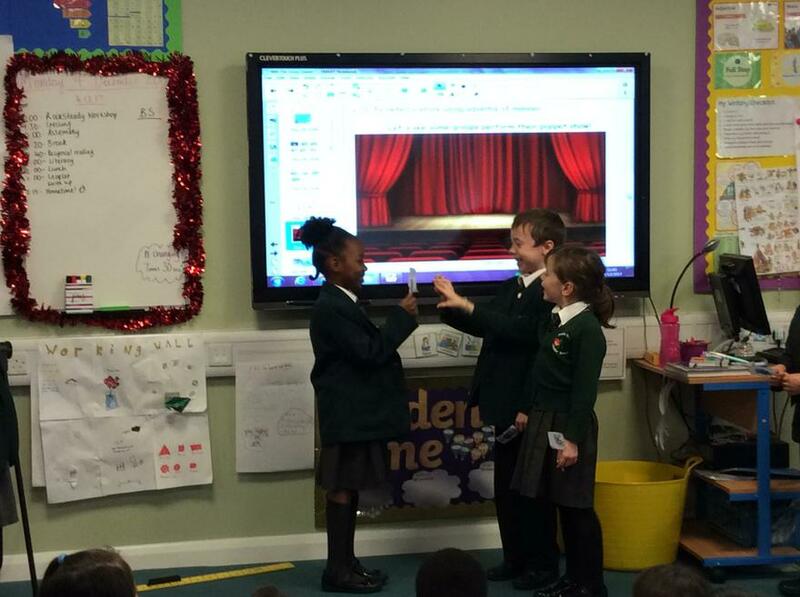 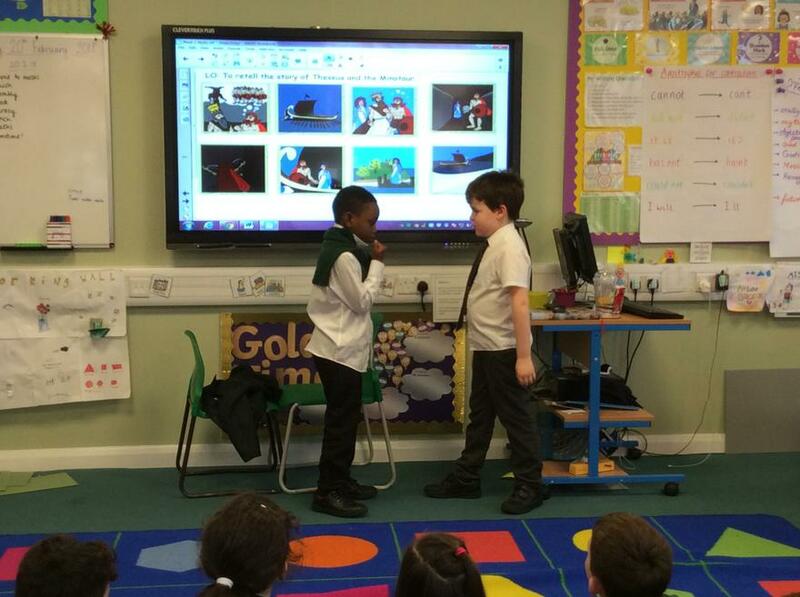 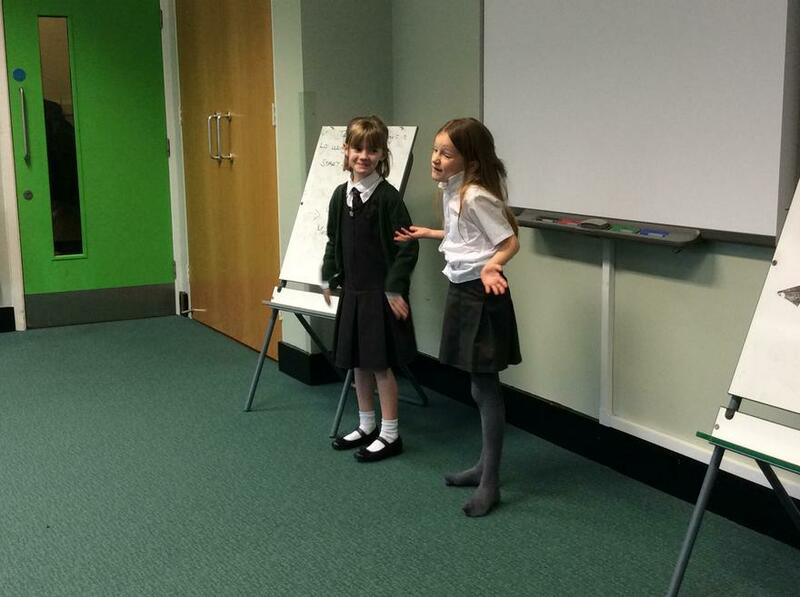 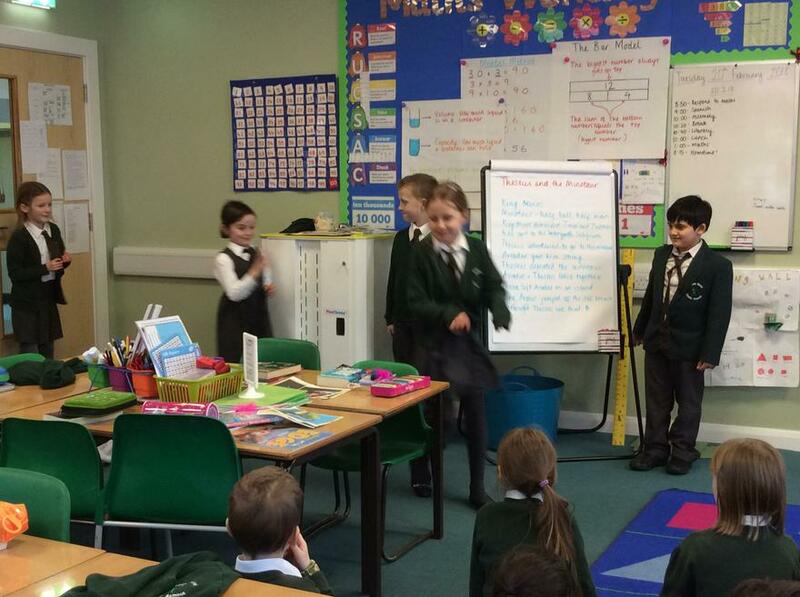 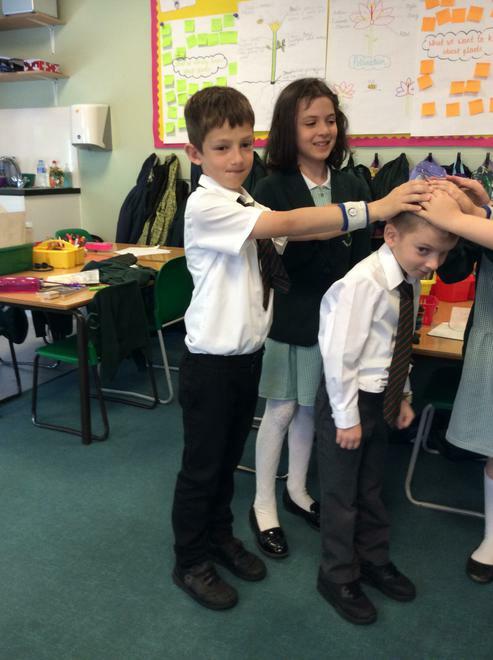 We then sequenced the story and acted it out using our drama skills to remember the key parts of the story. 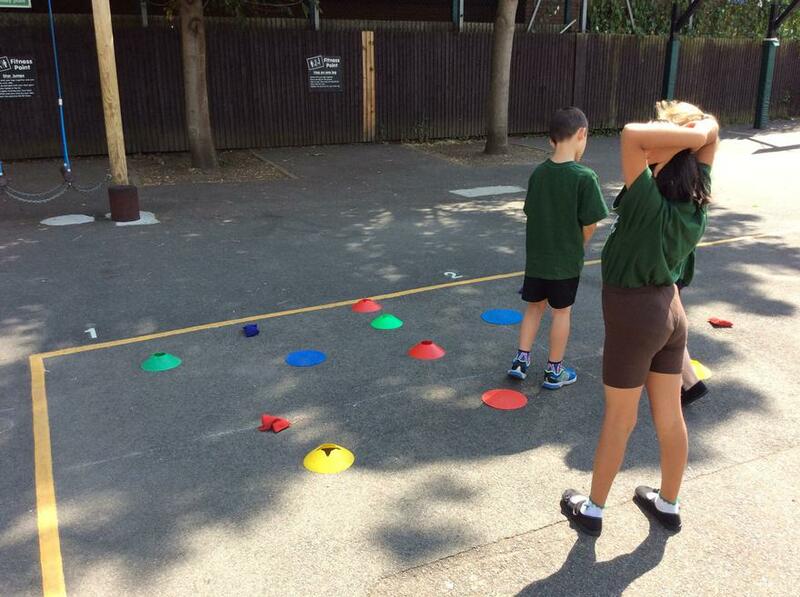 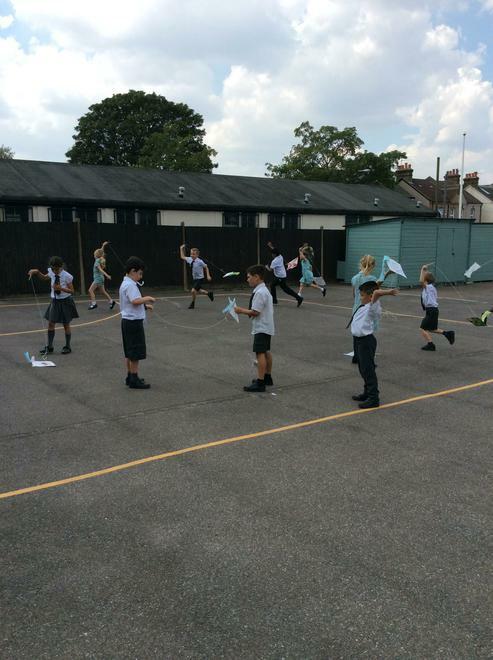 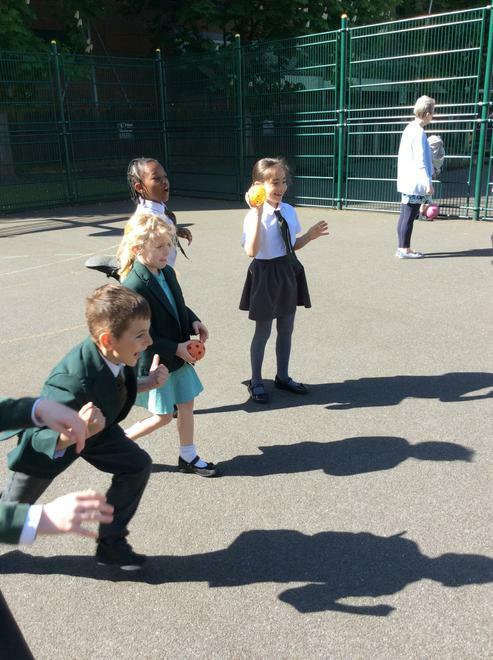 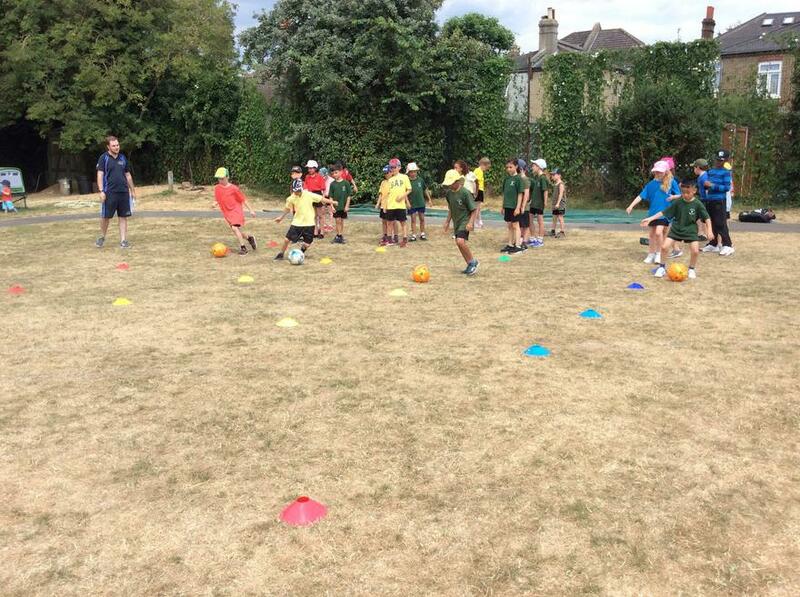 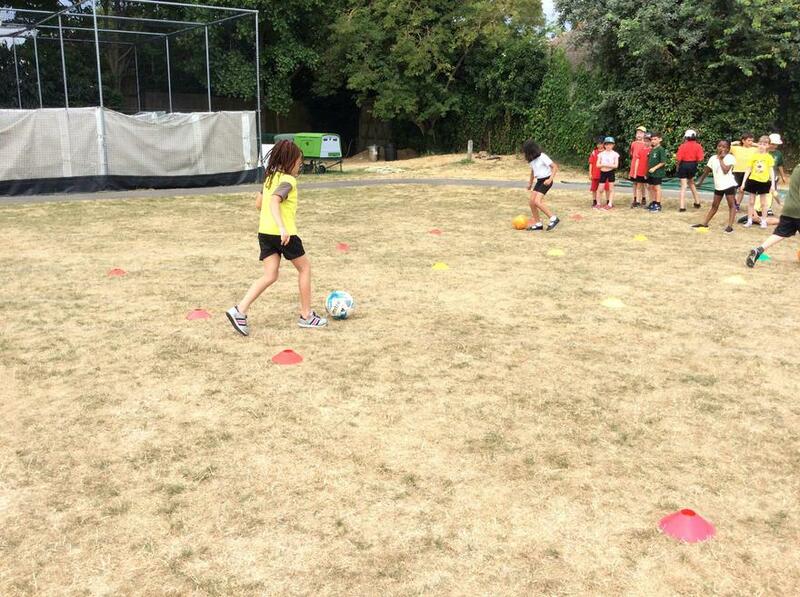 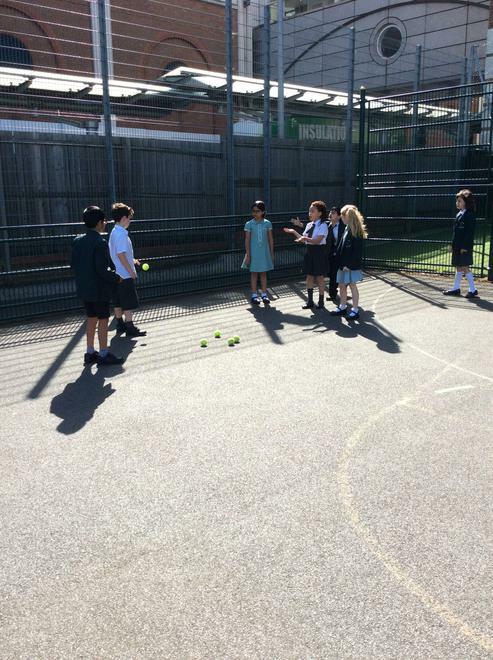 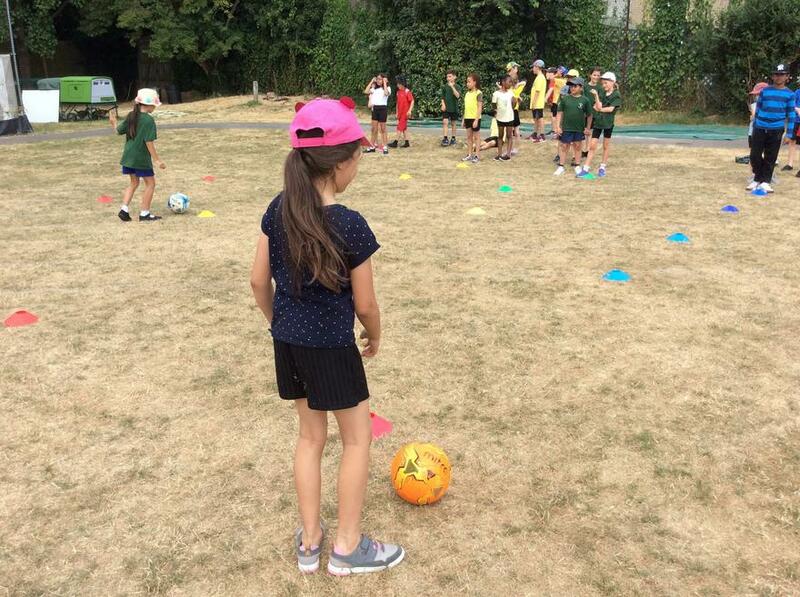 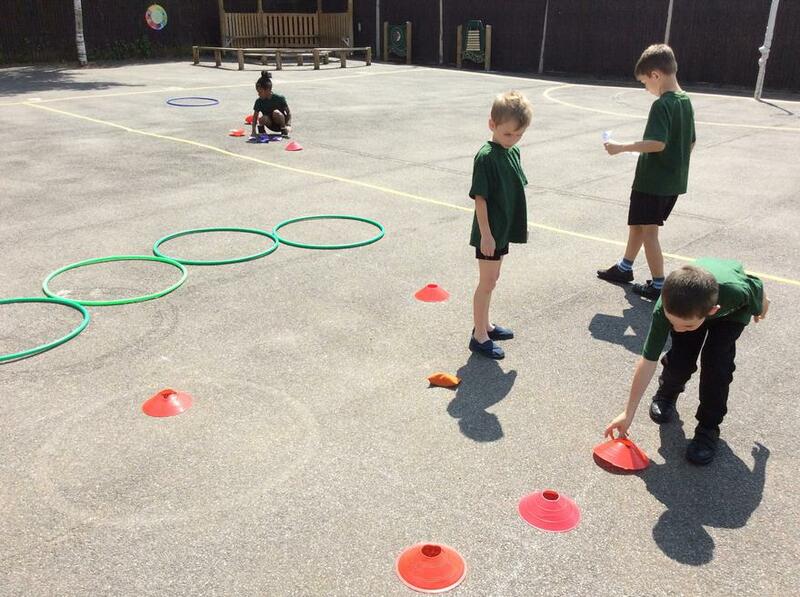 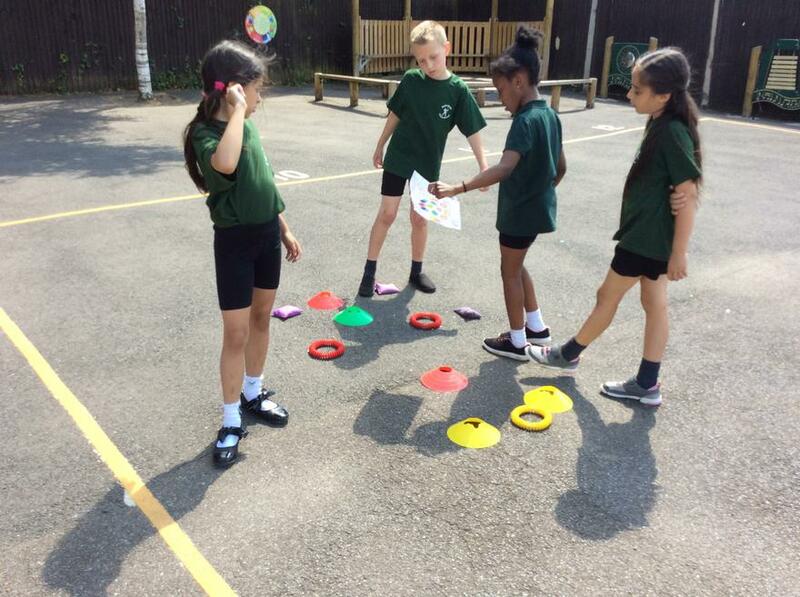 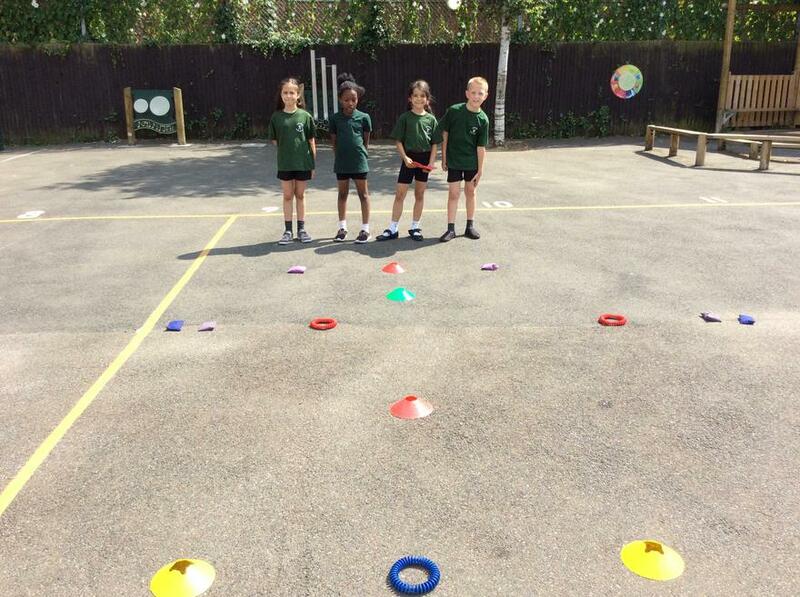 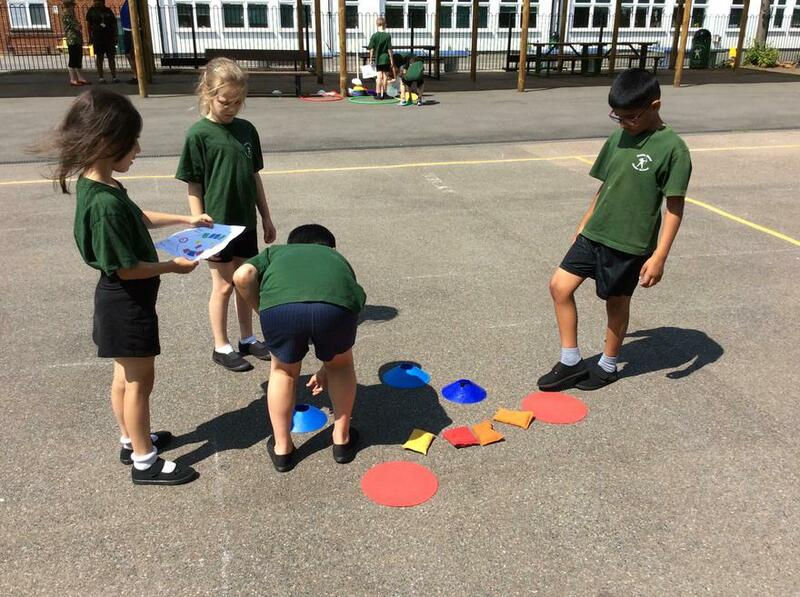 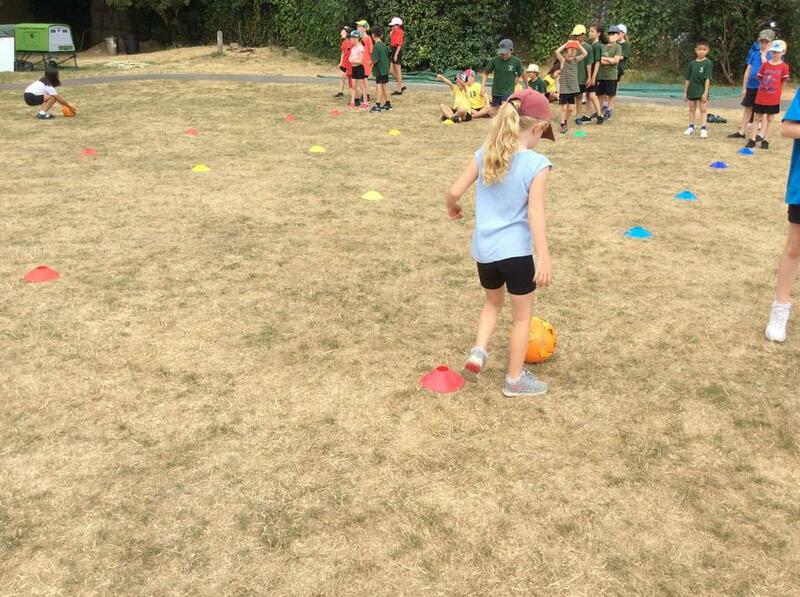 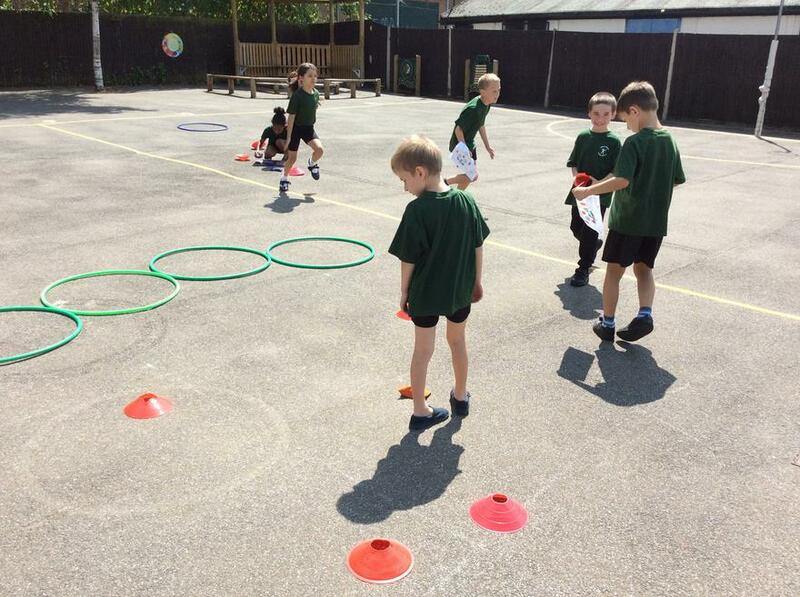 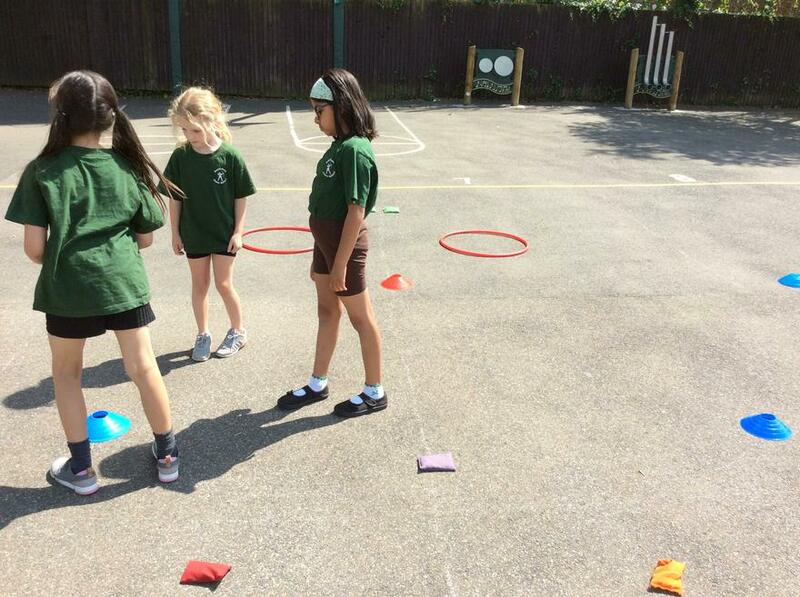 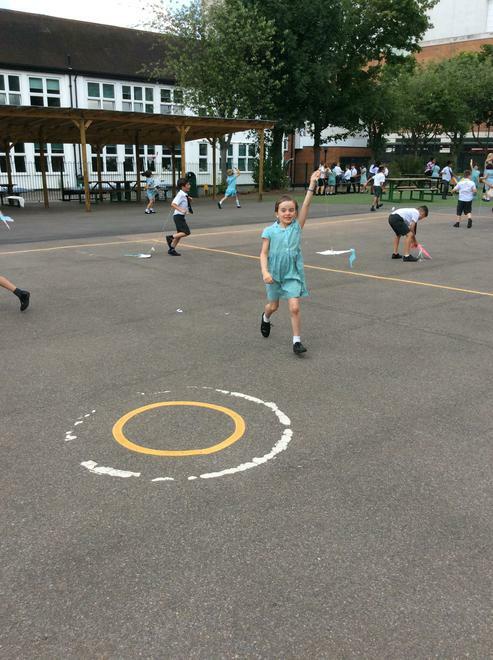 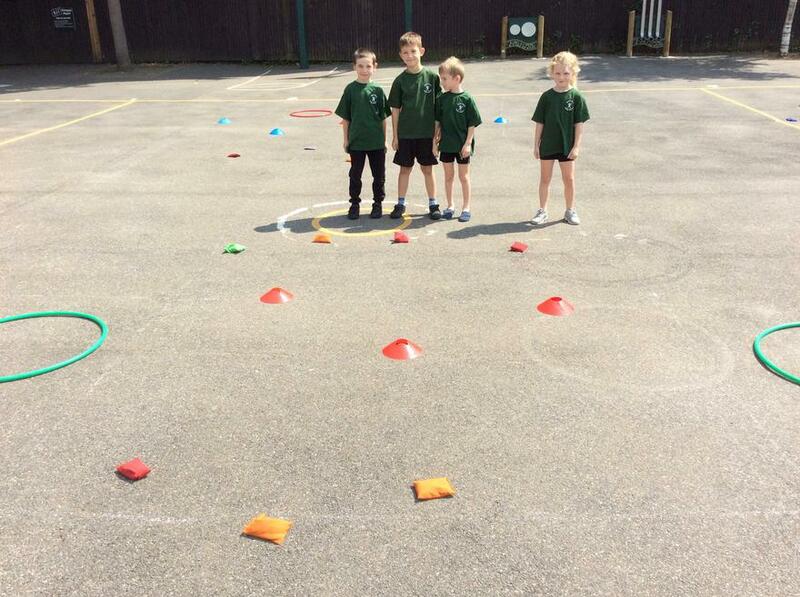 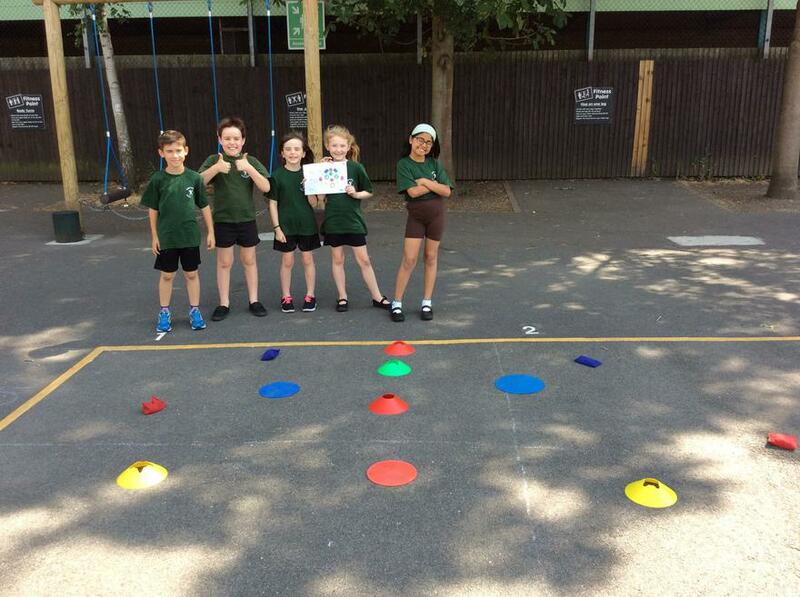 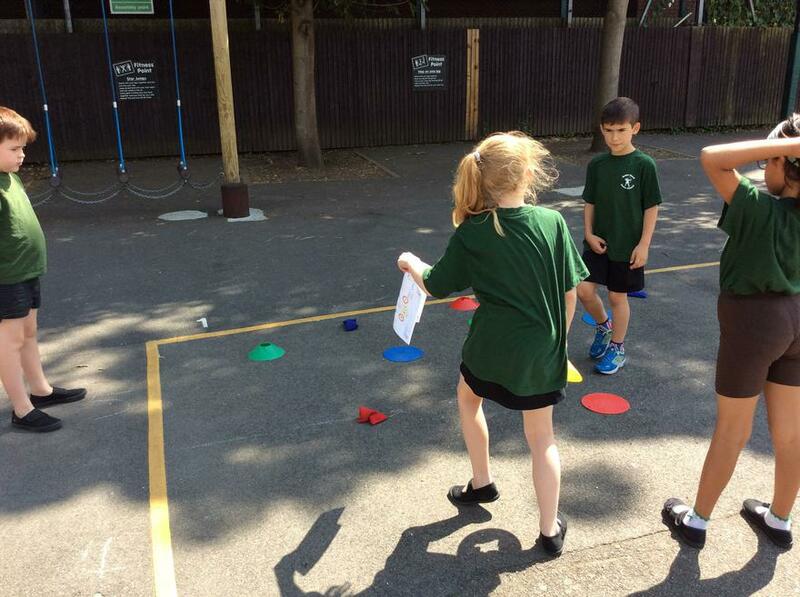 This week has been National School Sports Week and we have participated in some exciting orienteering lessons! 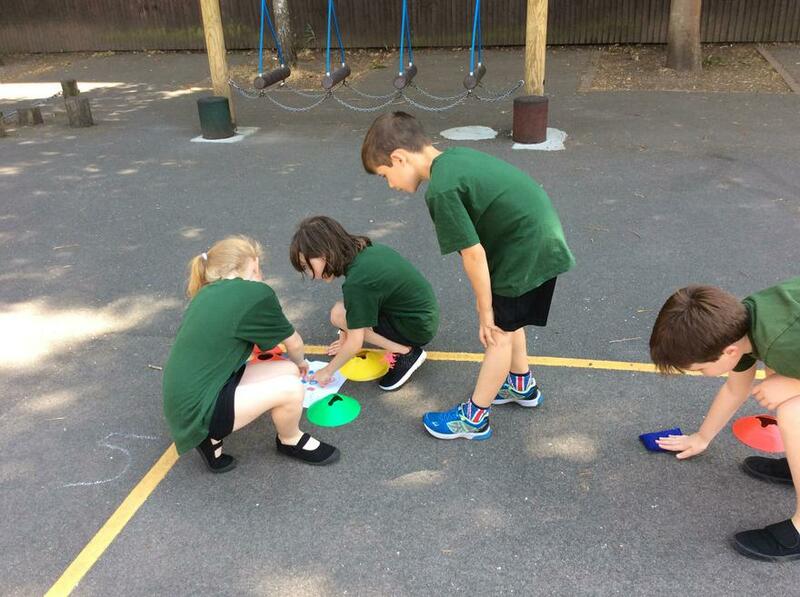 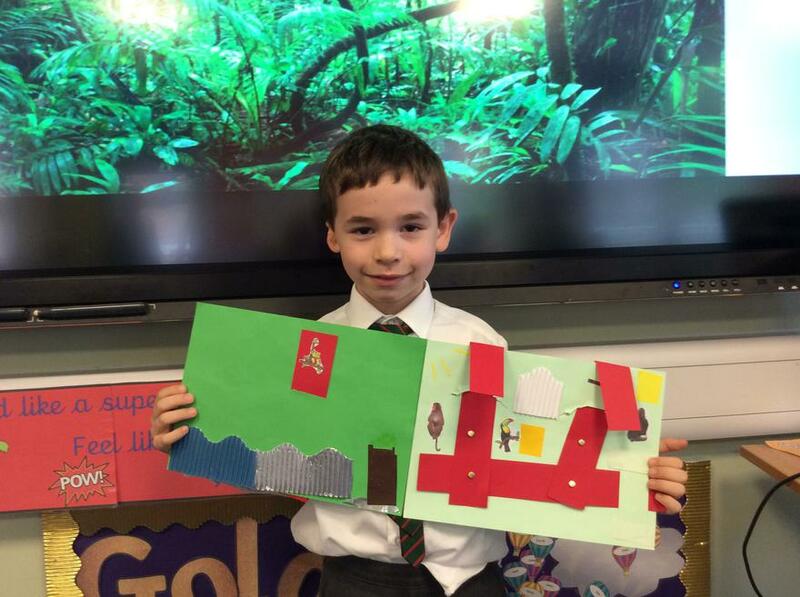 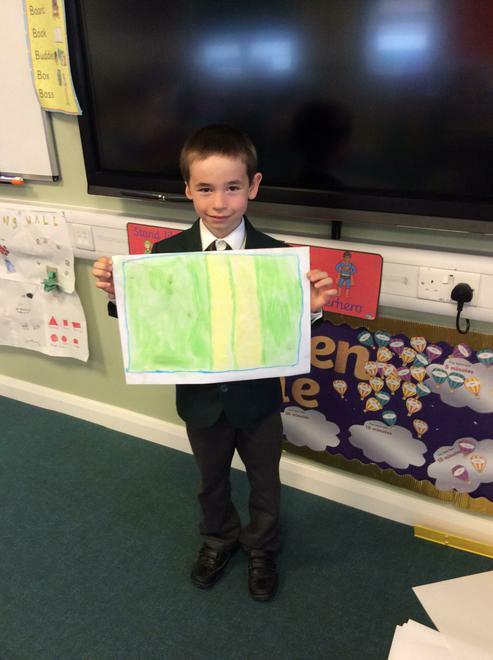 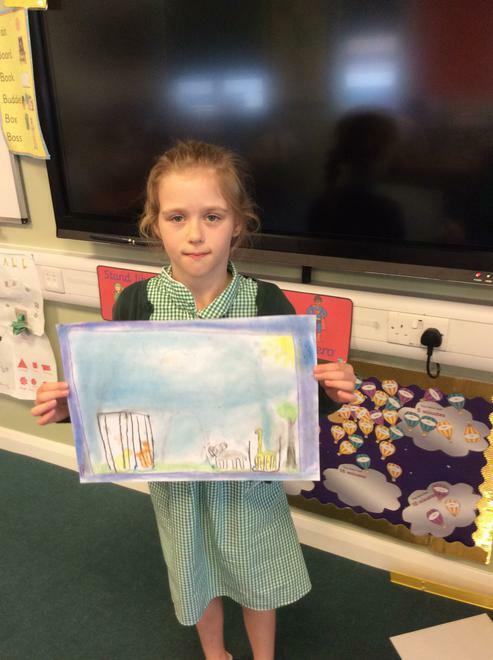 We used different maps to create different pictures on the playground. 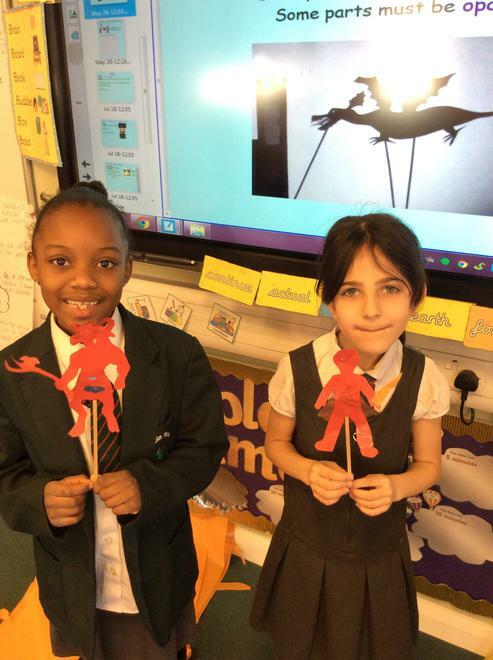 This week in Literacy we have been looking further at Mary Poppins. 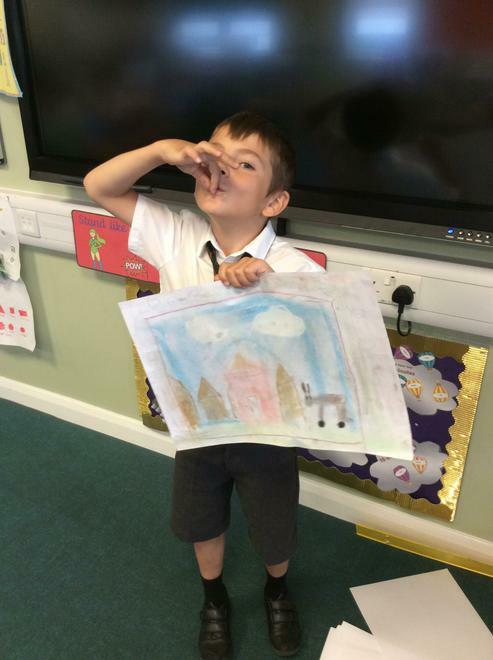 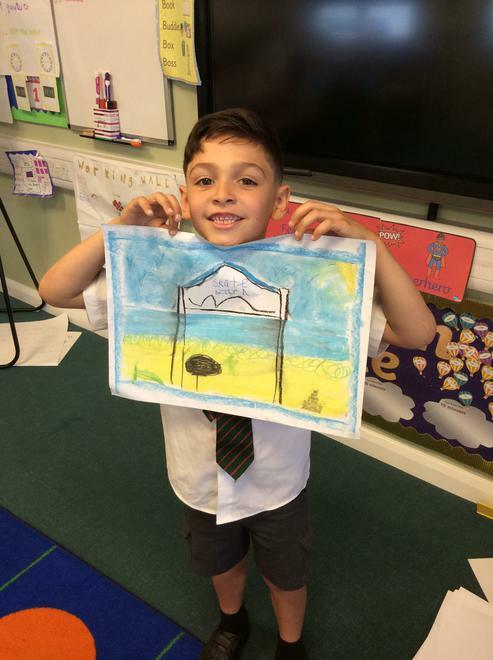 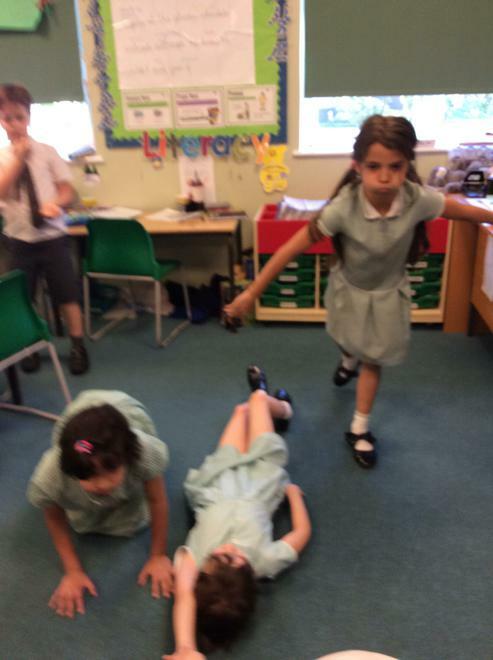 We created our own Mary Poppins inspired chalk paintings and then used drama to help us think about what would happen if we jumped into our paintings, just like the film! 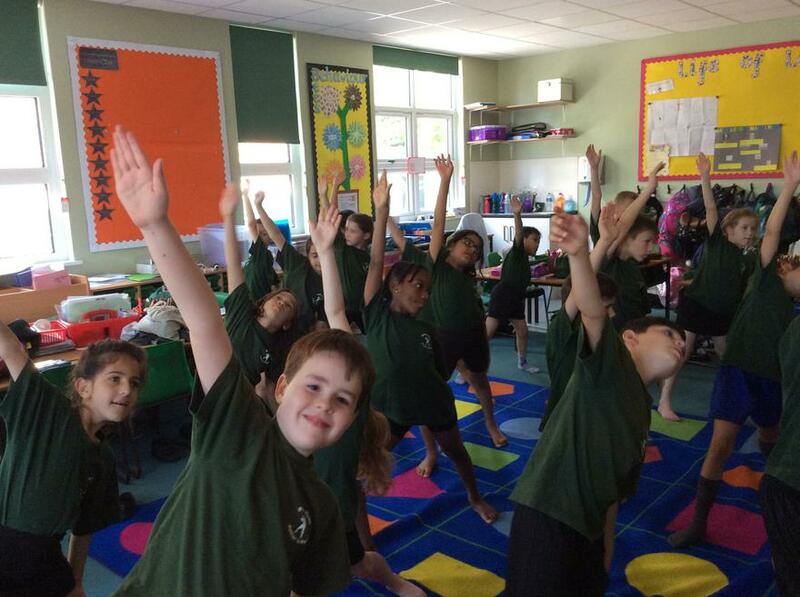 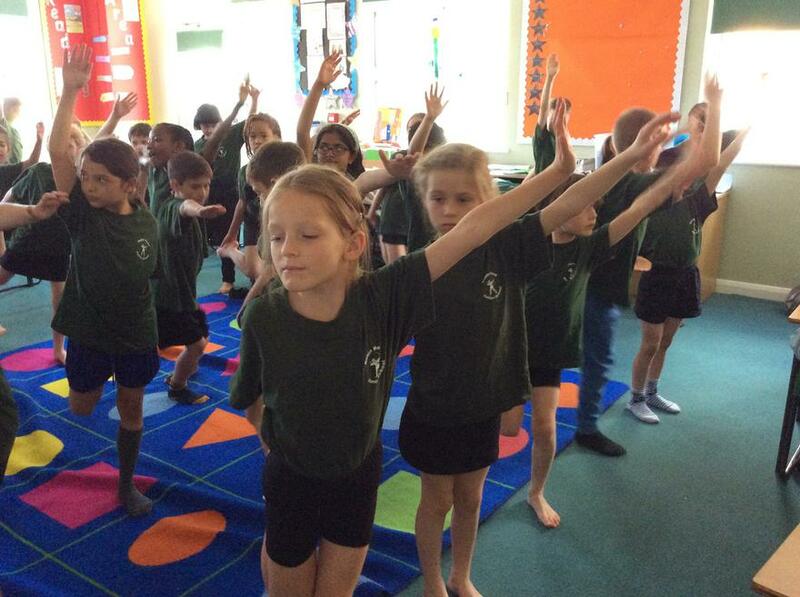 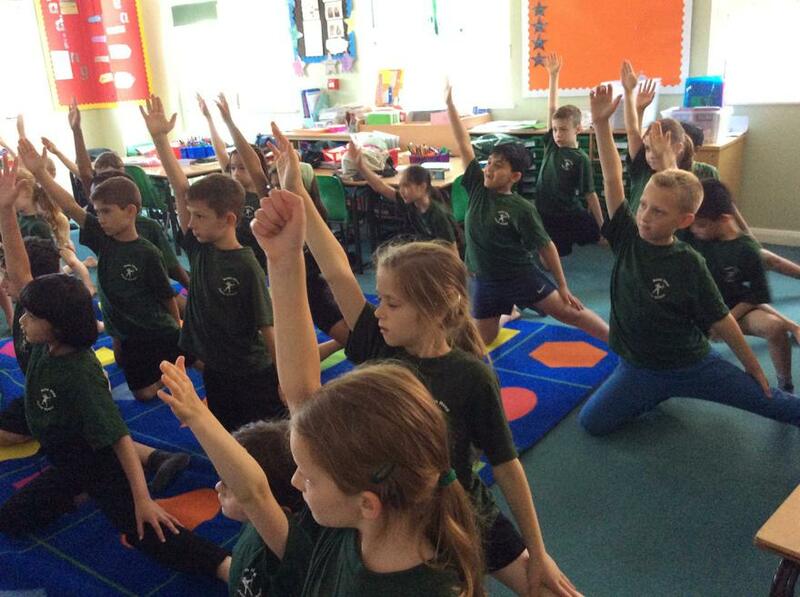 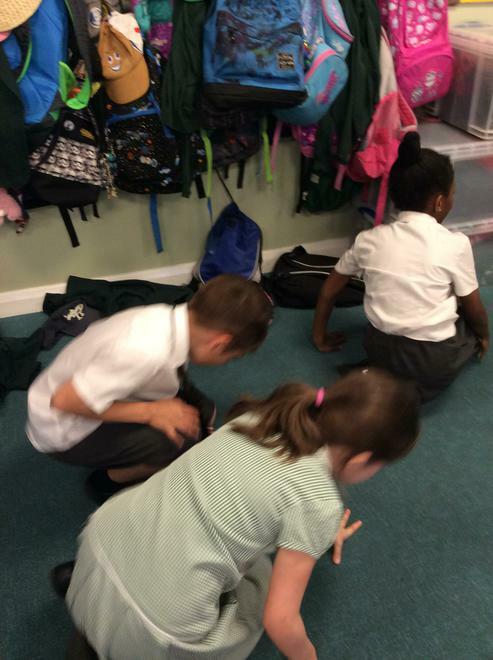 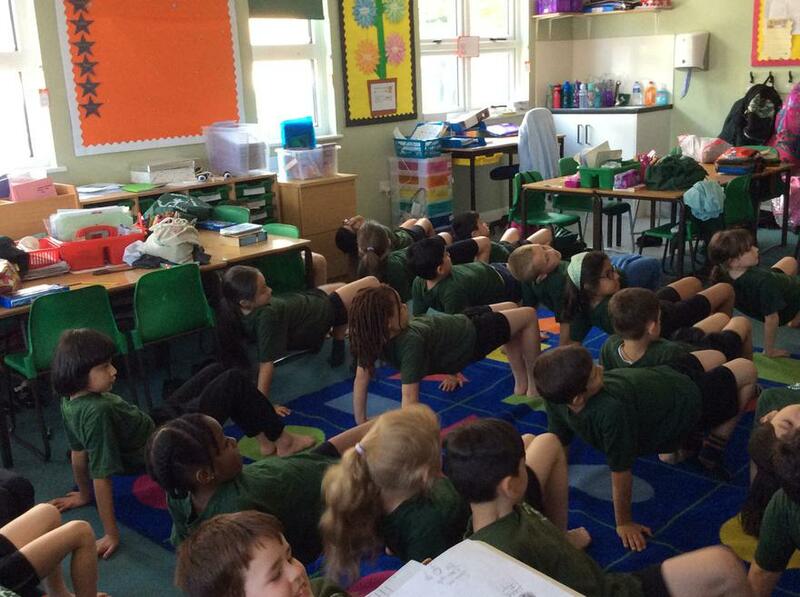 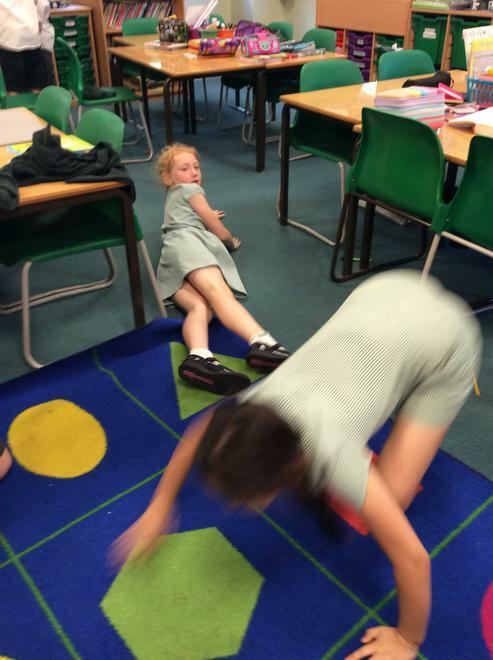 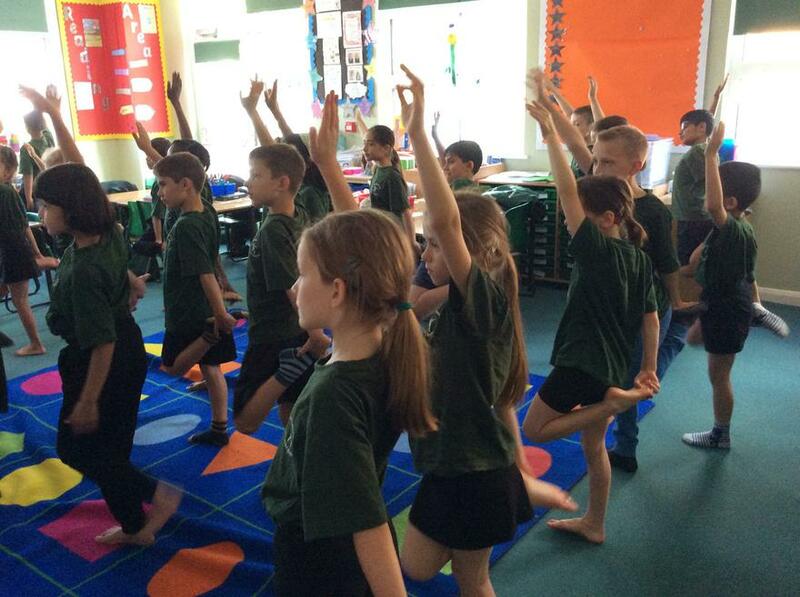 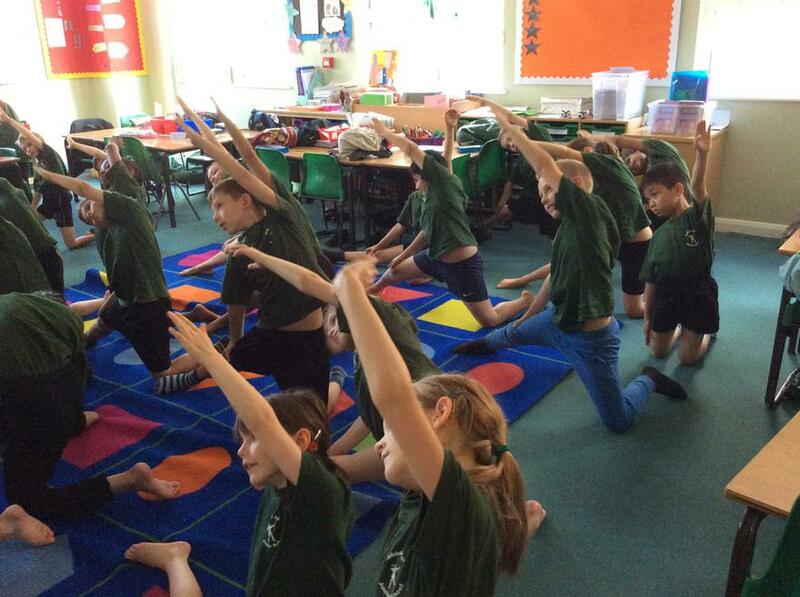 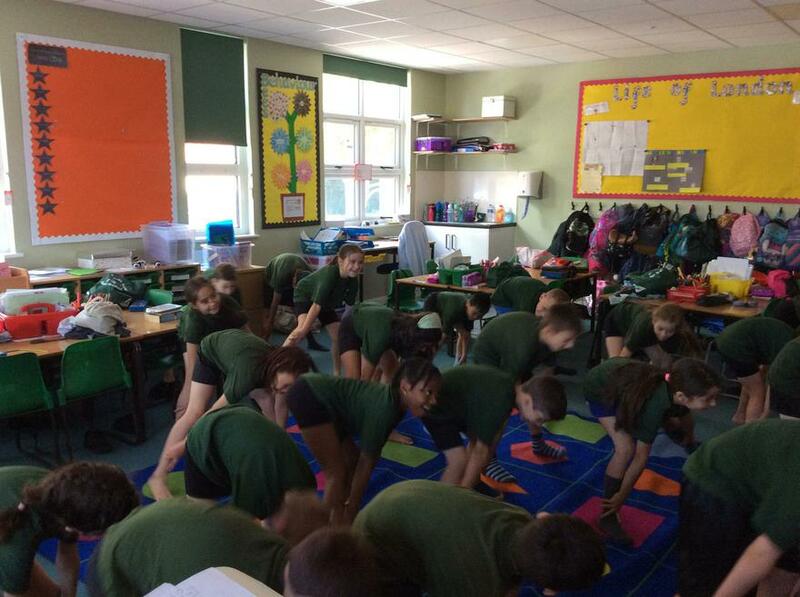 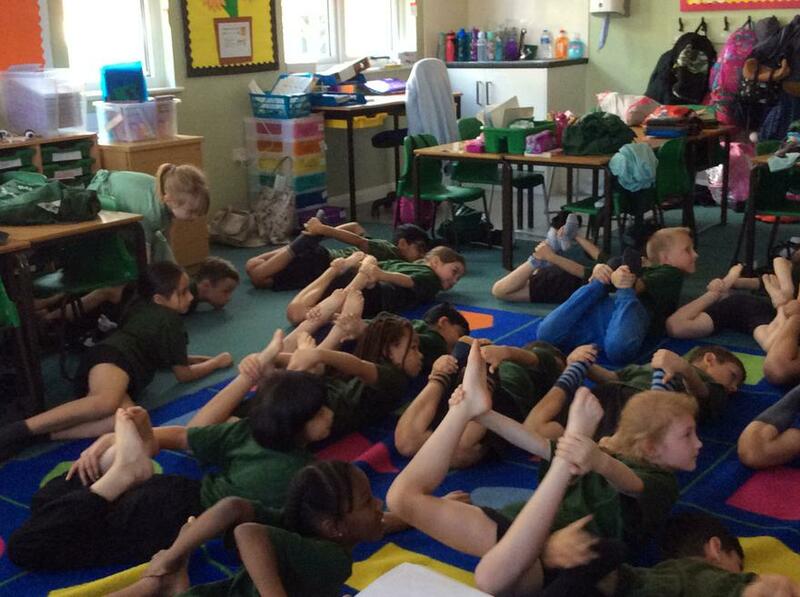 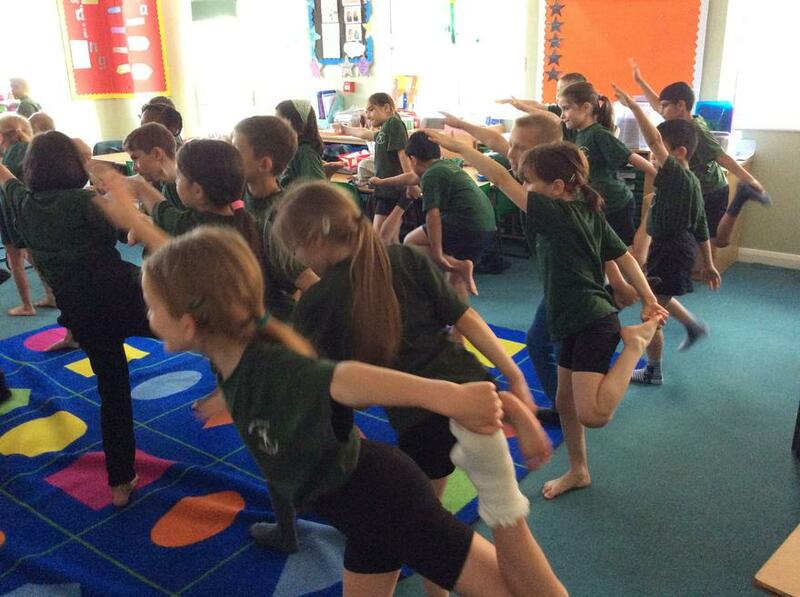 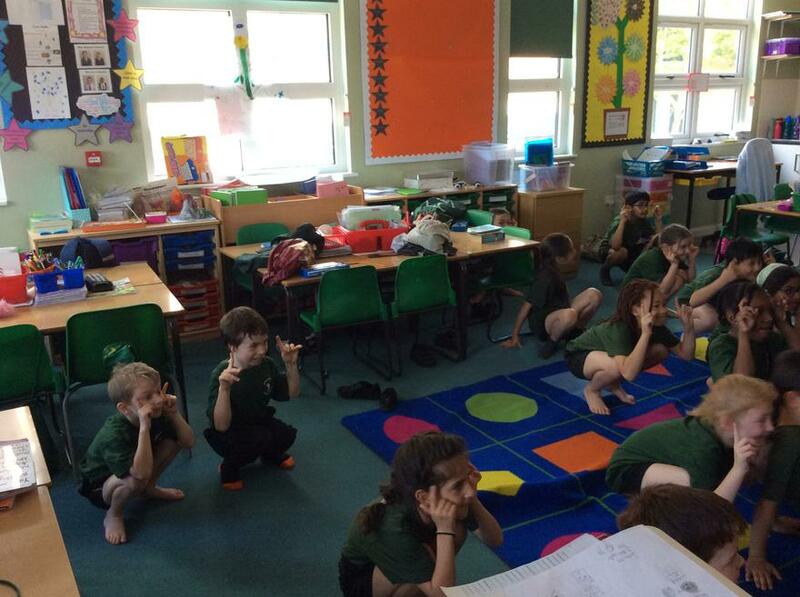 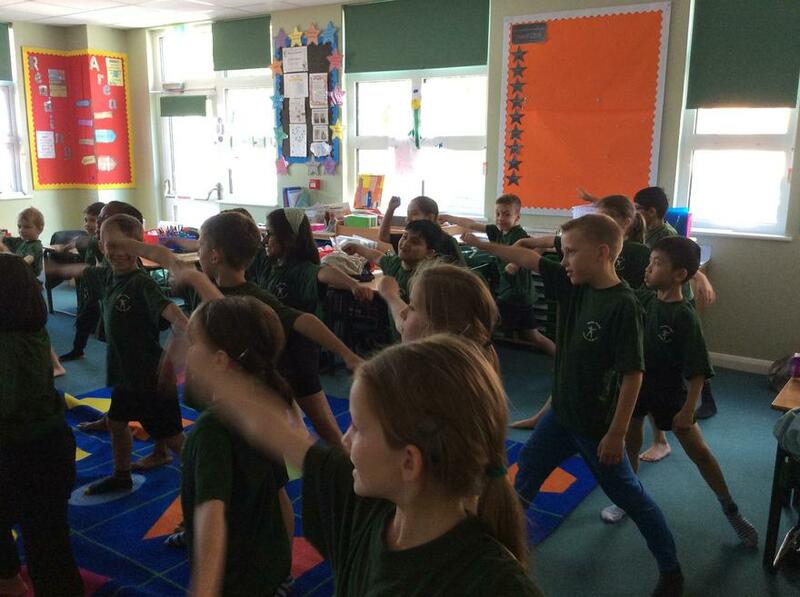 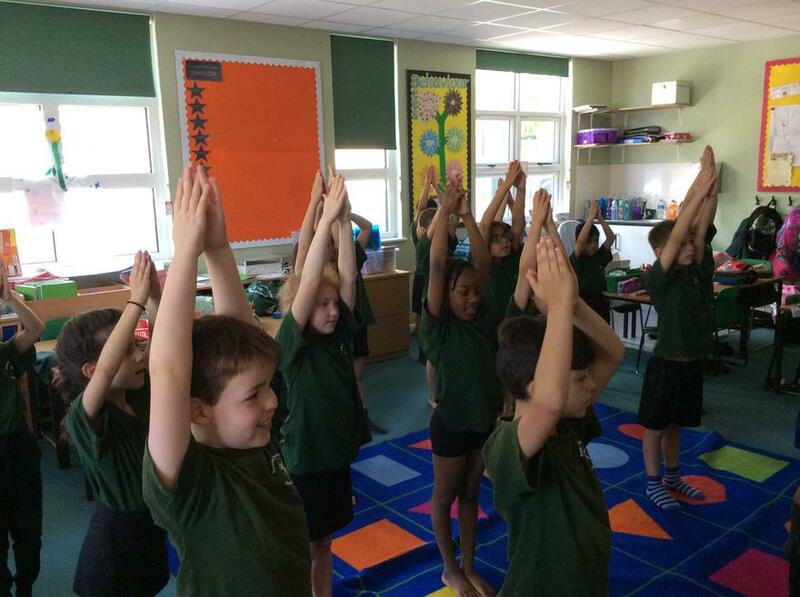 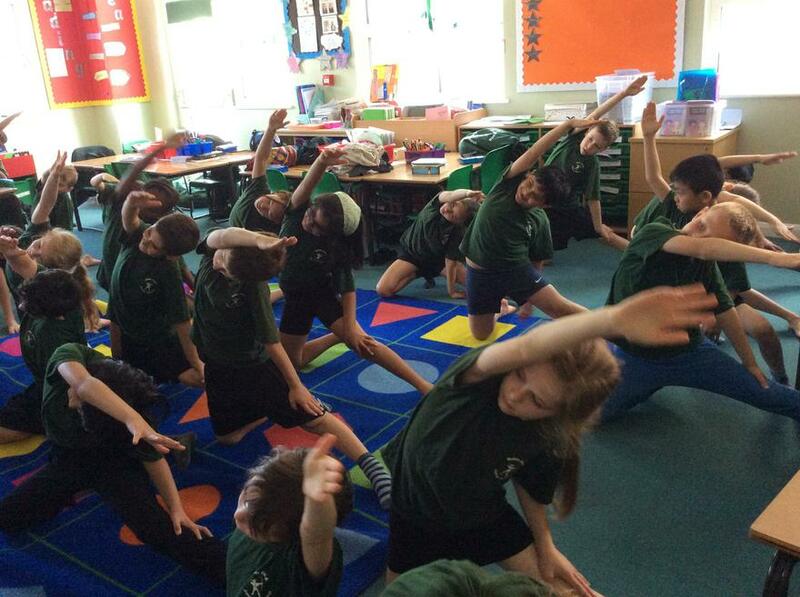 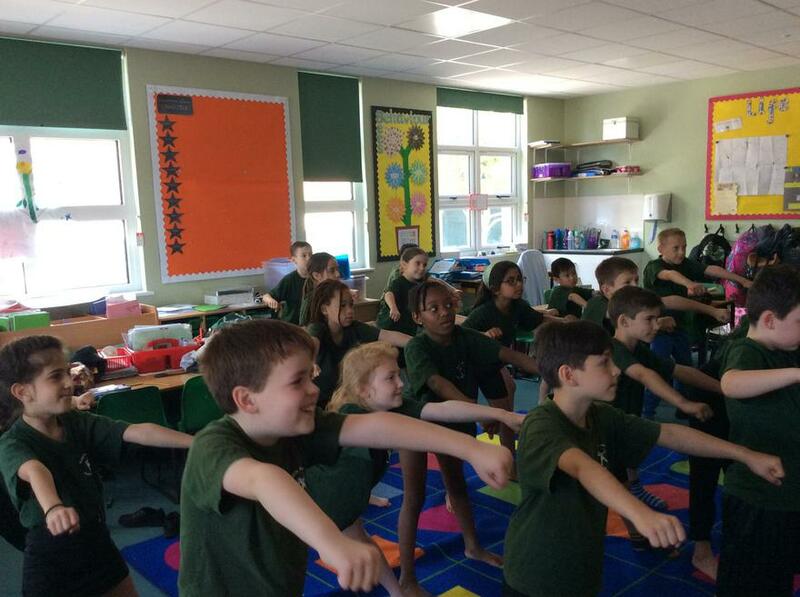 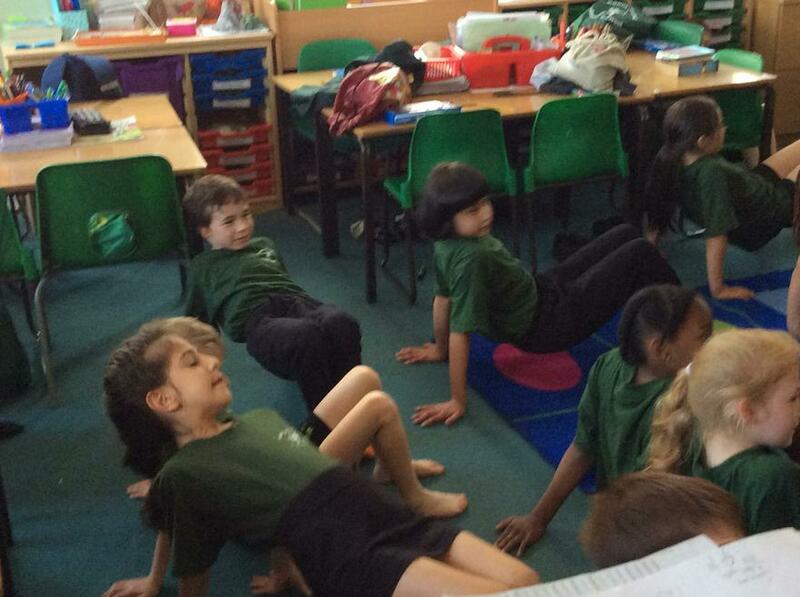 Today was International Yoga Day, so to celebrate the whole class joined in with some Harry Potter themed yoga! 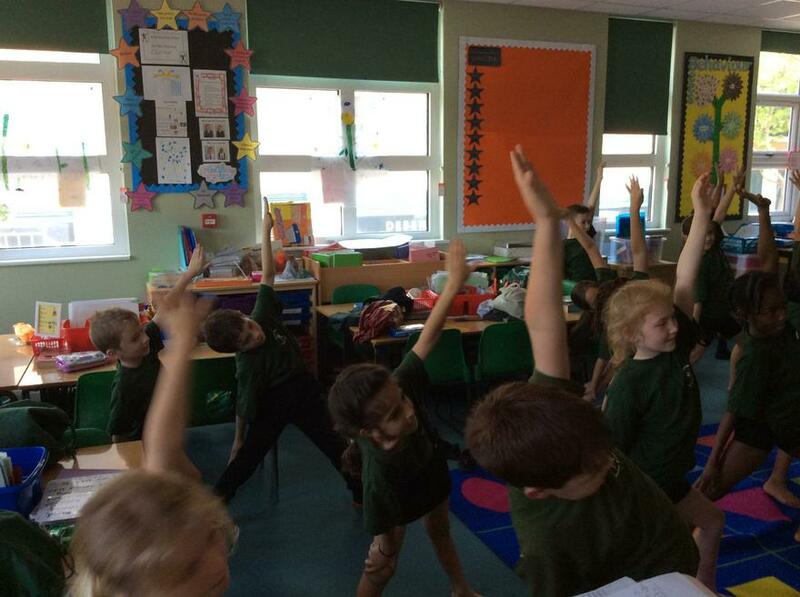 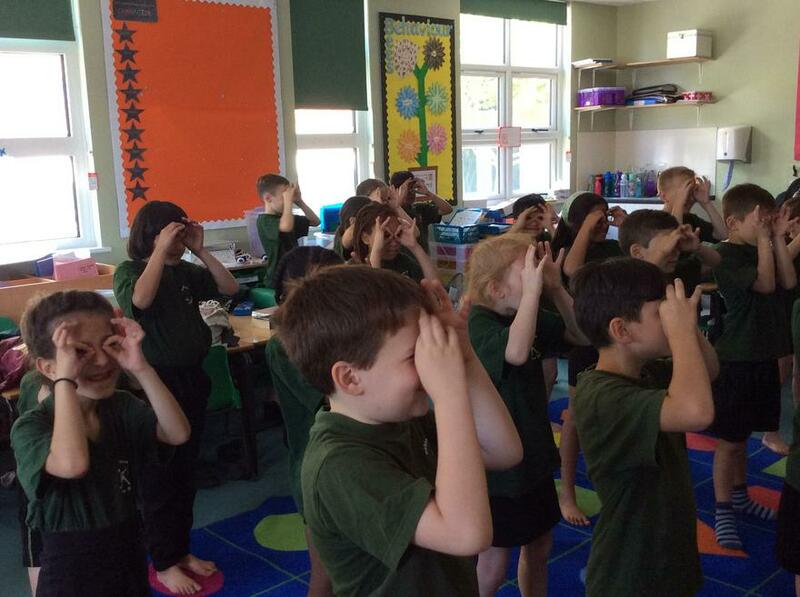 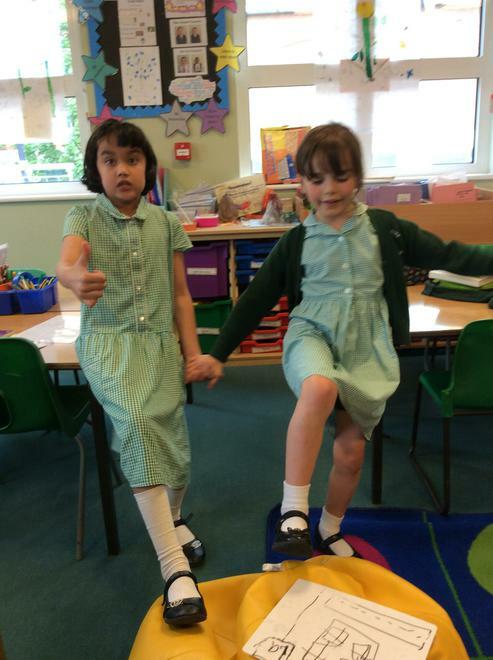 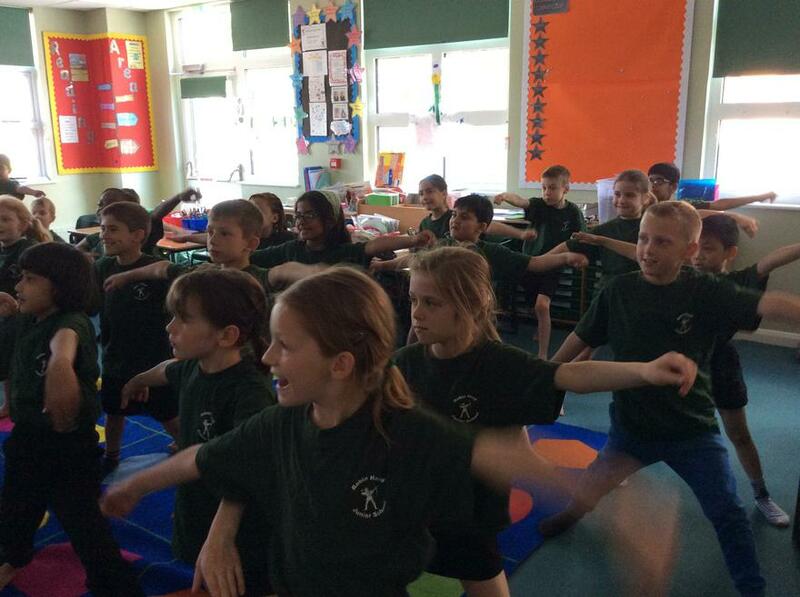 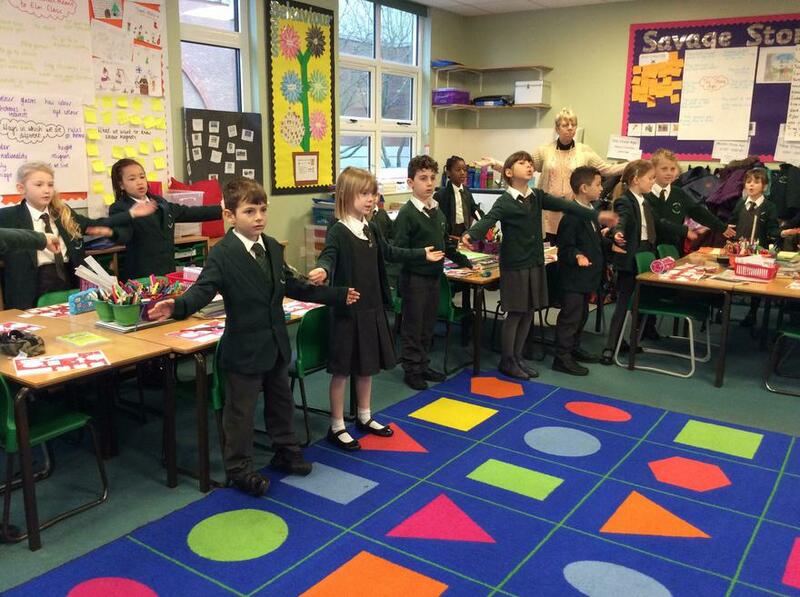 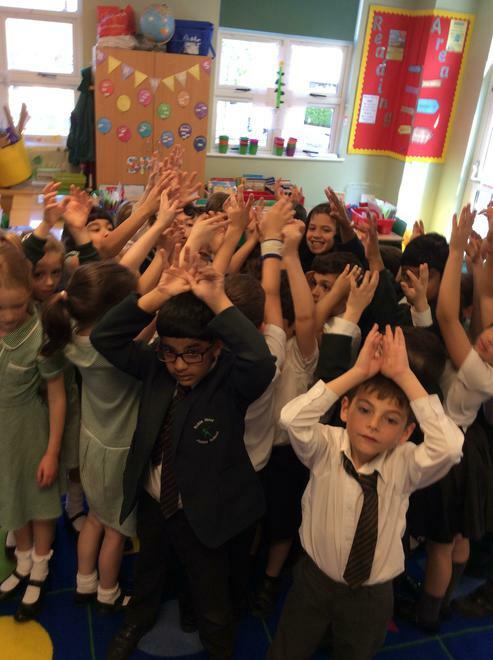 It was great fun learning poses such as 'the wizard', 'the owl' and 'the snake'! 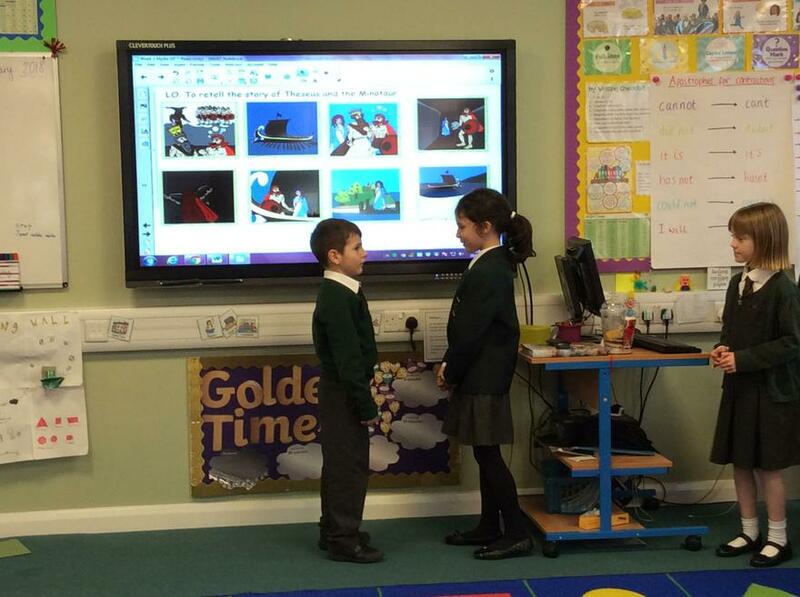 This half term we are watching the film 'Mary Poppins' to help us with our literacy work. 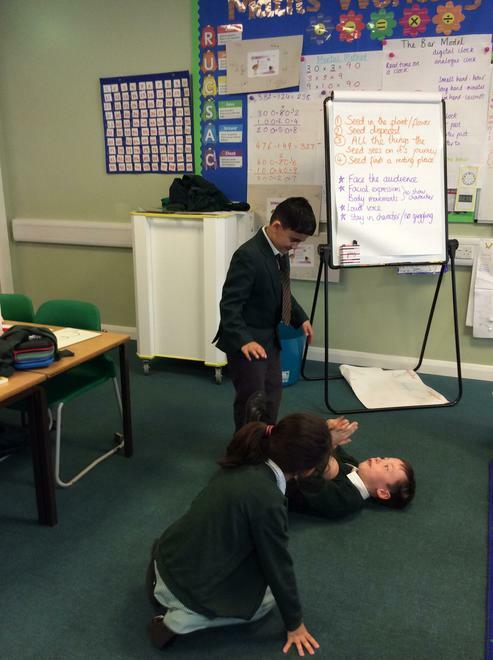 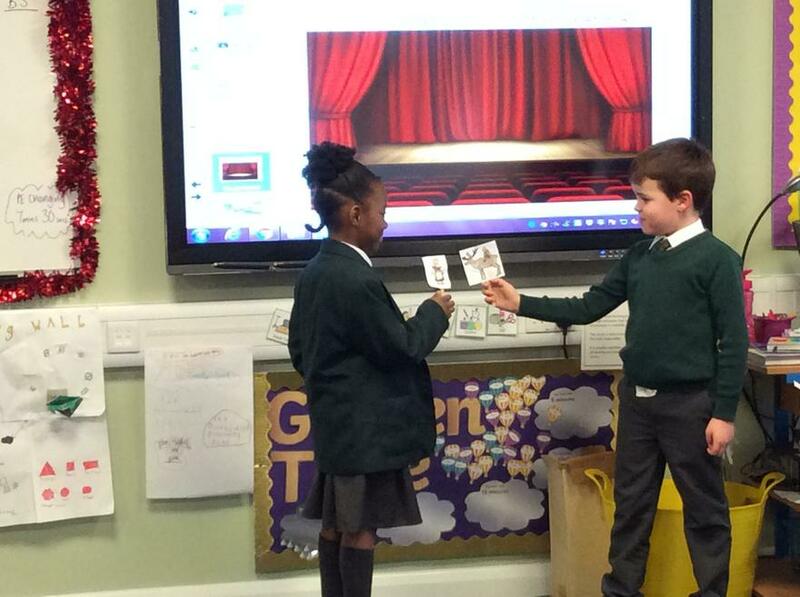 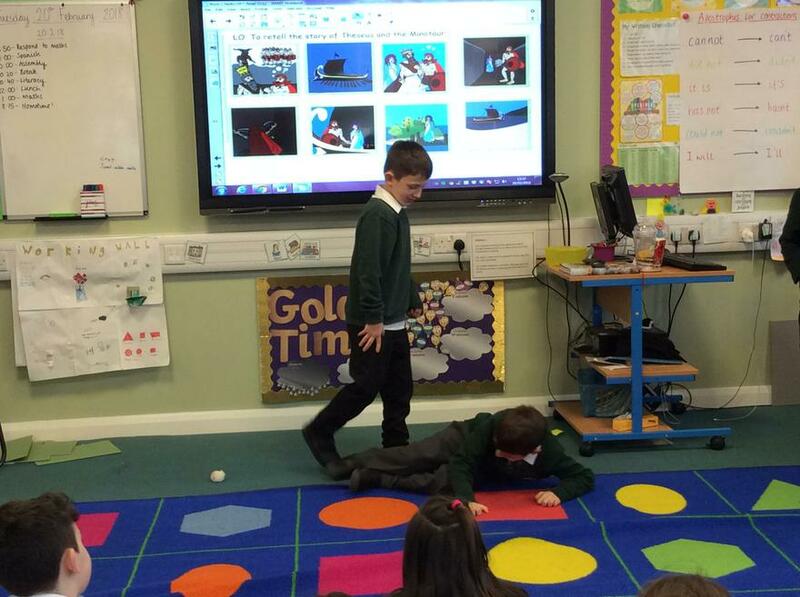 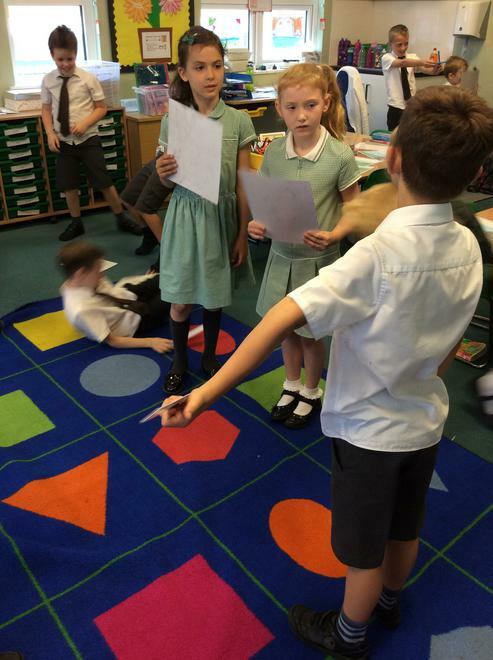 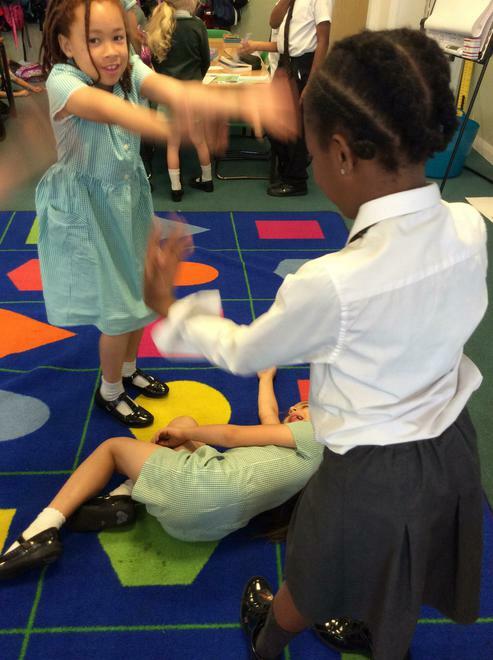 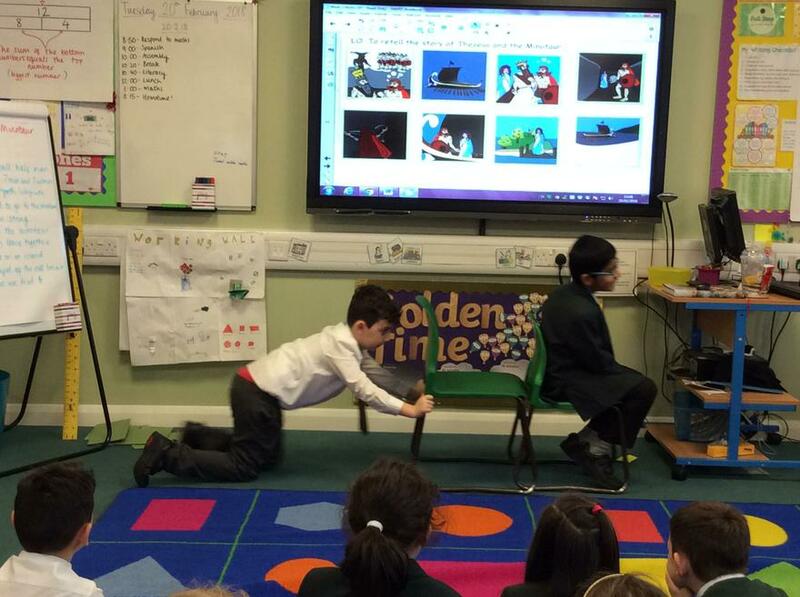 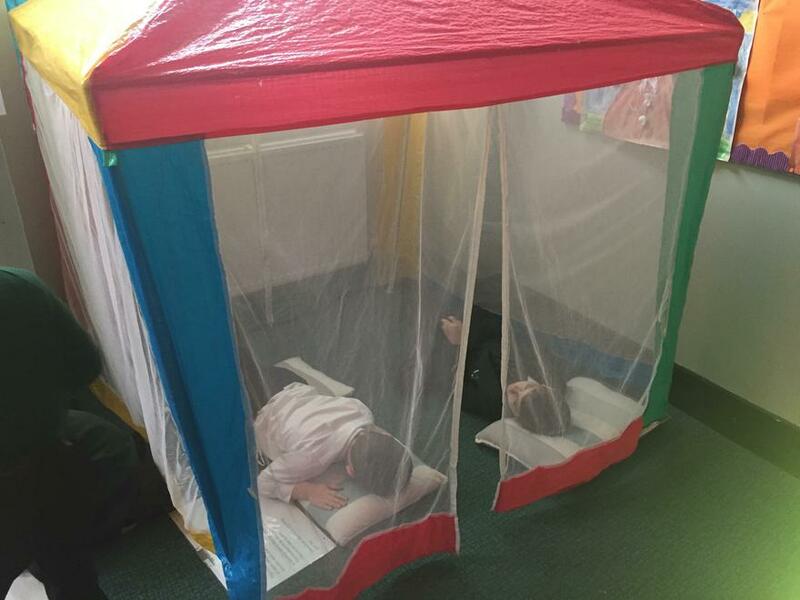 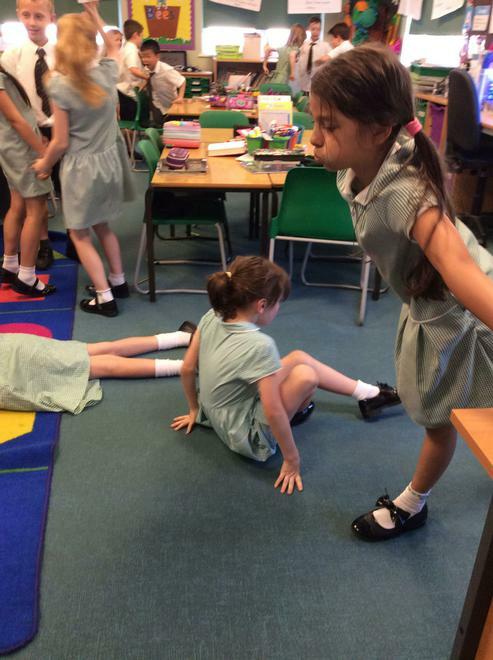 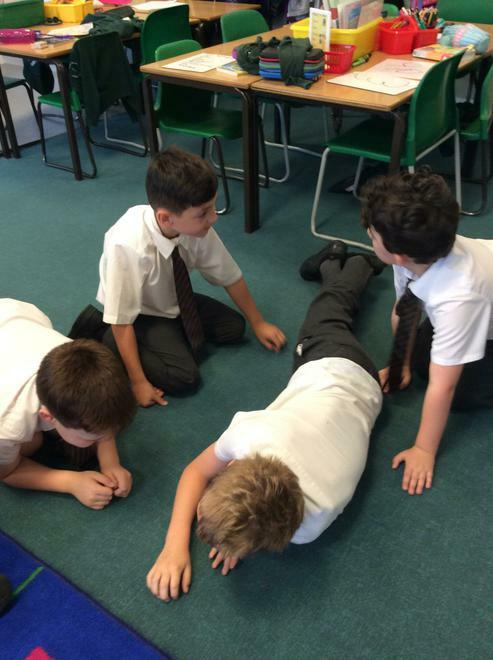 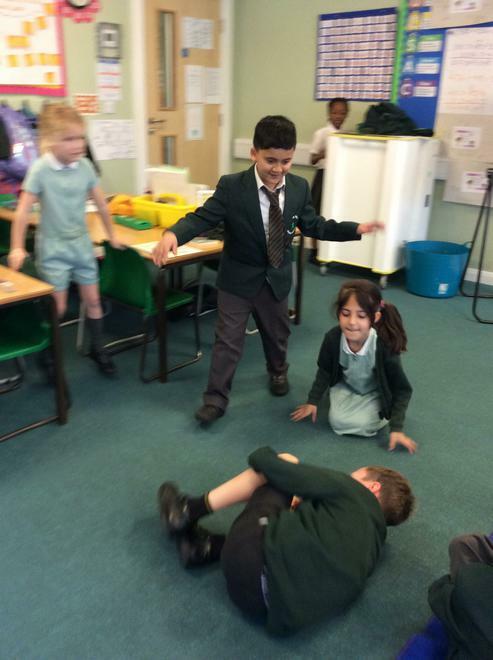 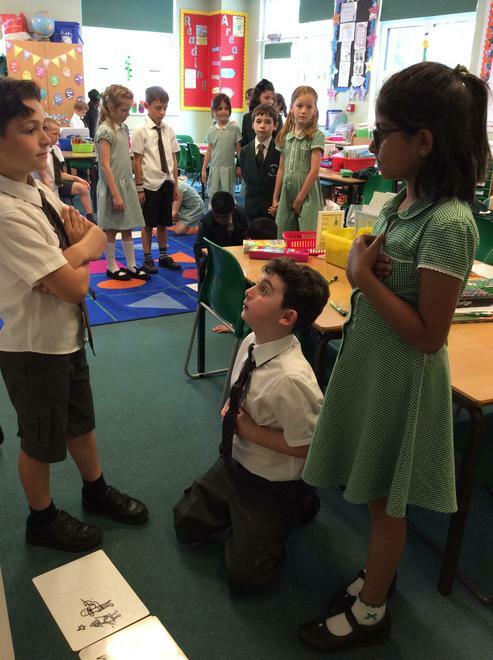 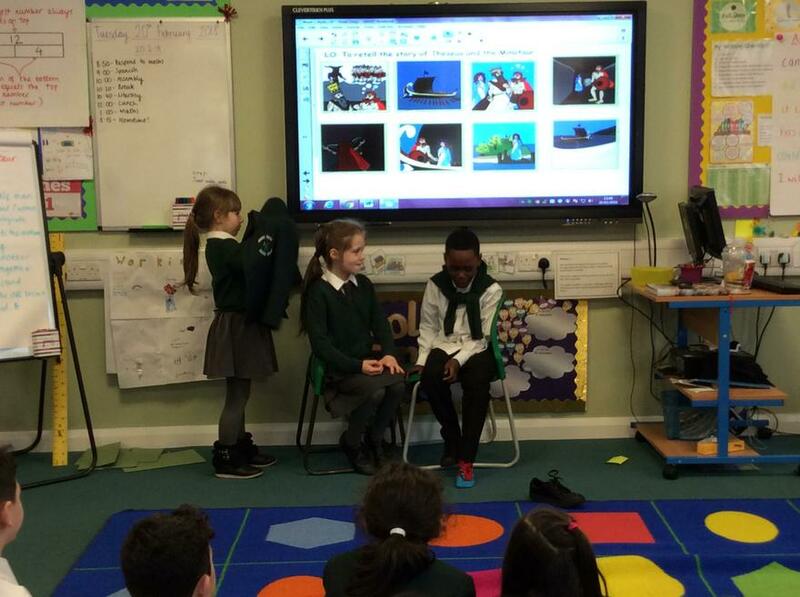 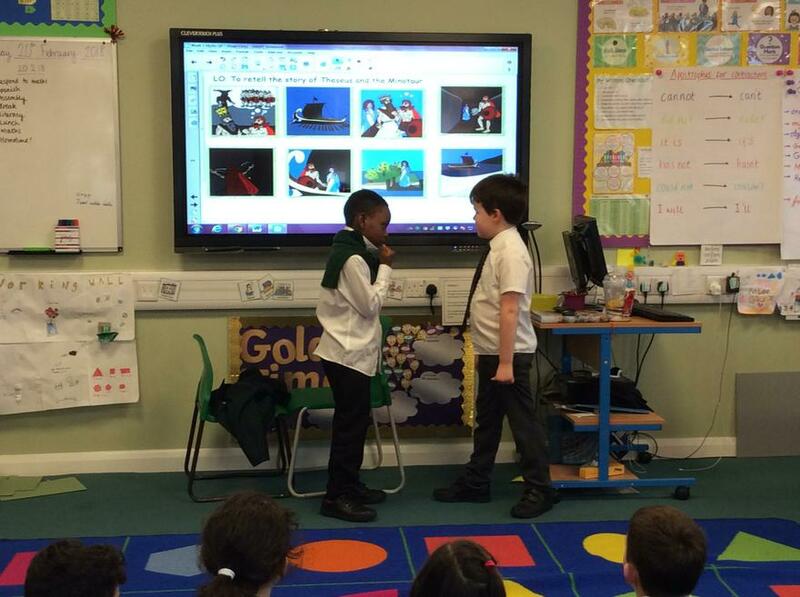 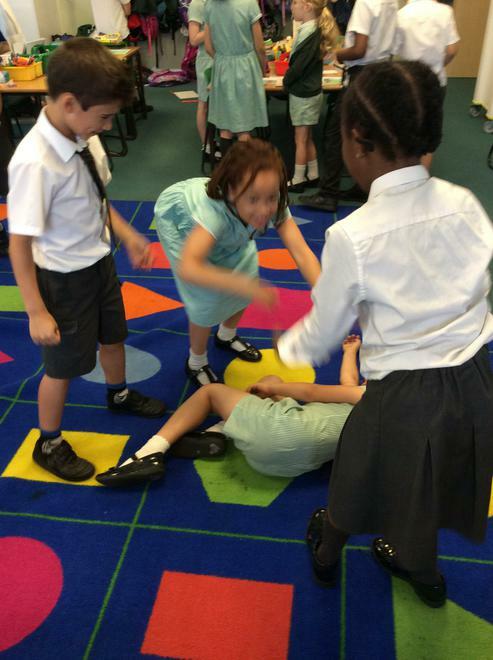 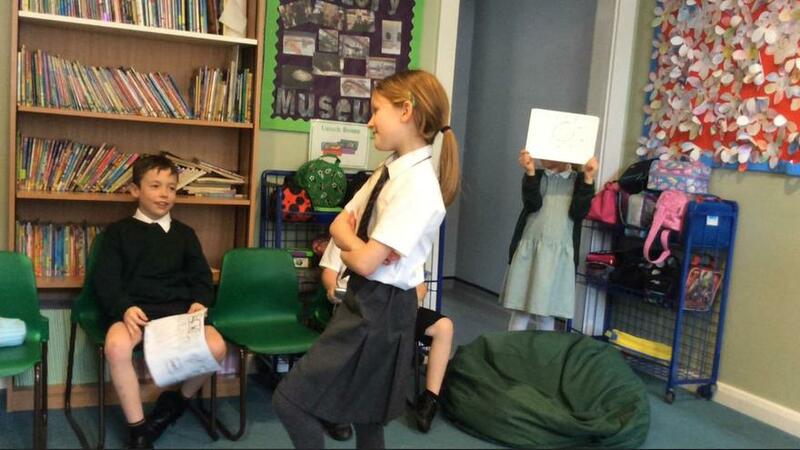 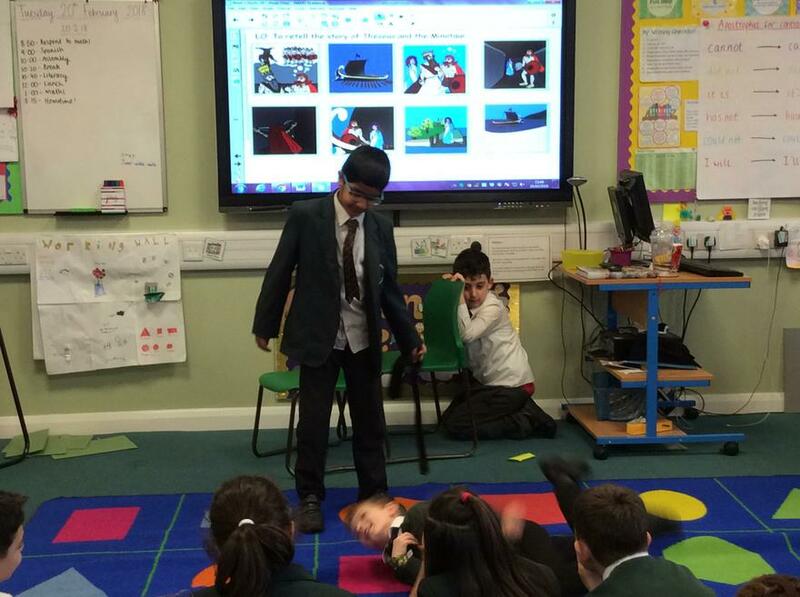 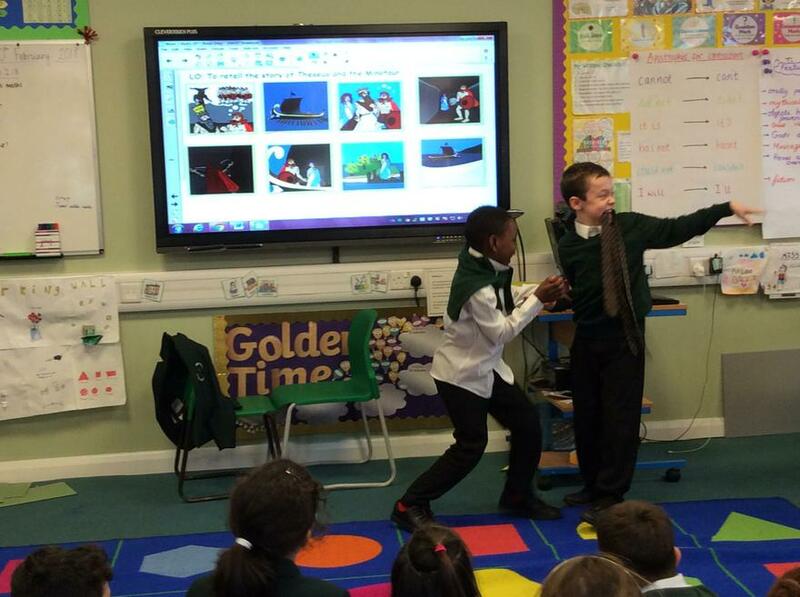 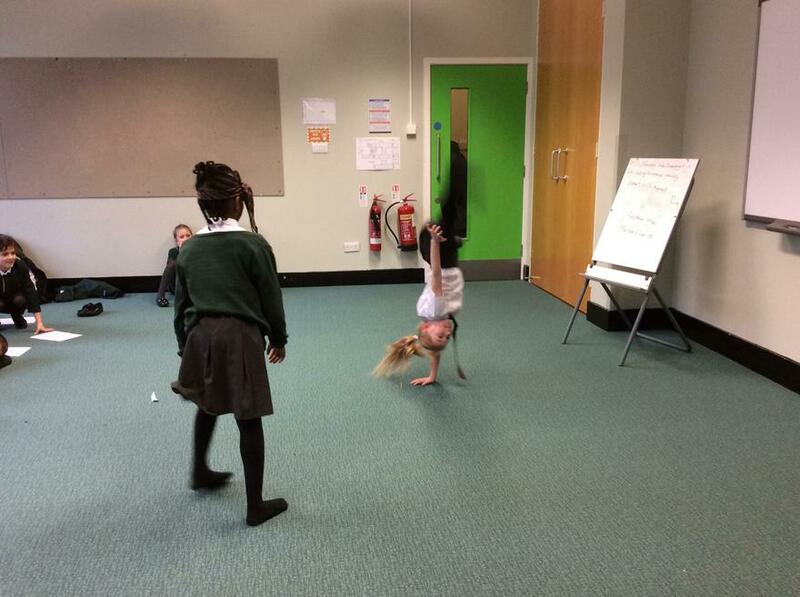 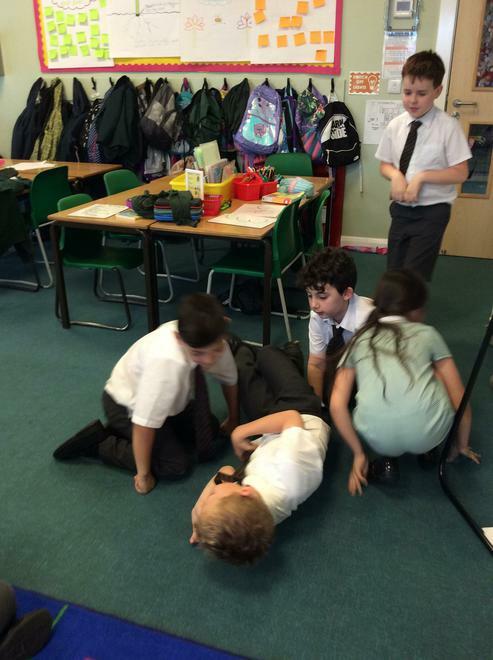 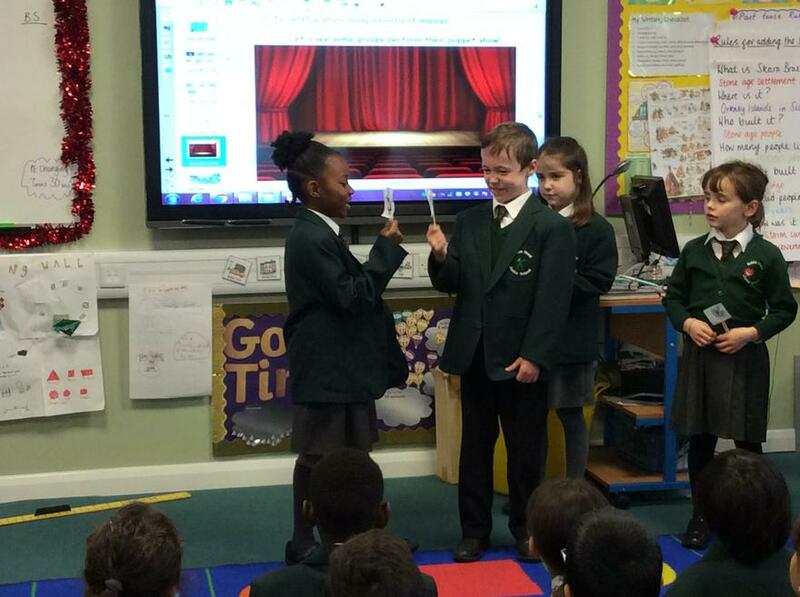 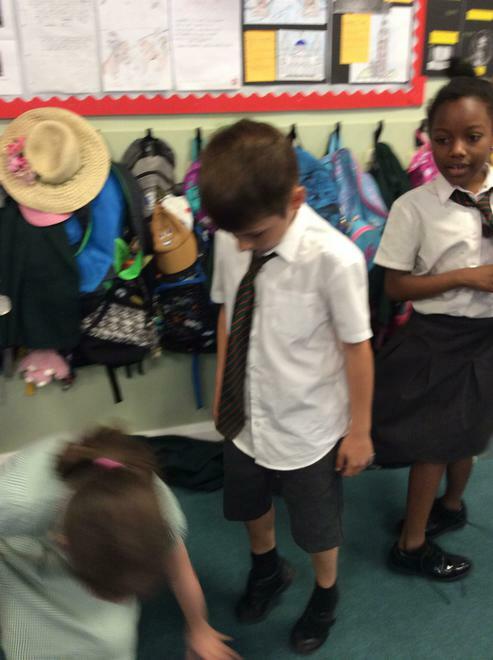 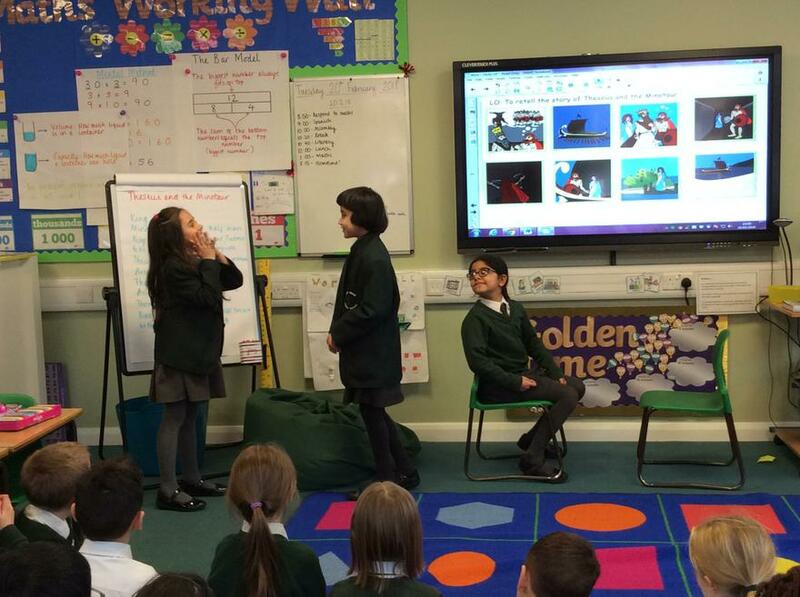 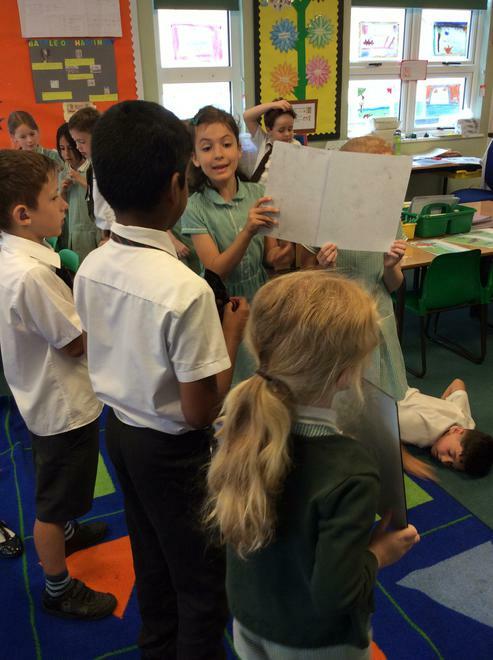 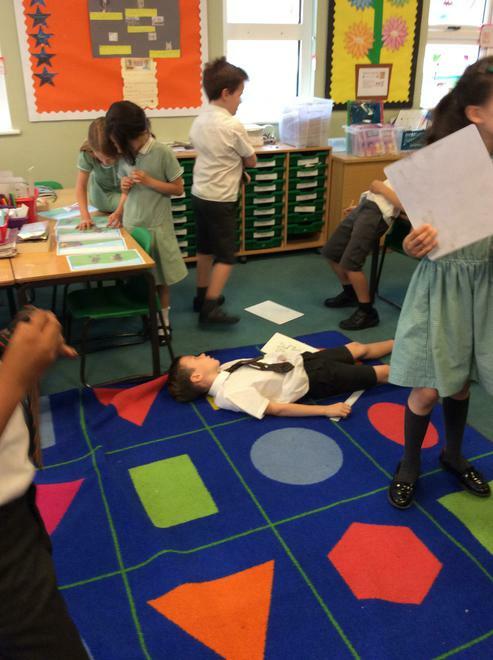 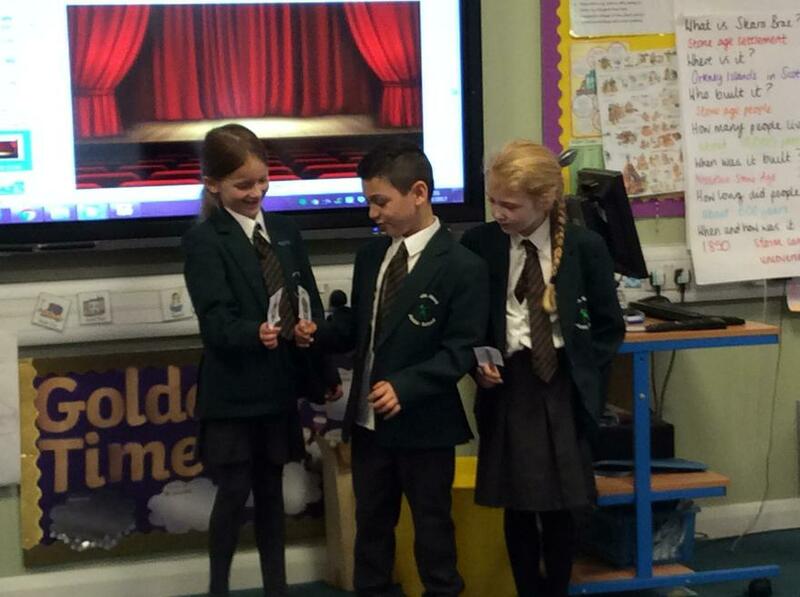 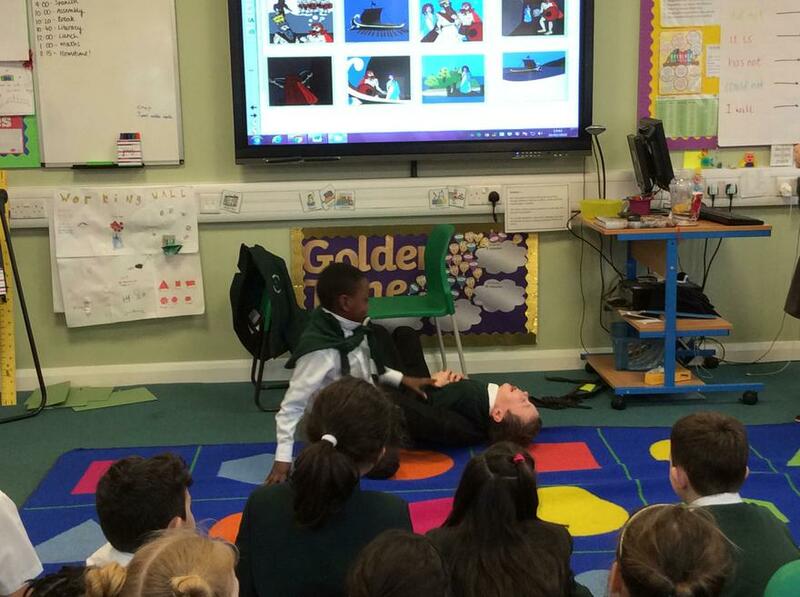 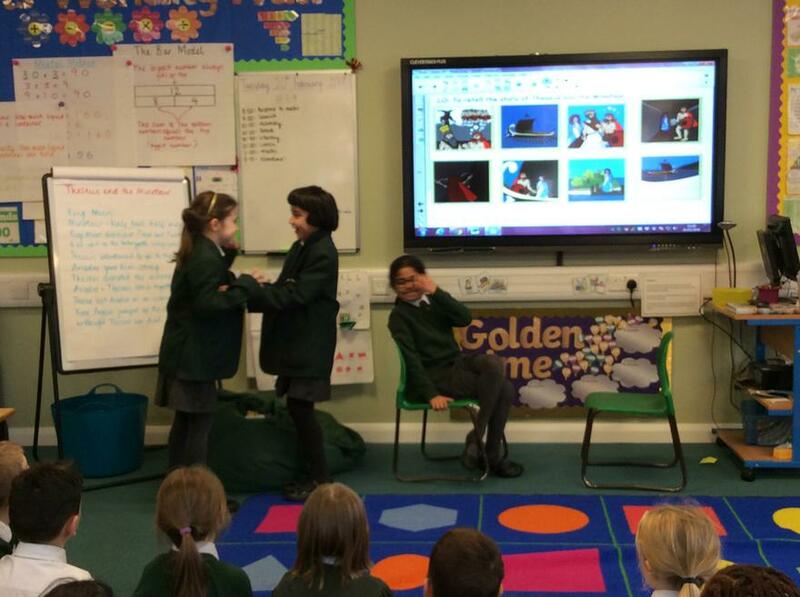 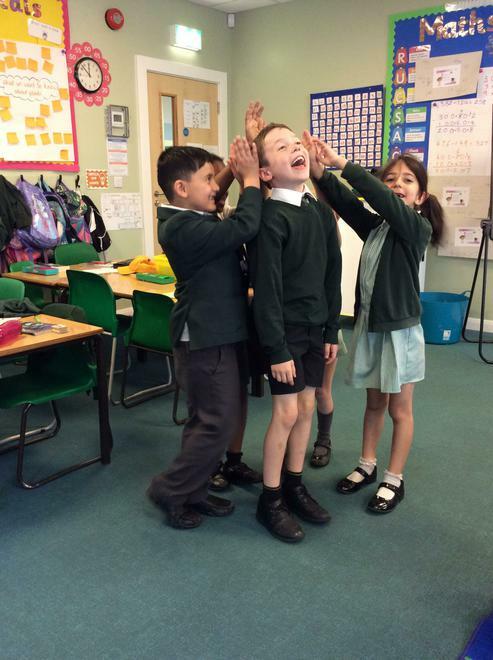 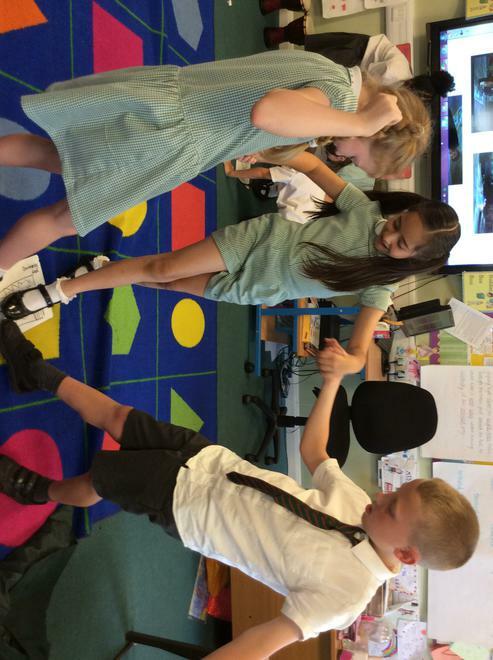 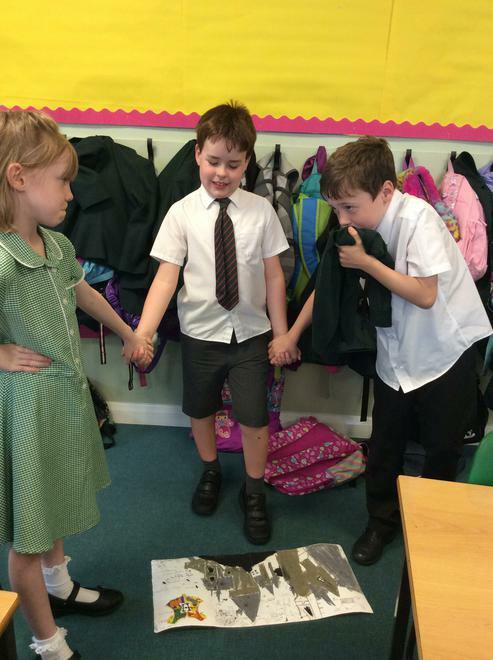 This week we used drama to help us tell part of the story and understand the characters a bit better. 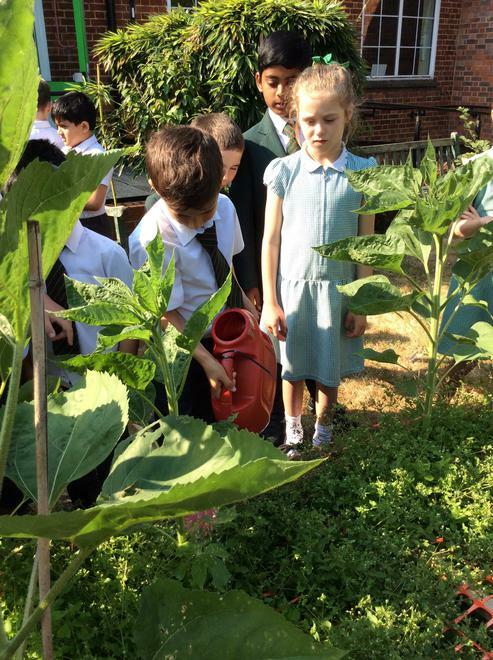 Today we went outside to look at our sunflowers to see how they have grown. 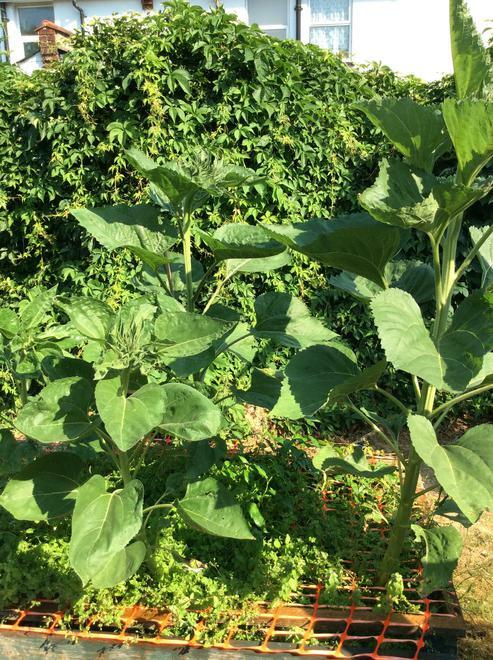 A couple of weeks ago, the sunflowers were looking a little worse for wear, but today we saw that some of them have grown quite a bit! 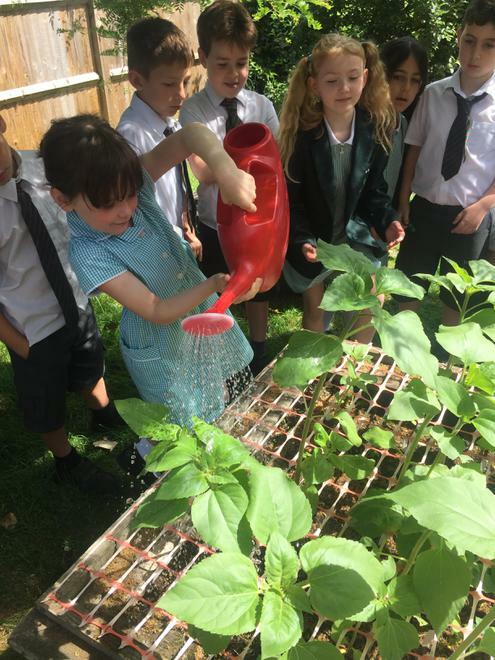 We gave them a good watering so hopefully they will grow a little more over the next week or so! 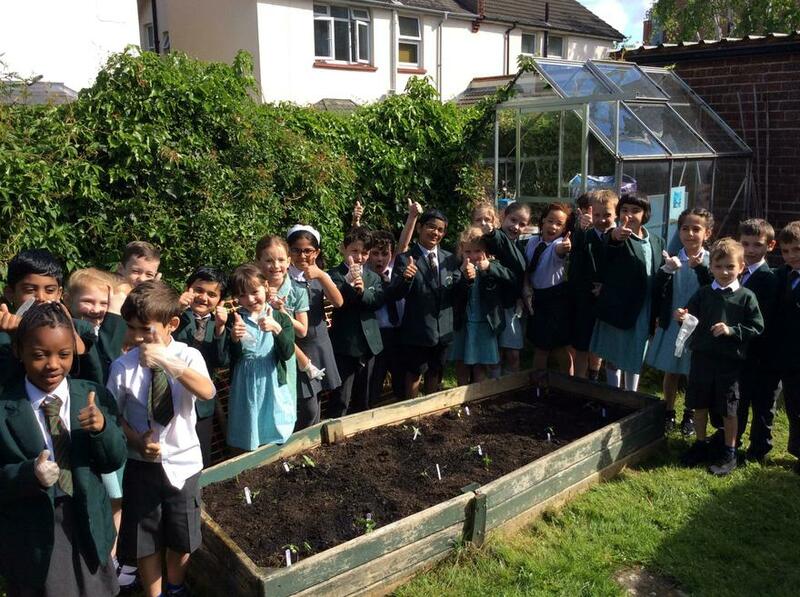 Fingers crossed we see our plants start to flower soon! 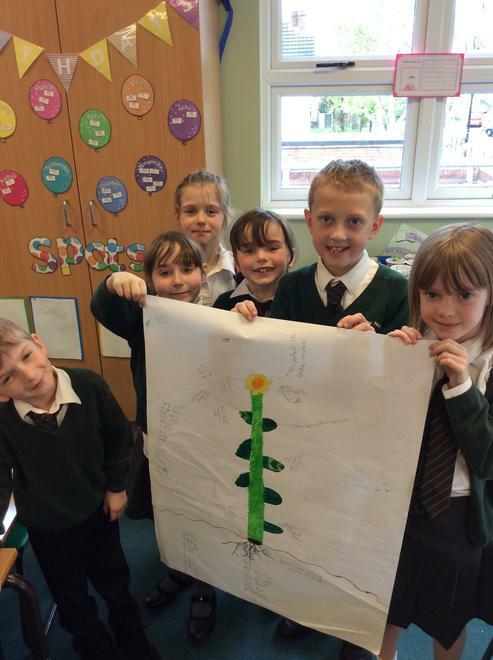 This week in Literacy, we have been building up to writing a story about the journey a seed takes once it has been made in the plant. 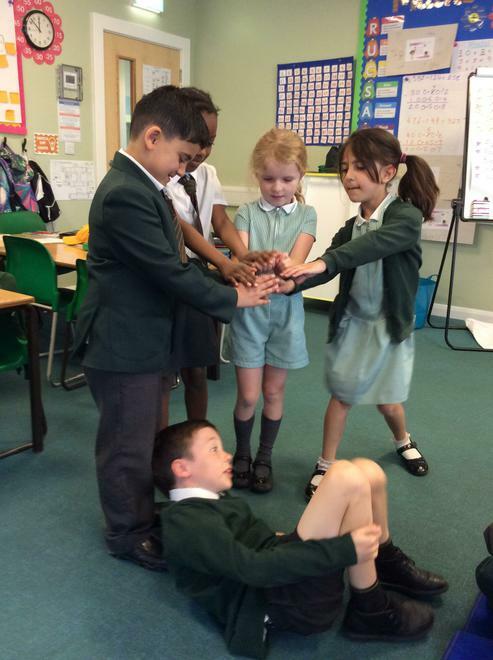 To help form our ideas further, we used drama as a stimulus and became the seeds! 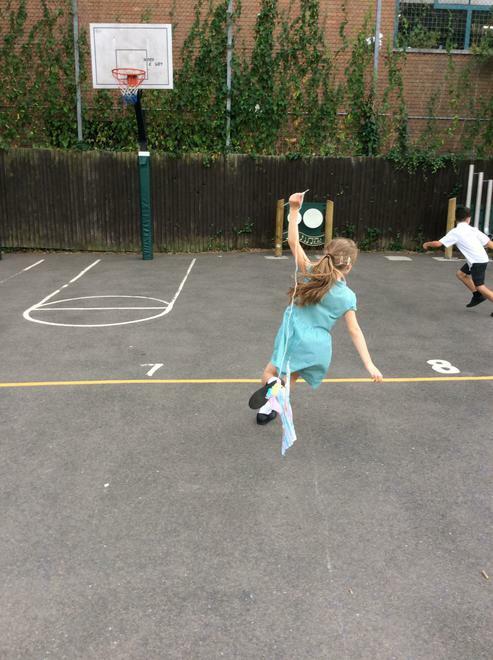 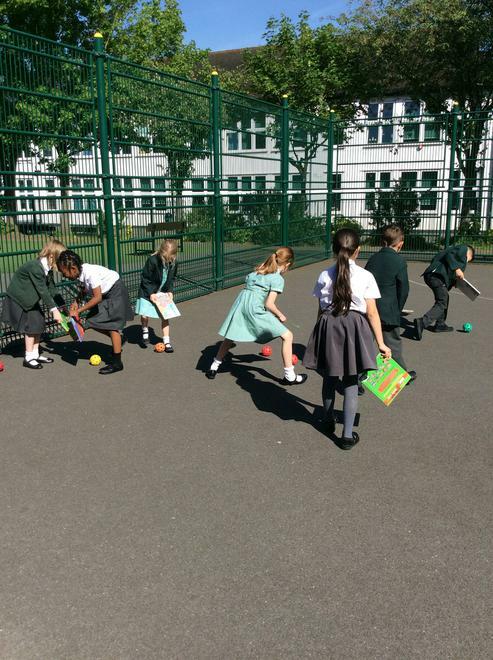 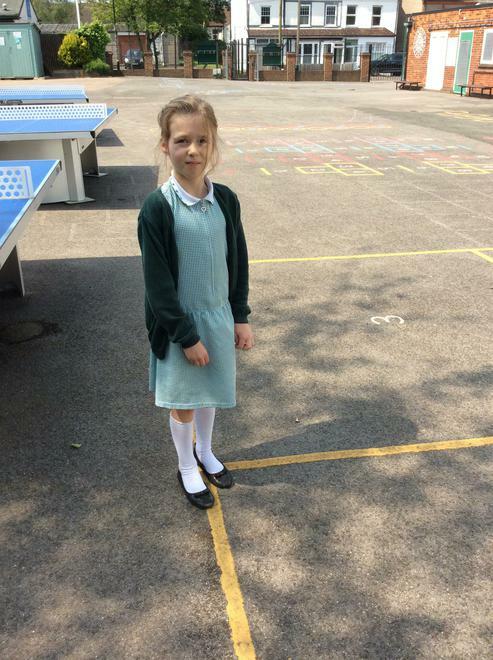 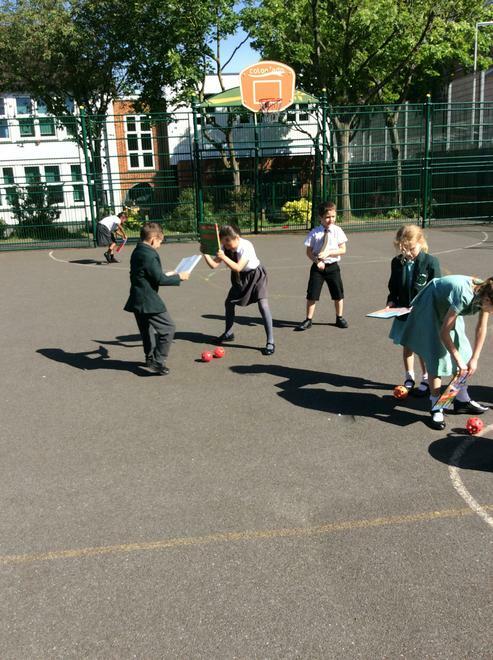 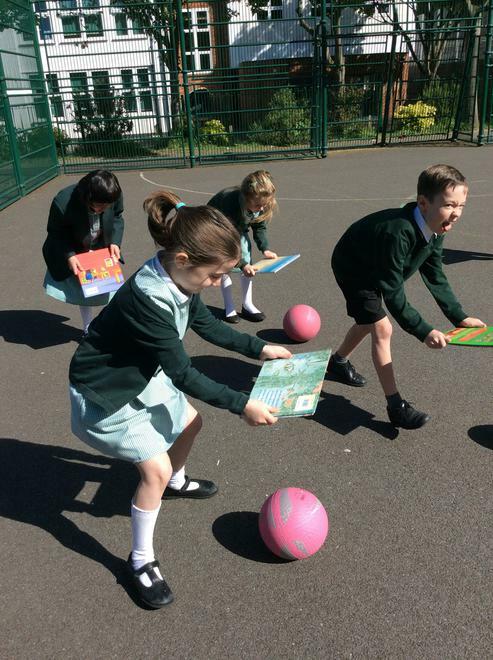 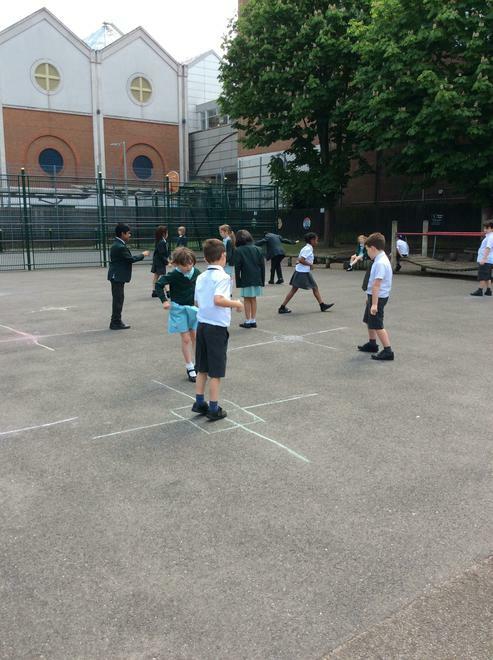 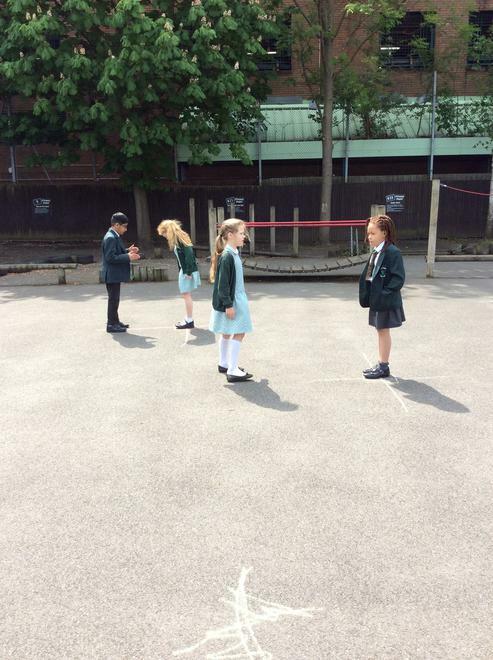 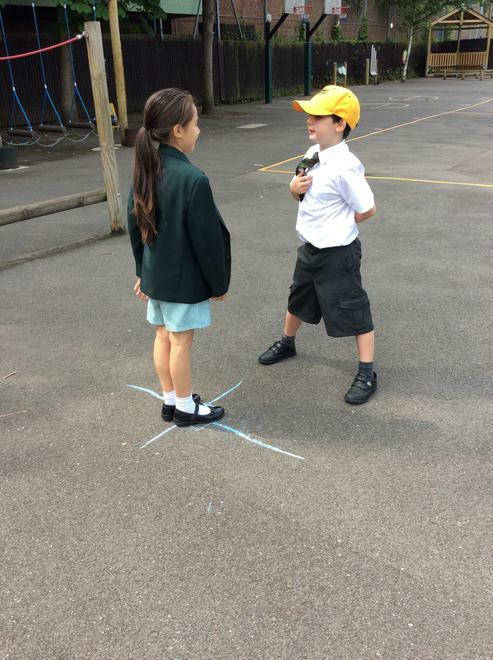 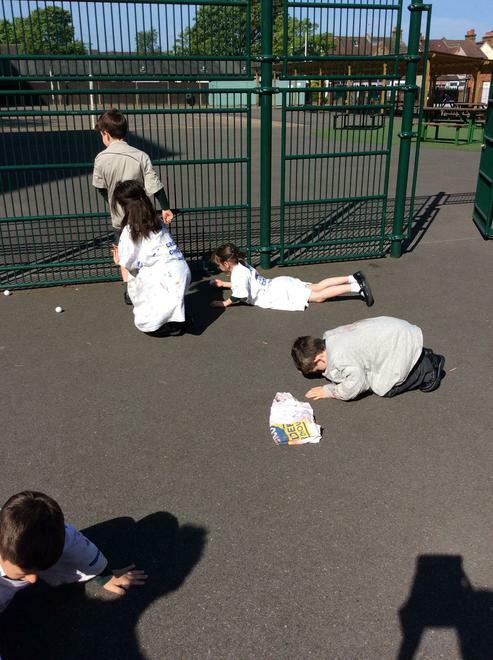 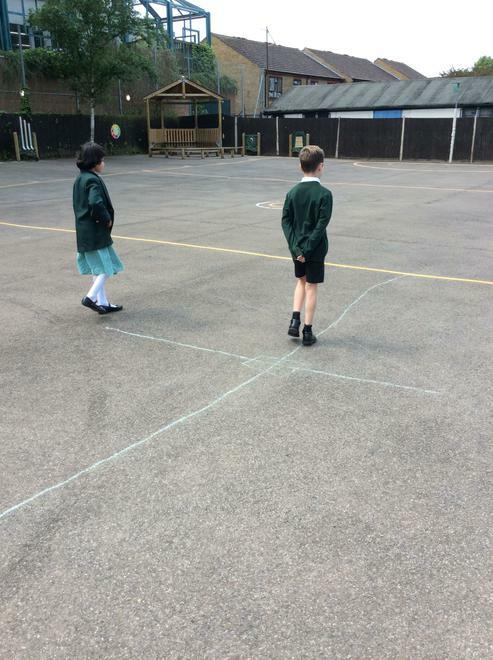 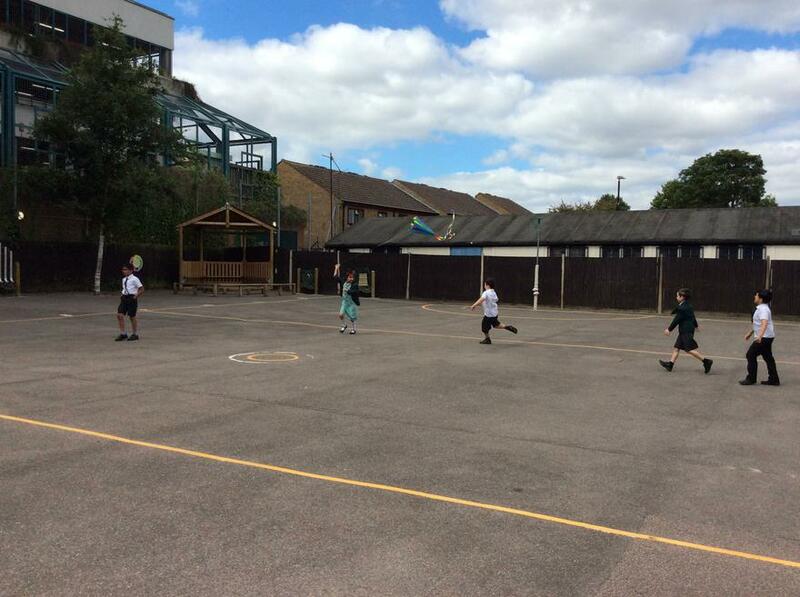 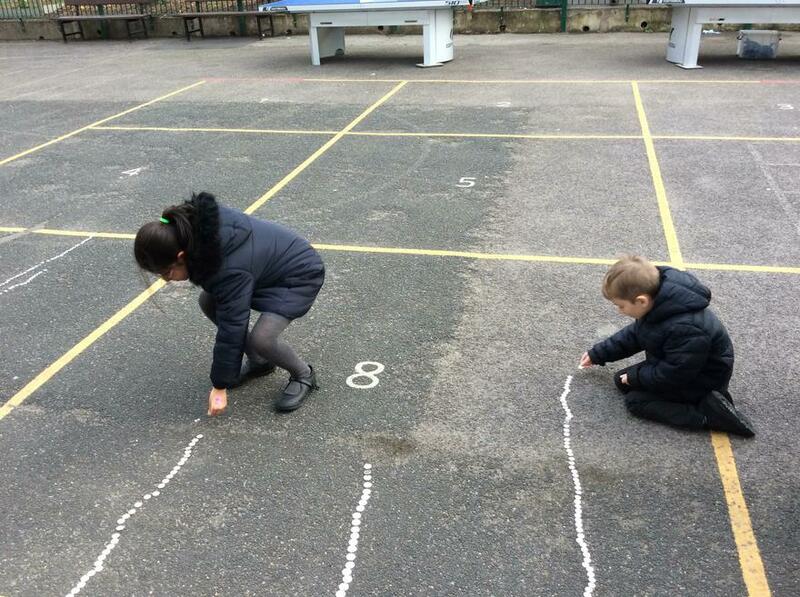 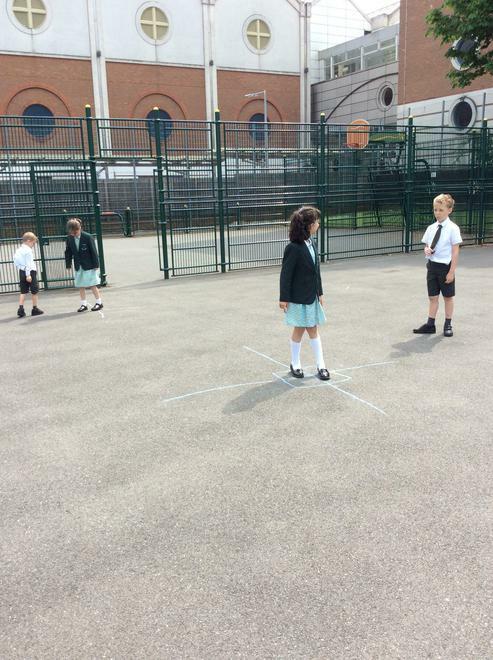 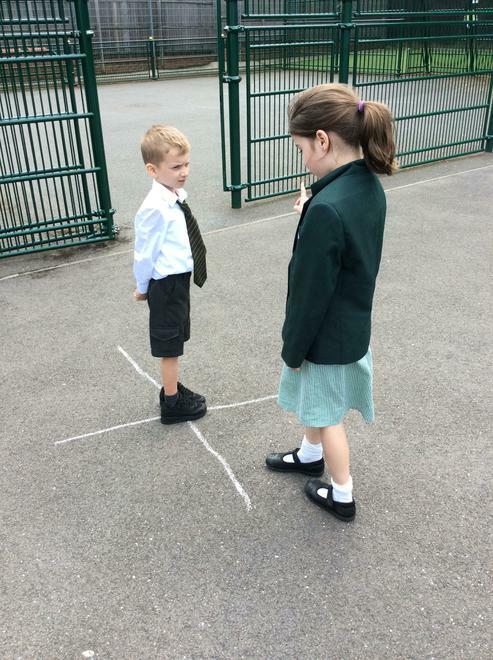 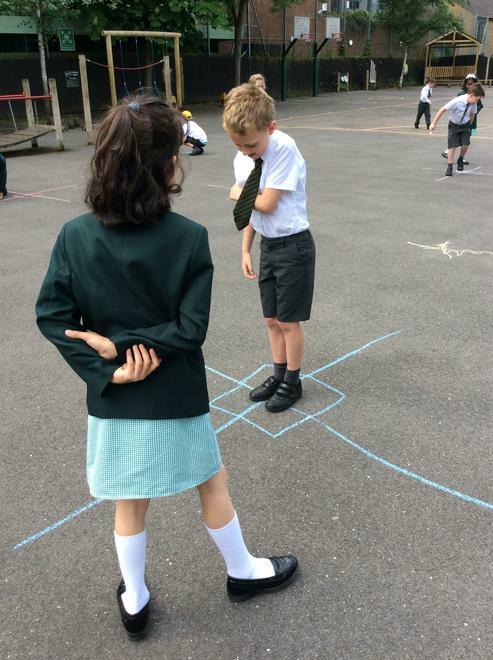 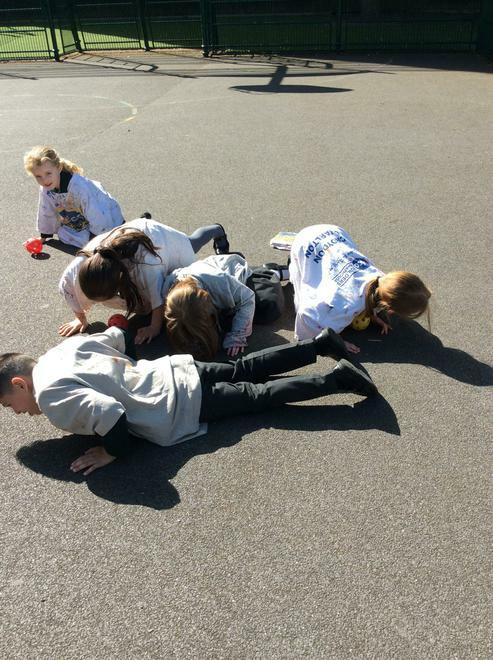 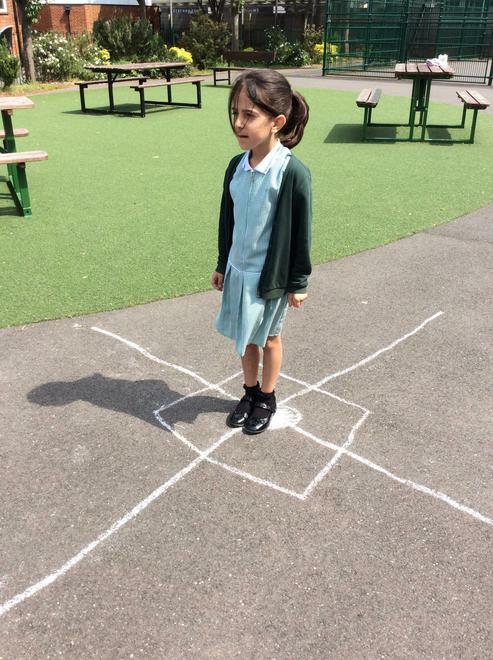 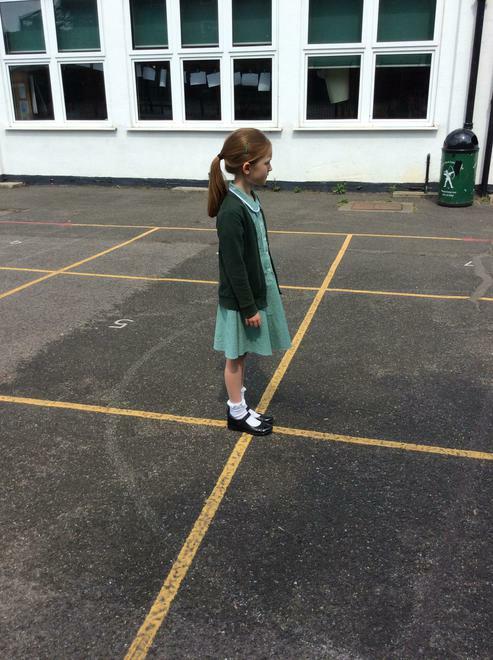 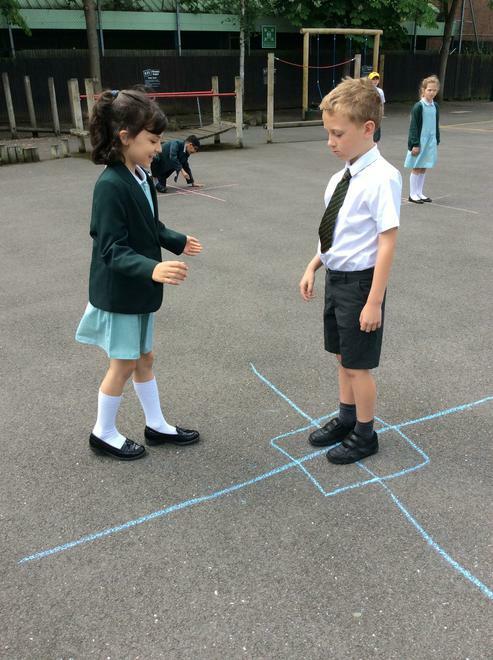 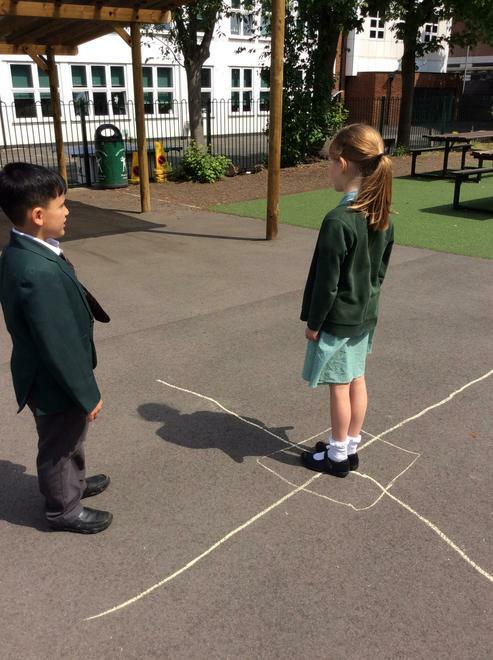 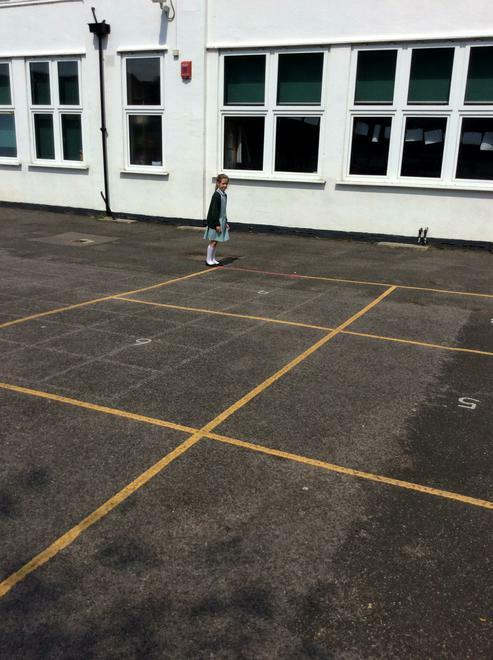 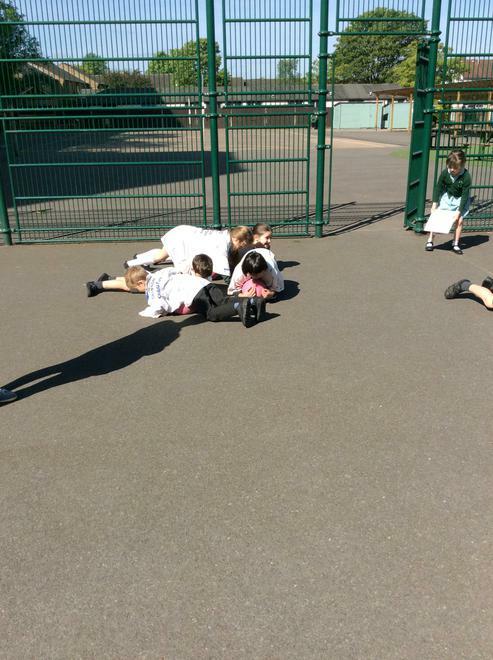 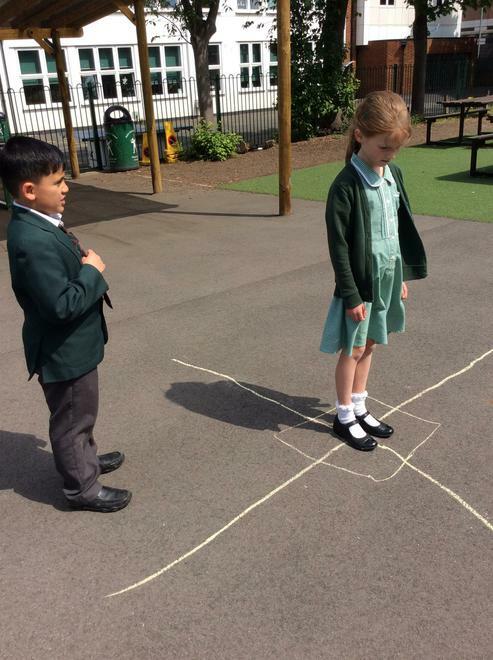 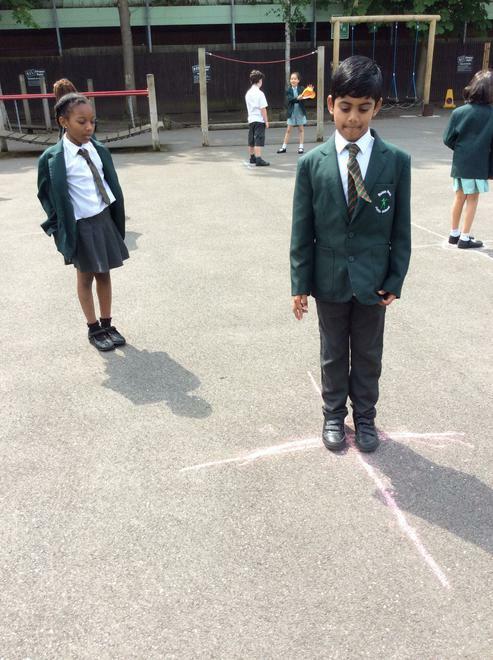 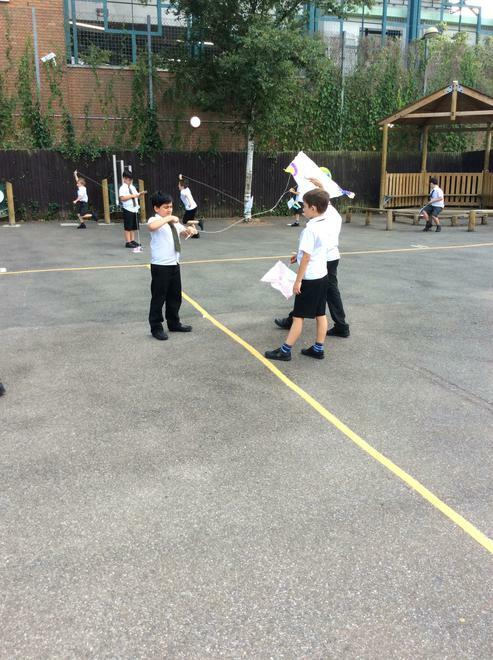 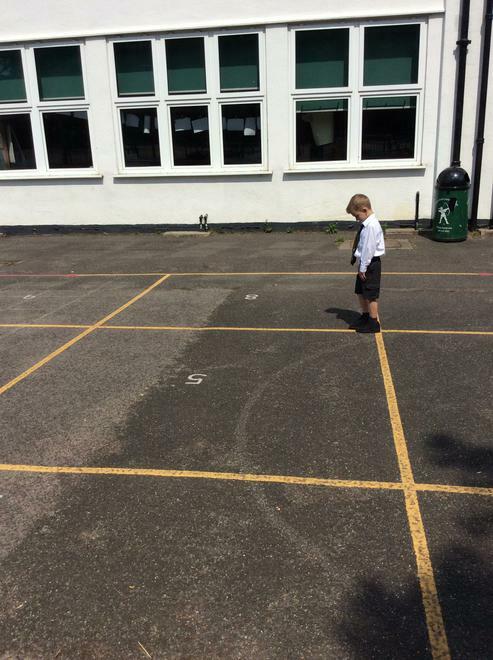 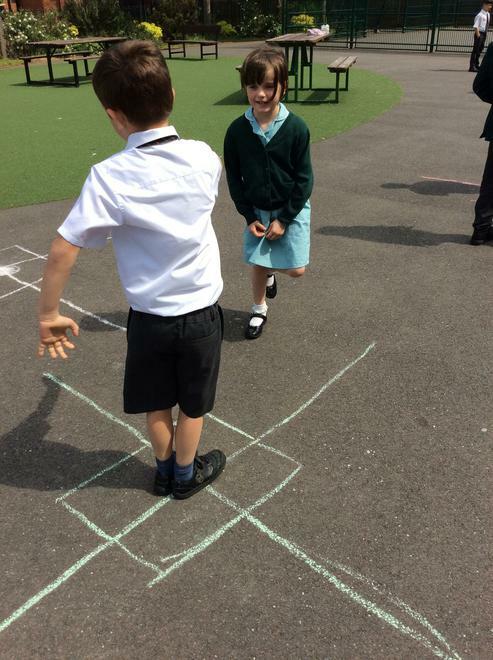 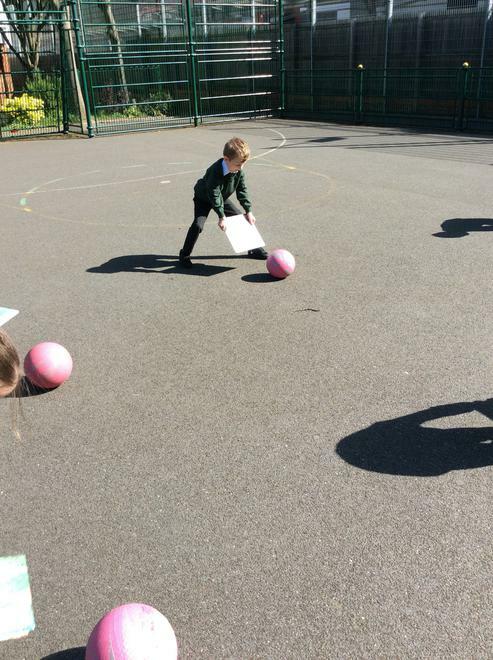 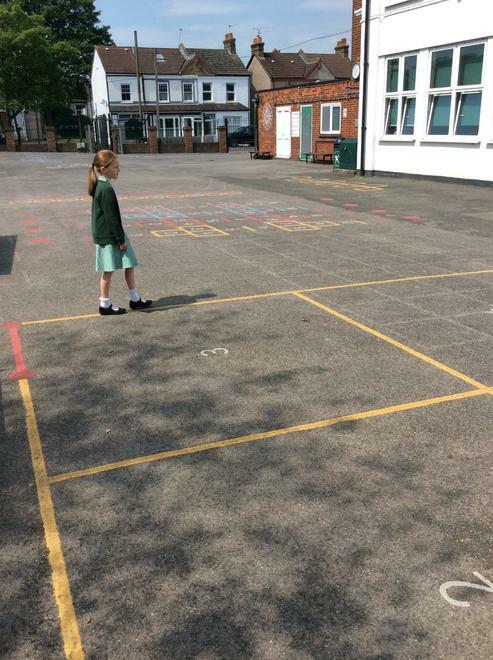 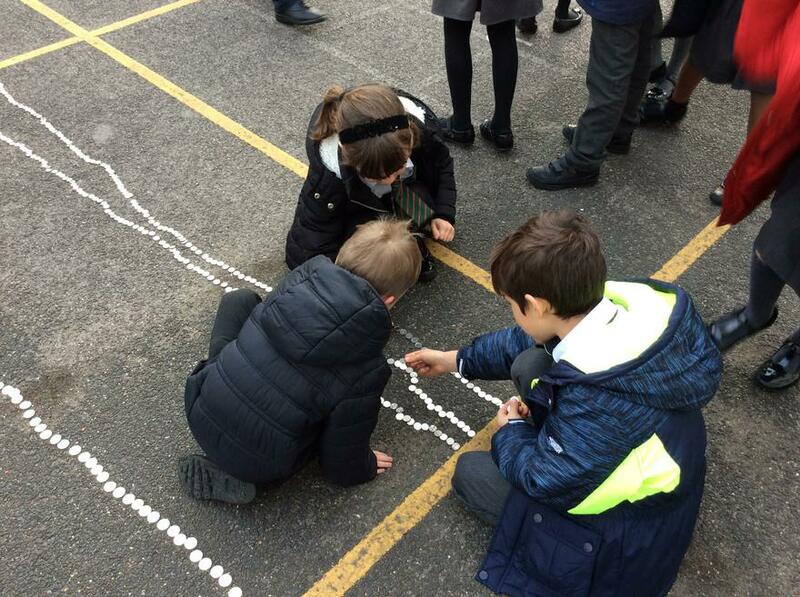 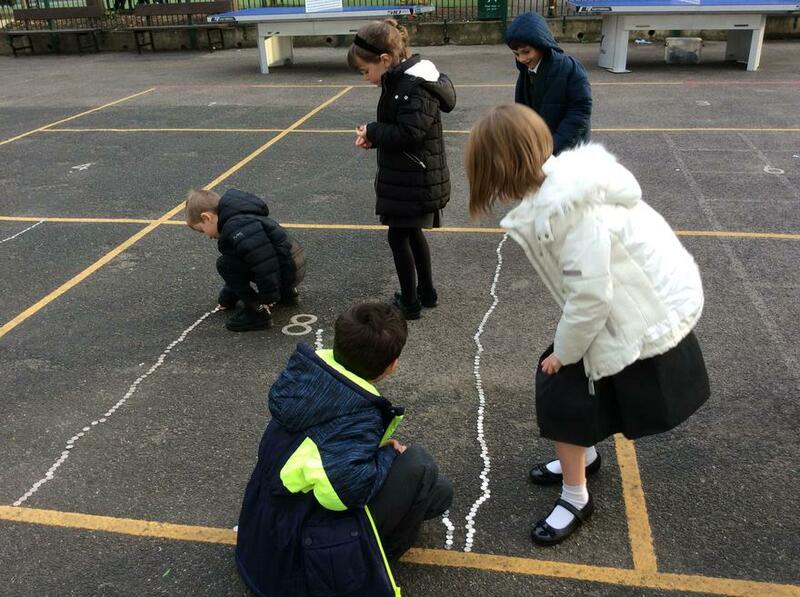 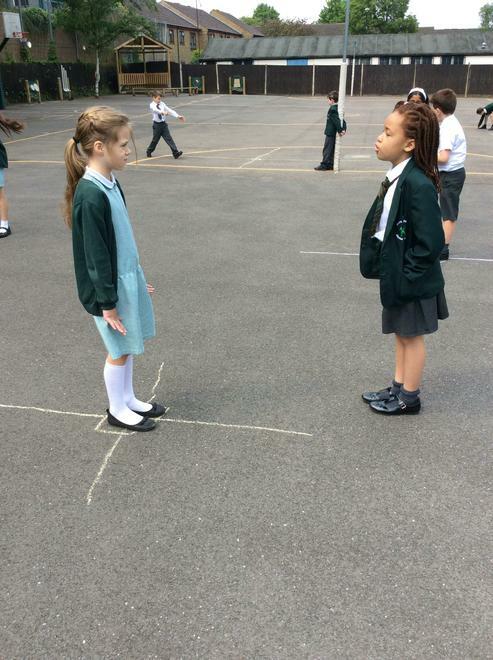 We have been learning about different angles this week in Maths and today we took our learning outside to see if we could apply our knowledge of angles to different turns! 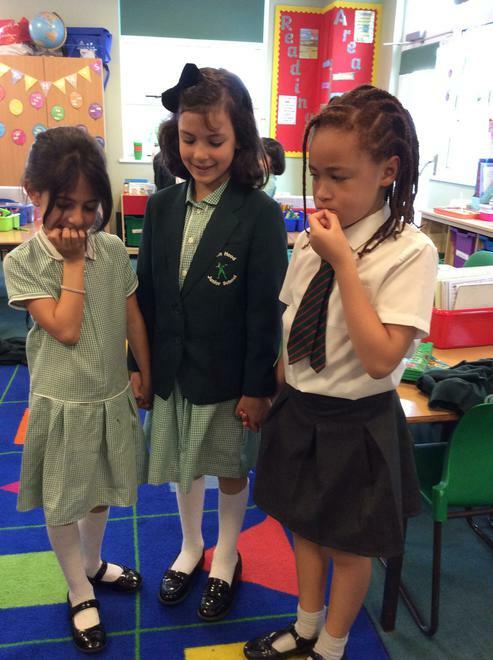 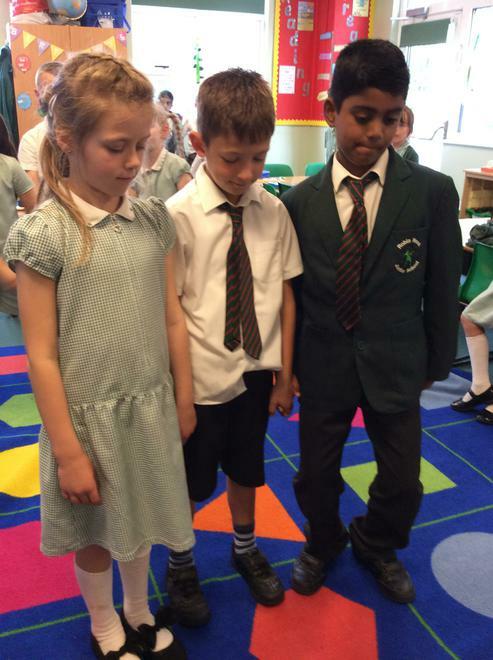 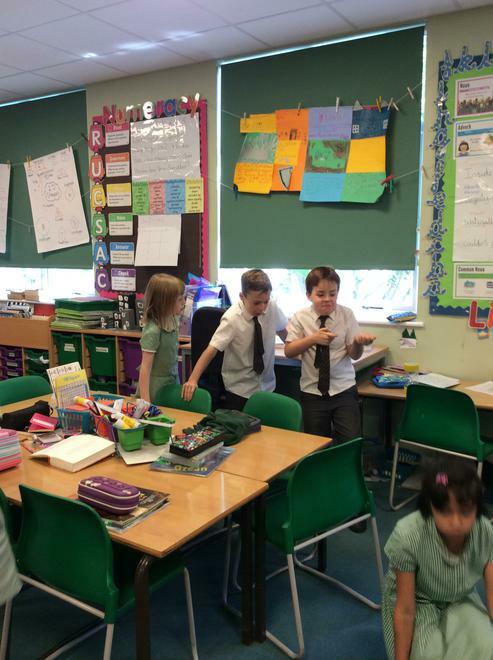 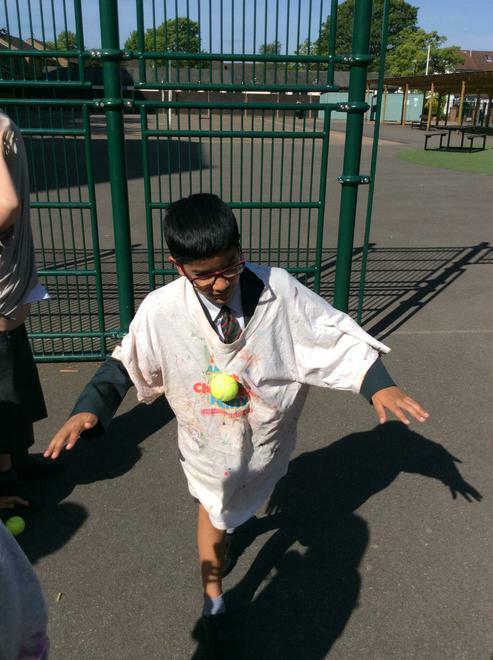 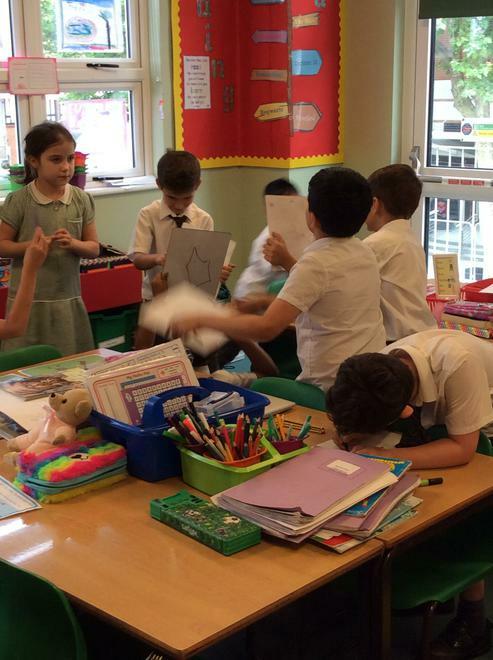 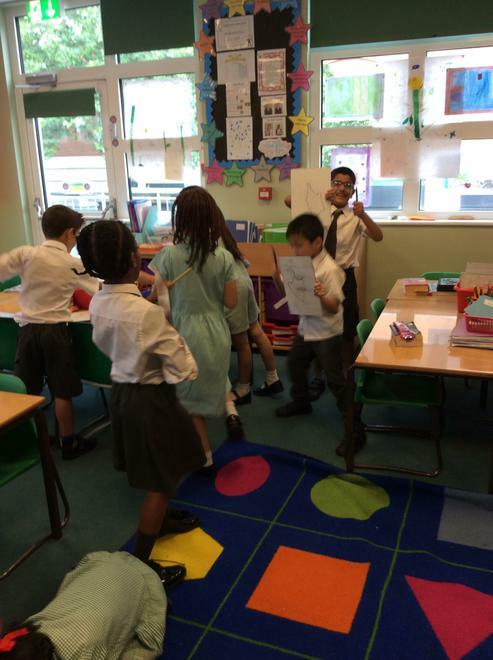 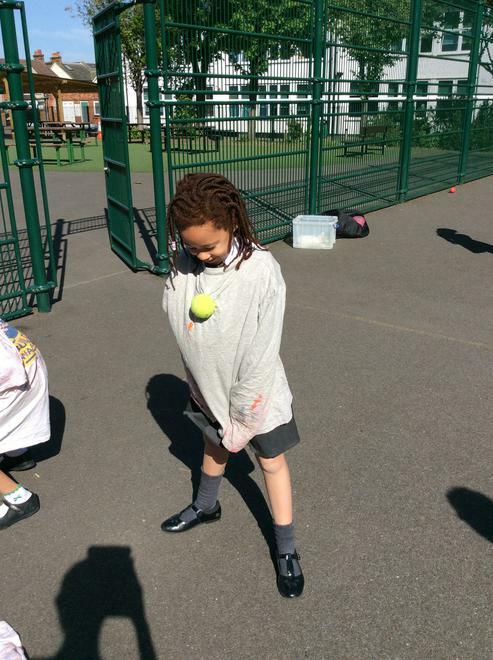 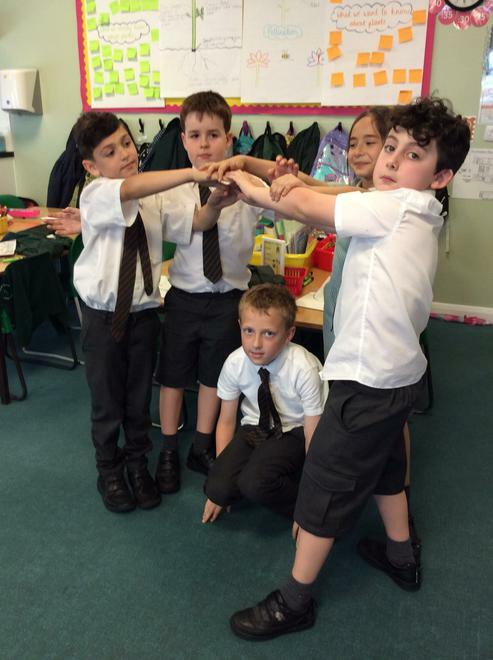 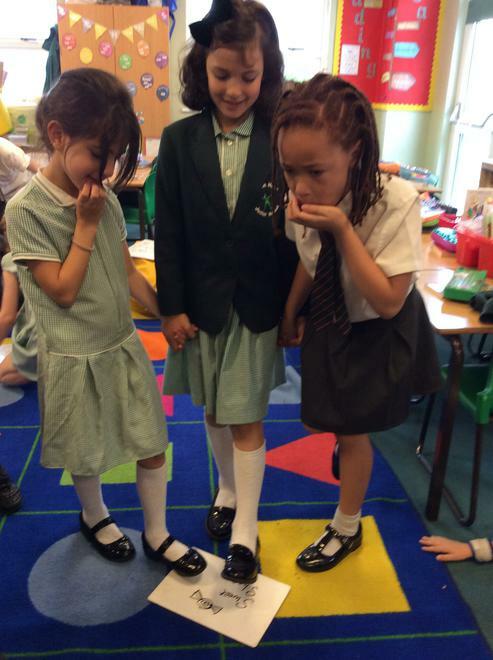 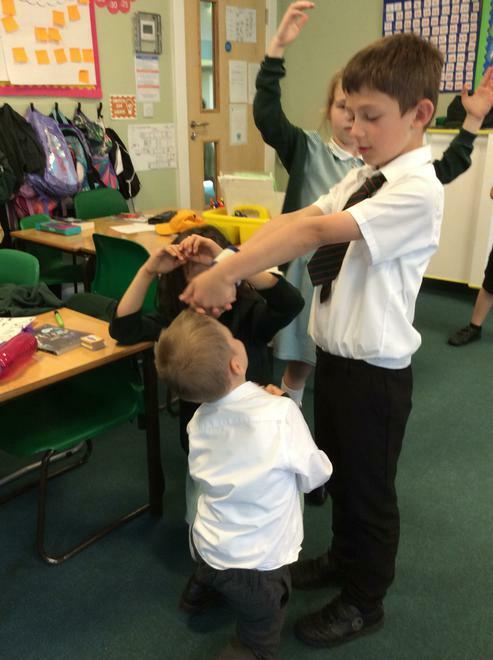 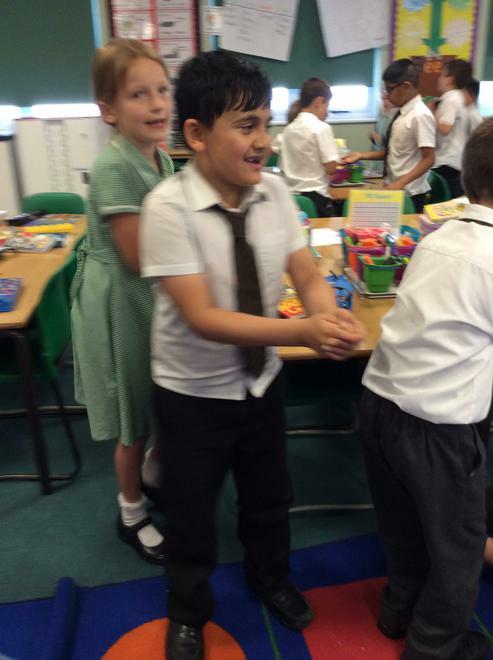 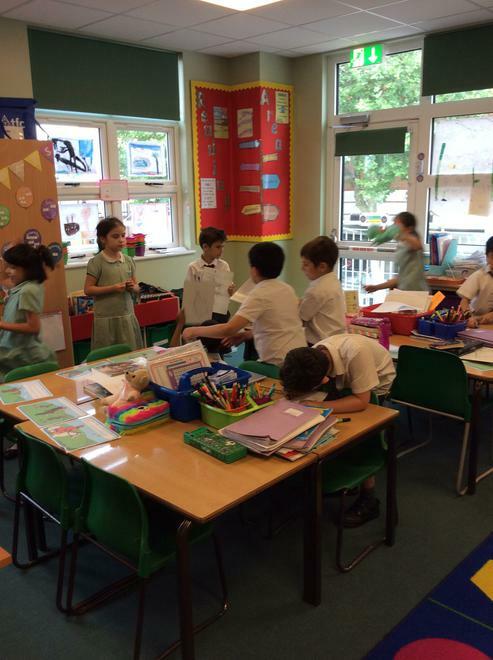 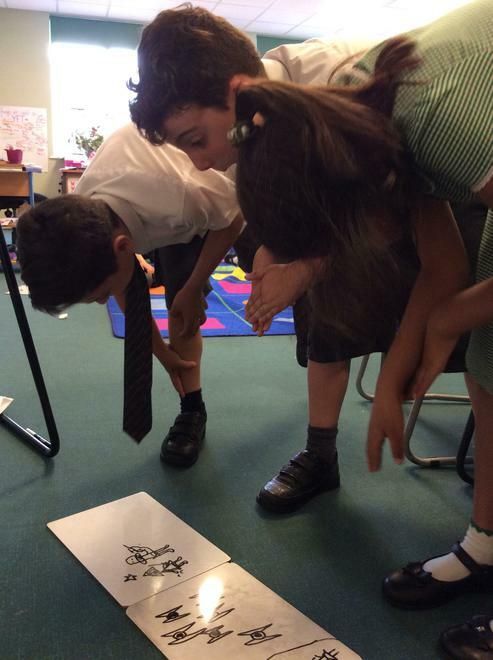 Building on from our learning of pollination in Science this week, today we looked at the process of seed dispersal. 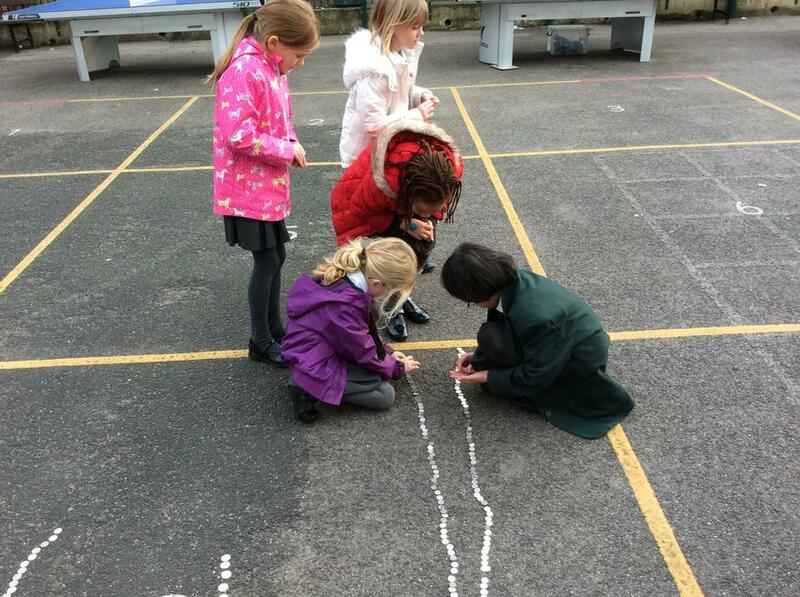 We talked about the different ways that different plants disperse their seeds and why they need to do this. 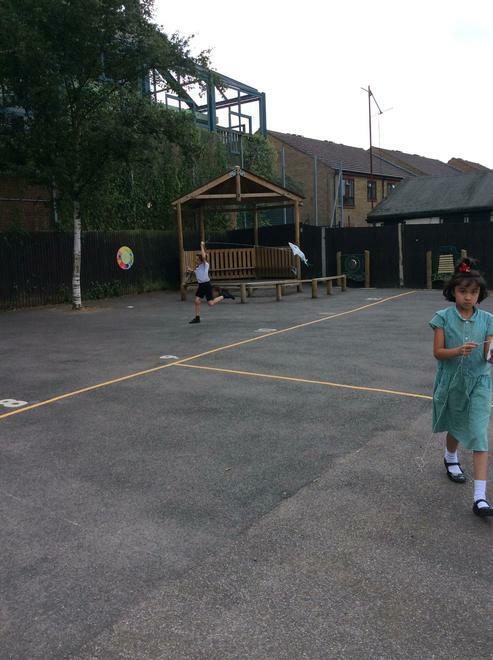 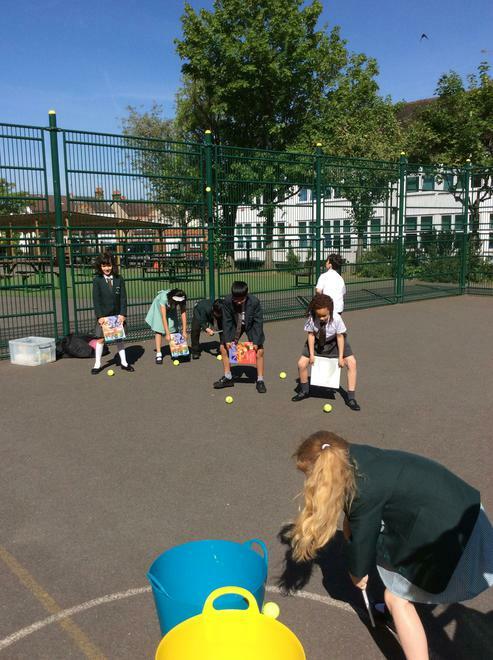 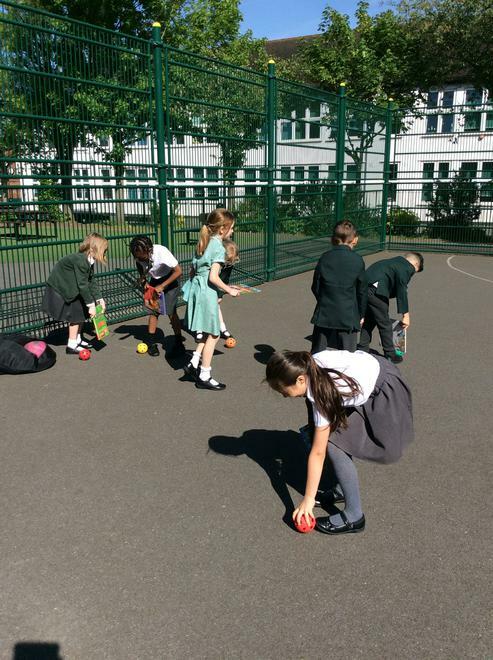 We went outside to investigate the different methods of seed dispersal and used different sized and types of balls to act as the different types of seed. 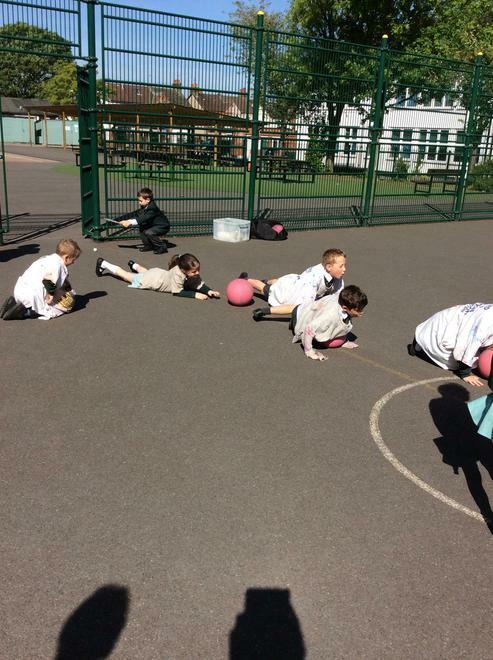 Using the methods of wind, water, sticking to animals and explosion, we saw how many of each of the different 'seeds' we could get to the middle of the playground and then discussed the fact that real seeds are adapted to suit the form of seed dispersal that best suits each plant, just like each of the balls performed differently in each of the methods. 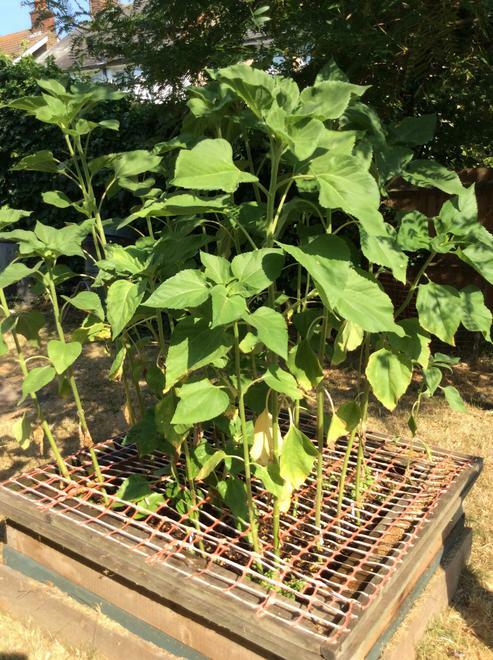 After a few weeks in their initial pots, our sunflowers had all grown stems and leaves and were big enough to move them into a bigger pot! 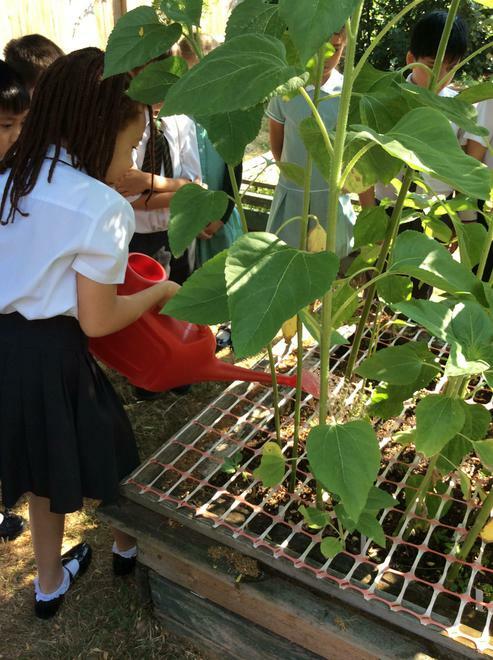 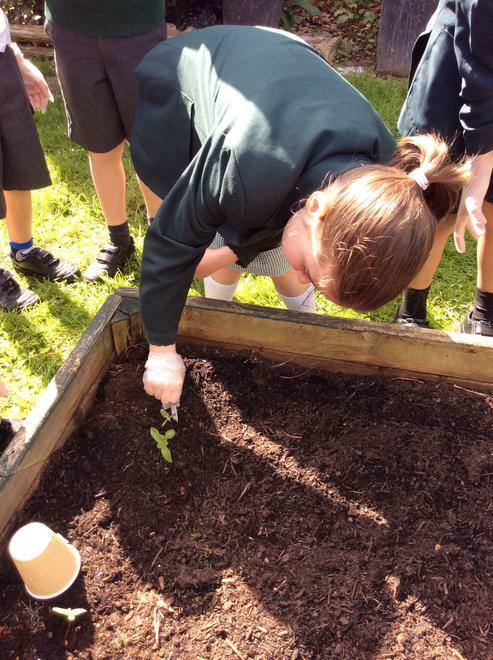 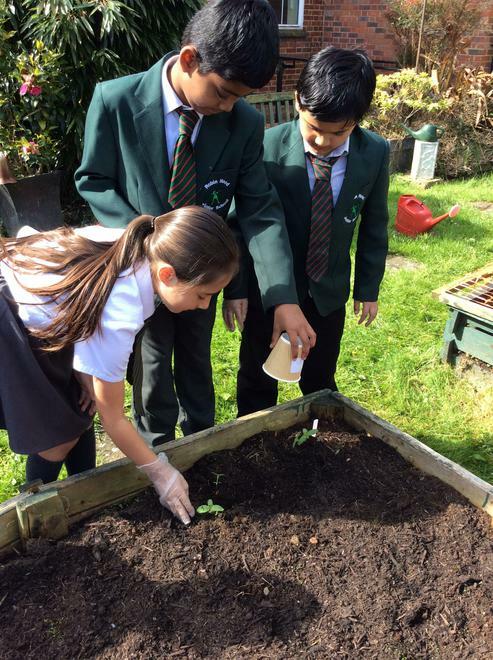 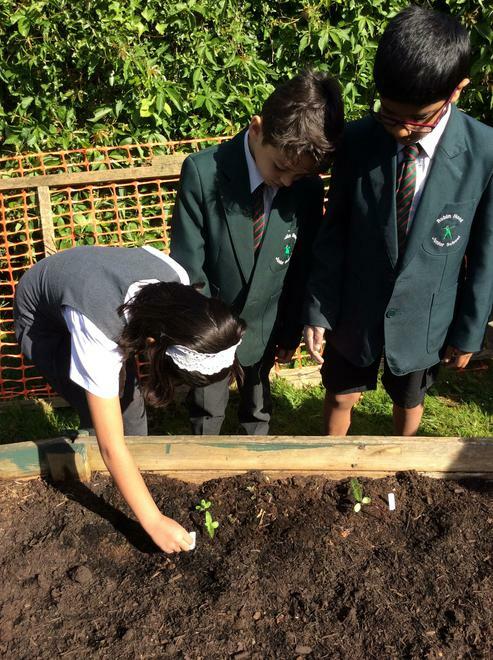 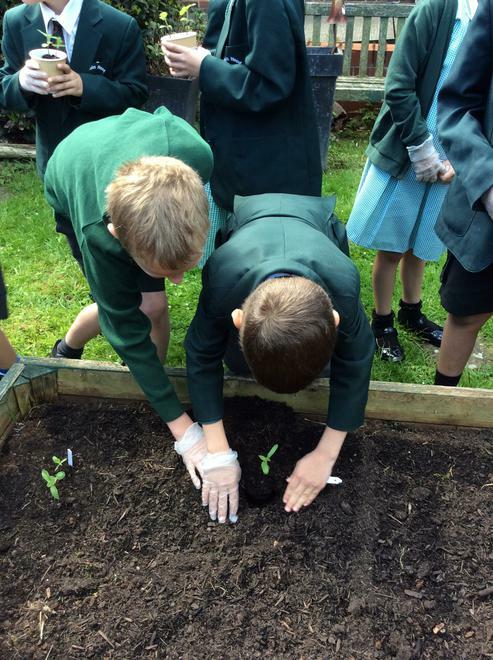 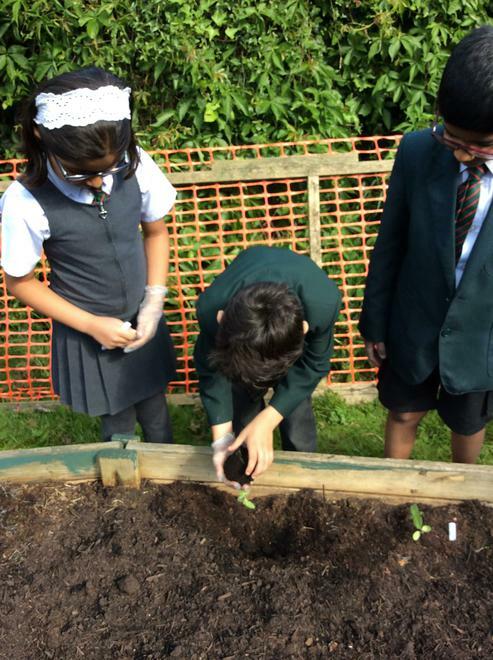 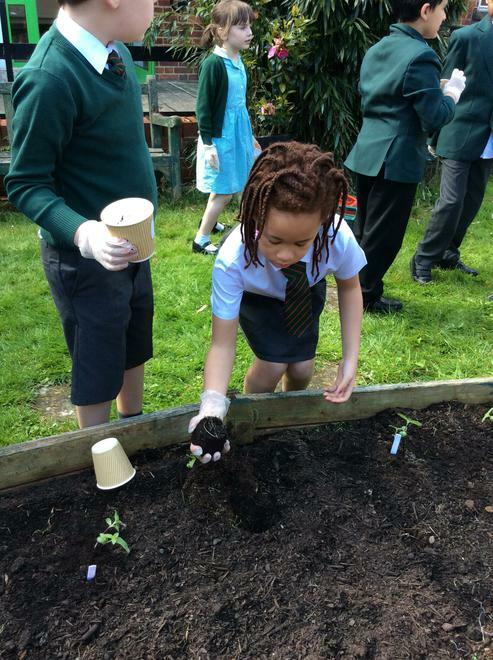 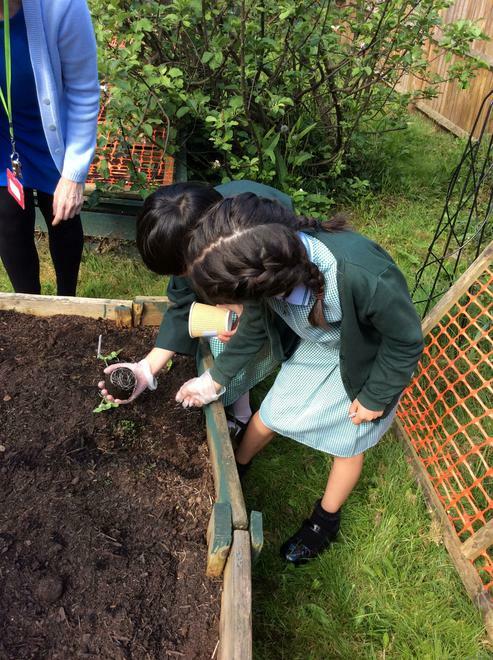 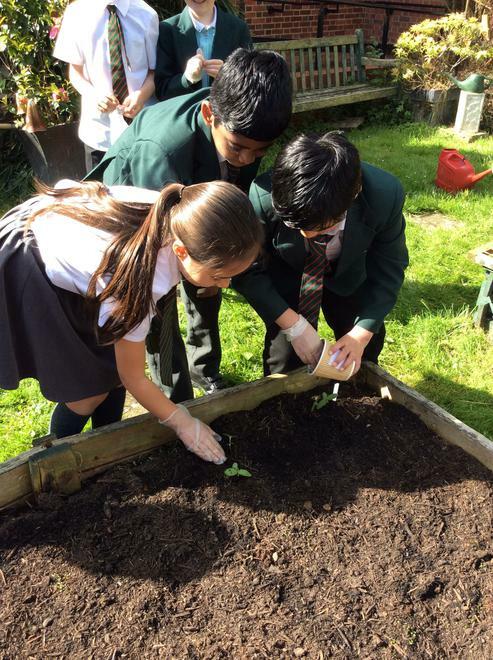 Today, we took our sunflowers outside, dug holes in the new compost, very carefully tipped the pots upside-down and transplanted our sunflowers into their new homes. 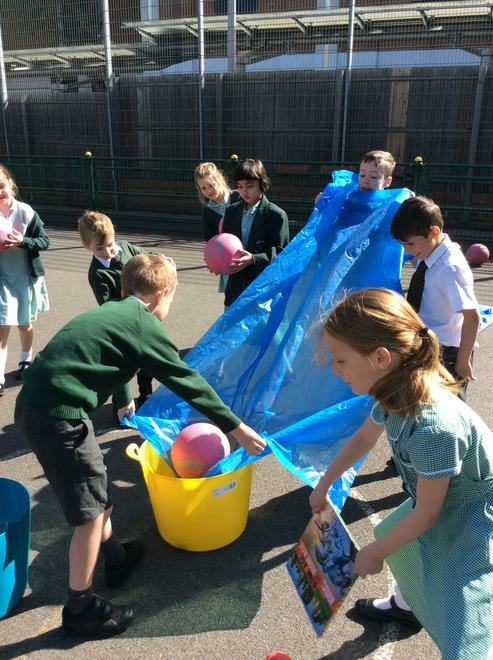 We then gave them a water for good measure! 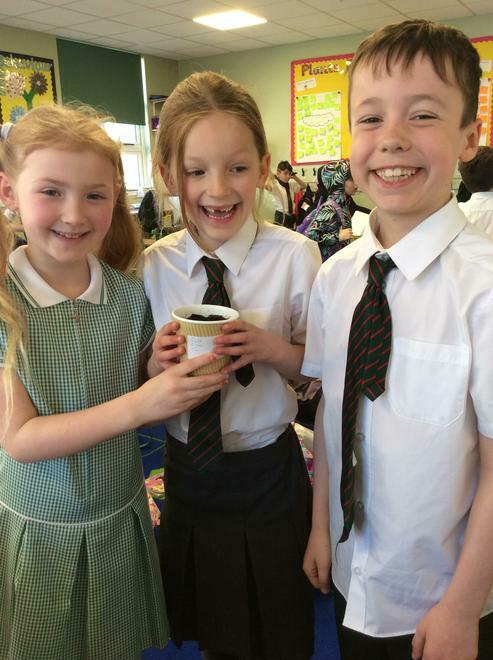 Everyone is very excited to wait and see how well our sunflowers grow! 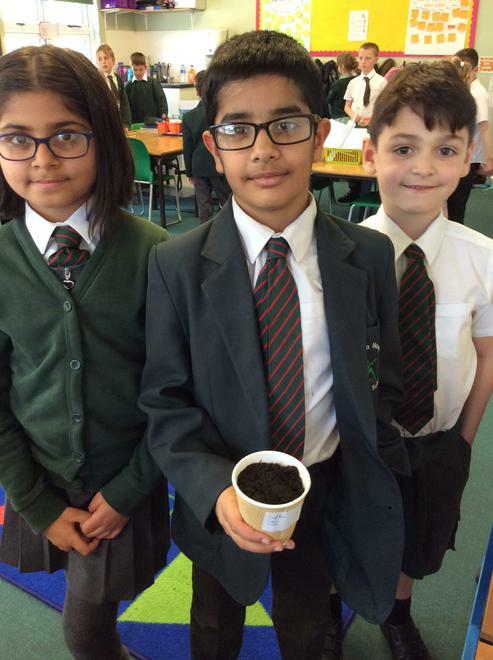 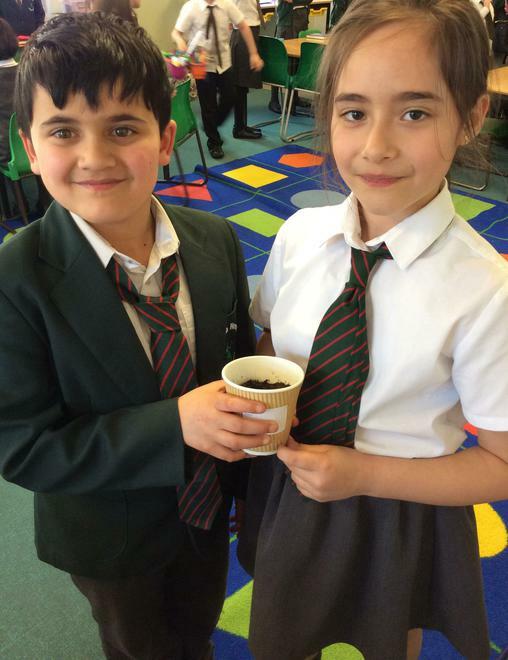 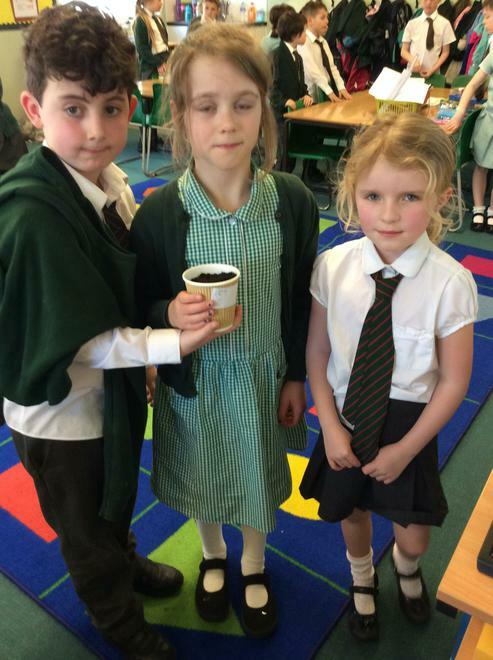 This week in Science, we have been looking at what plants need to survive. 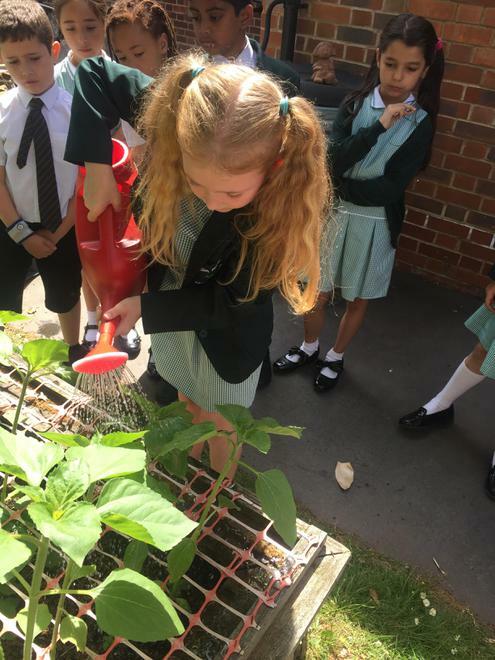 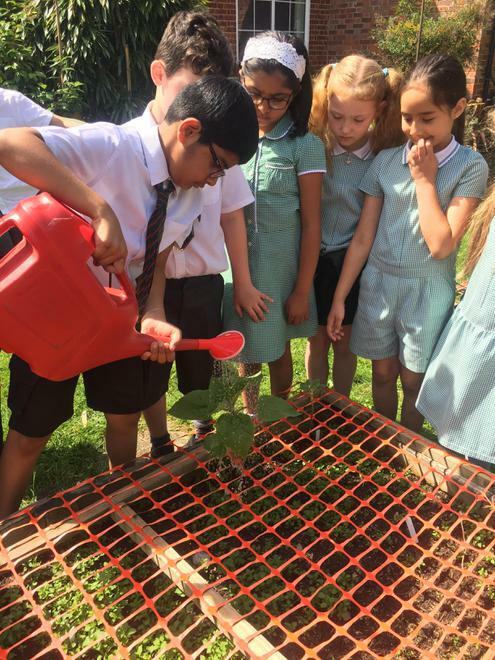 We know that water is essential for a plants survival, but today we looked at how this water is transported around a plant. 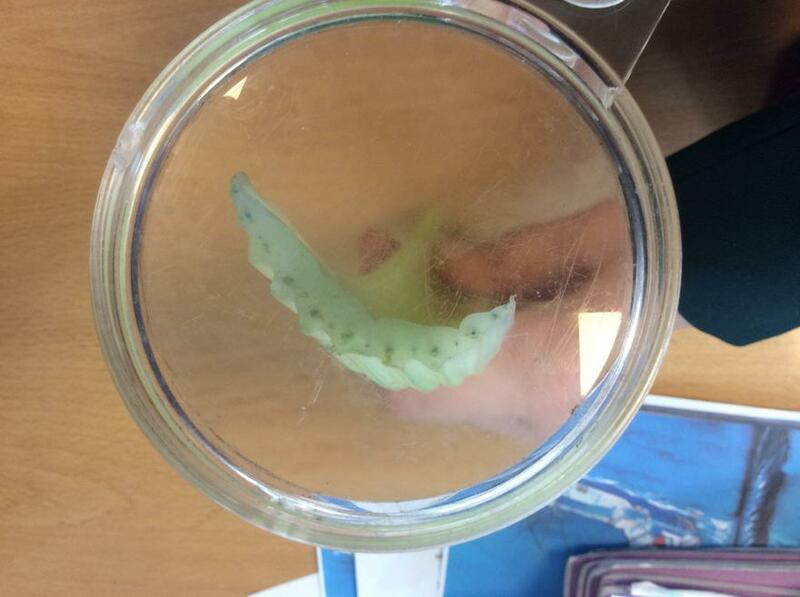 We conducted an experiment by putting celery in jugs of water with blue food colouring in, to see what would happen to it. 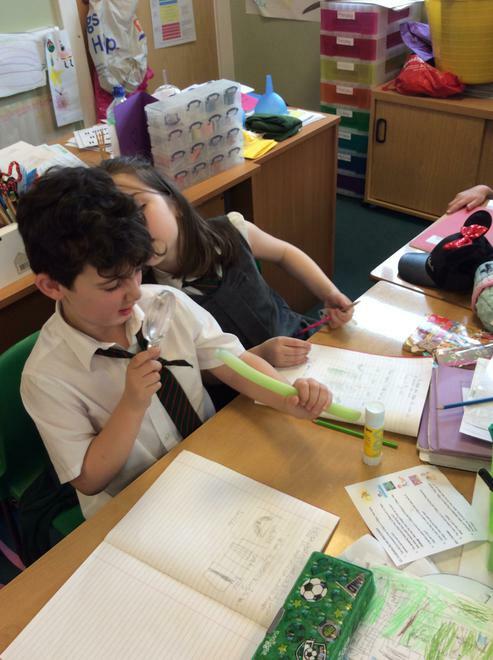 This is because celery is an edible stem and we know that one of the functions of a stem is to transport water around the plant. 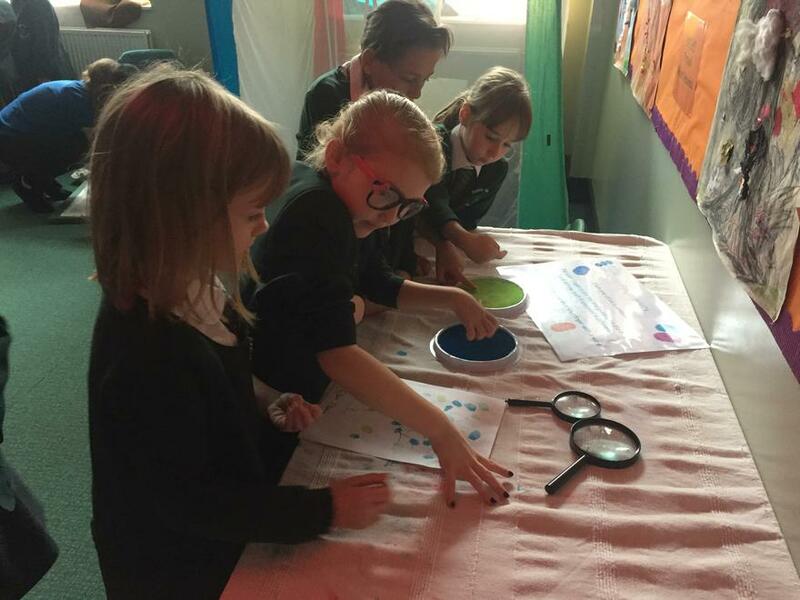 After 24 hours, we observed the celery closely with magnifying glasses and saw that each of the stems had blue dots appear on the bottom of them! 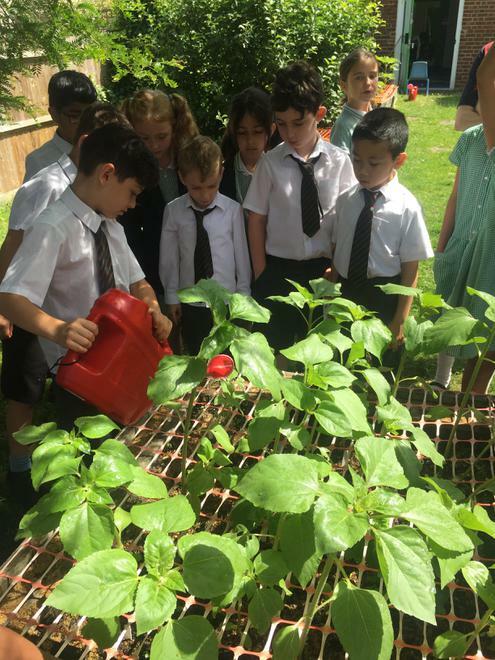 This told us that plant's stems have tiny tubes in them and that is what transports the water up through the stem and around the plant! 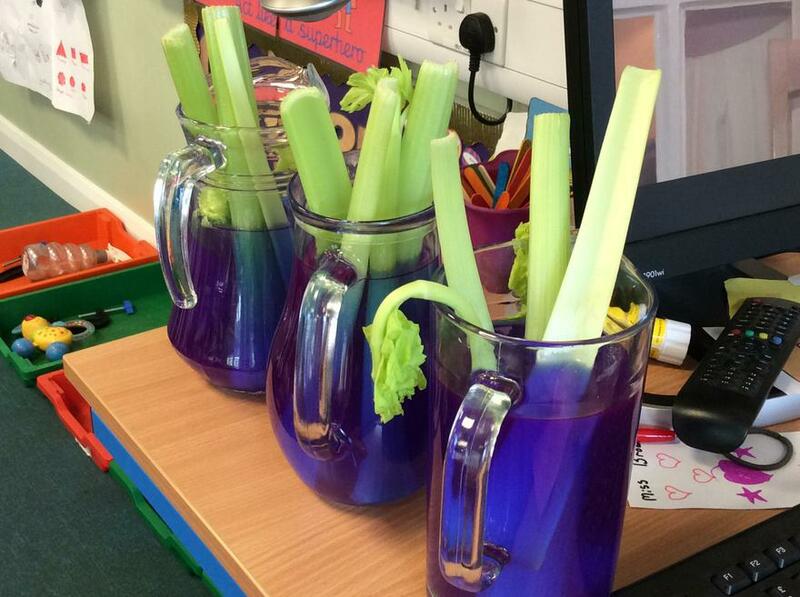 We are going to leave the celery in the jugs for a few more days to see if there are any more changes! 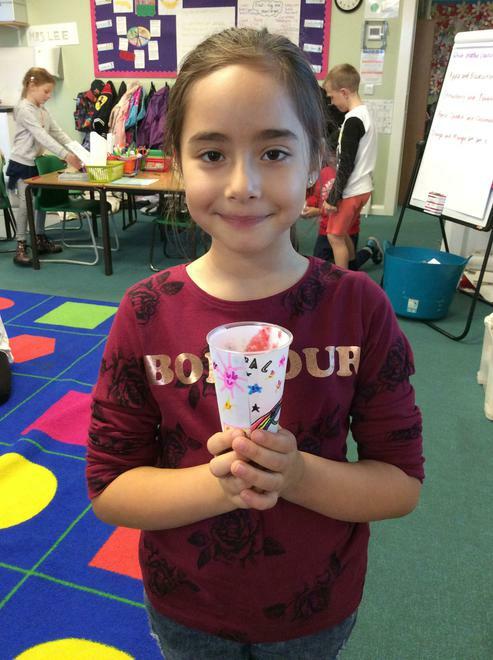 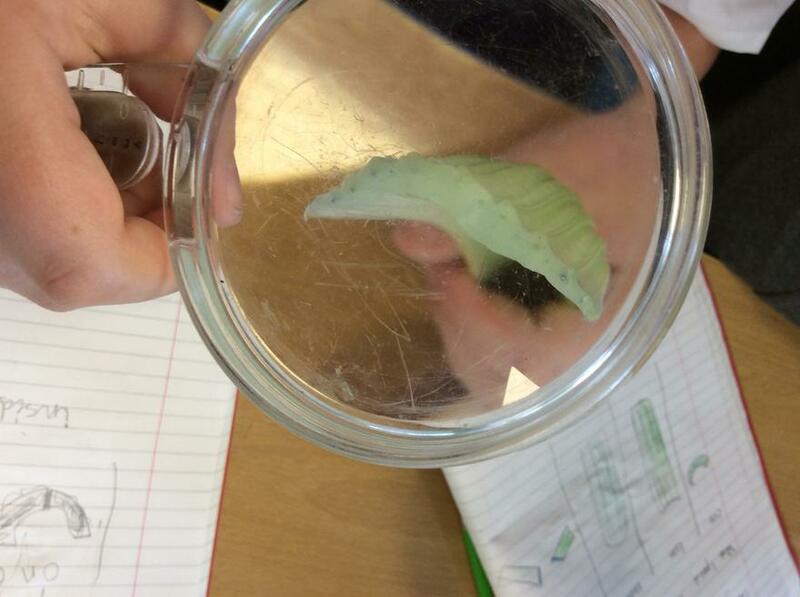 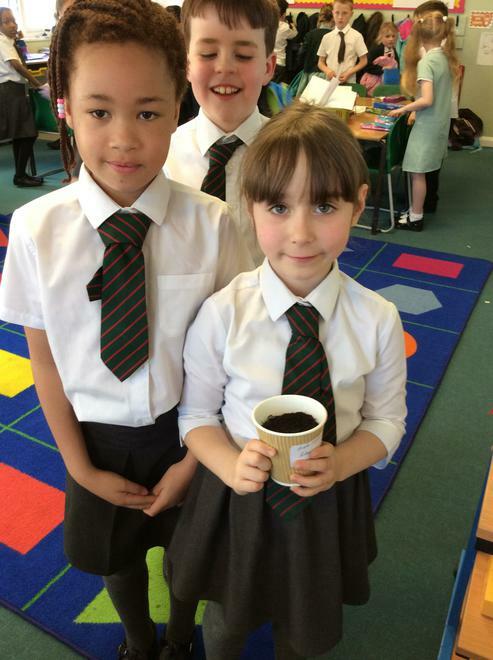 This week, in Science we developed our knowledge on plants even further! 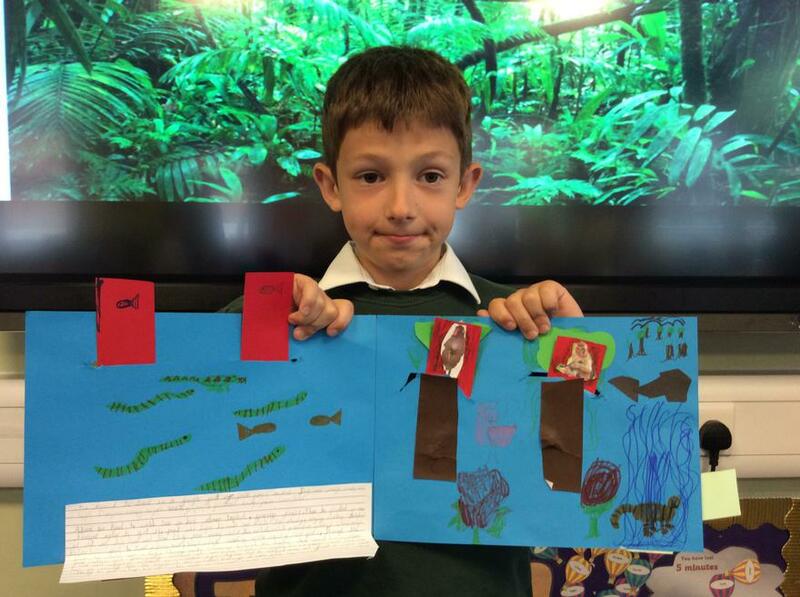 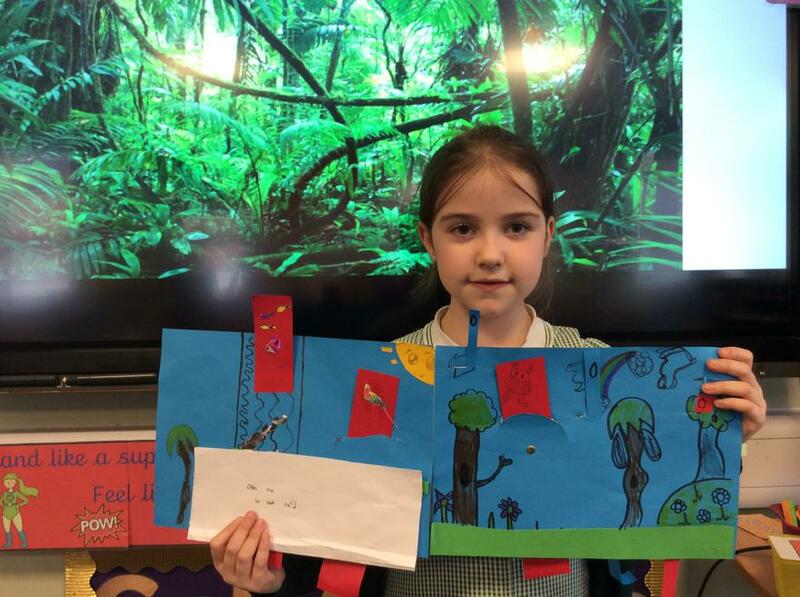 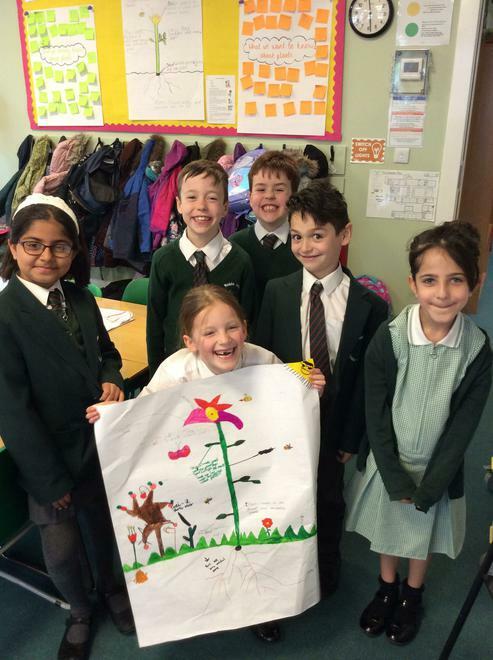 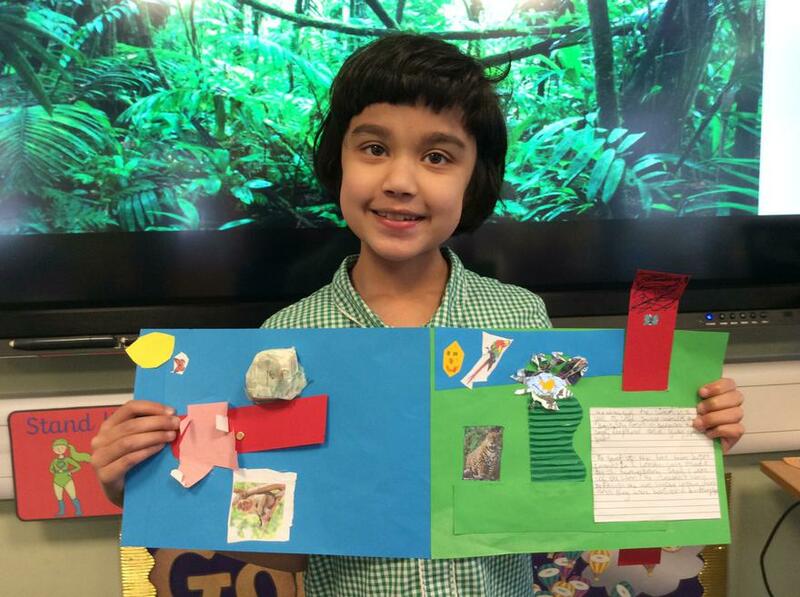 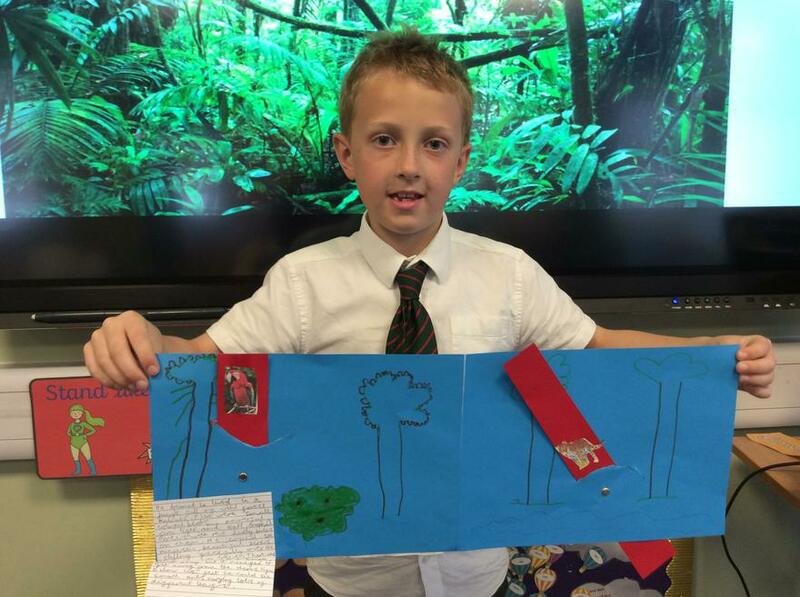 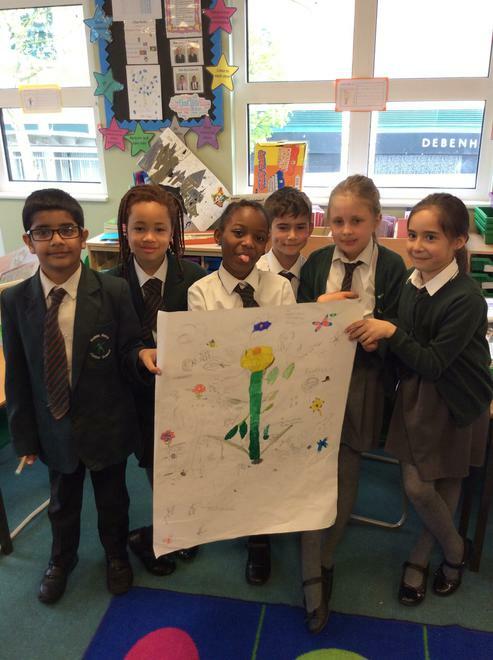 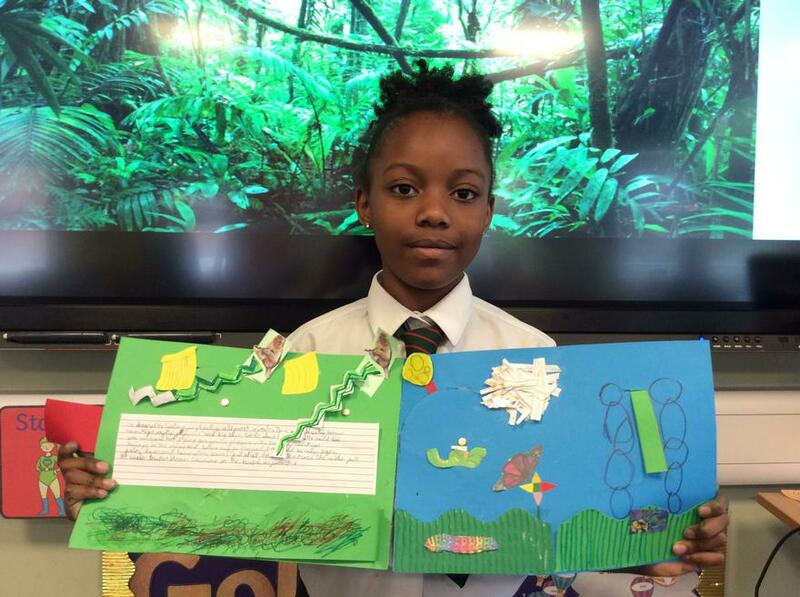 Last week, we created posters on flowering plants and labelled their different parts. 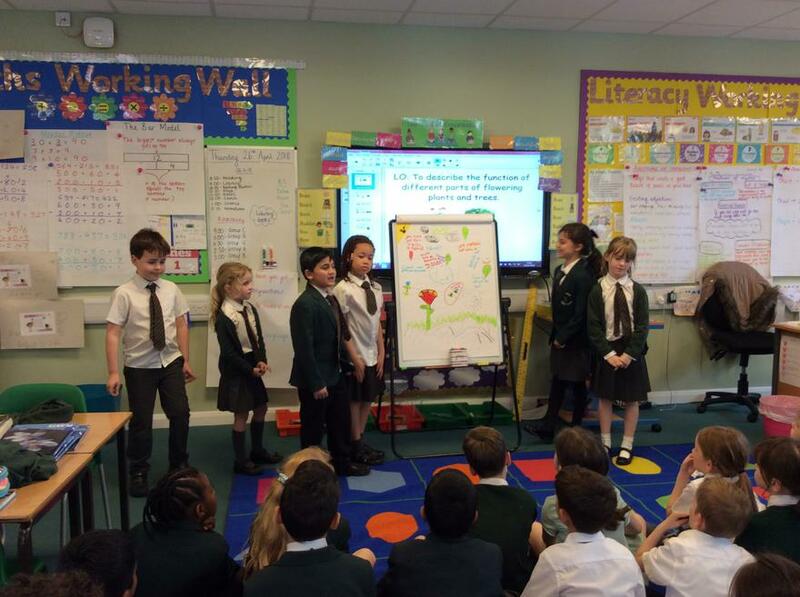 This week, we worked in groups to become experts on a particular part of the plant (e.g. 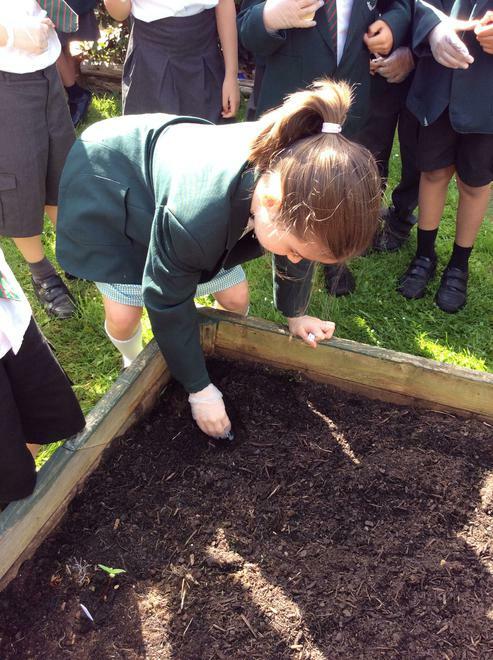 roots, stem, leaves etc.) 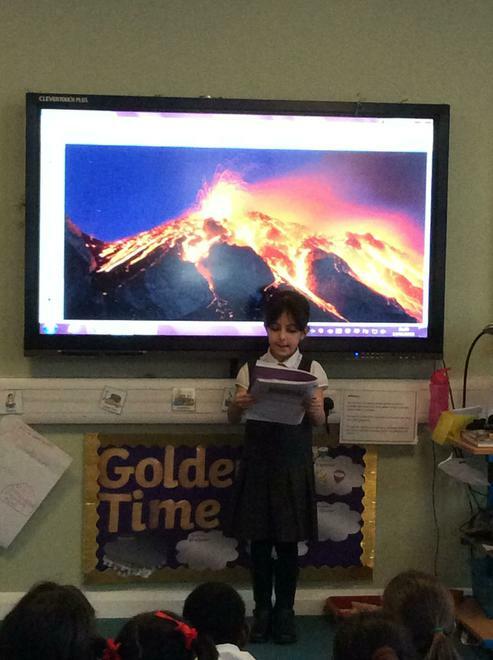 and created a presentation to show our findings. 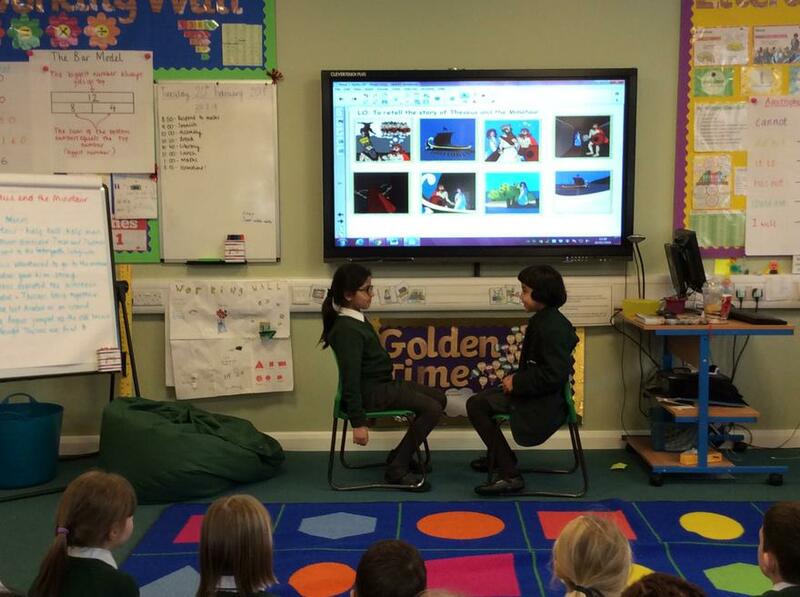 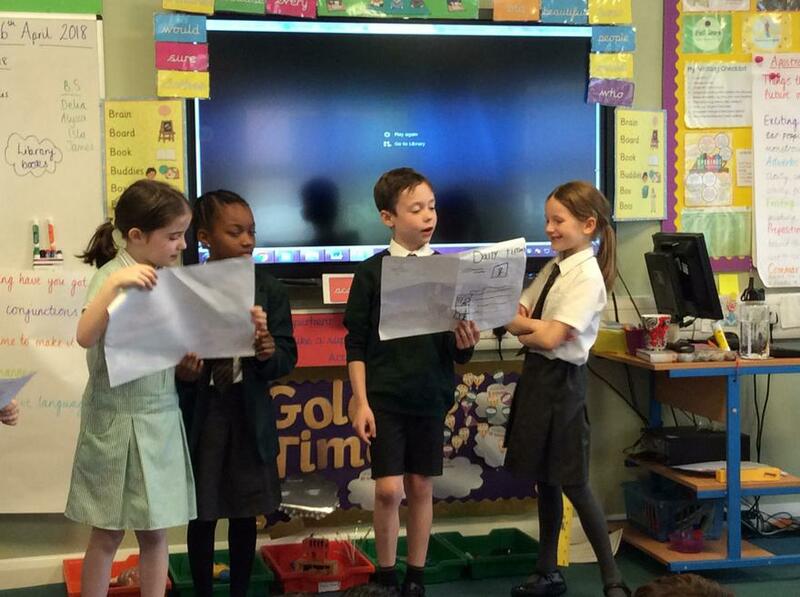 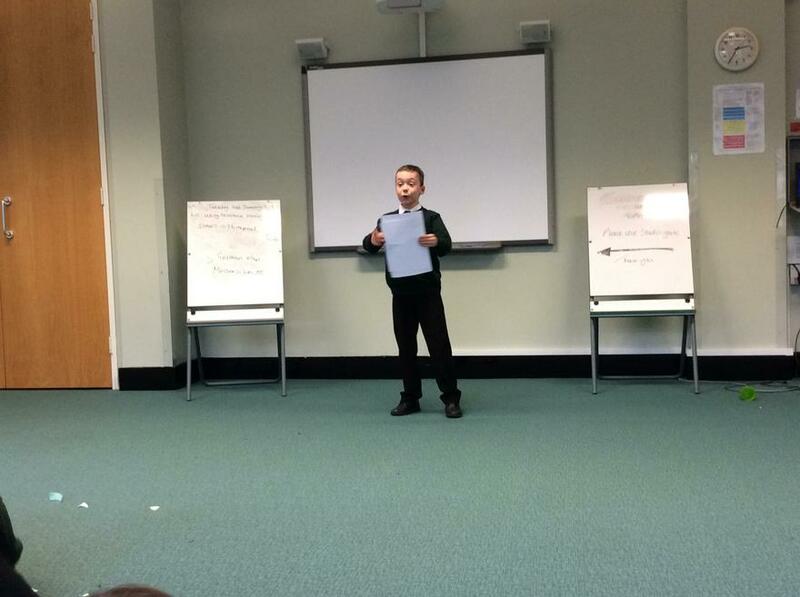 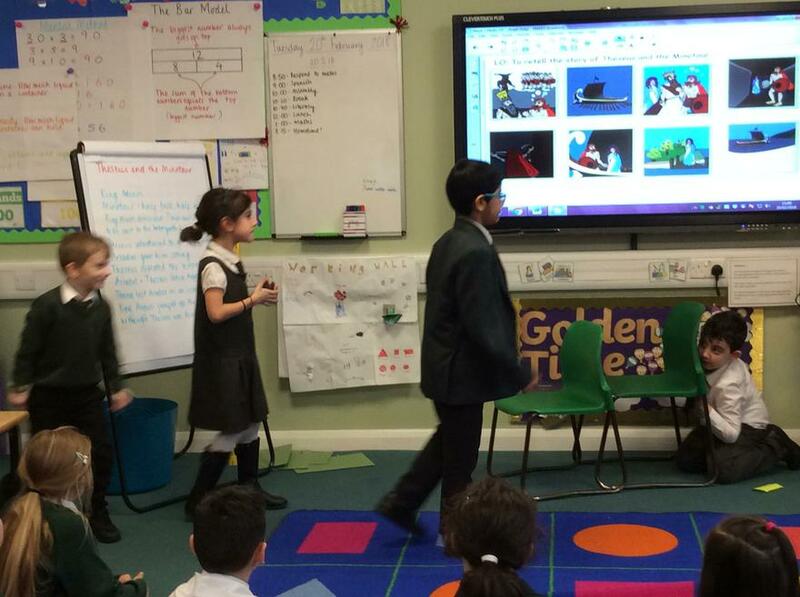 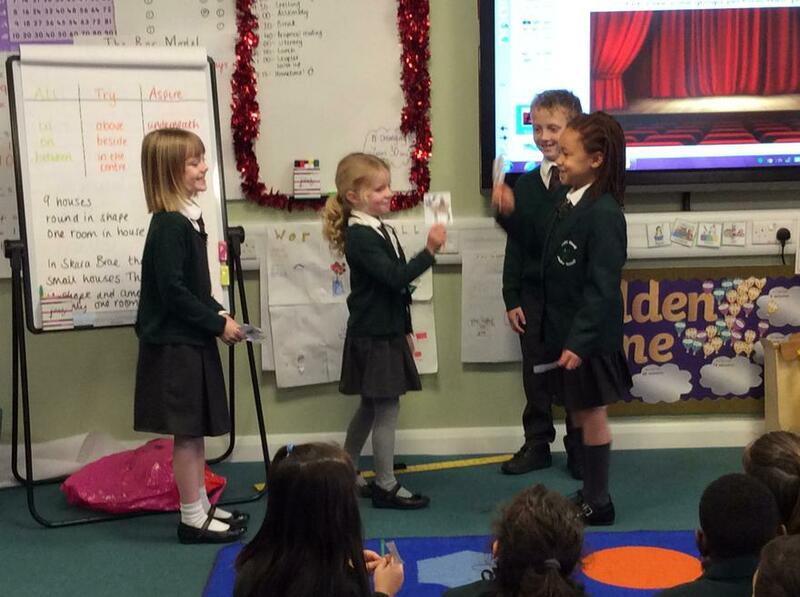 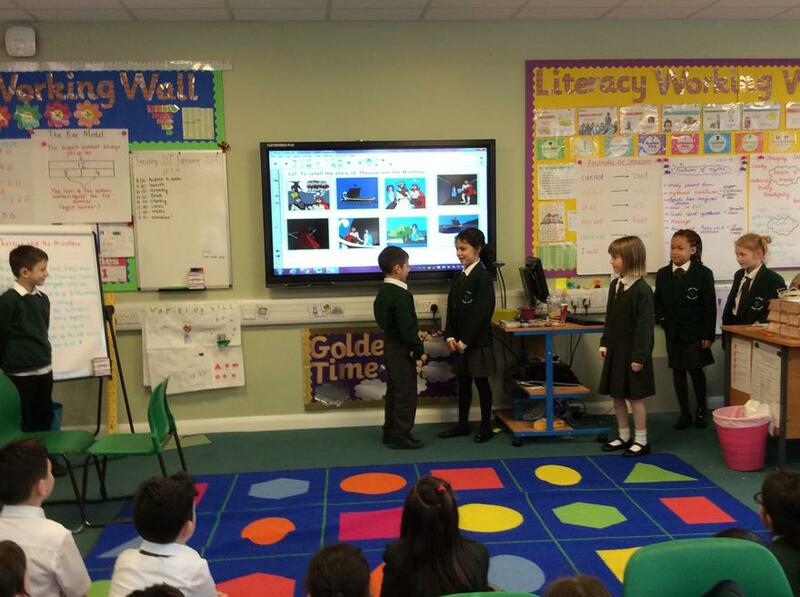 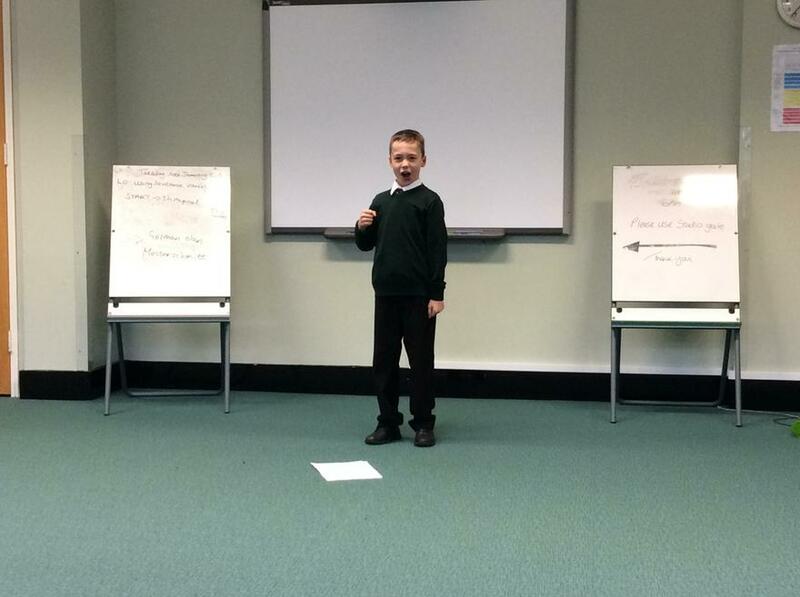 We had groups sharing their information on a flipchart, on word documents and even in in a performance! 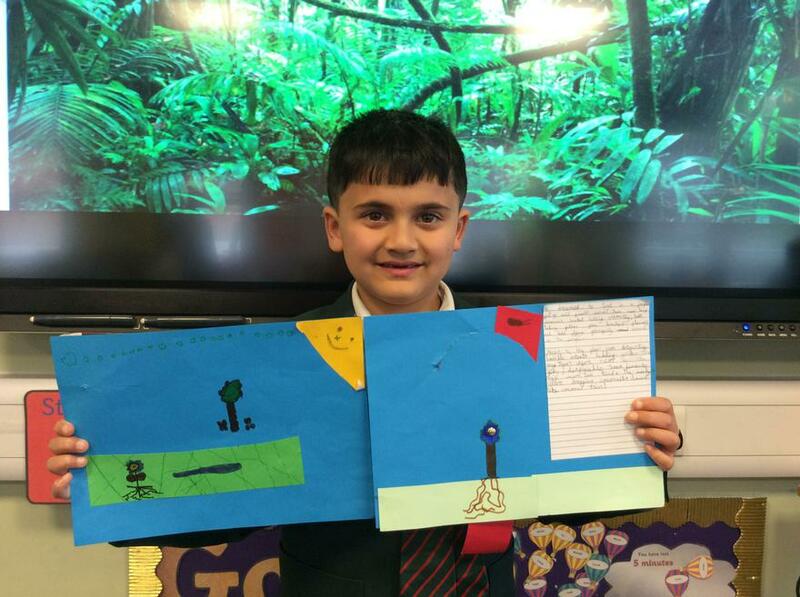 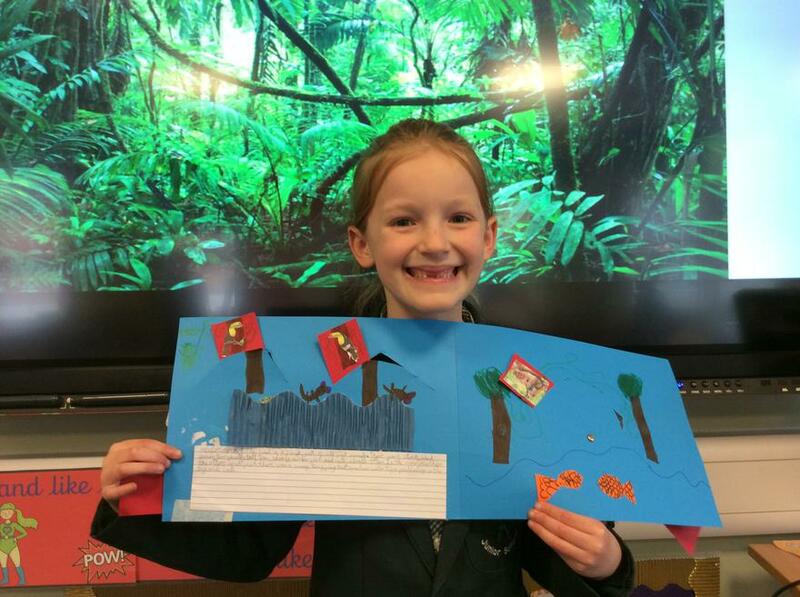 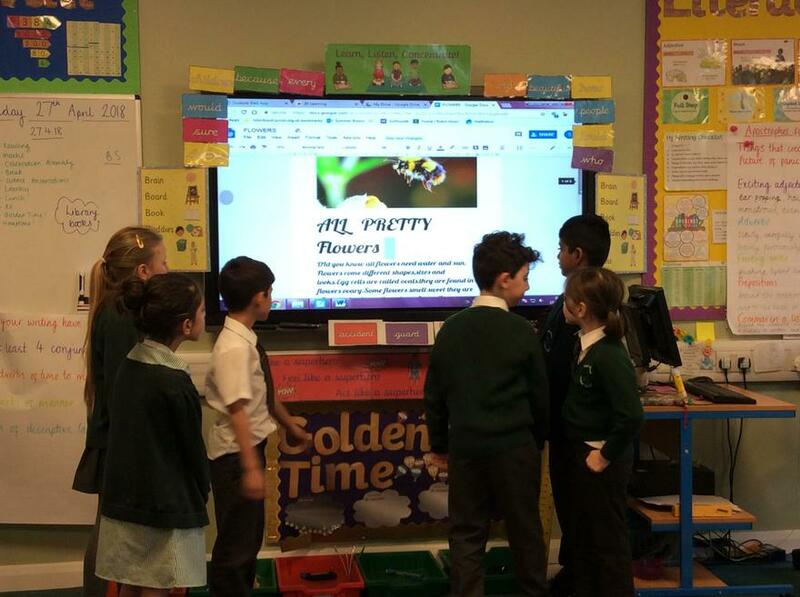 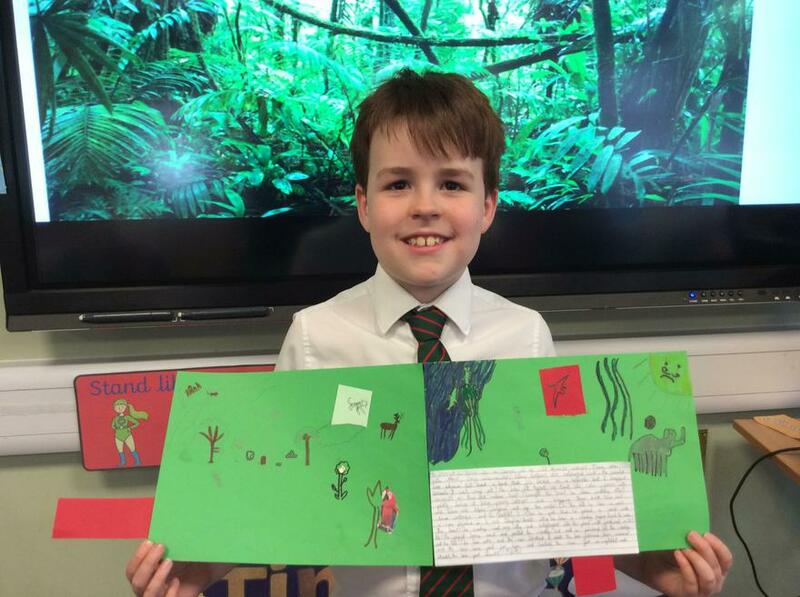 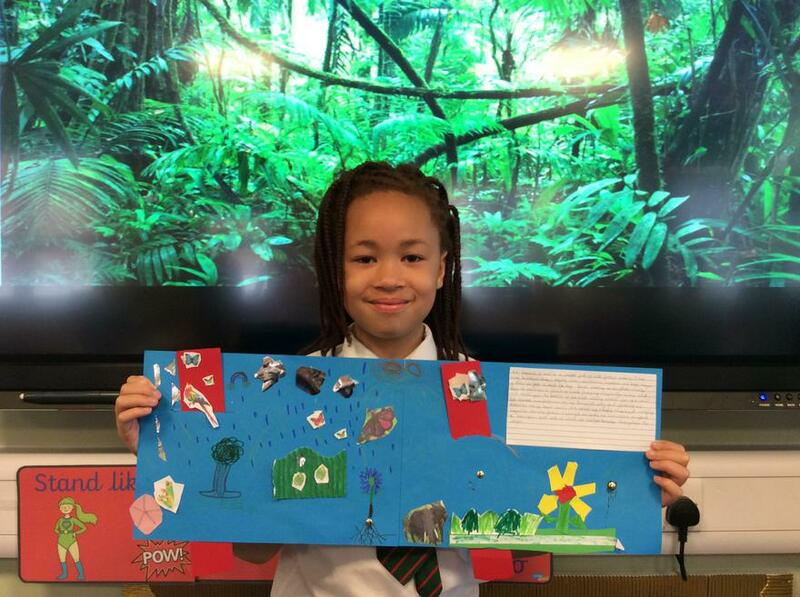 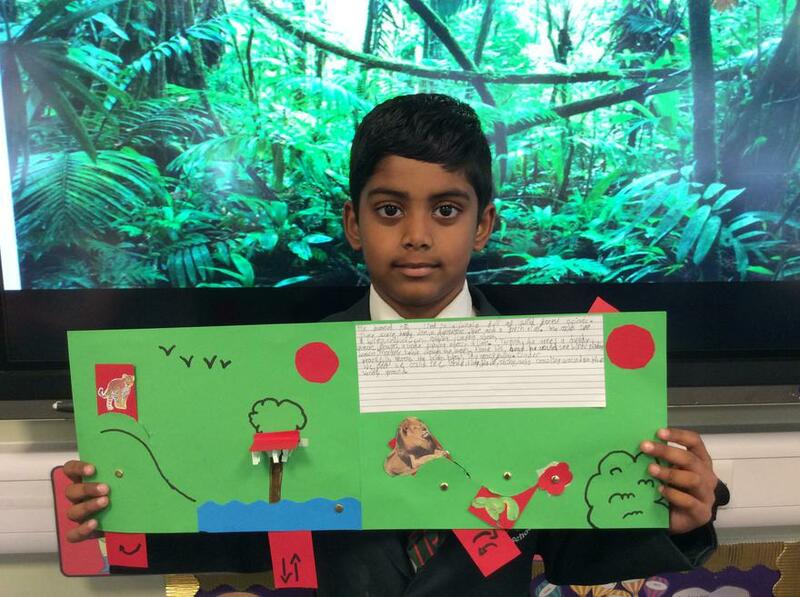 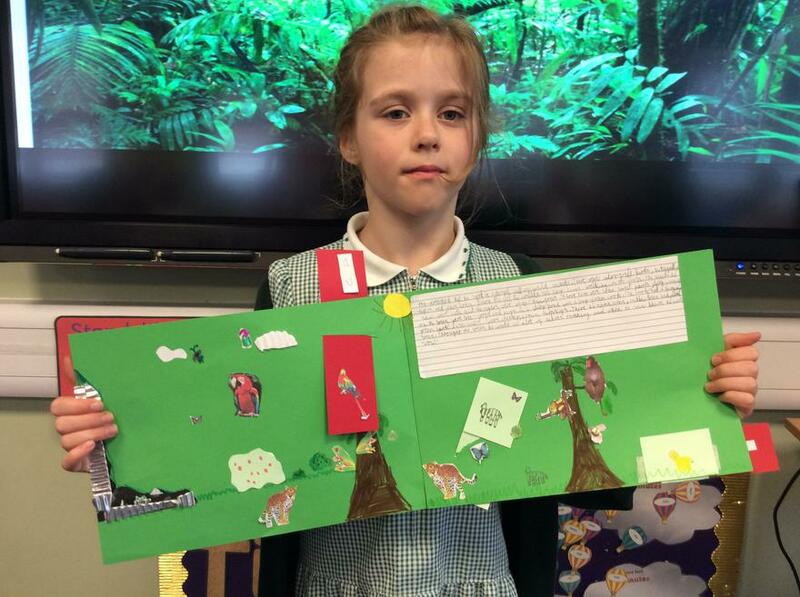 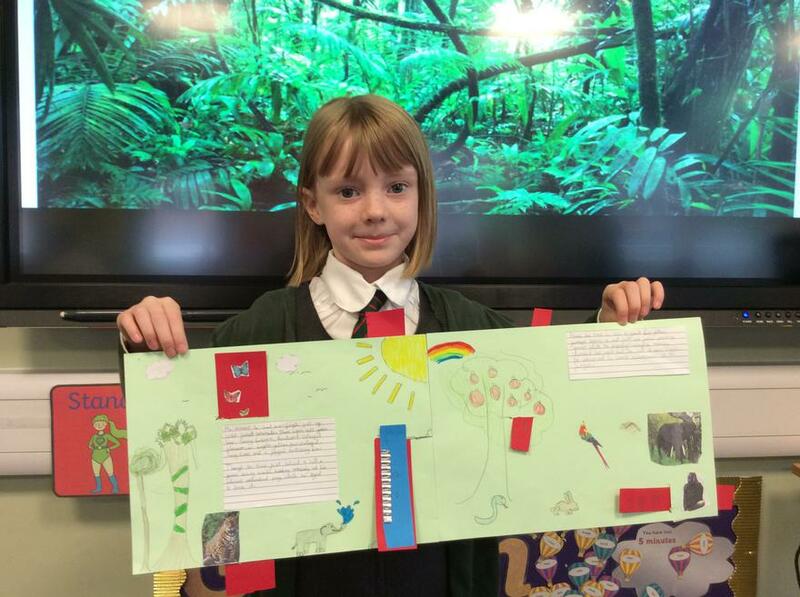 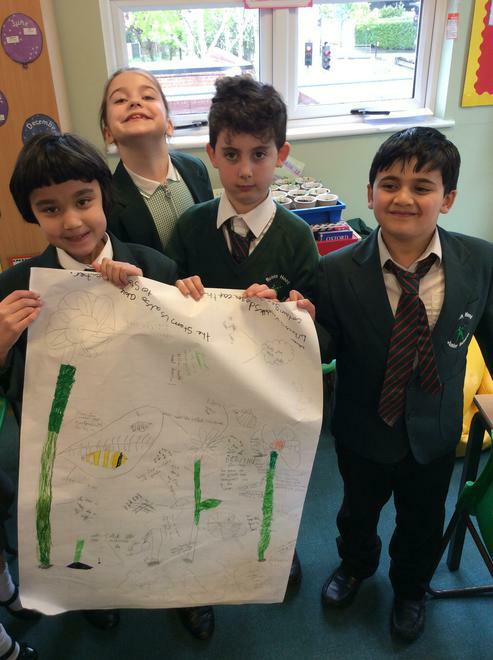 We then added all this extra information to our original posters so now we have very detailed posters on all the different functions of the parts of plants! 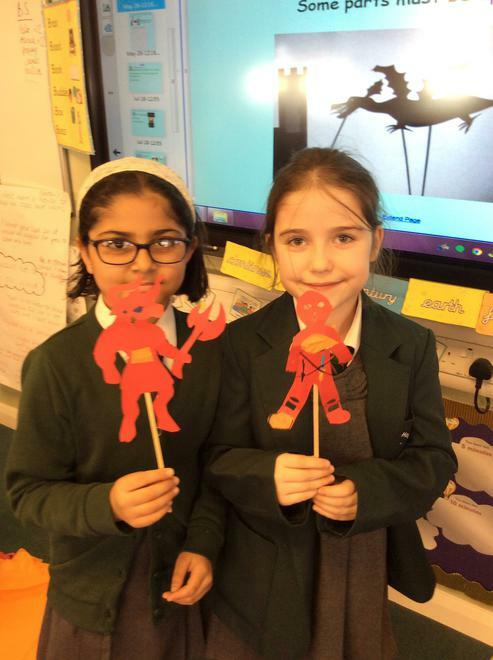 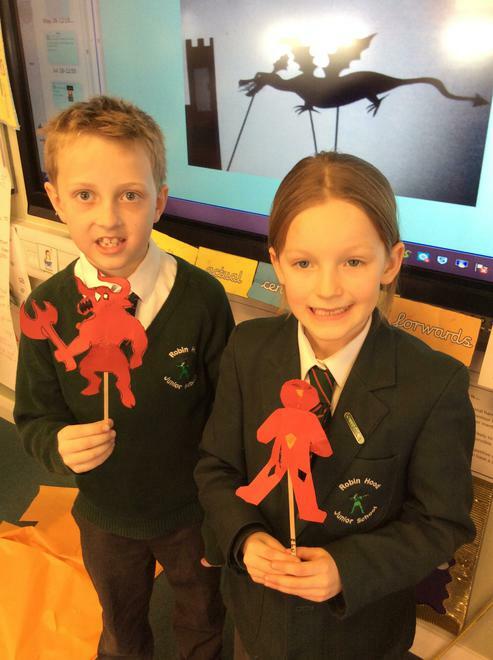 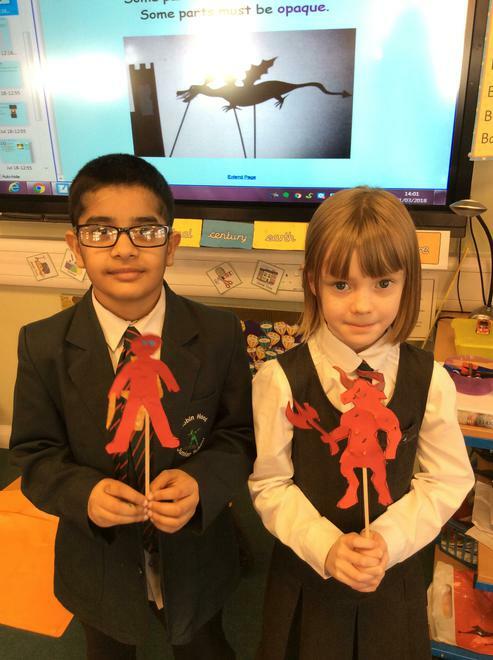 This half term in RE we are looking at Hindu gods and deities. 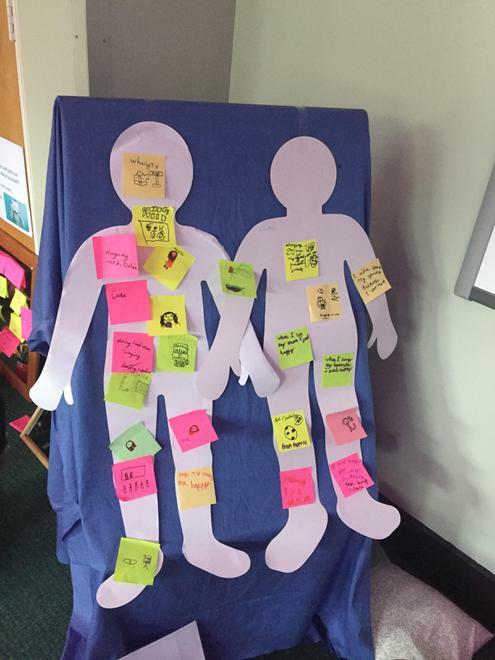 To introduce us to the topic we spoke about how we are all individual people, but we have many different meanings to other people (e.g. 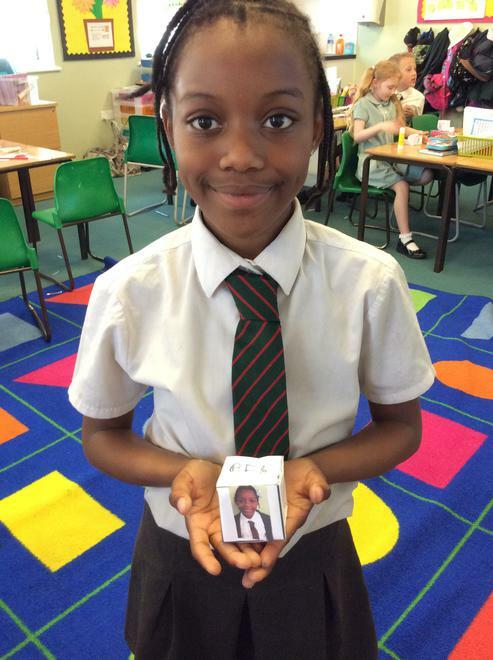 we can be sons or daughters, brothers or sisters, friends, students, team mates etc). 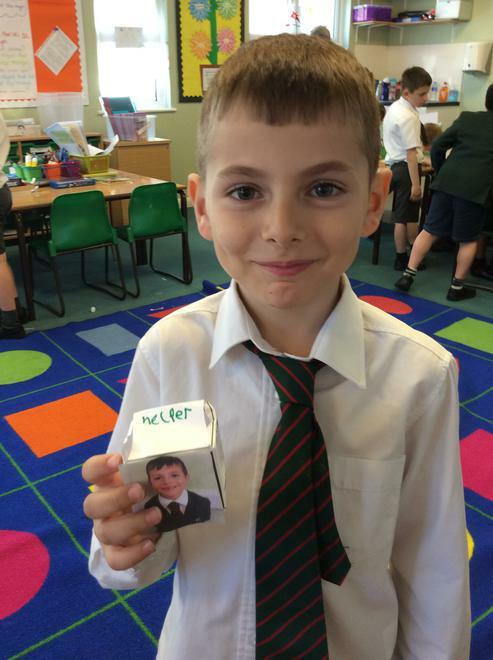 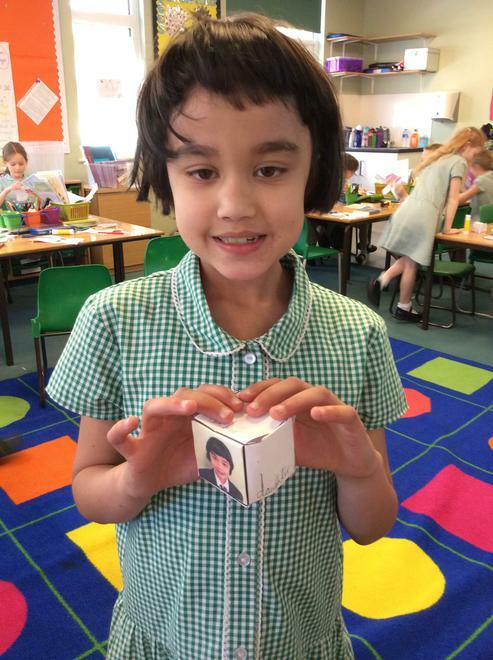 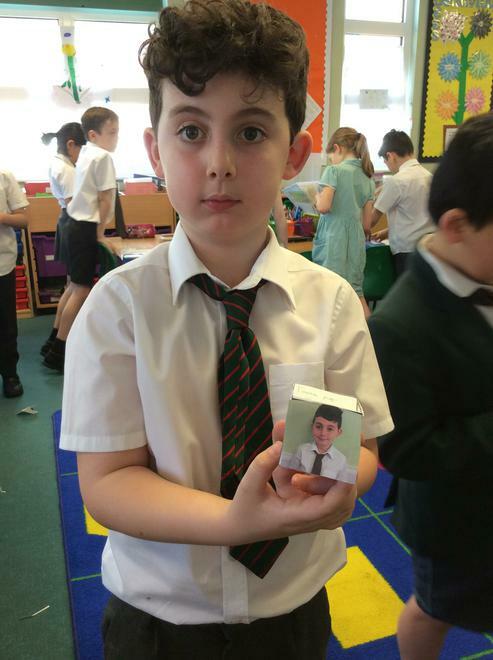 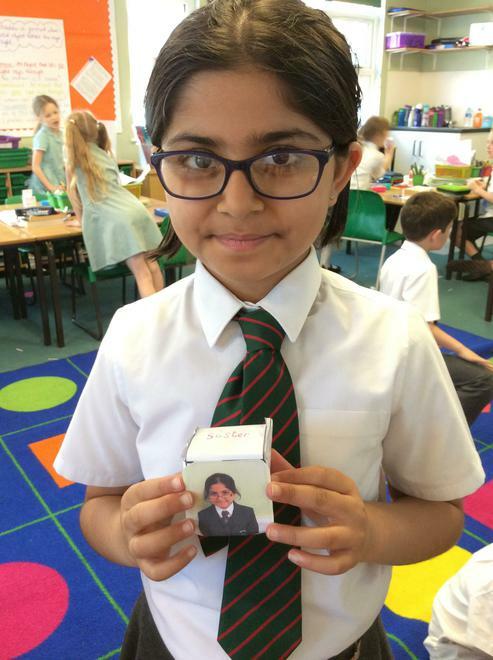 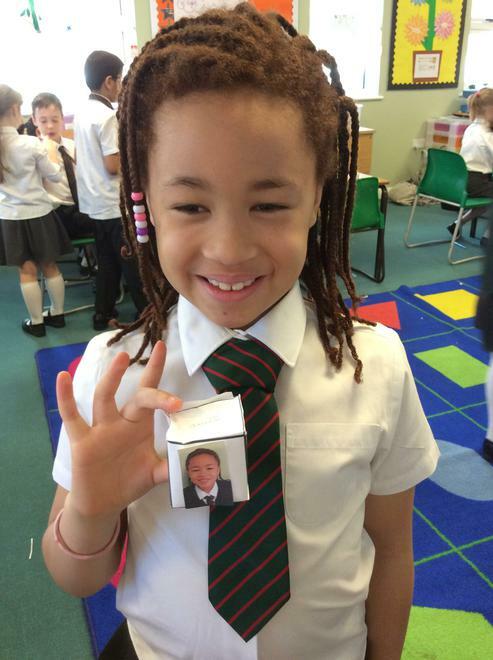 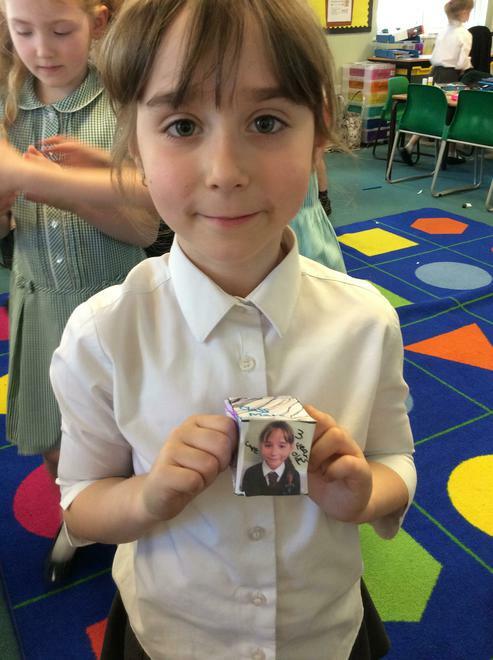 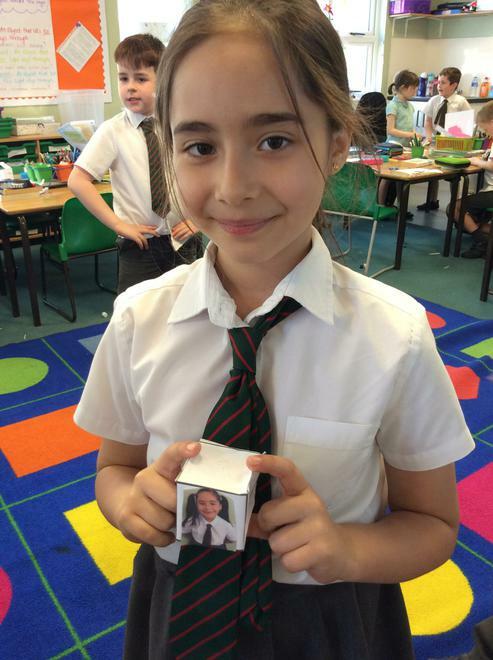 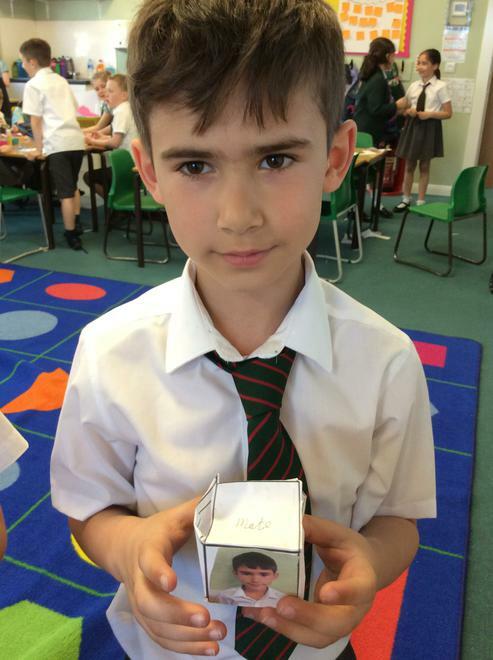 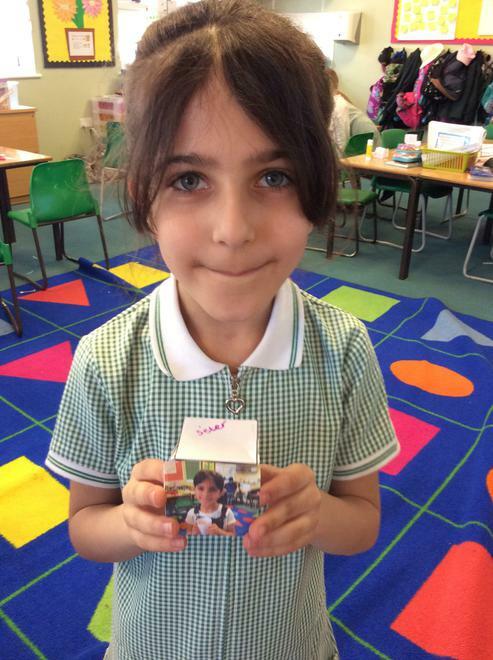 To show this, we created our own 3D cubes to represent us as people and all the different meanings or roles we have in other peoples lives! 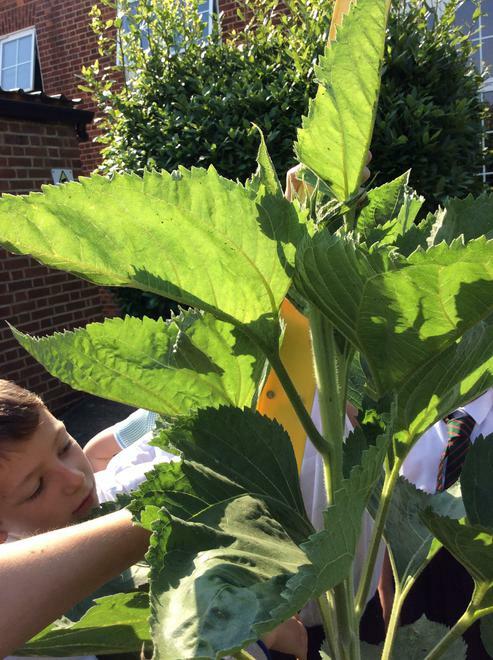 Today we looked at our new topic Plants, Pollen and Petals for the first time. 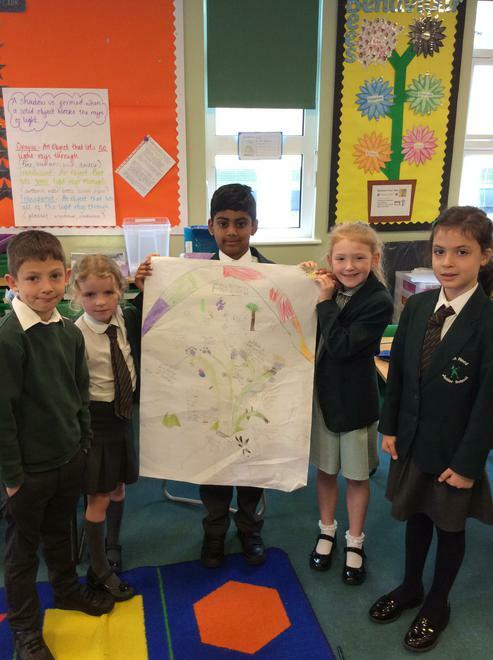 We talked about what we already know and what we would like to know about plants. 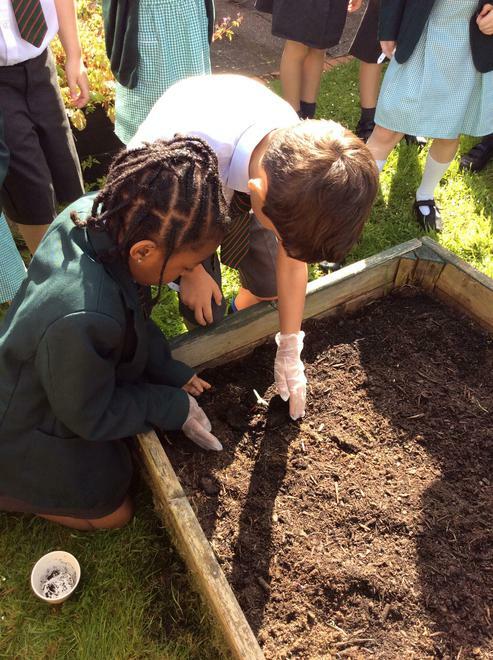 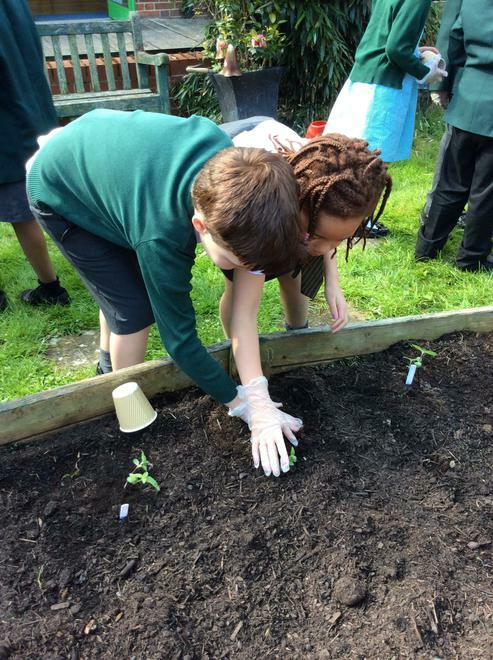 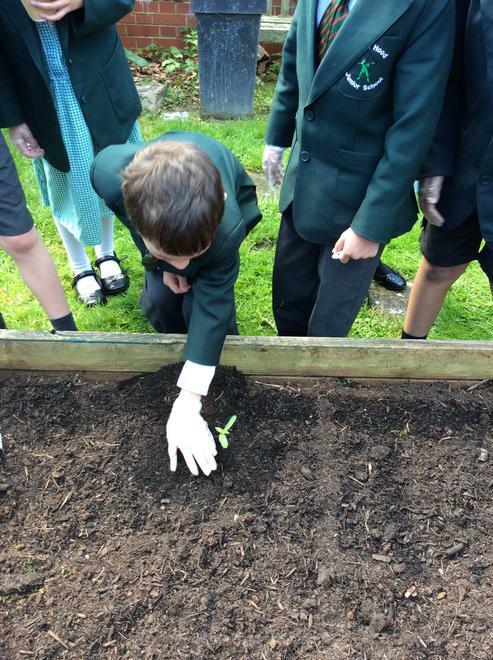 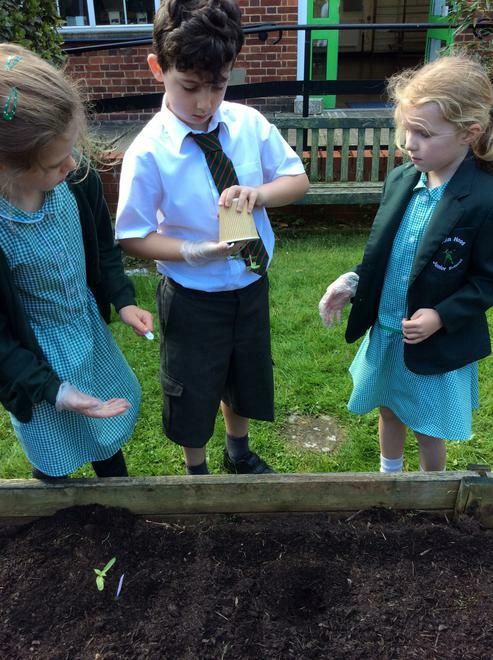 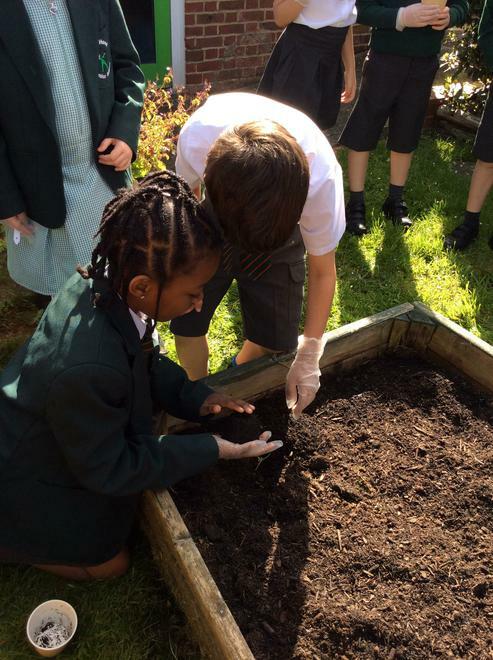 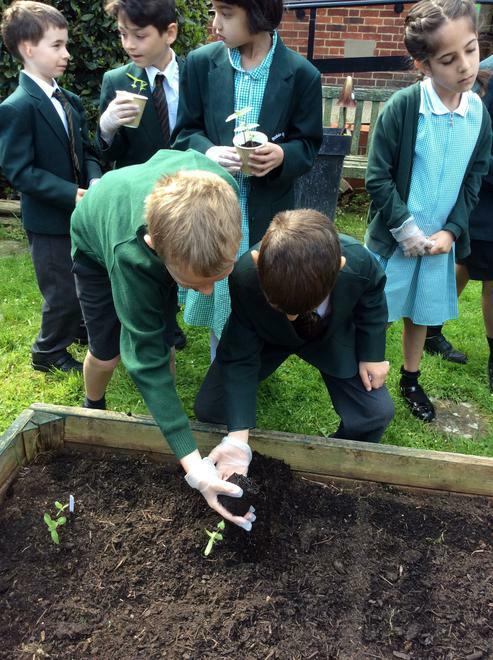 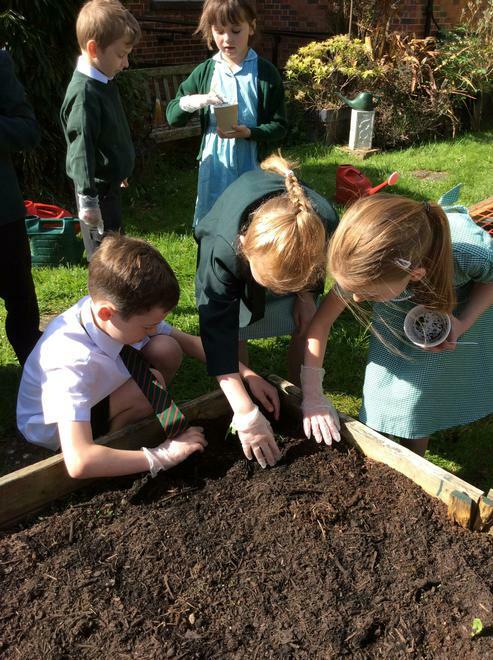 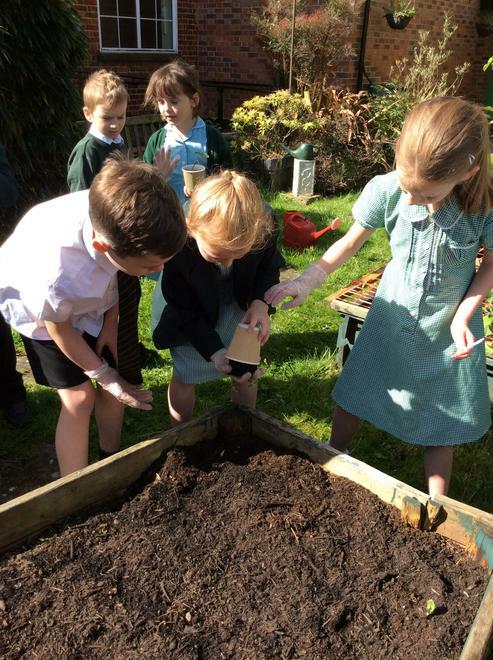 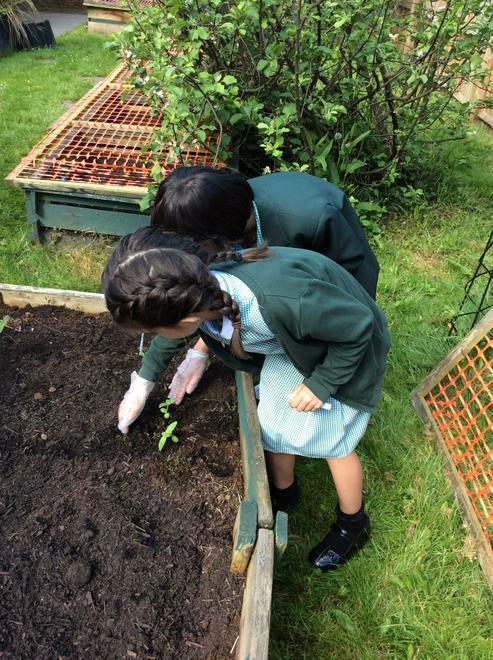 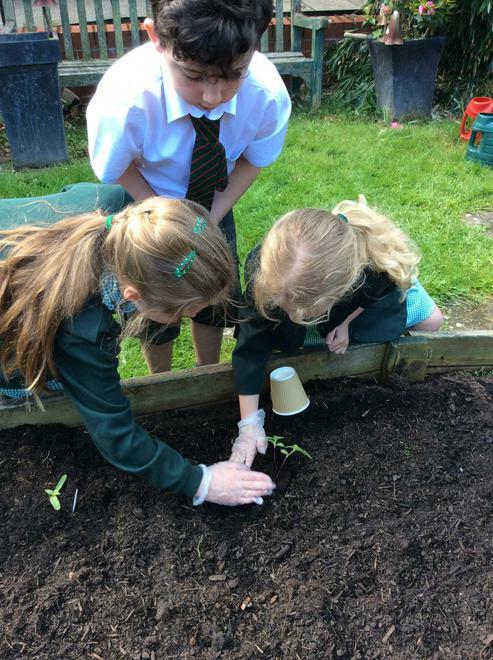 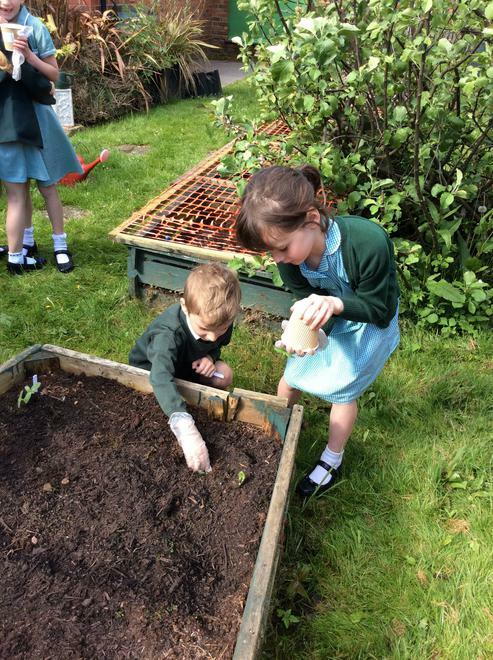 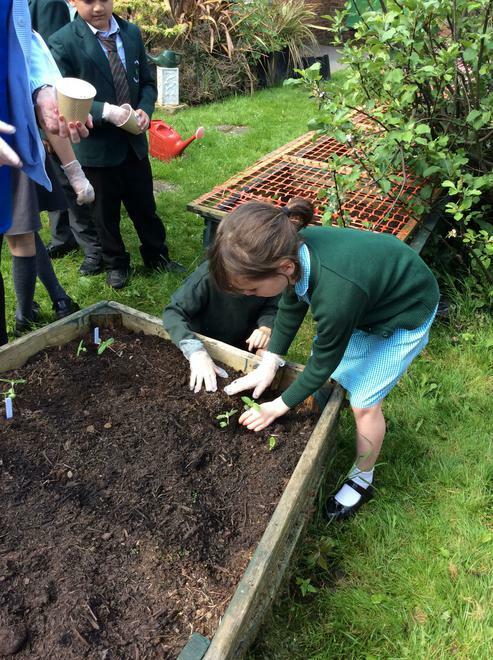 We then planted our own sunflower seeds in groups by following instructions. 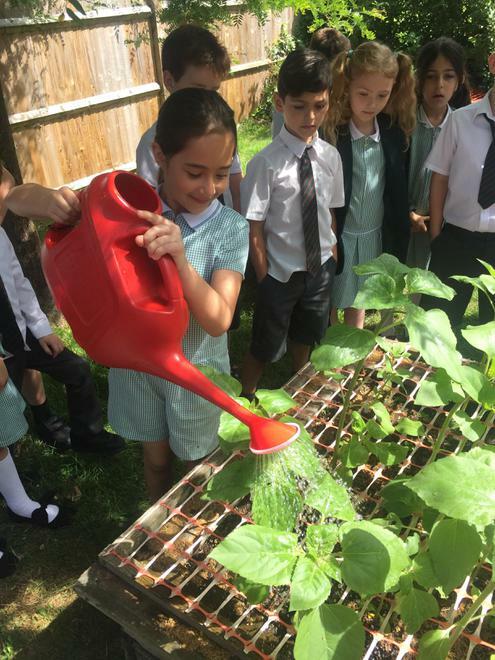 We will follow how they grow over the coming weeks! 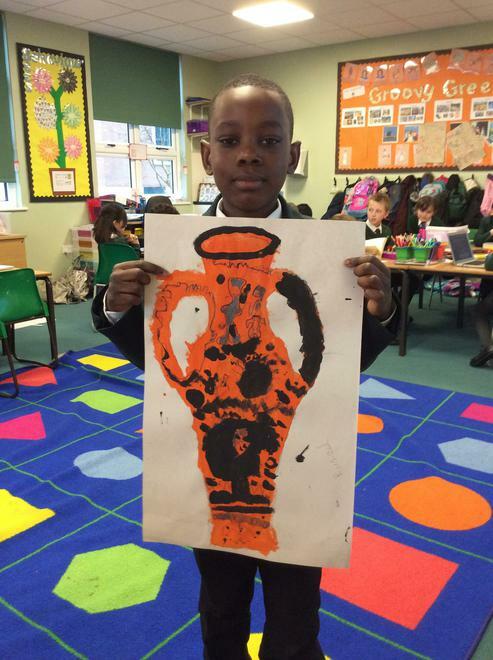 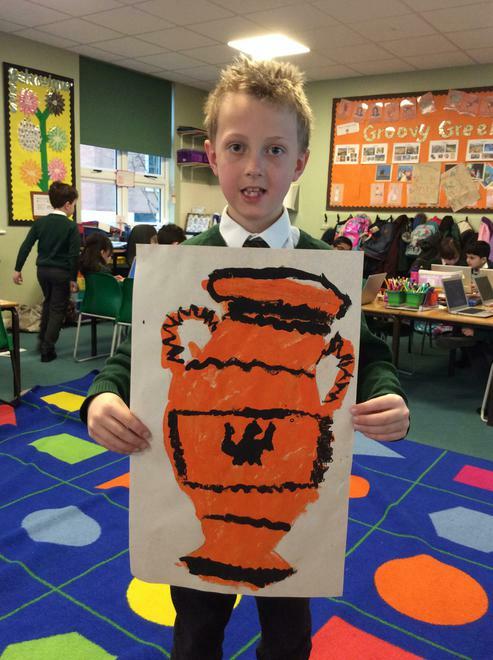 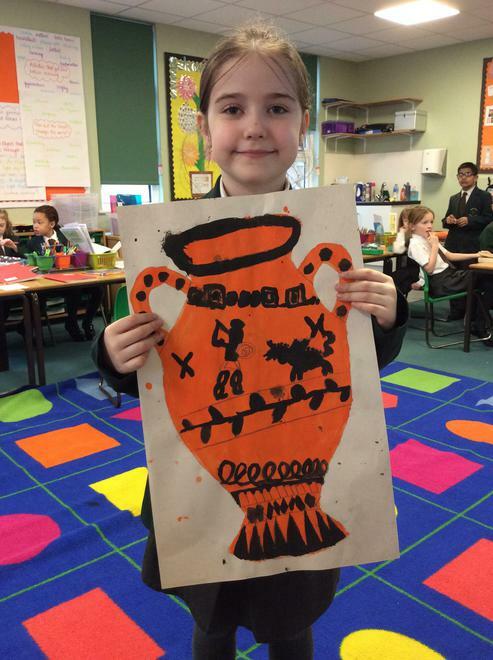 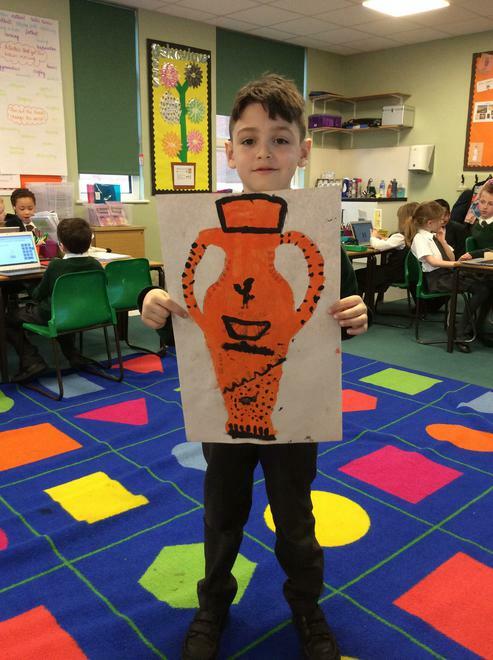 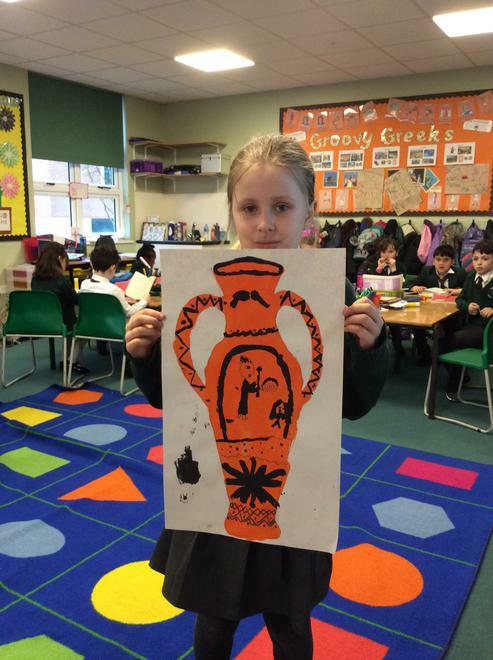 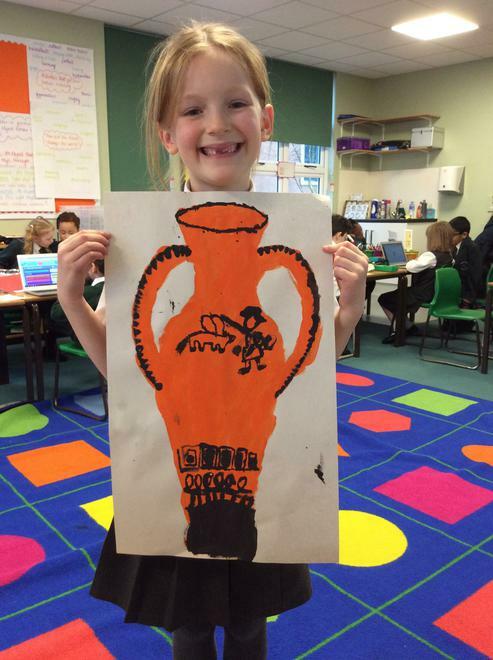 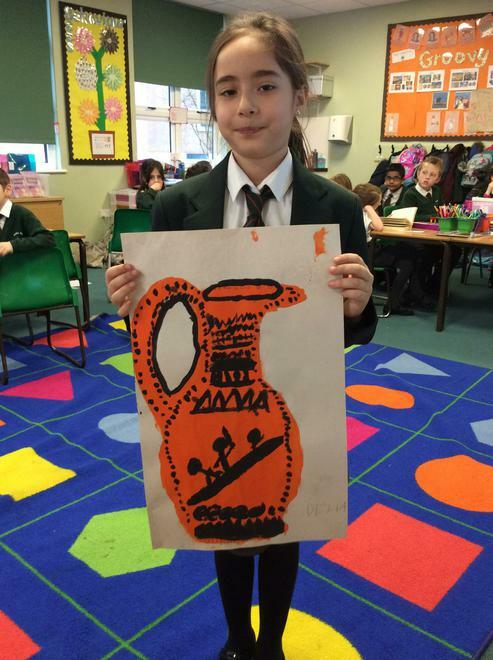 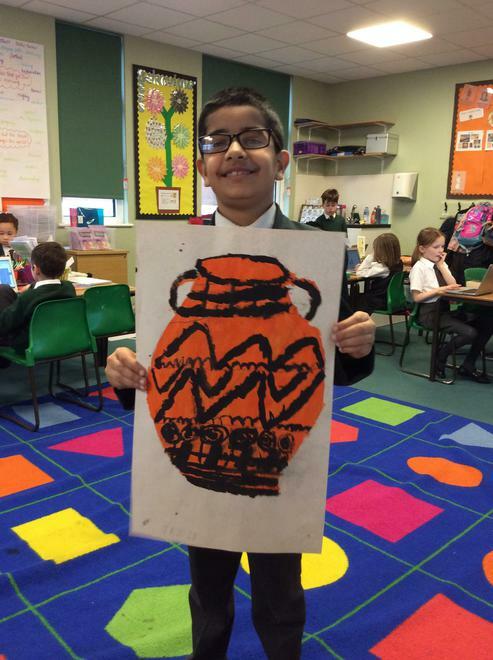 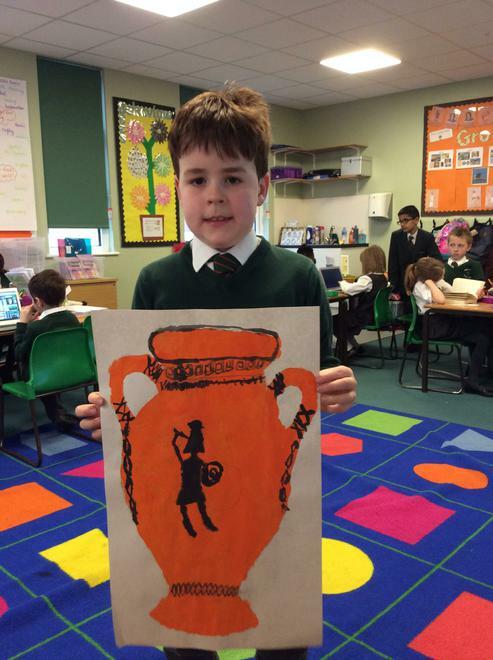 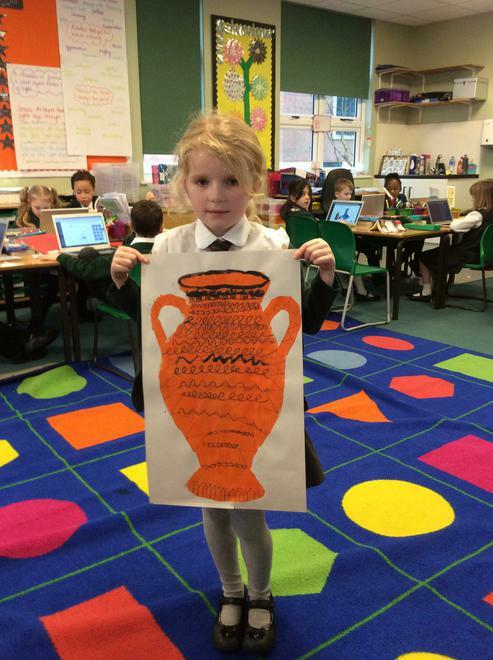 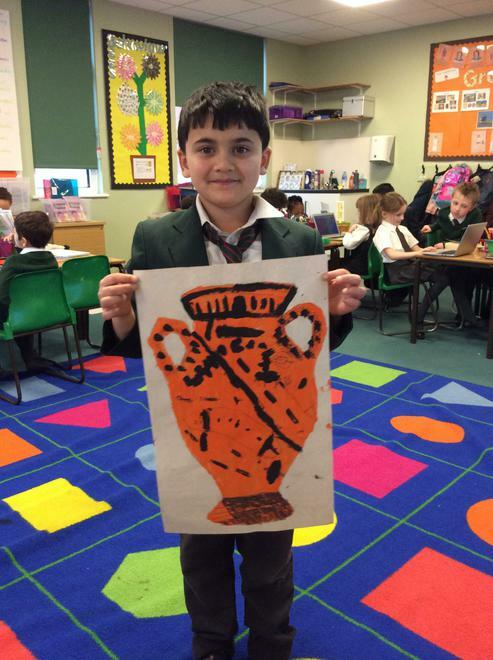 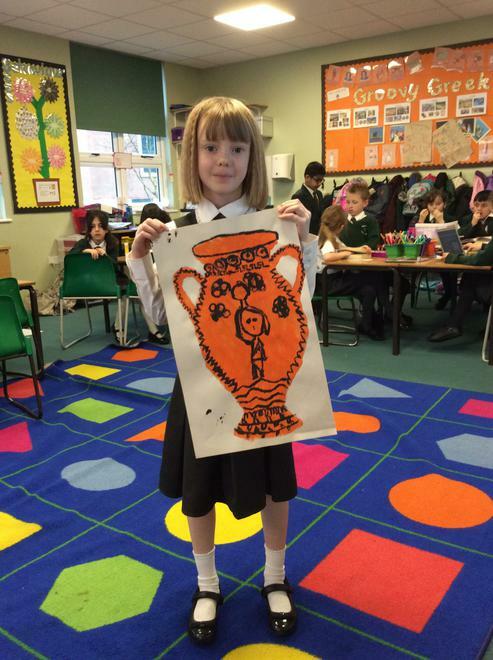 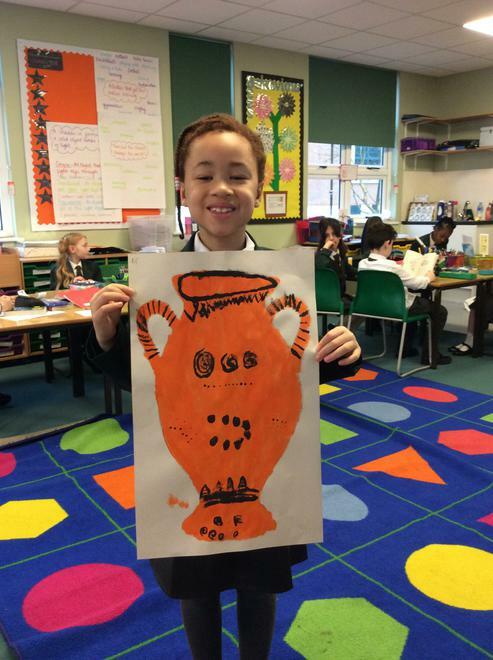 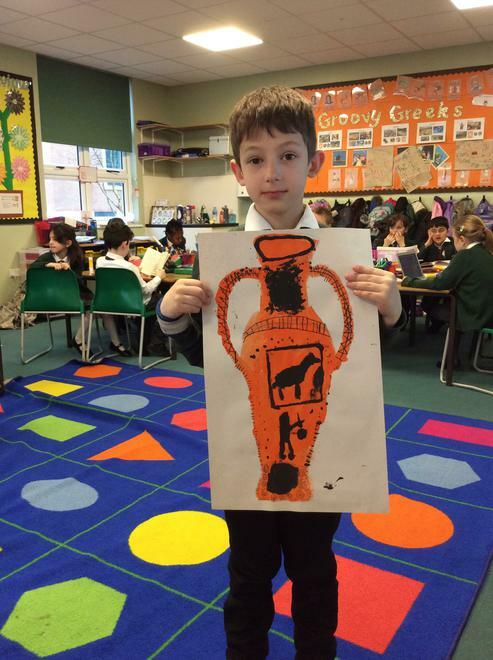 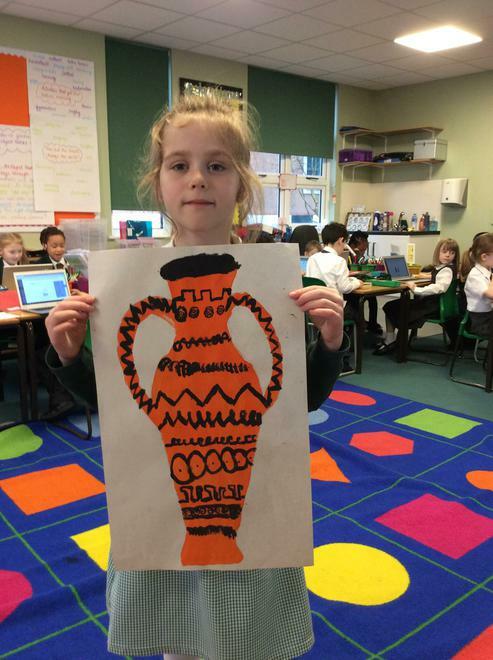 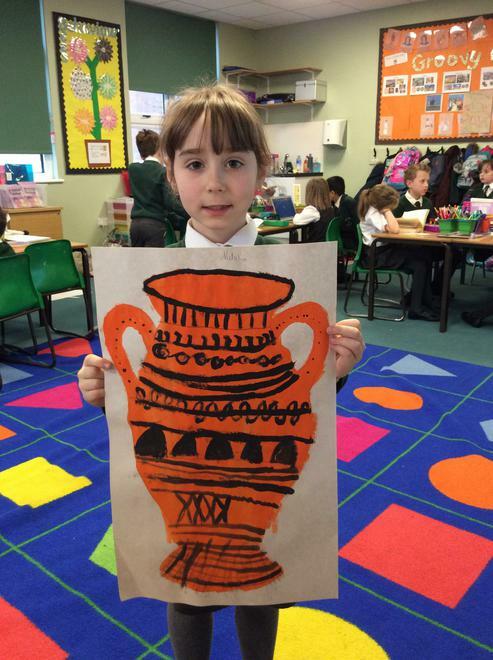 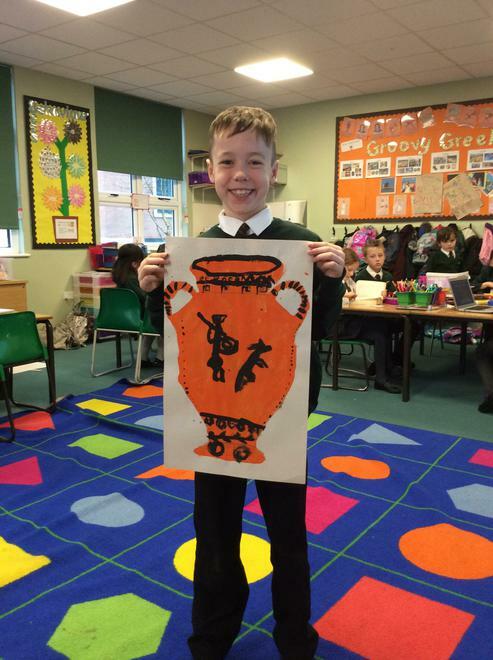 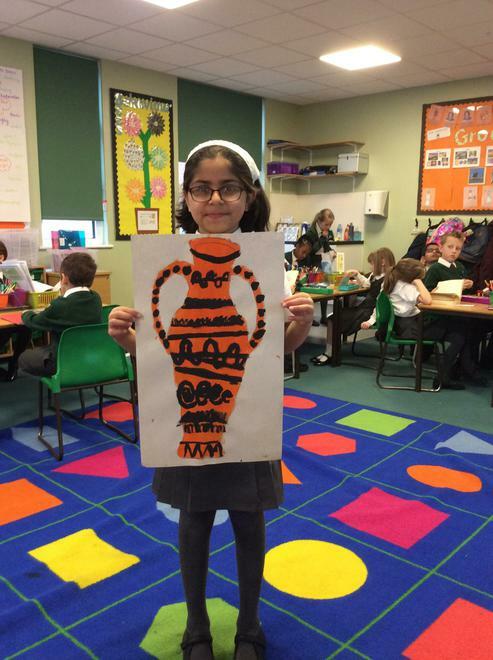 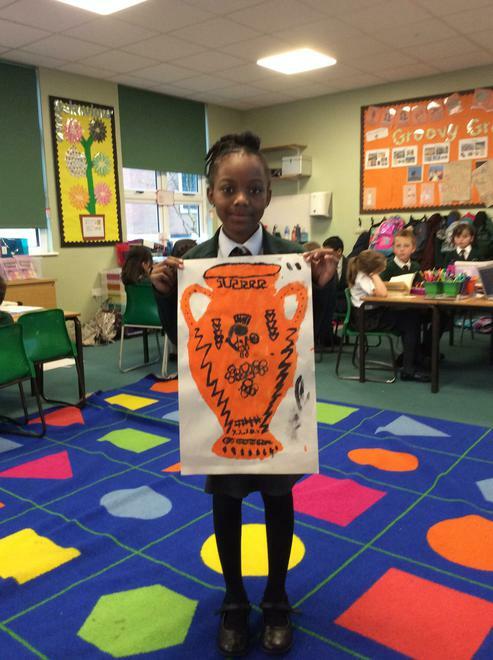 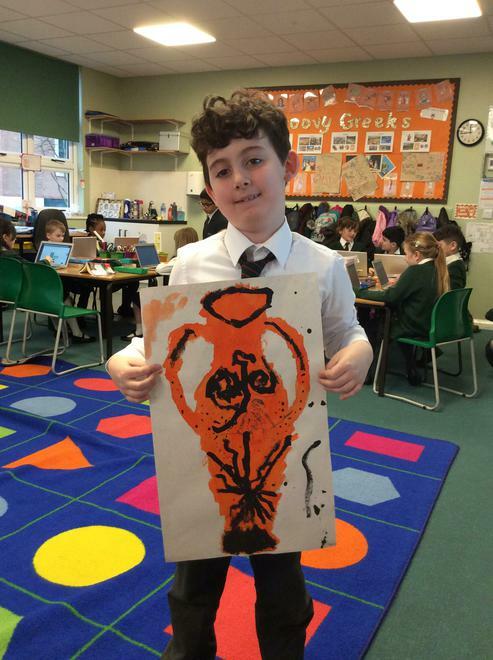 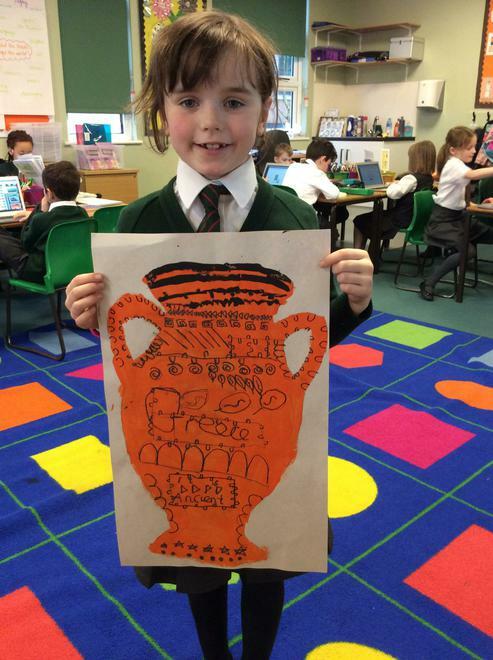 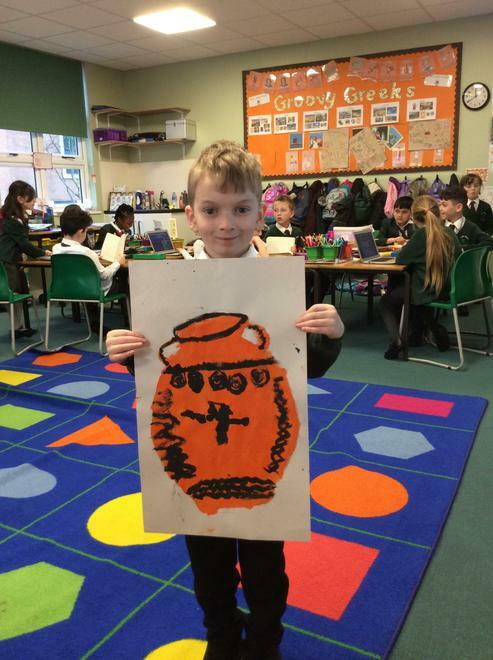 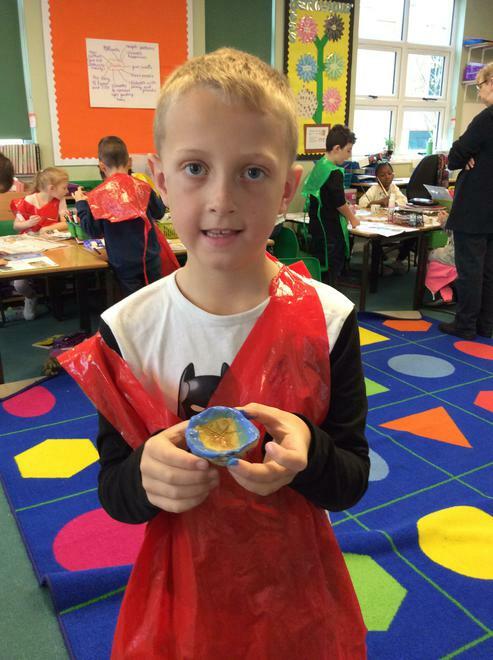 This week to finish off our Groovy Greeks topic we looked at Ancient Greek pottery. 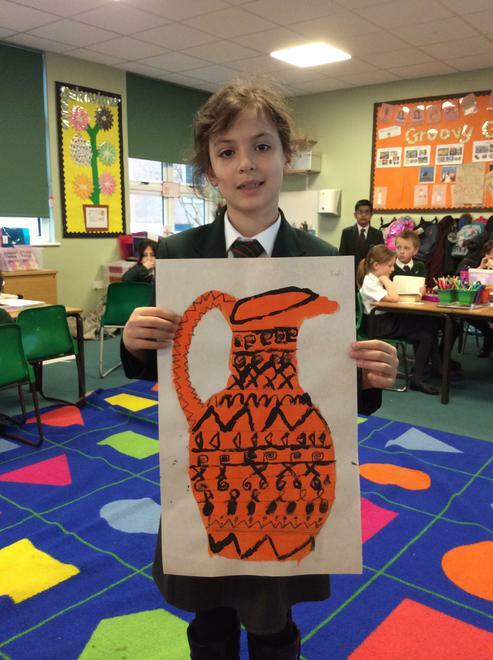 We found that the Greeks were famous for their beautiful, creative and detailed pots and they often included geometric and figure designs. 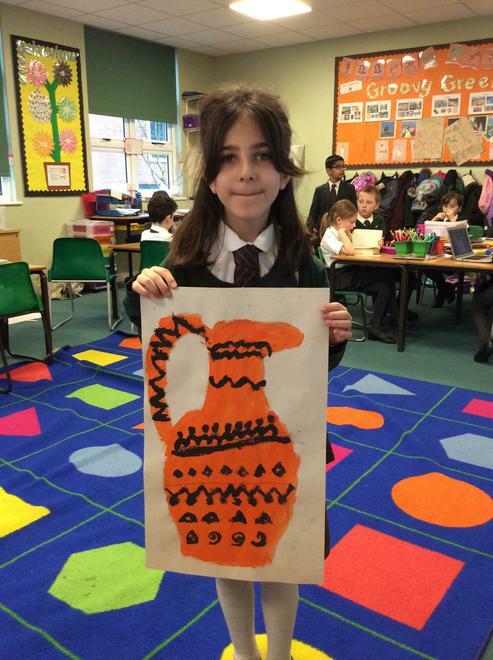 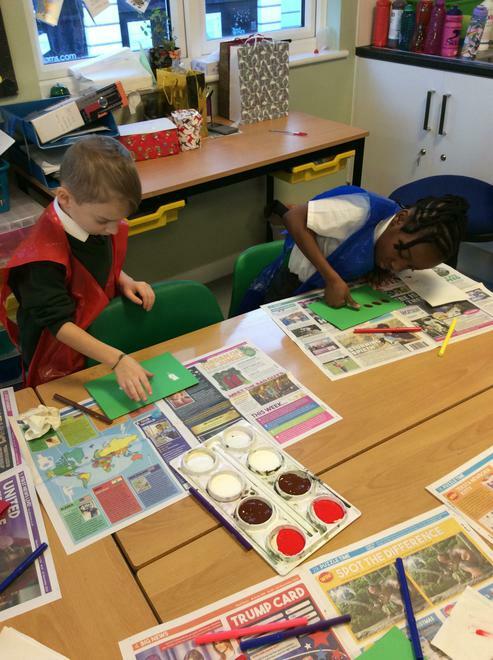 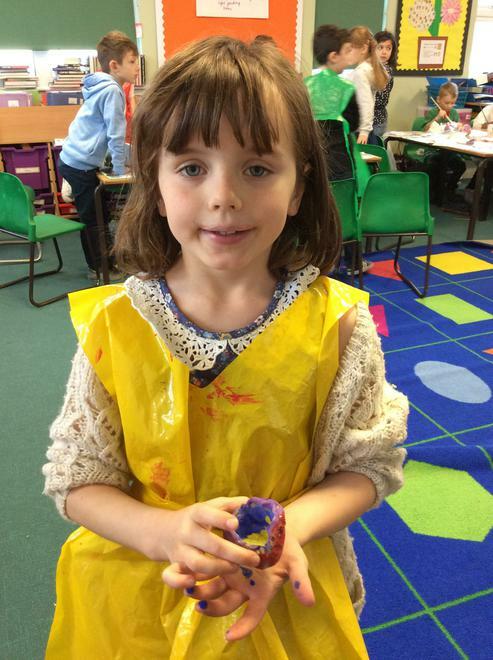 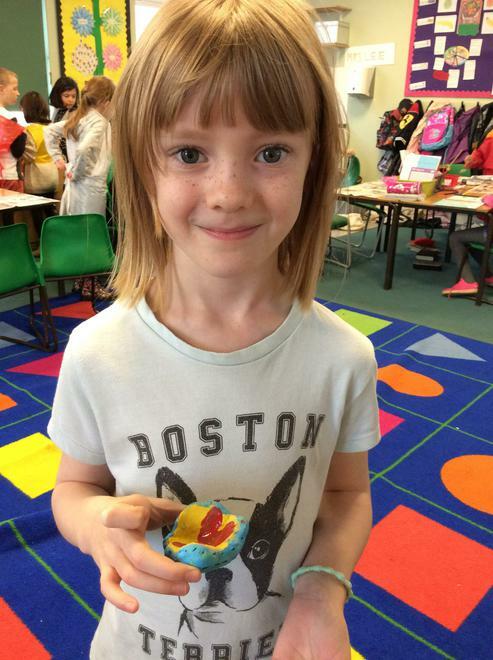 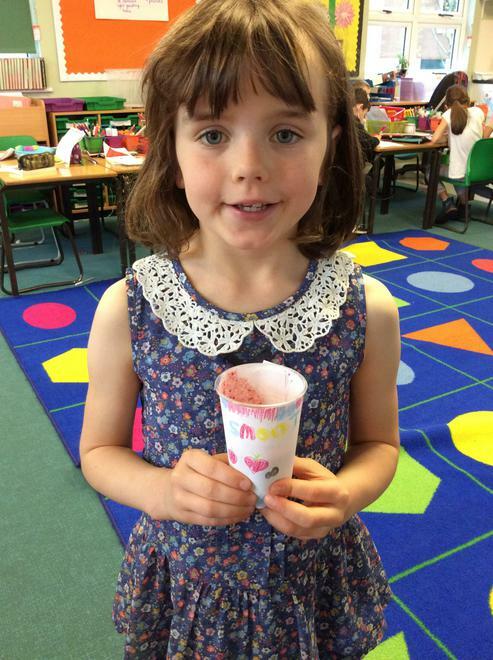 We planned what designs we liked the most and then painted our own pots! 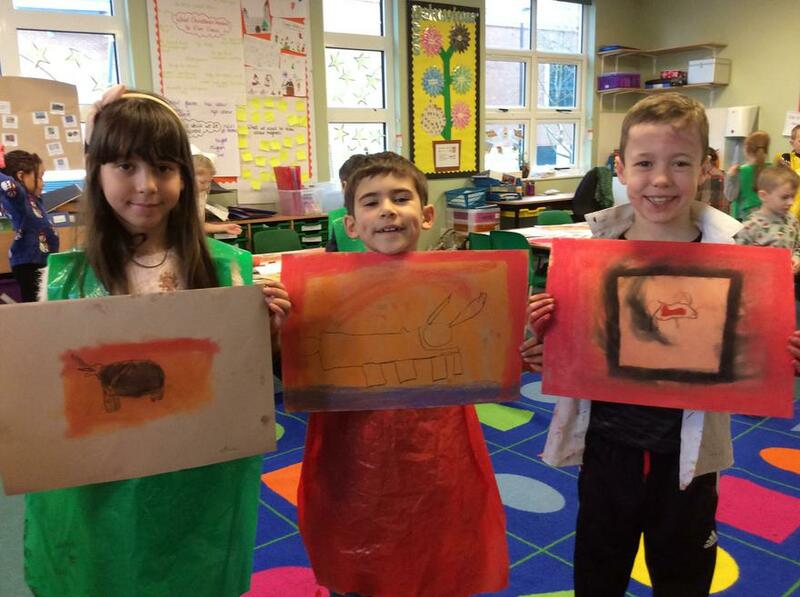 They came out beautifully! 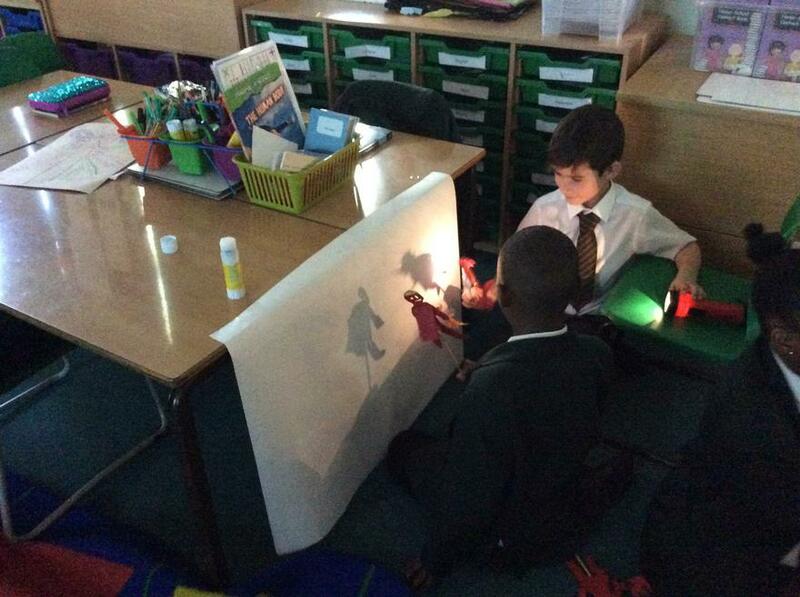 This week in Science we have been looking at shadows. 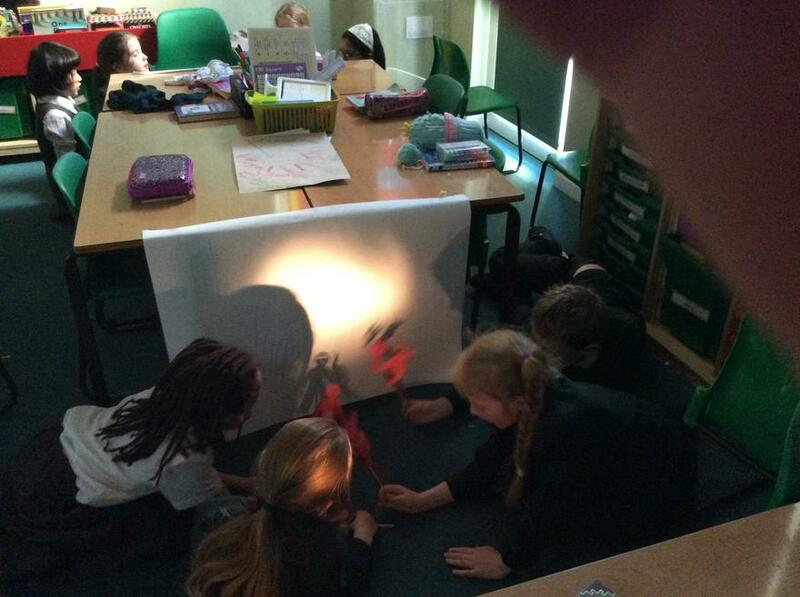 Today, we conducted an investigation to see what makes a shadow change size. 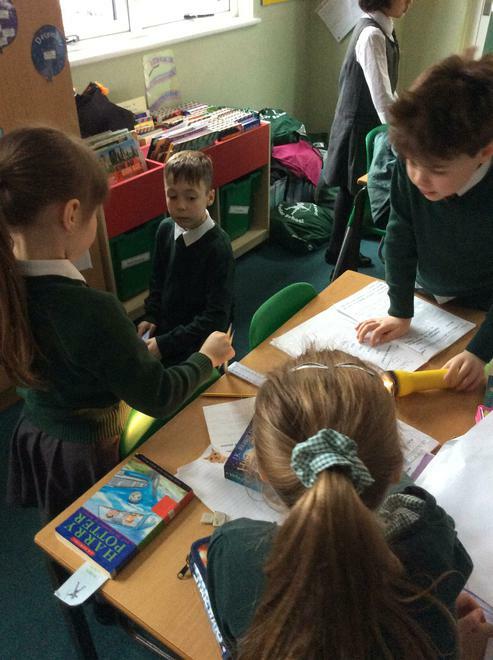 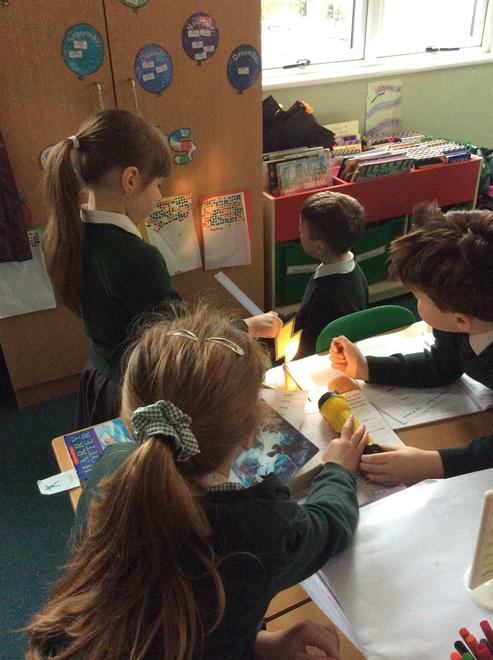 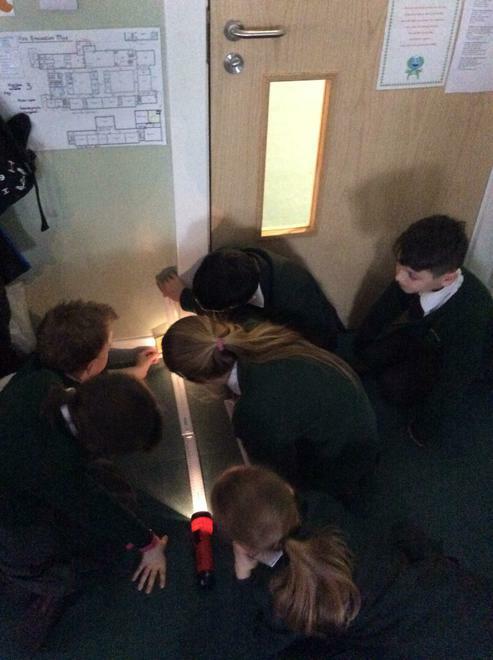 We had a cut out of Zeus' thunderbolt as our opaque solid object and used a torch to find out how and why the size of the shadow of this object might change. 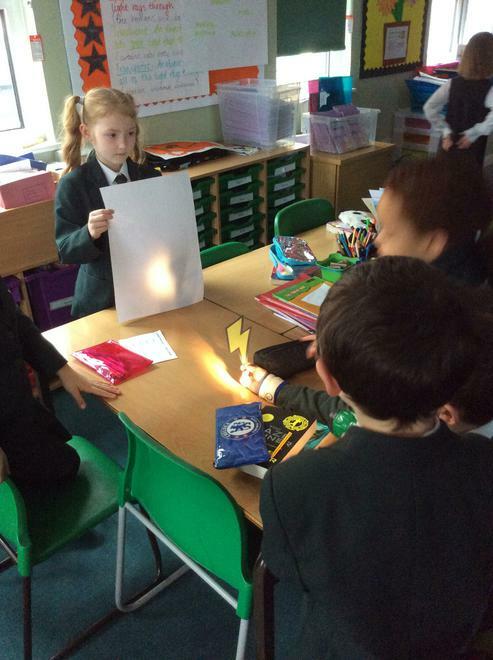 We found out that the closer the light source is to the object, the bigger the shadow is! 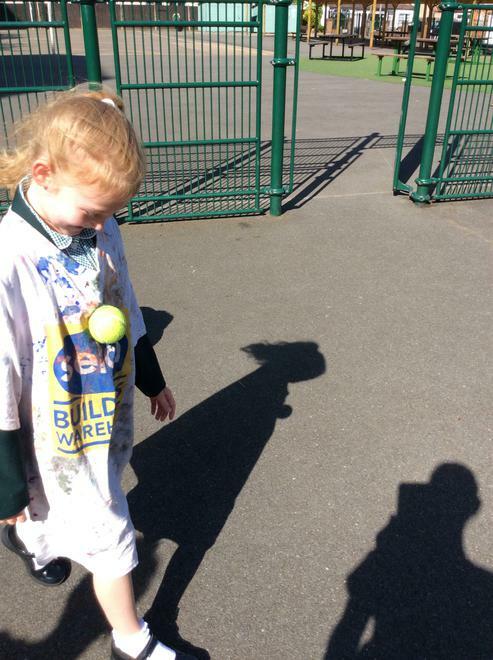 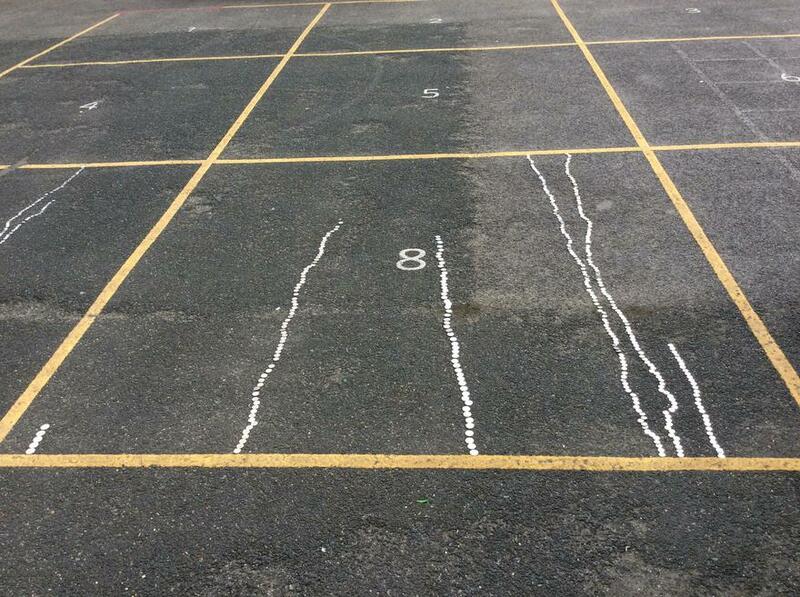 This week in Science we have been looking at how shadows are formed. 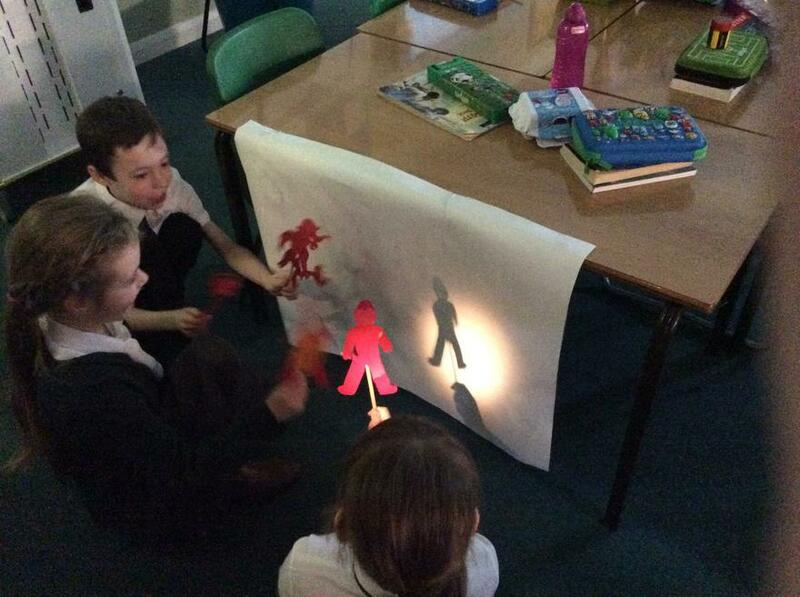 We looked at the different types of objects (opaque, translucent and transparent) and the effects they have on shadows. 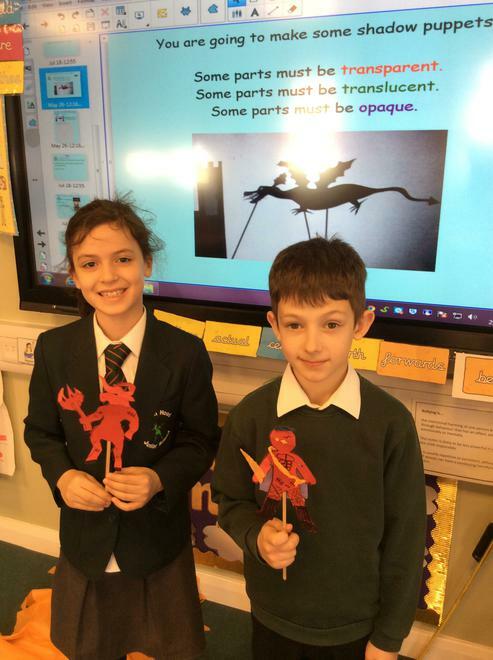 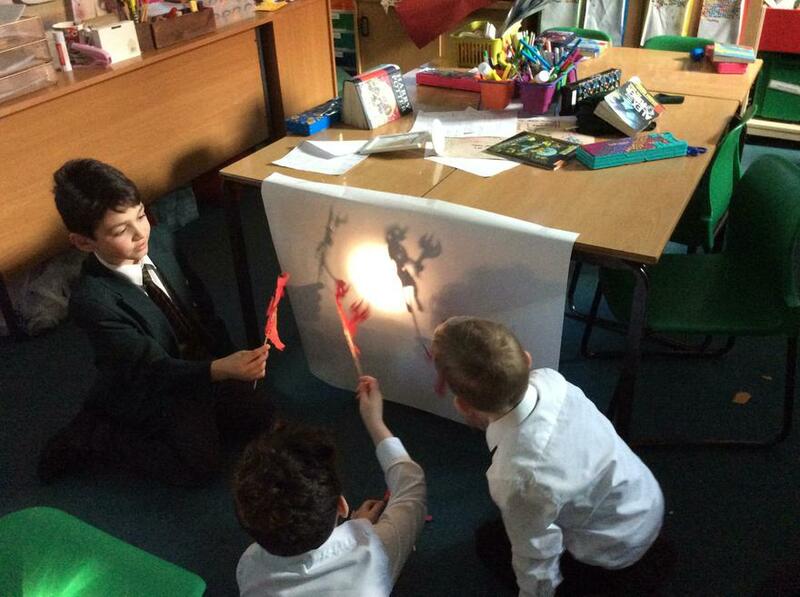 We then used this information to create our own greek themed shadow puppets that included all three of these elements using card and tissue paper. 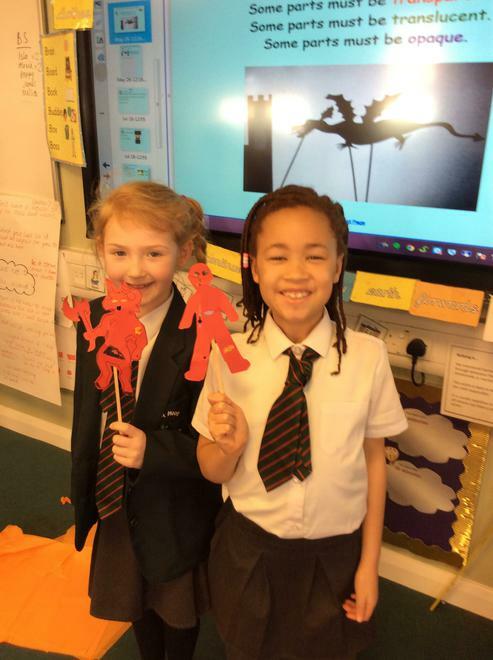 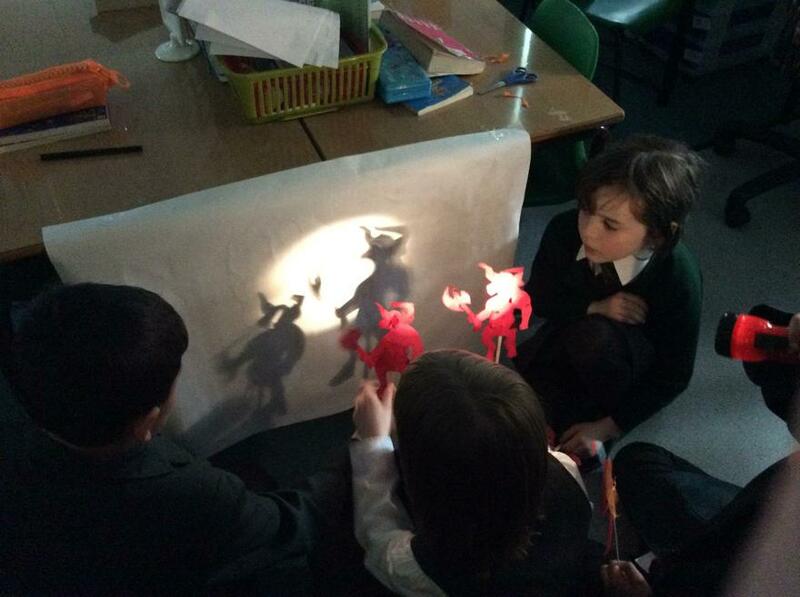 We then turned off the lights to see how effectively our puppets created shadows and performed a show of Theseus and the Minotaur in groups. 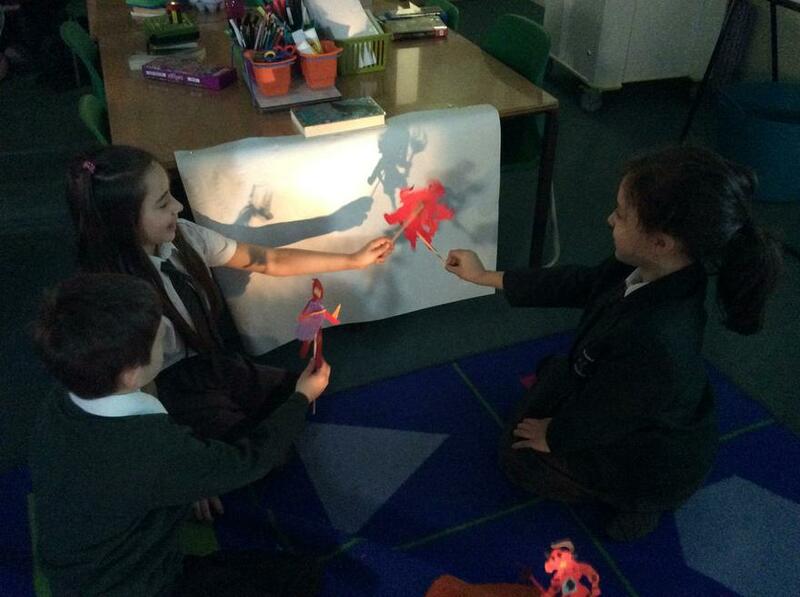 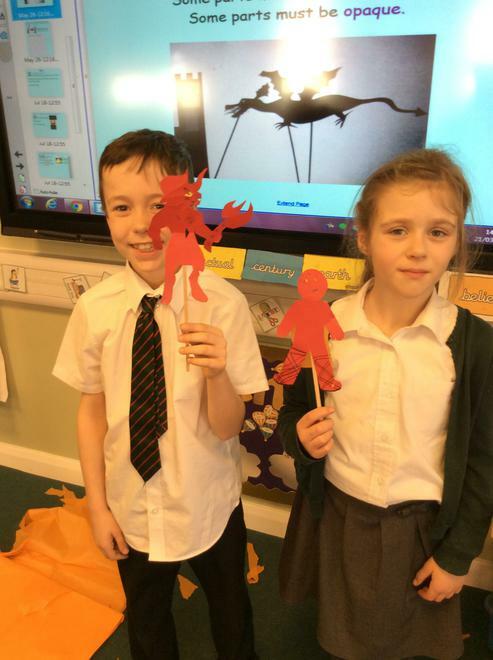 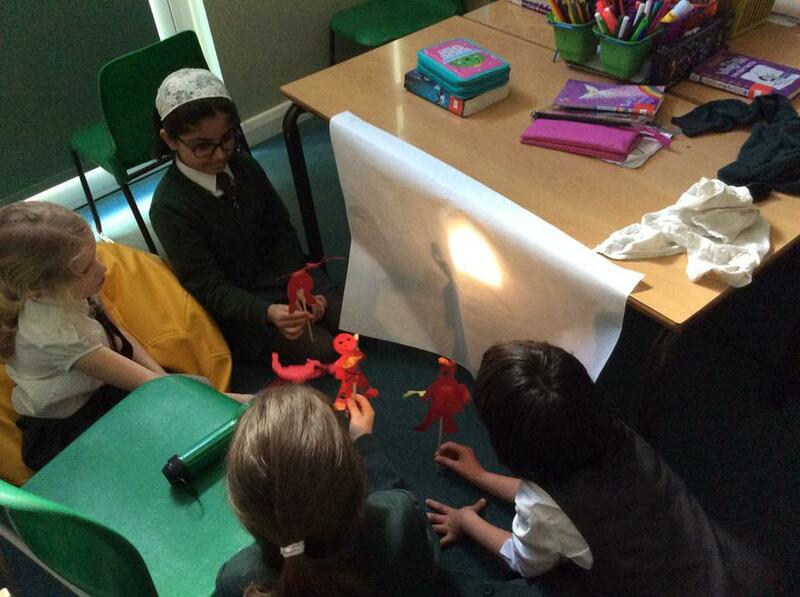 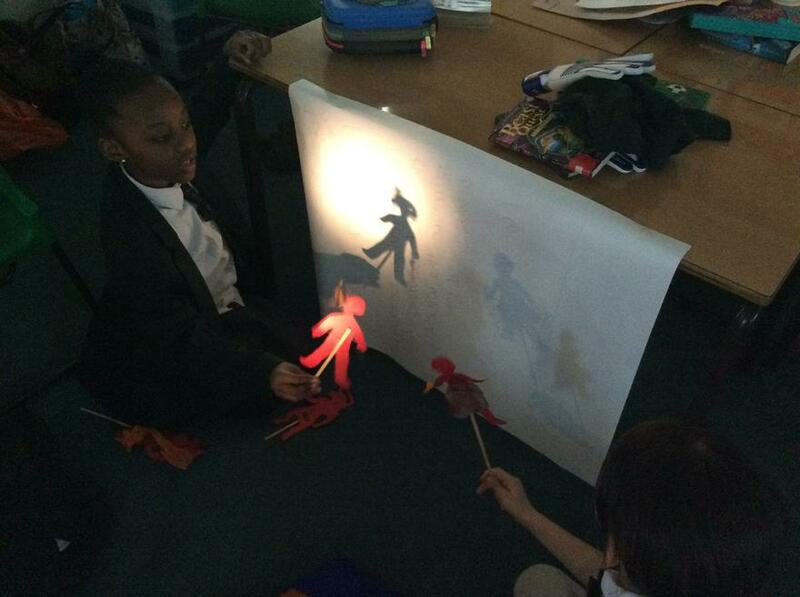 We had a lot of fun and did a brilliant job at retelling the story using shadows! 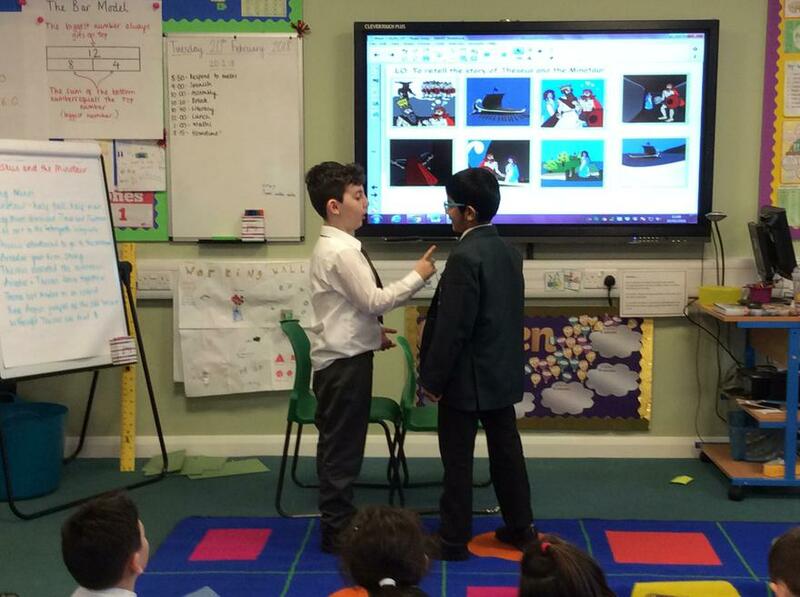 This week in Literacy we have been looking at the power of persuasion in speeches. 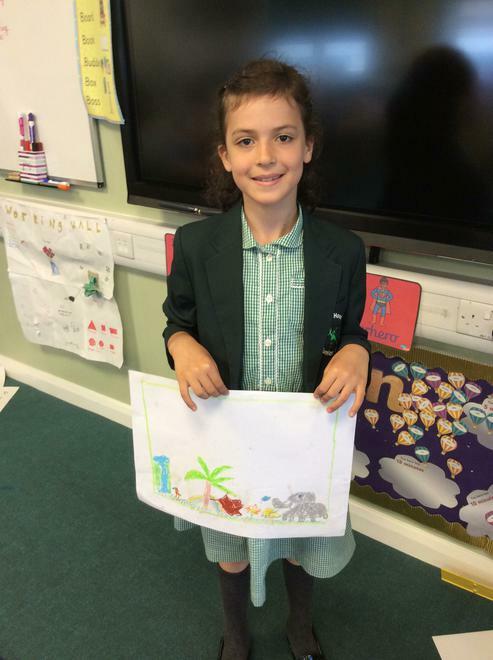 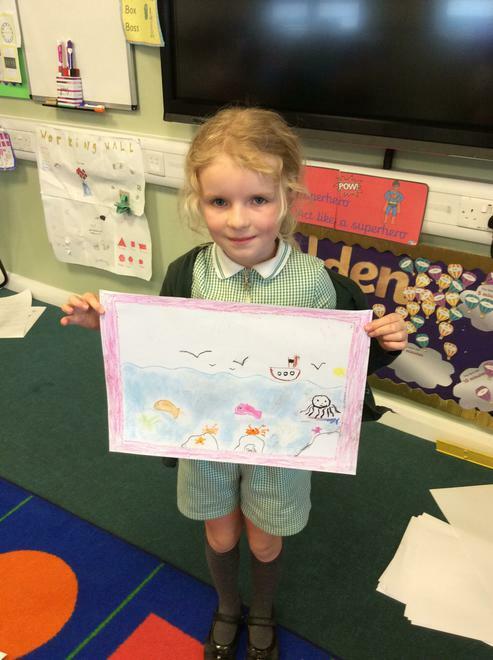 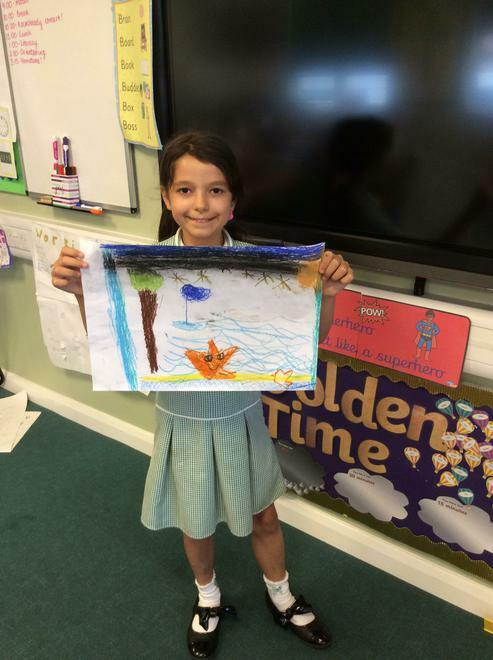 We looked back at the myth of Theseus and the Minotaur and thought about how Ariadne would have felt about Theseus leaving her on a deserted island. 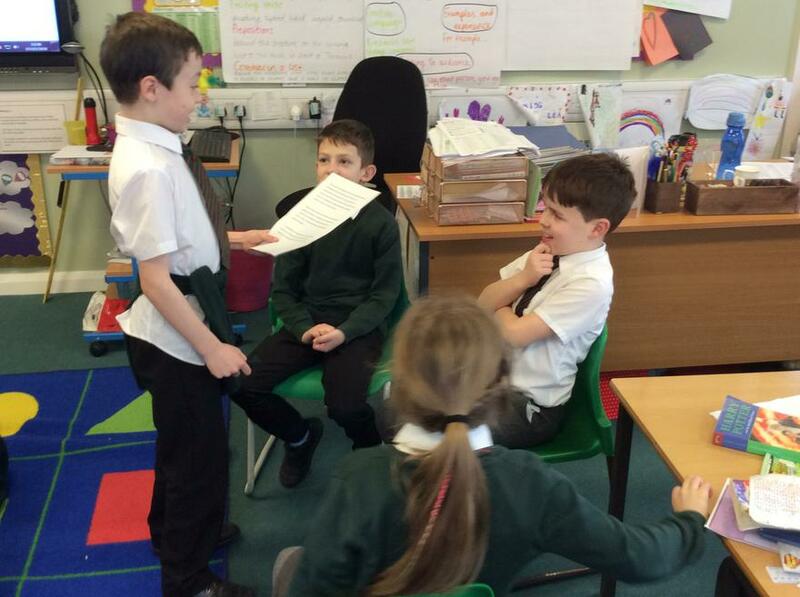 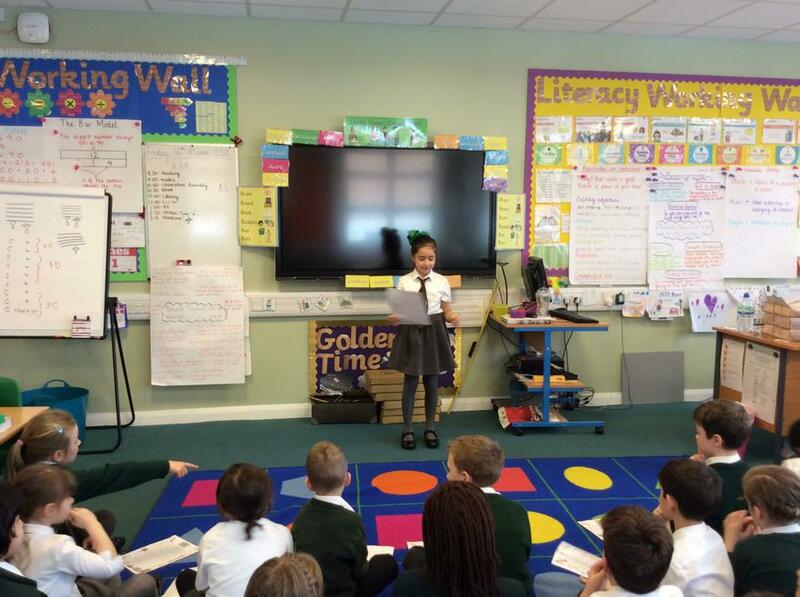 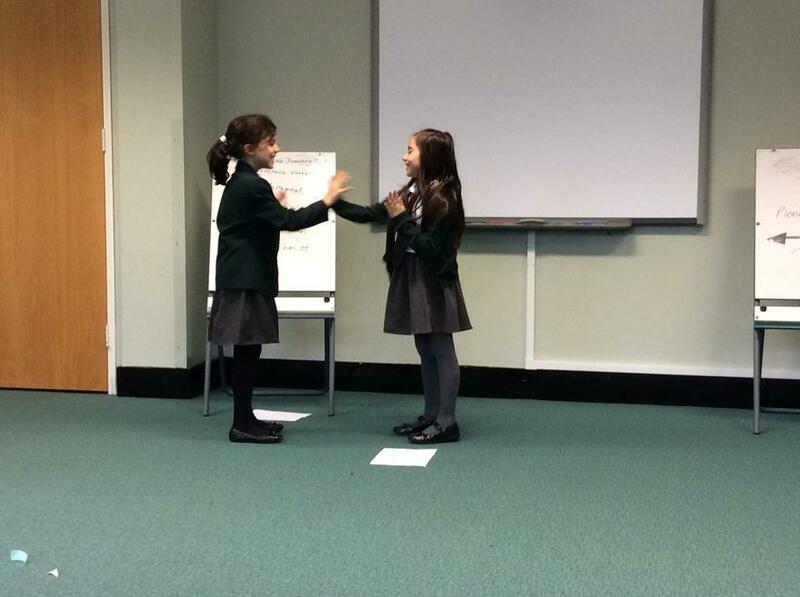 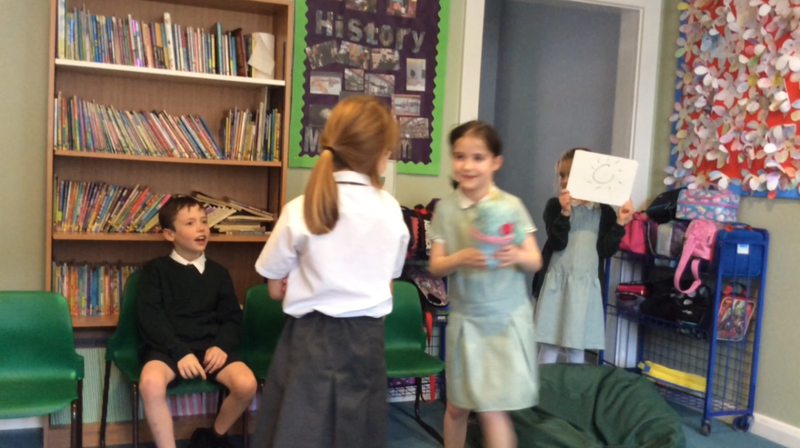 We then created a speech as Ariadne to try and persuade Theseus not to leave her there alone and today we performed them to the rest of the class who were acting as Theseus! 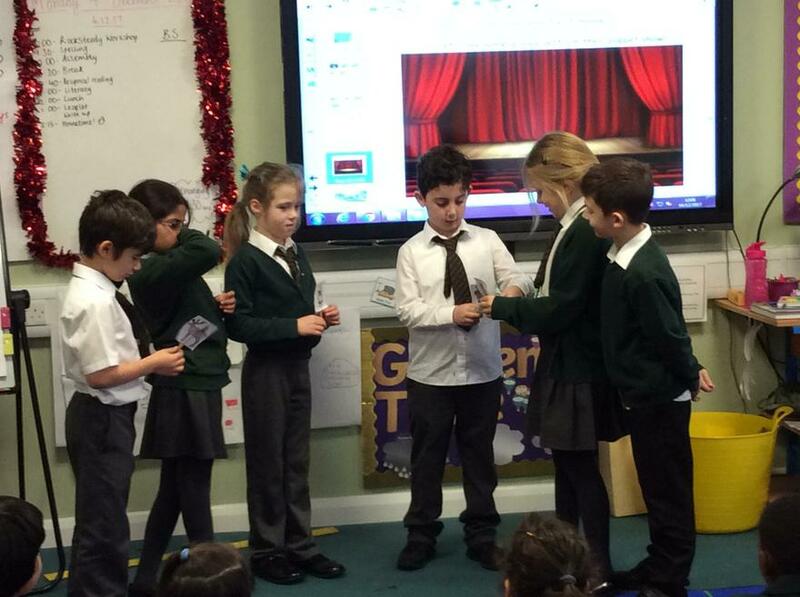 Everybody did a brilliant job at persuading us to change our minds! 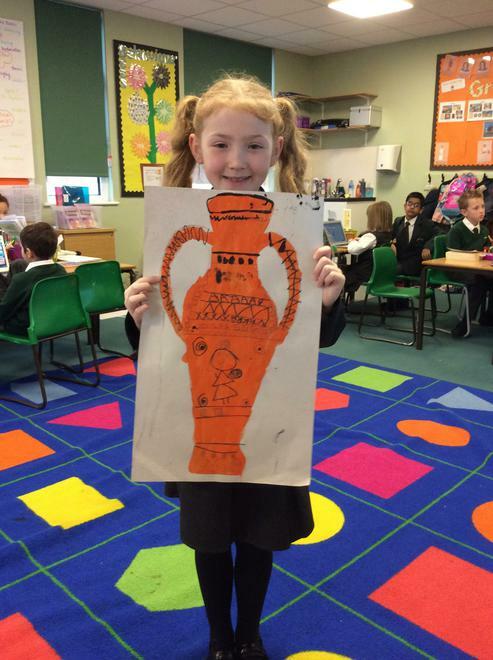 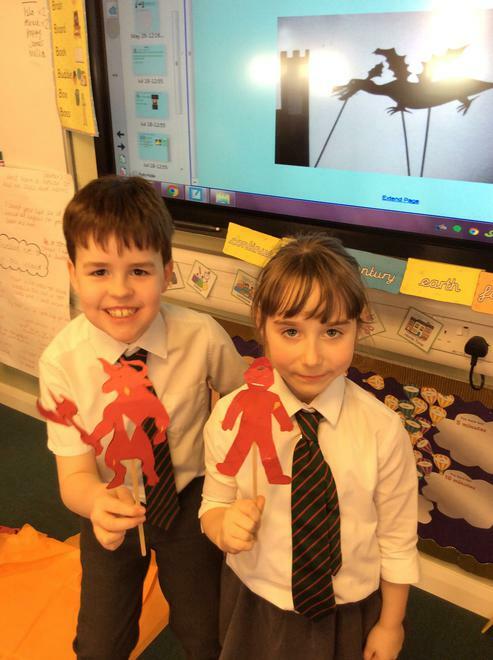 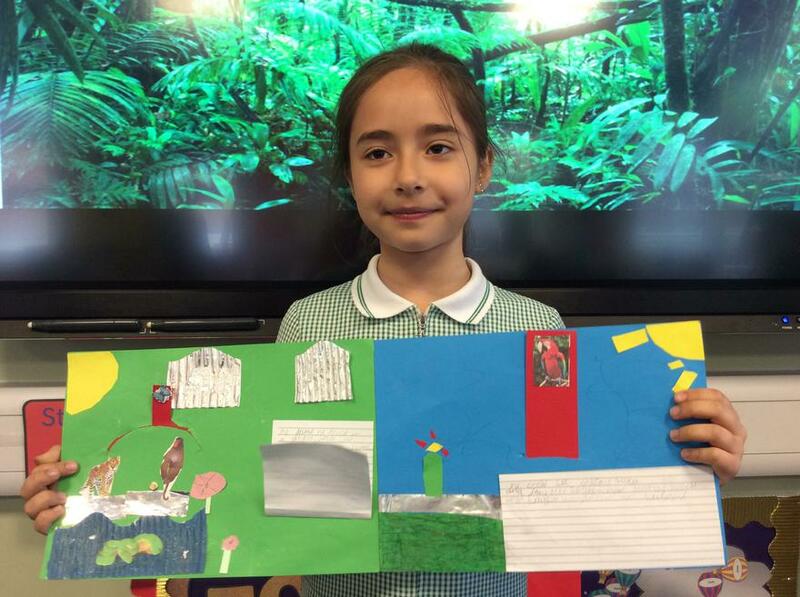 This week in Topic we have been learning about how the Ancient Greeks invented democracy. 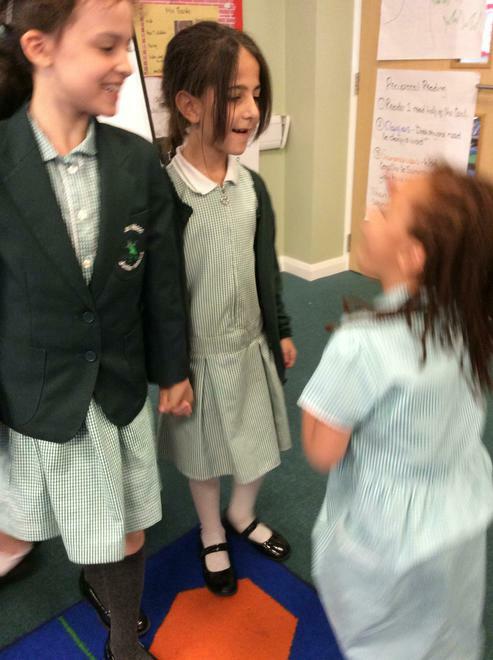 We learnt that speakers would stand on the pnyx to talk to the Athenian citizens about laws and then the citizens would vote on them. 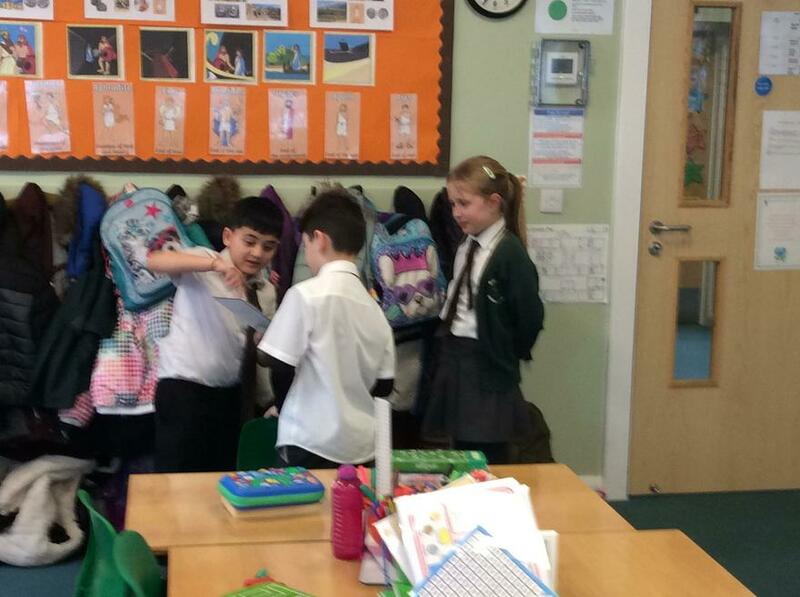 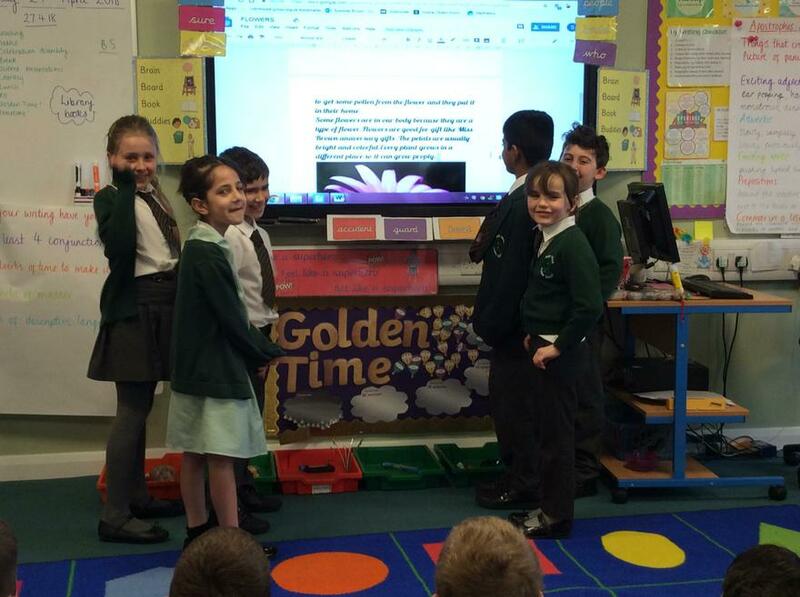 We even had a go at pretending to be speakers with issues Ancient Greeks might have had to try and persuade our fellow classmates to vote for us! 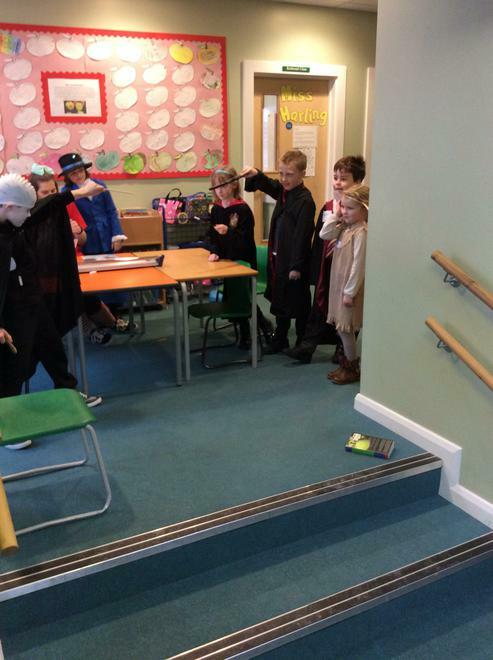 We were very good at getting into character and had a lot of fun too! 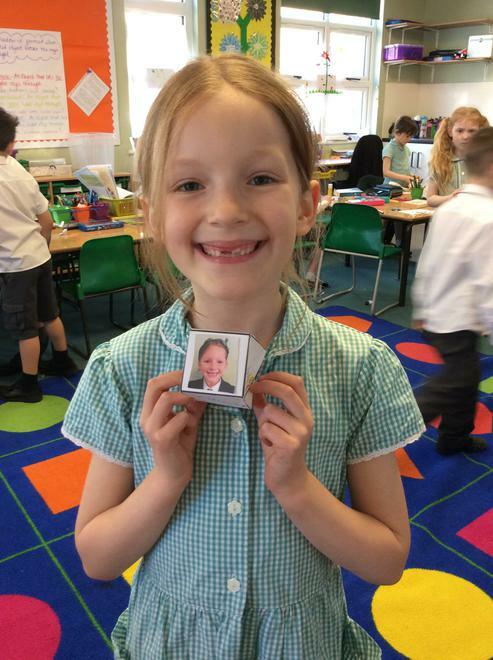 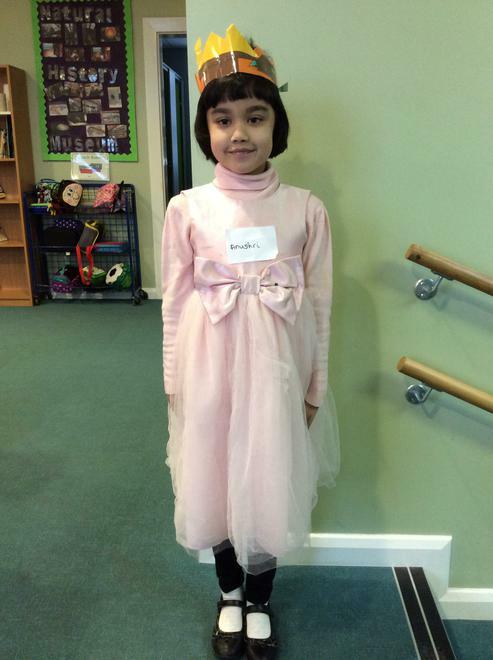 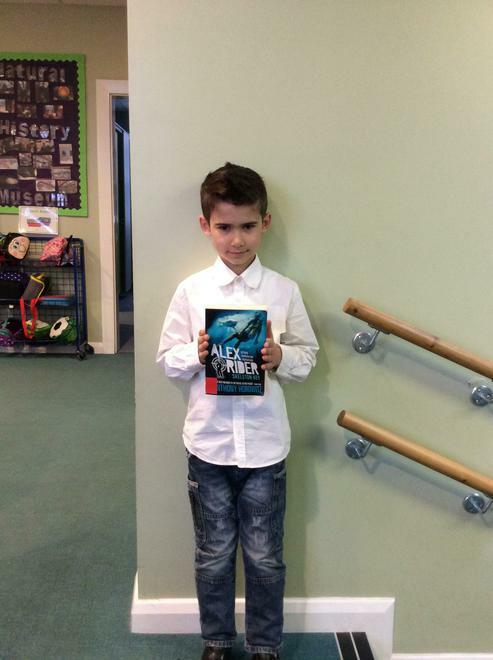 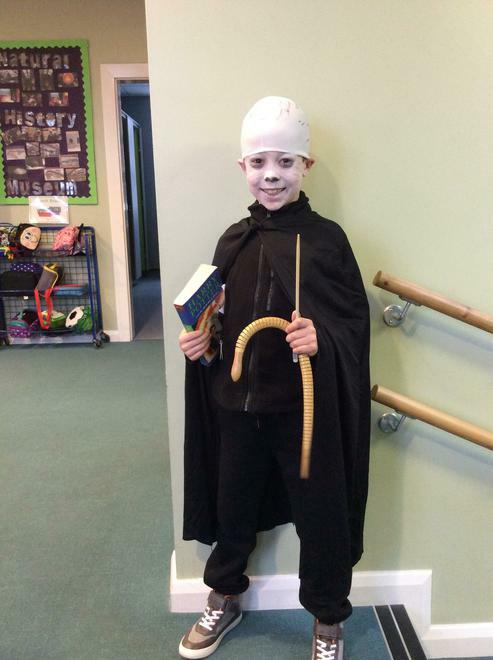 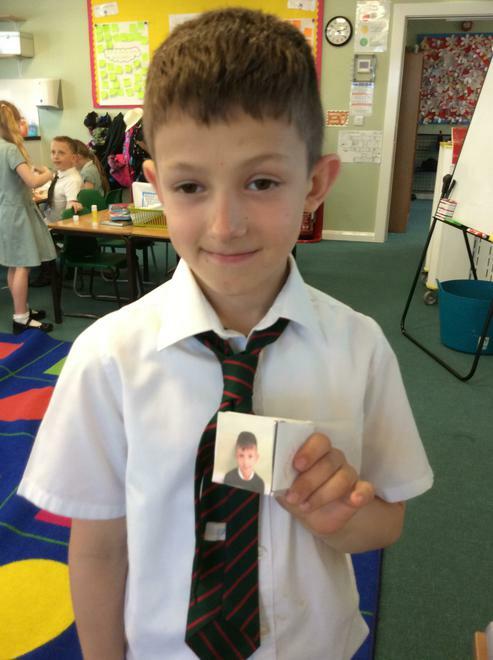 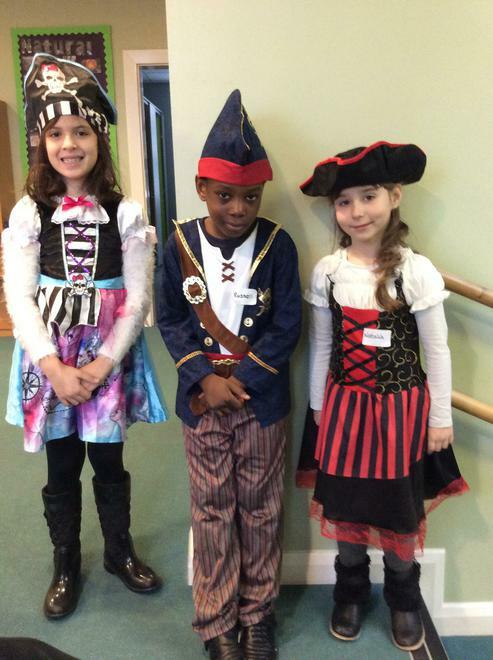 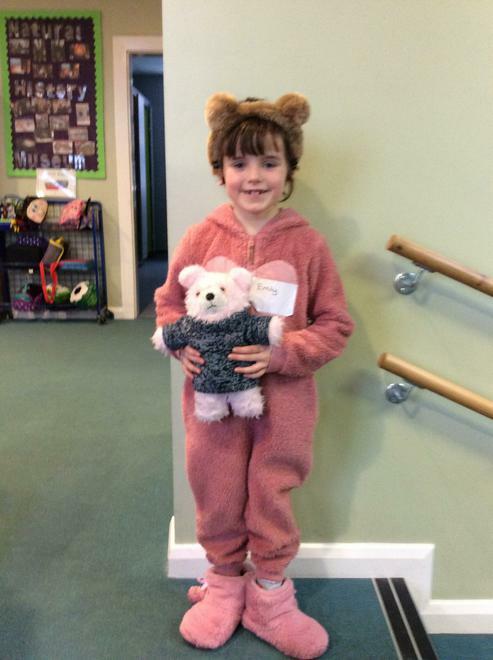 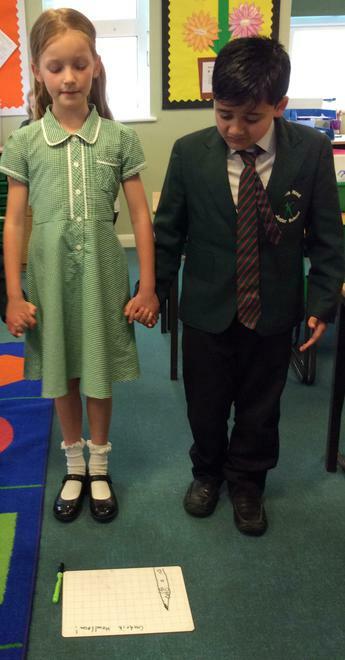 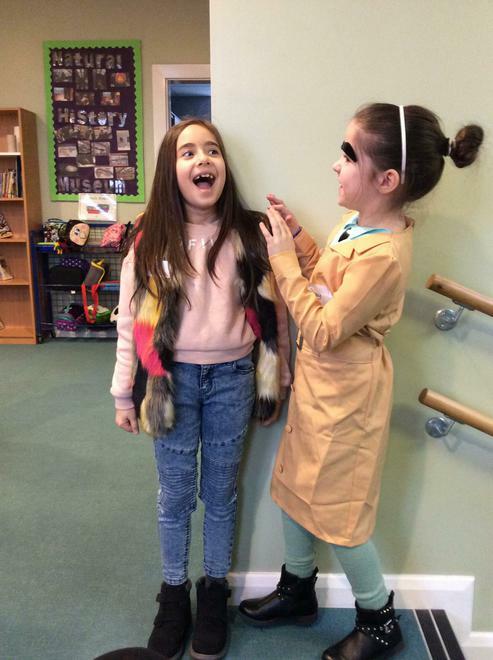 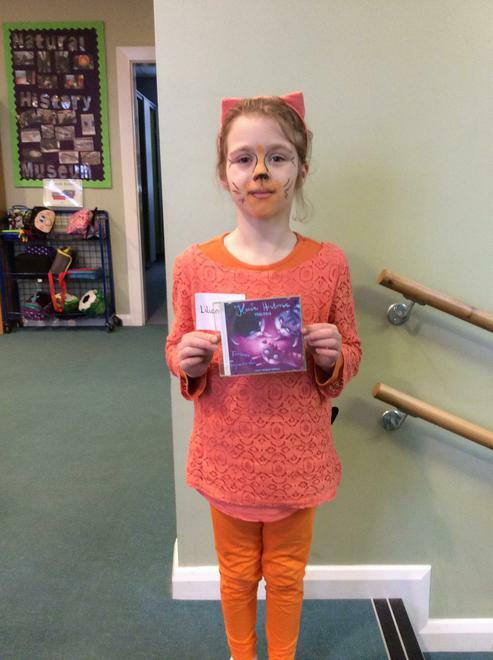 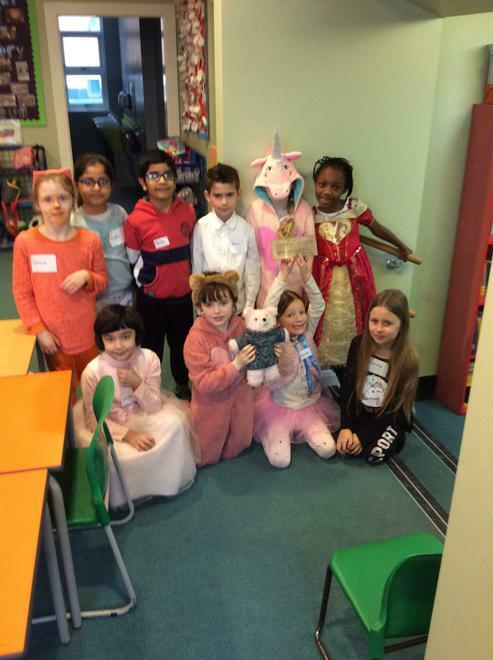 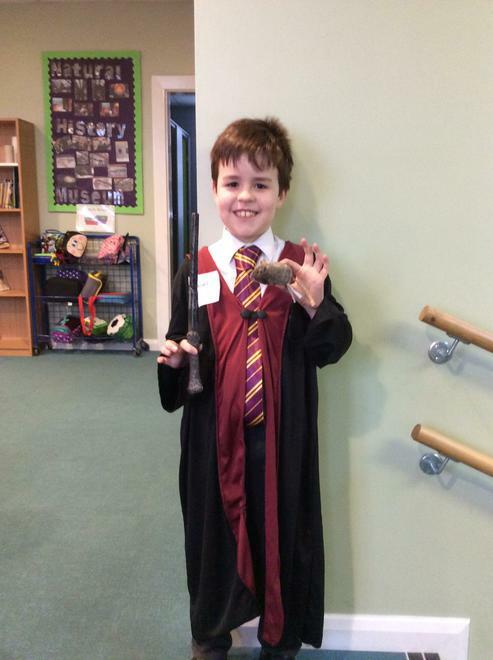 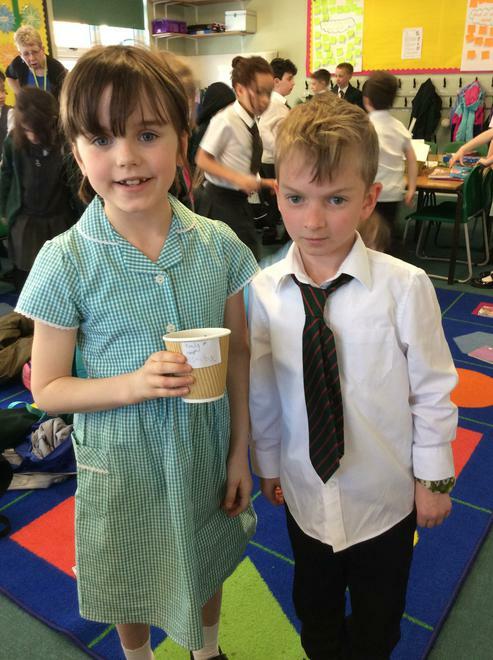 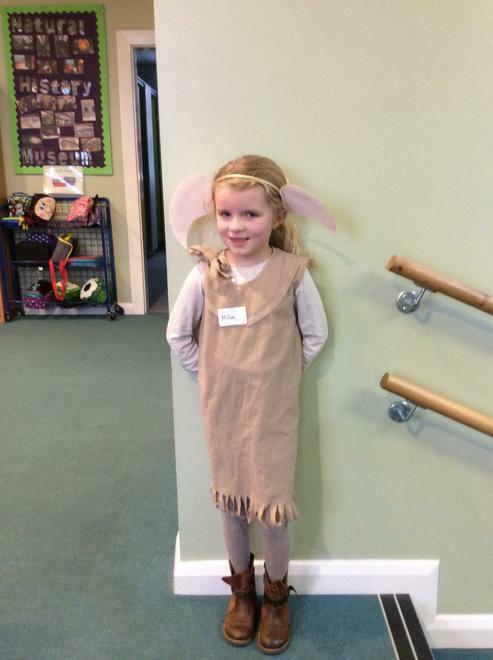 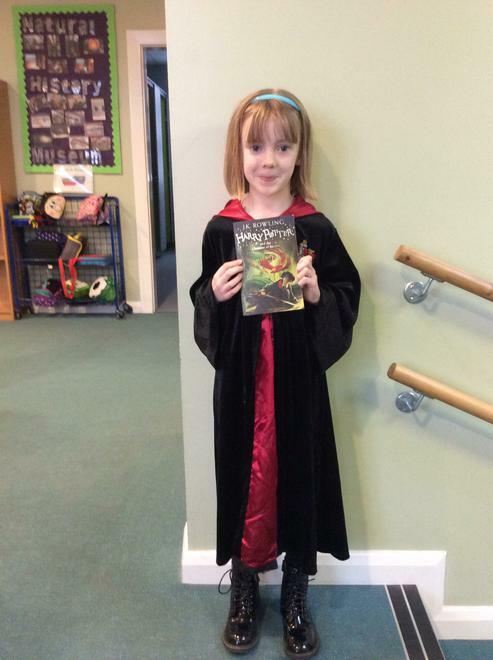 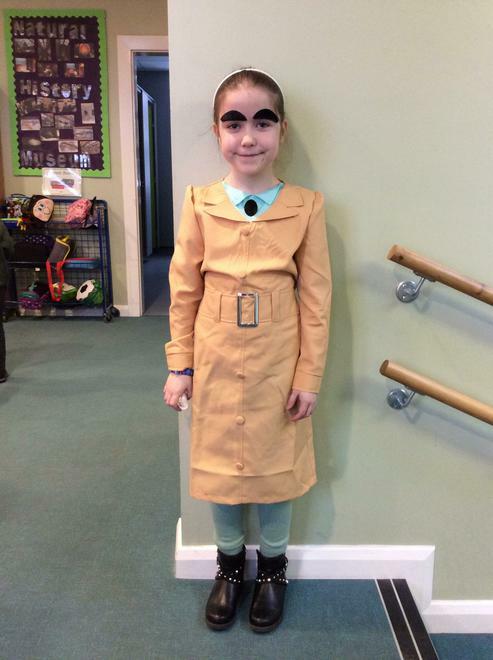 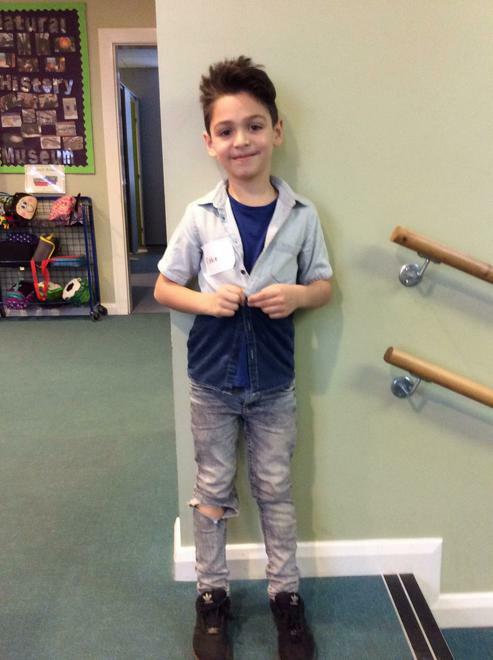 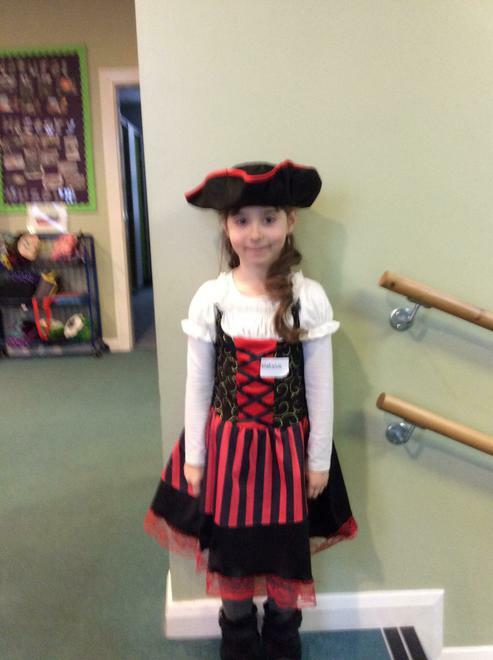 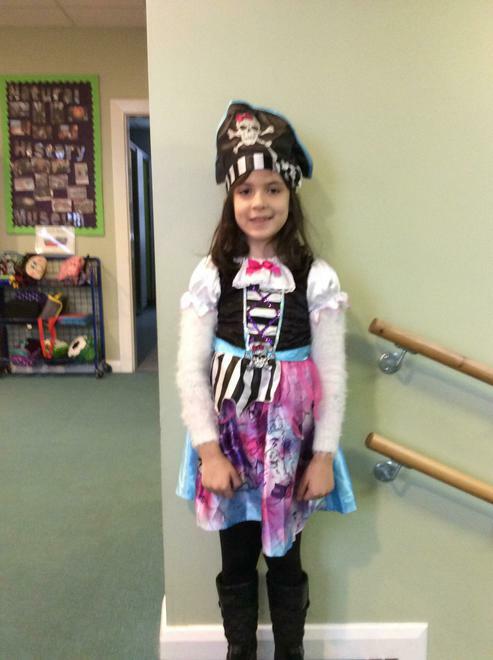 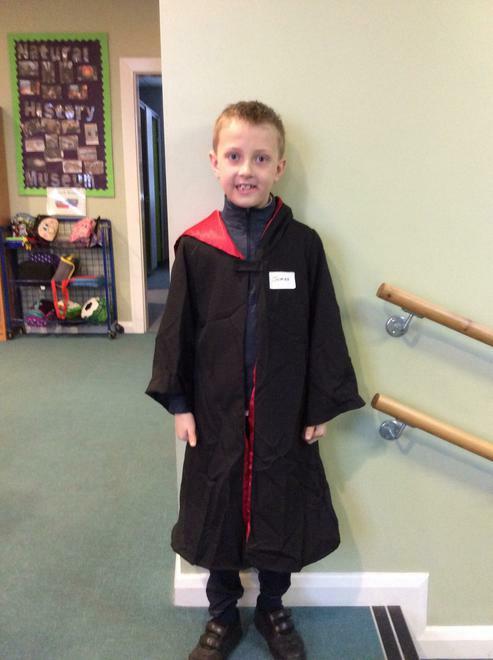 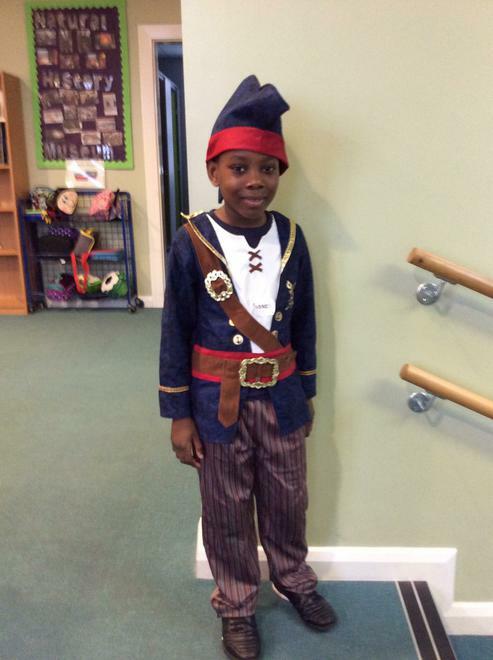 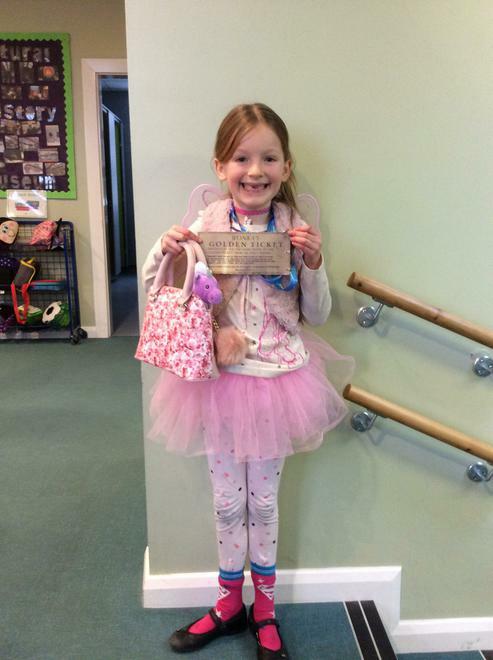 We had a great time dressing up as our favourite book characters to celebrate World Book Day! 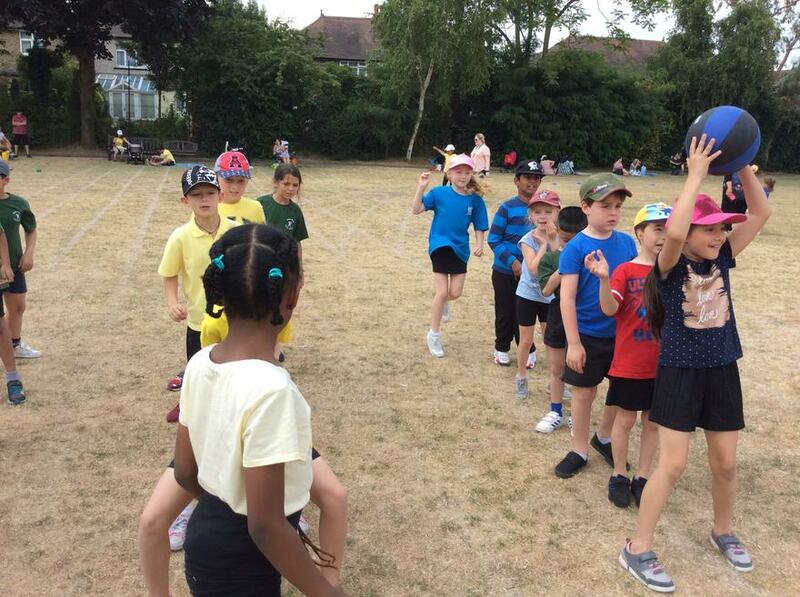 Well done to everyone for making such a brilliant effort! 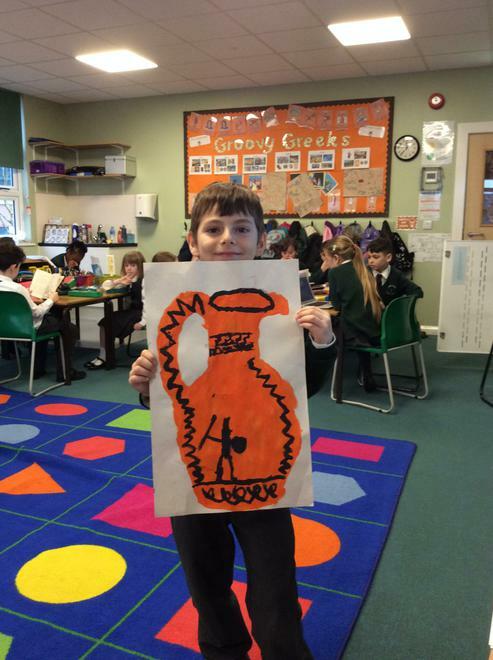 Today in Literacy we started our Groovy Greeks topic by looking at a myth from Ancient Greece called Theseus and the Minotaur. 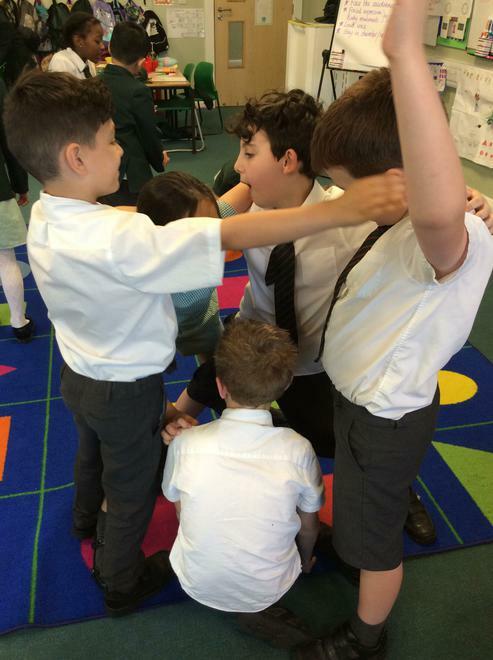 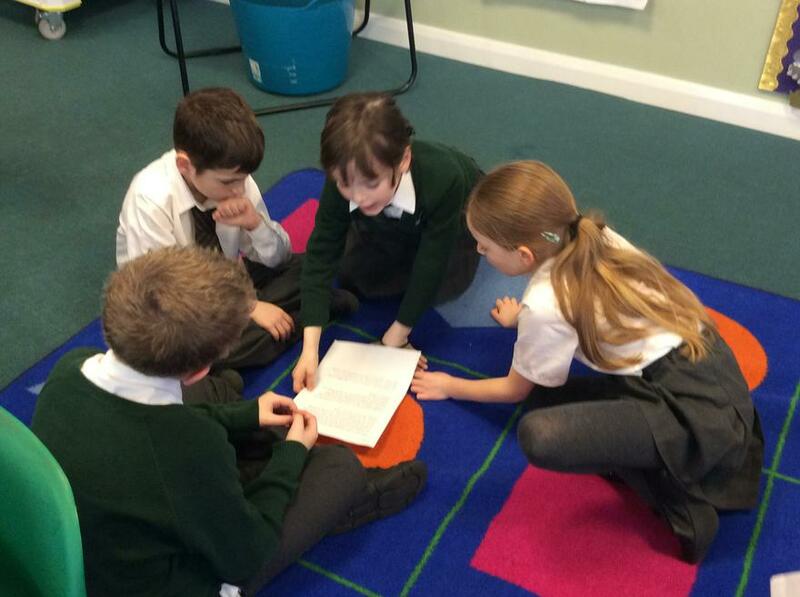 We talked about the features of a myth and what makes them different to other stories and then performed our own versions of the myth in groups! 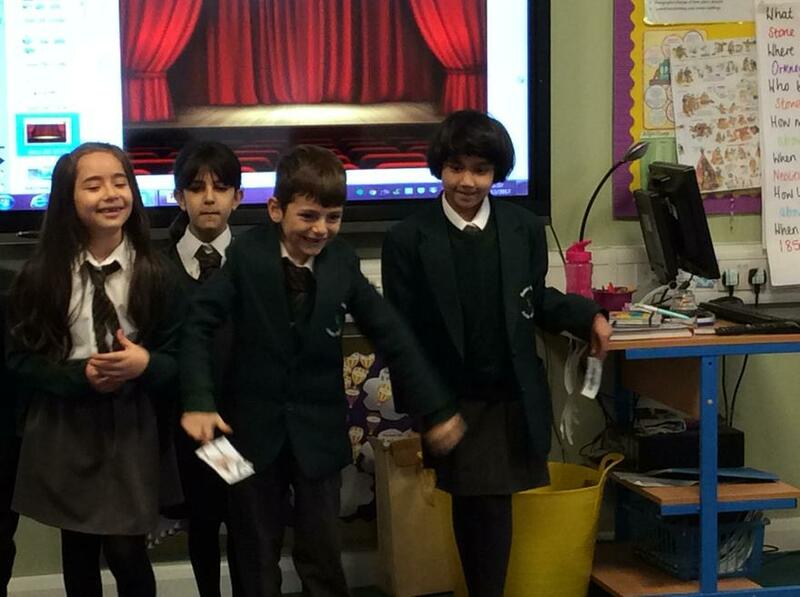 We had a lot of fun watching the brilliant performances as a class. 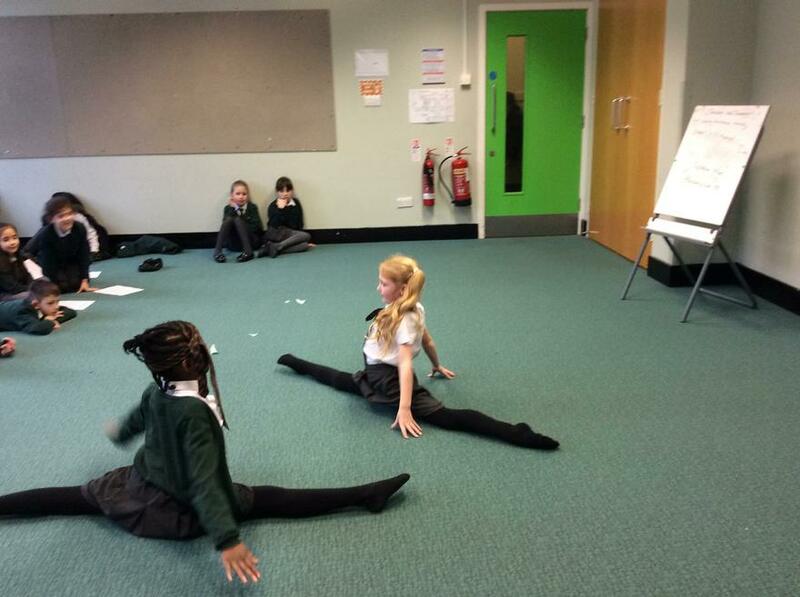 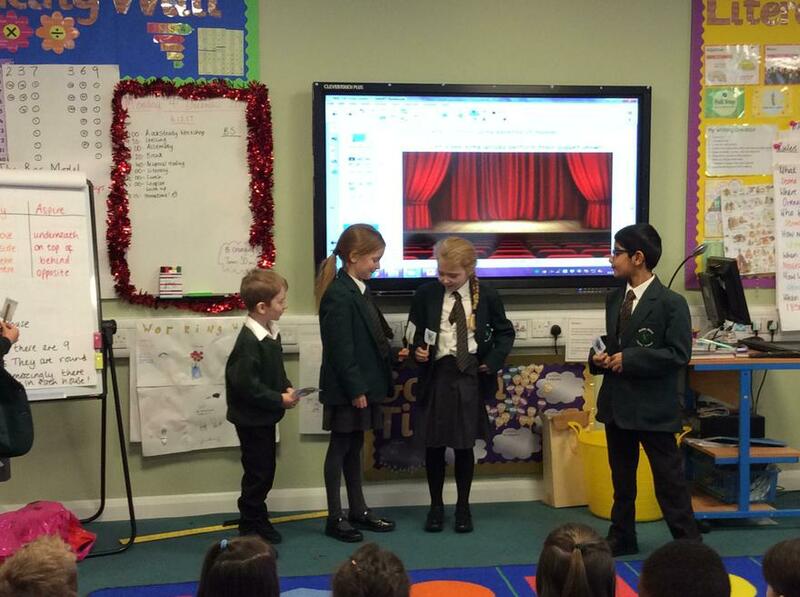 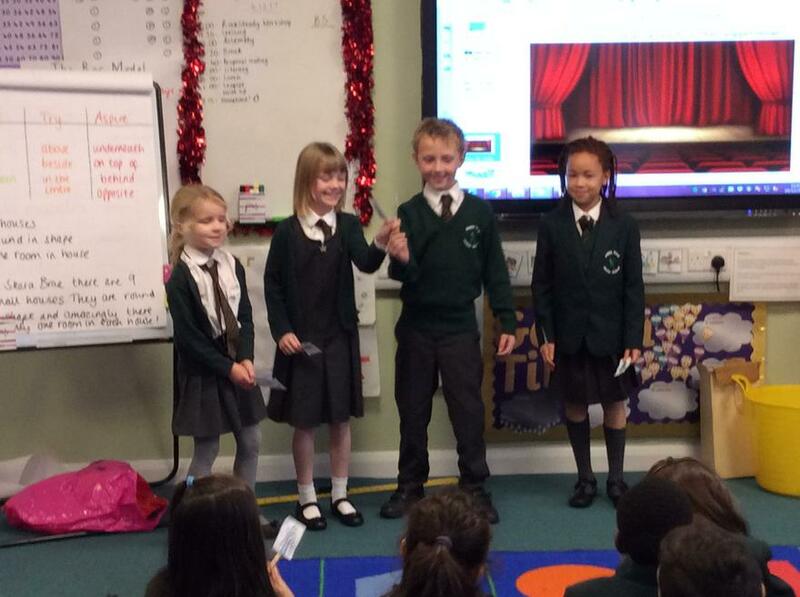 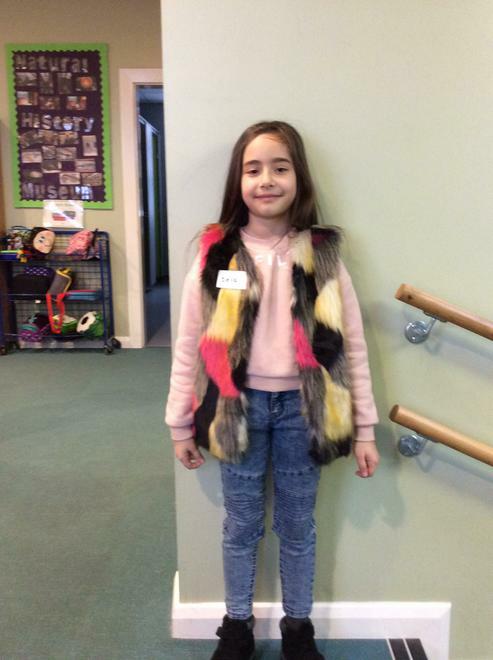 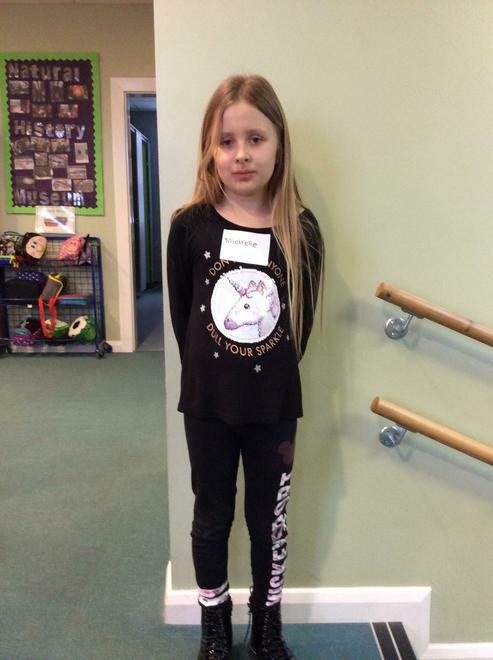 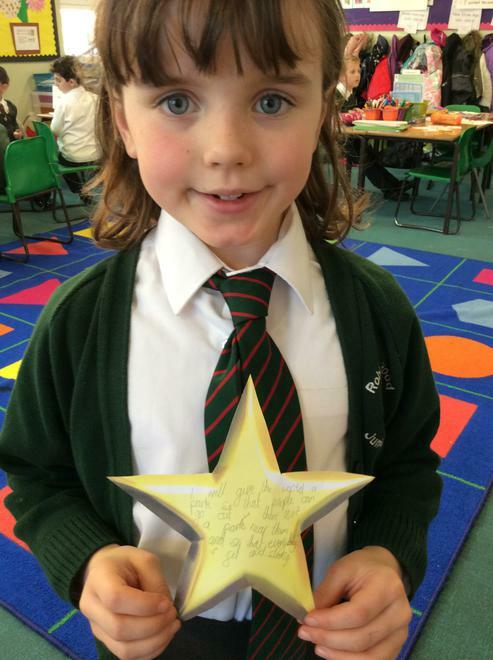 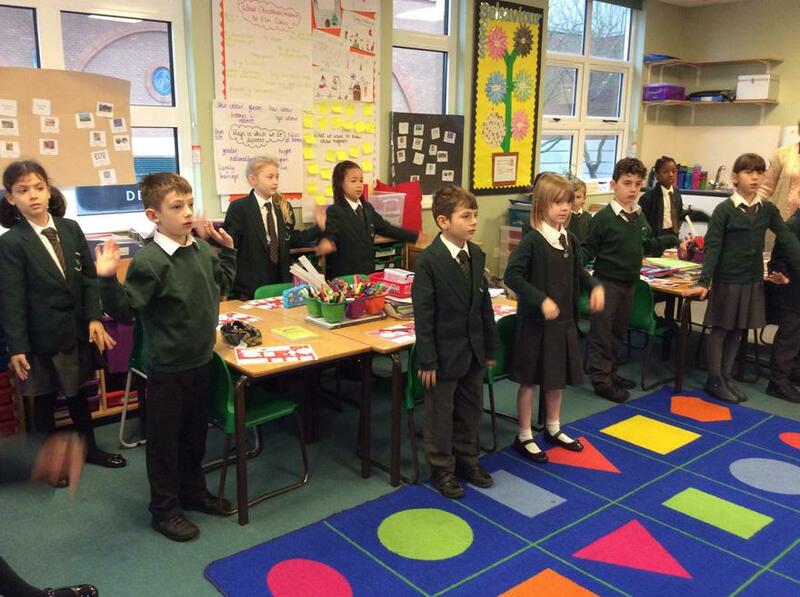 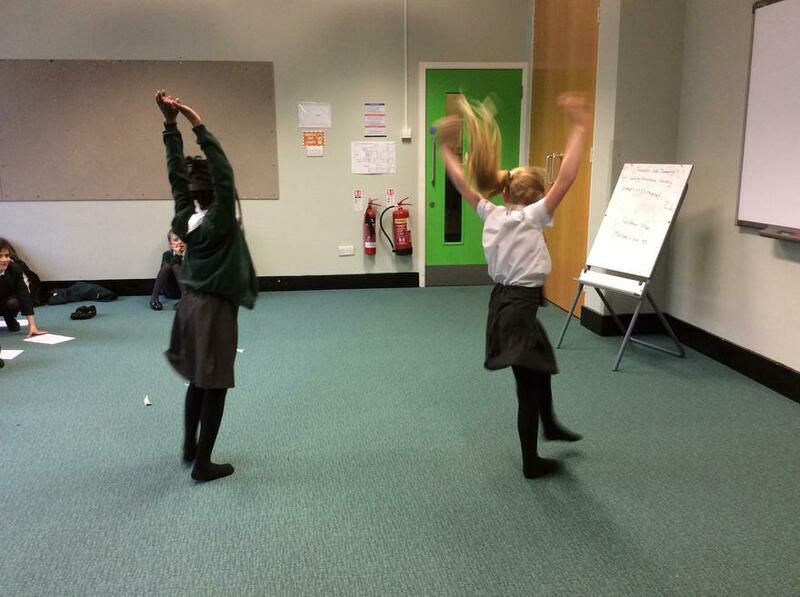 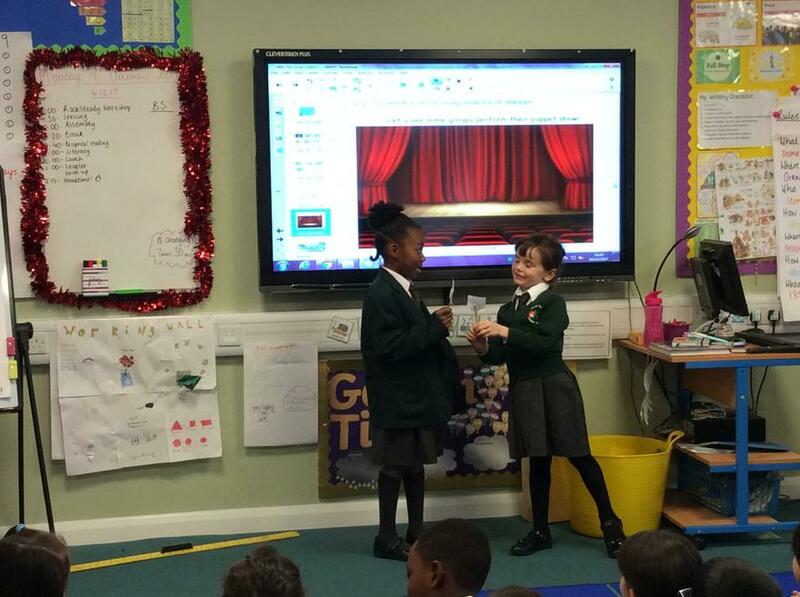 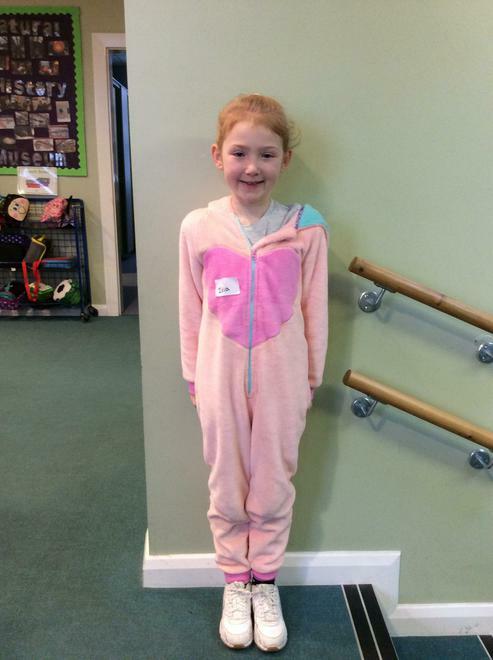 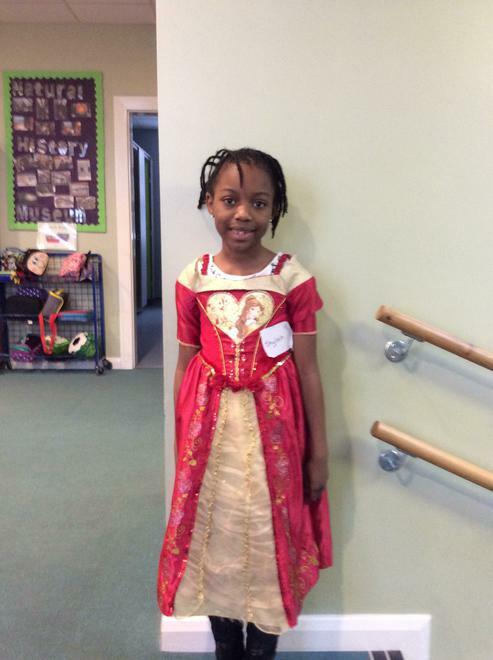 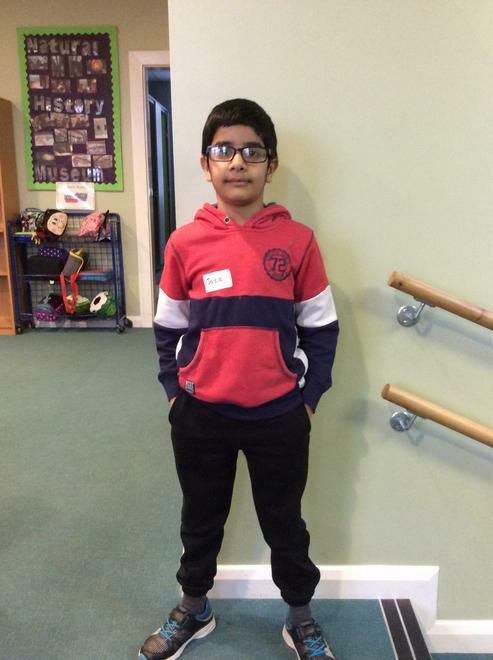 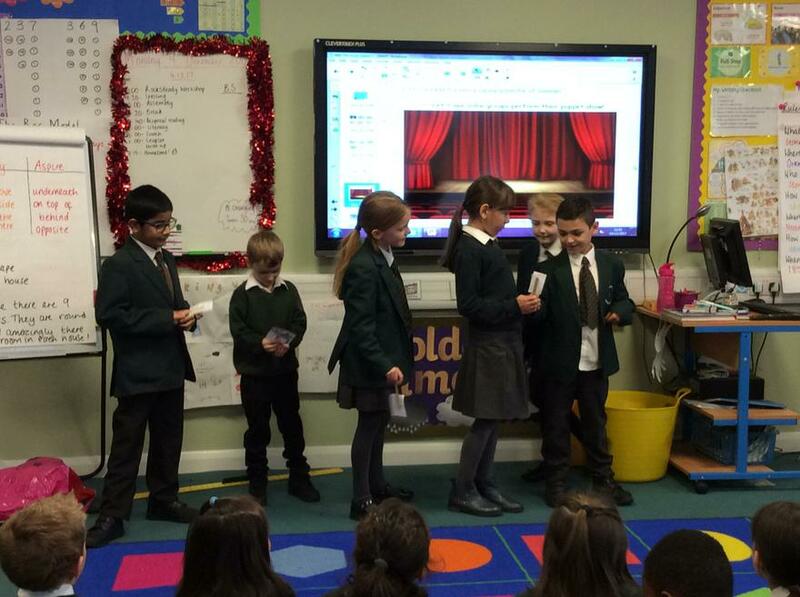 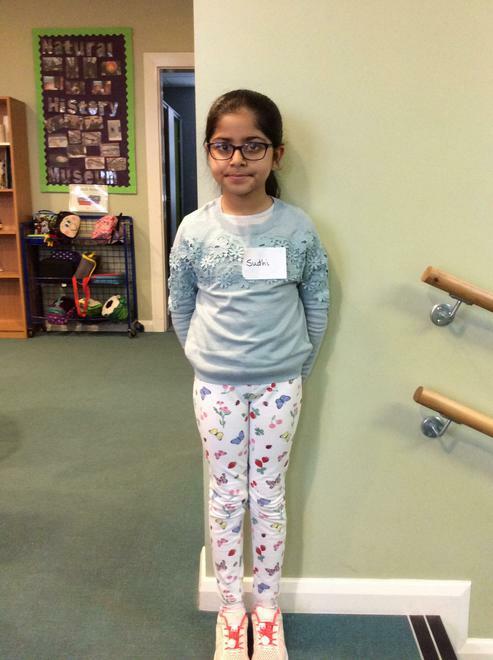 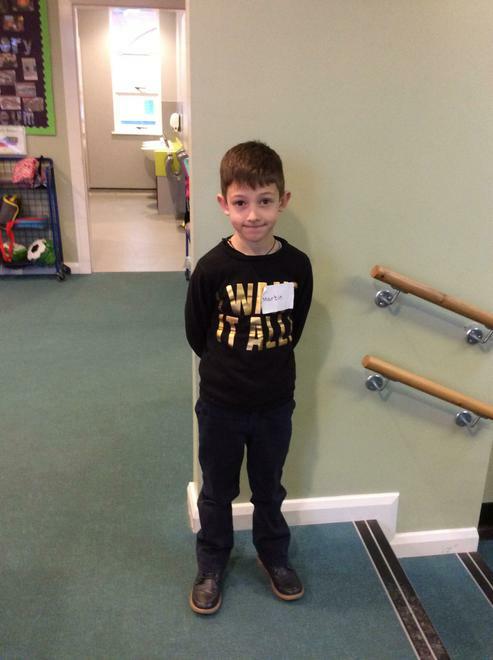 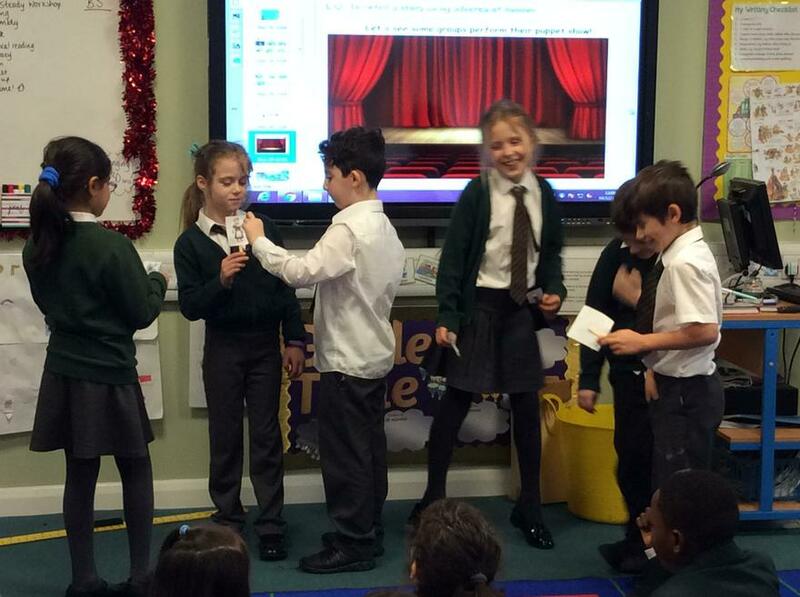 This week for Golden Time we had a class talent show! 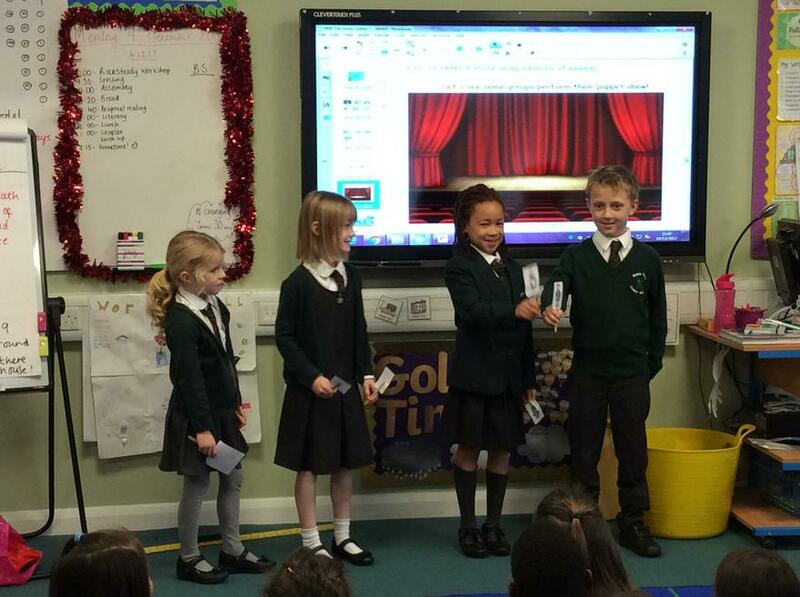 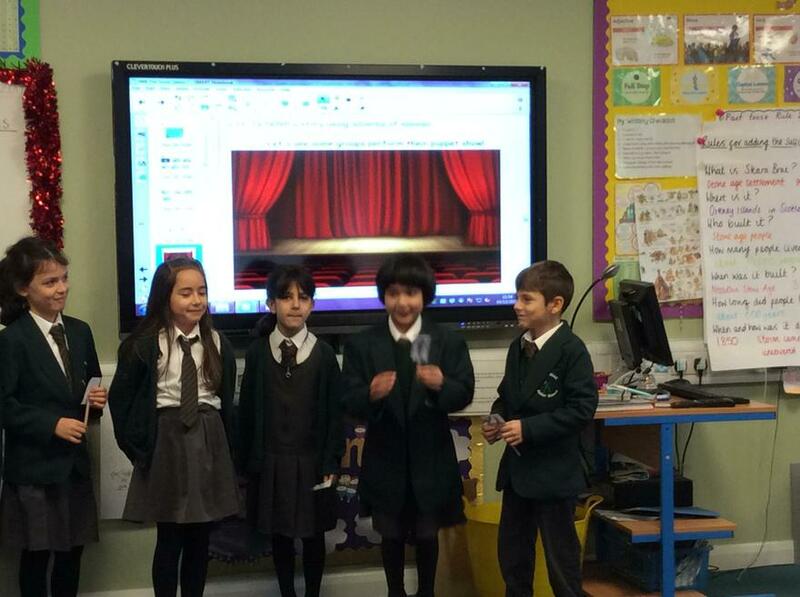 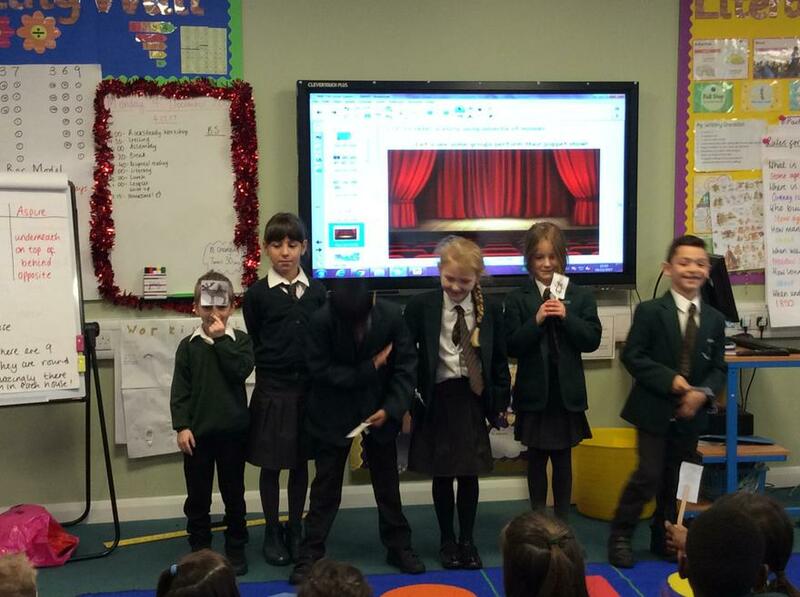 We all had a brilliant time watching all of the different performances from our class mates. 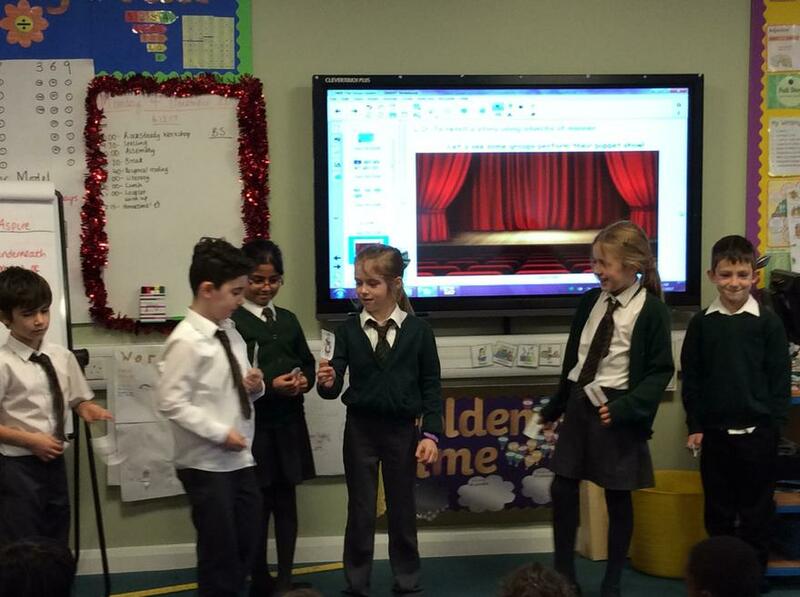 We enjoyed watching a comedy sketch, lots of singing, an acting performance and a gymnastics display! 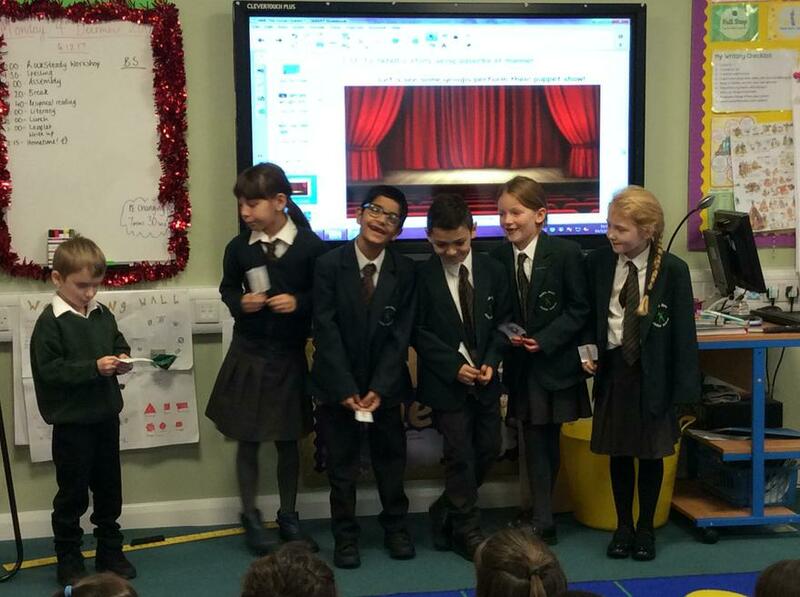 Well done to all the children that performed in the show. 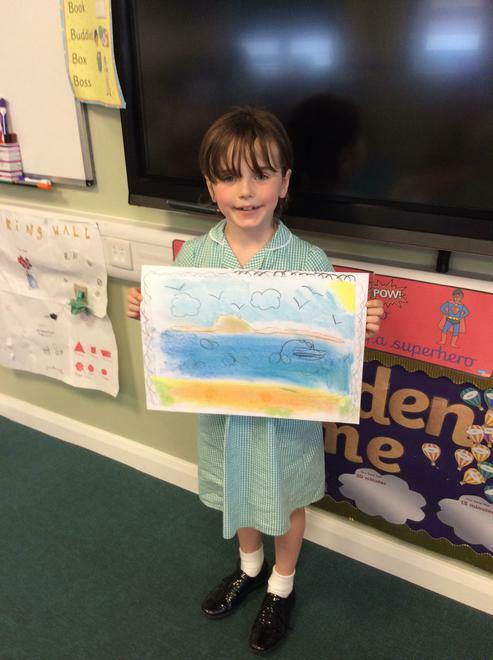 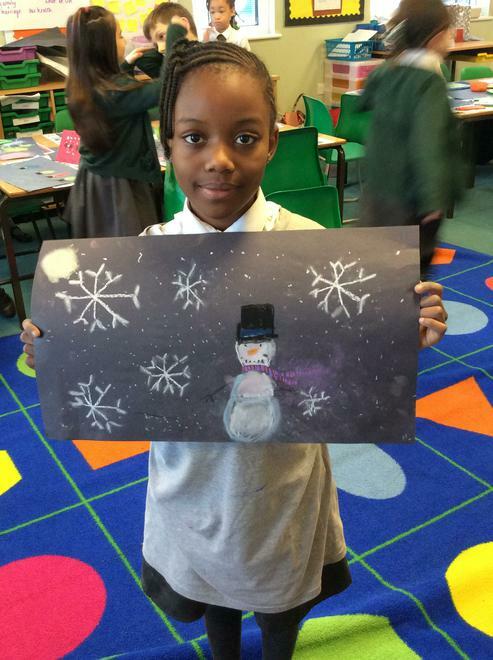 It's clear to see that Elm Class certainly does have talent! 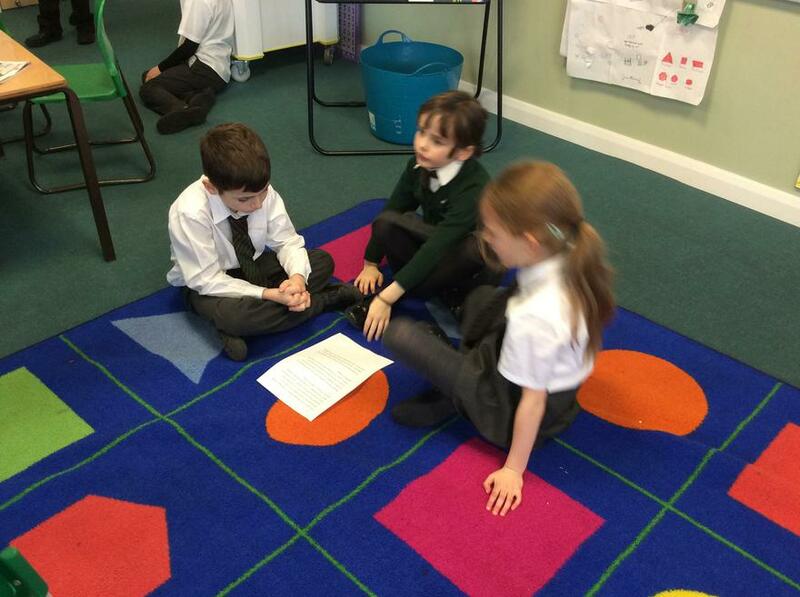 This week in Literacy we have been looking at poetry. 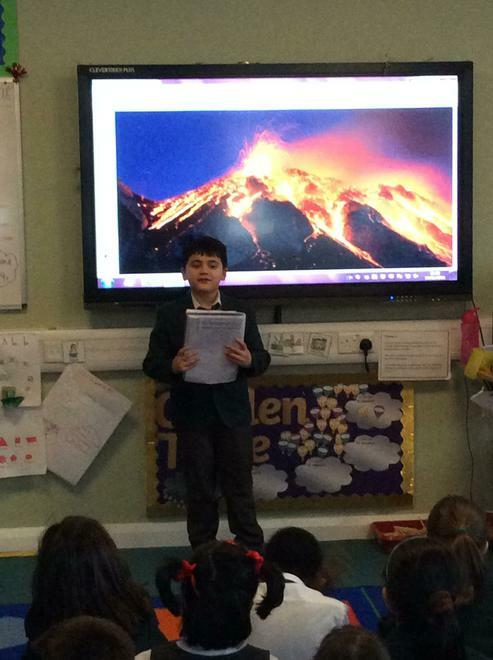 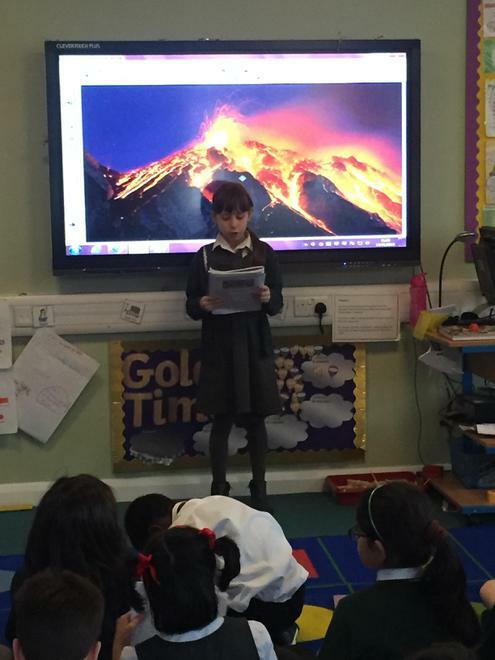 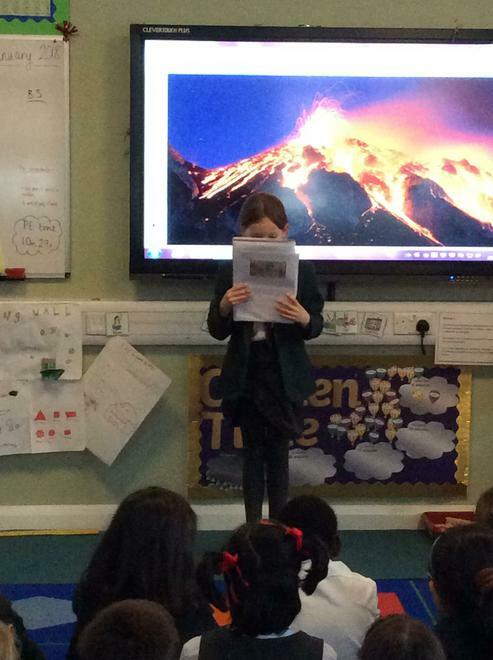 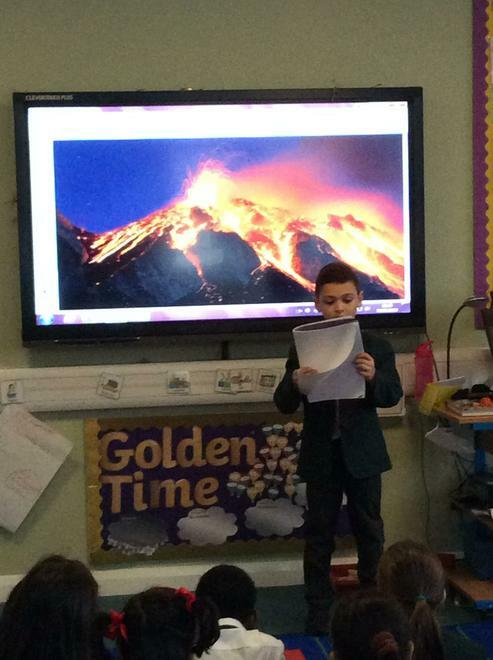 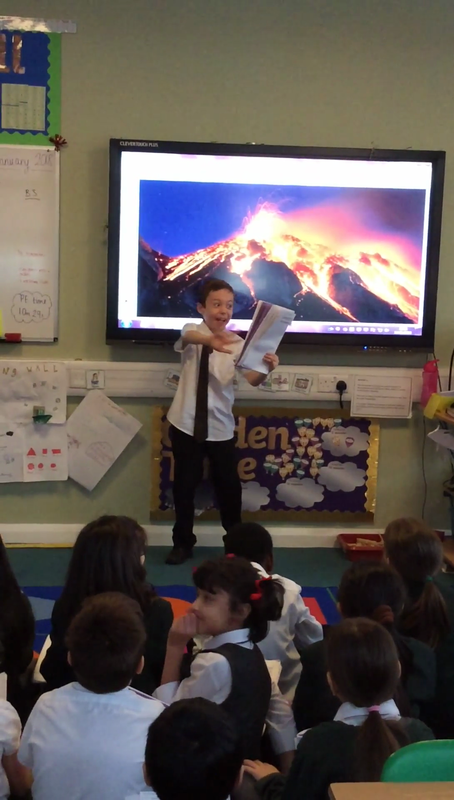 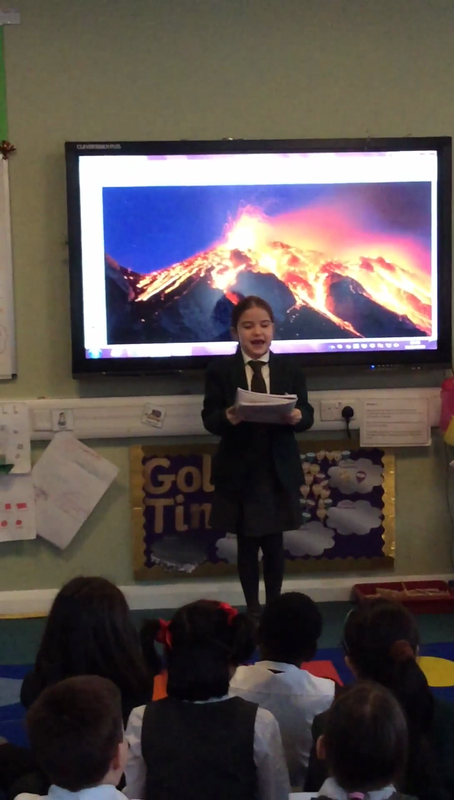 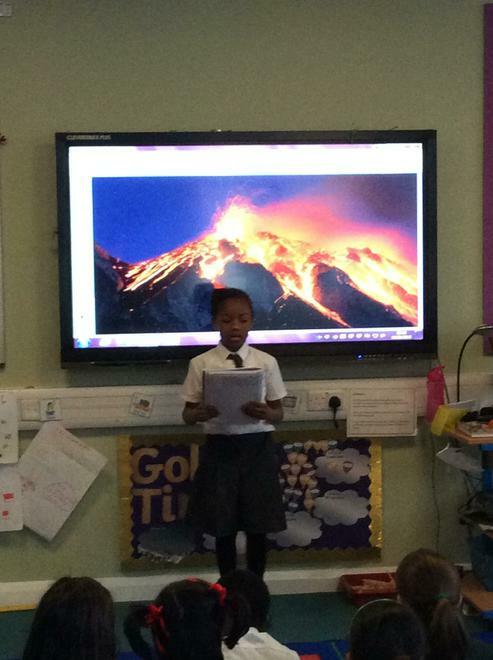 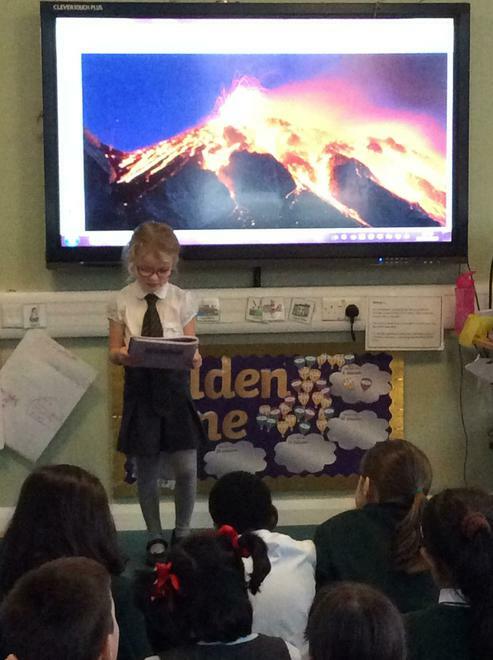 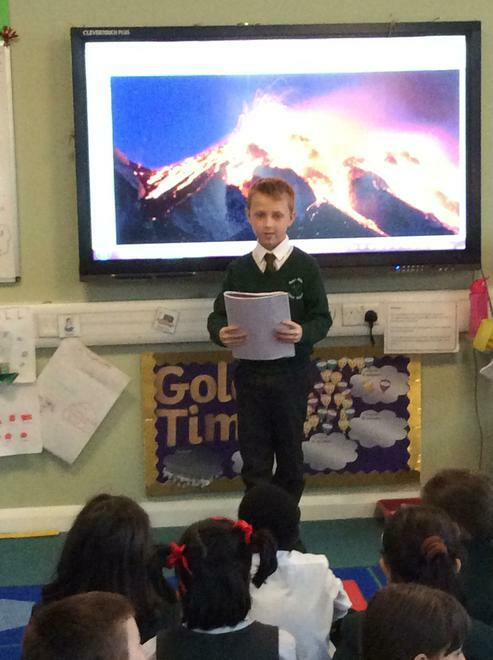 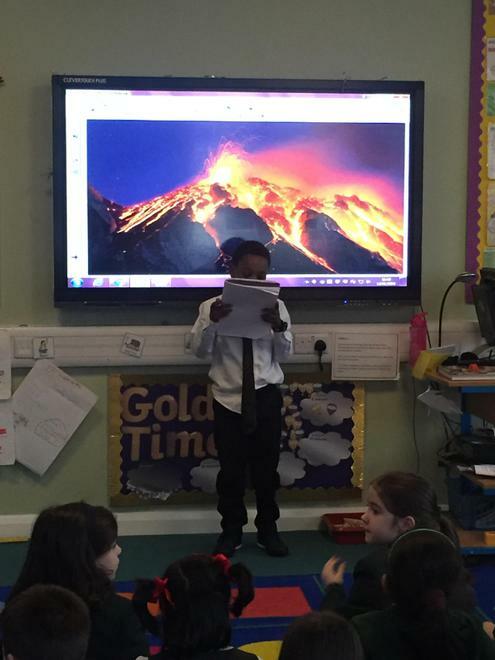 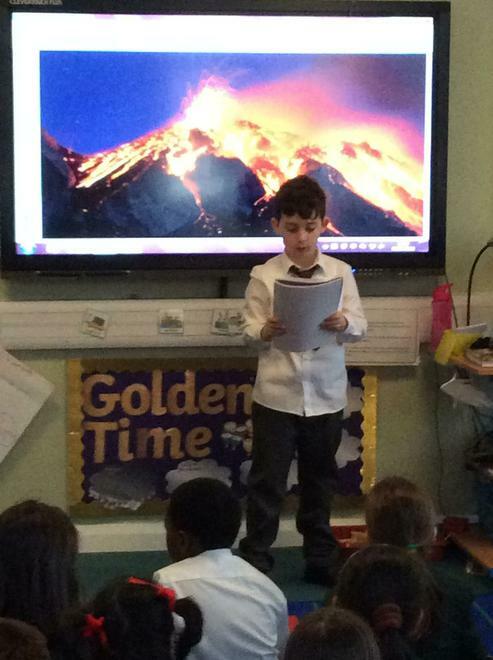 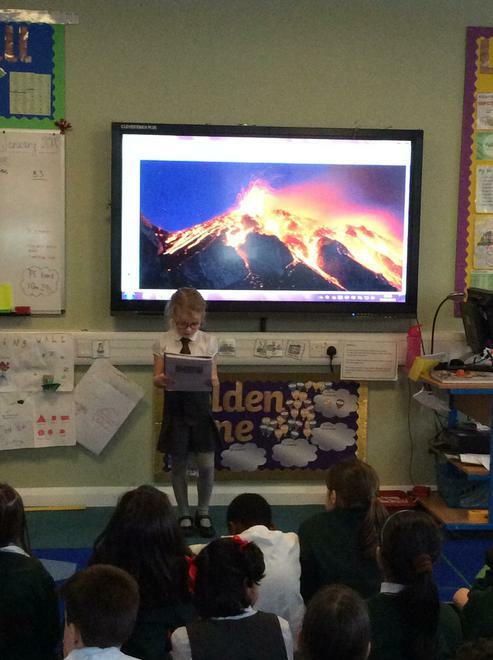 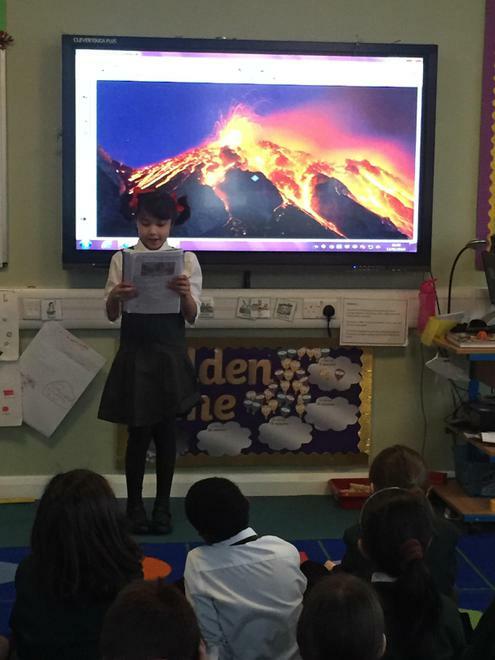 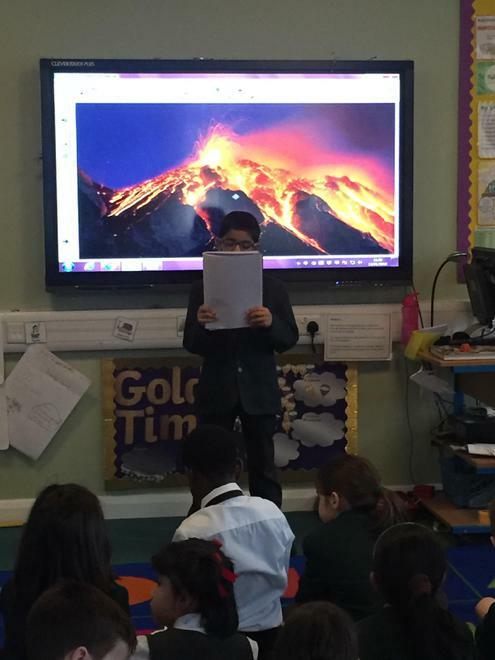 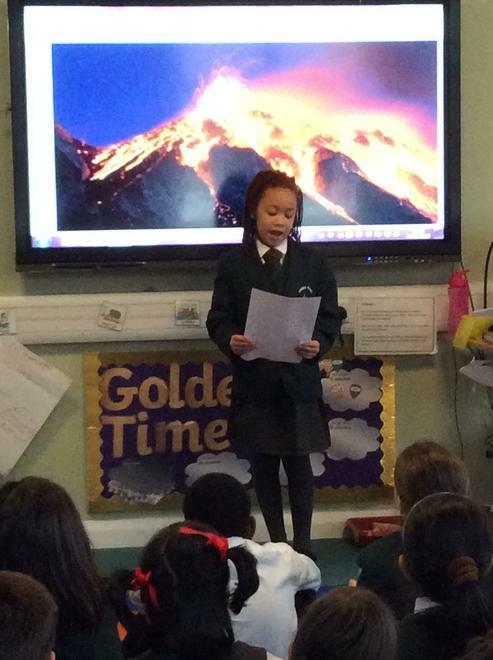 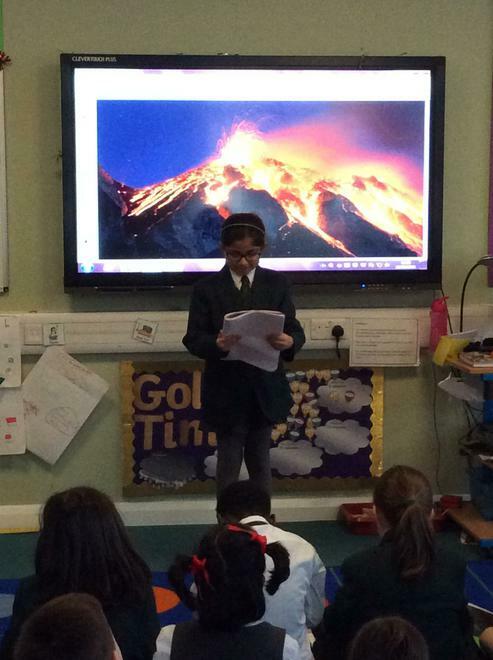 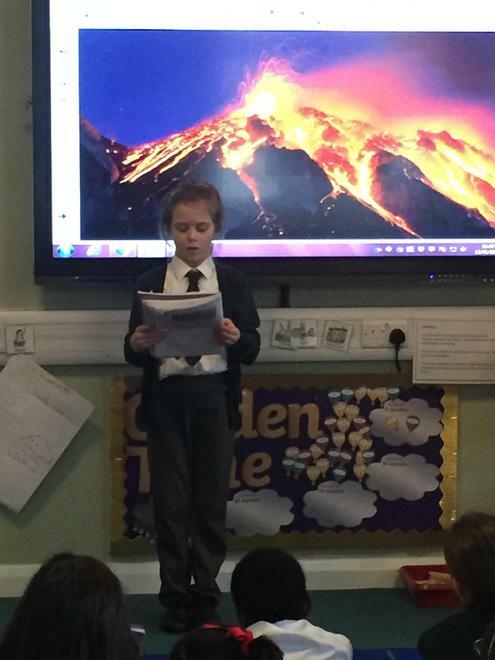 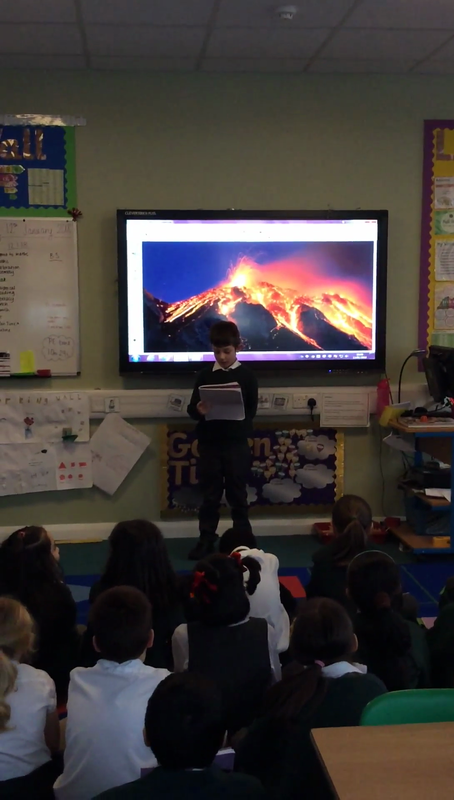 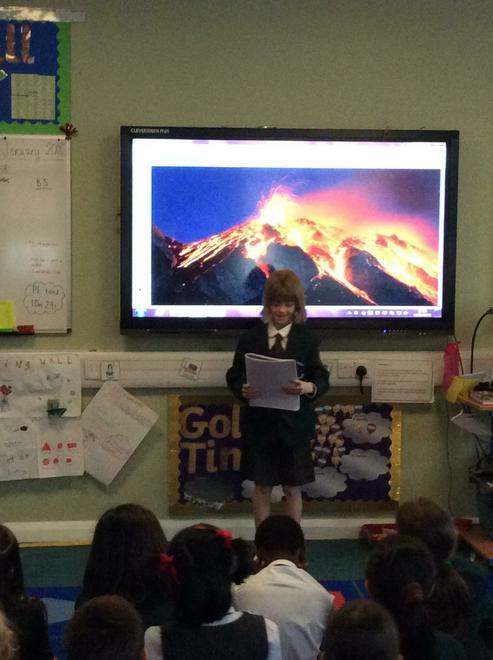 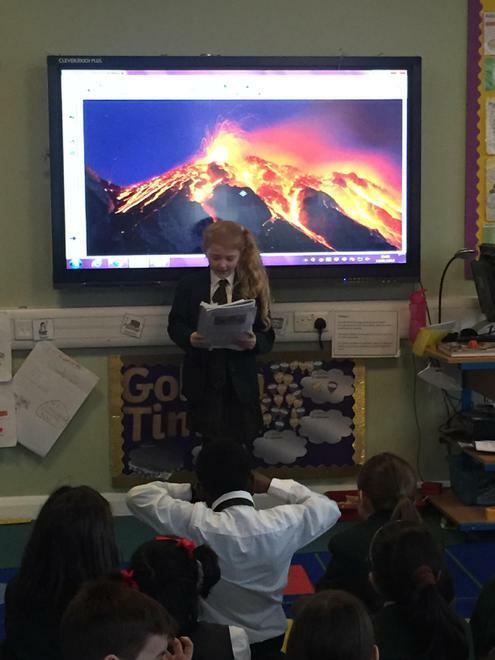 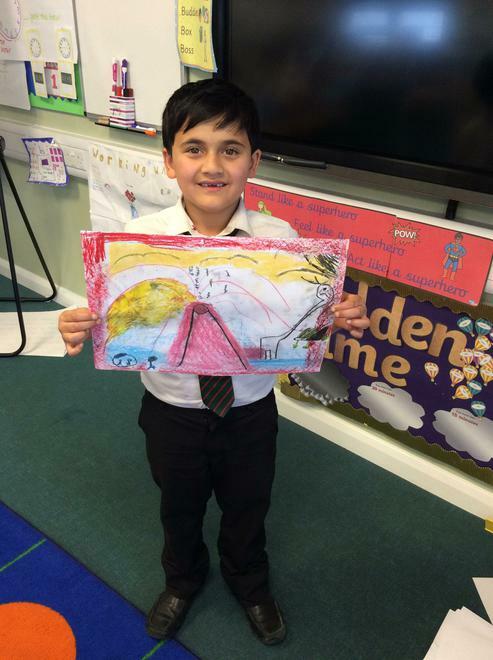 As our Topic this half term is Vicious Volcanoes, we thought it would be a fitting idea to write a poem about a volcano. 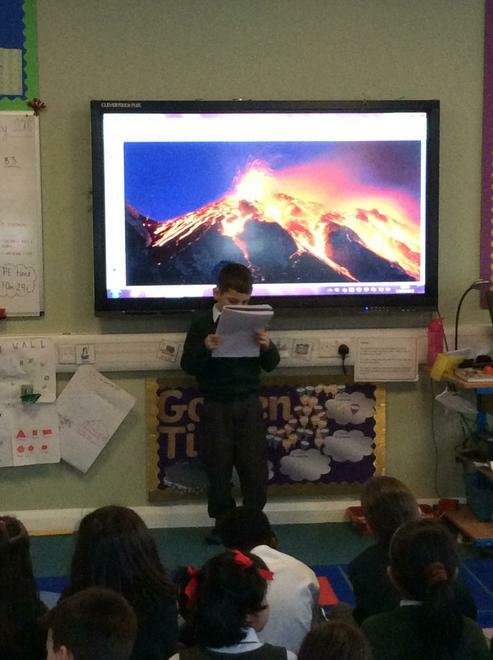 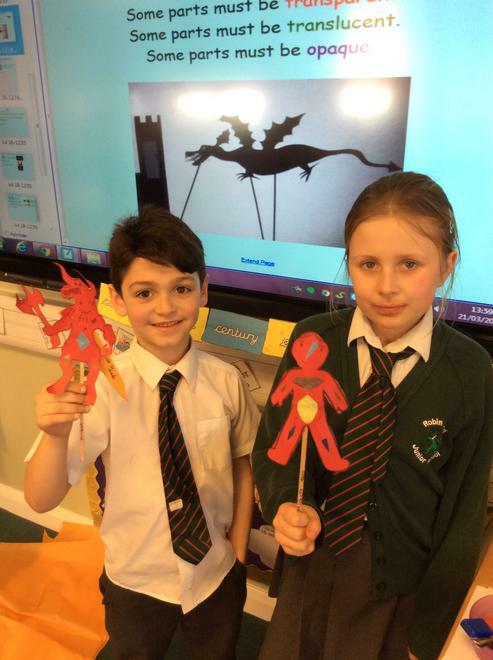 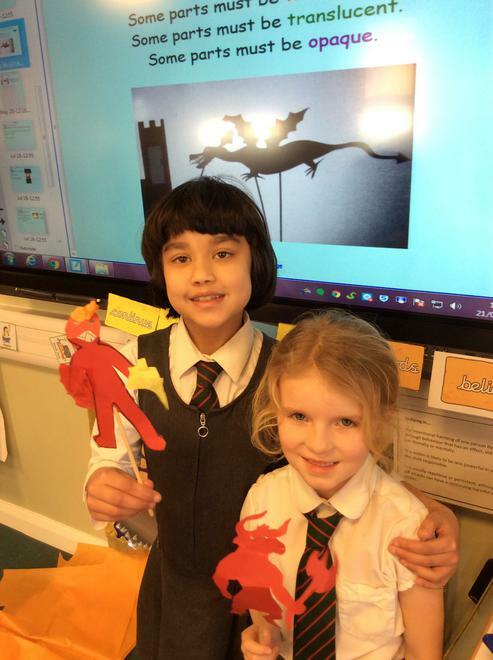 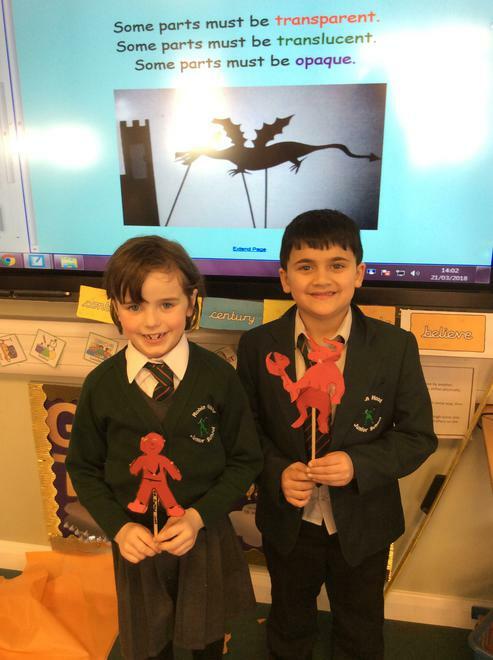 We compared the volcano to a dragon and came up with some wonderful ways in which they are similar. 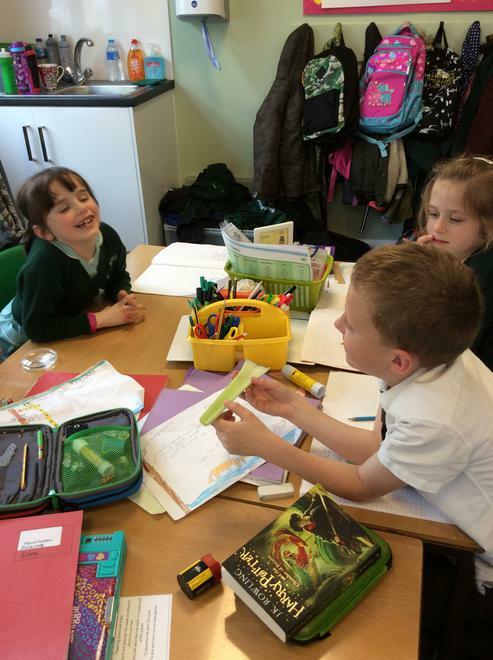 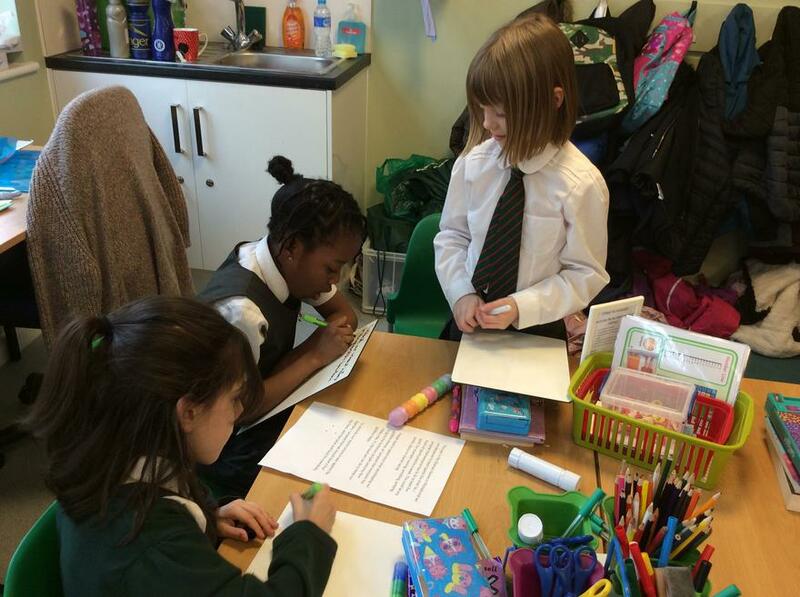 We then put these ideas to good use and created our own poems! 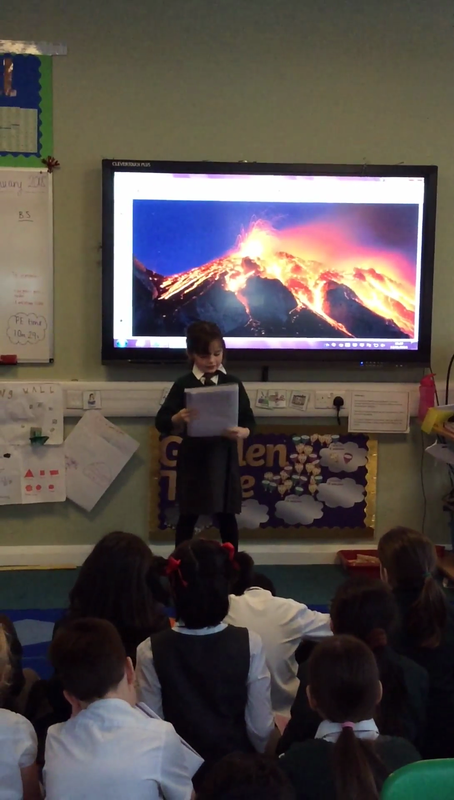 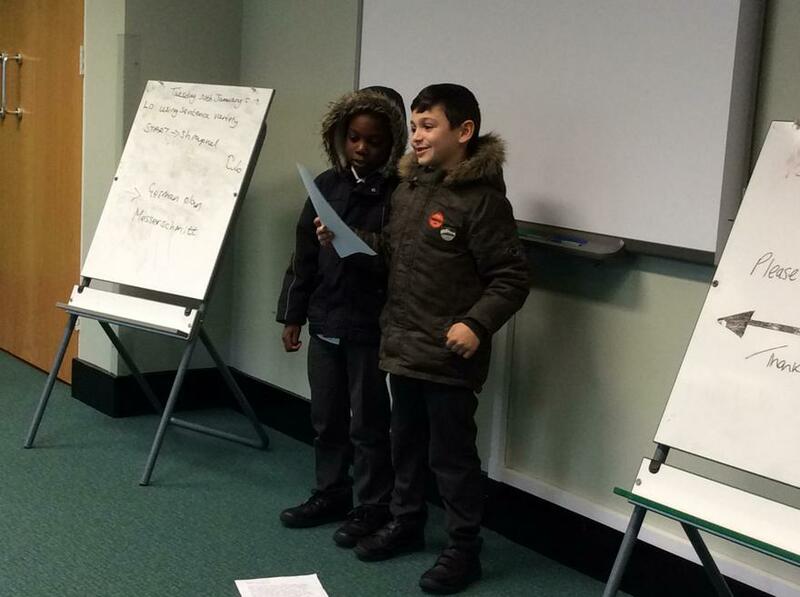 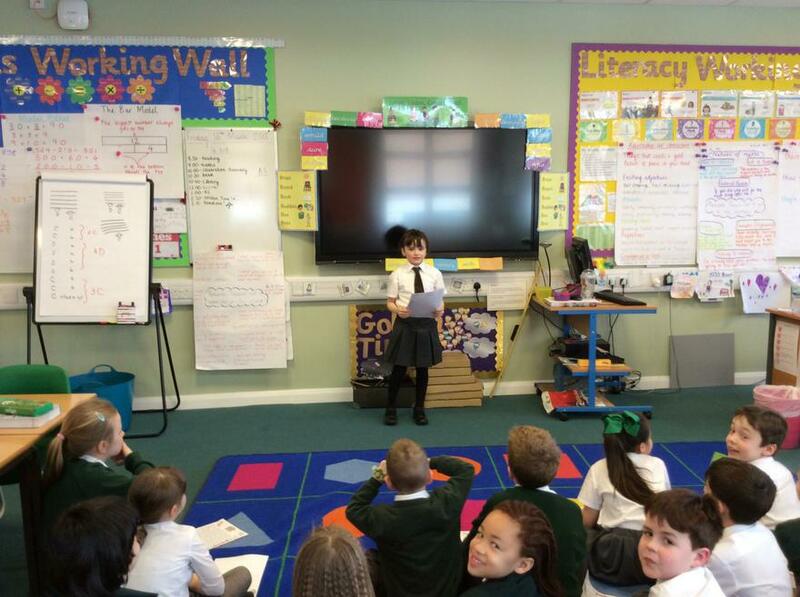 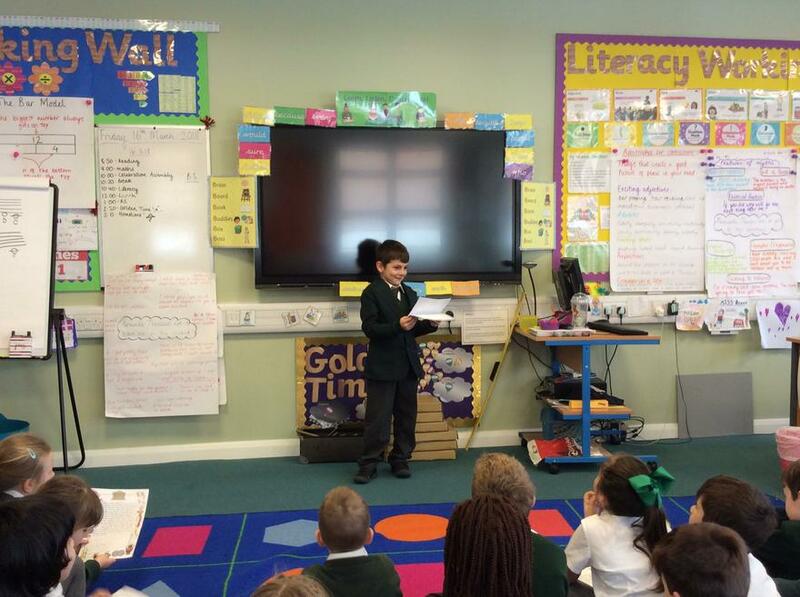 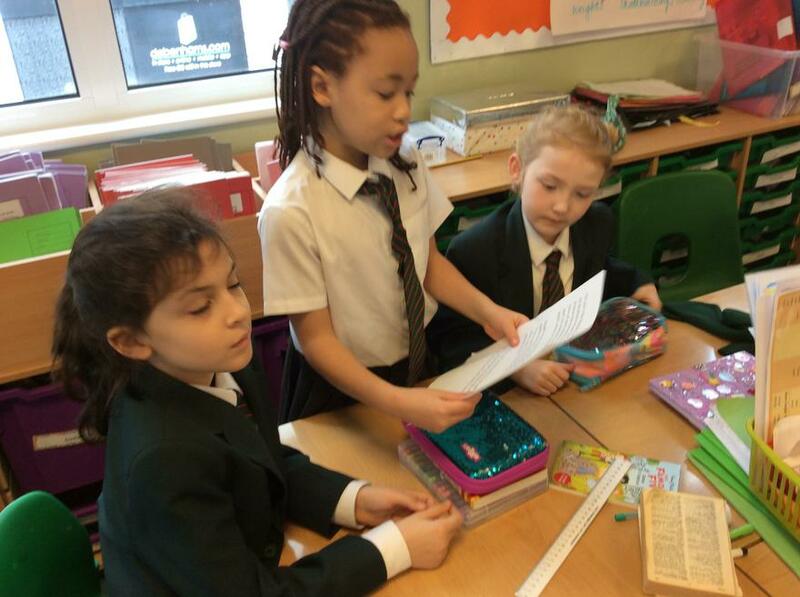 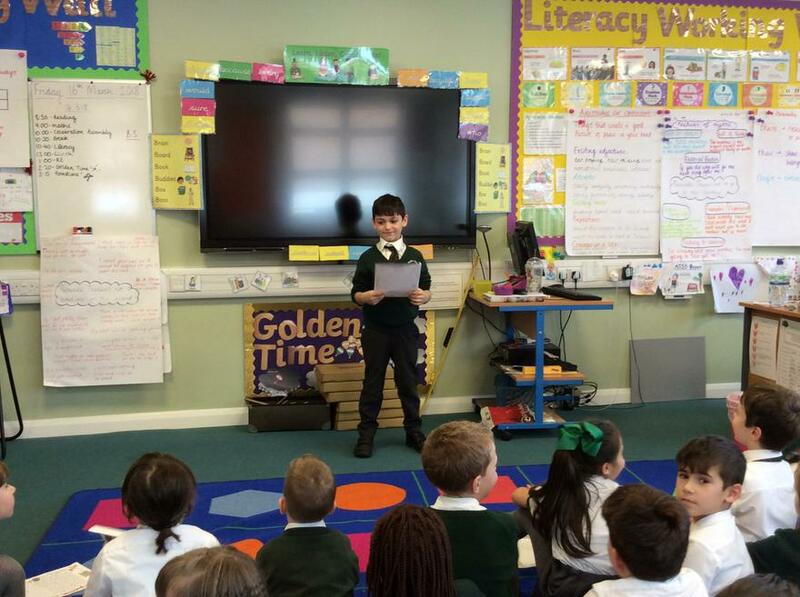 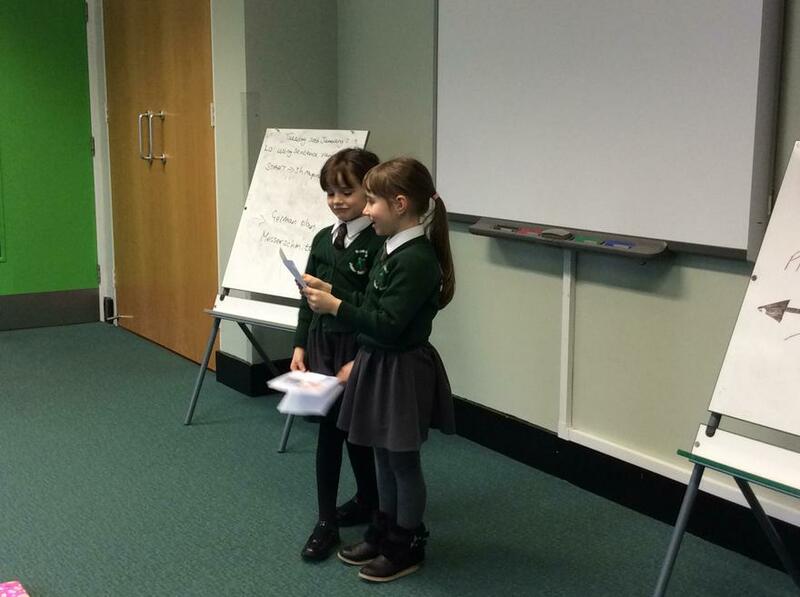 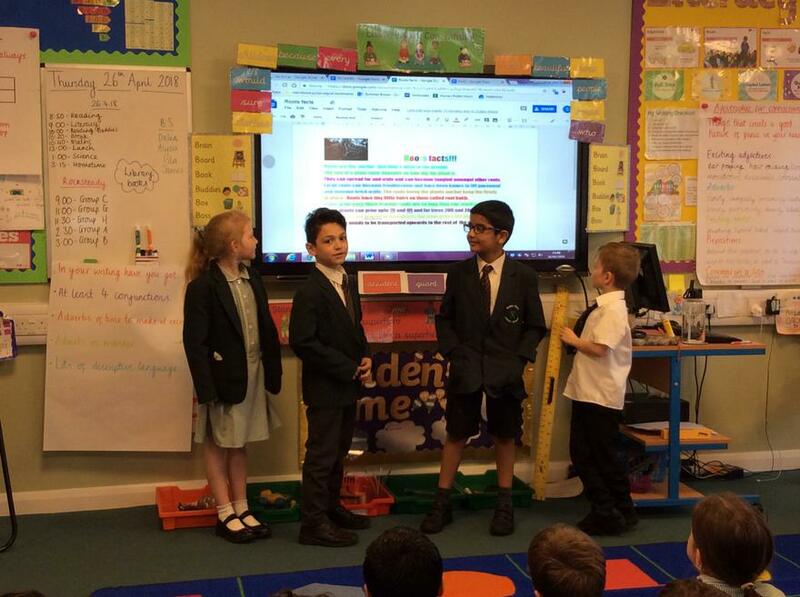 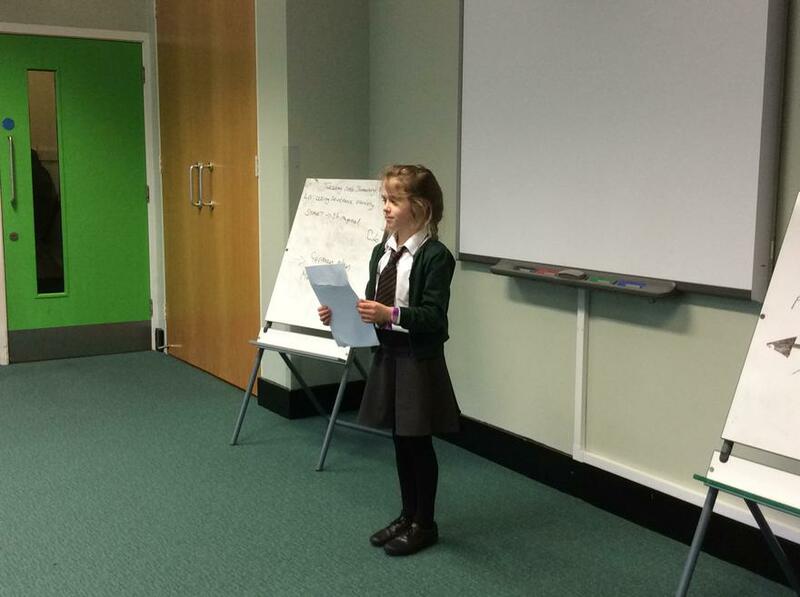 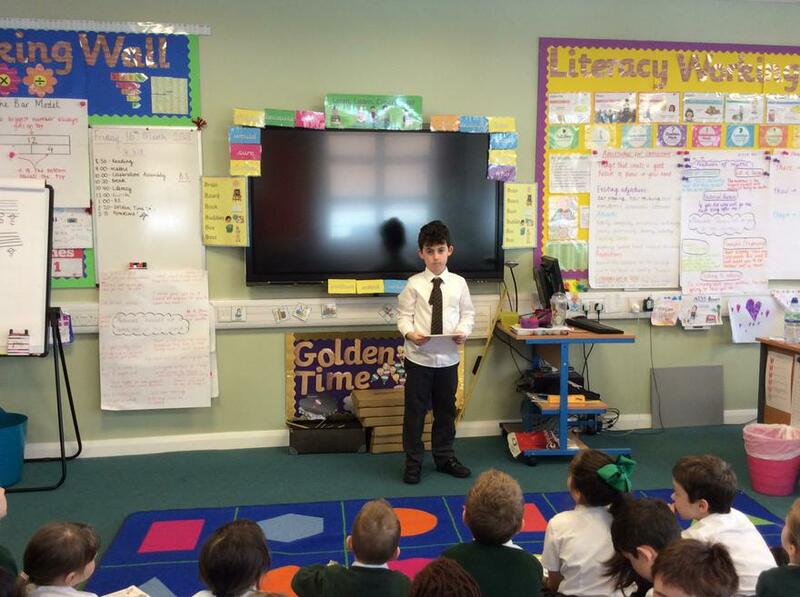 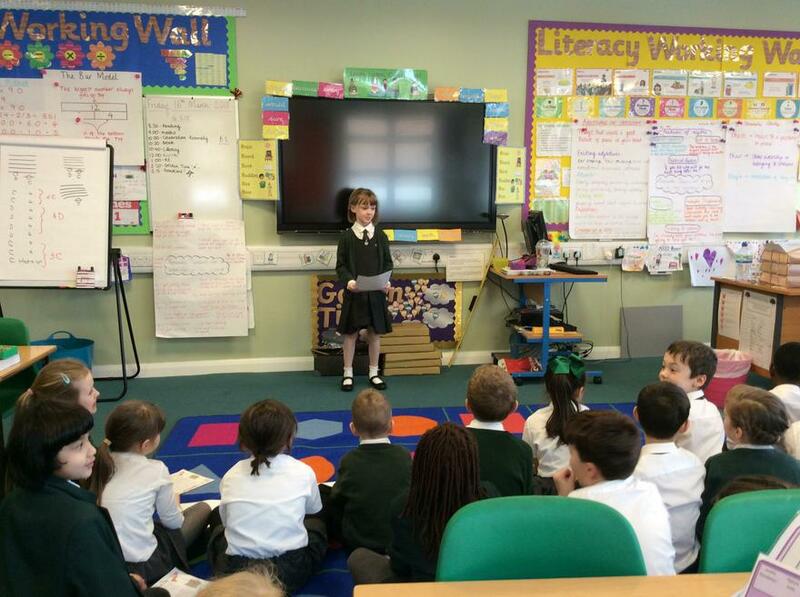 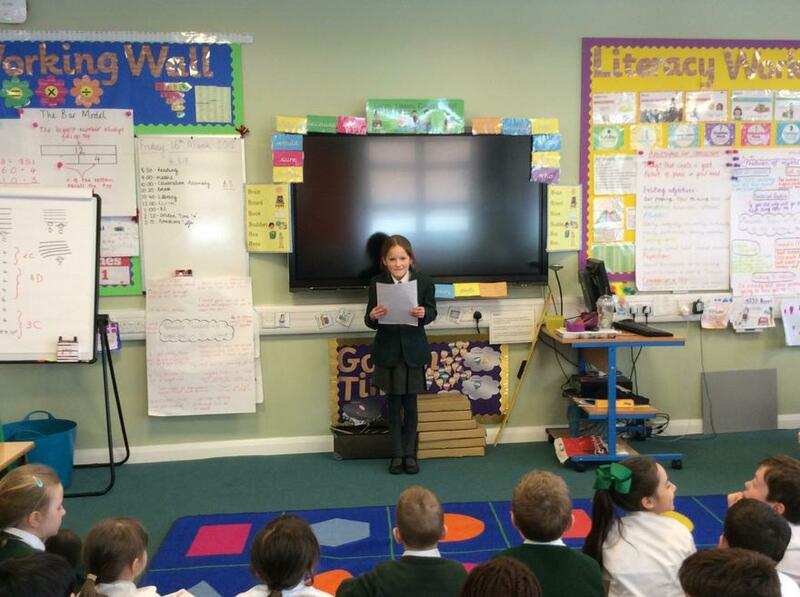 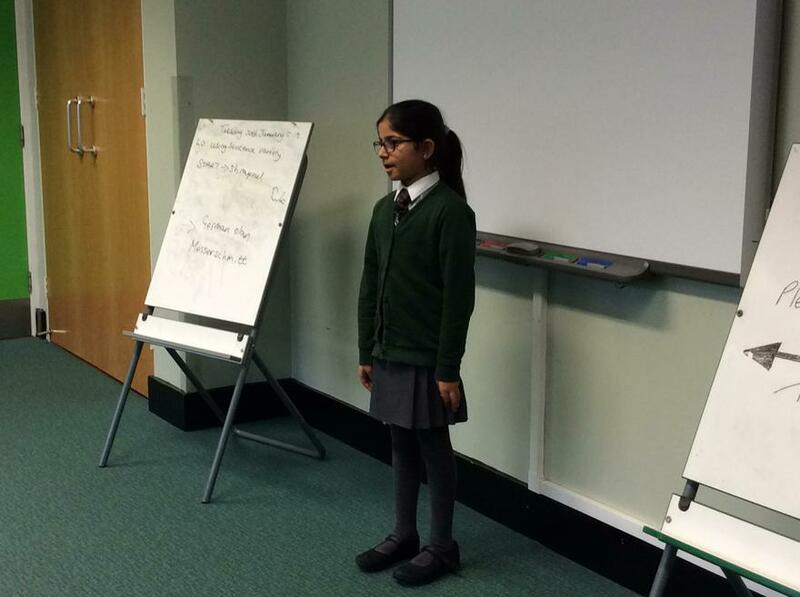 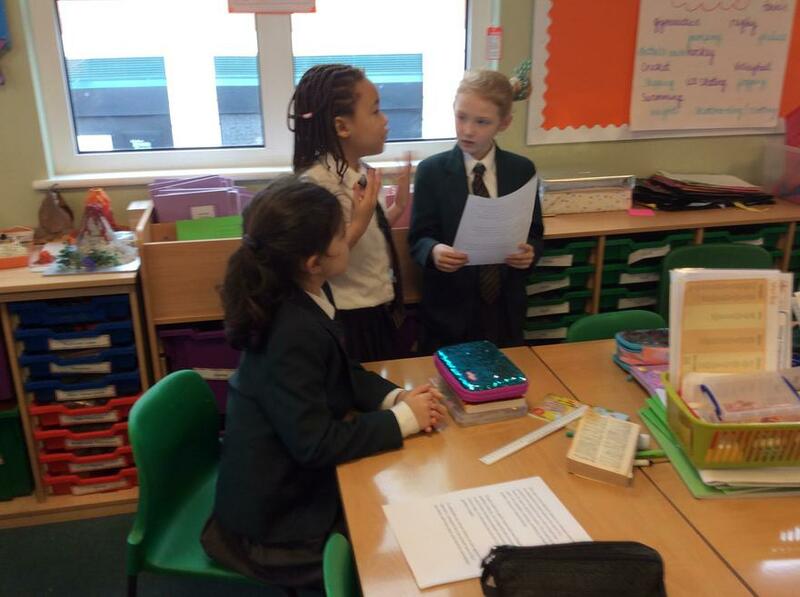 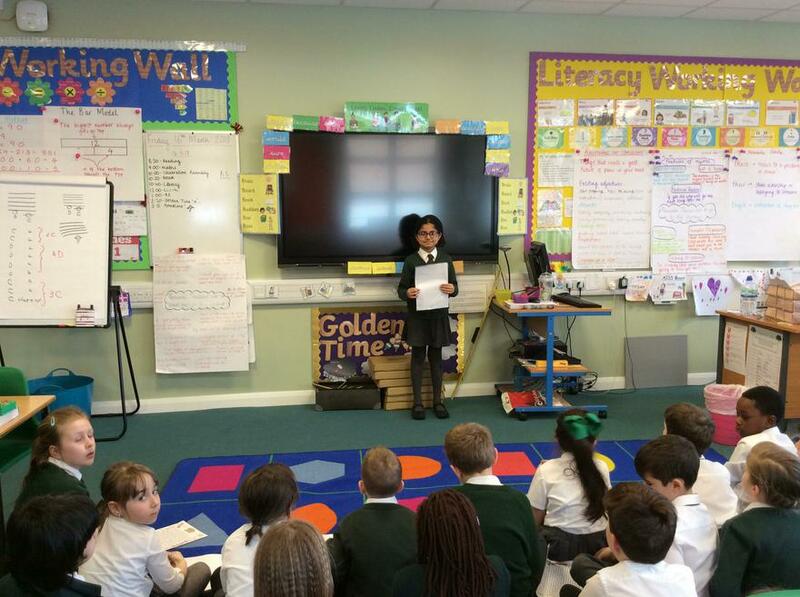 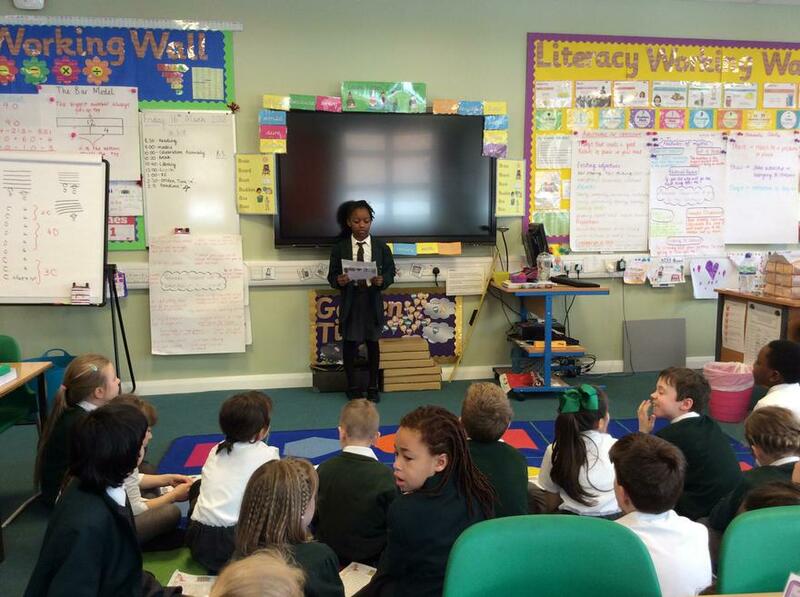 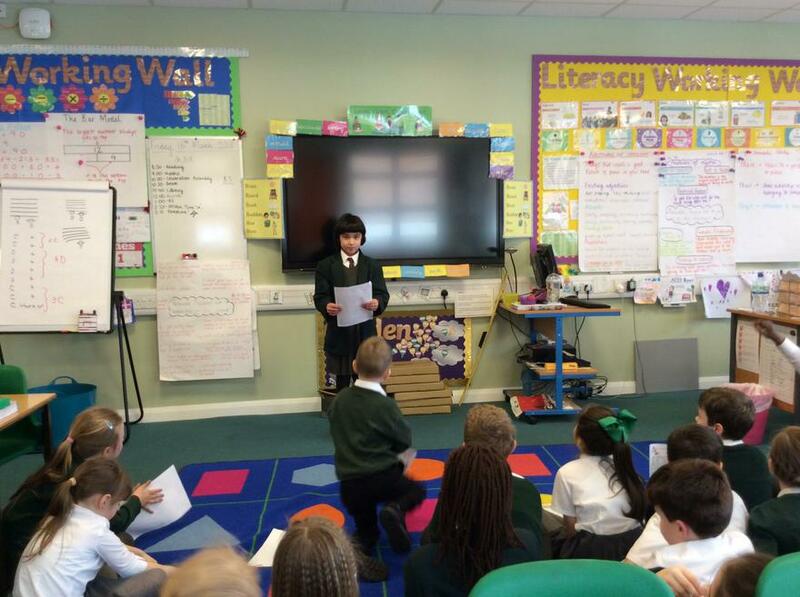 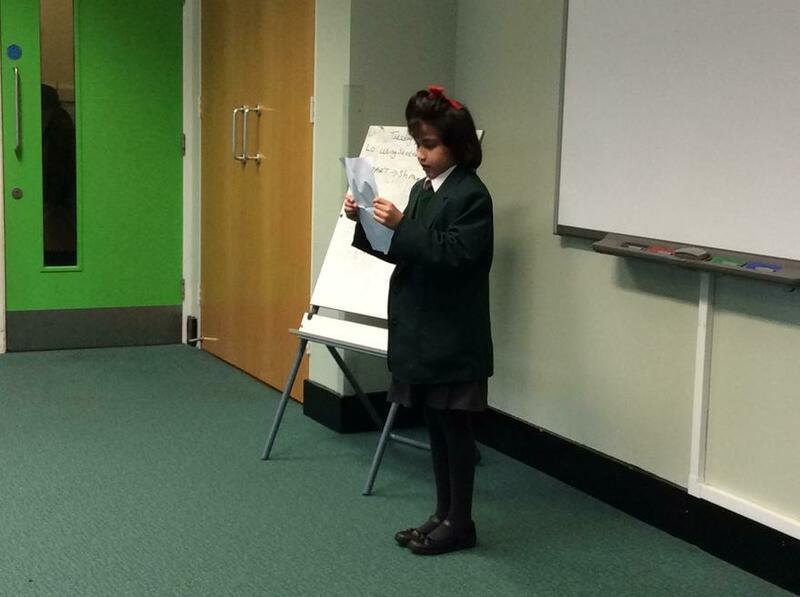 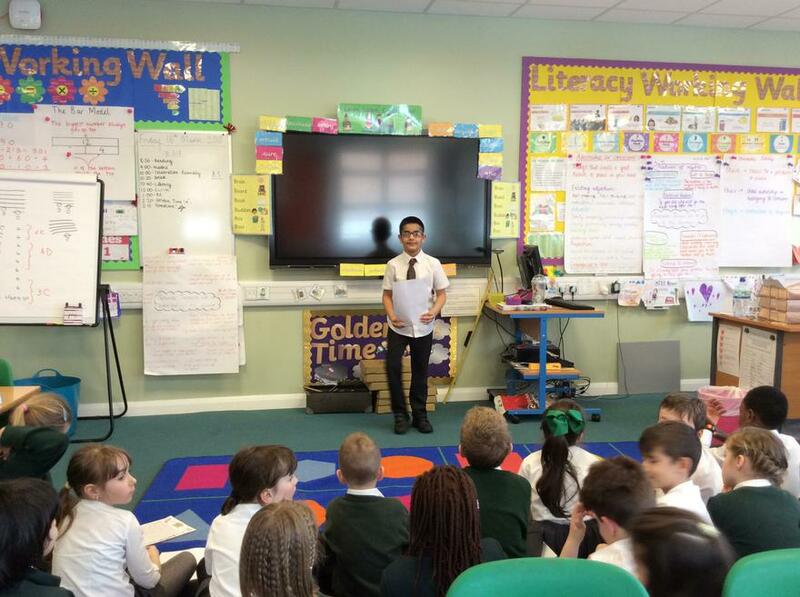 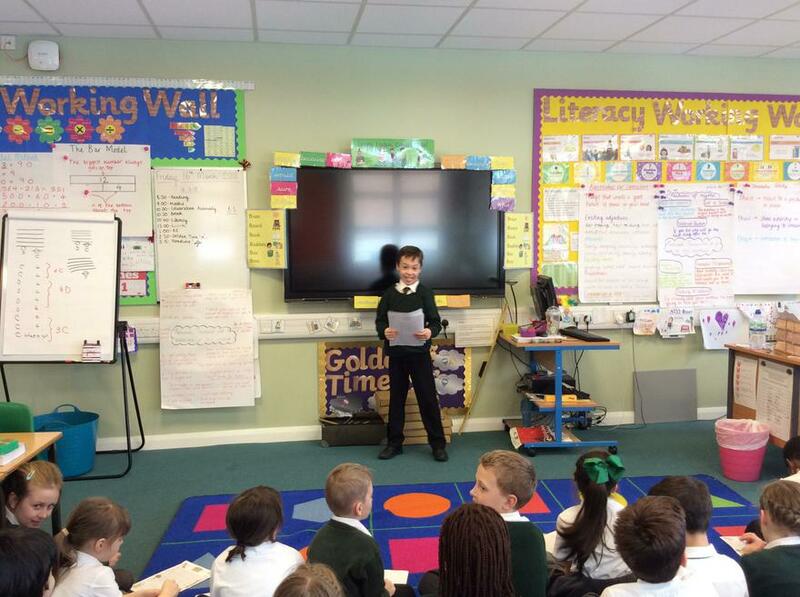 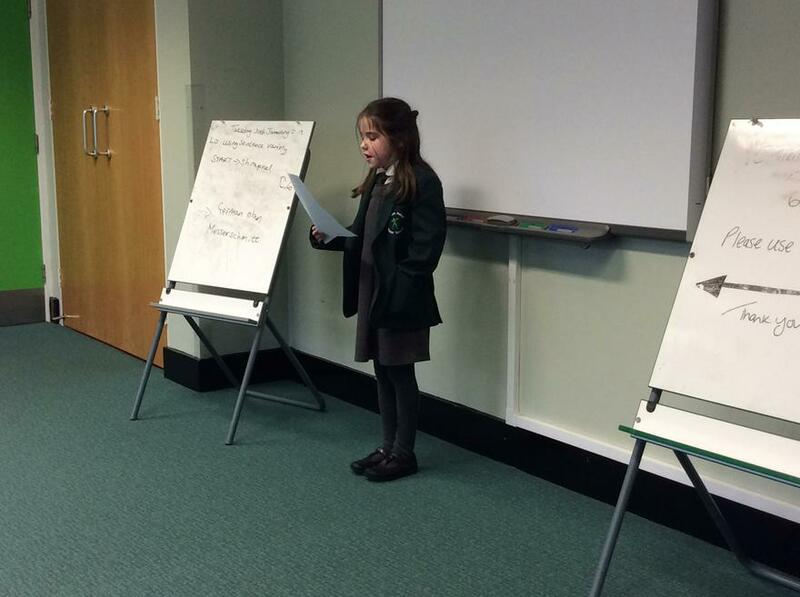 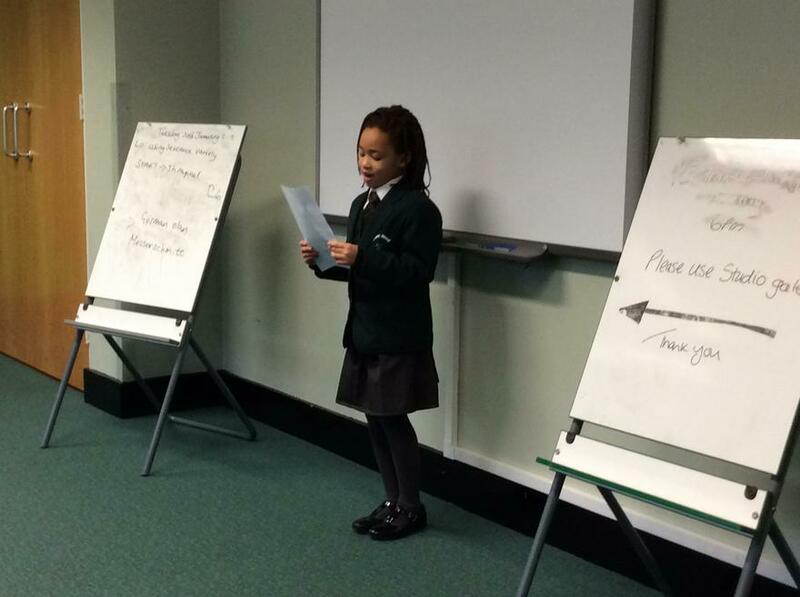 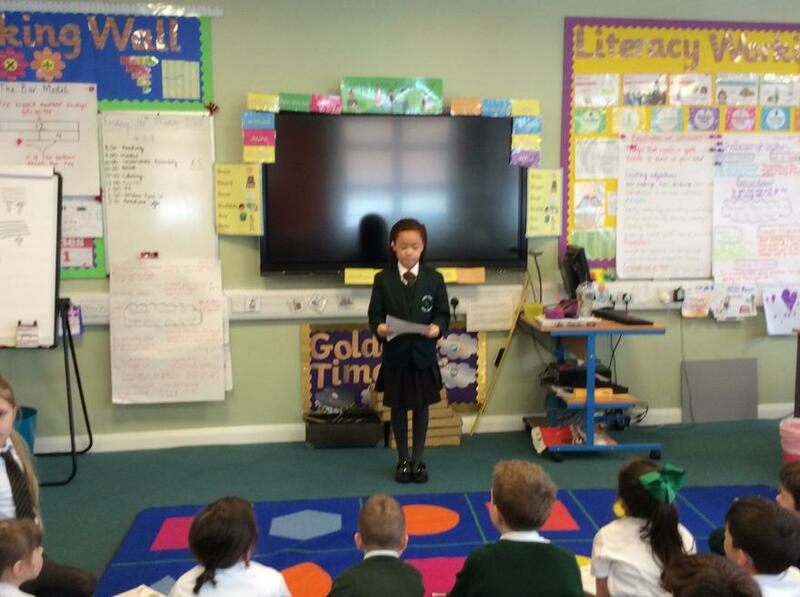 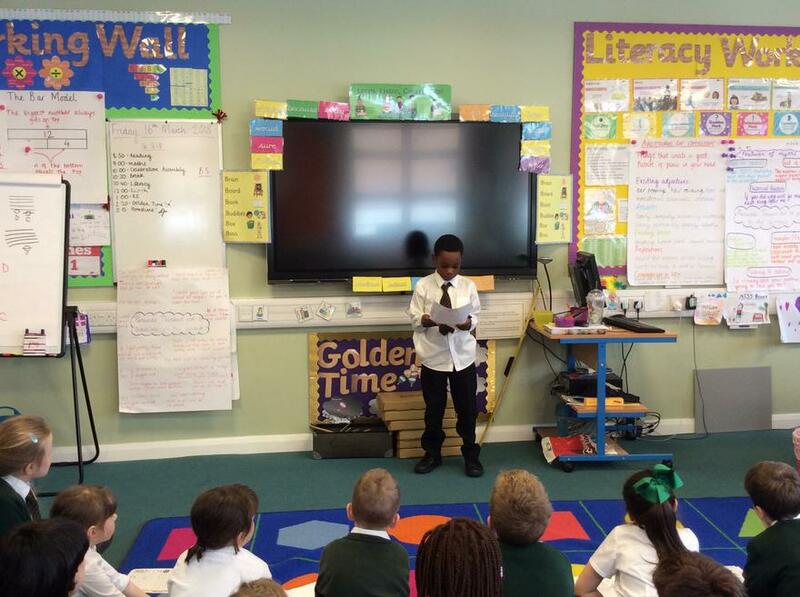 Today we had a chance to perform our poems to the rest of the class, and quite honestly, they were amazing! 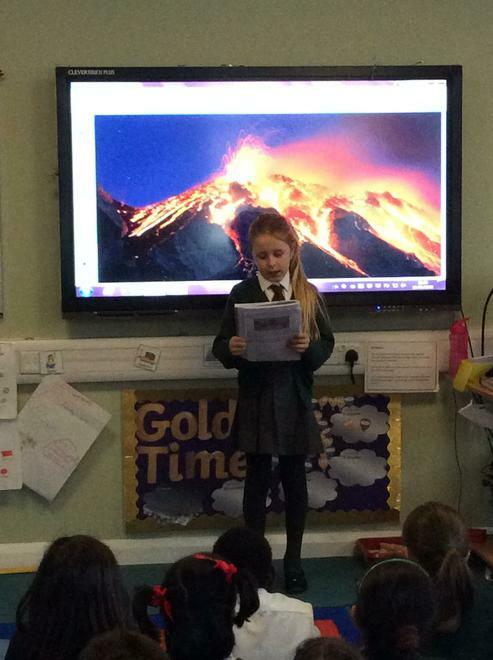 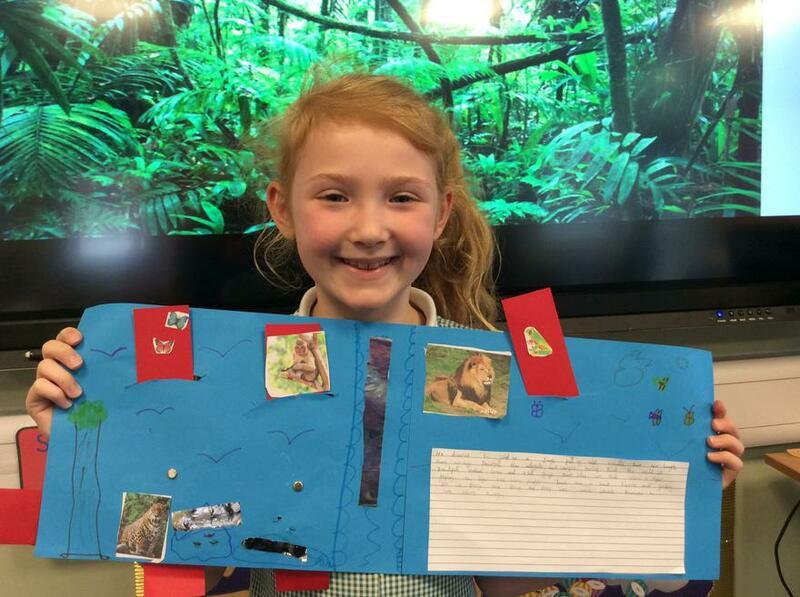 Here is a small sample of some of our poems being read aloud and some pictures of us performing them to the class! 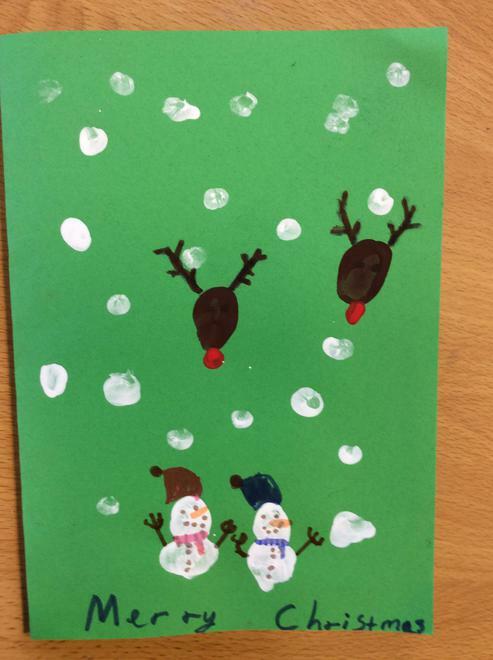 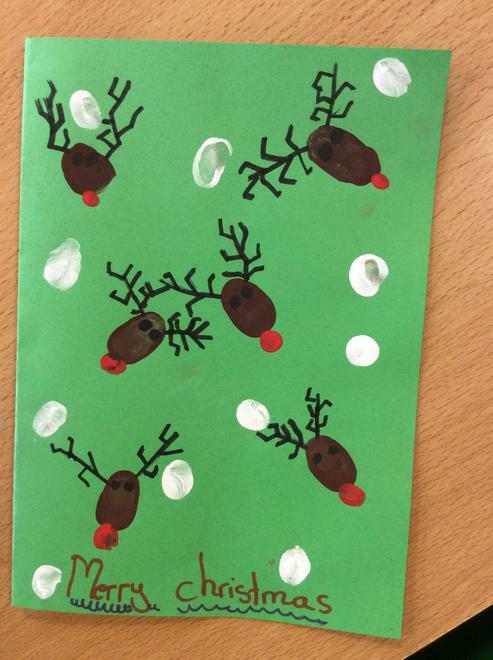 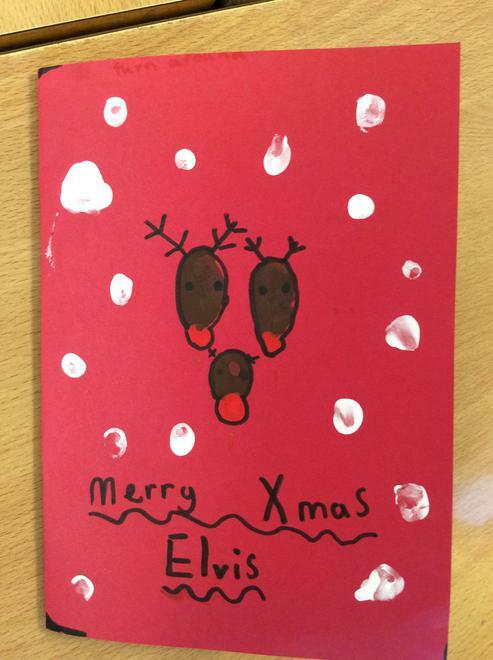 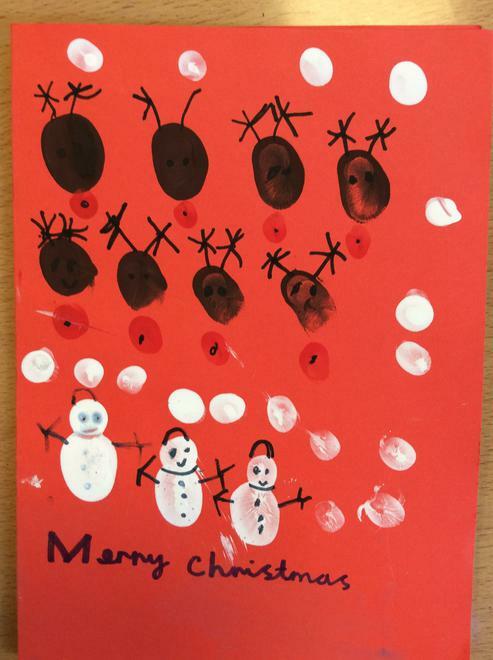 Today we have been super busy getting into the Christmas spirit by creating some wonderful finger paint Christmas cards for our loved ones! 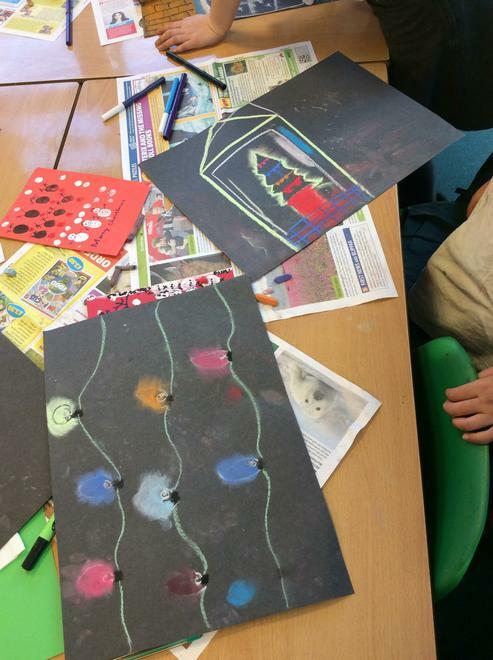 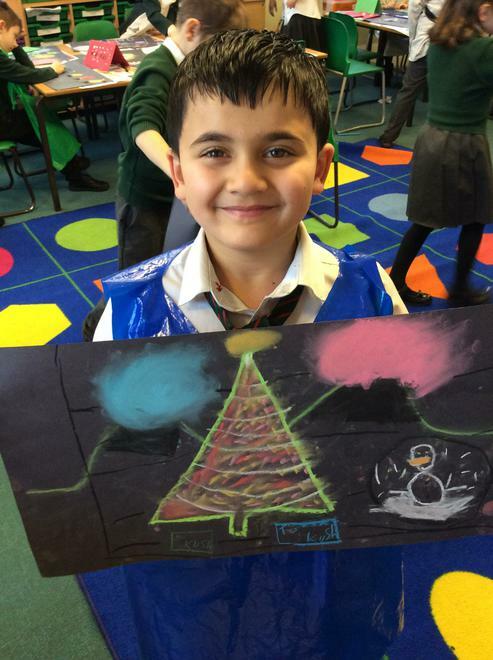 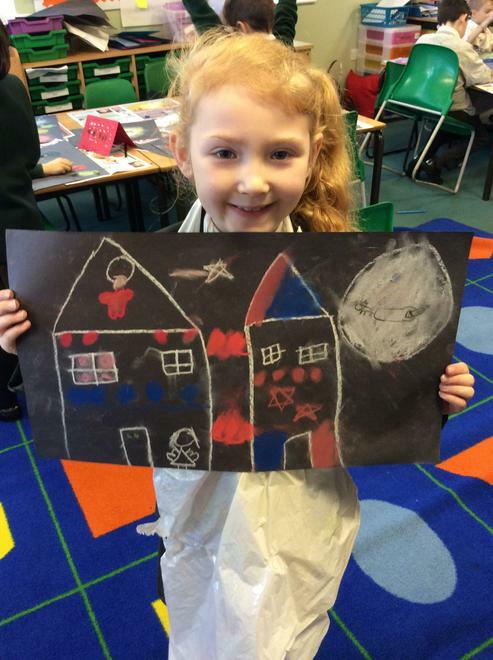 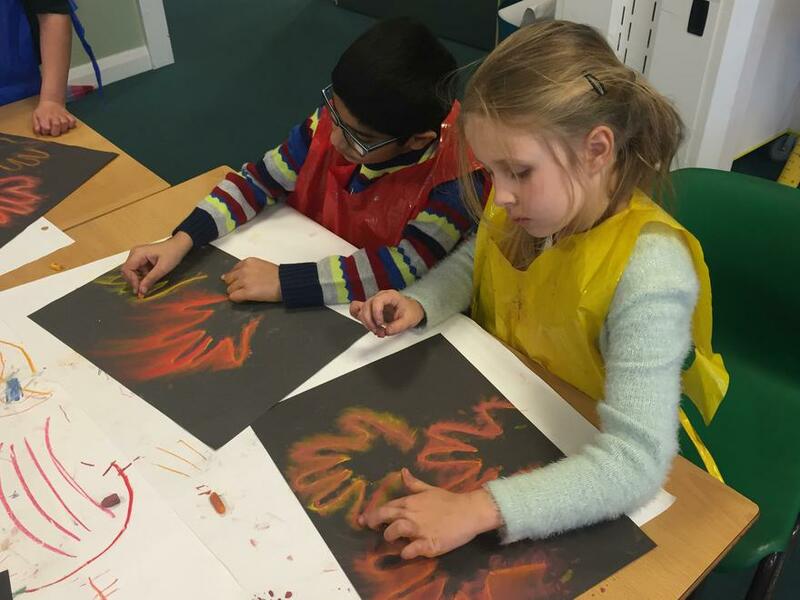 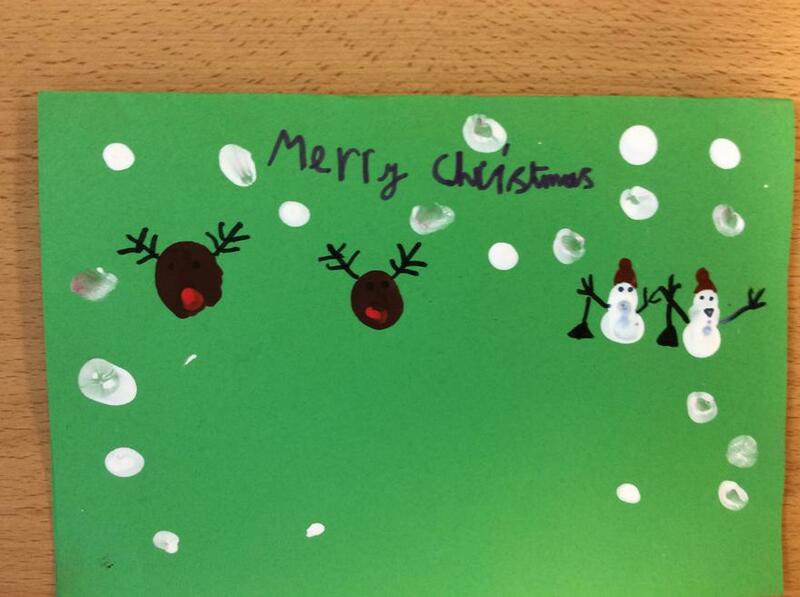 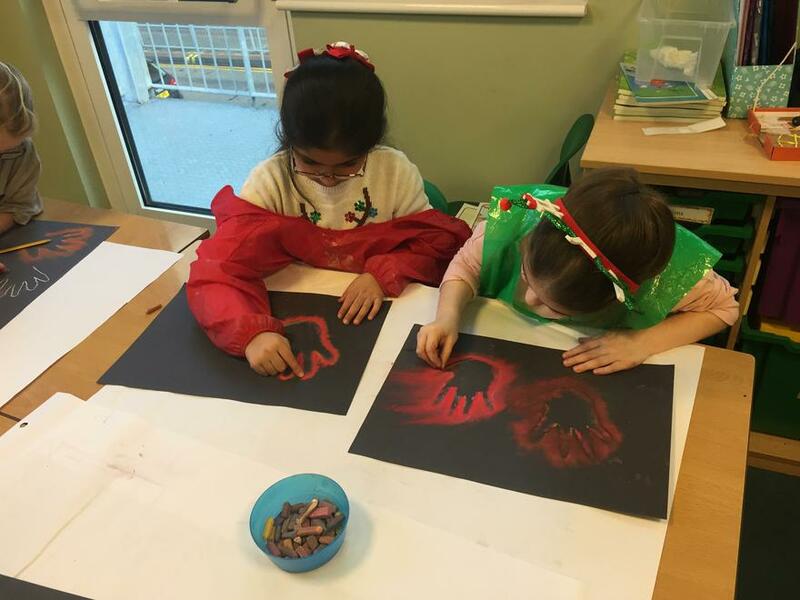 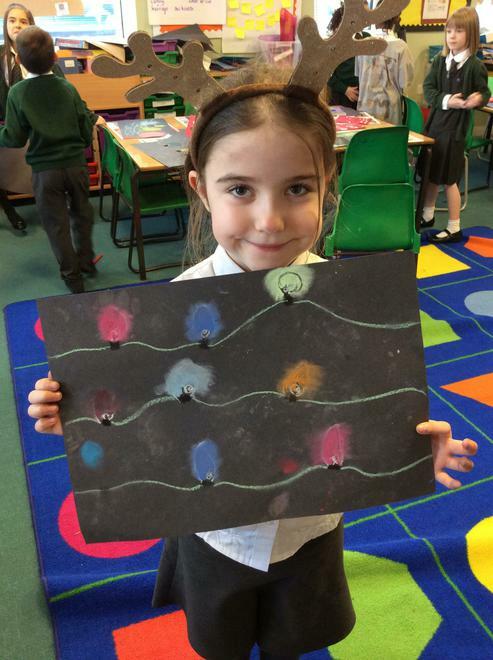 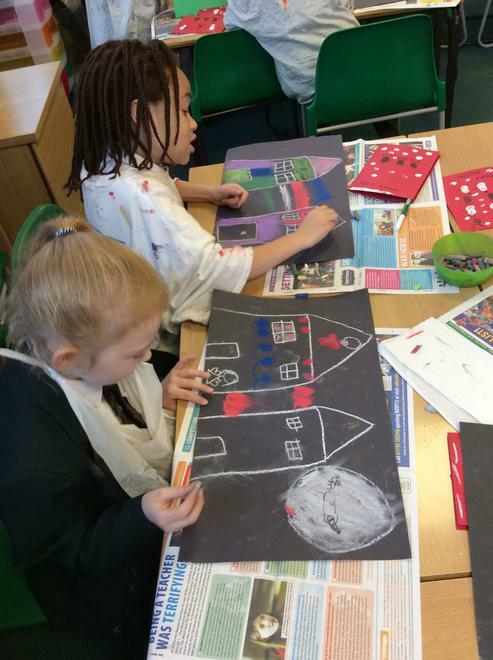 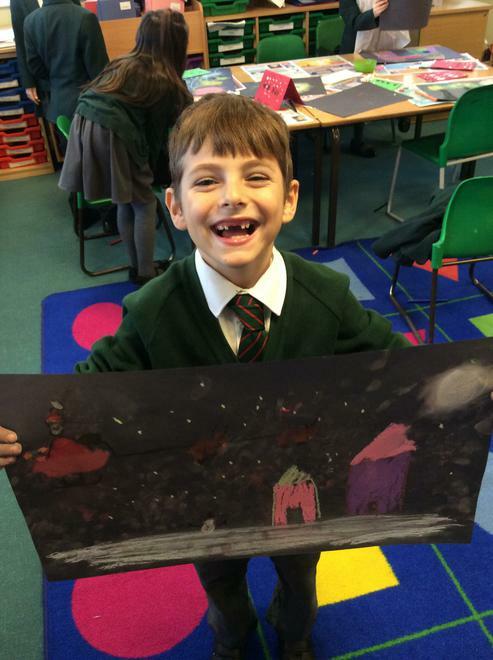 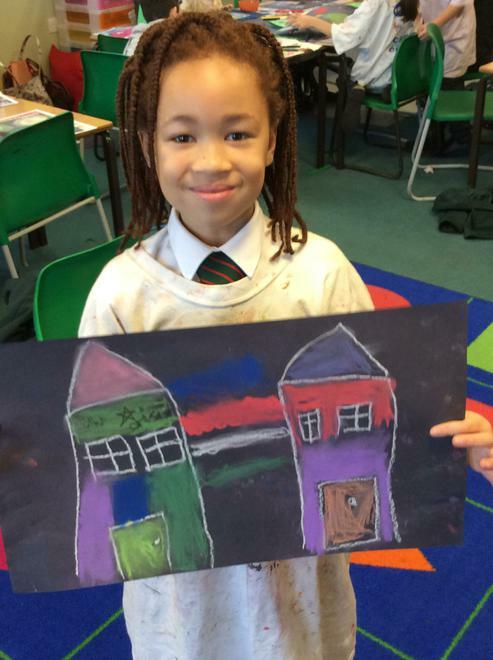 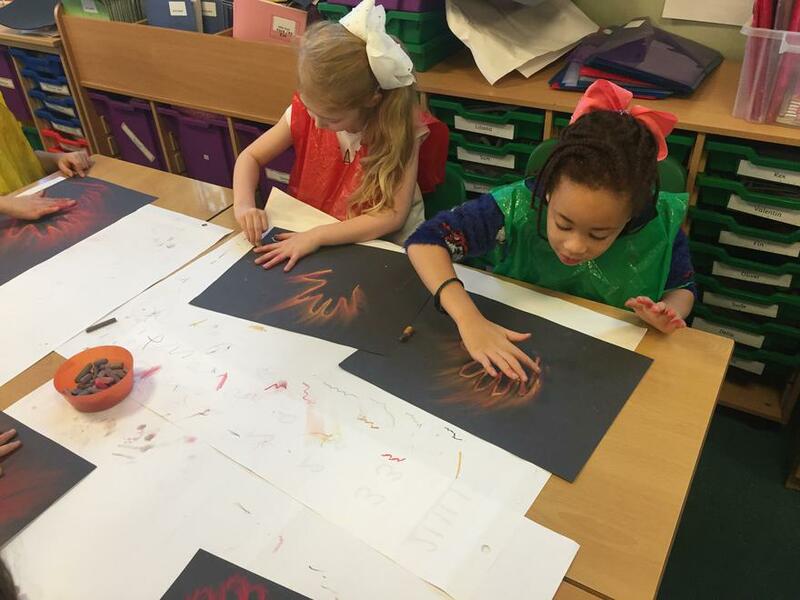 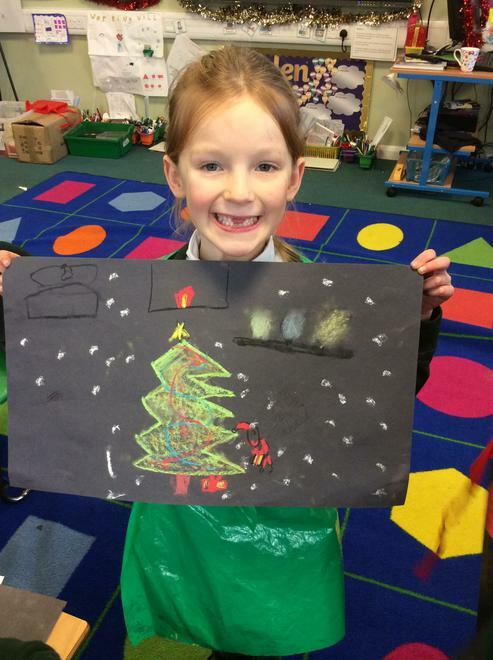 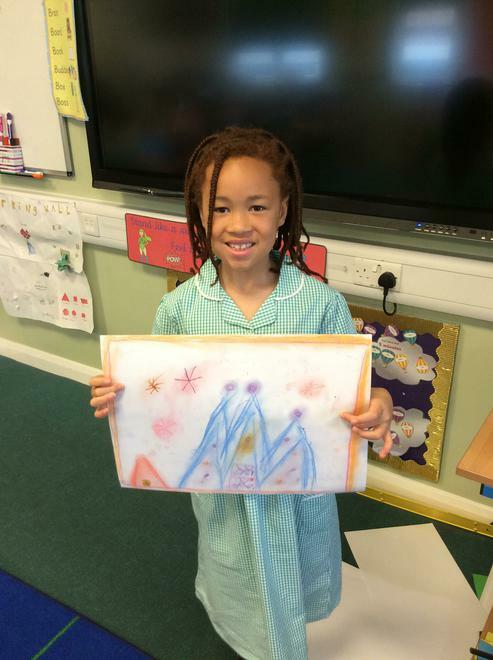 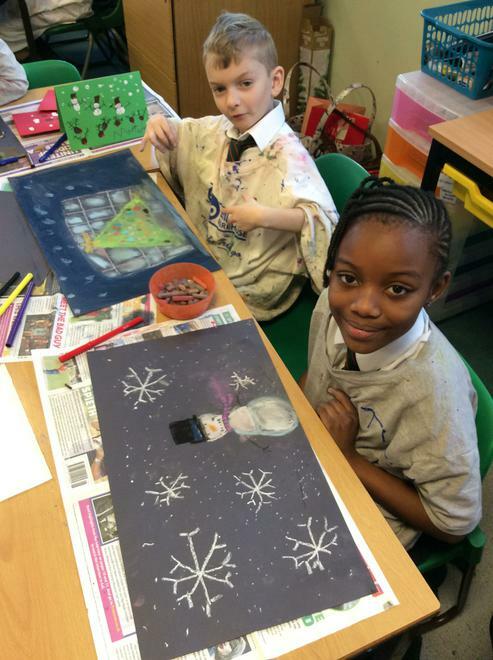 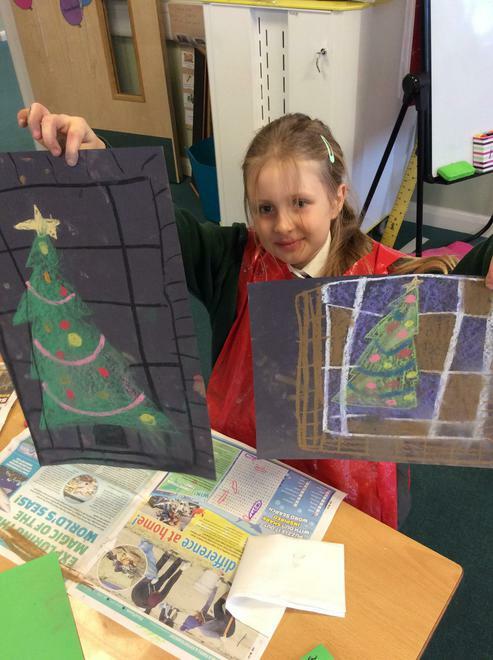 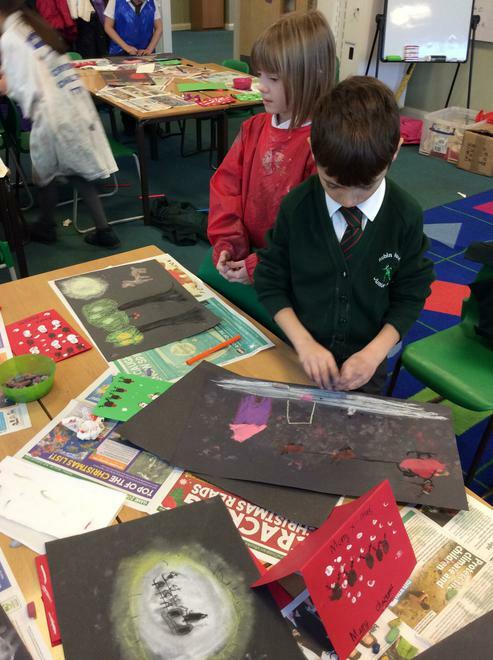 We also used our artistic skills from last week and created some beautiful Christmas themed pictures using chalk pastels and the smudging technique. 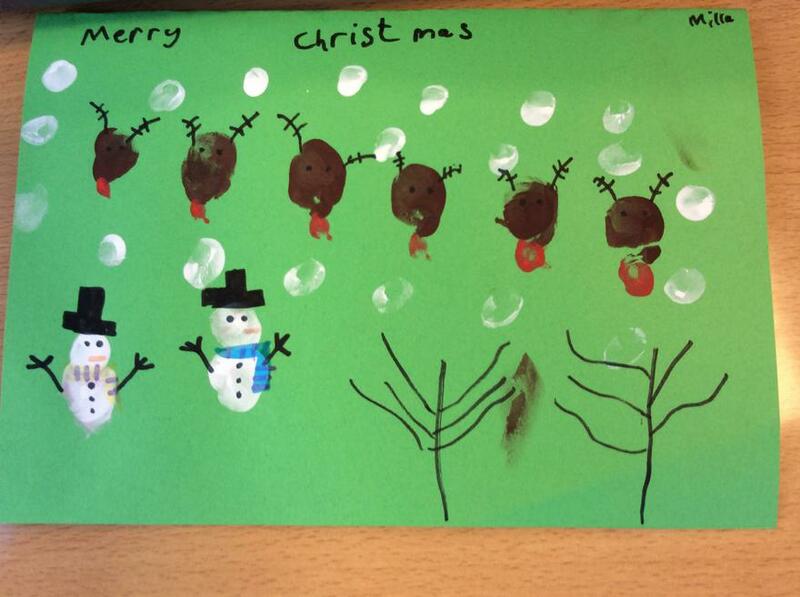 All whilst listening to some Christmas music, of course! 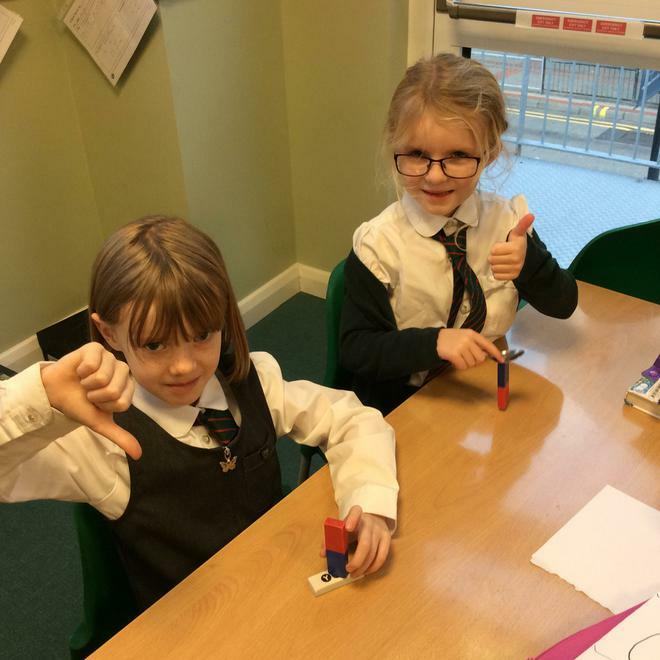 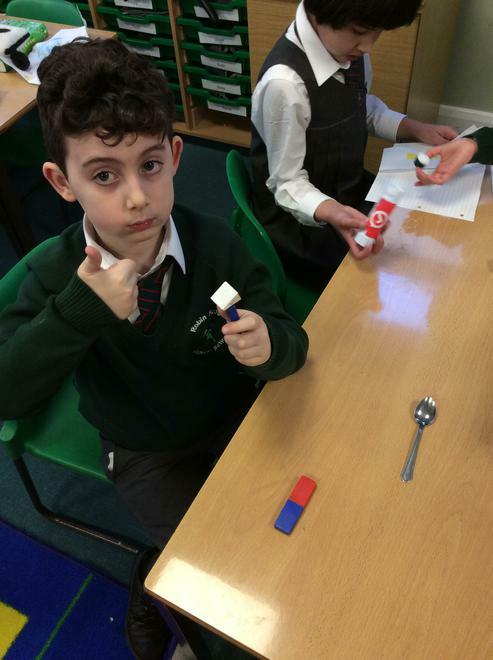 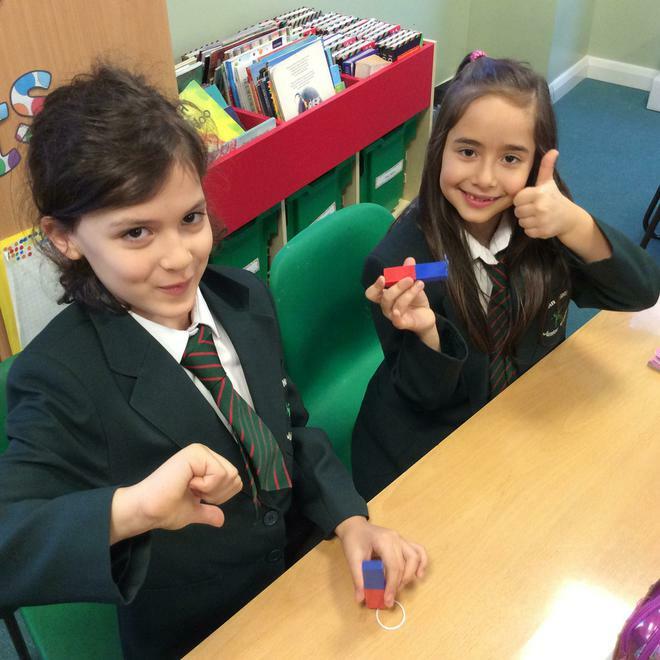 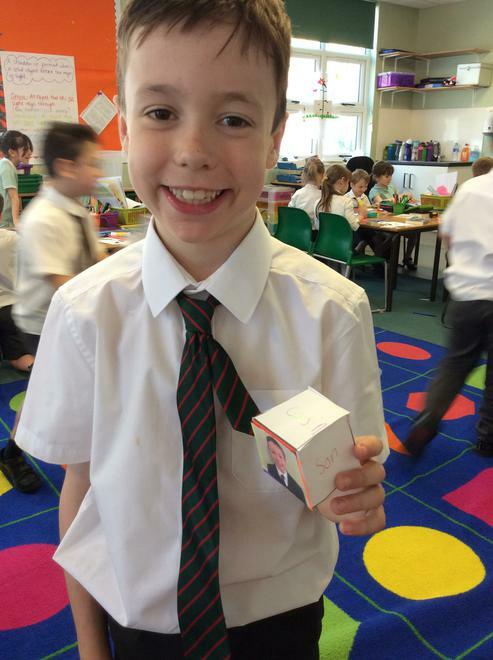 This half term in Science we have been learning about magnets and different forces. 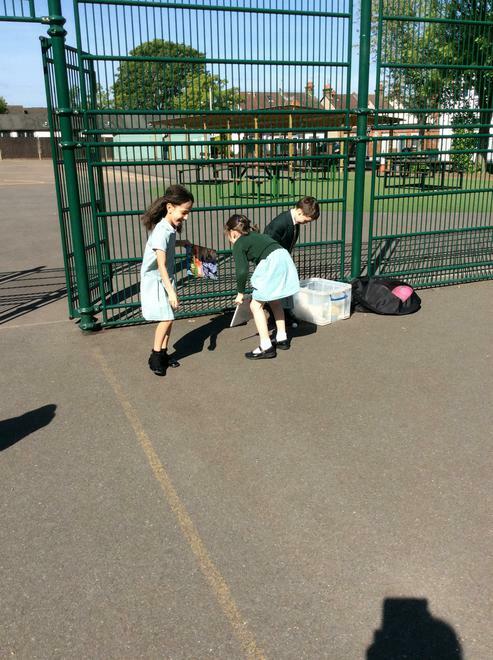 We made predictions and conducted an experiment to find out whether objects were magnetic or not. 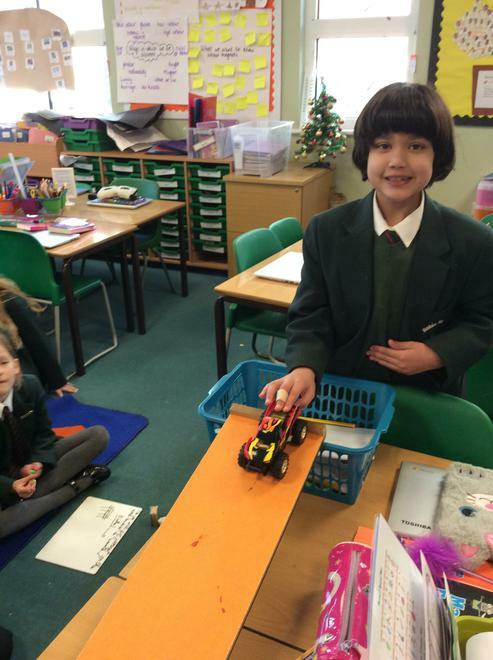 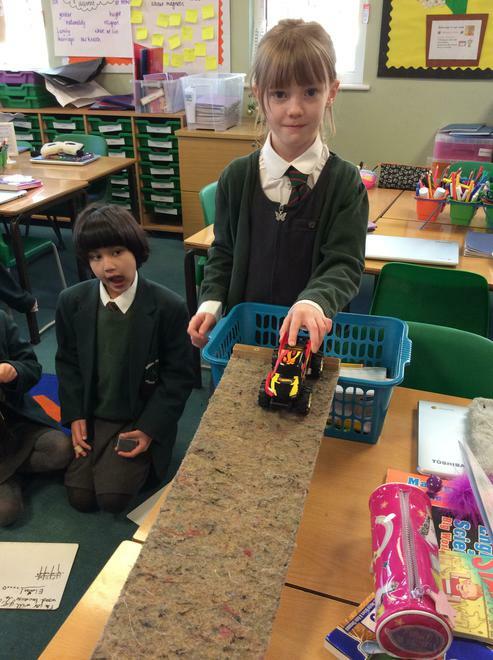 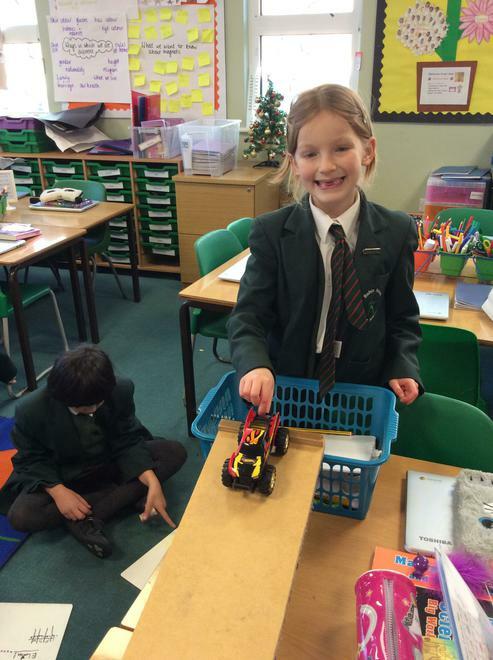 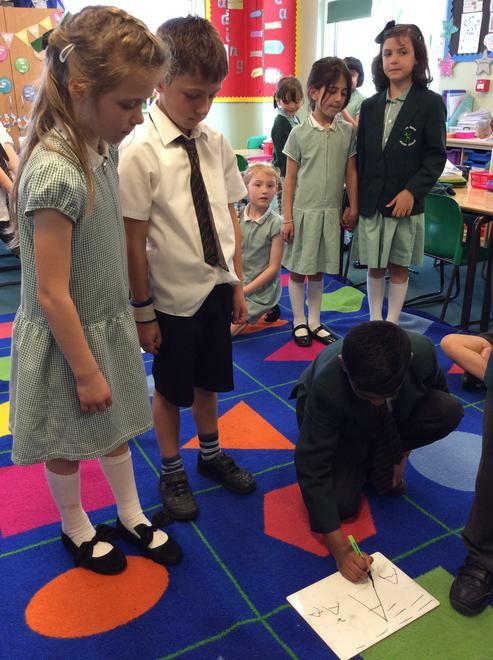 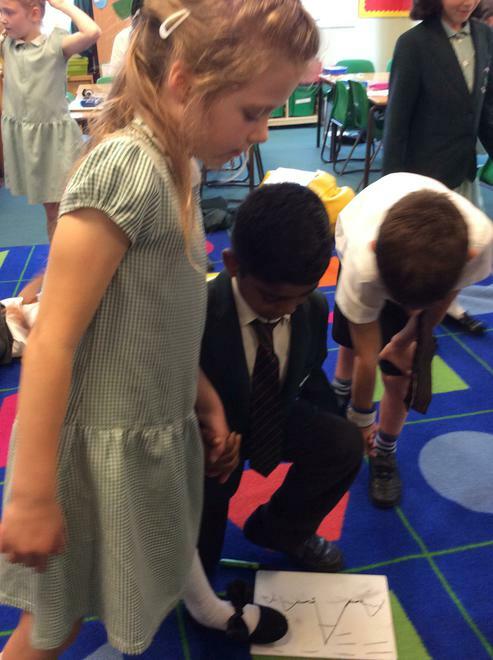 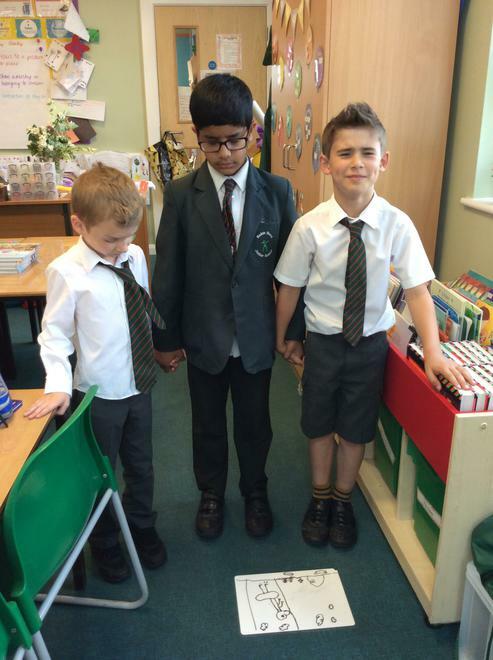 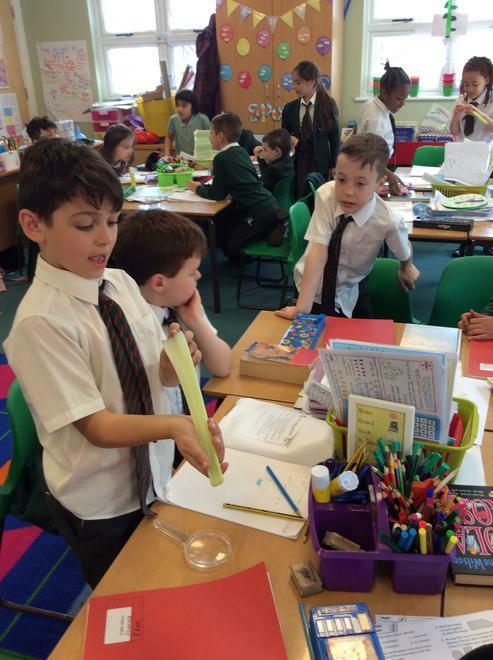 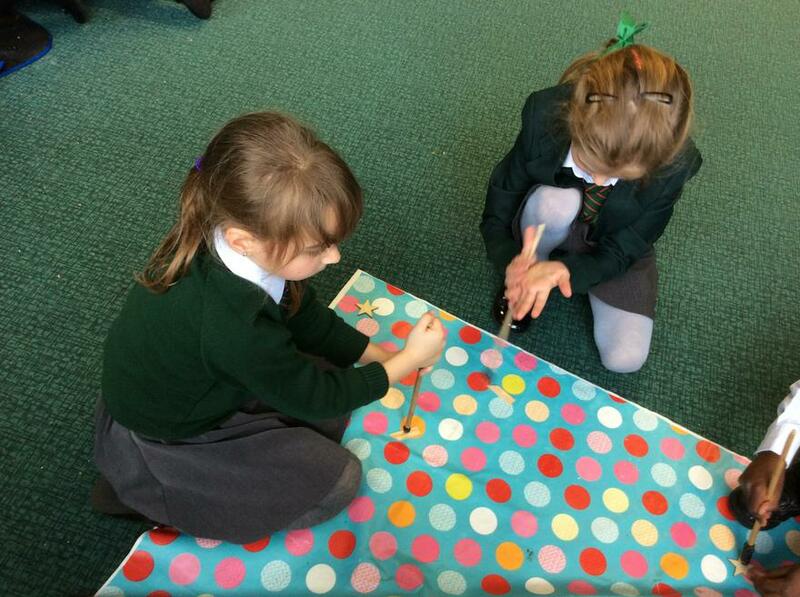 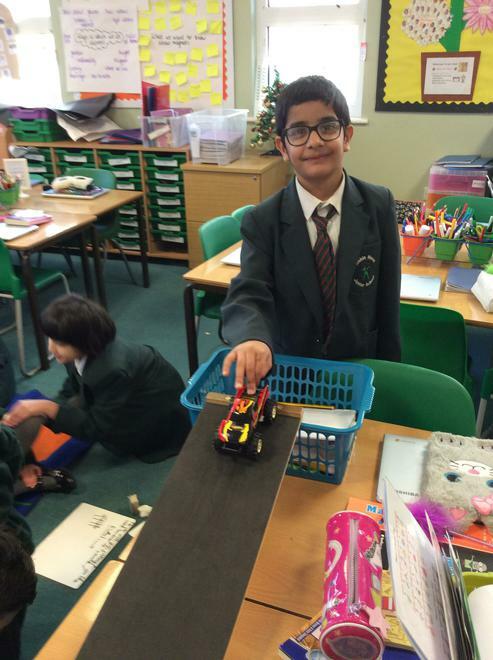 We also looked at how different materials create friction and predicted which material a car would roll down fastest. 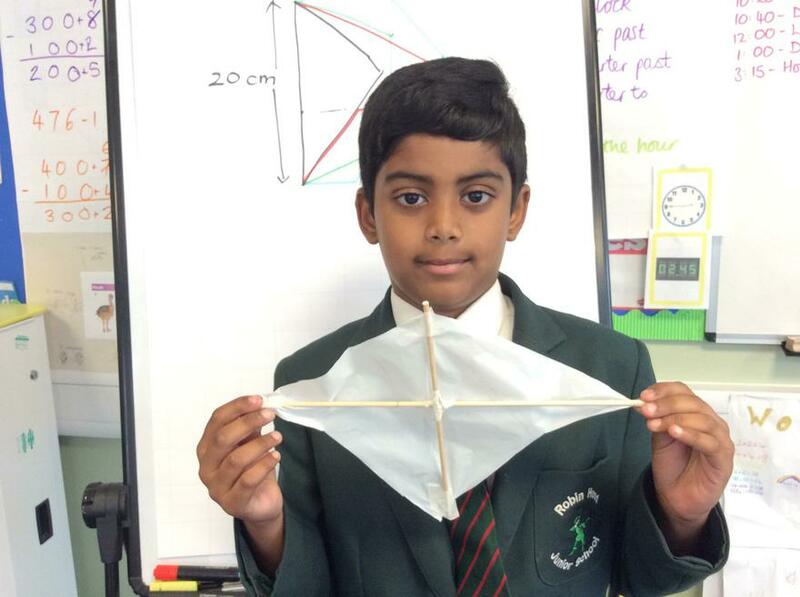 Both of these experiments were a lot of fun and we learnt a lot too! 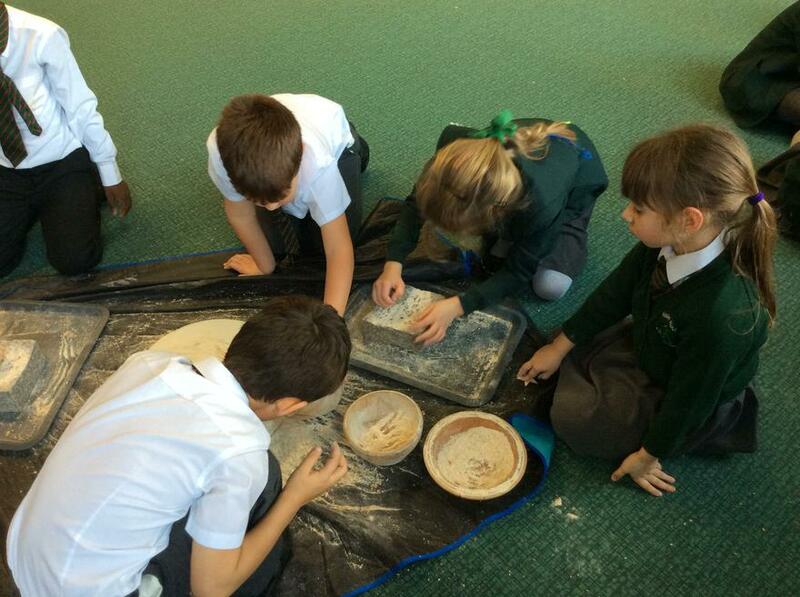 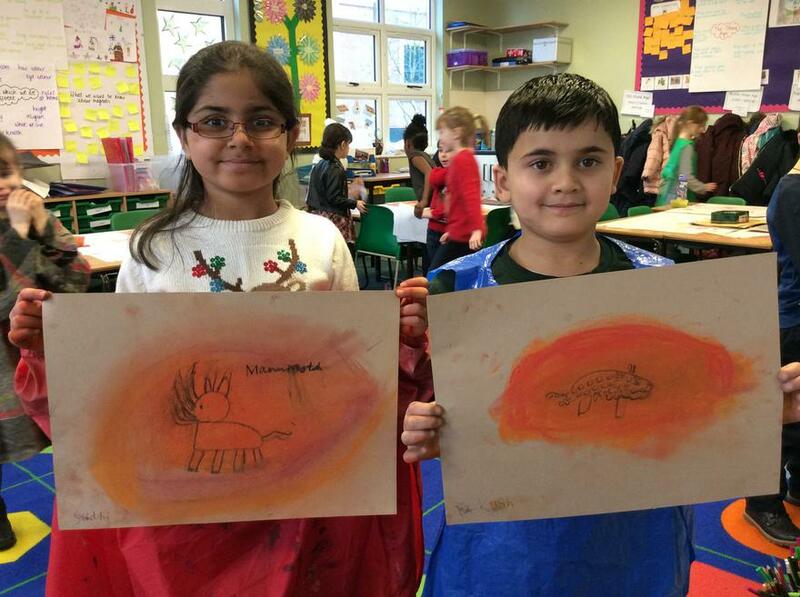 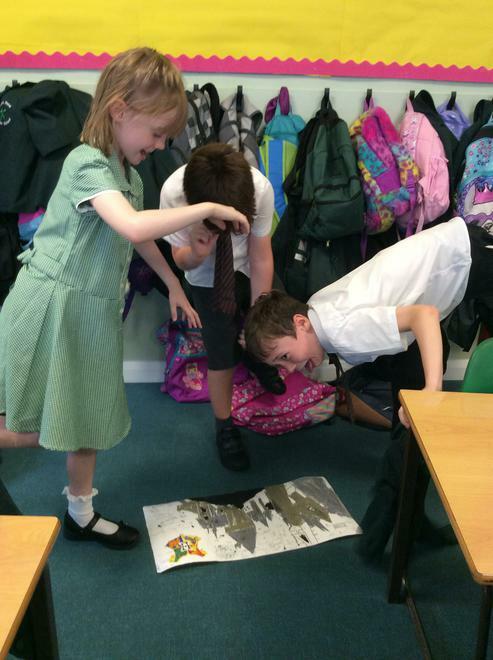 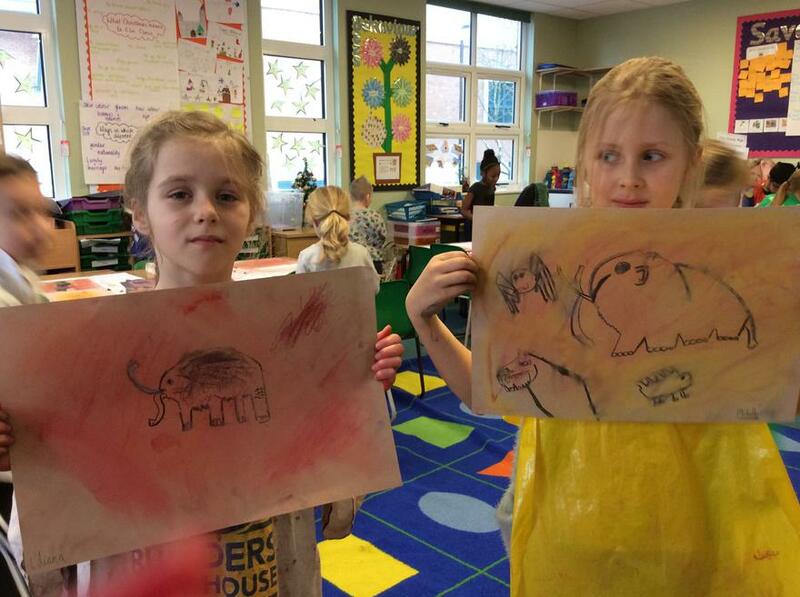 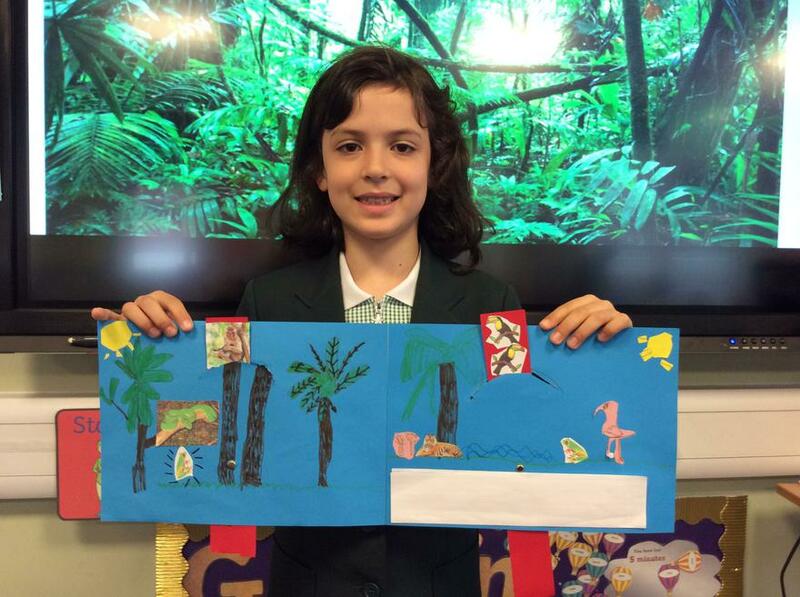 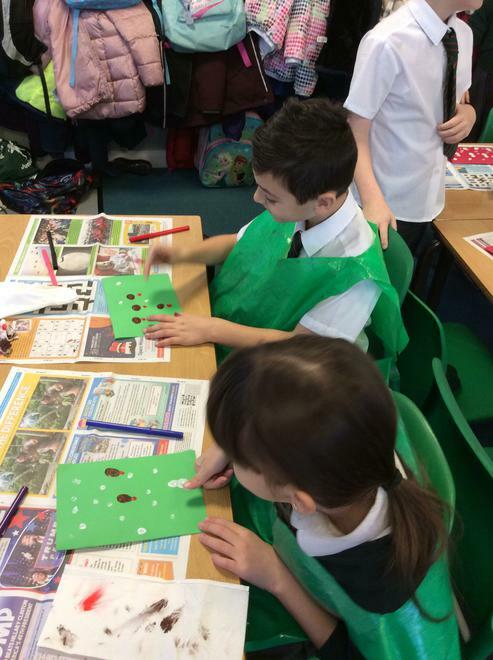 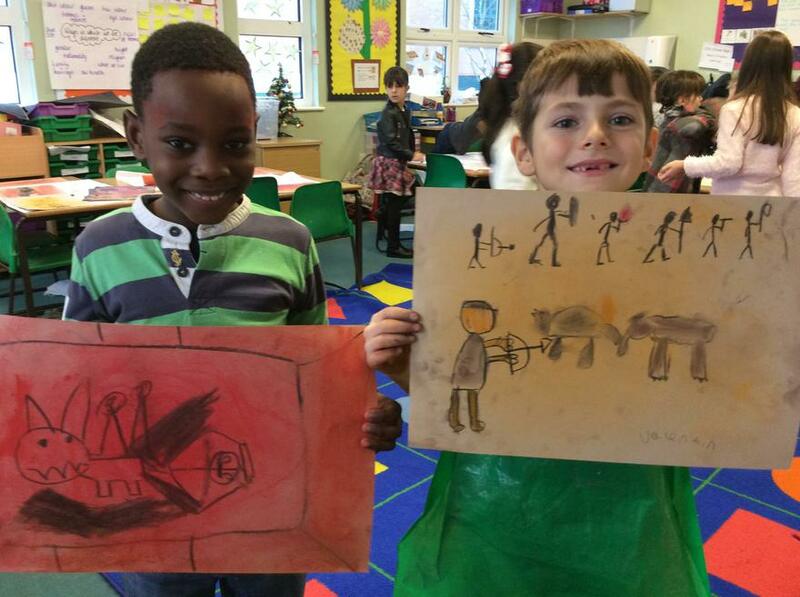 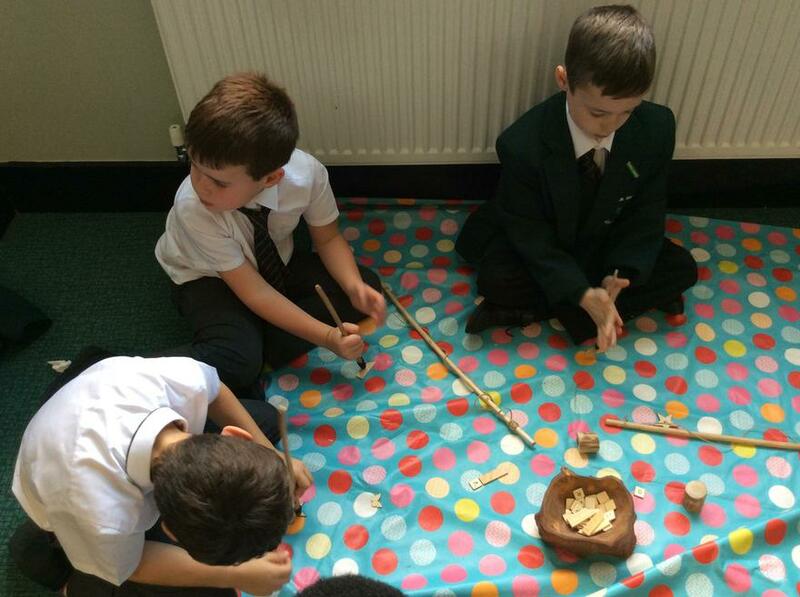 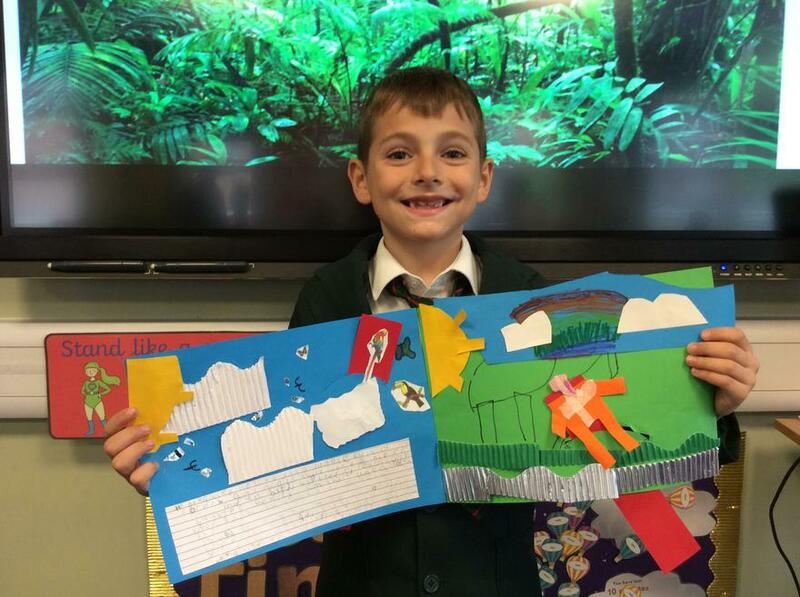 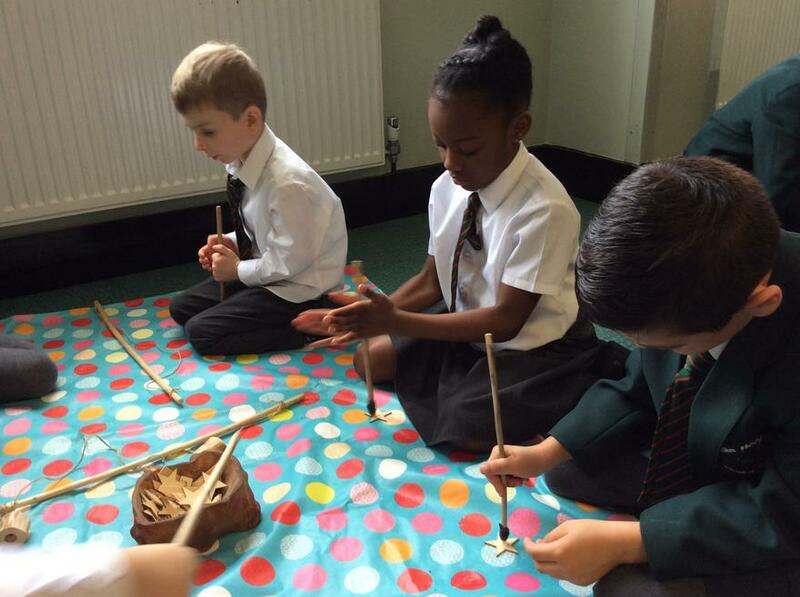 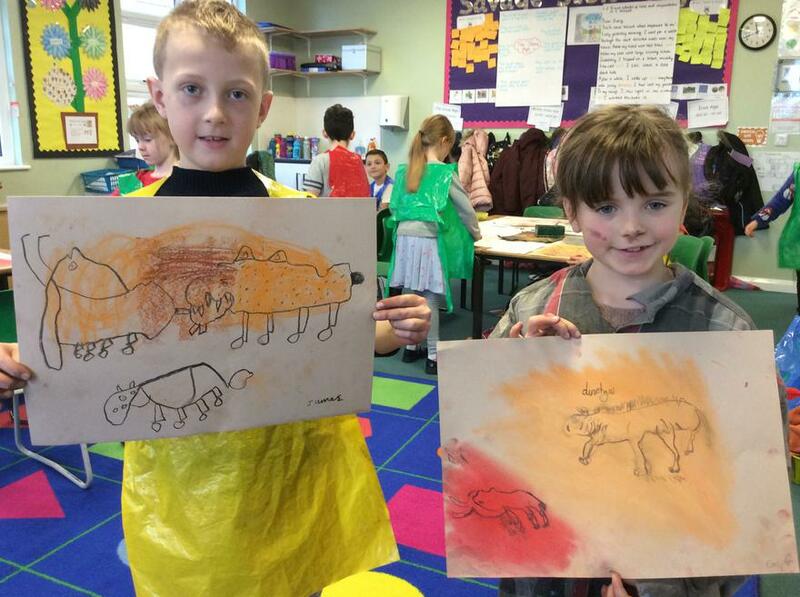 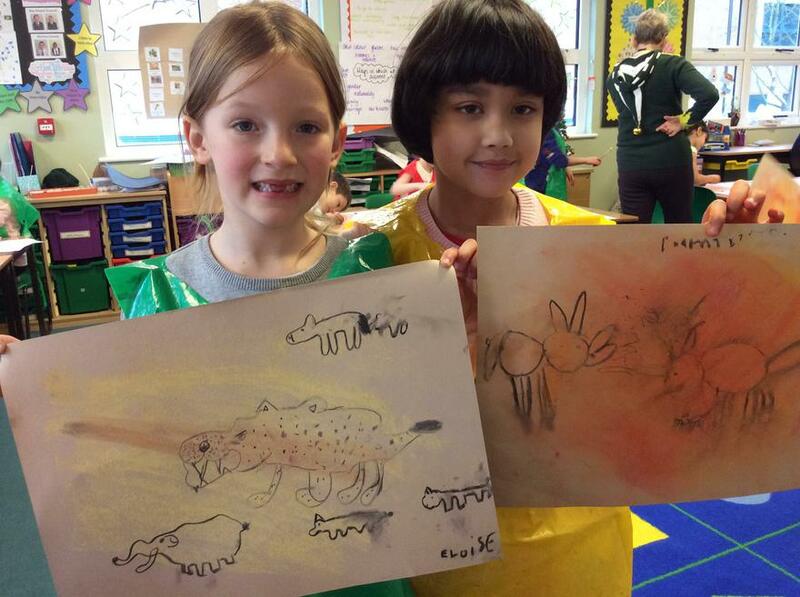 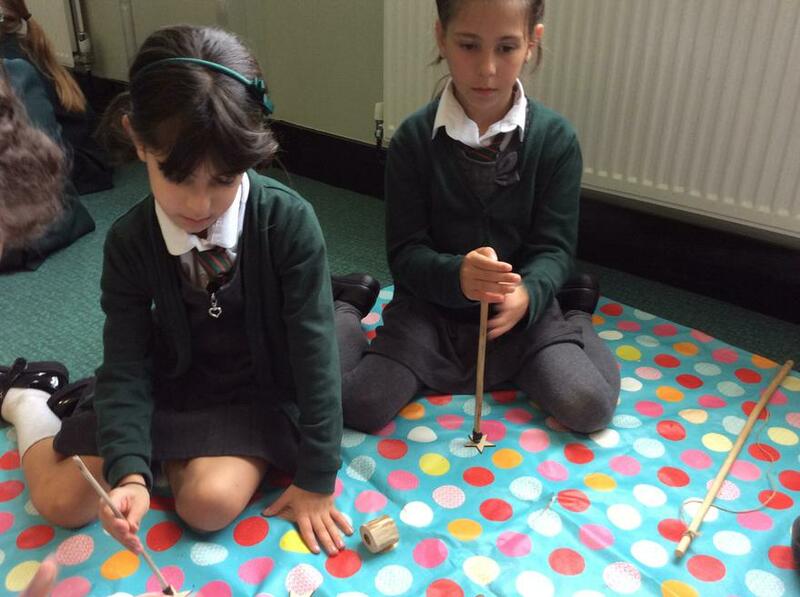 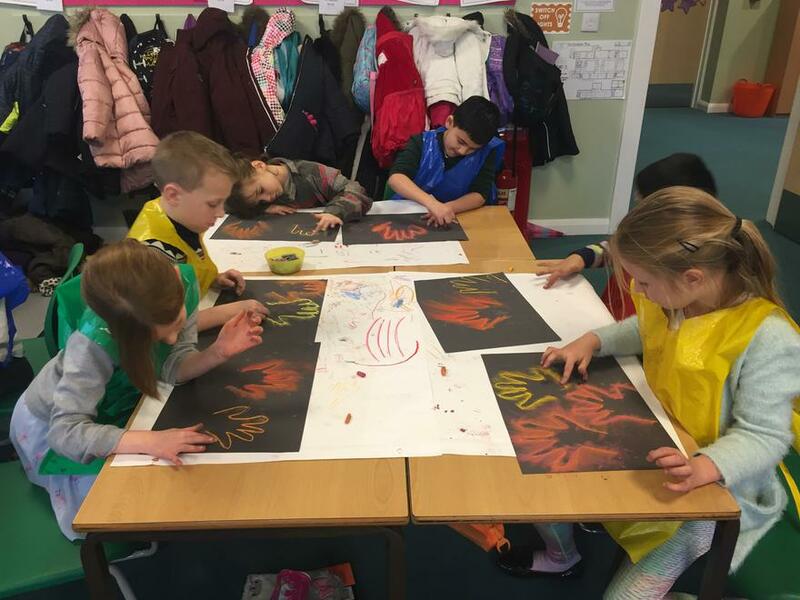 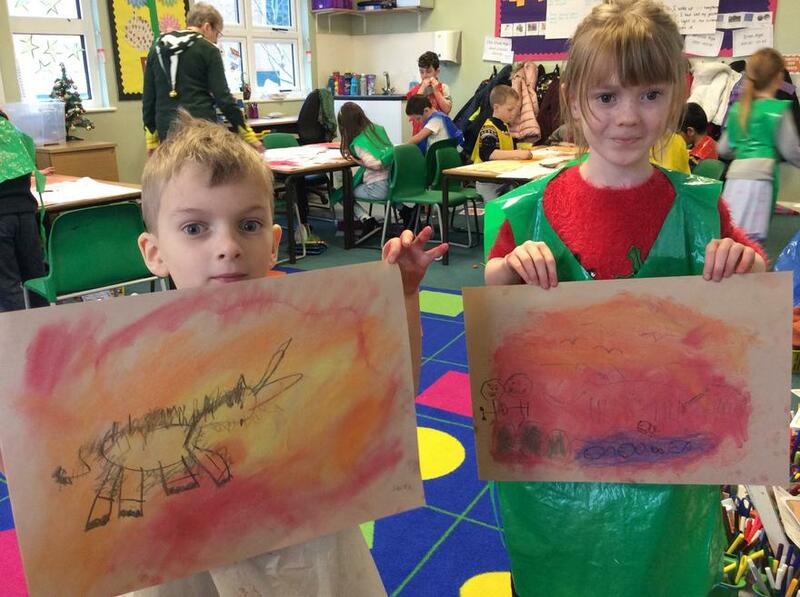 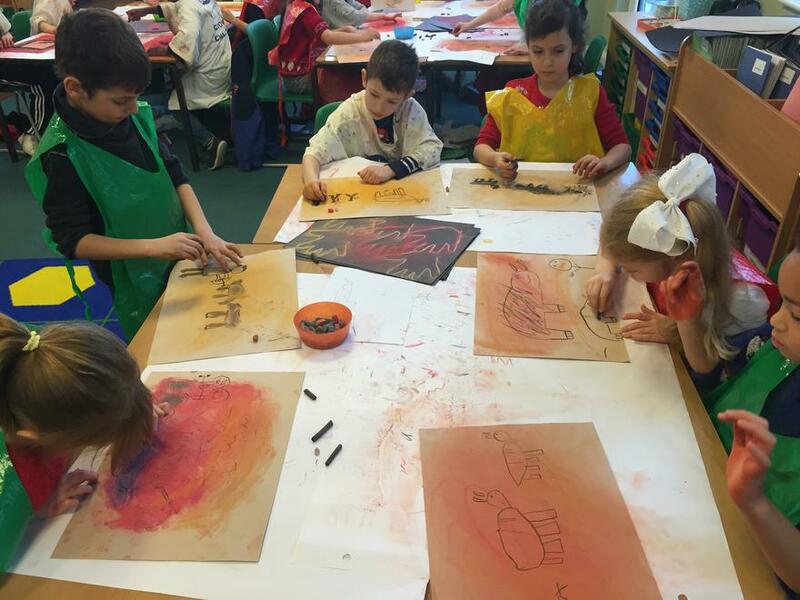 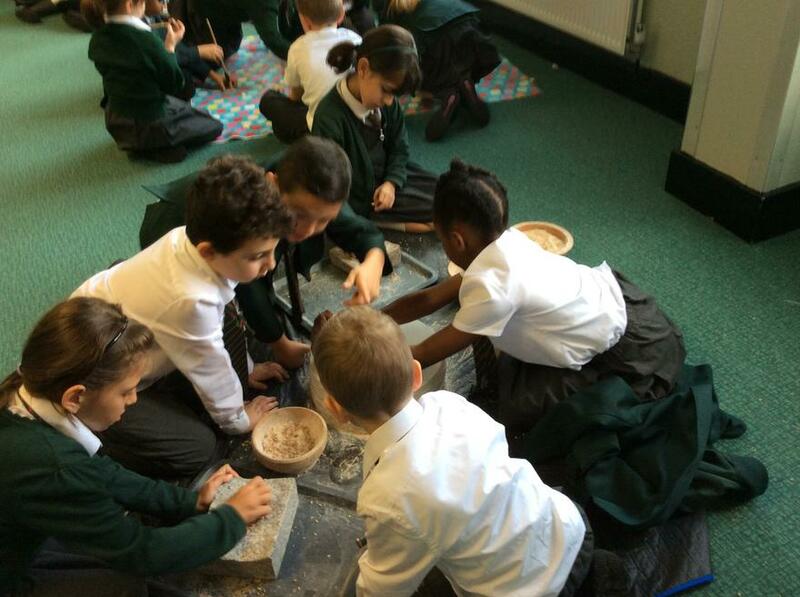 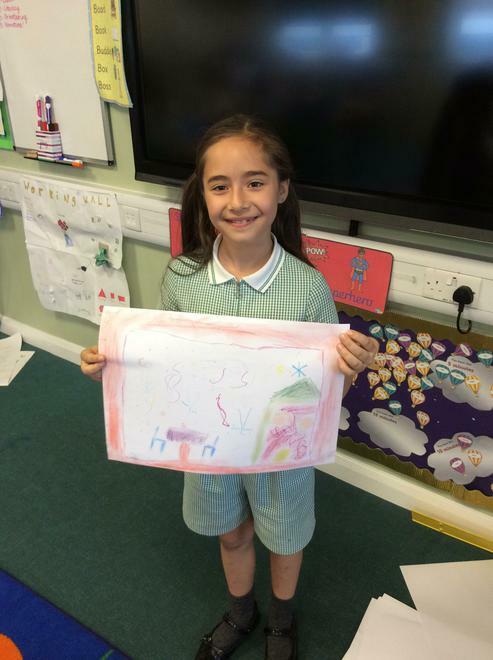 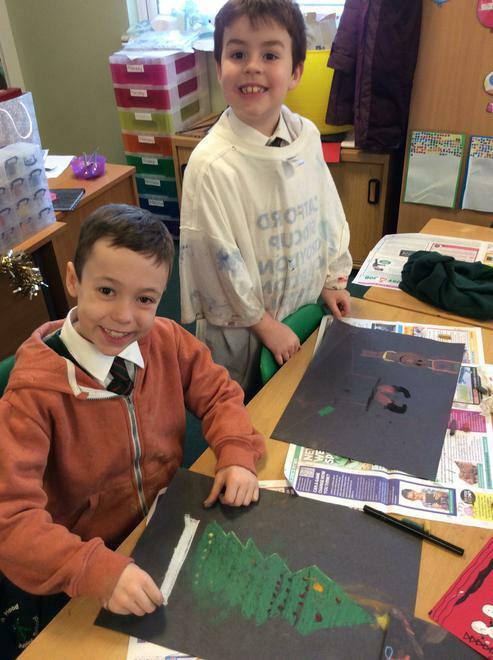 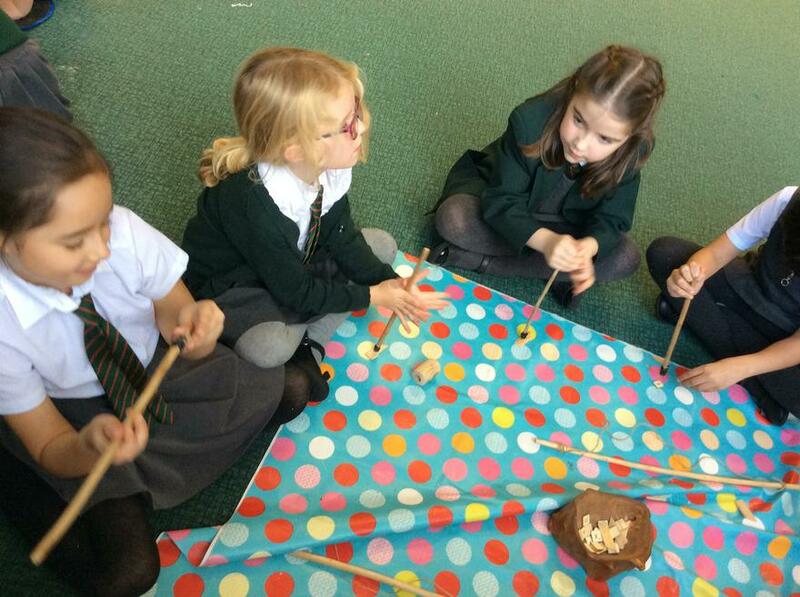 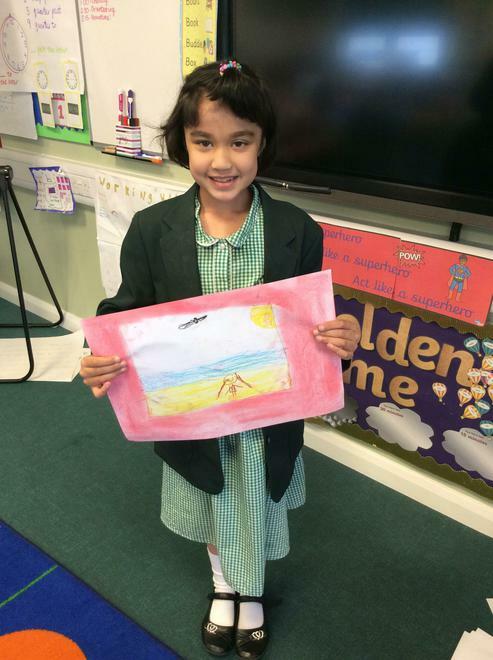 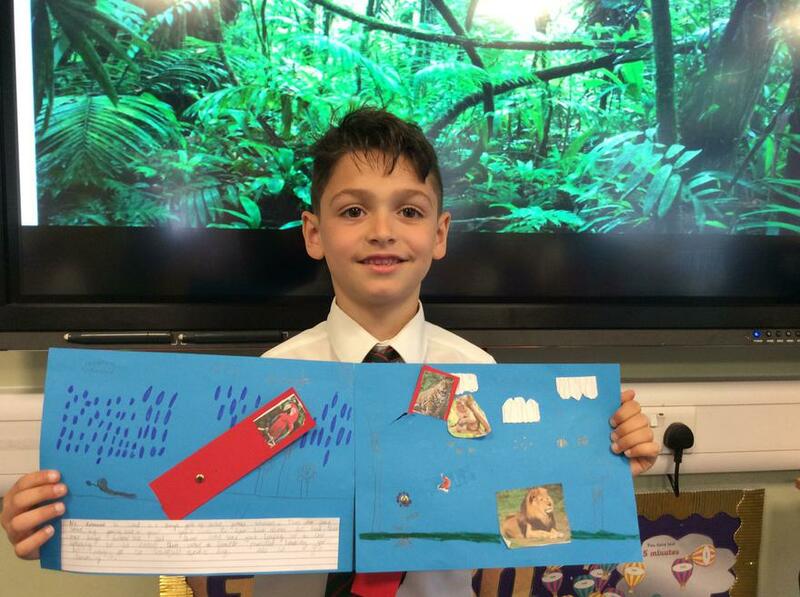 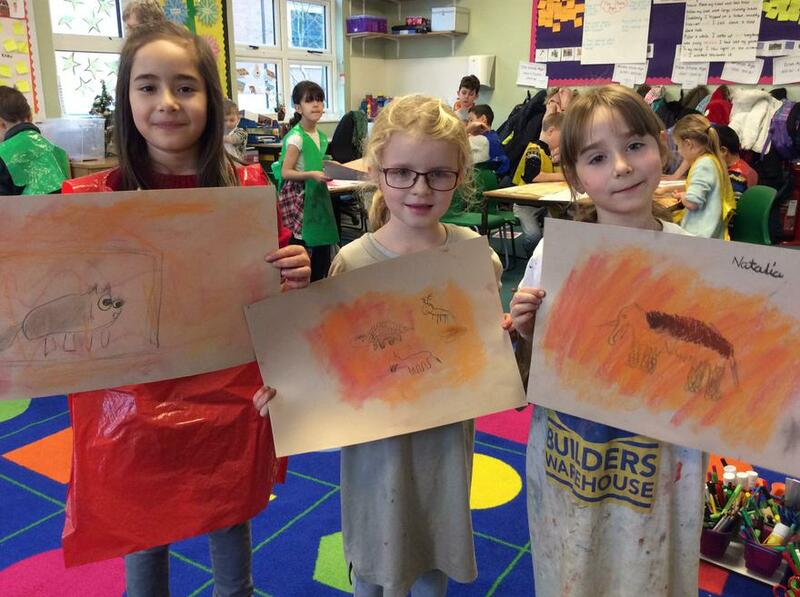 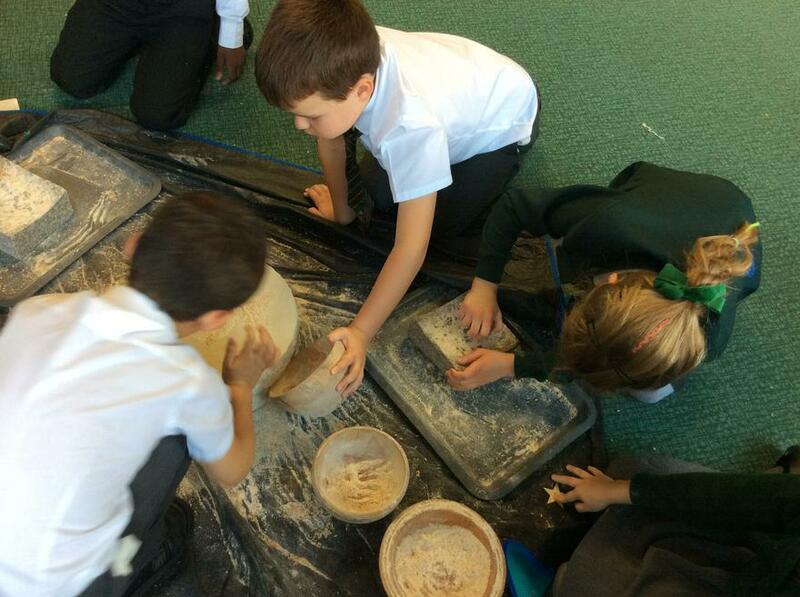 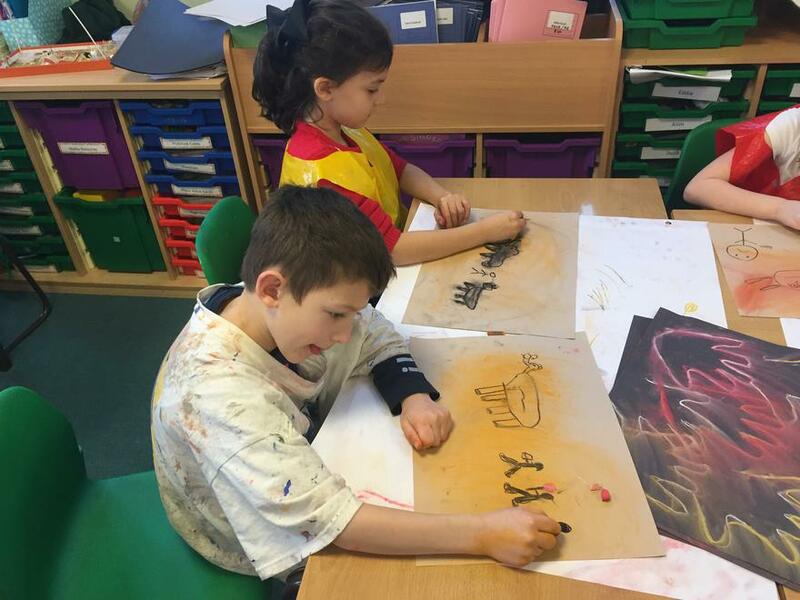 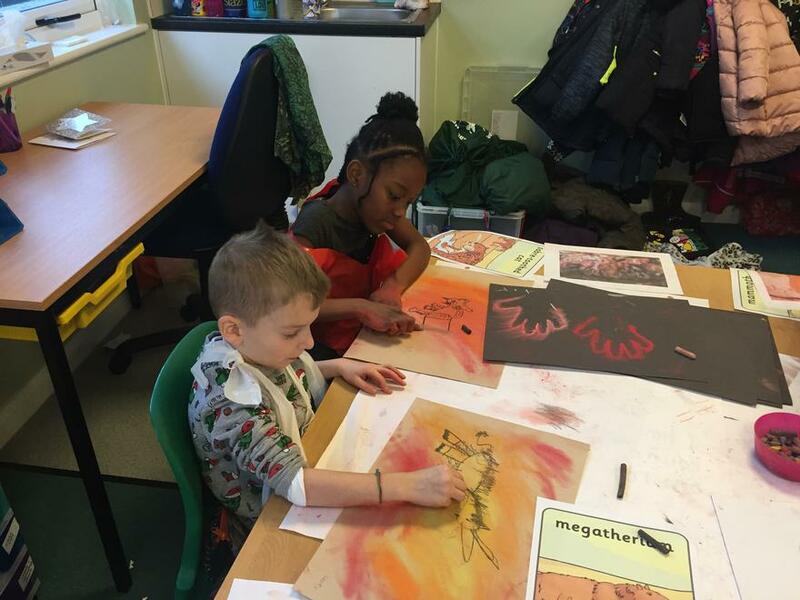 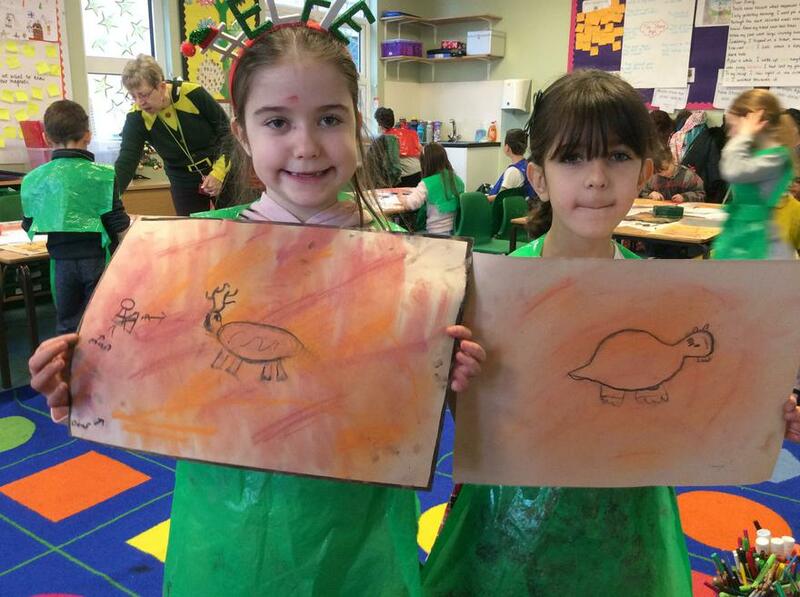 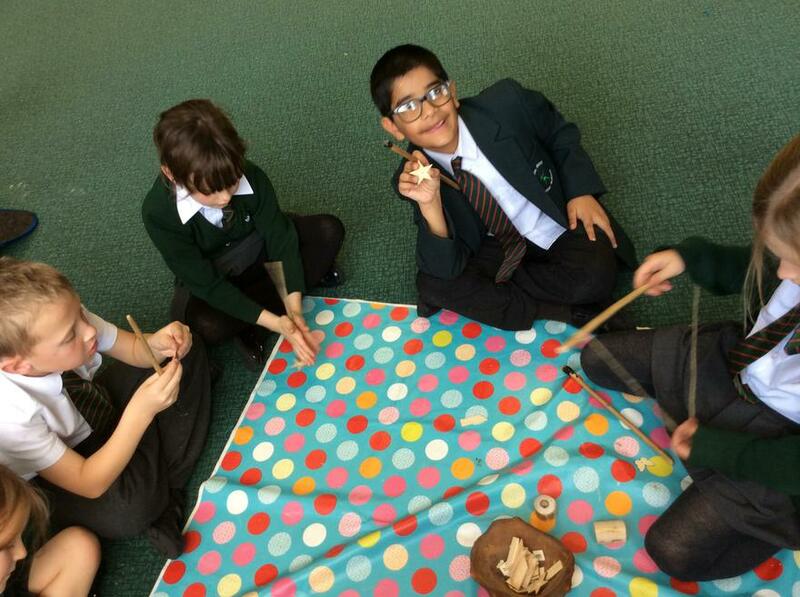 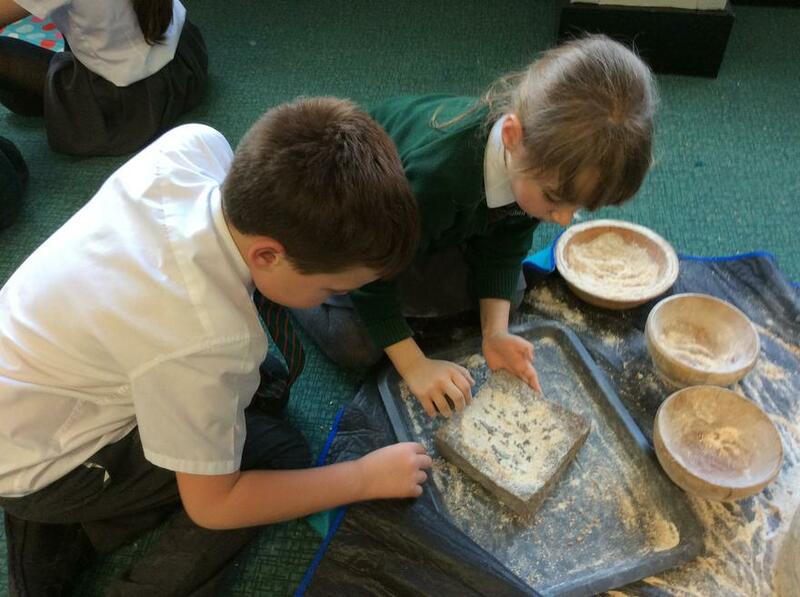 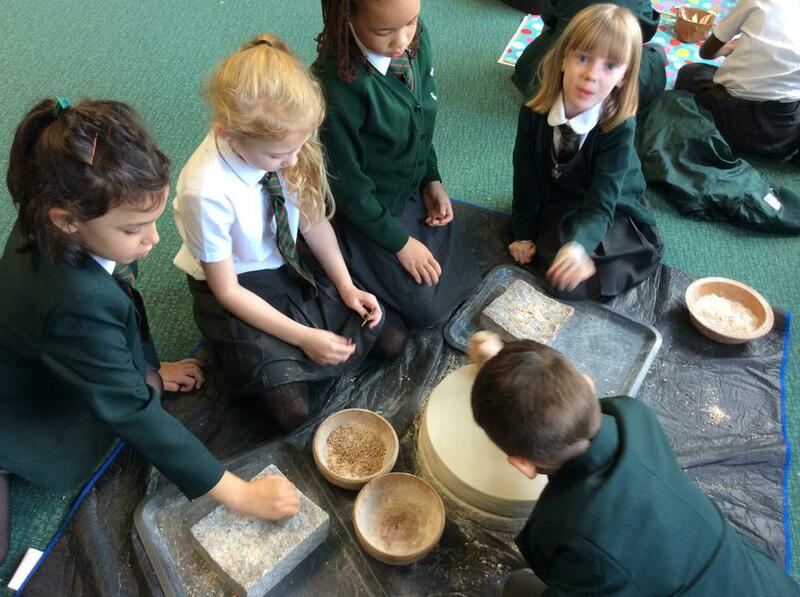 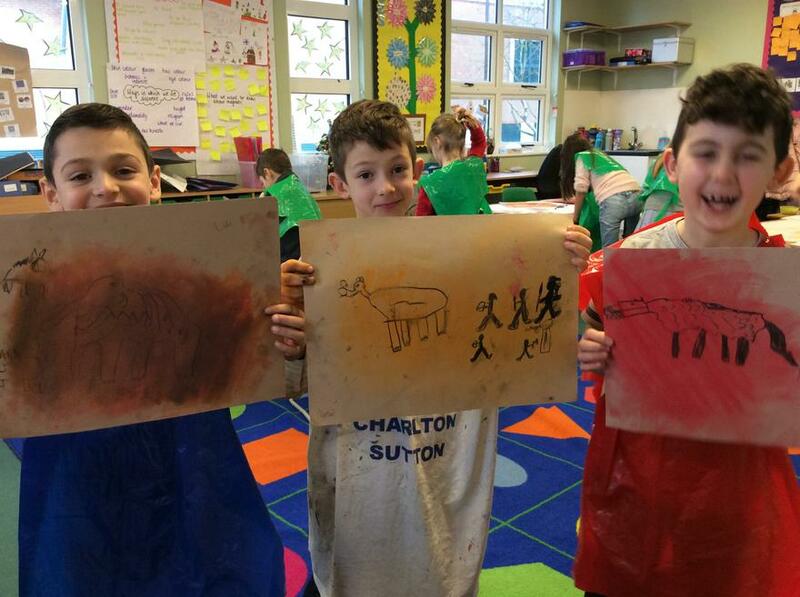 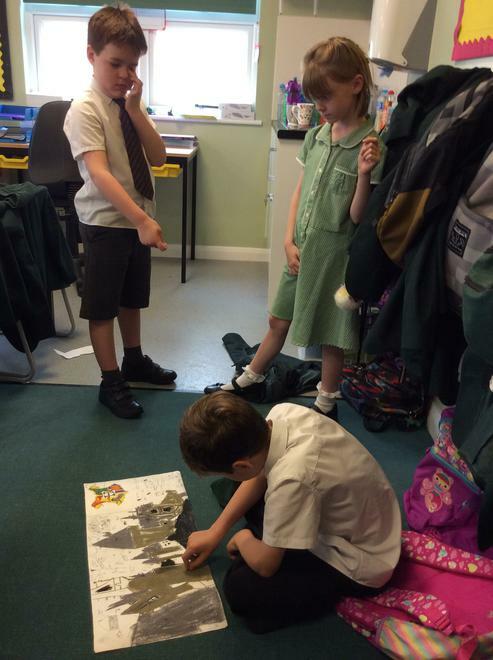 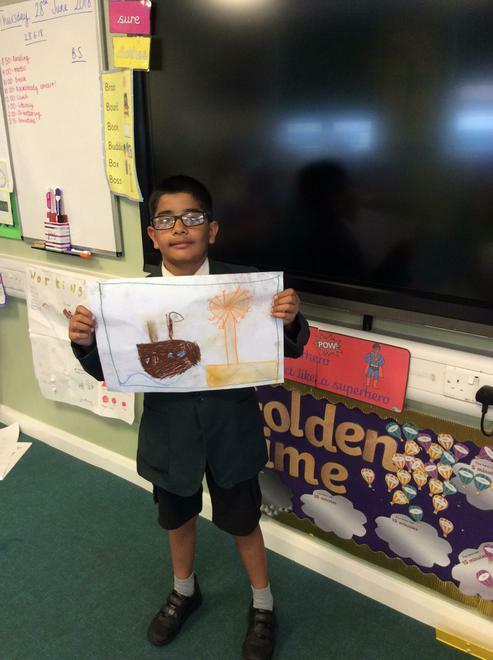 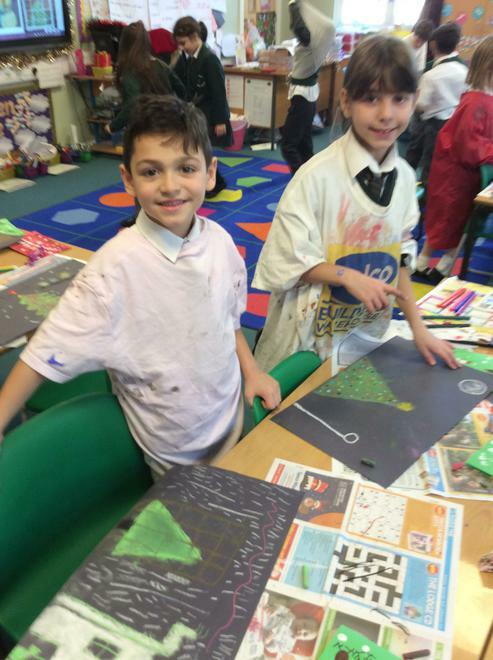 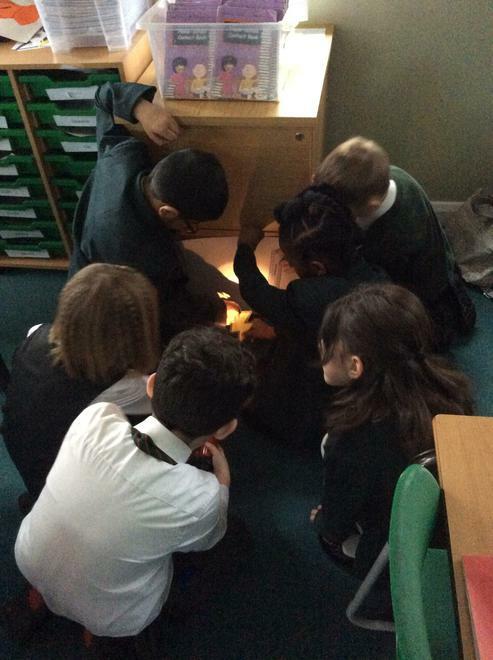 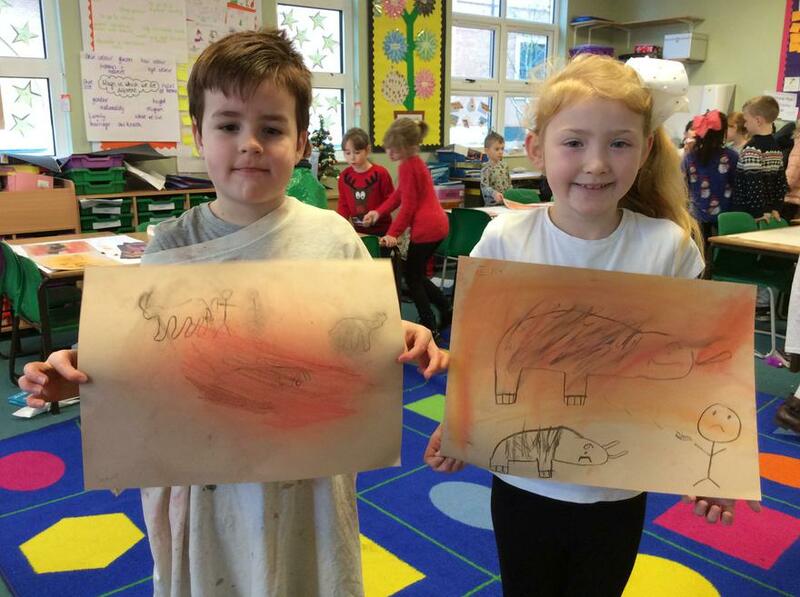 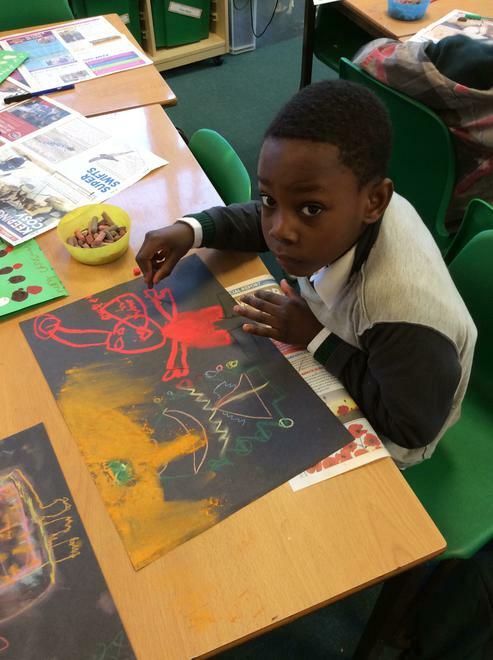 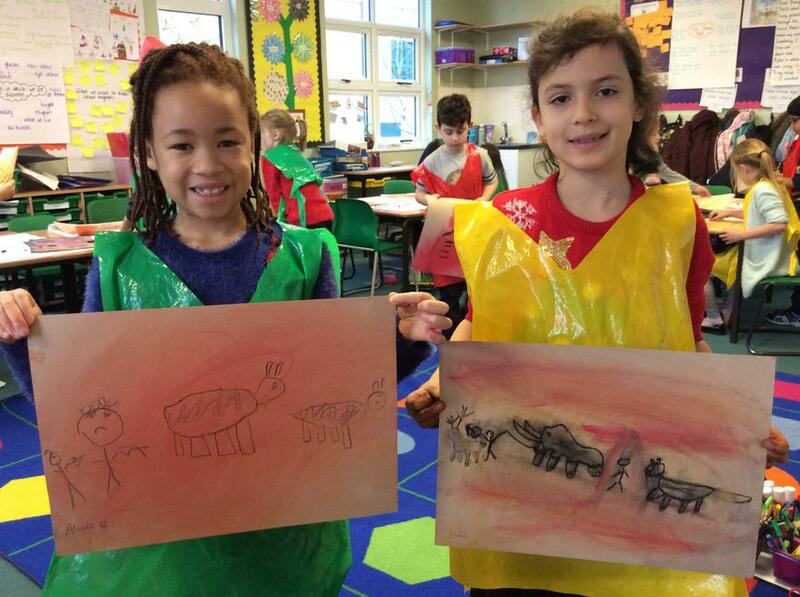 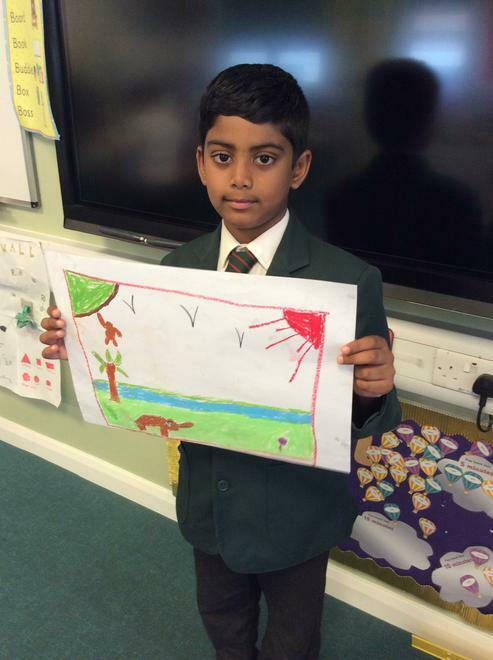 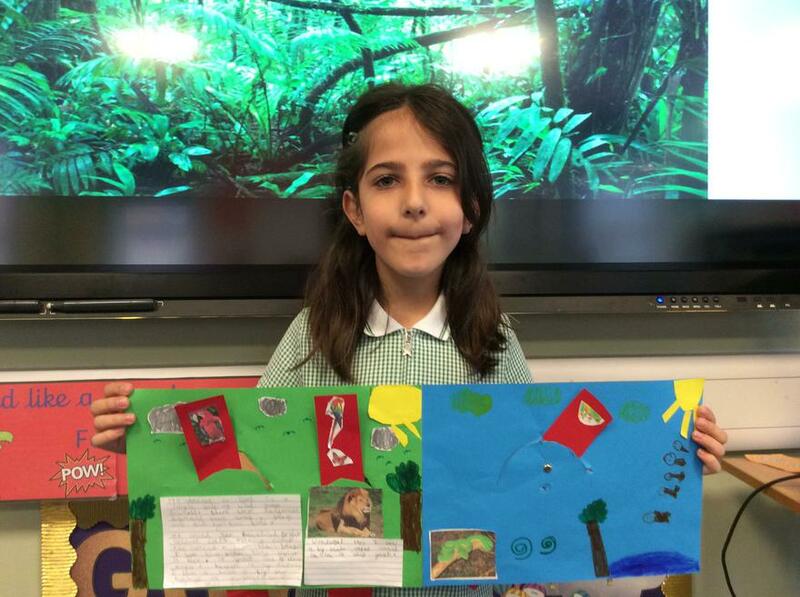 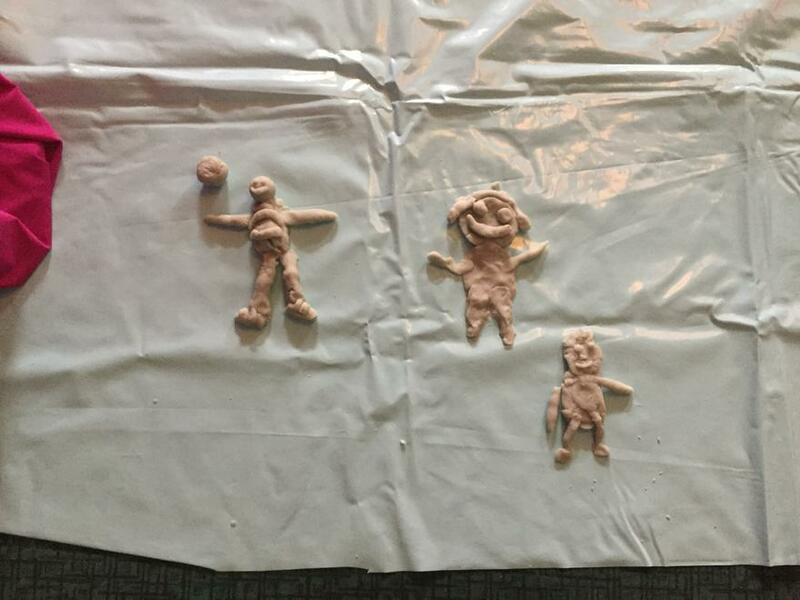 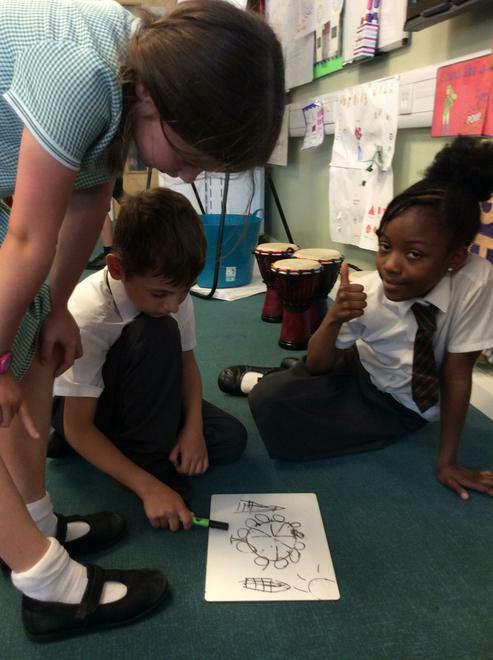 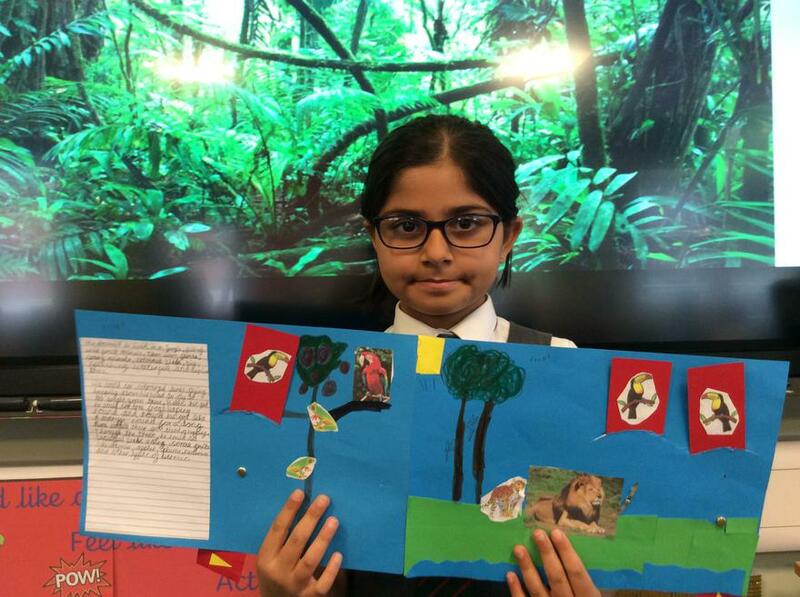 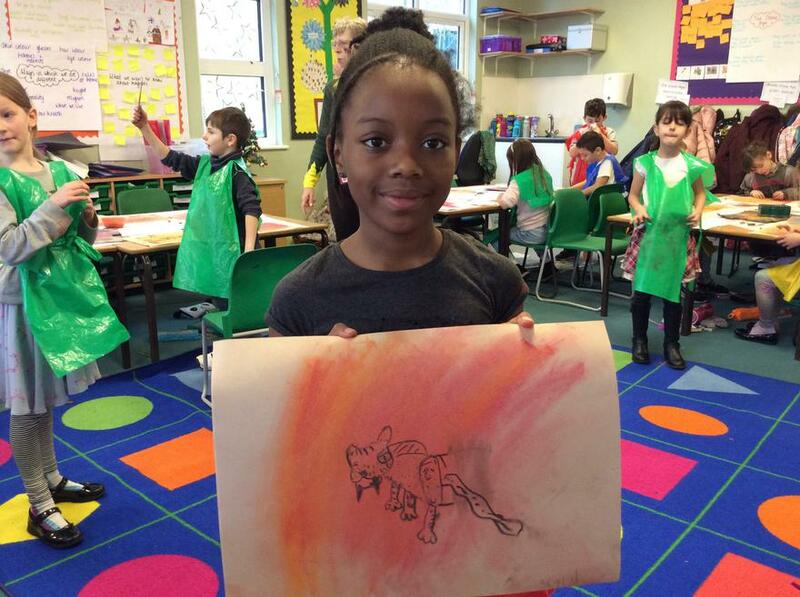 Today we finished our Stone Age topic by learning about cave paintings and how they were made back in the Stone Age. 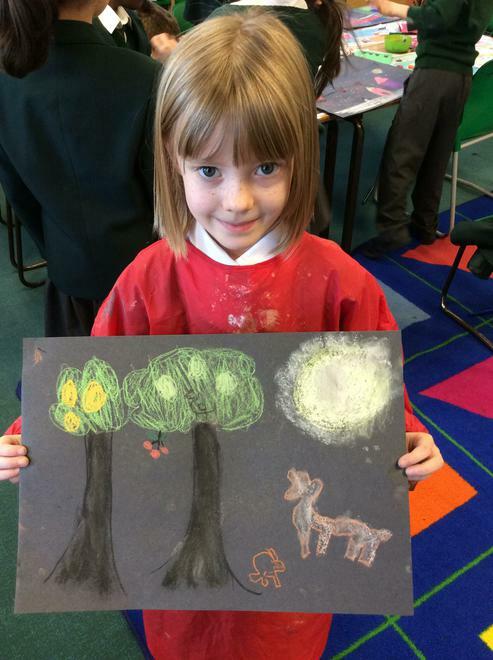 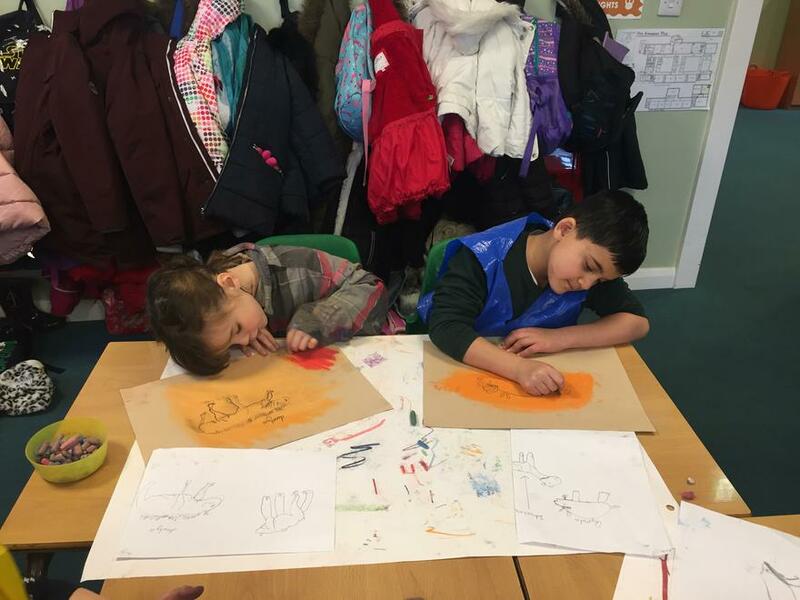 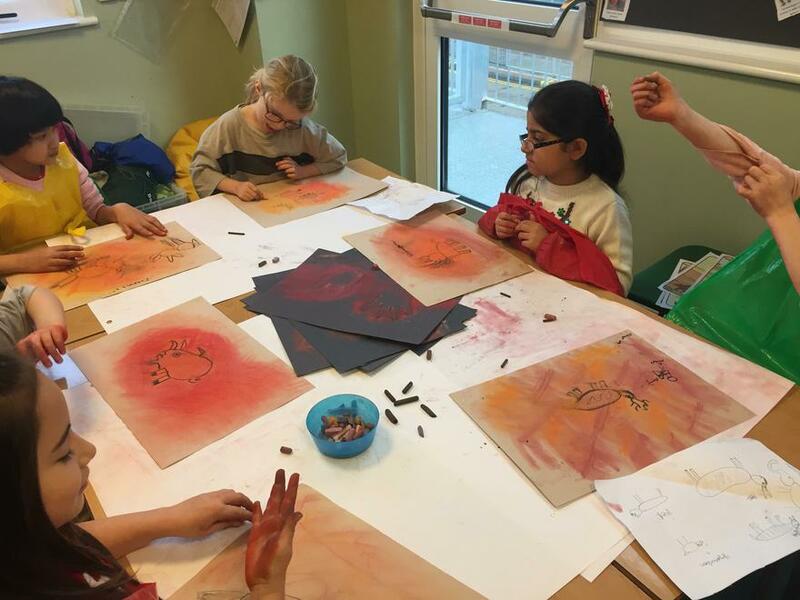 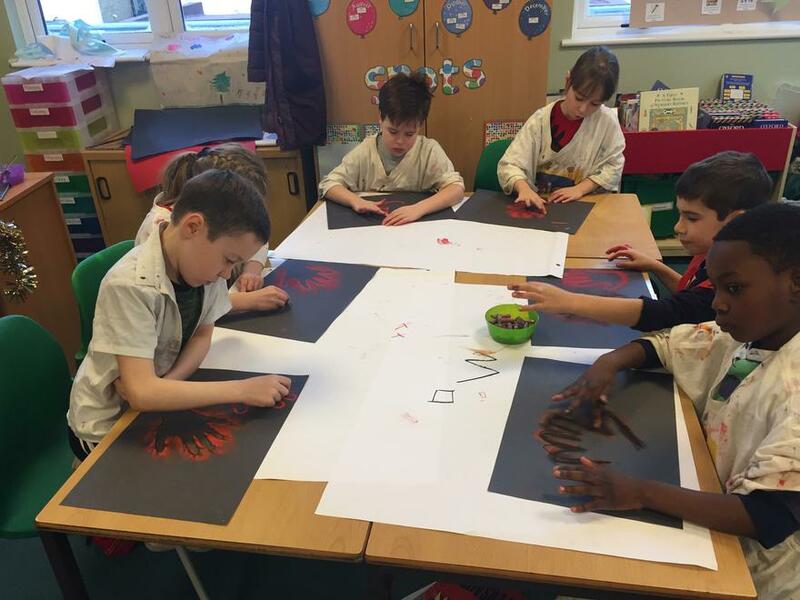 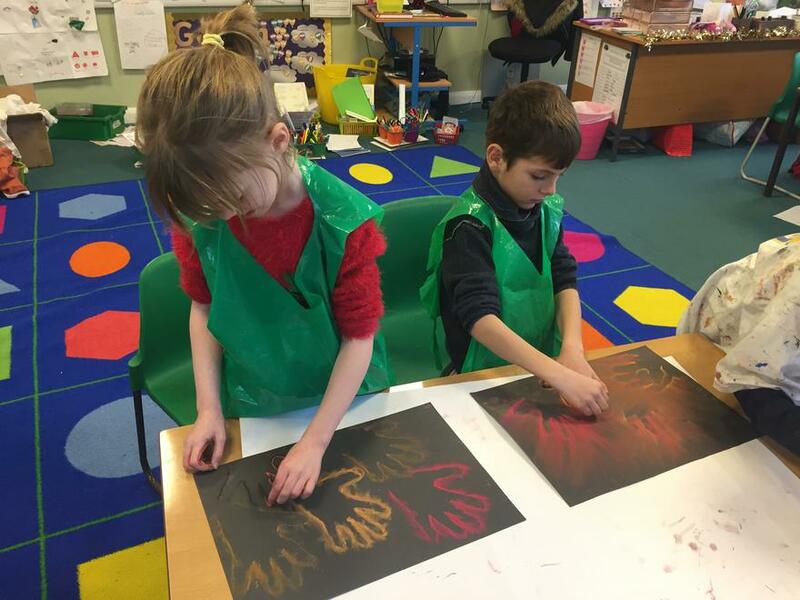 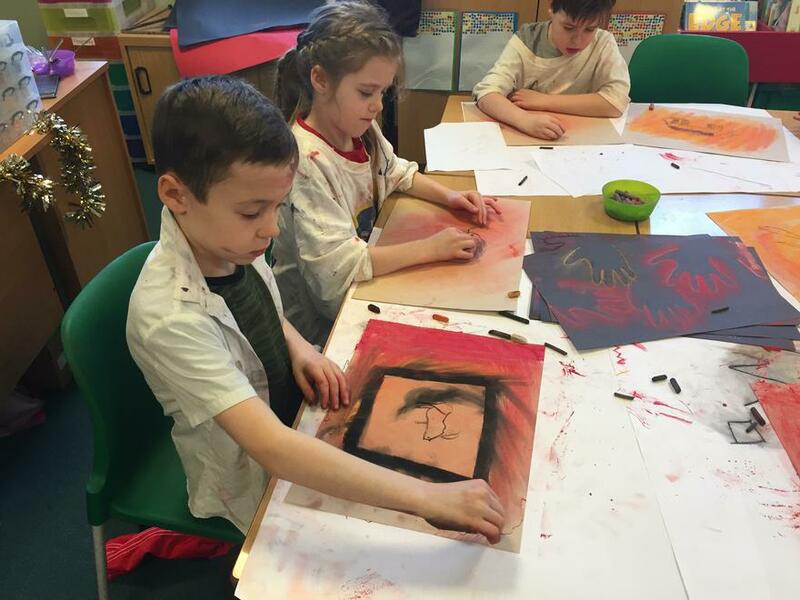 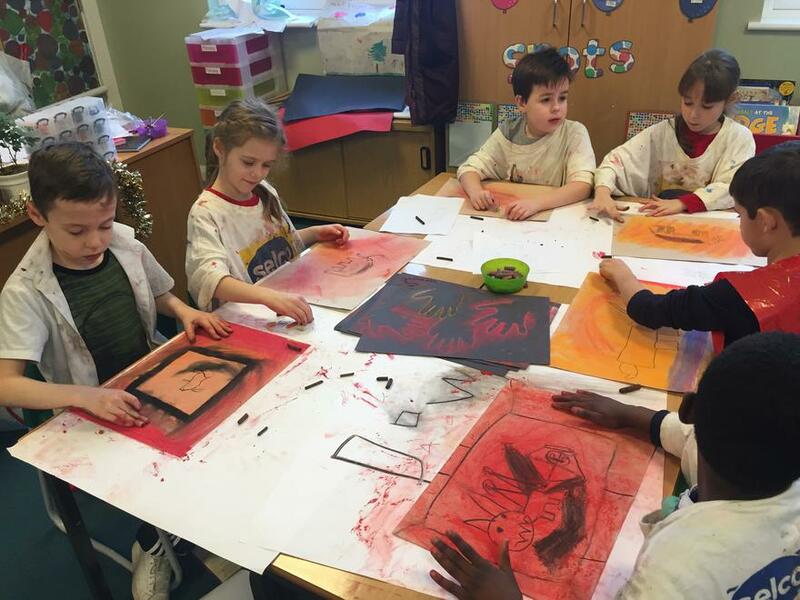 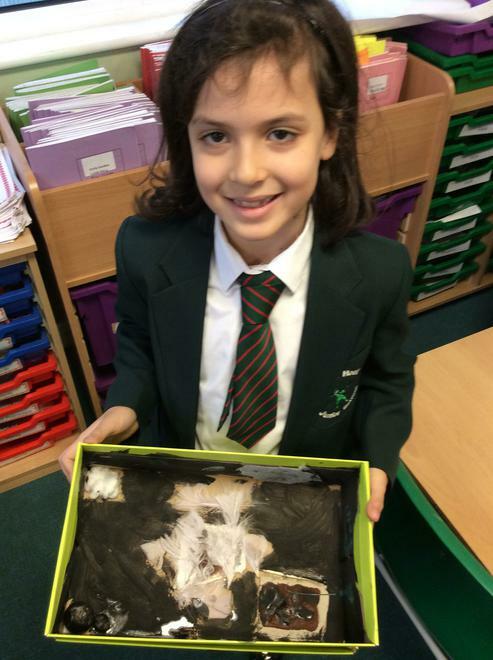 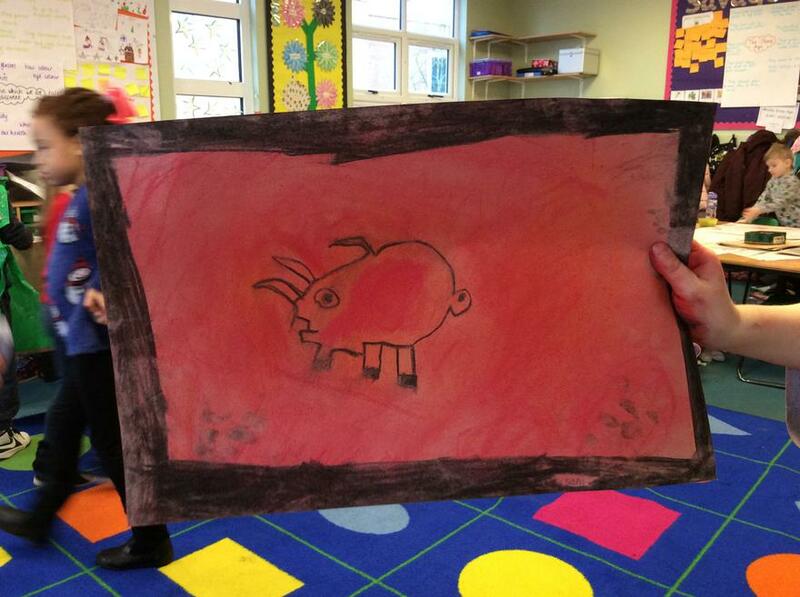 We then had a go at making a hand stencil and animal cave painting using chalk pastels and charcoal. 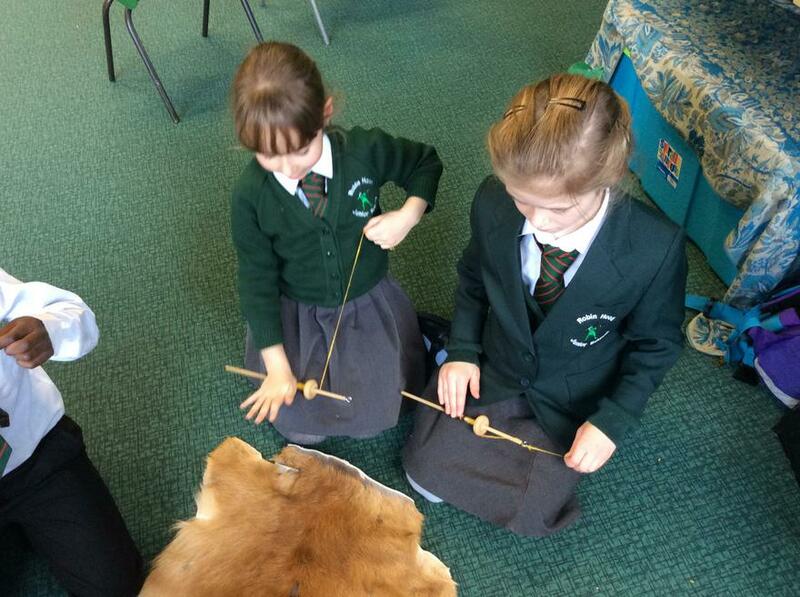 We even tried smudging them to give them the blowpipe effect! 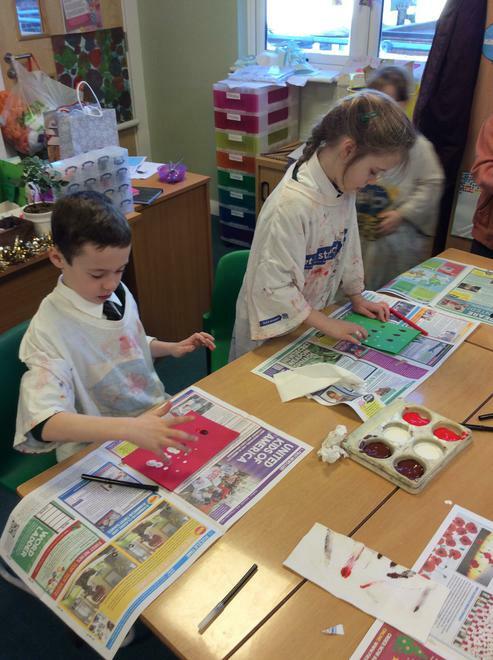 It was lots of fun and we all did a brilliant job! 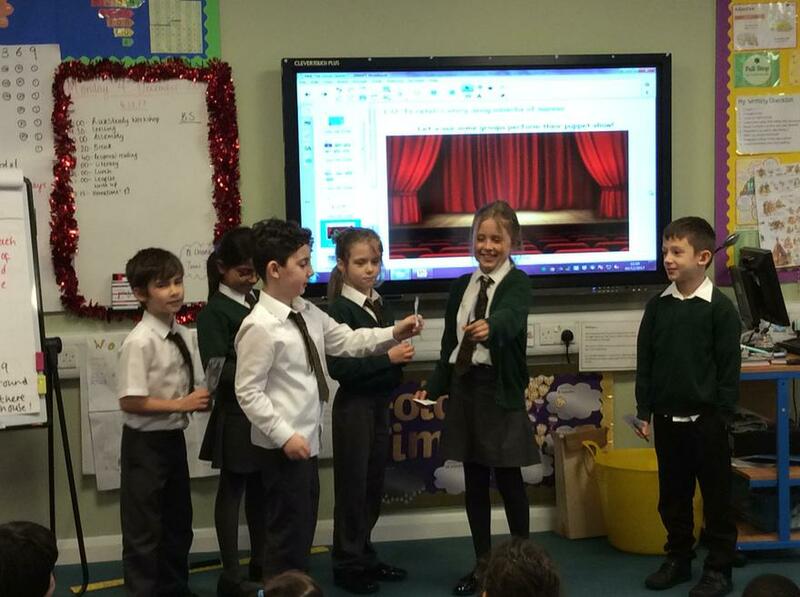 Today we rounded off our RE topic of Christmas by talking about the value of giving and how it is nice to think of others during this time of year. 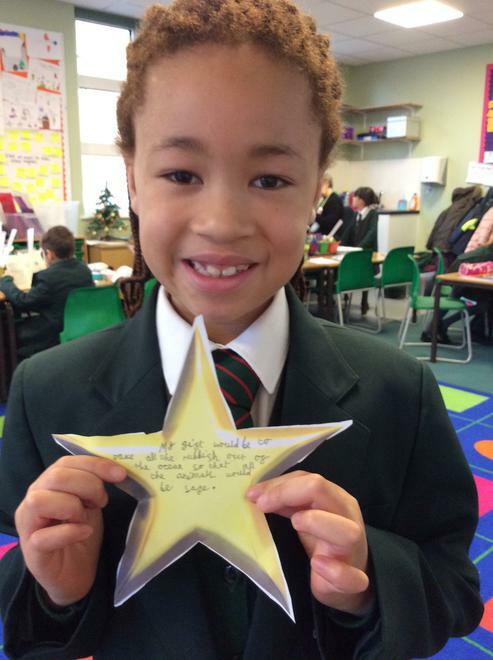 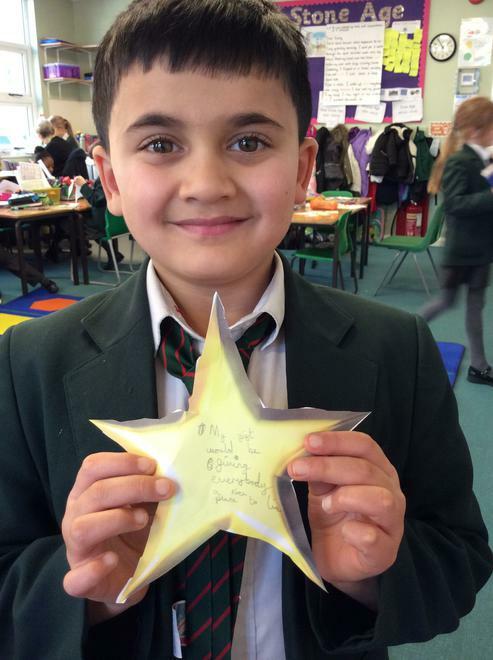 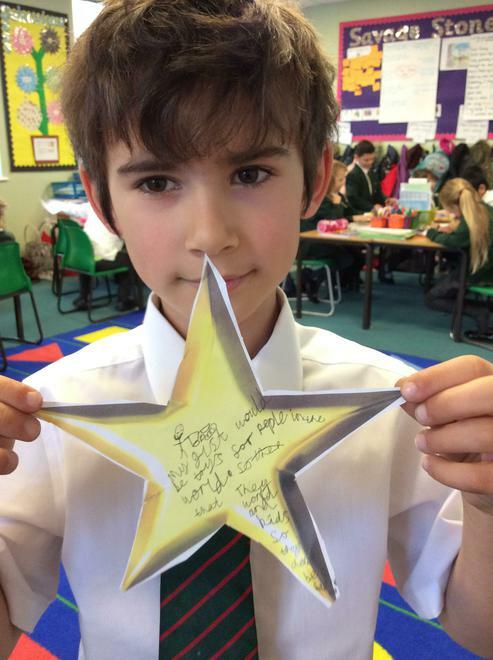 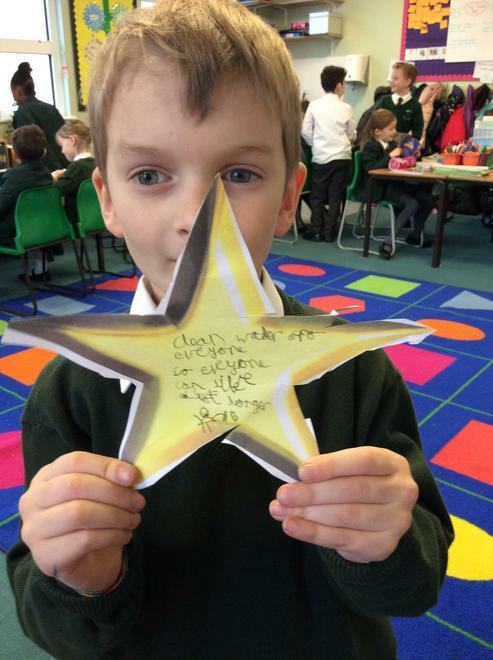 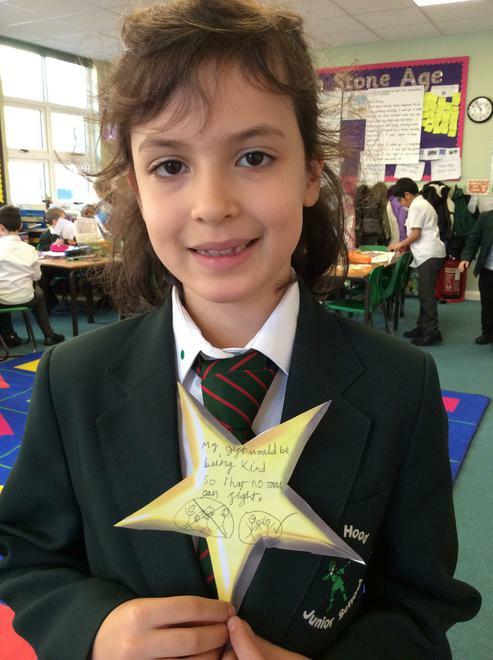 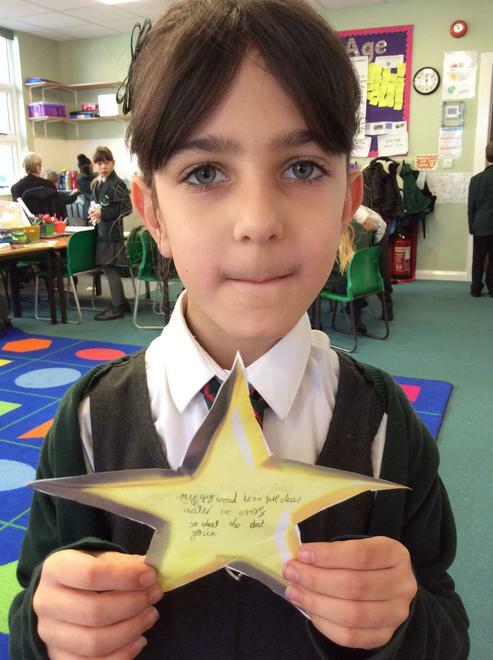 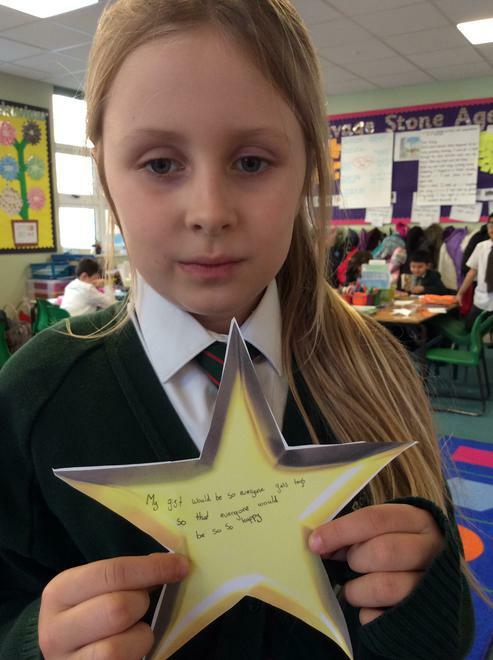 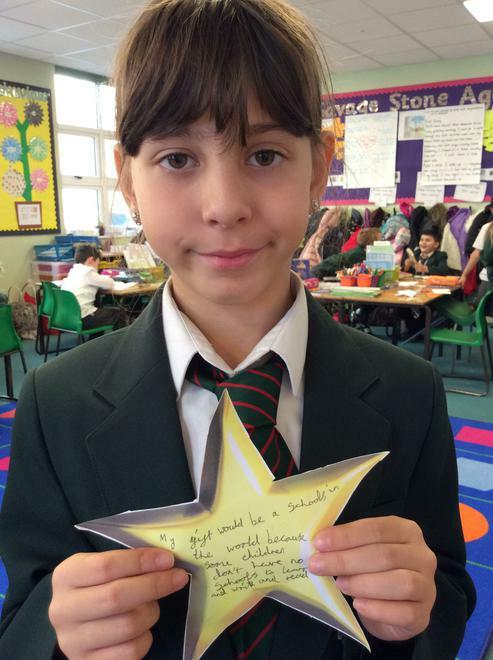 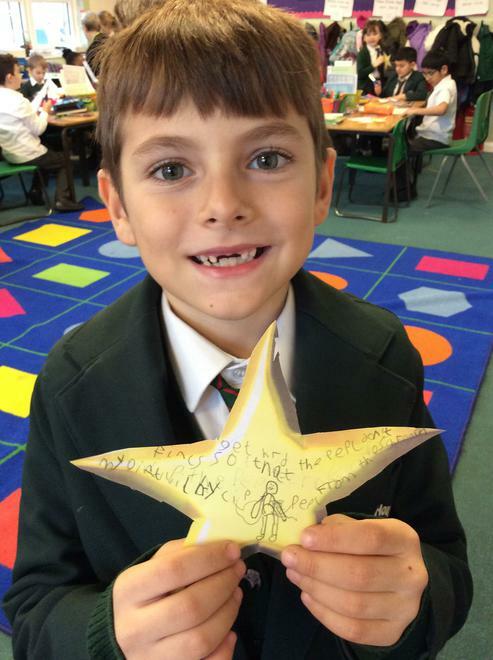 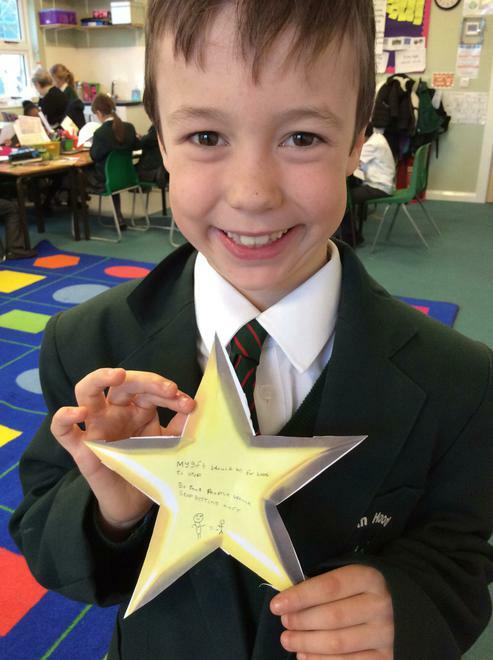 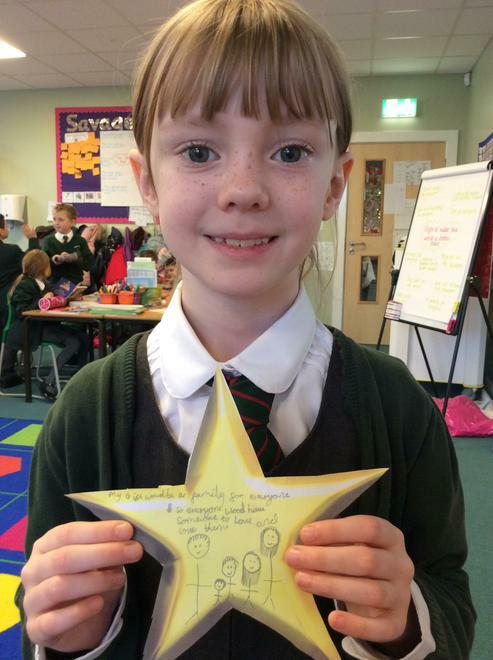 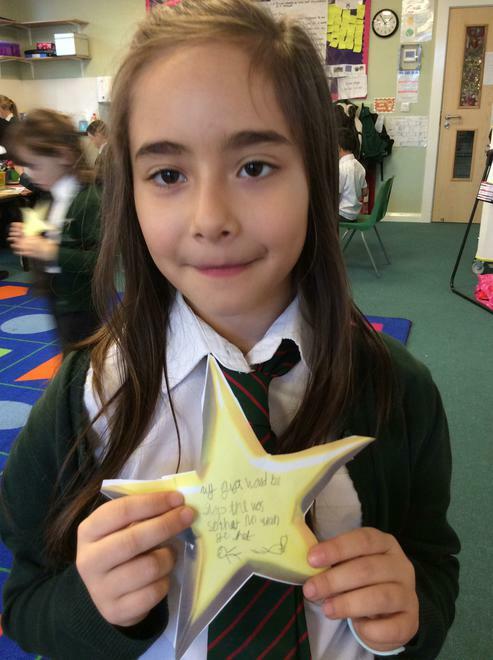 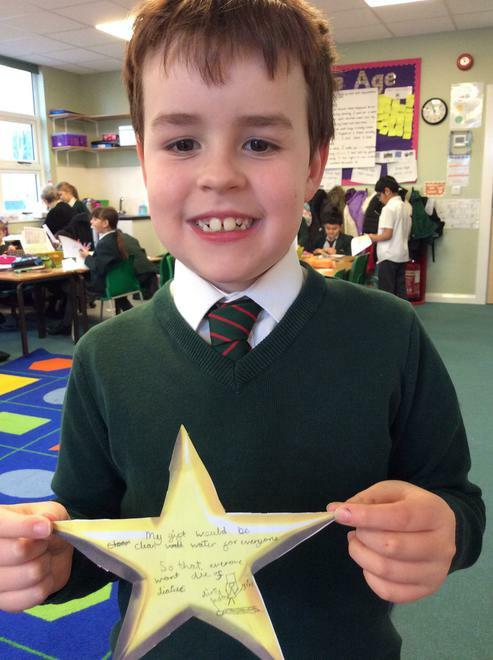 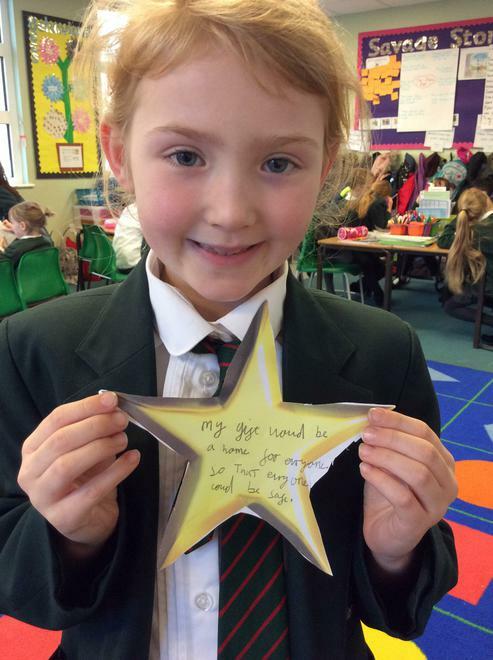 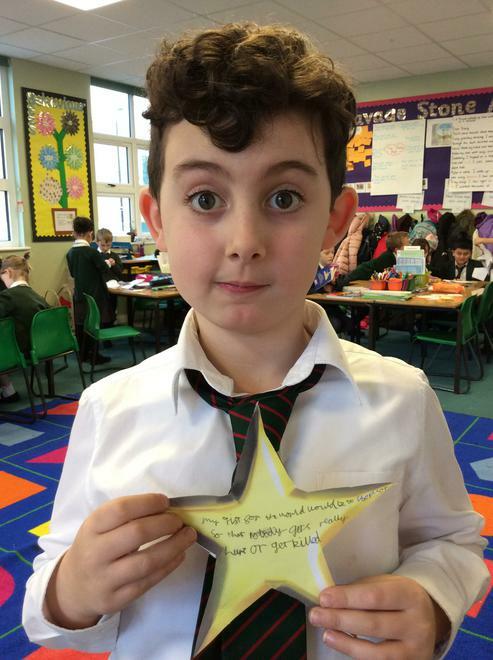 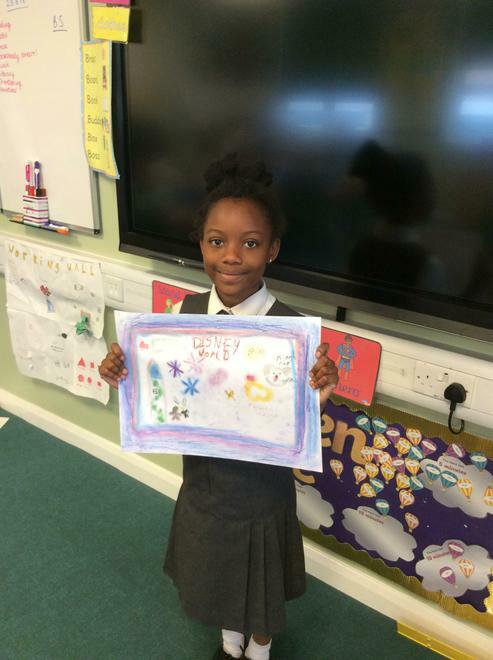 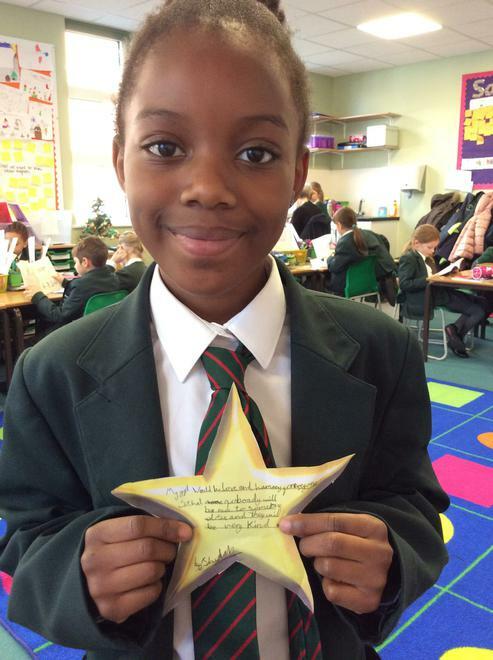 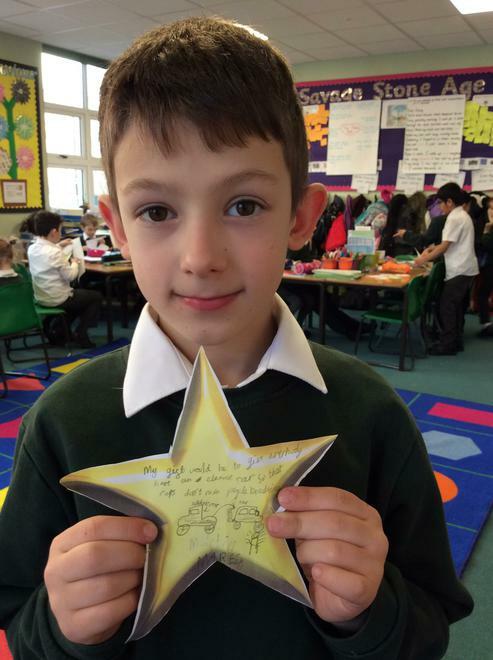 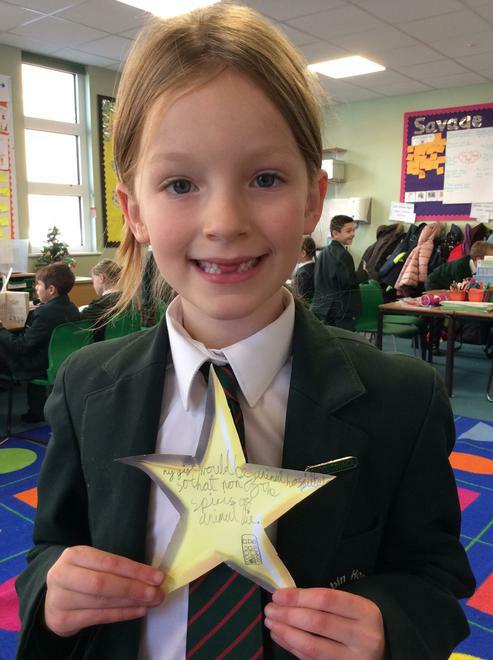 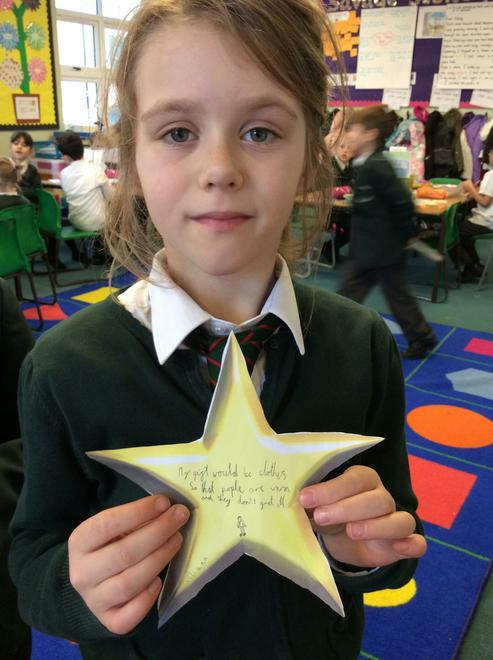 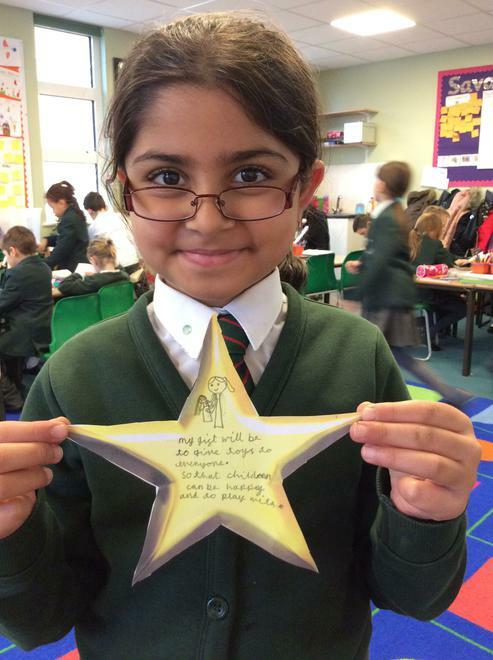 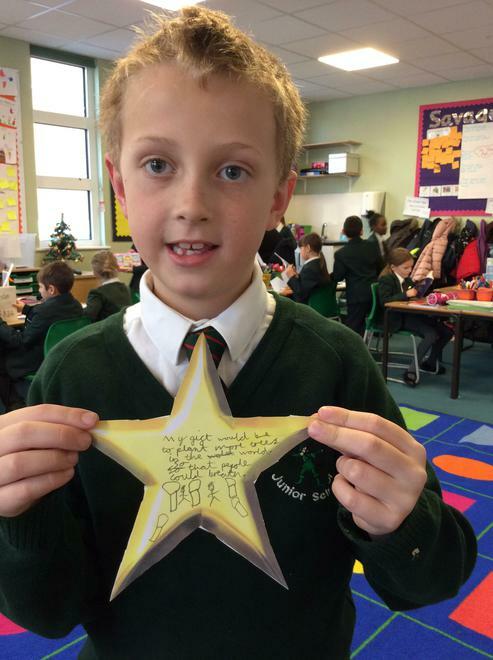 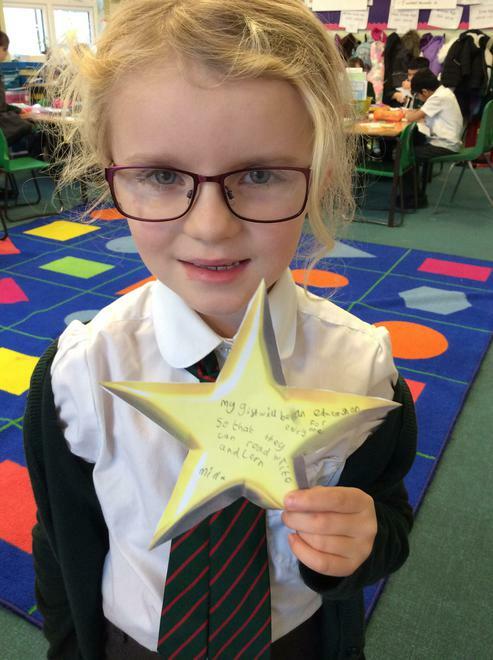 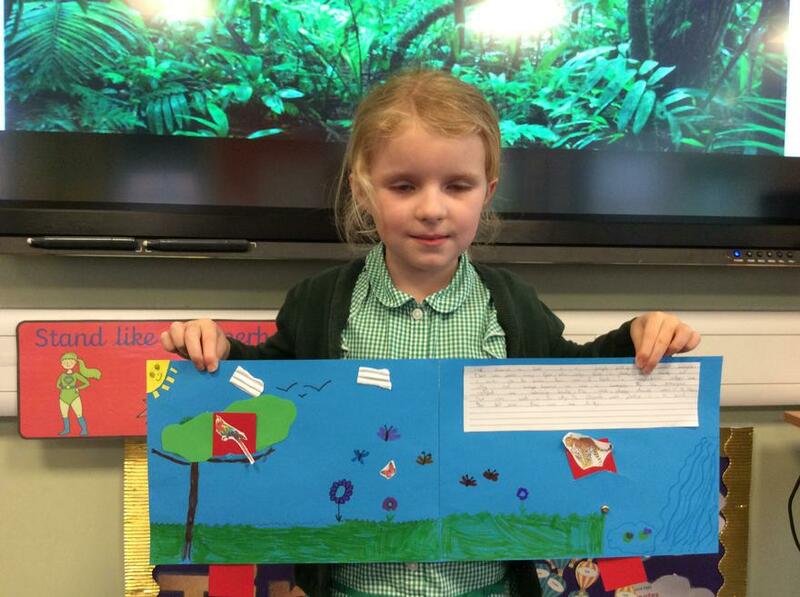 We looked at the question: 'If you could give the world one gift at Christmas to make it better, what would it be?' 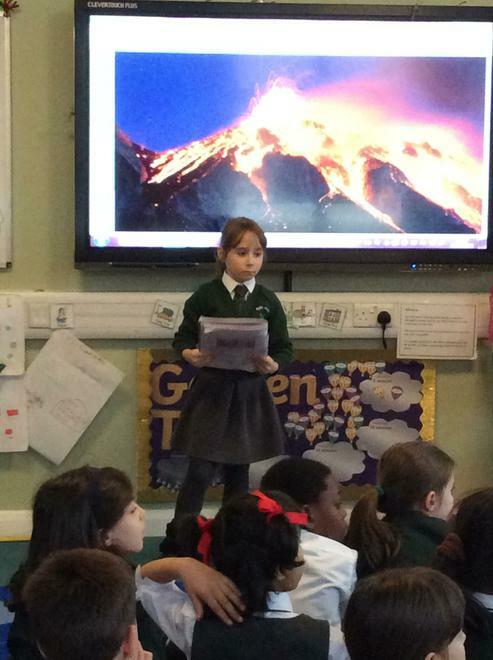 and thought really carefully about all the different things that would make the world a better place. 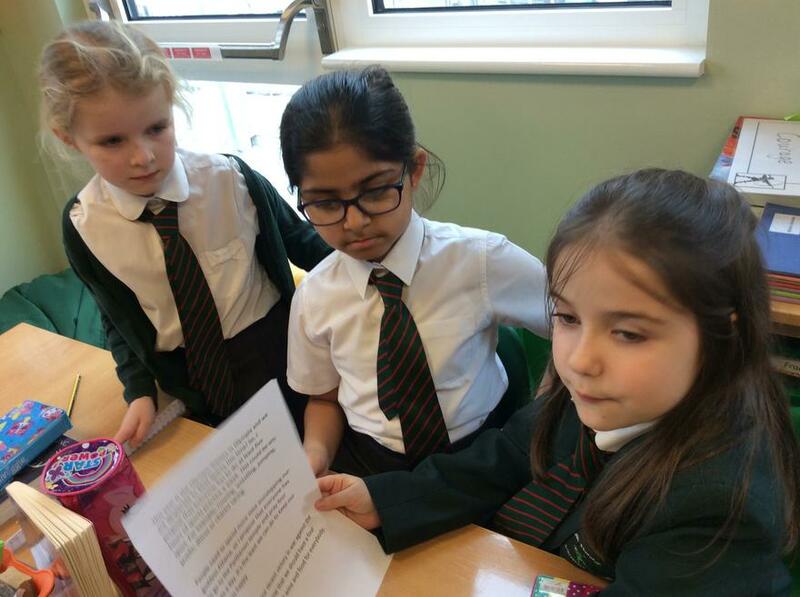 We came up with some wonderful ideas such as: giving food and clean water to all the people and animals so everyone is healthy, stopping wars in the world to make sure everyone is safe, giving toys to all children so they could be happy. 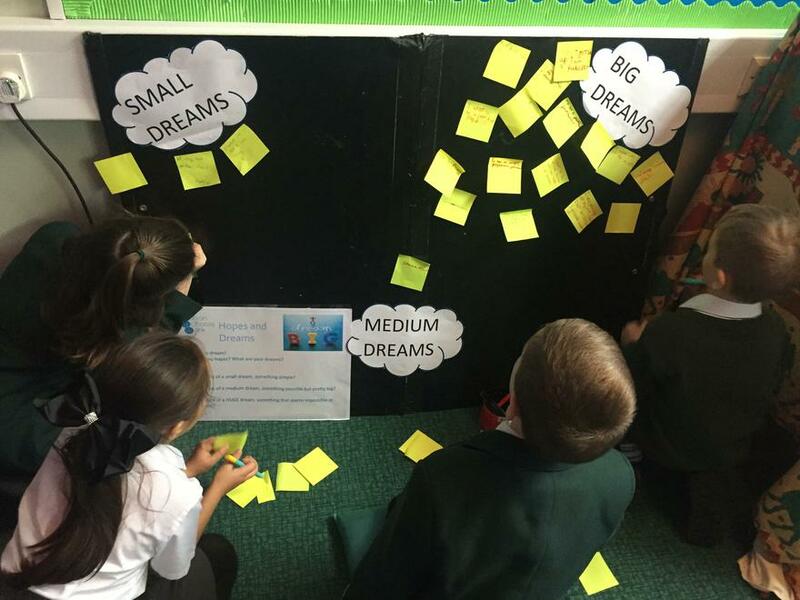 Here are a few of our lovely ideas! 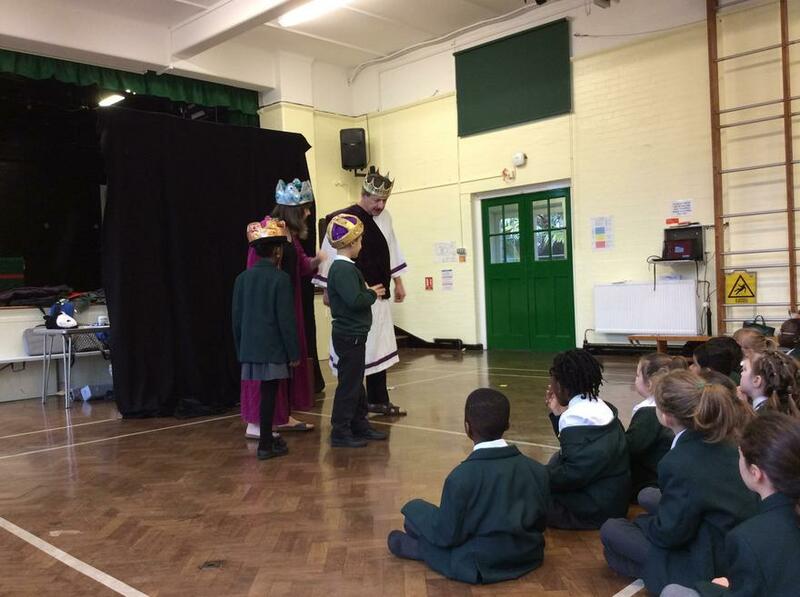 Last Friday we enjoyed a wonderful performance of 'The Snow Queen' and as it was so fantastic, this is our focus in Literacy this week. 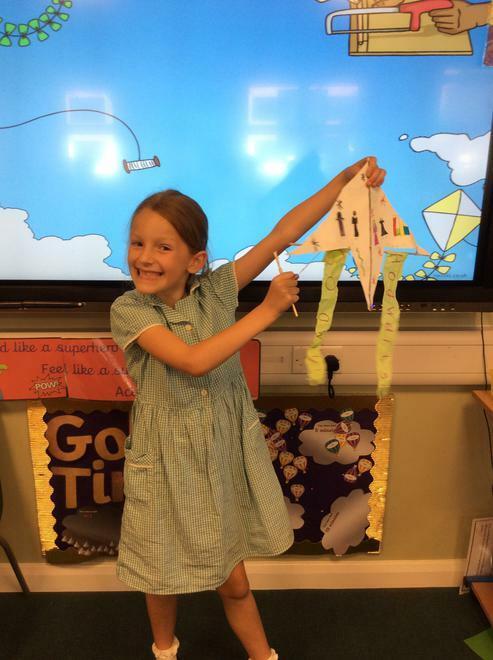 Today, we started the week off by reading and sequencing the story to refresh our memories and then used puppets to retell the story in our own words. 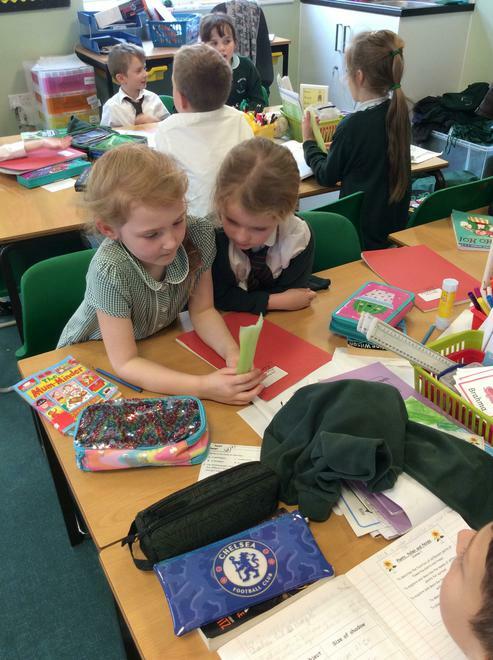 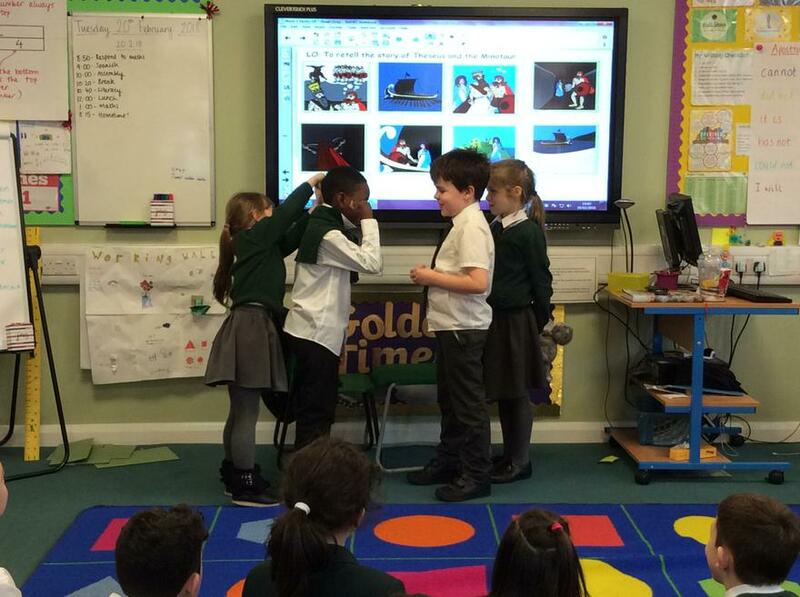 We had lots of fun working in groups and enjoyed performing our puppet shows to the rest of the class at the end of the lesson! 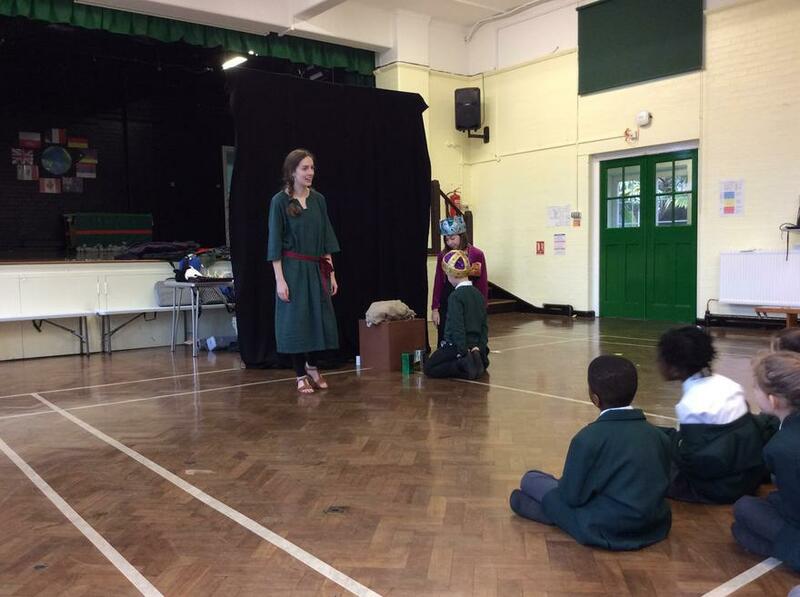 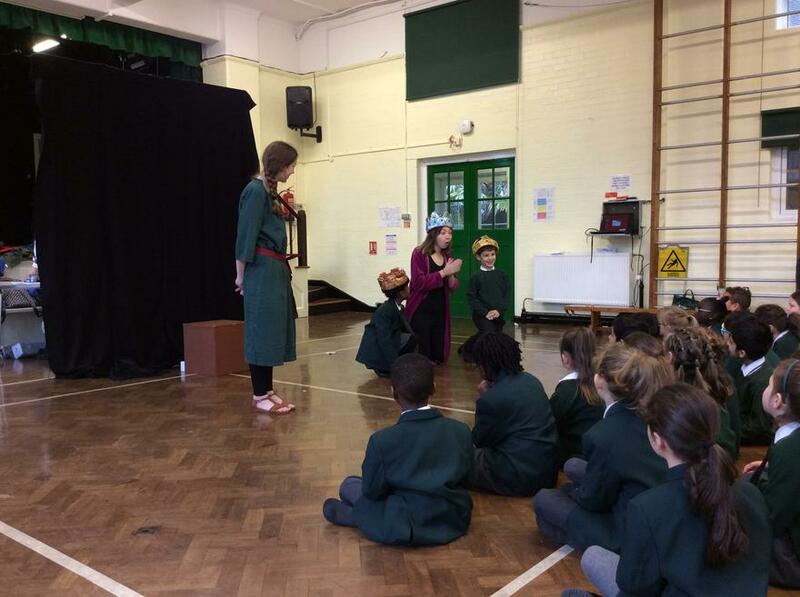 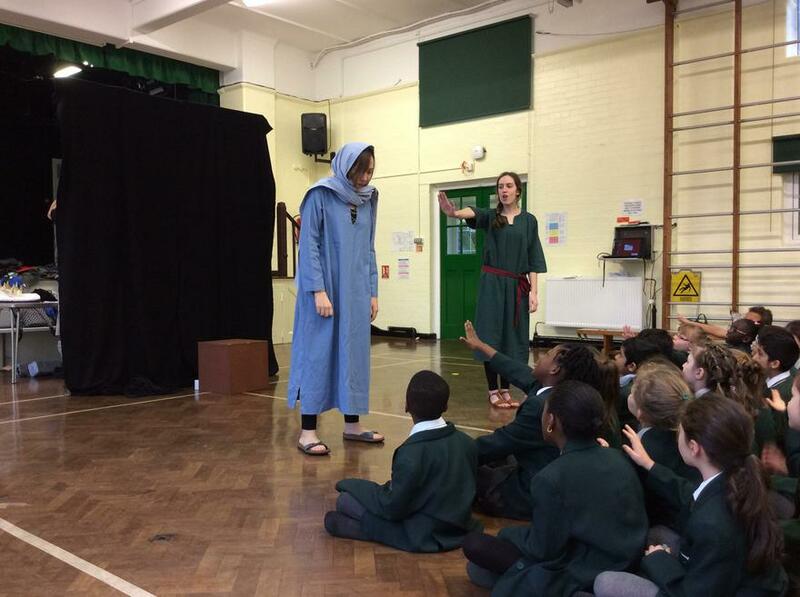 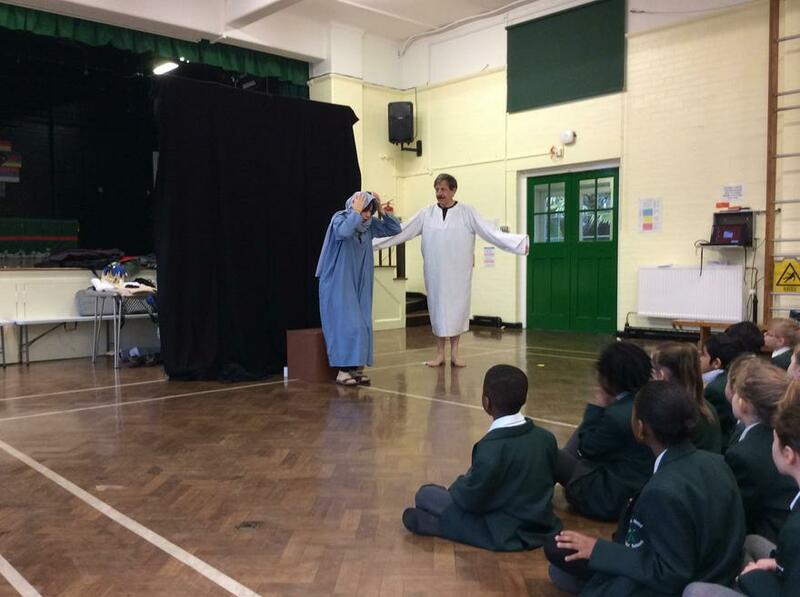 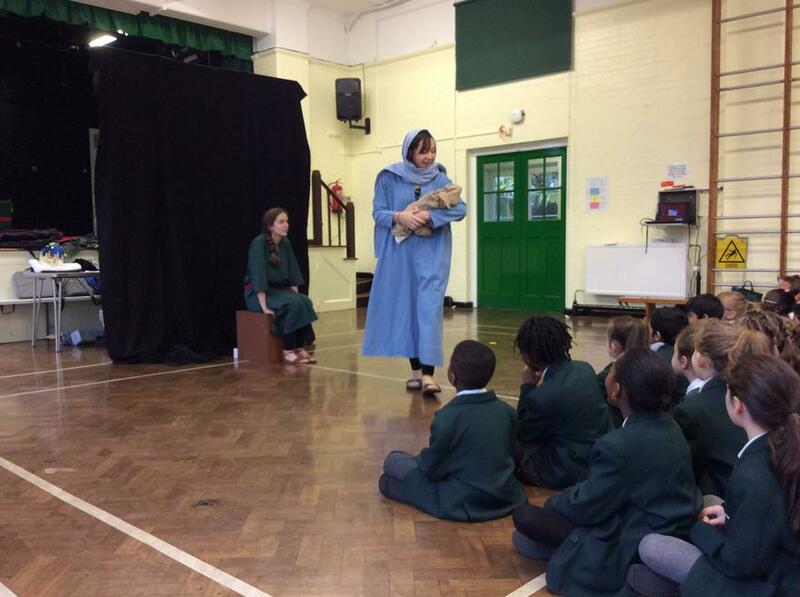 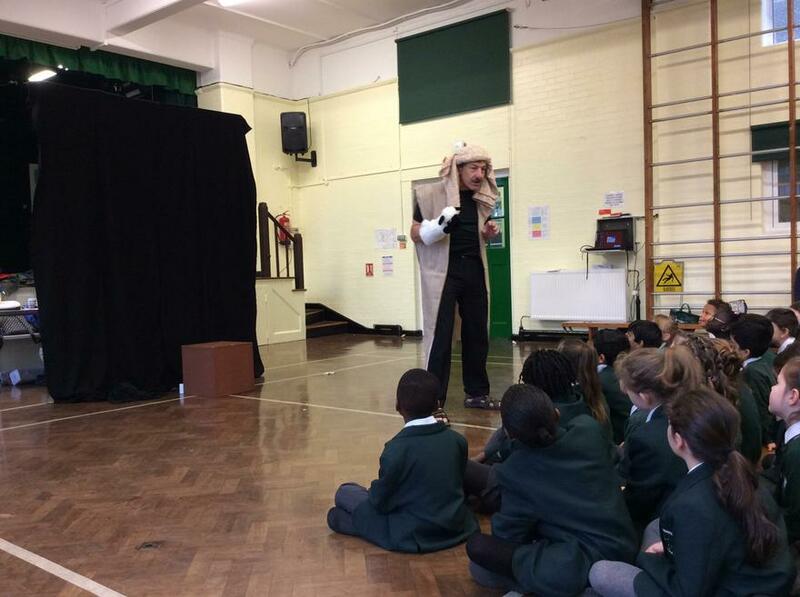 This week we were lucky enough to receive another visit from Sutton Schools Work, where we were treated to a performance of the story of Christmas! 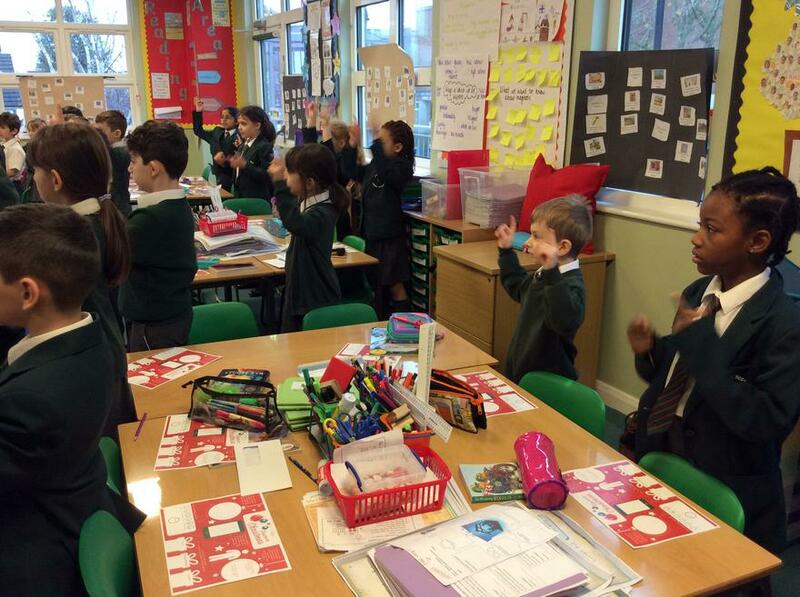 We then went back to class and had lots of fun singing songs, thinking about the story and sharing ideas on how we can show kindness to others at Christmas time! 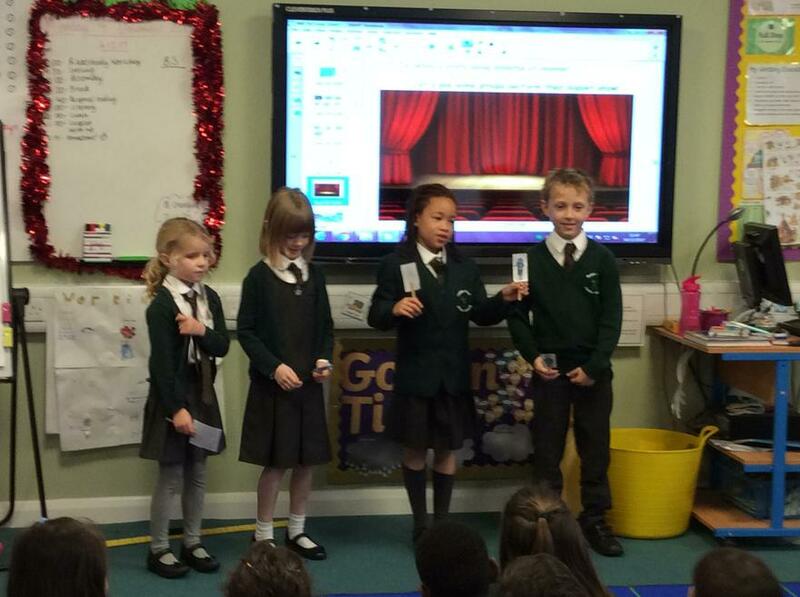 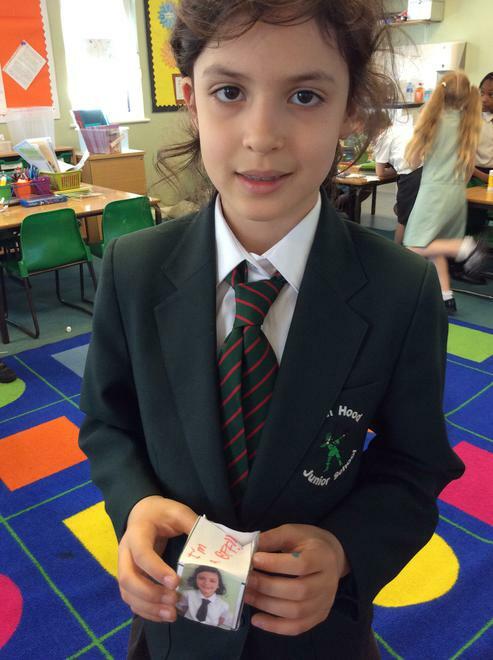 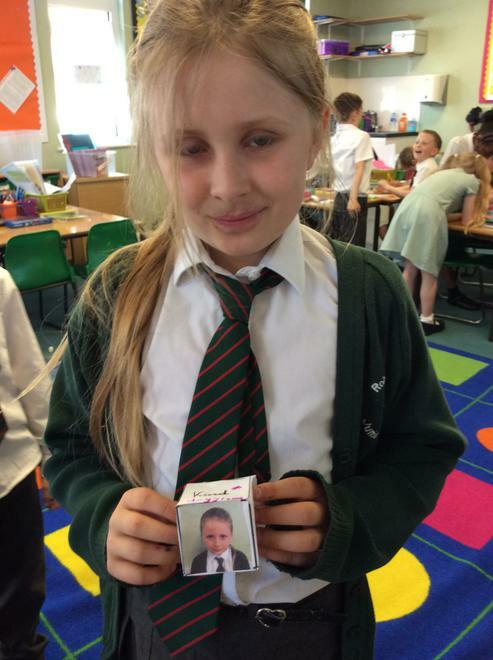 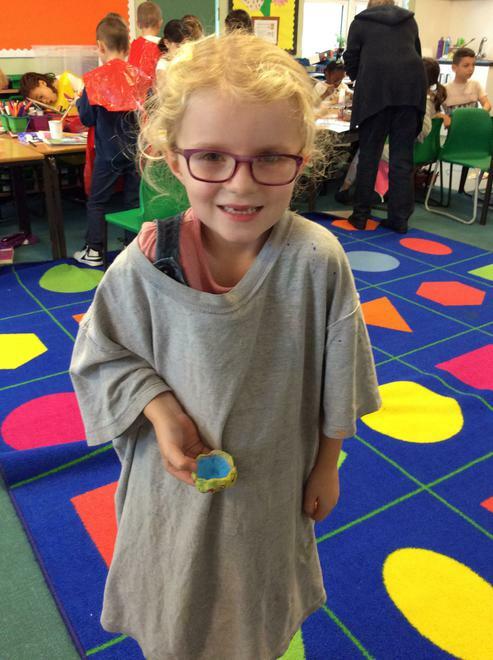 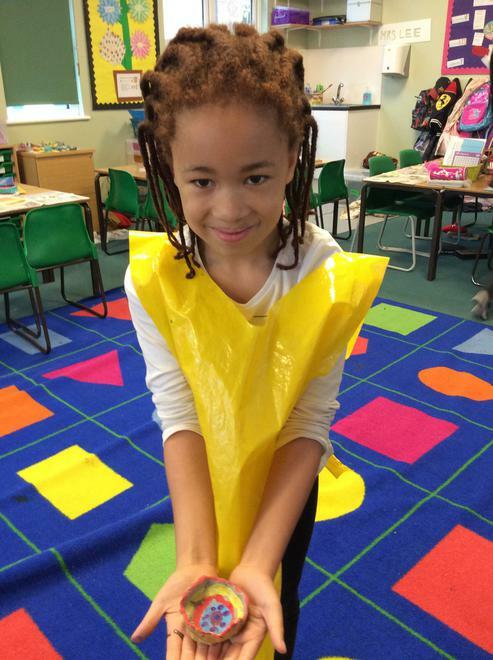 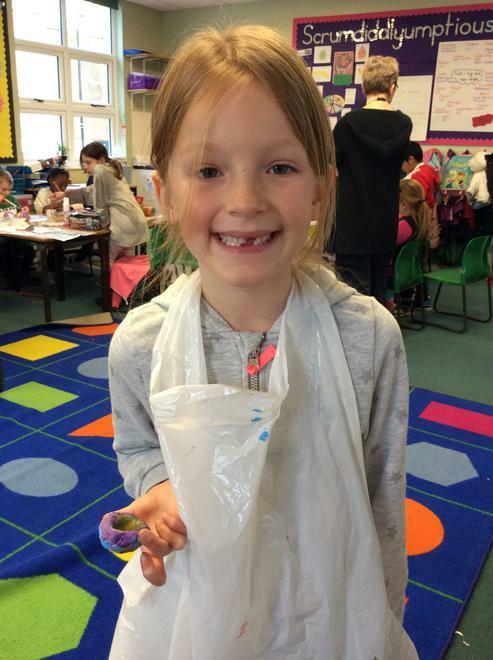 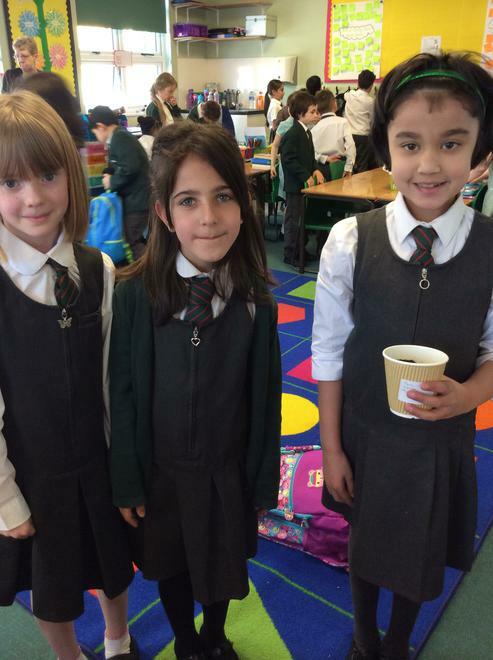 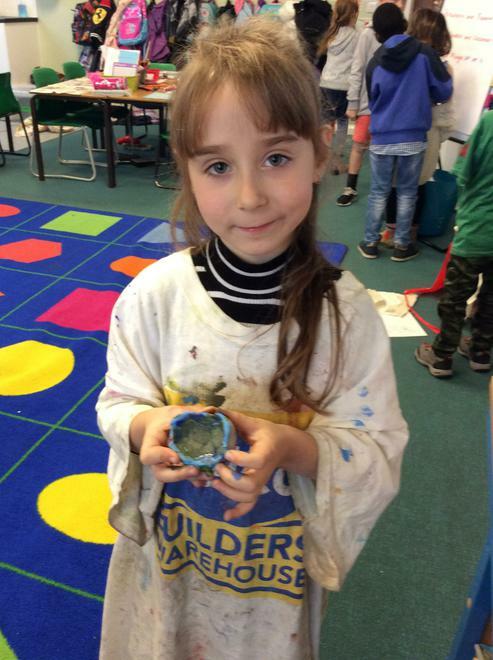 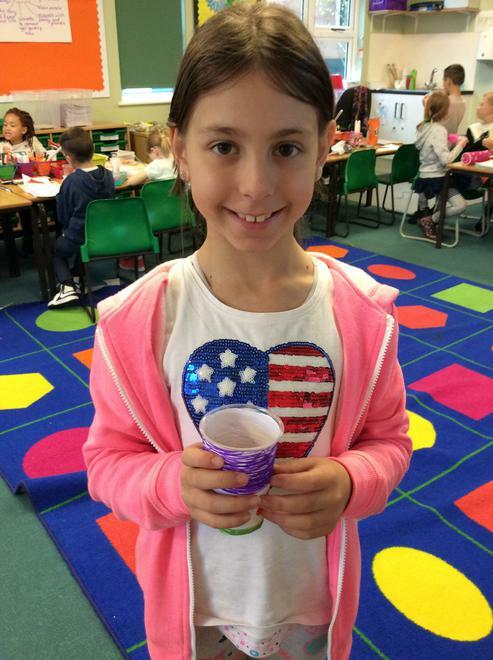 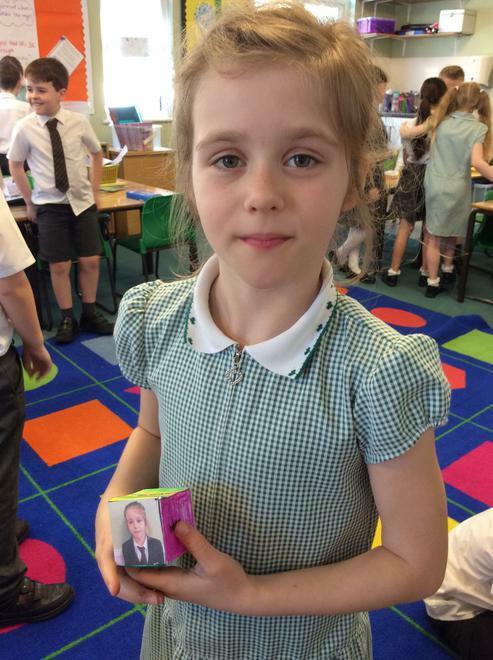 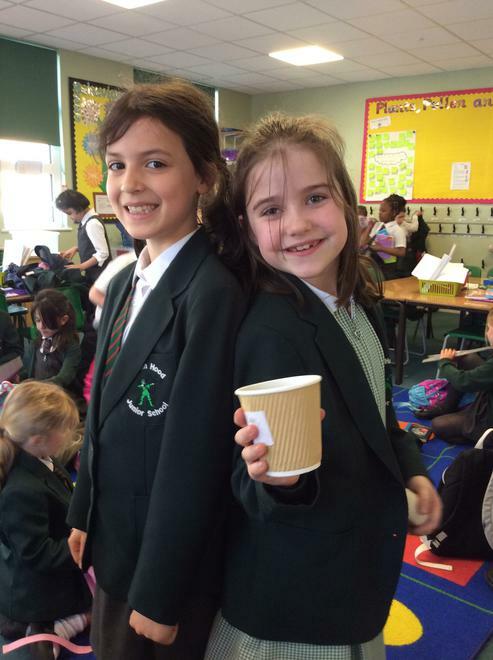 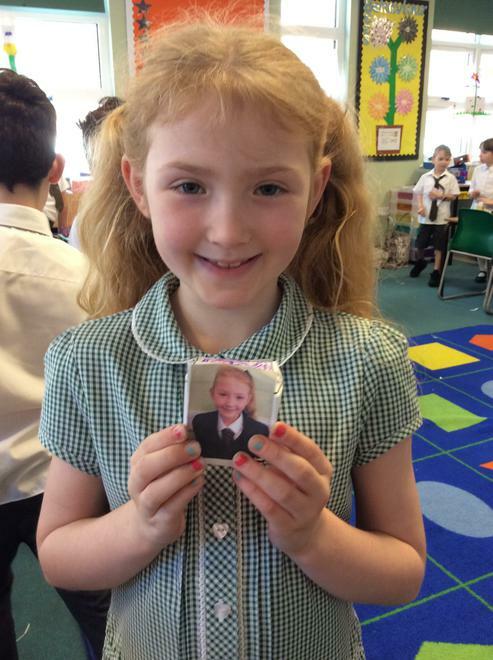 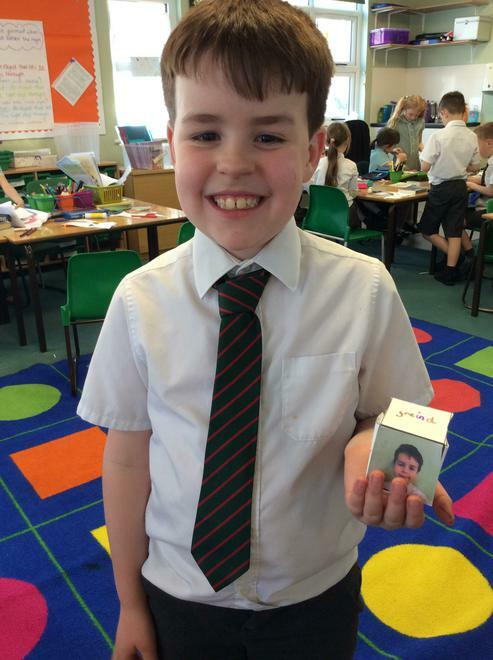 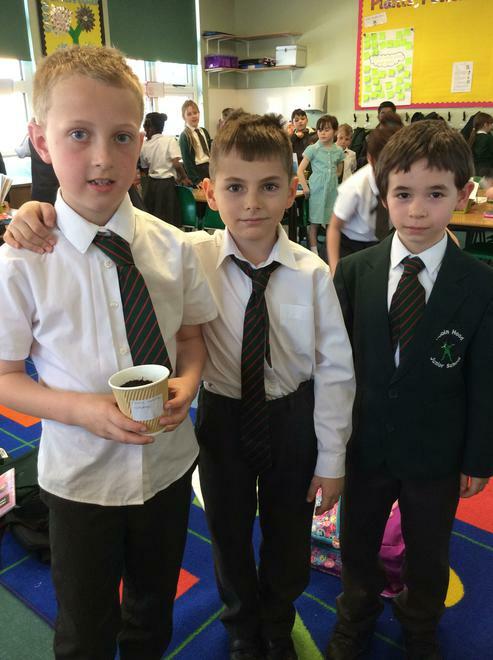 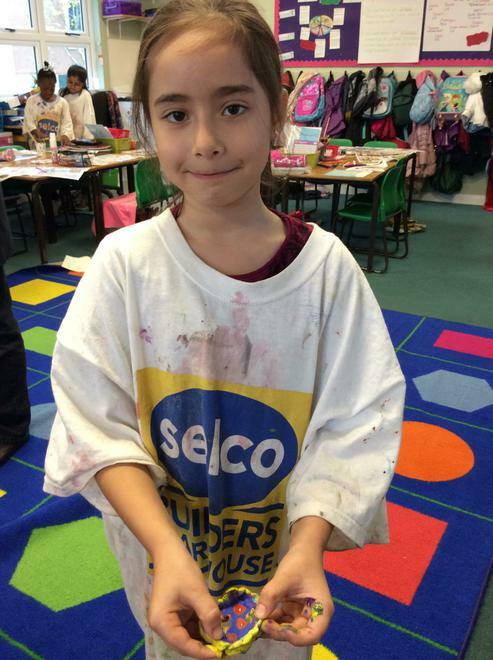 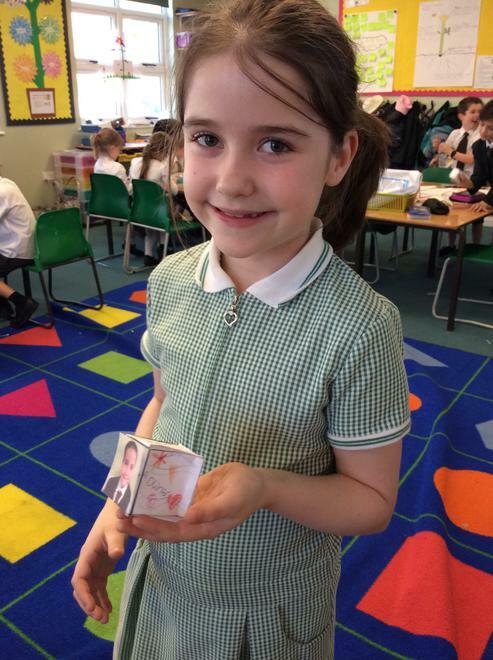 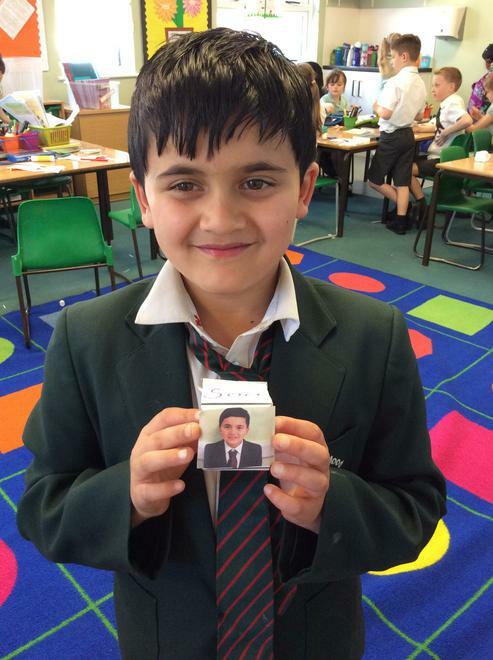 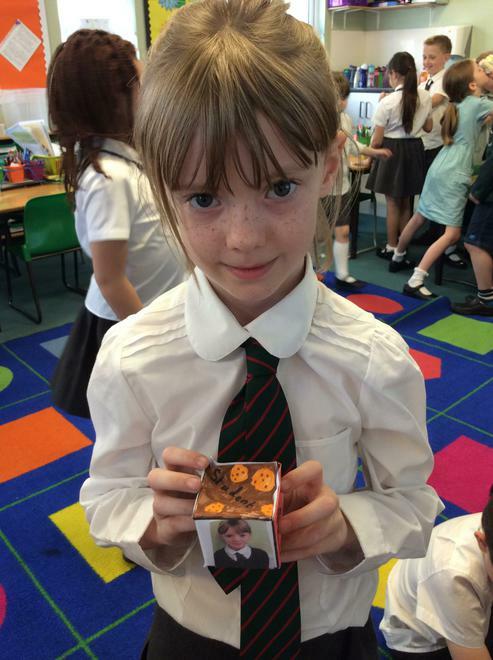 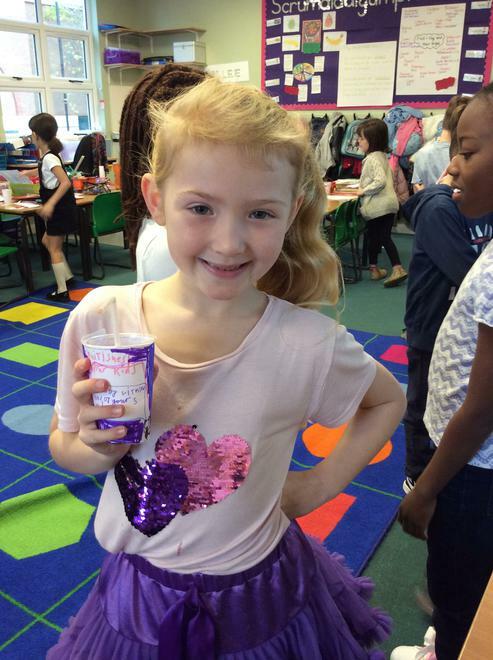 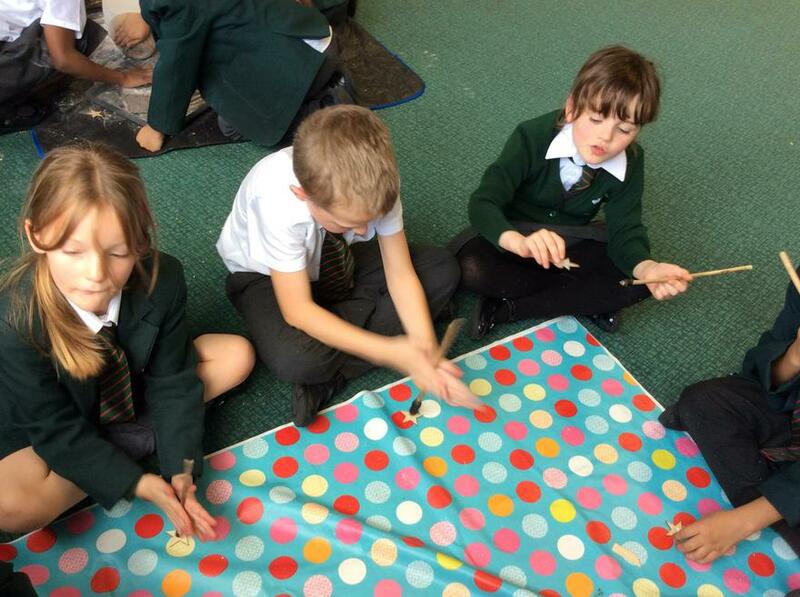 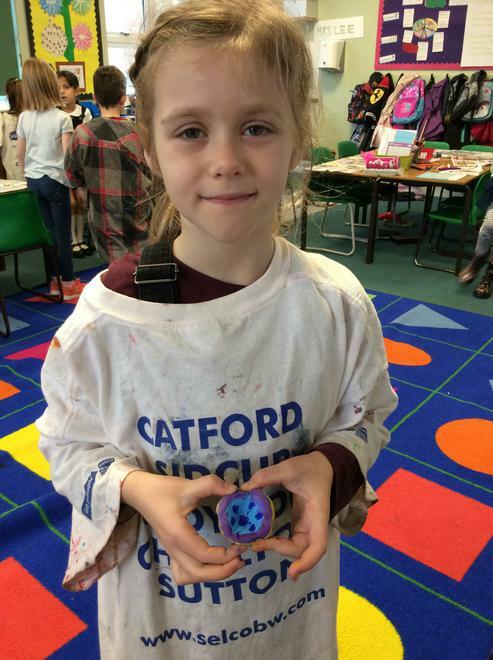 This week we have been collecting silver coins in order to raise money for our new library! 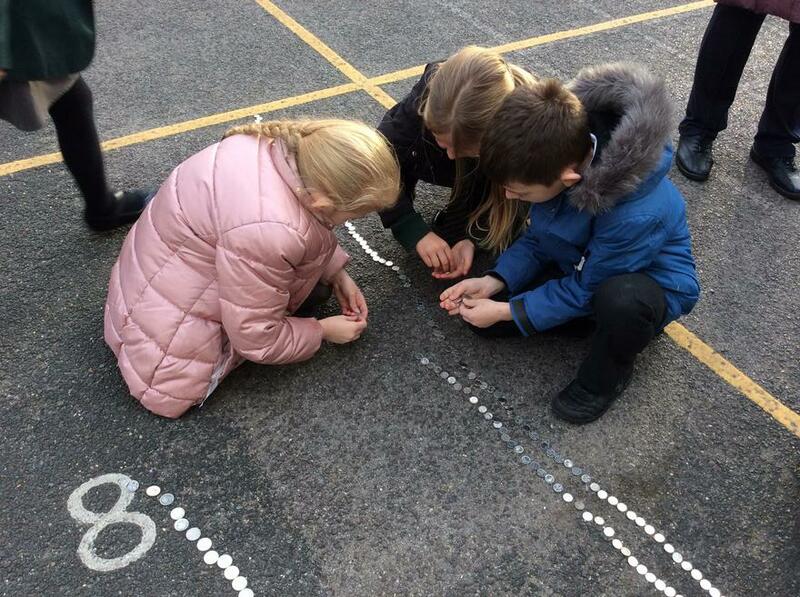 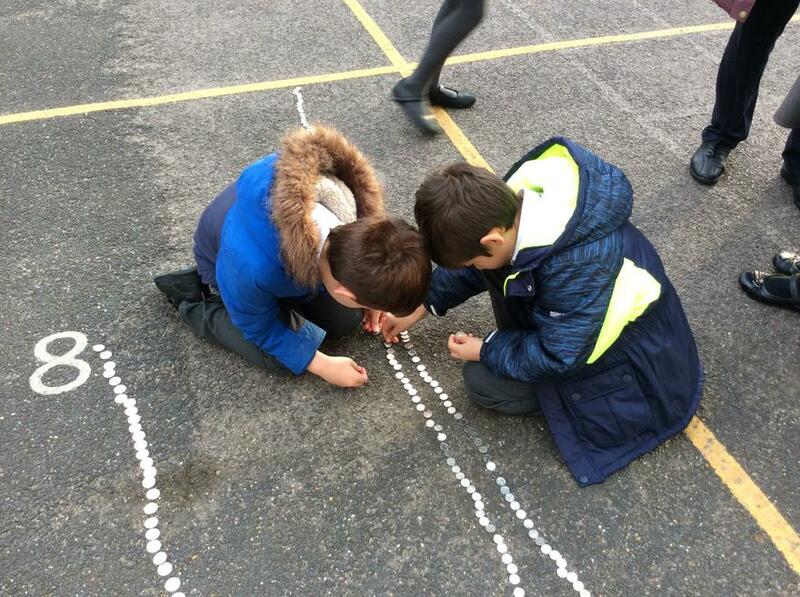 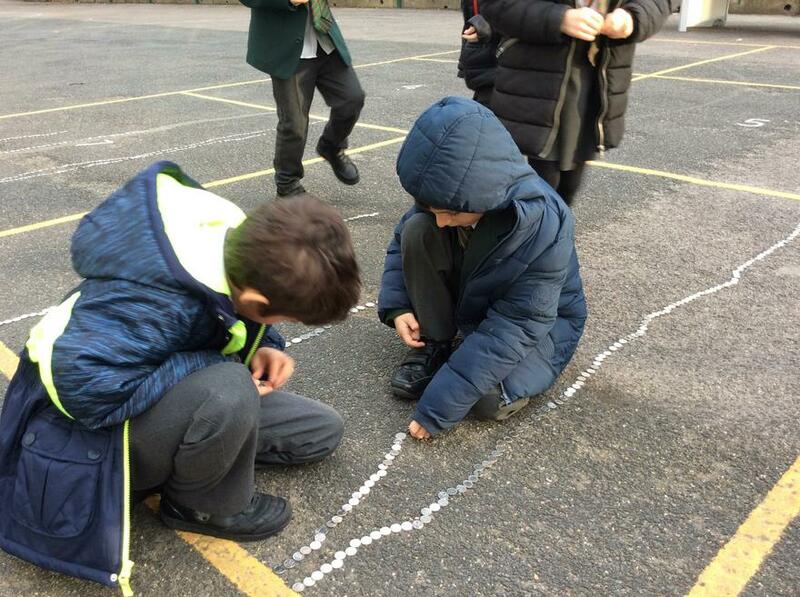 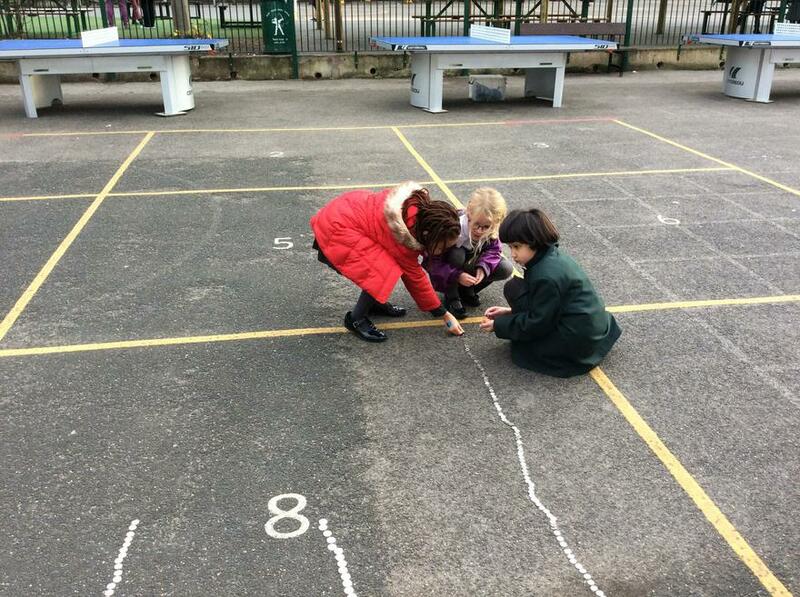 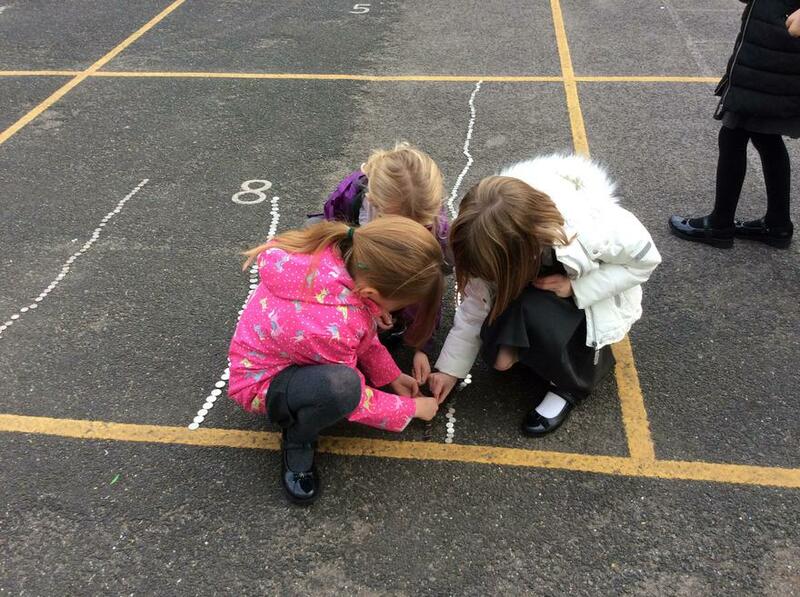 This afternoon we went outside and had fun lining up each of the coins to see how many we had brought in. 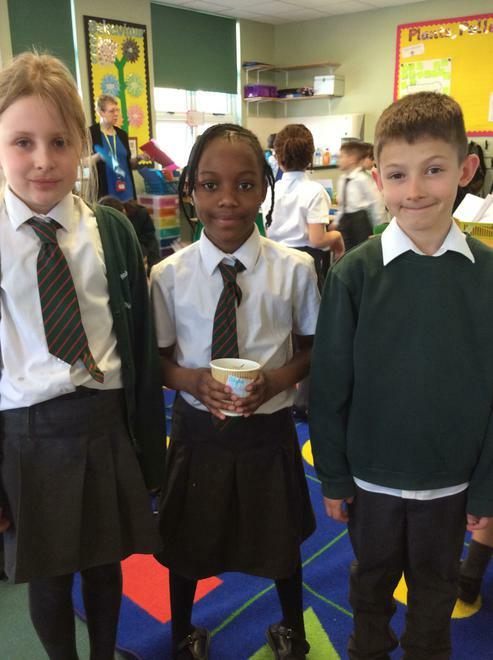 Elm Class managed to raise a fantastic £36.00 altogether just in silver coins! 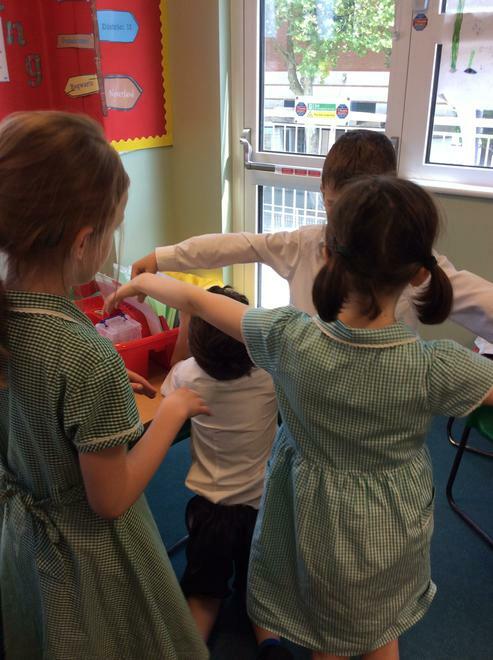 Thank you to everyone who has brought in coins this week, we have had an amazing effort from the whole class and we are proud of you all! 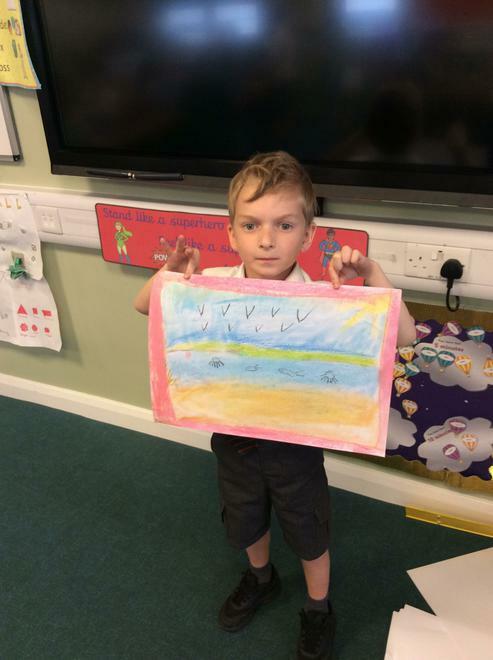 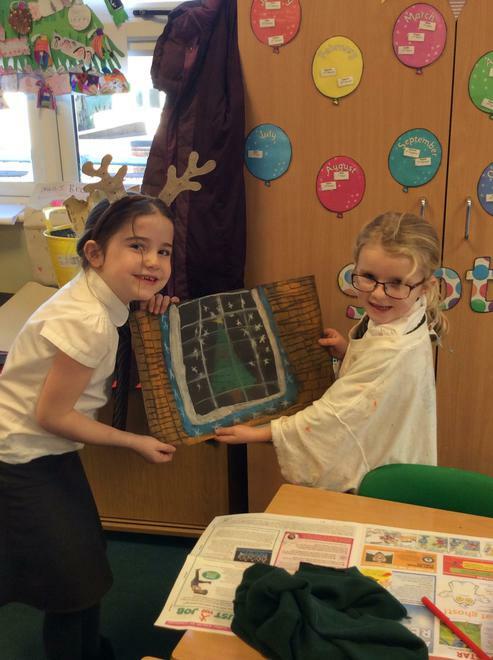 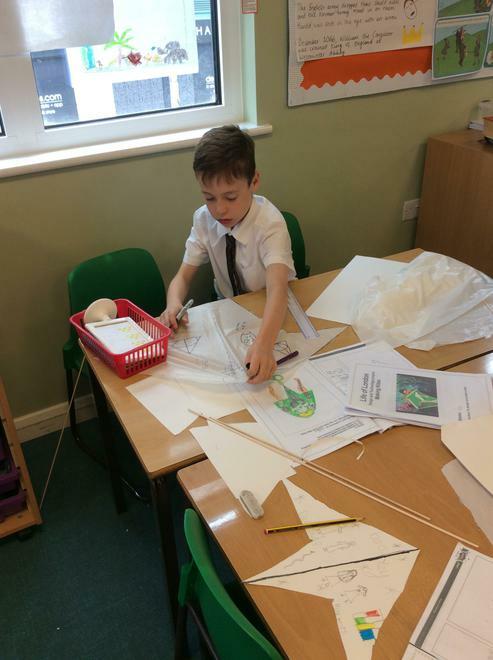 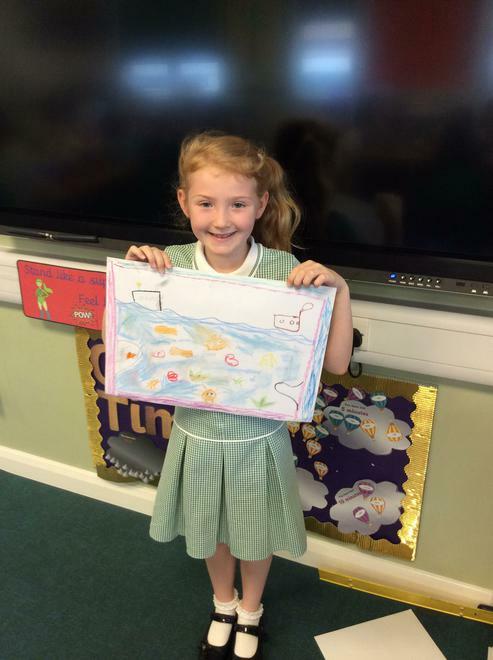 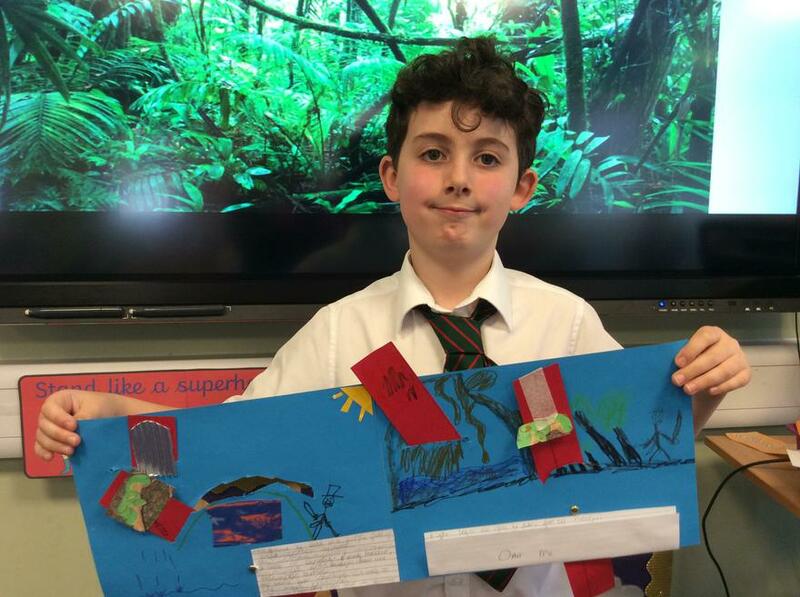 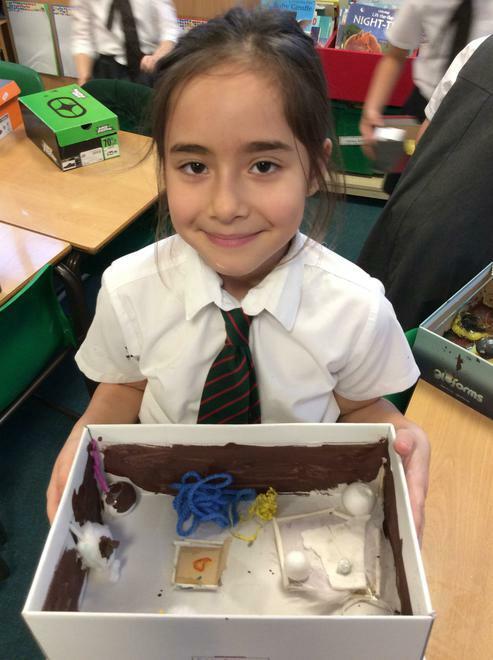 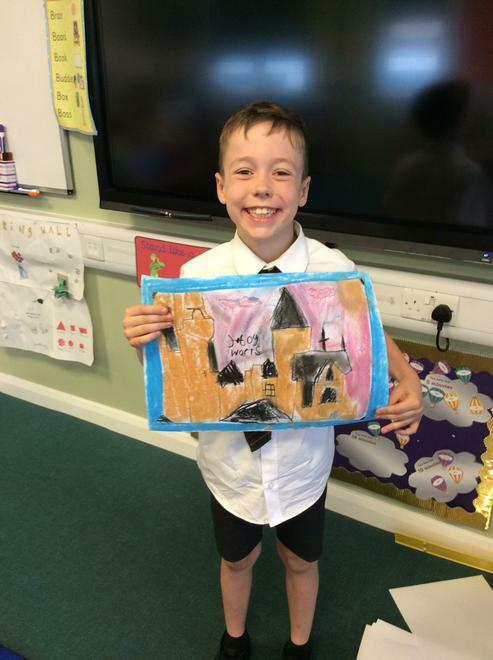 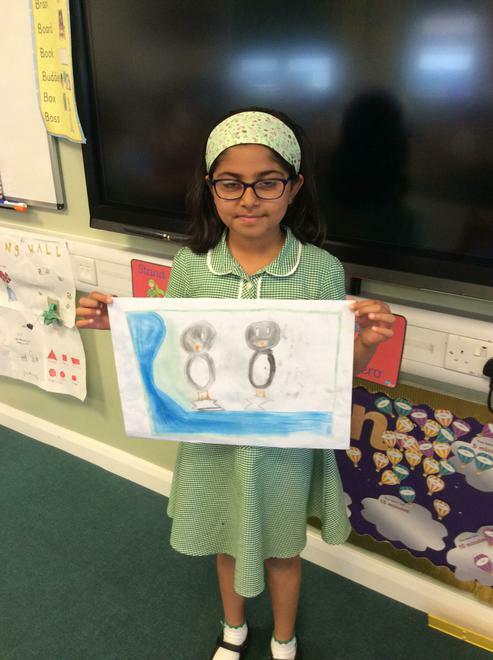 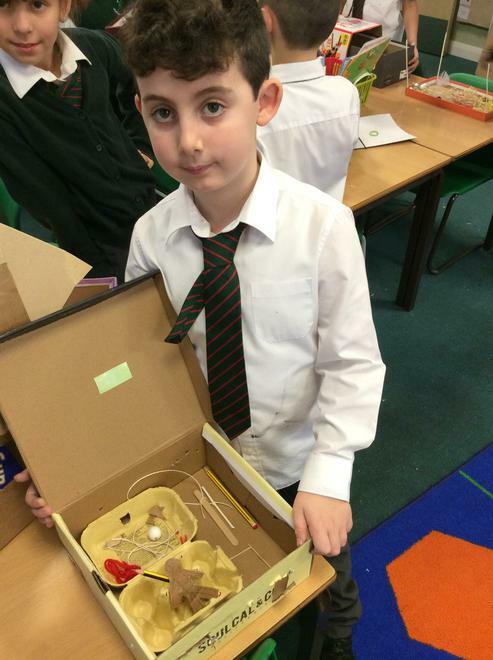 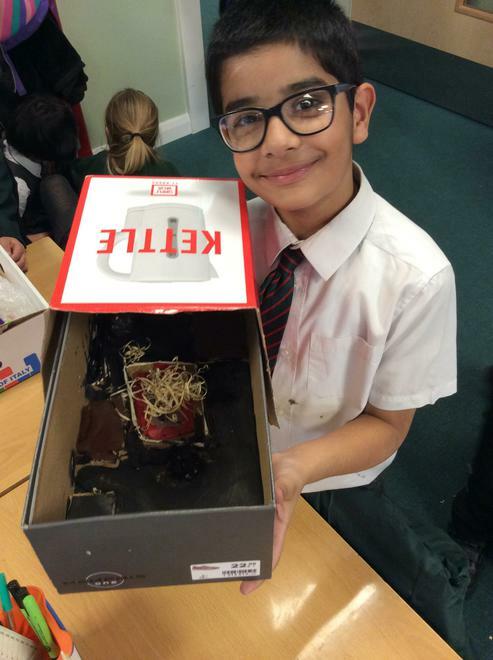 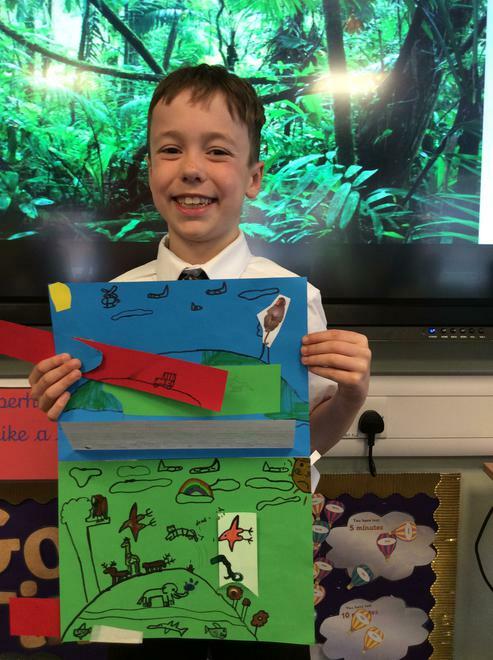 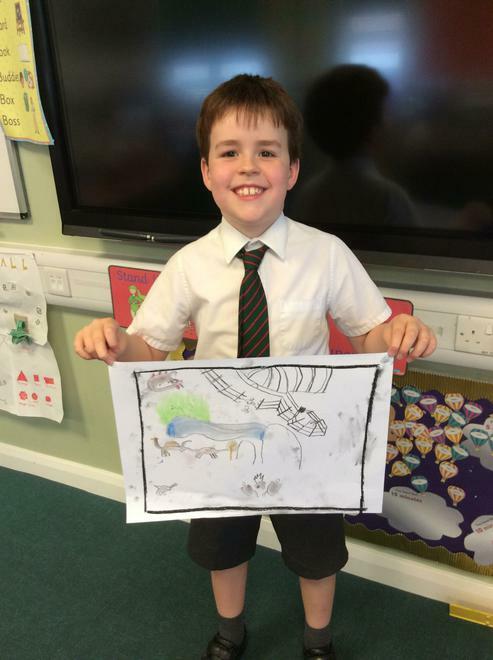 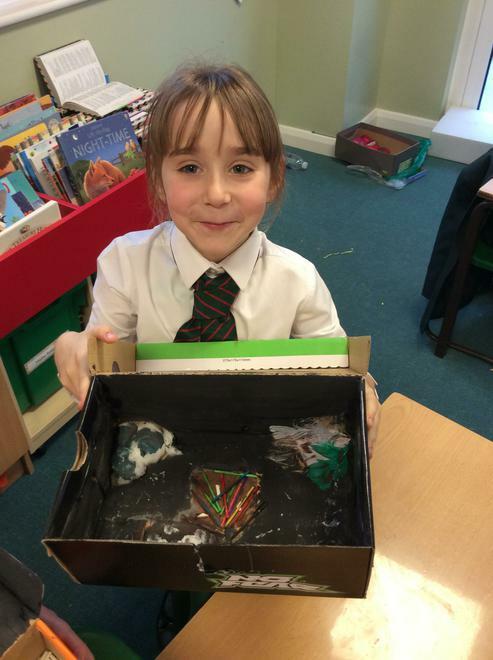 Over the last couple of weeks we have been learning about a Stone Age settlement called Skara Brae, which is in the Orkney Islands in Scotland. 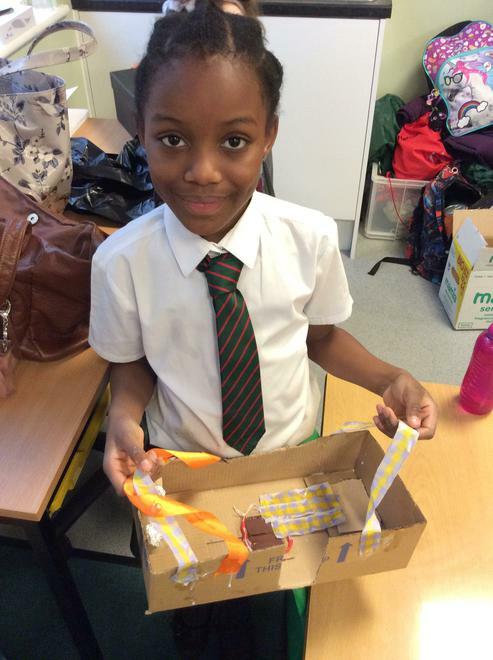 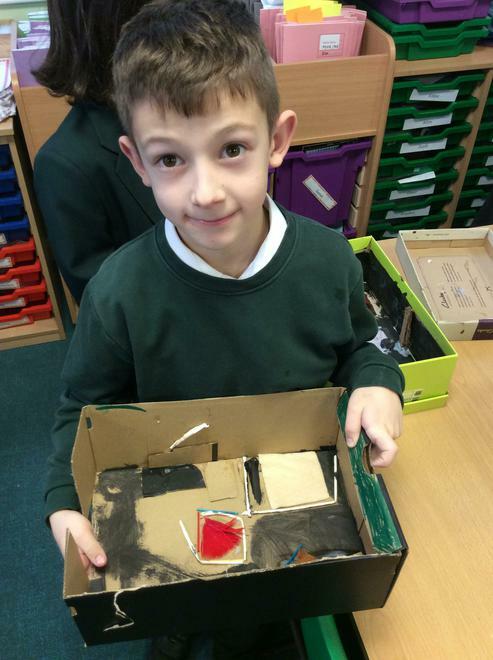 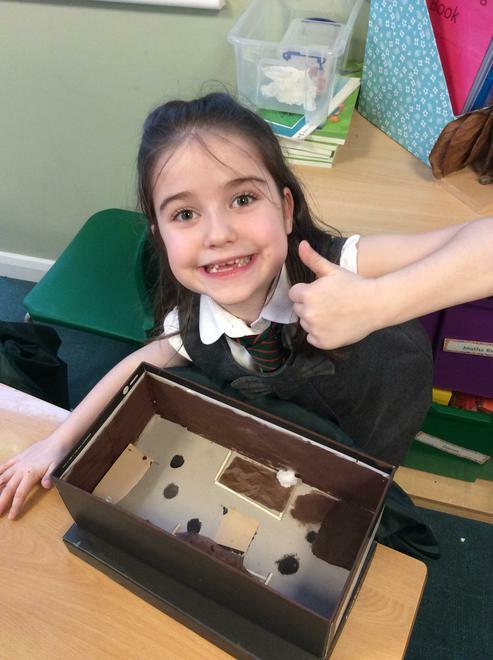 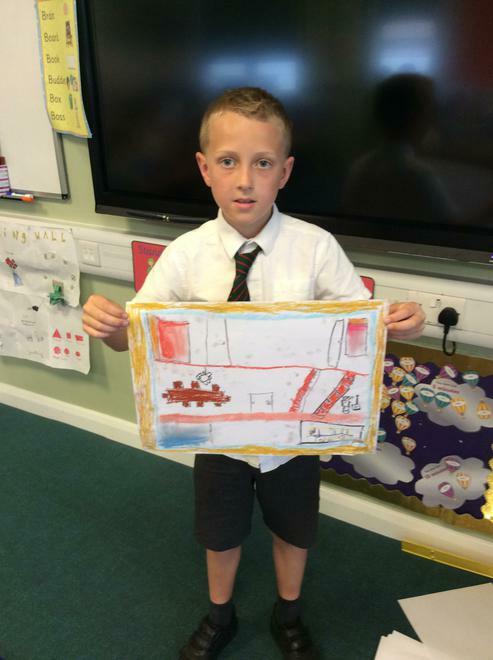 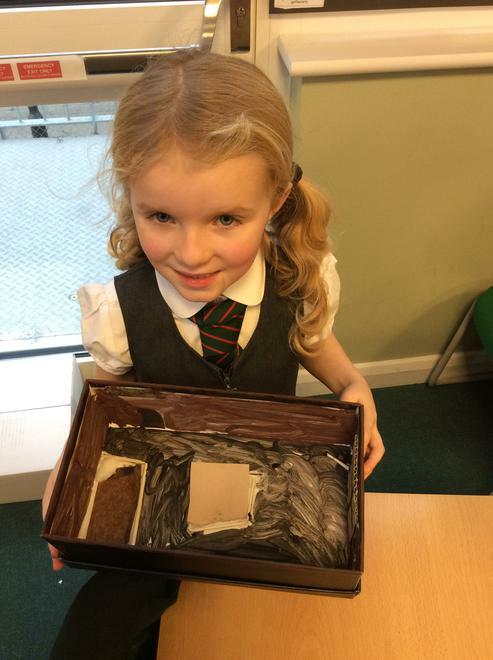 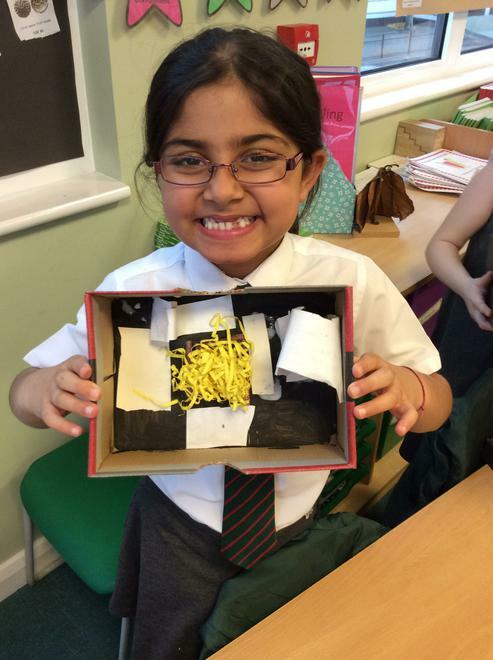 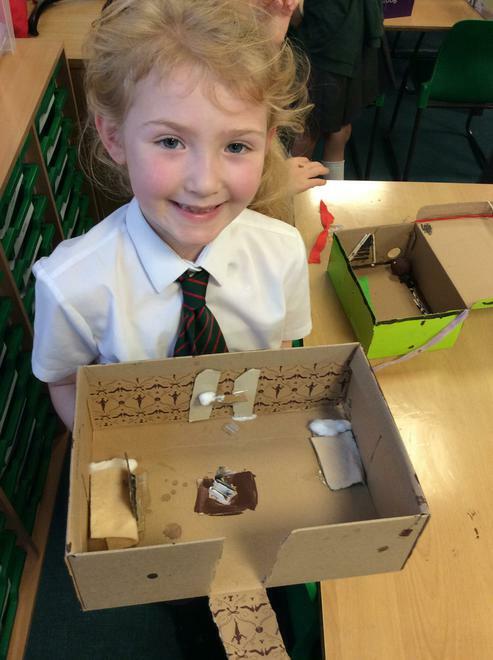 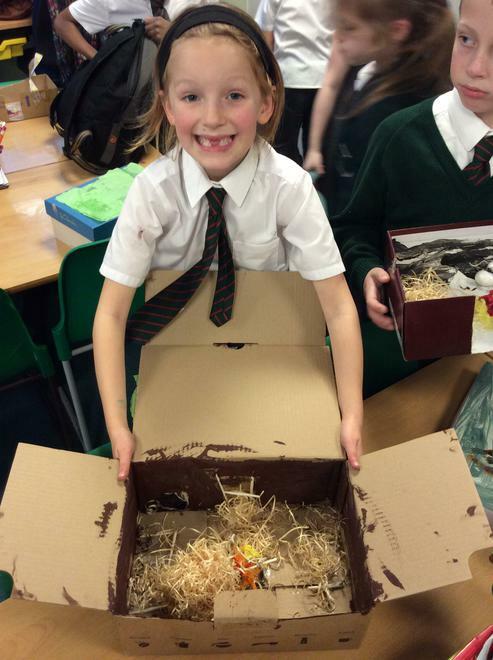 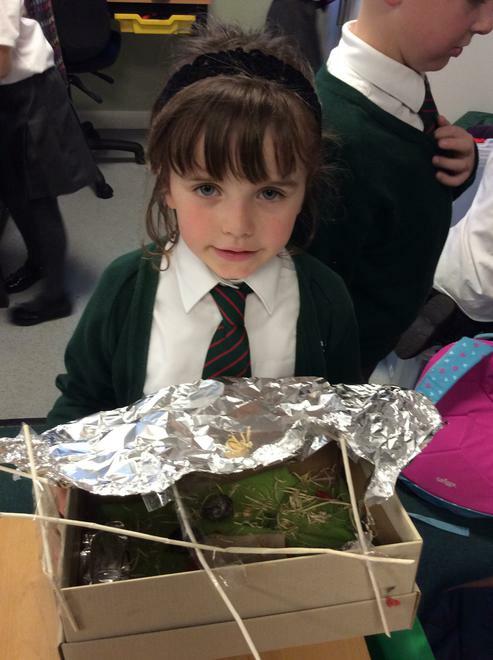 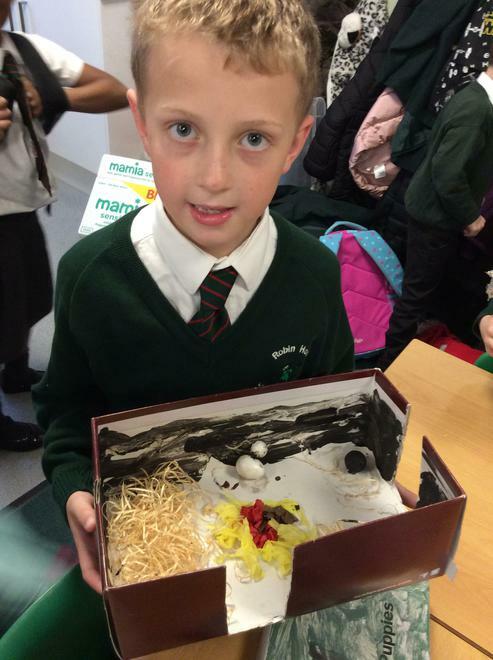 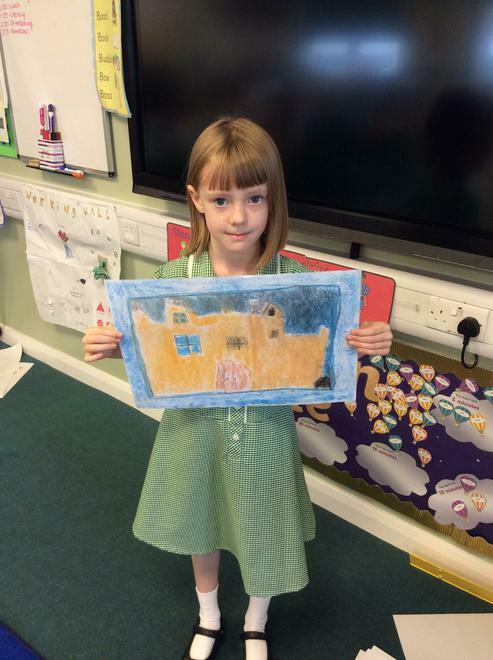 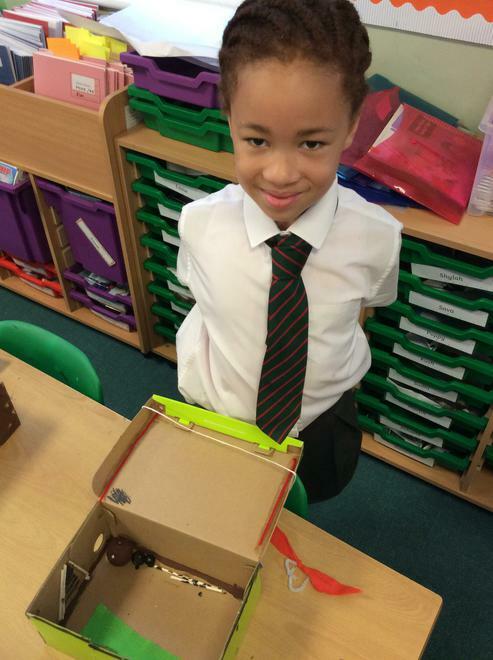 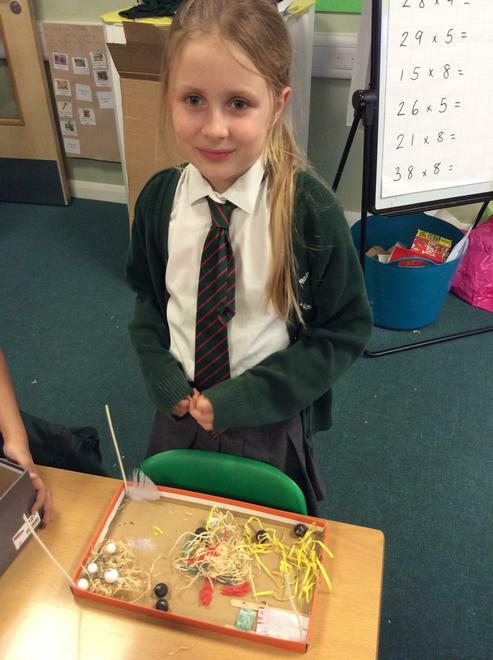 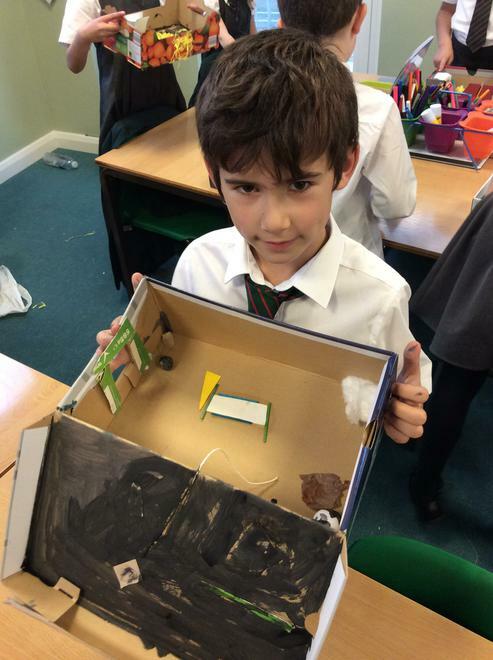 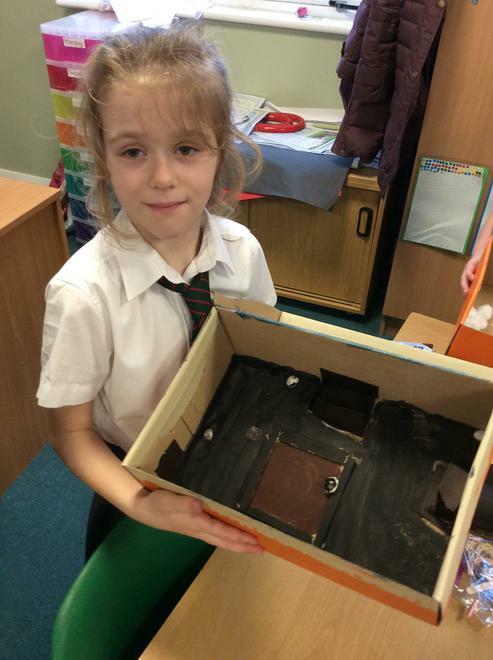 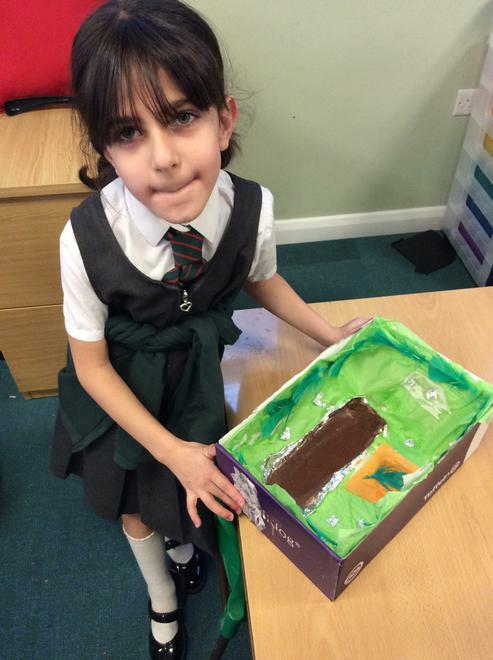 Today, we made our own model Skara Brae house! 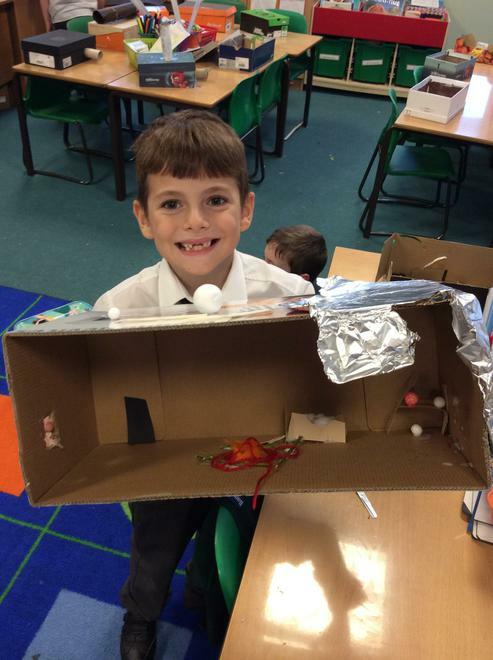 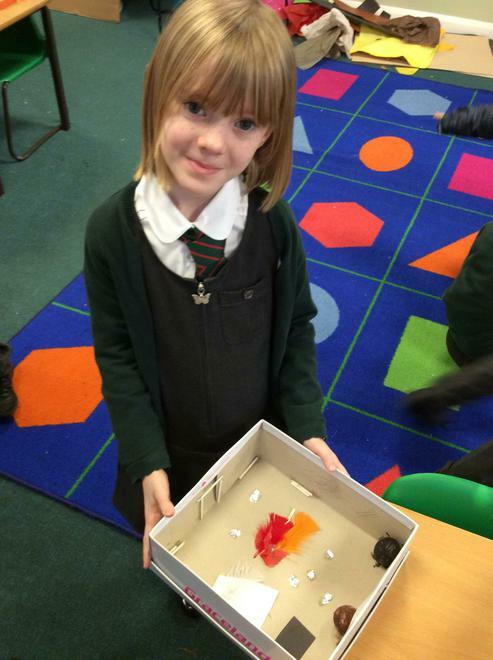 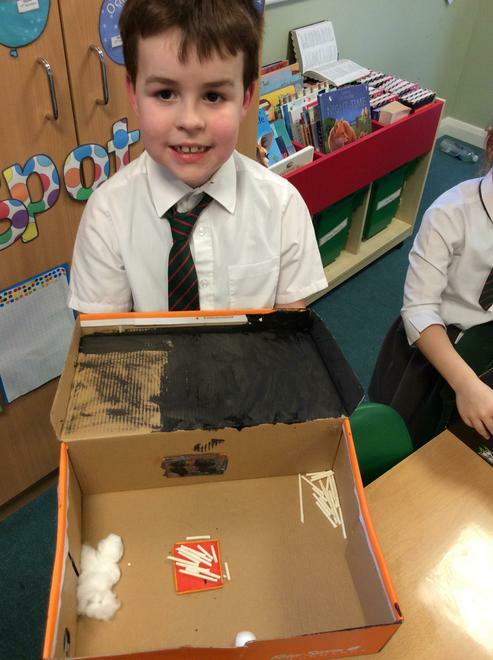 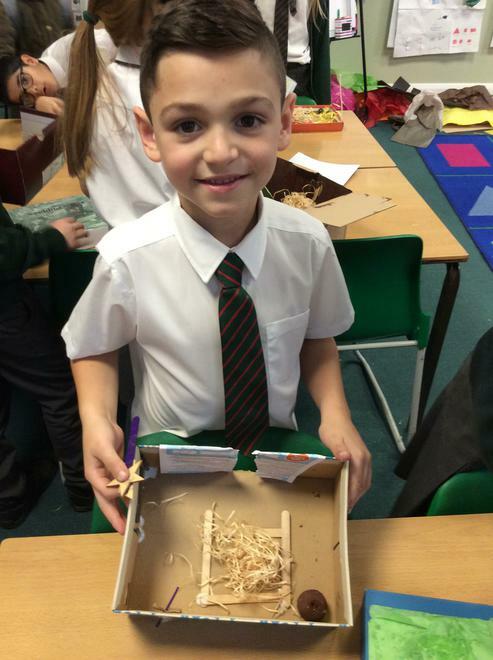 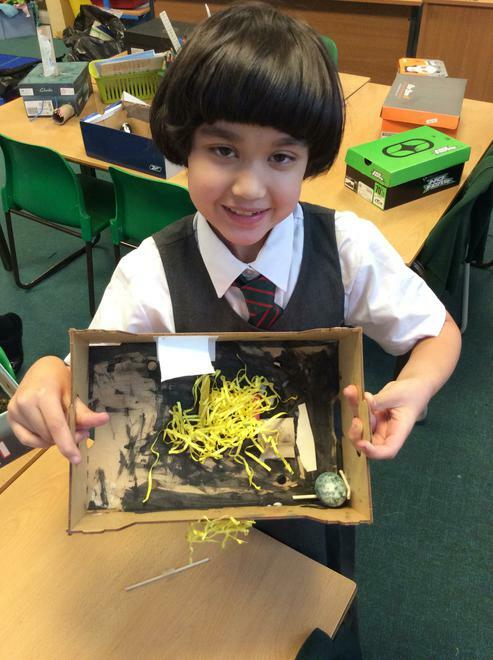 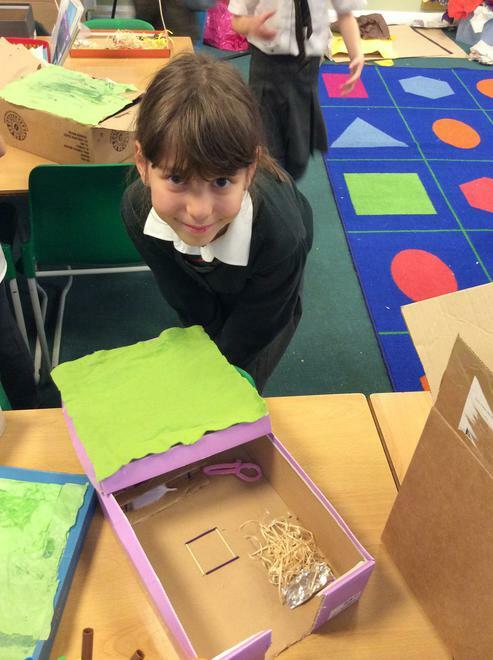 We used lots of different materials to help create a fire pit, bed, dresser and even some had tunnels! 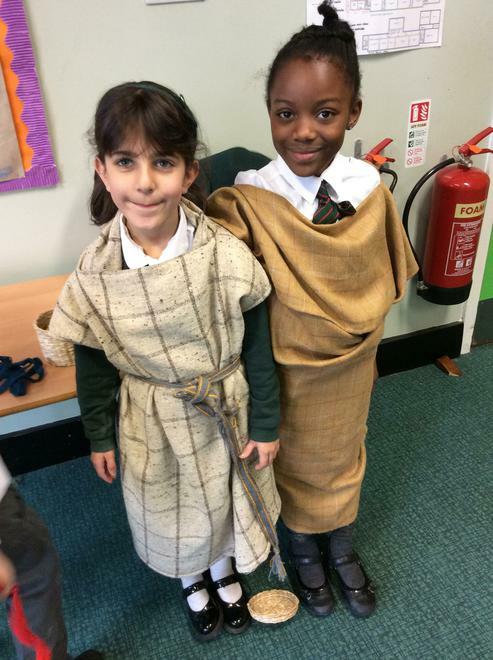 Don't they look great! 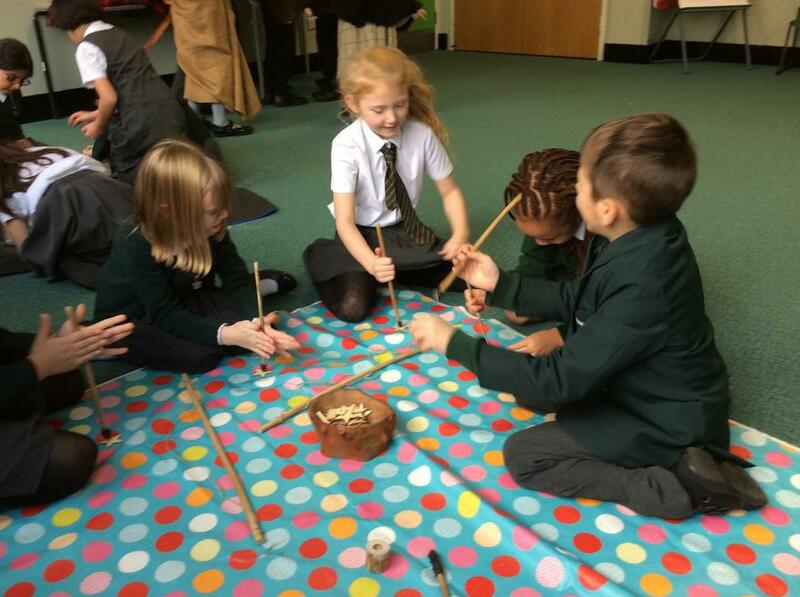 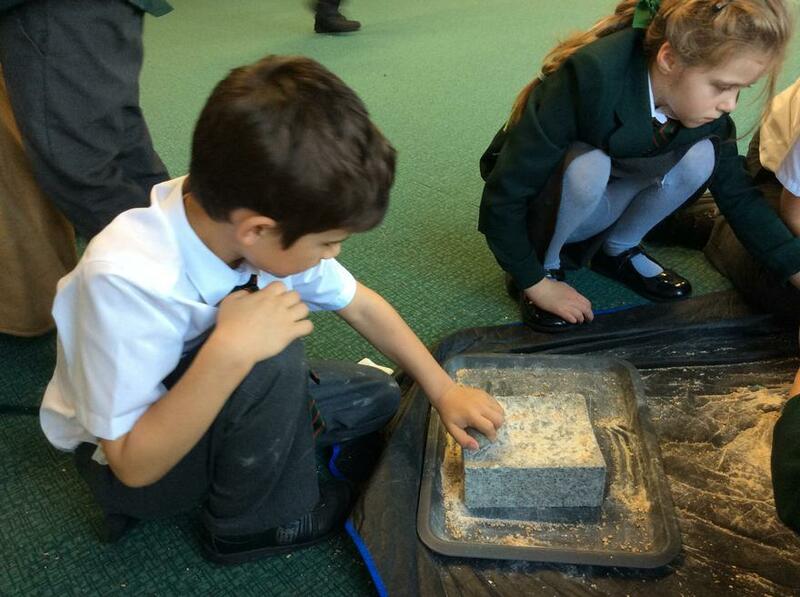 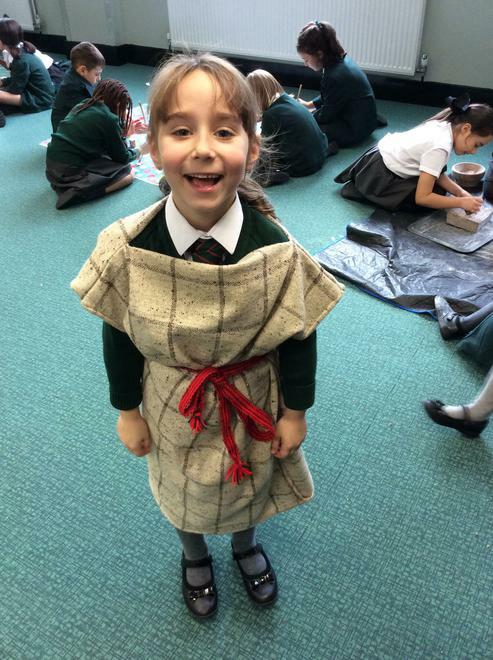 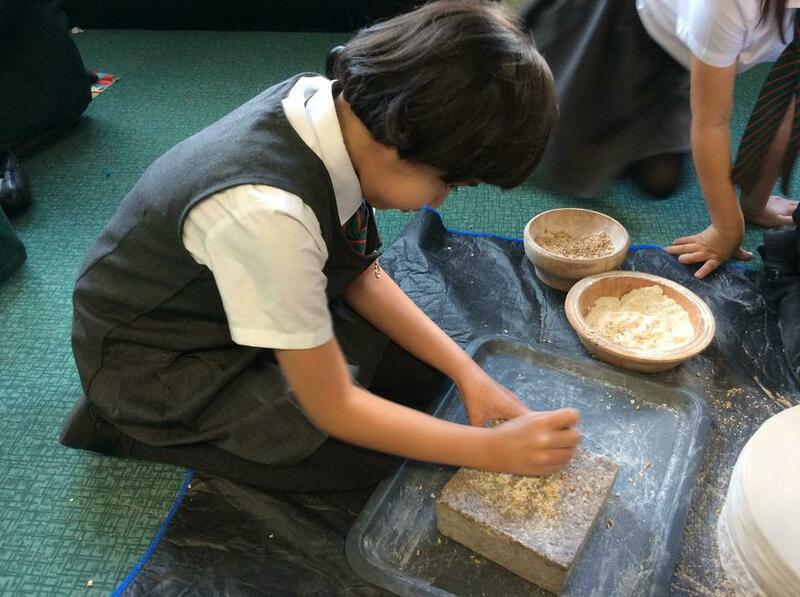 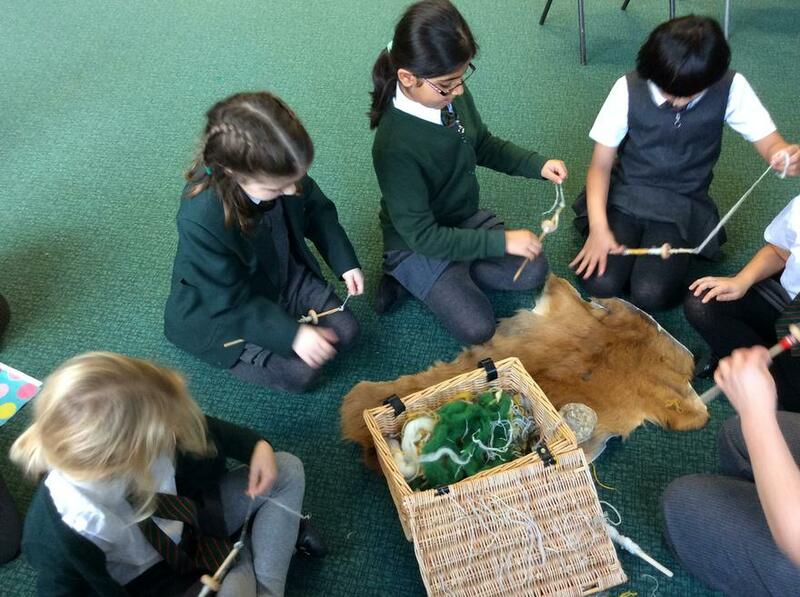 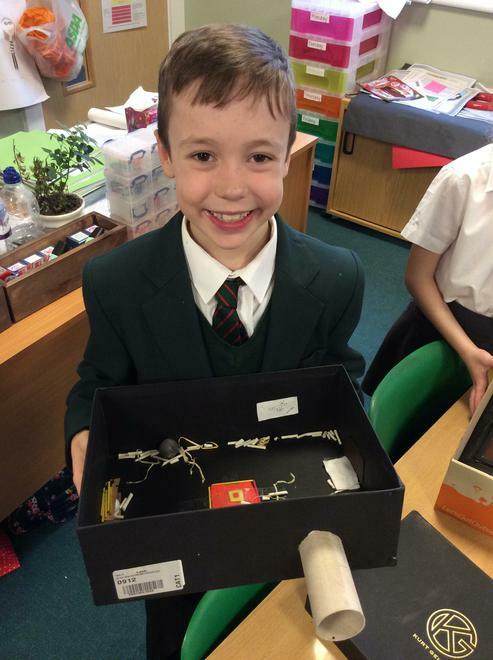 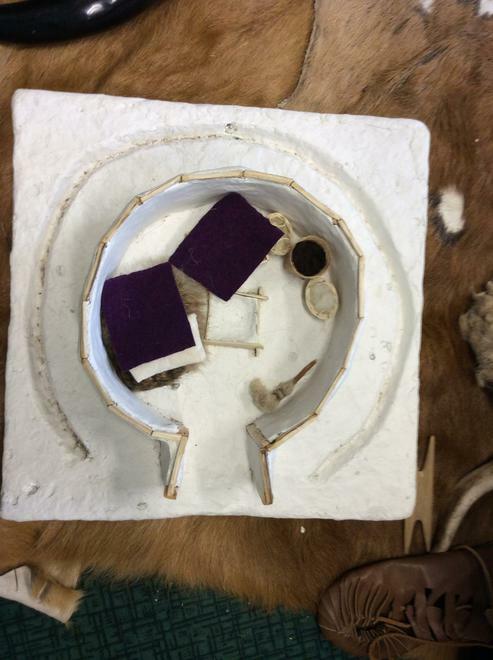 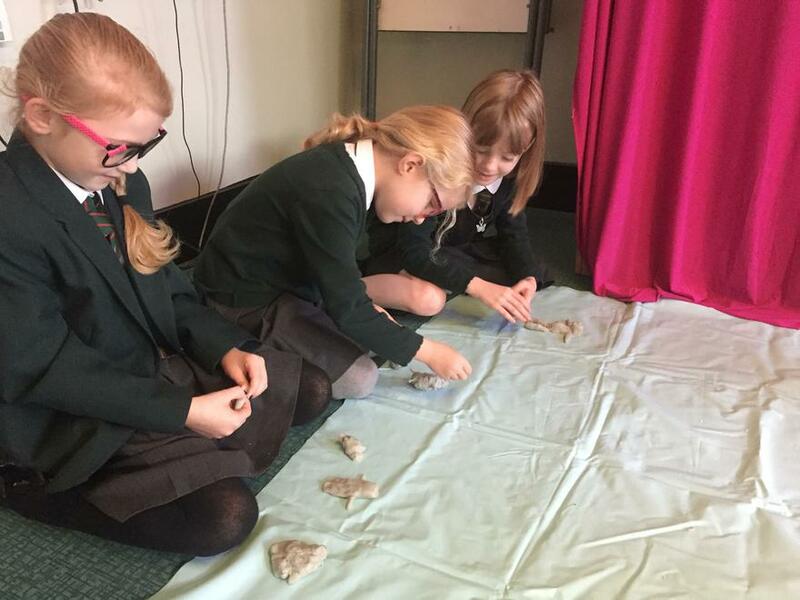 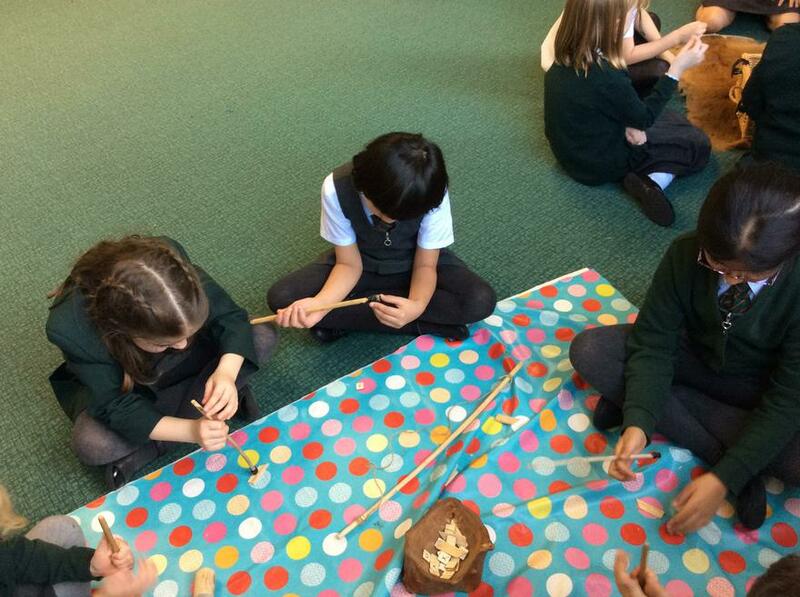 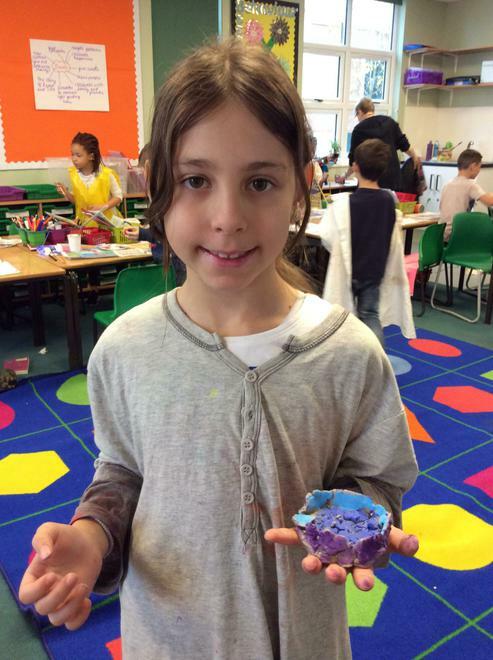 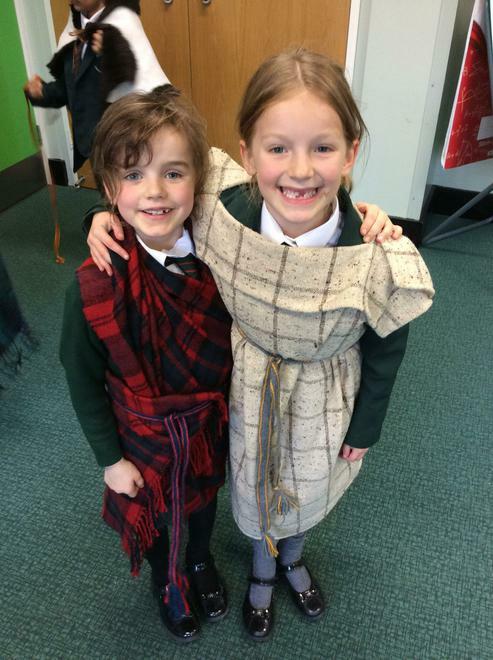 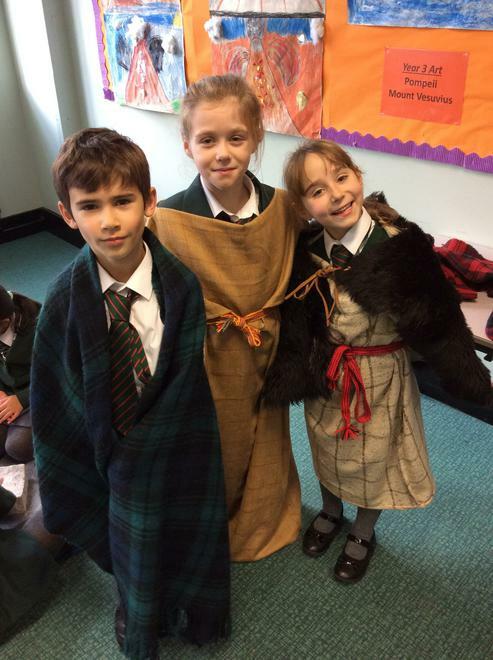 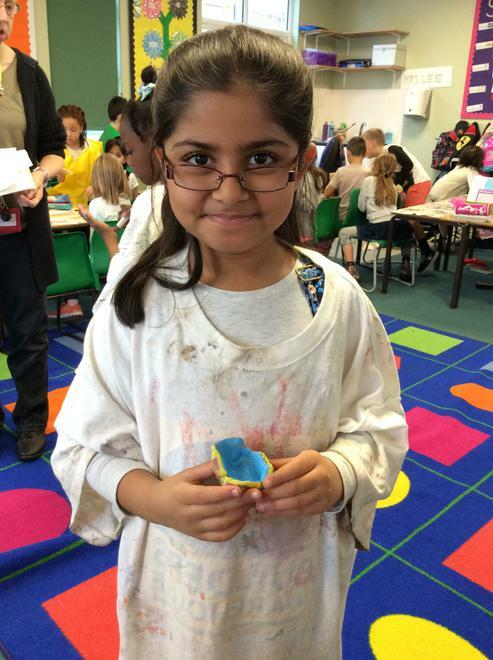 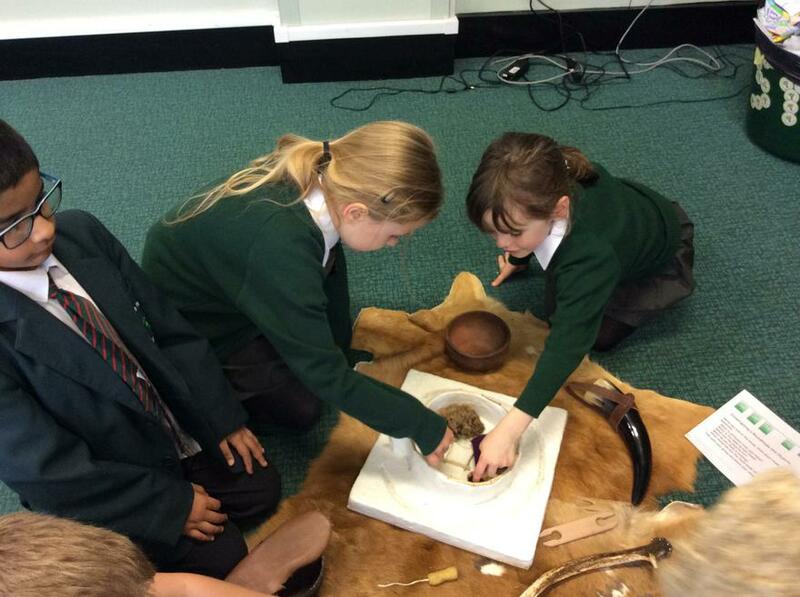 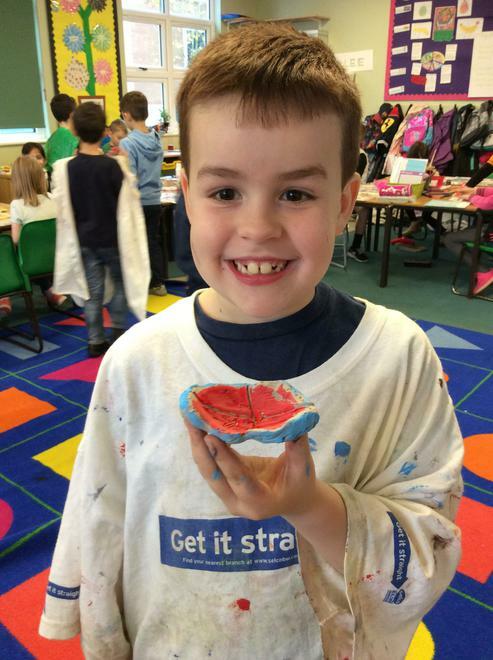 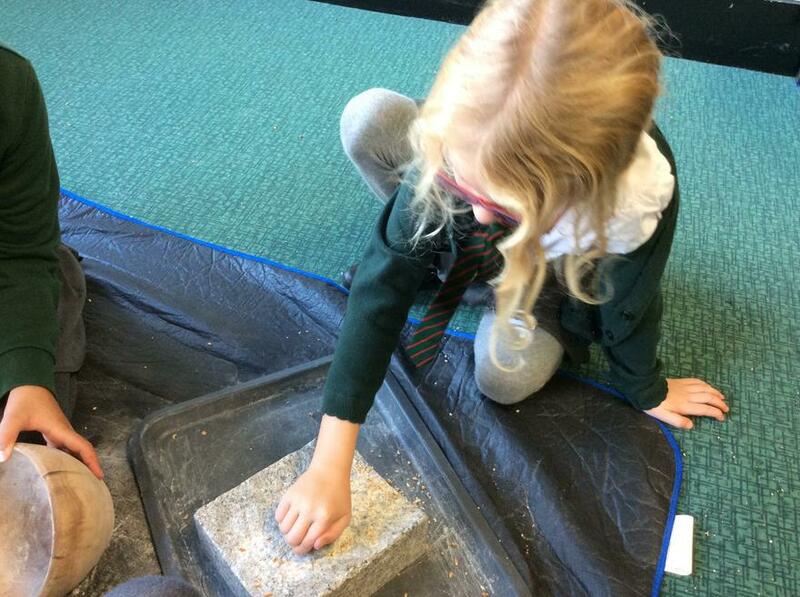 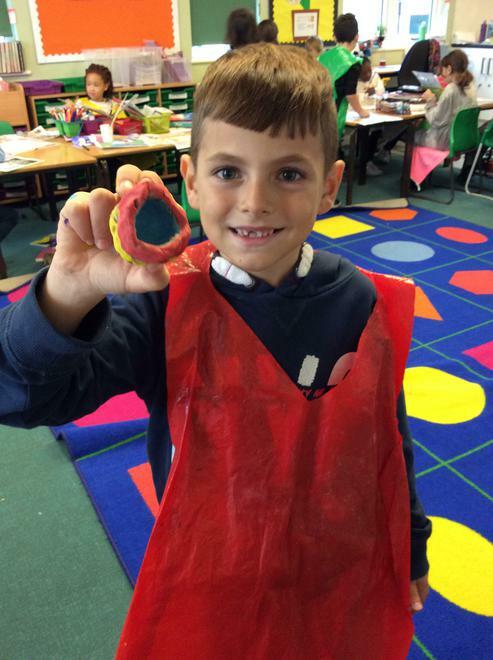 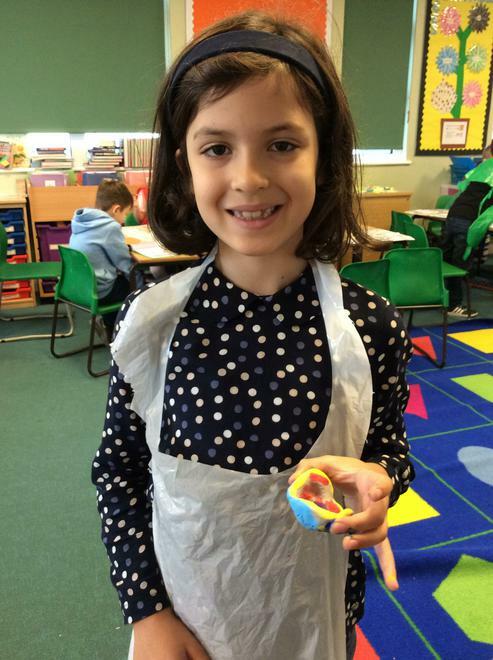 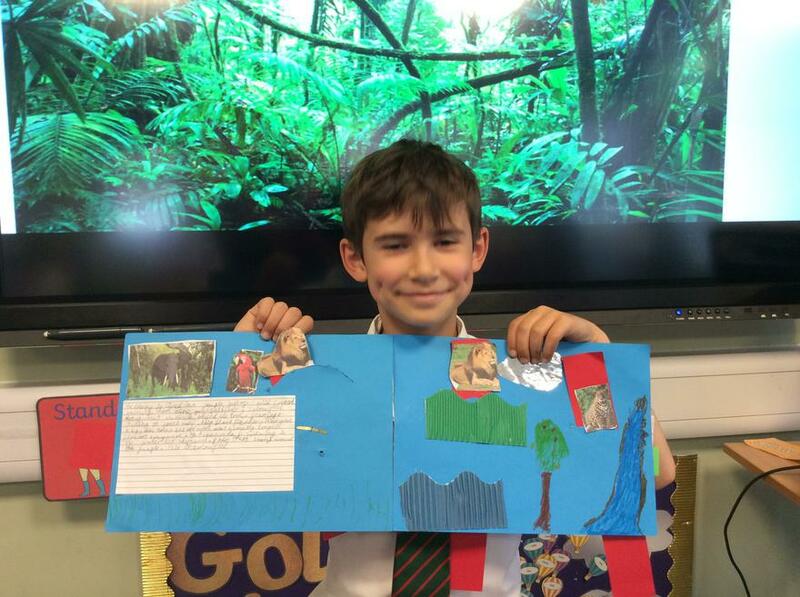 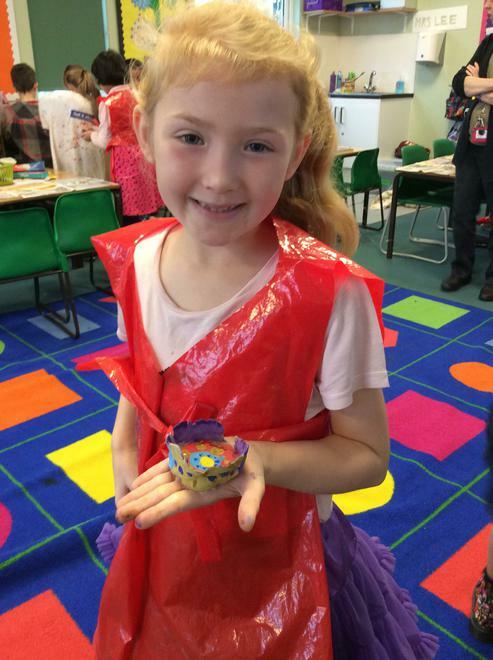 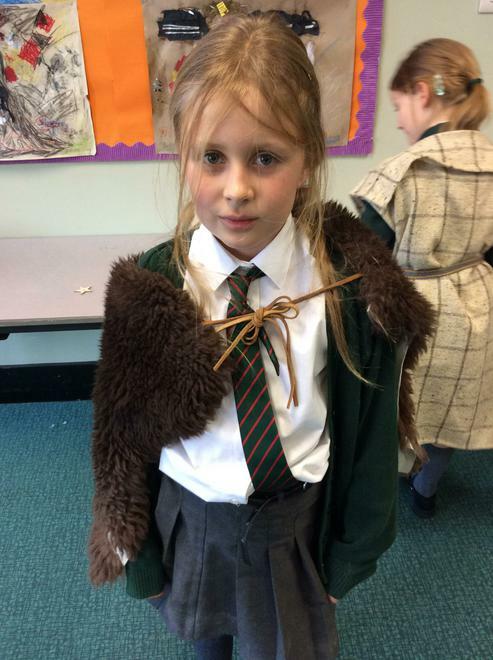 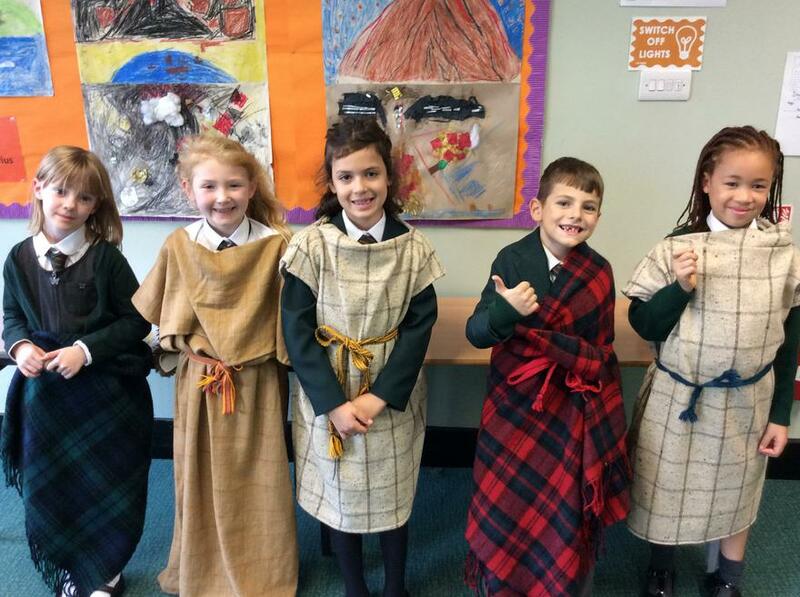 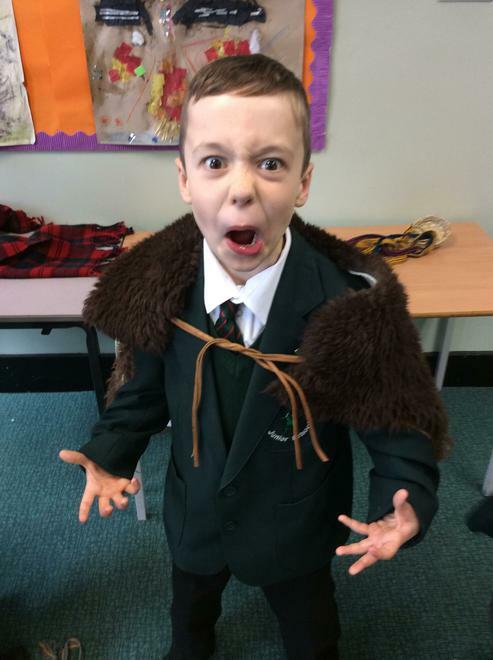 This week we attended a brilliant Stone Age workshop. 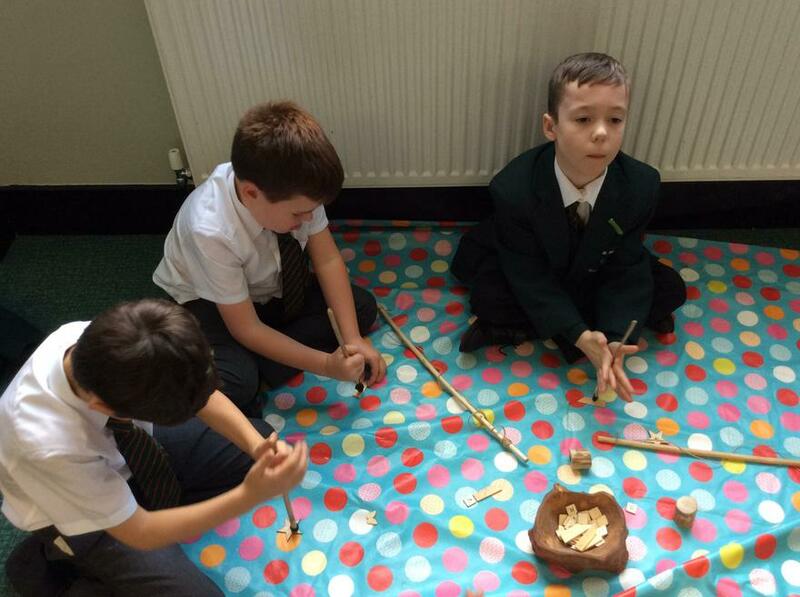 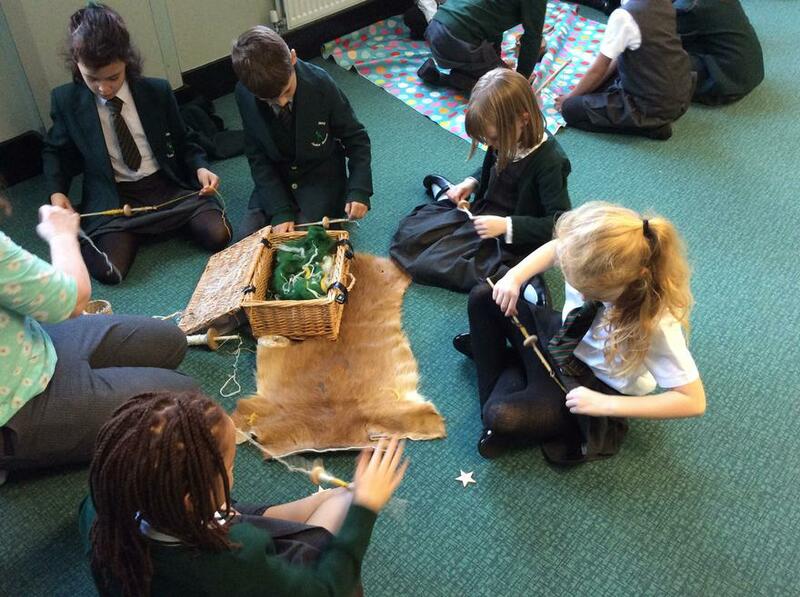 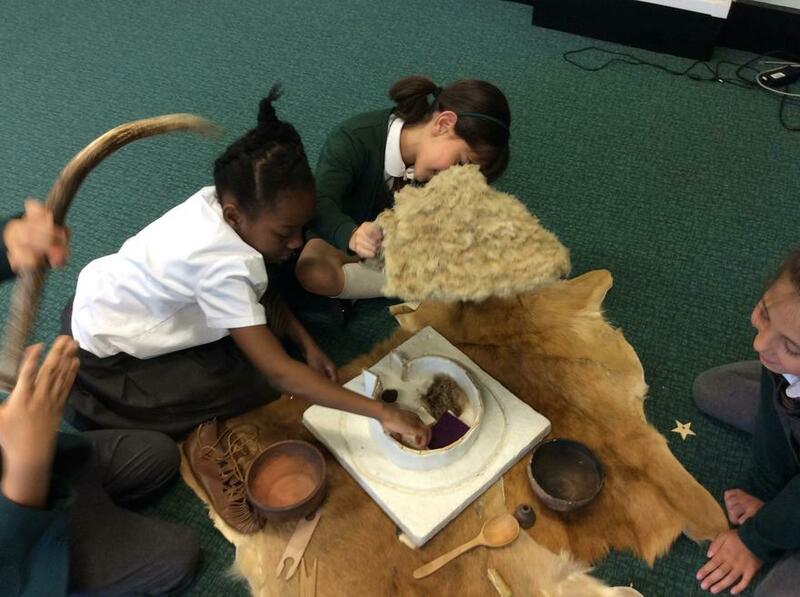 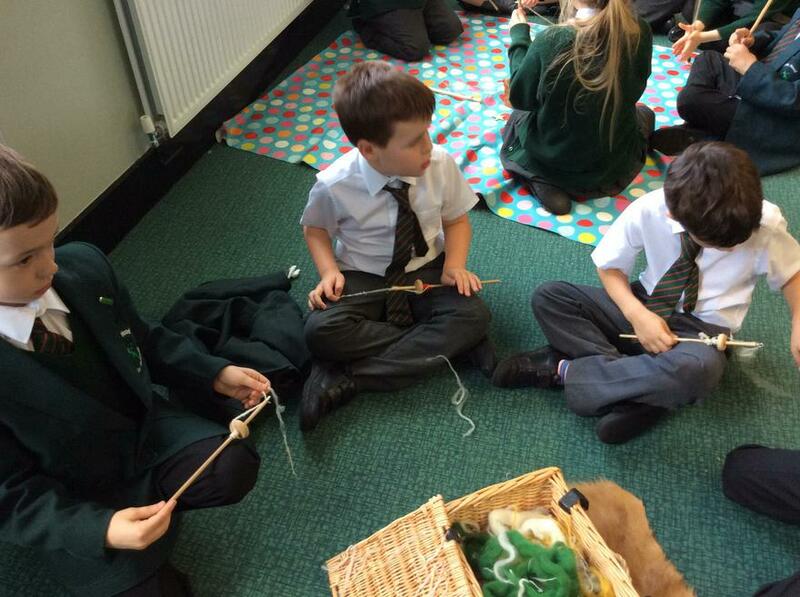 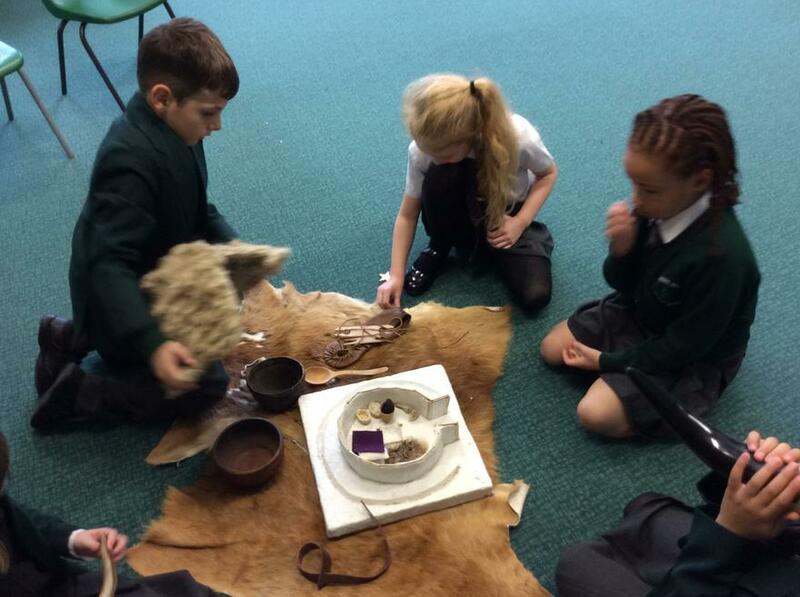 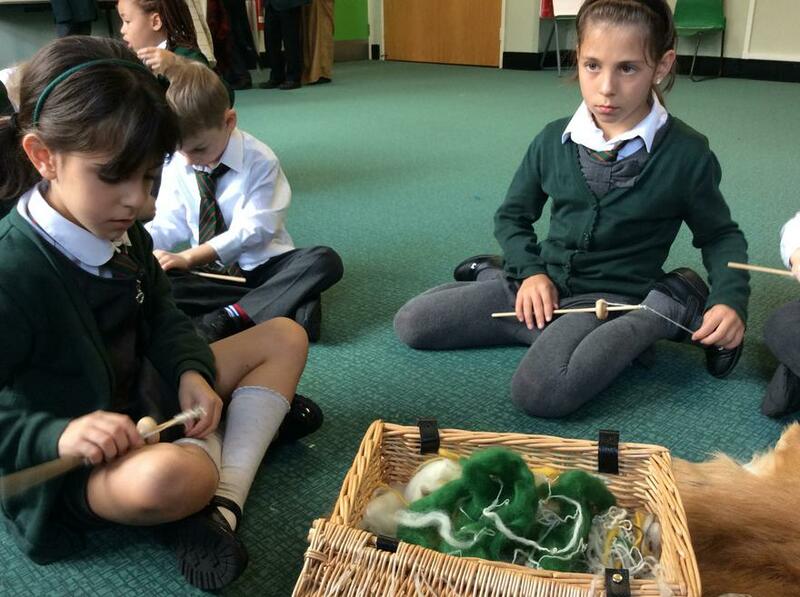 We learnt about the different time periods of prehistory, what houses would have been like in the Stone Age, different clothing people would have worn, and we even had a go at using real tools, spinning wool and grinding grain! 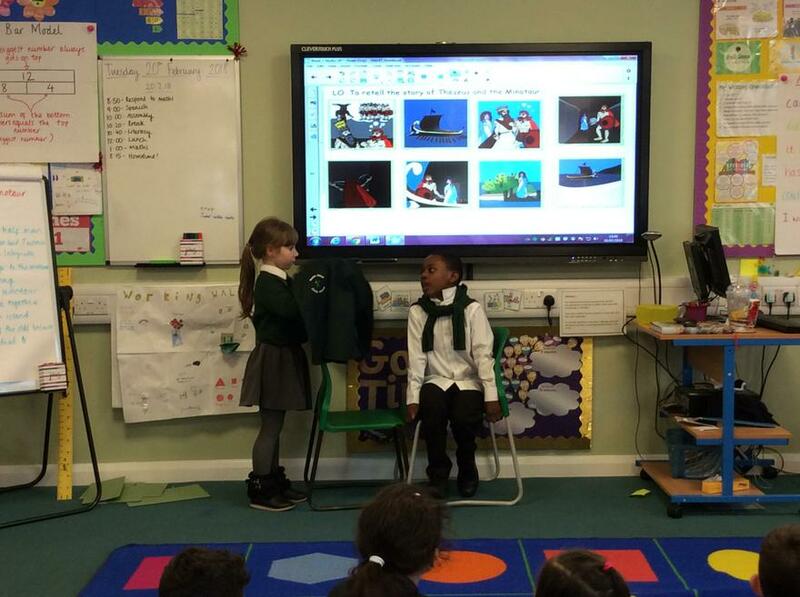 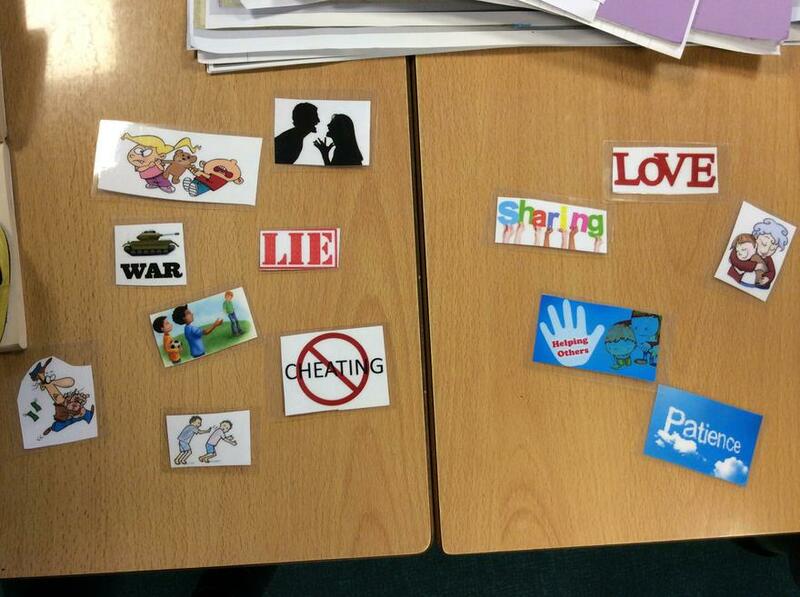 We learnt so much and are very excited to apply this new knowledge in our Topic lessons over the coming weeks. 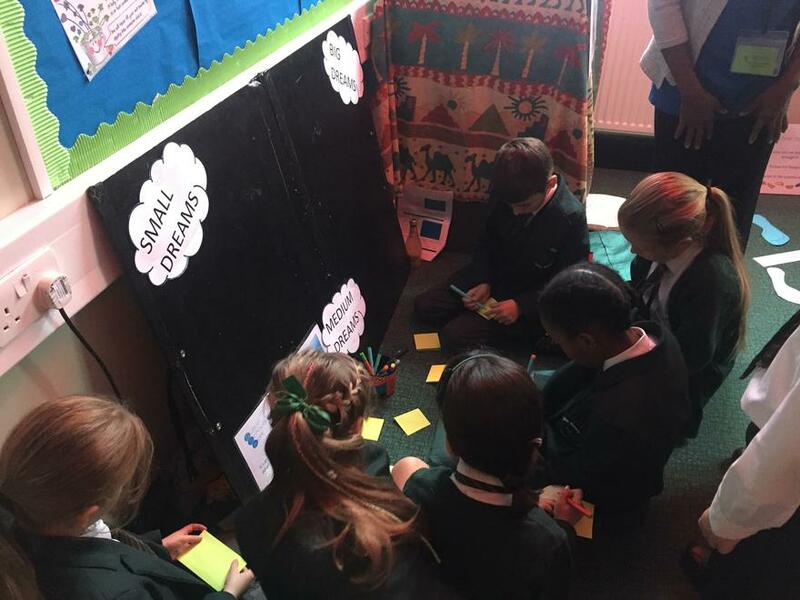 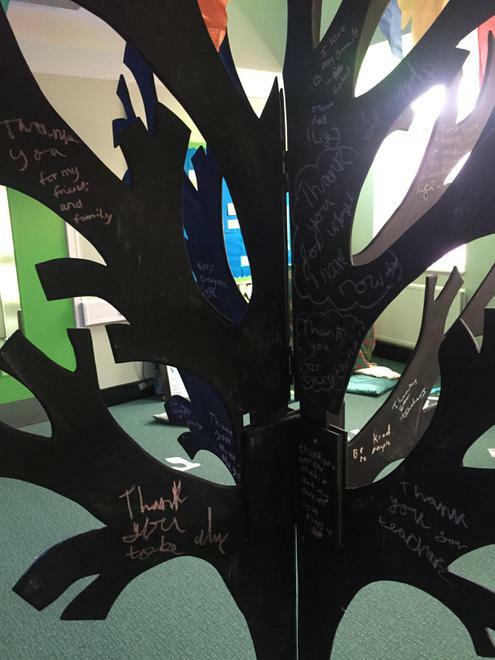 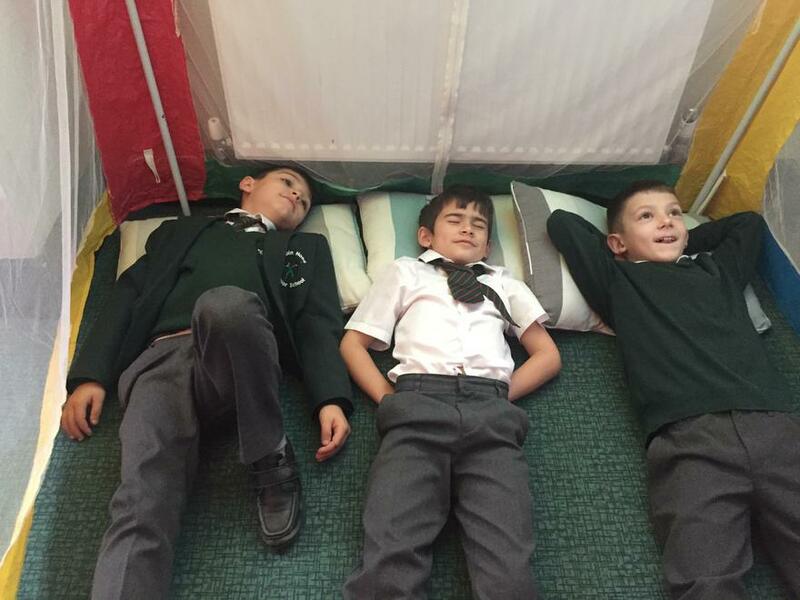 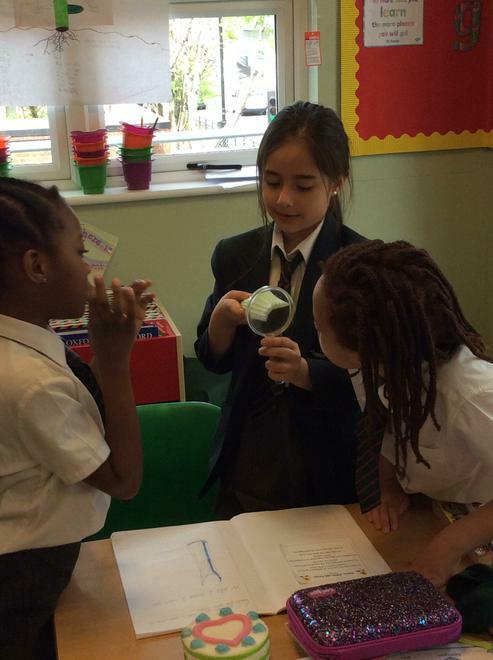 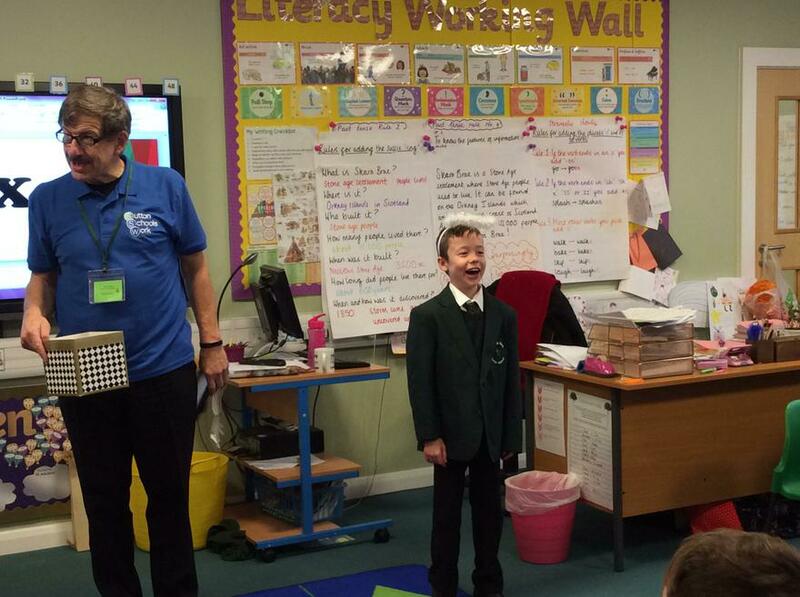 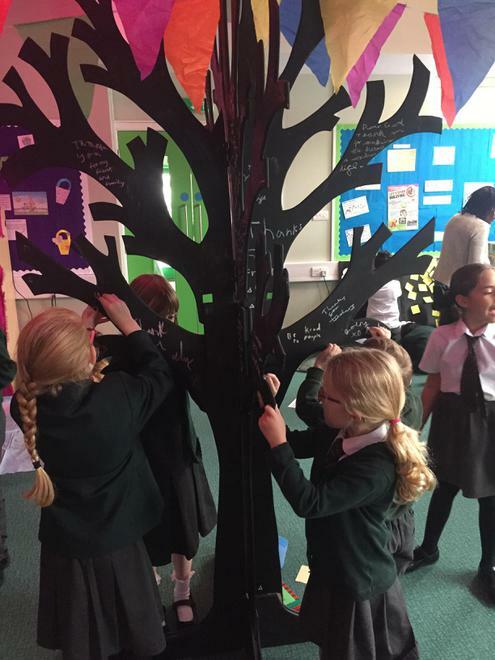 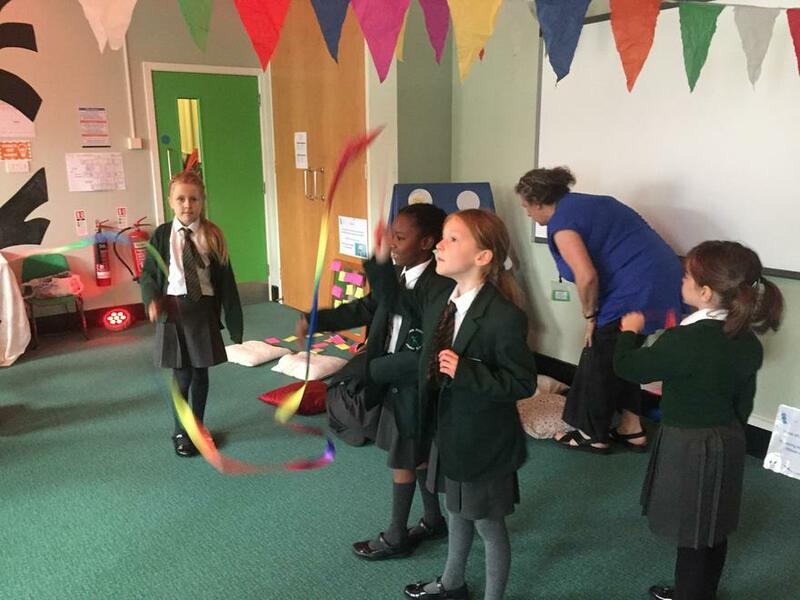 We were lucky enough to have a visit from Sutton Schools Work this week to bring us the IWonder Space. 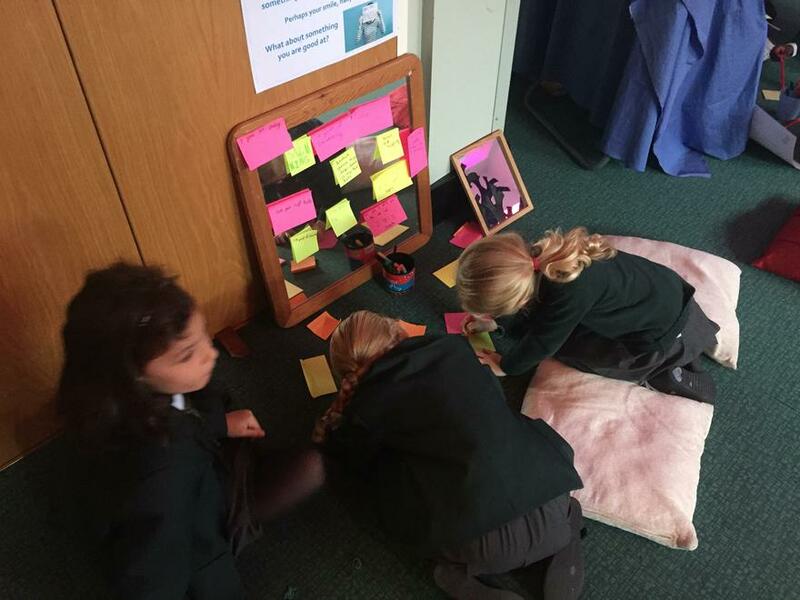 This was an opportunity to have a think about lots of different things including, our journey through life so far, things and people that make us happy, things we are good at, our dreams for the future, and things and people we are thankful for. 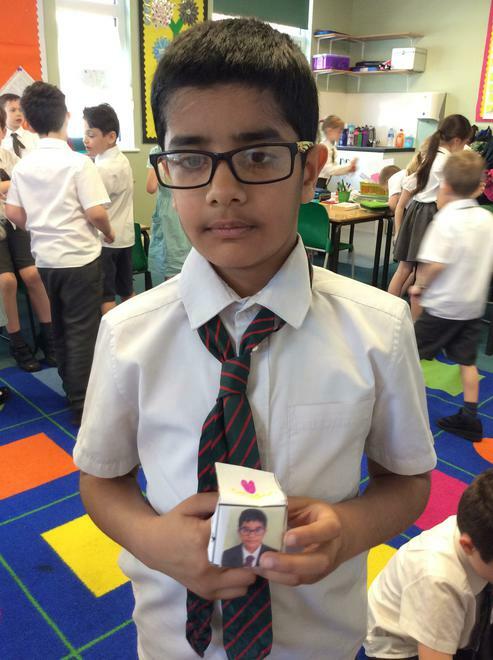 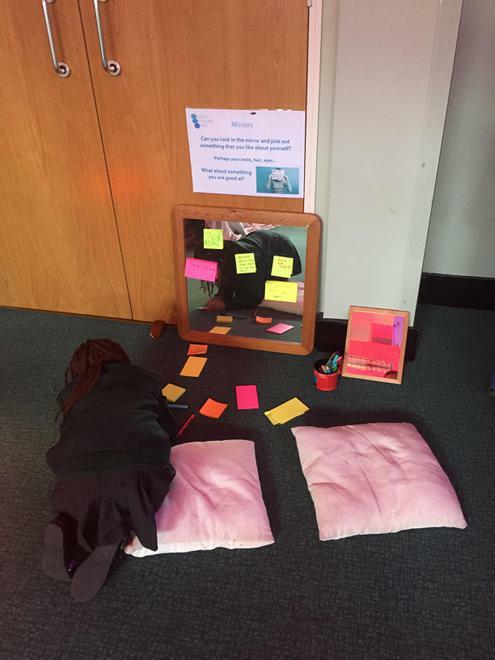 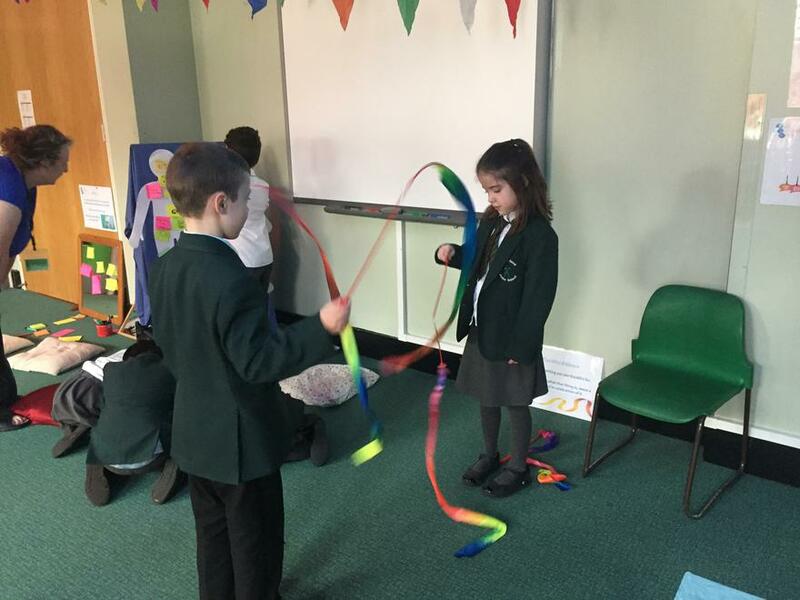 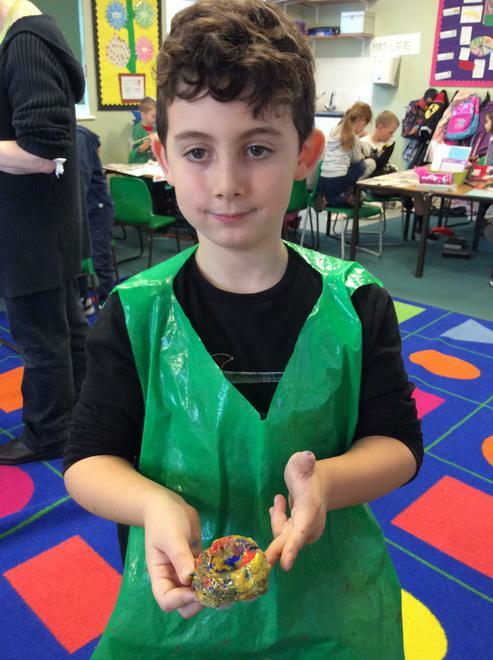 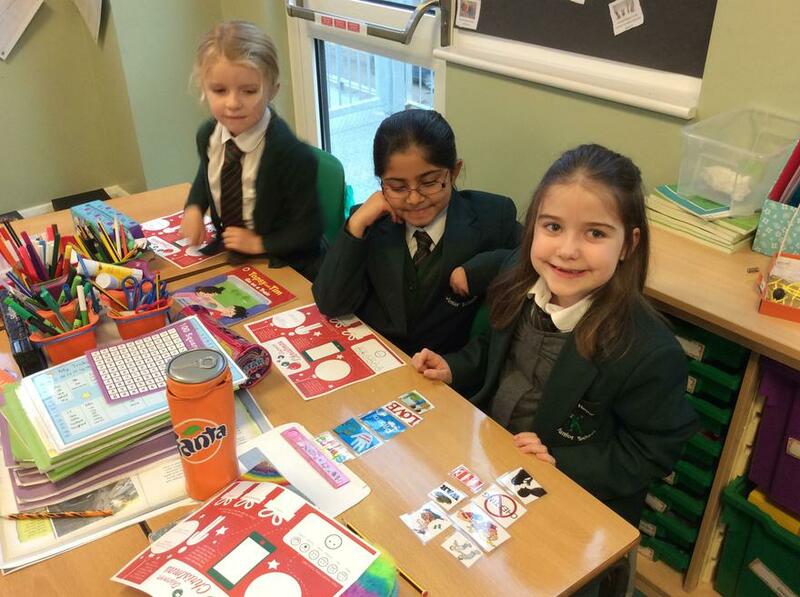 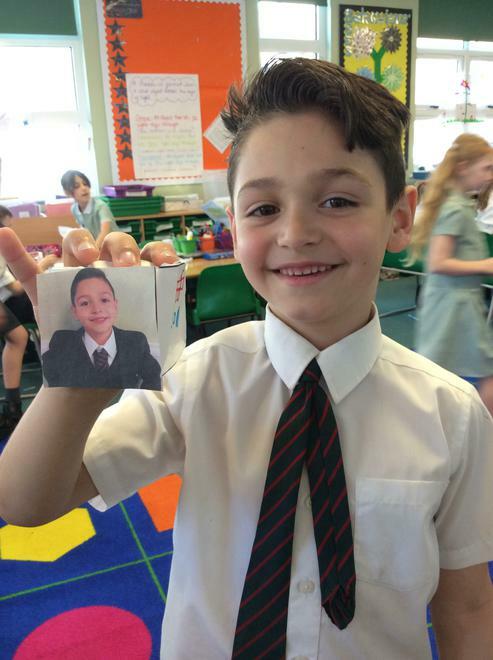 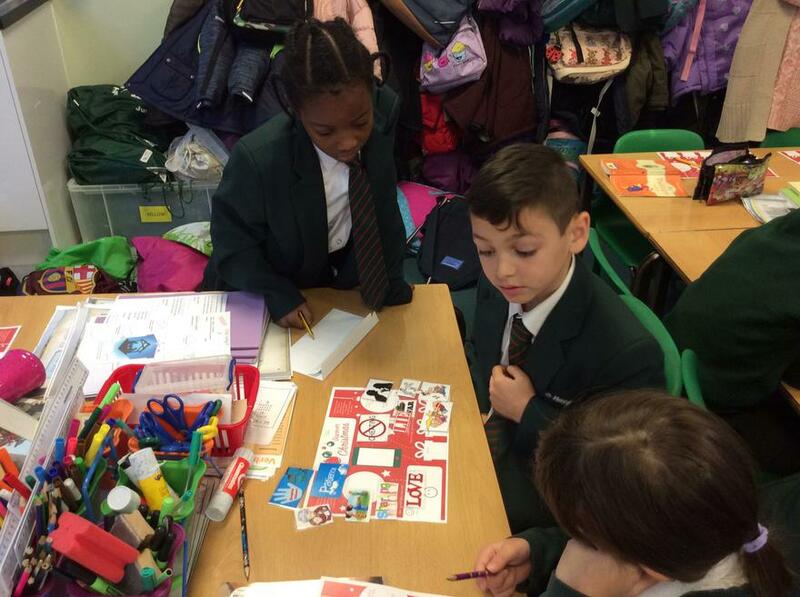 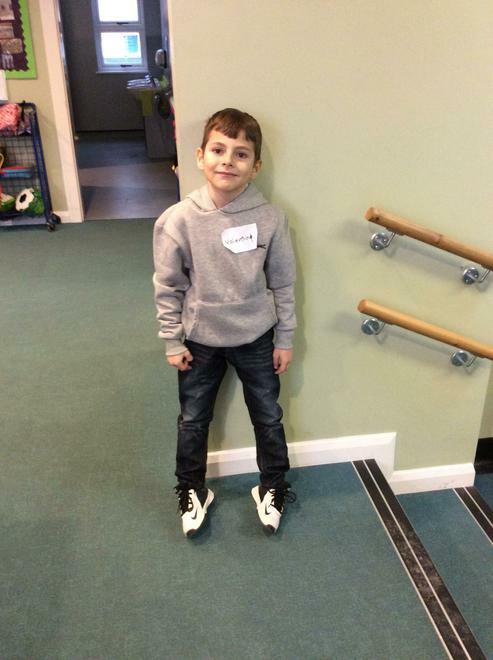 We all really enjoyed these activities and the chance to think carefully about different aspects of our lives and how we are all special in our own unique way. 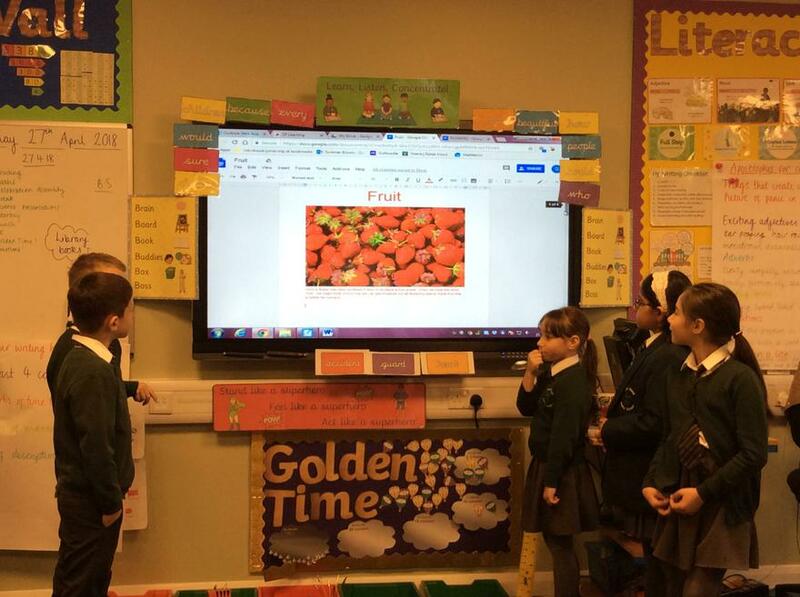 In Science we have been looking at healthy eating and how we can create a healthy, balanced diet. 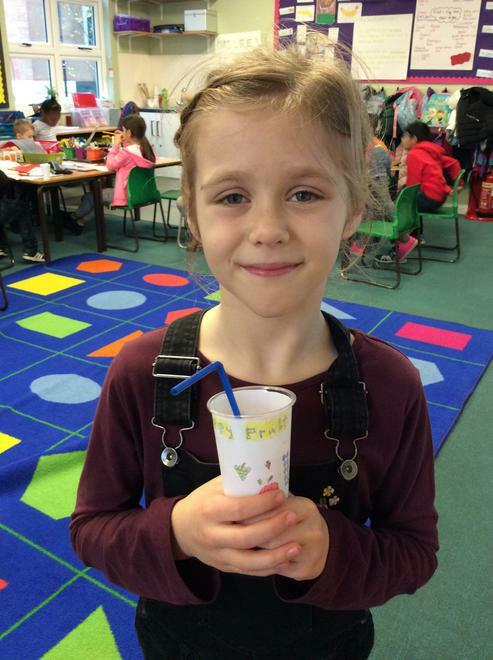 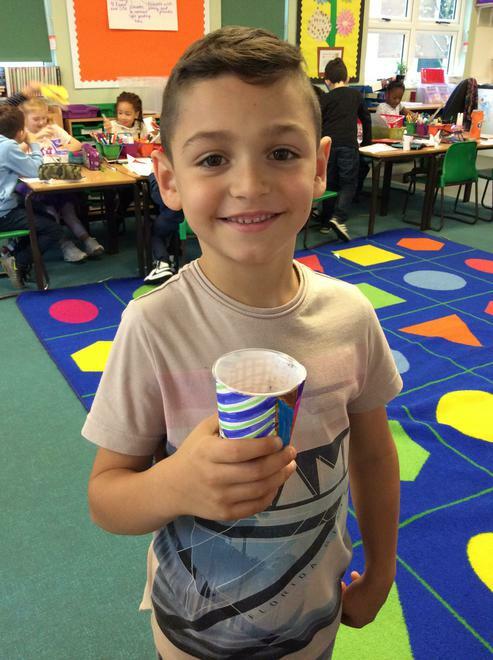 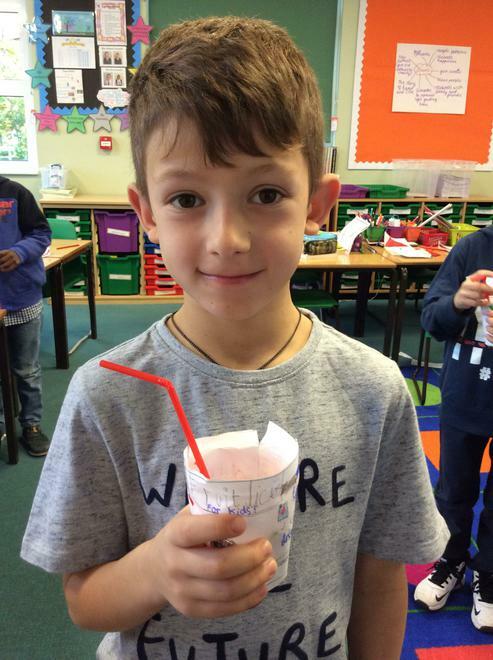 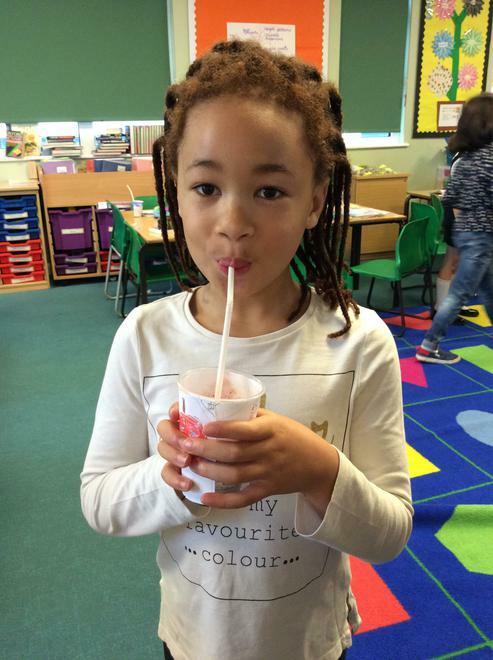 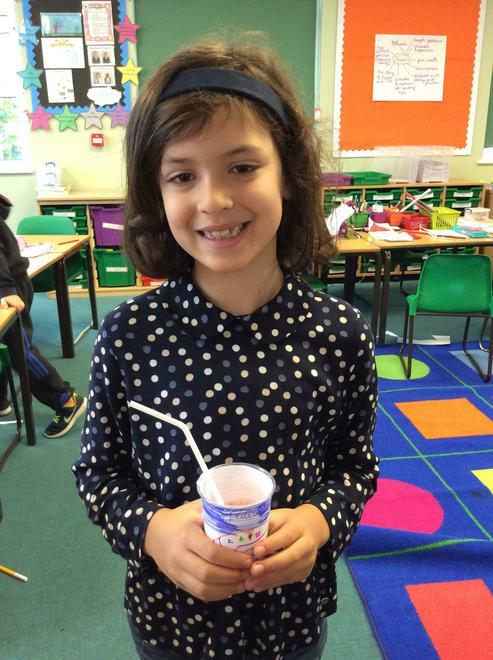 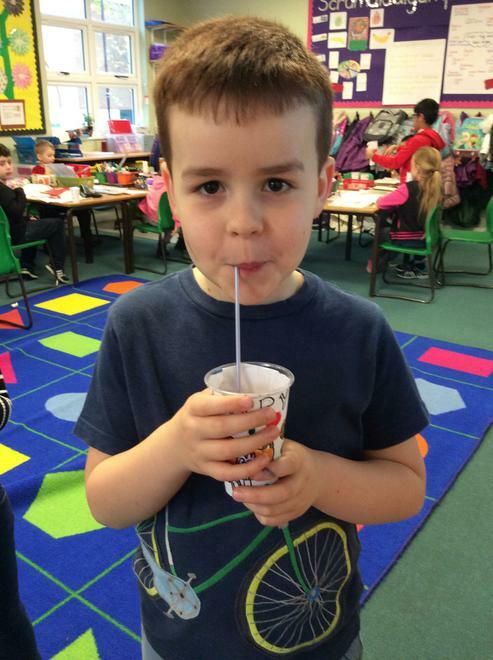 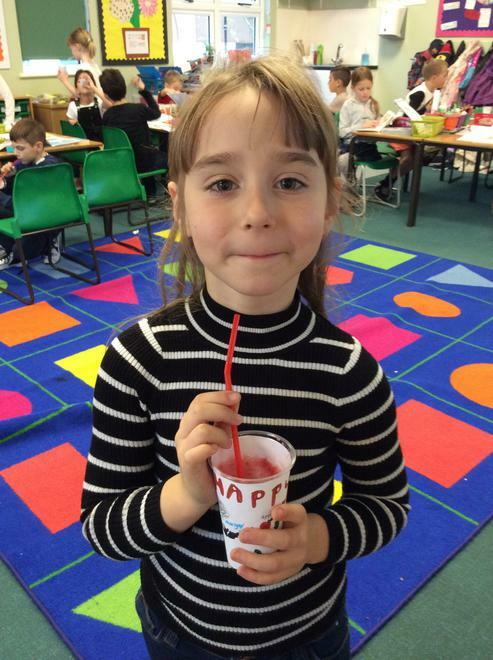 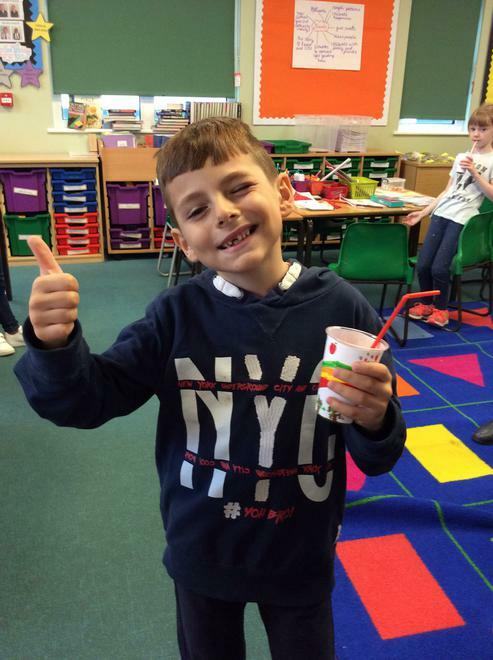 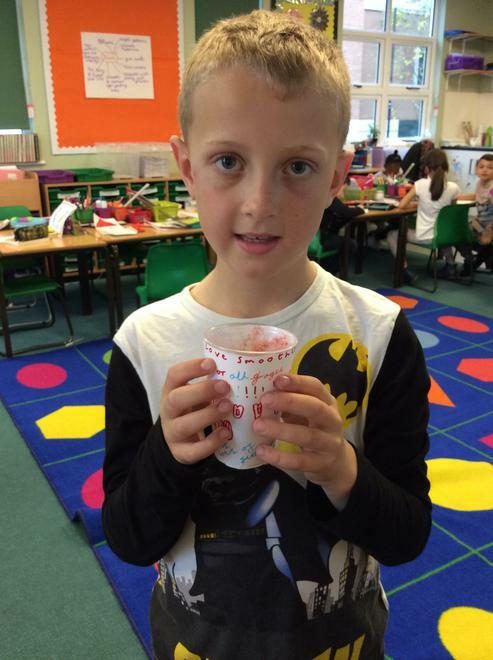 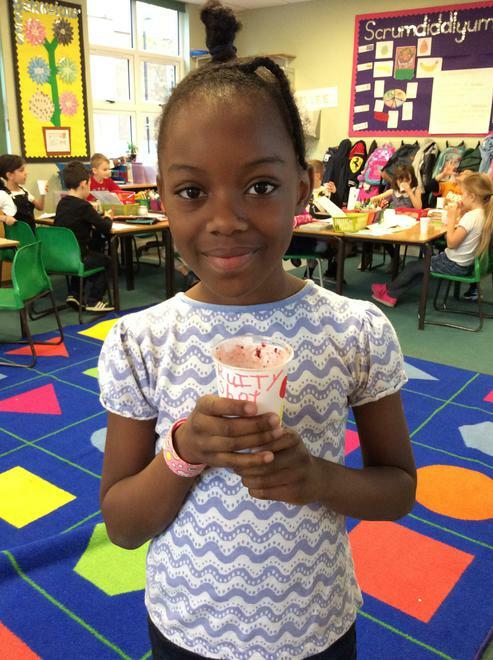 We learnt that eating lots of fruit and vegetables is a very important part of a healthy diet and one way to include these is by drinking healthy smoothies. 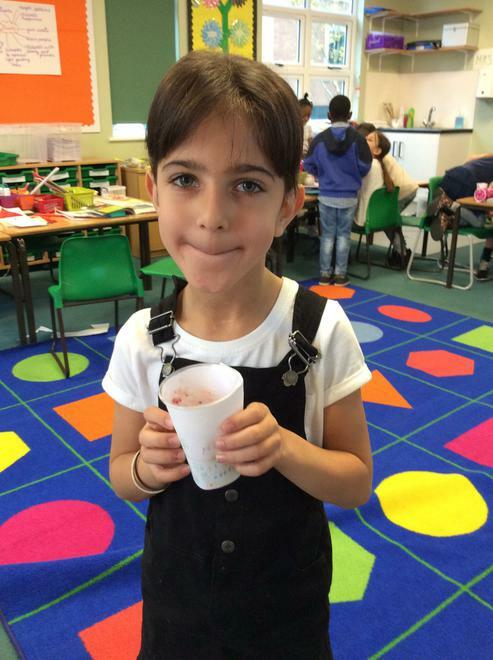 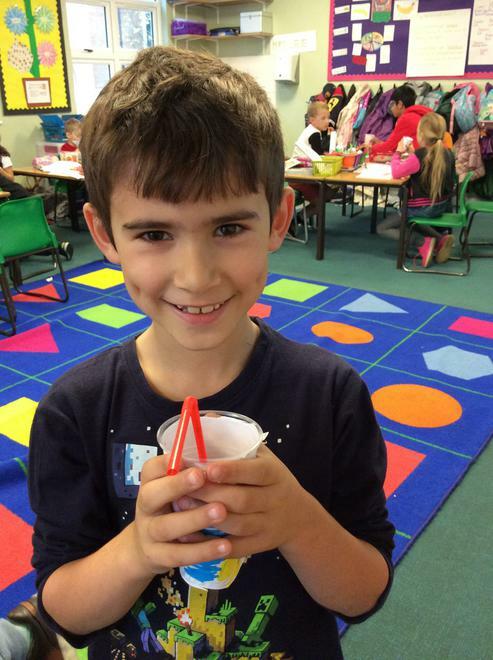 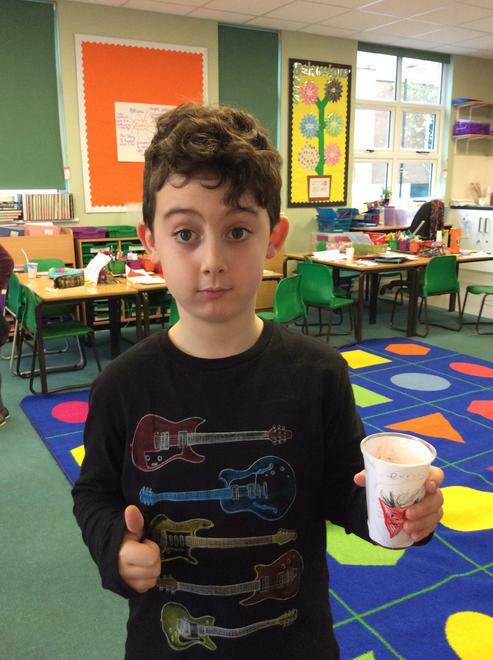 As a project for DT, we tasted existing smoothies to see what flavours we enjoyed, chose the ingredients we wanted to put in our own smoothies, and then planned the method to create our smoothies. 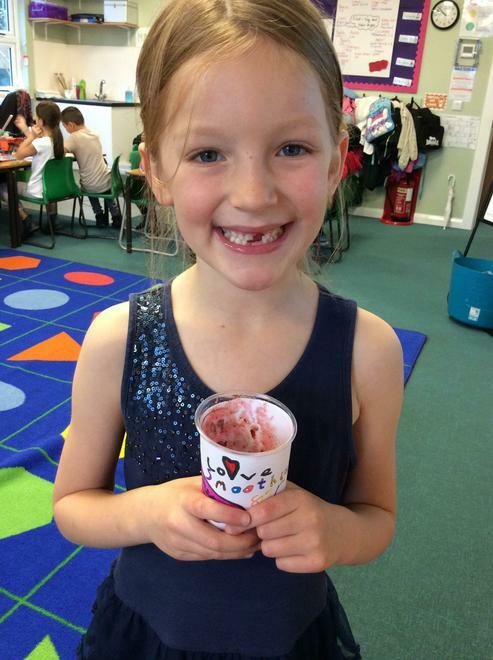 We worked really carefully to prepare the fruit and had lots of fun in the process too! 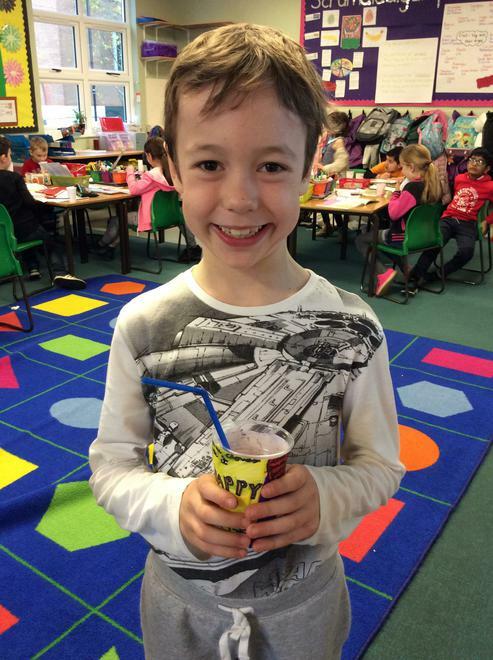 Finally, we created our own packaging to go around our own smoothie with all the important information on. 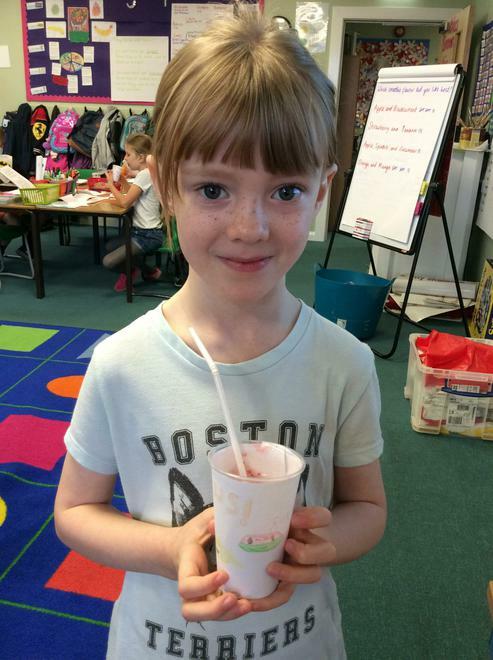 They really were delicious! 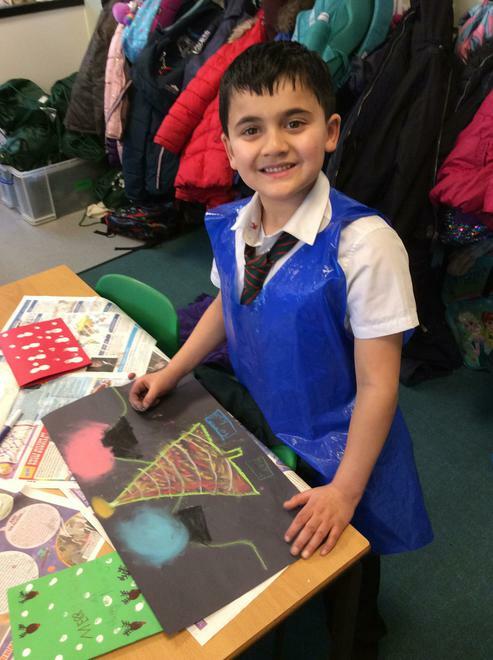 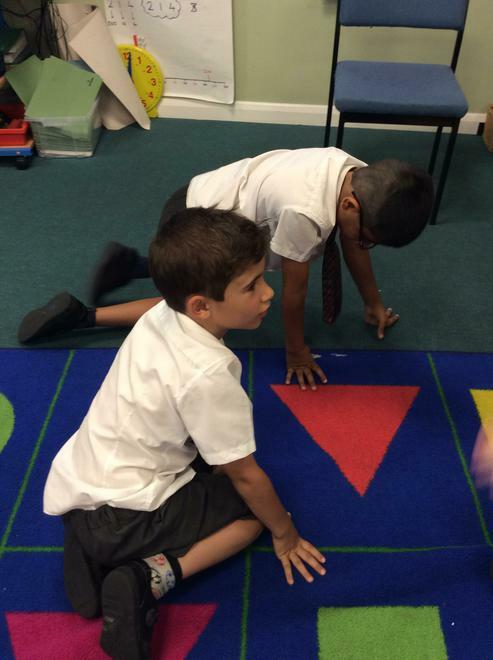 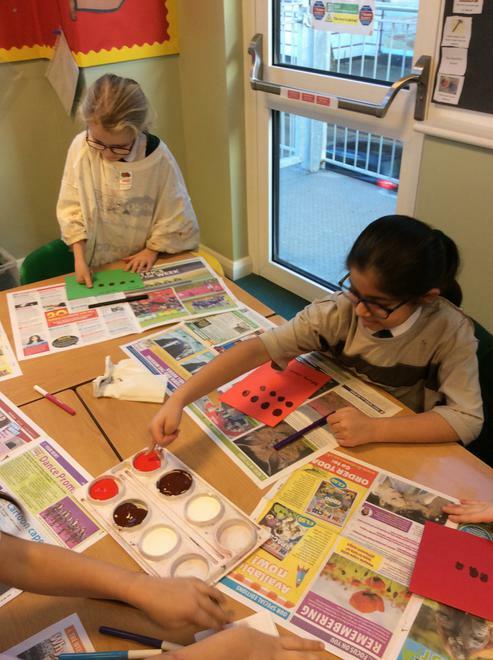 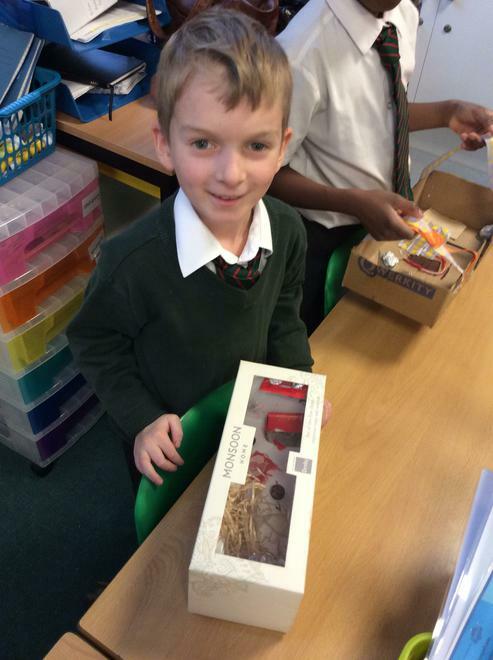 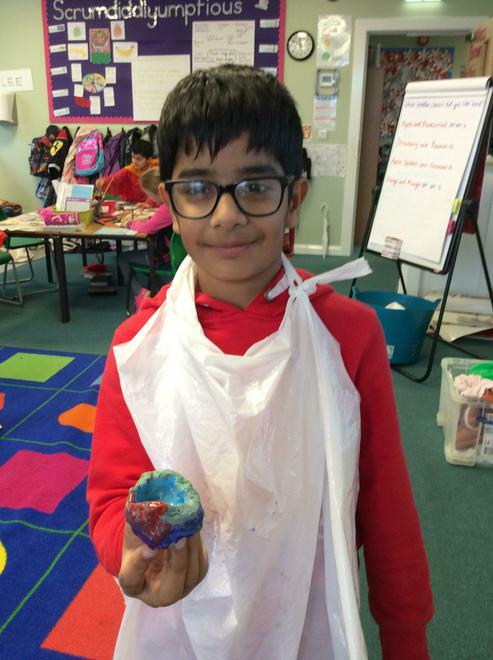 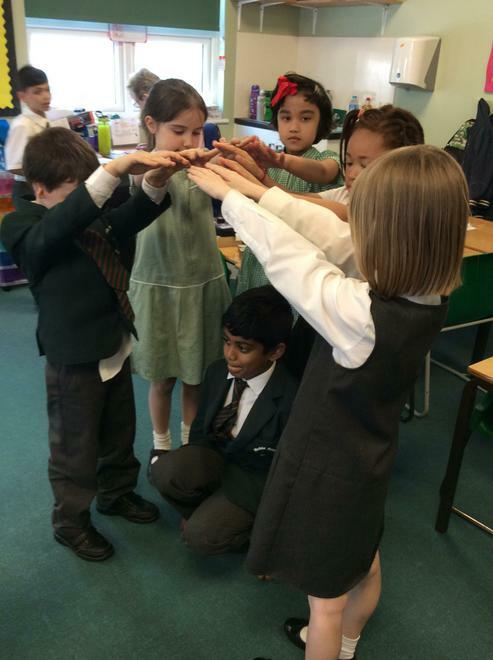 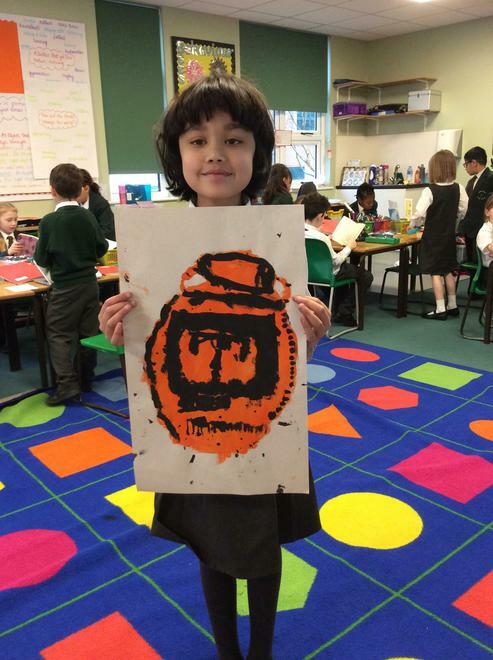 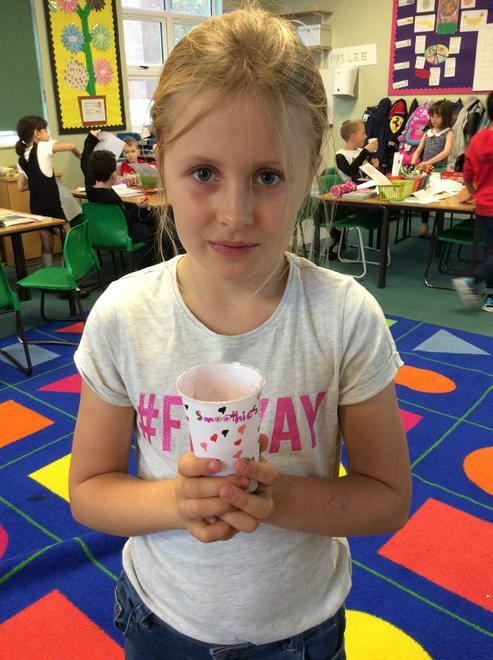 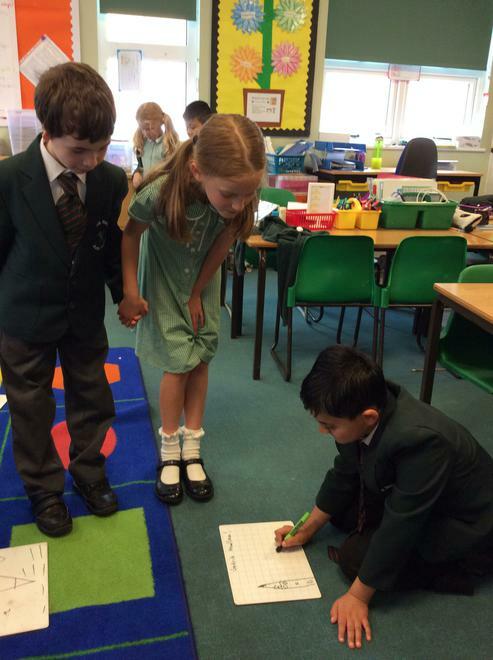 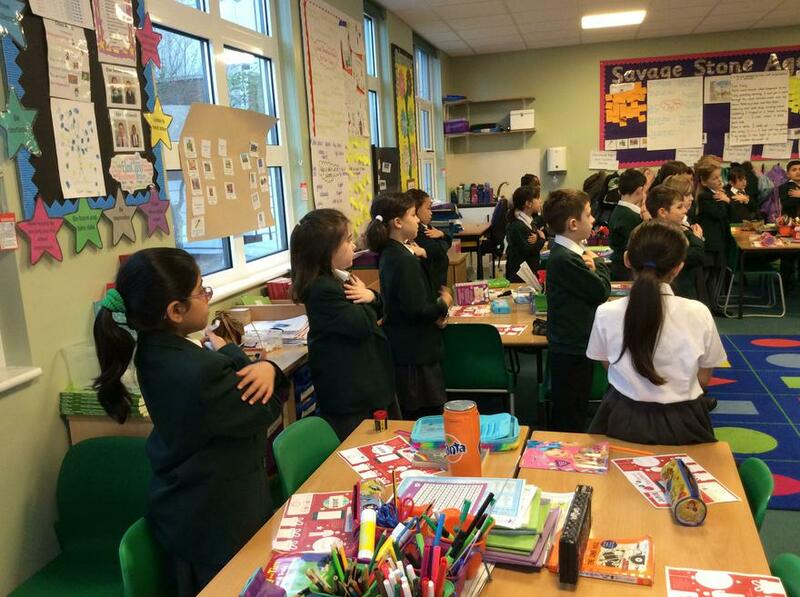 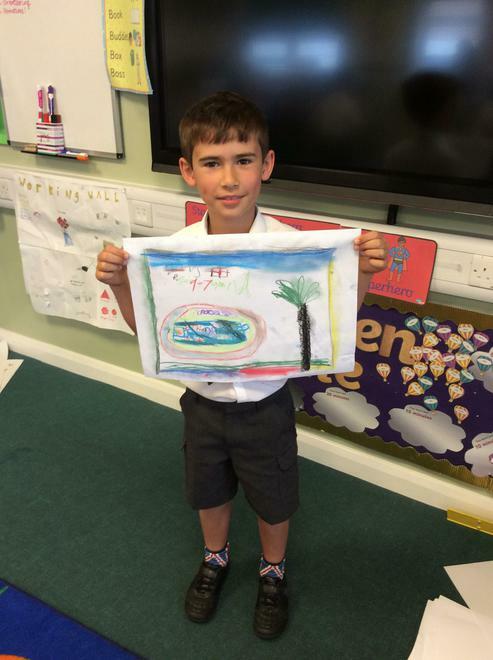 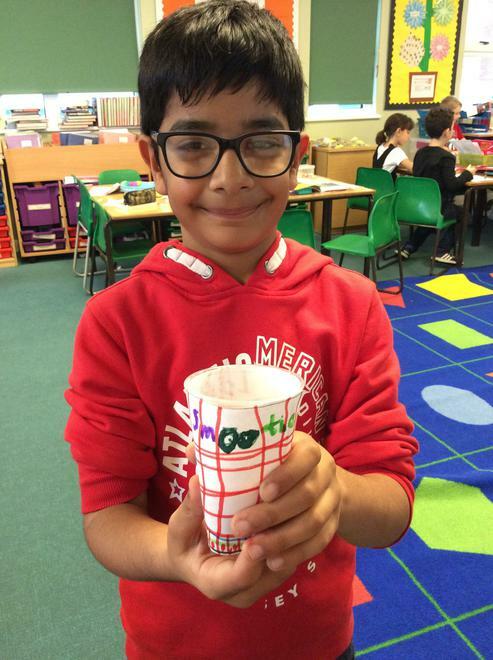 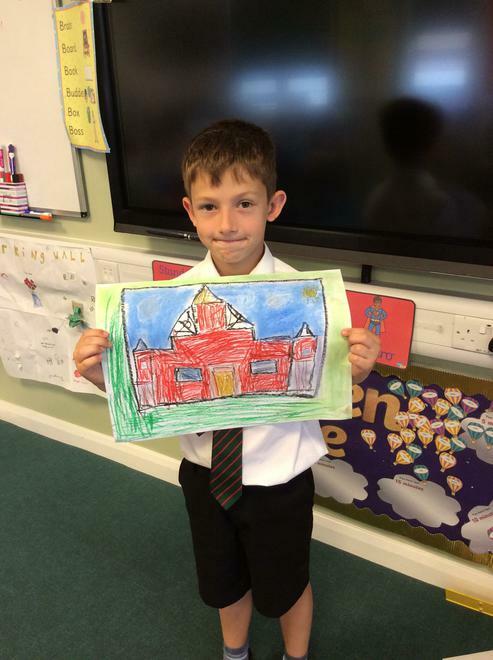 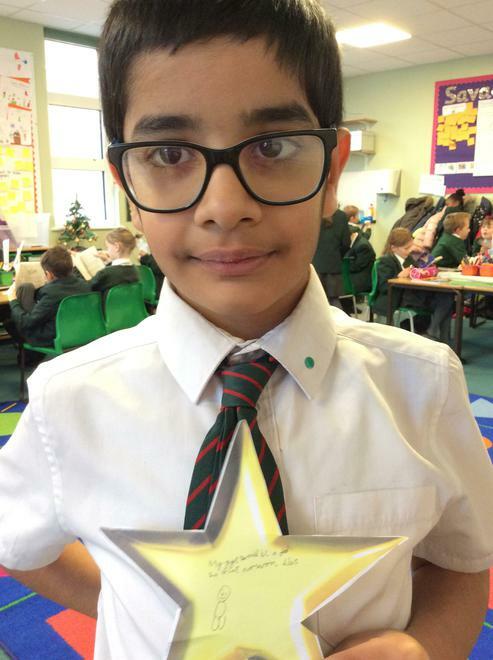 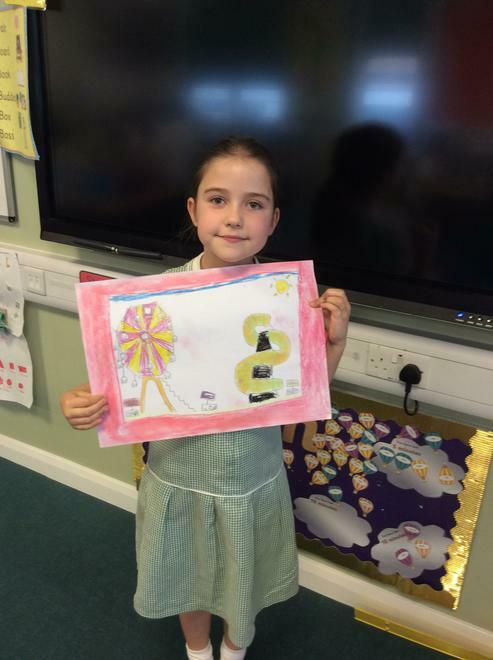 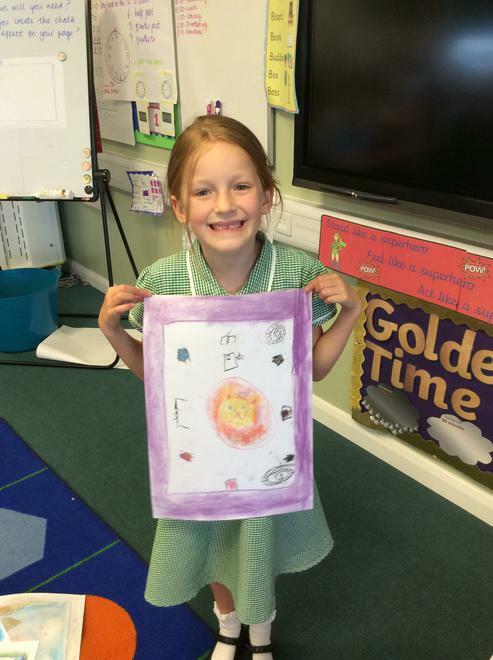 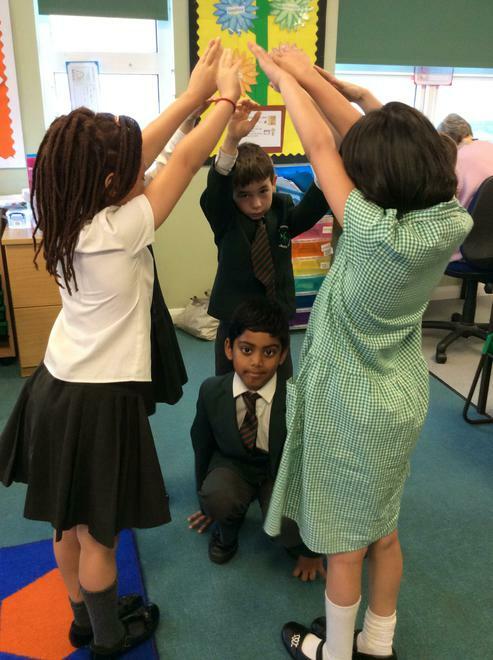 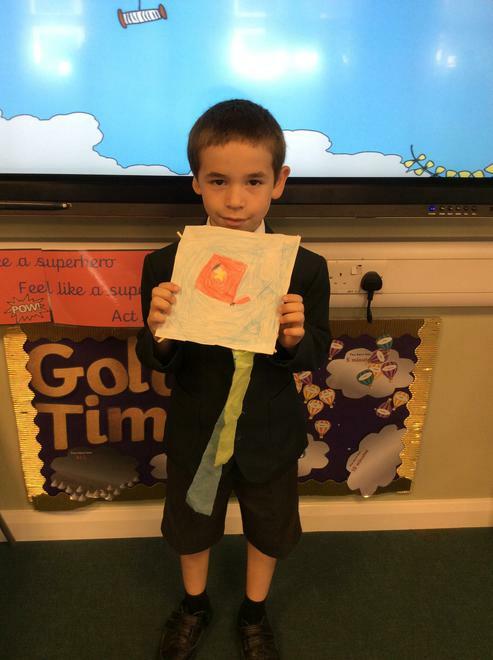 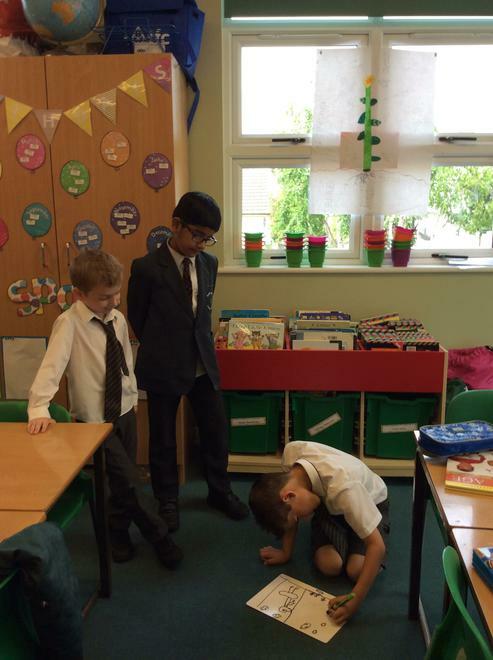 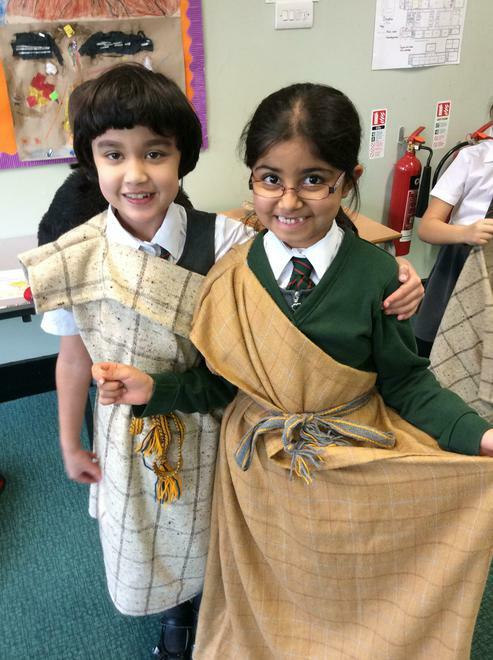 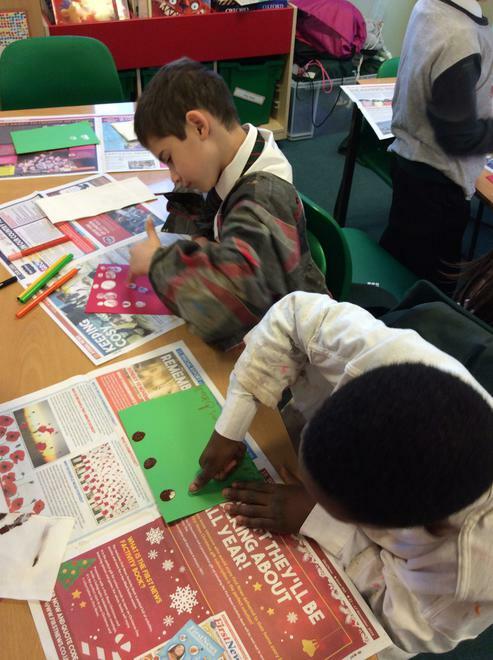 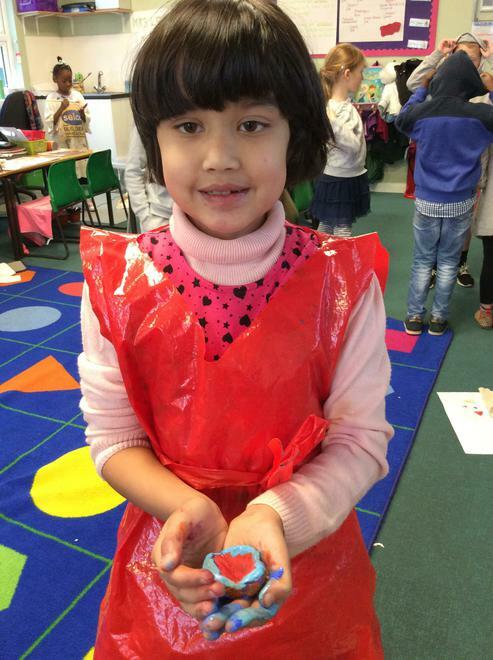 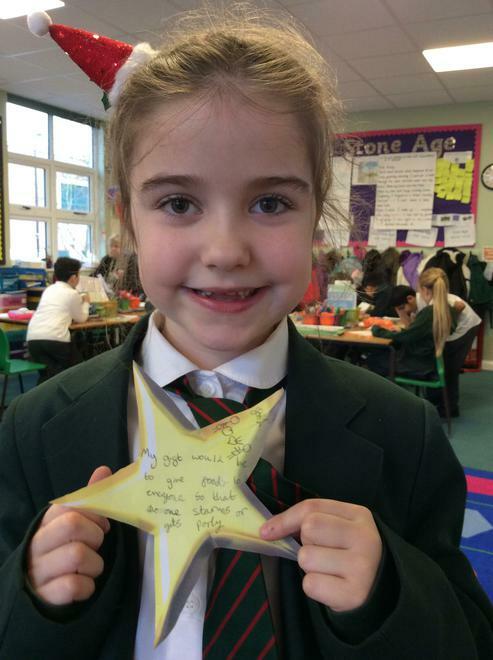 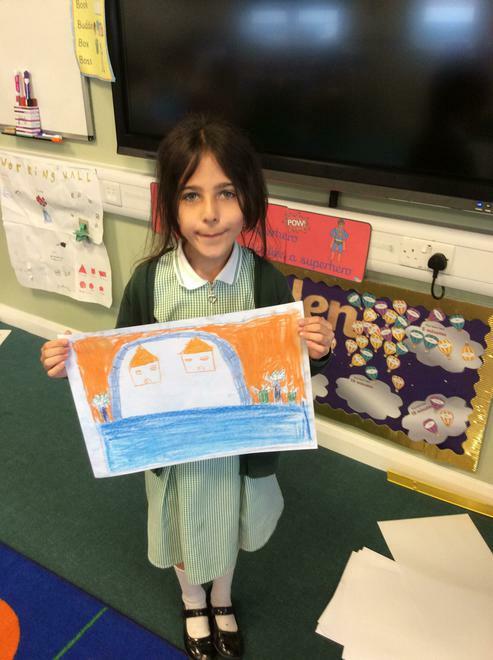 In RE we have been learning about Hinduism and the festival of Diwali. 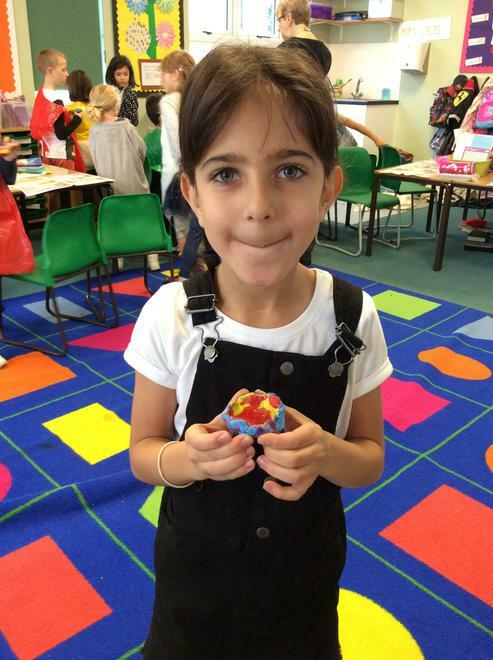 To understand how a Hindu child might feel during Diwali, we made Diya lamps from clay and then decorated them with rangoli patterns!